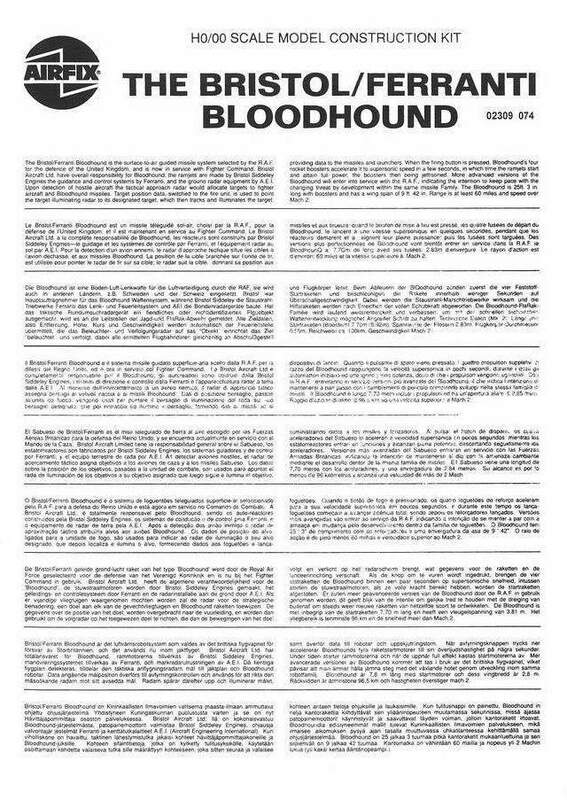 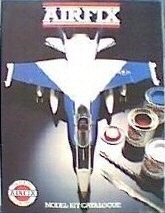 A Humbrol Product. 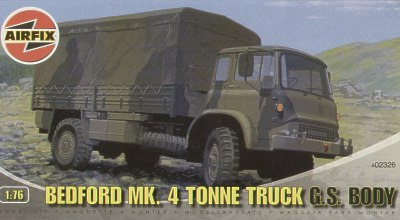 Humbrol Limited, Marfleet, Hull, England. 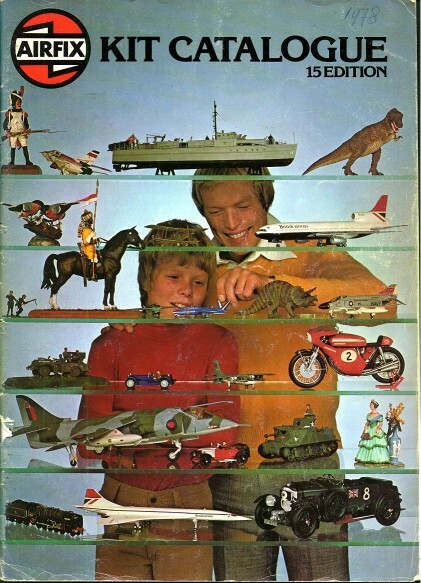 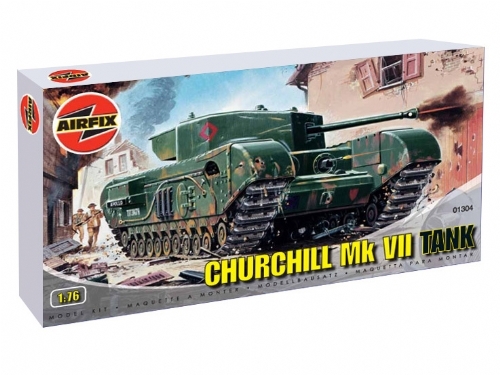 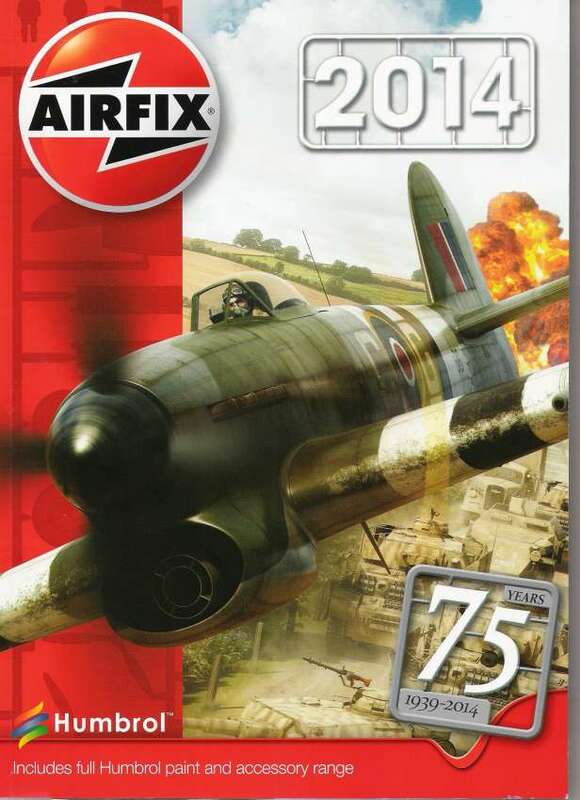 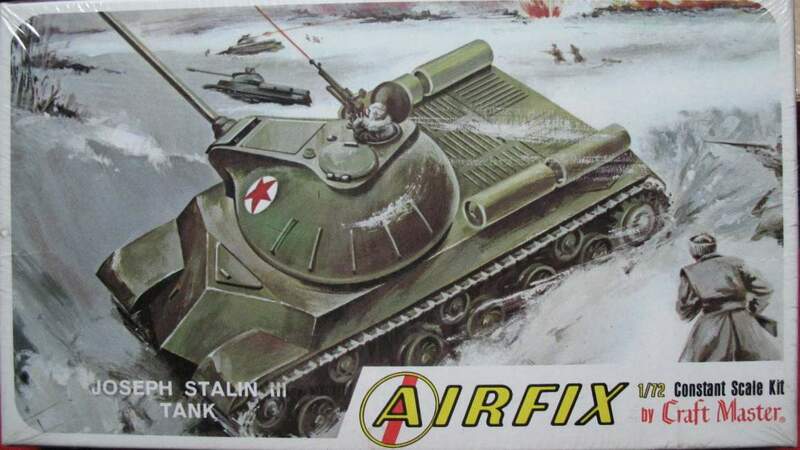 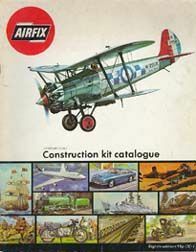 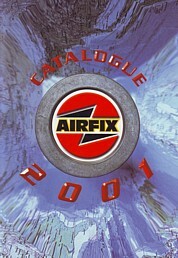 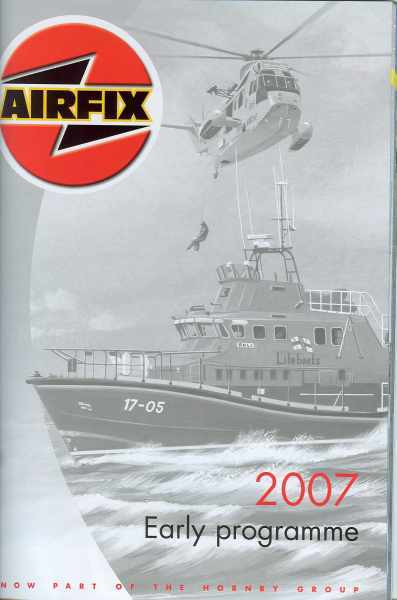 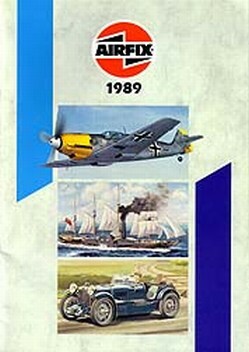 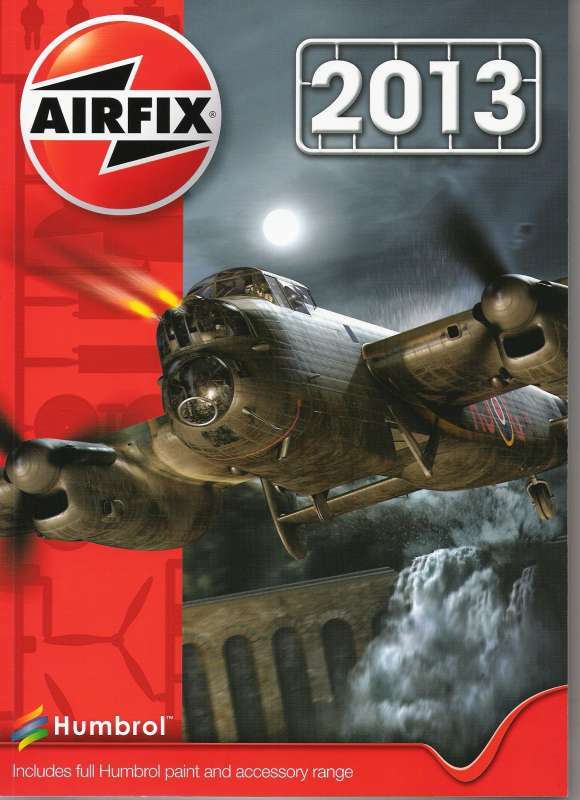 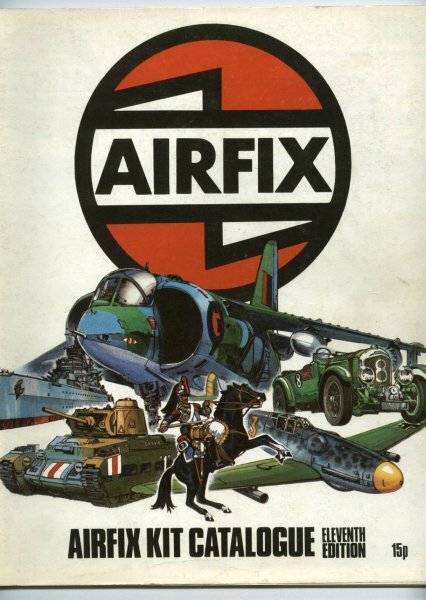 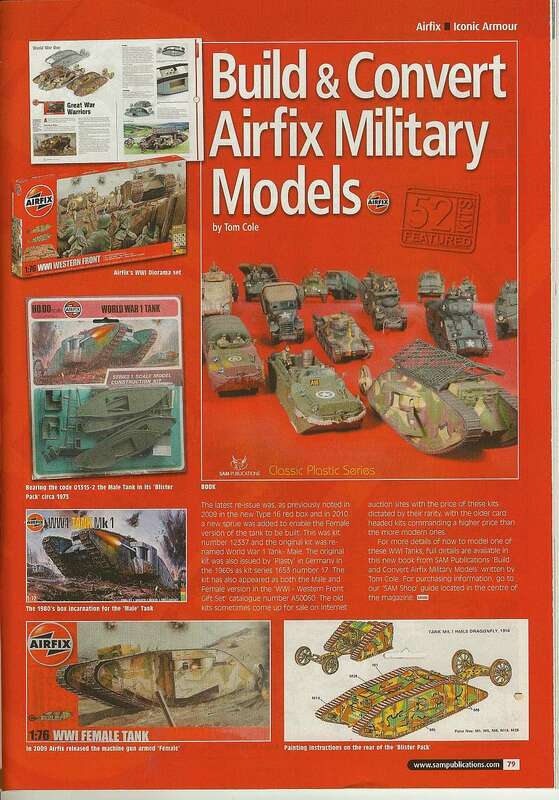 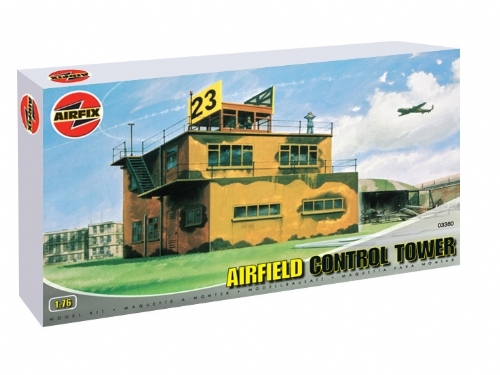 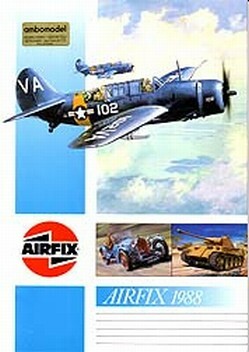 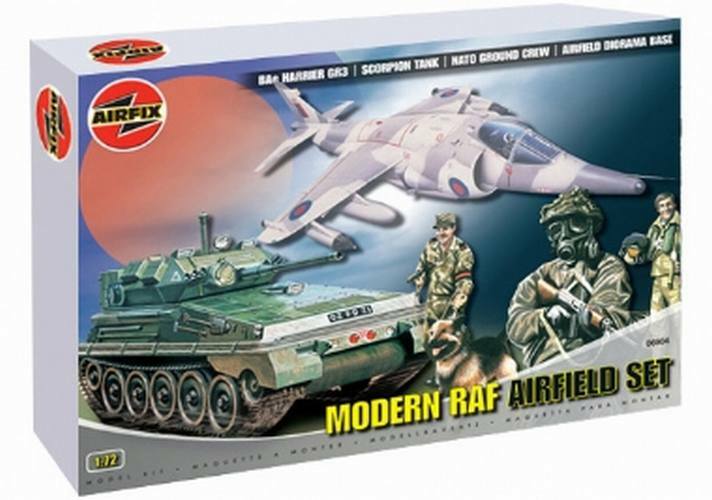 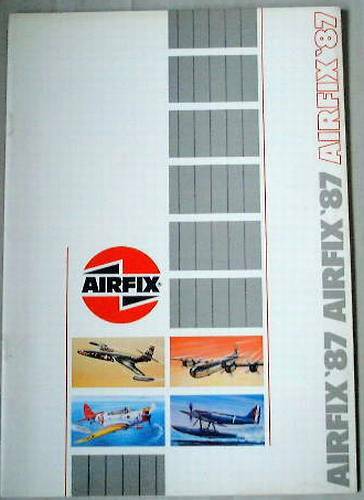 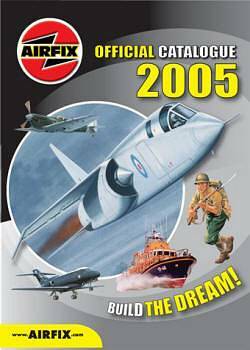 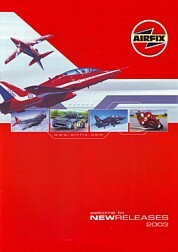 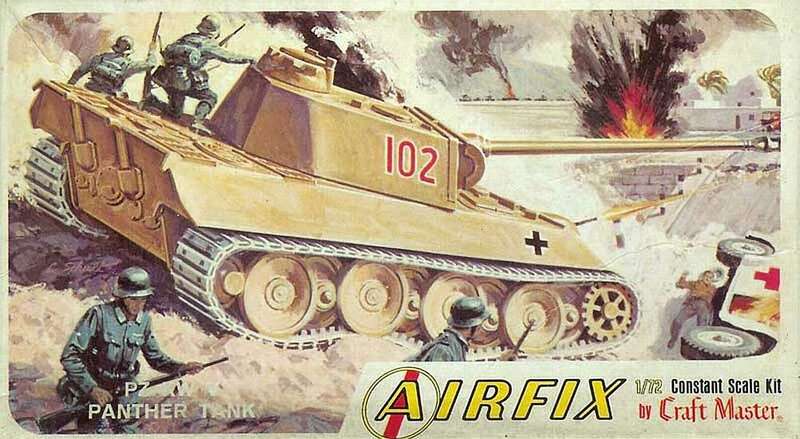 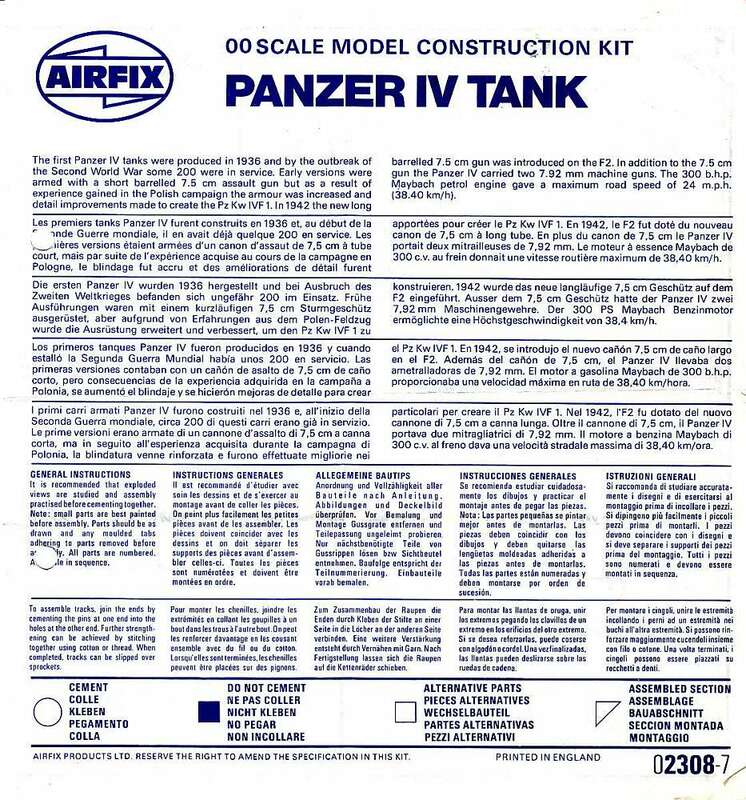 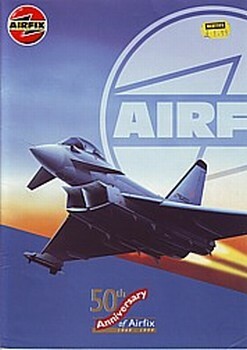 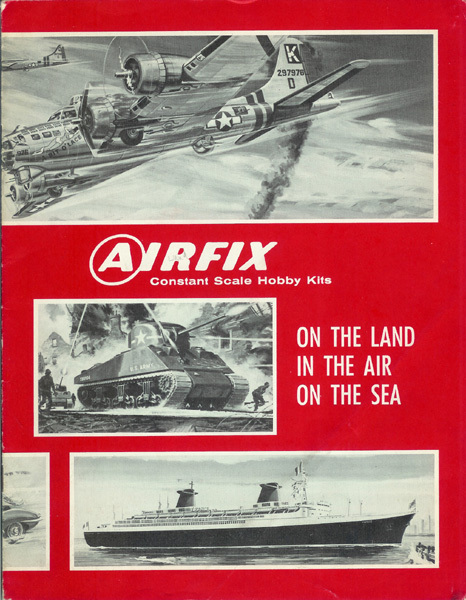 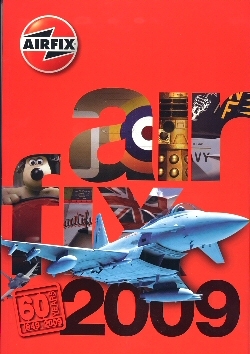 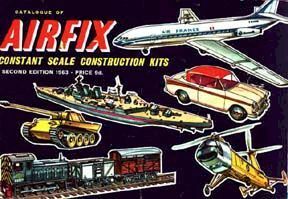 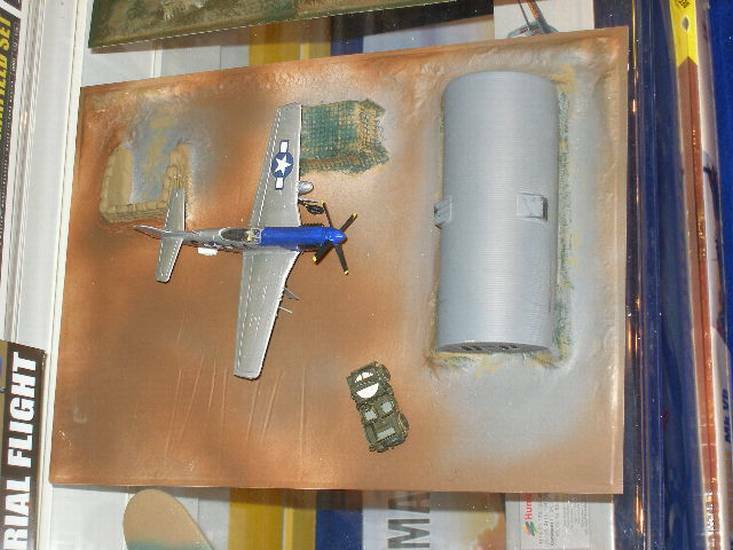 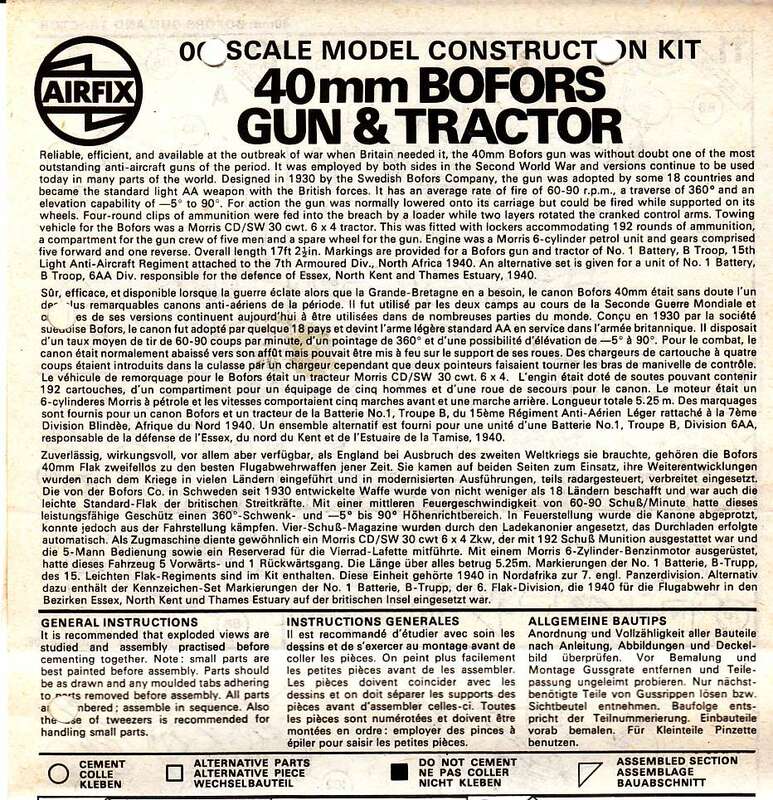 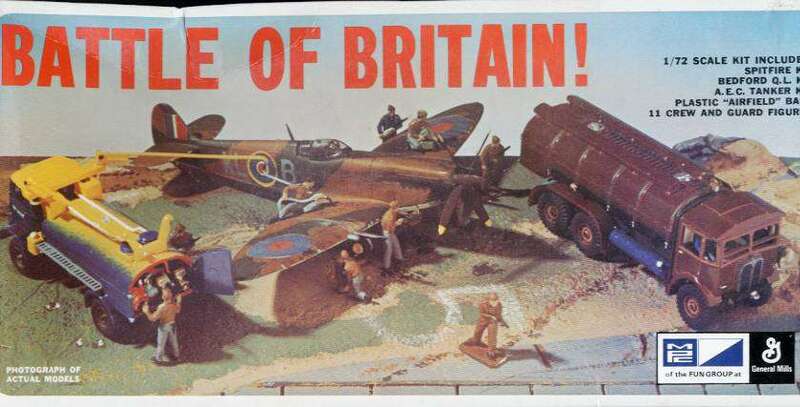 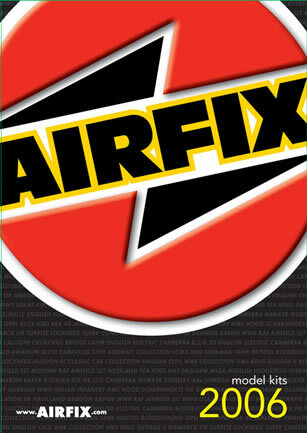 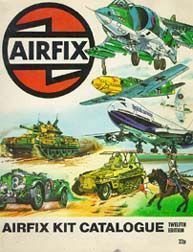 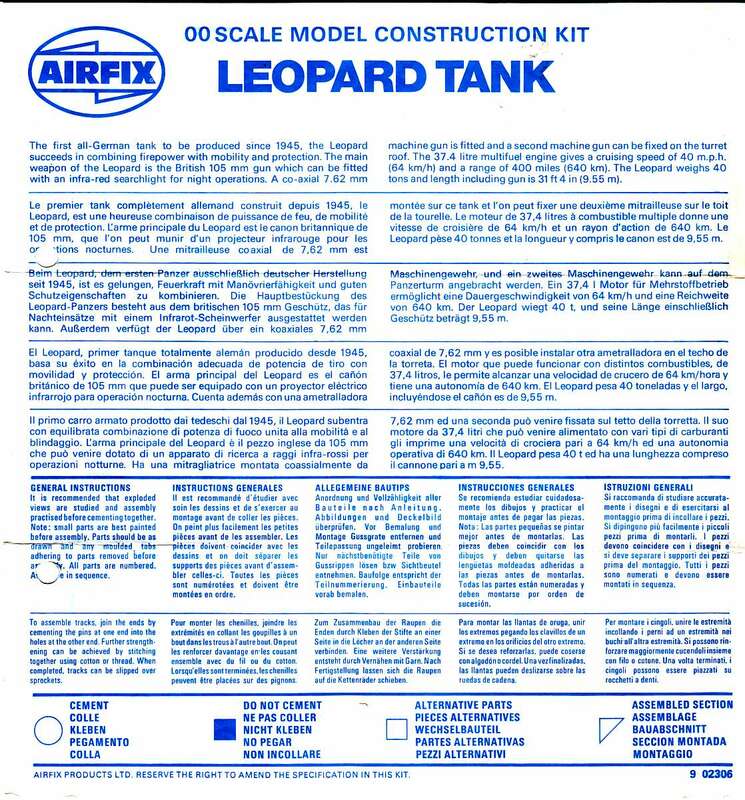 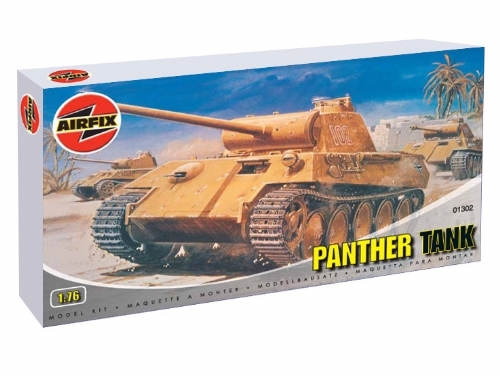 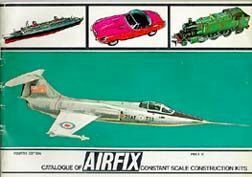 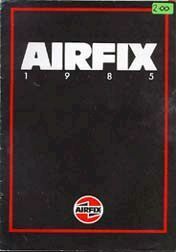 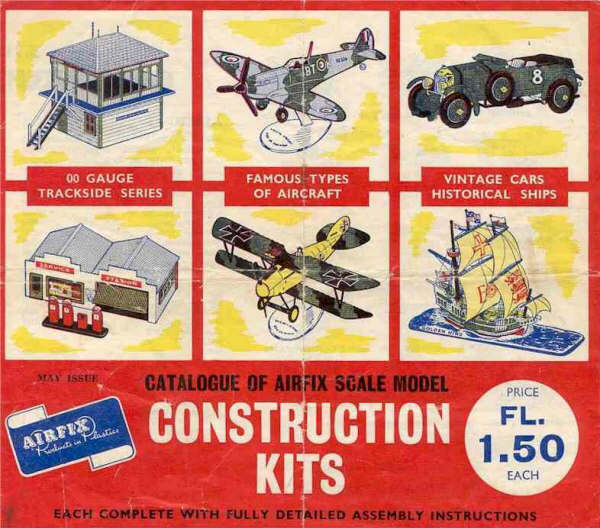 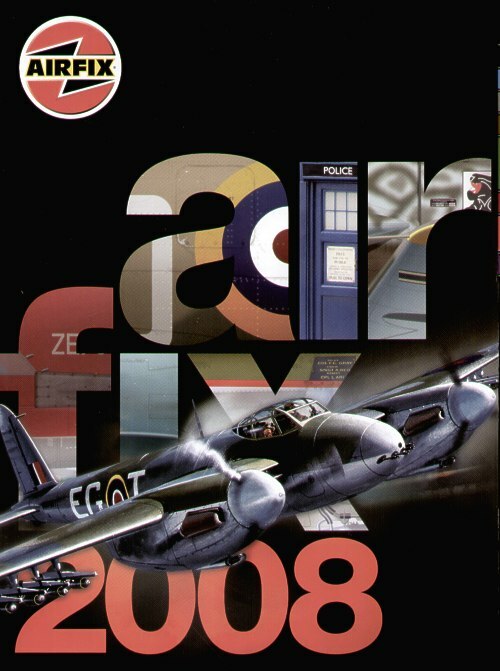 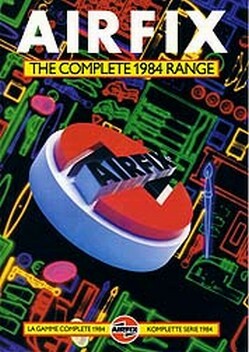 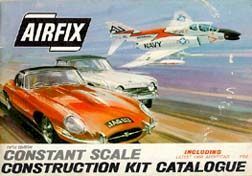 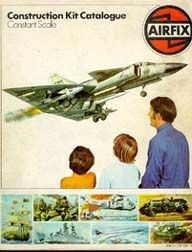 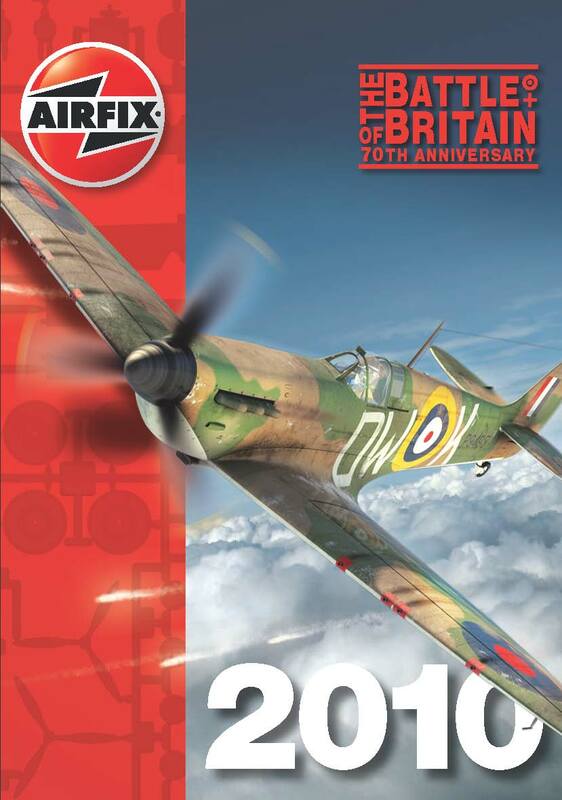 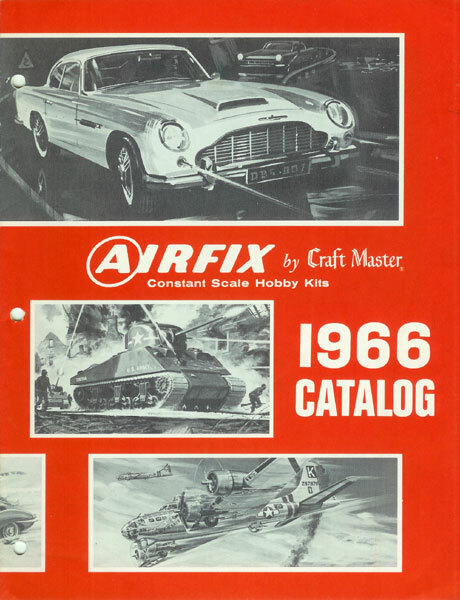 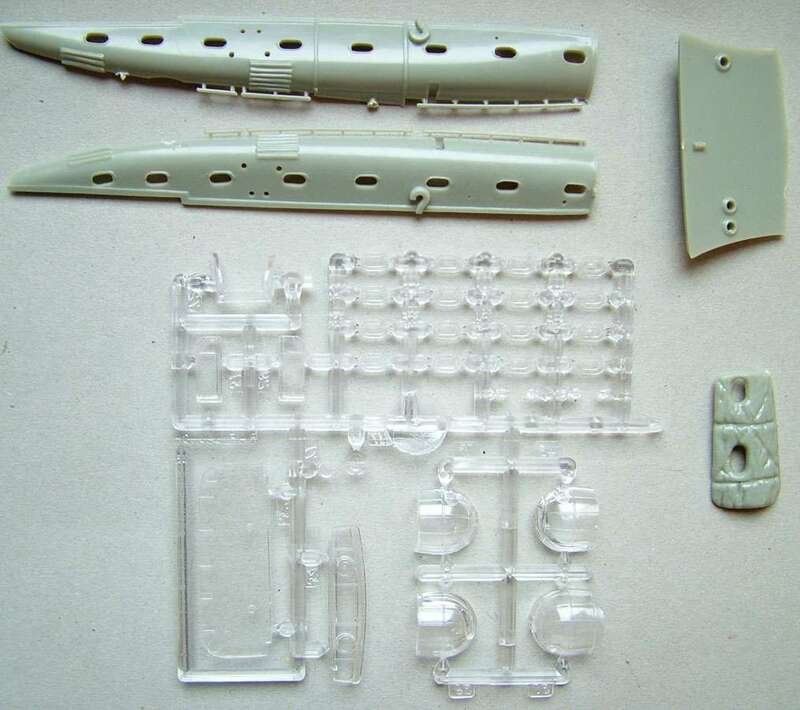 Airfix is one of the oldest manufacturers in the small scales. 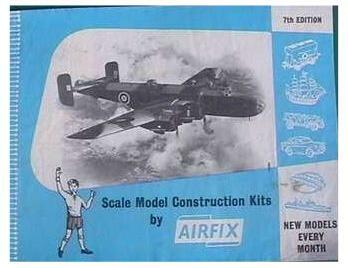 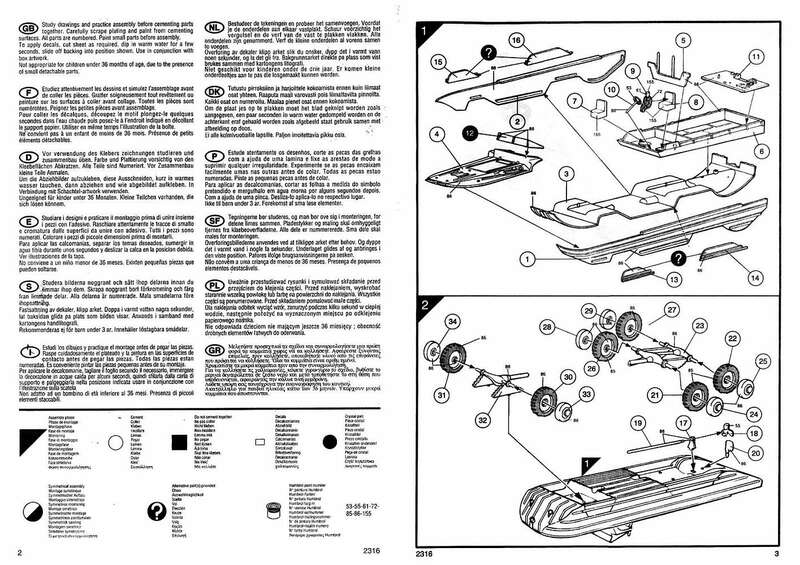 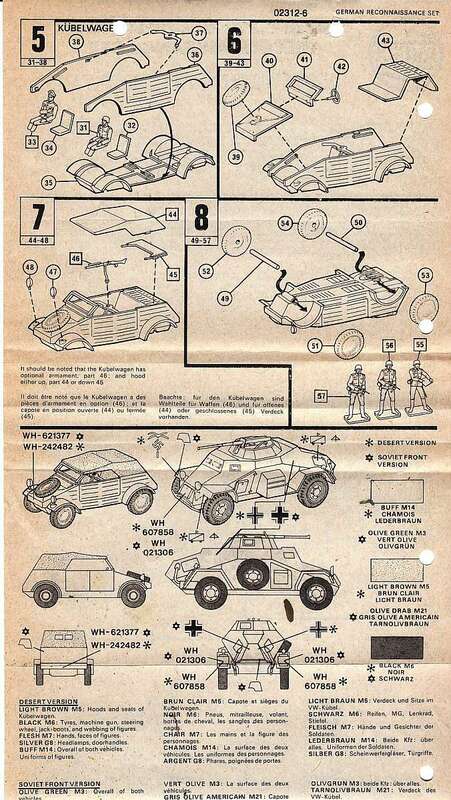 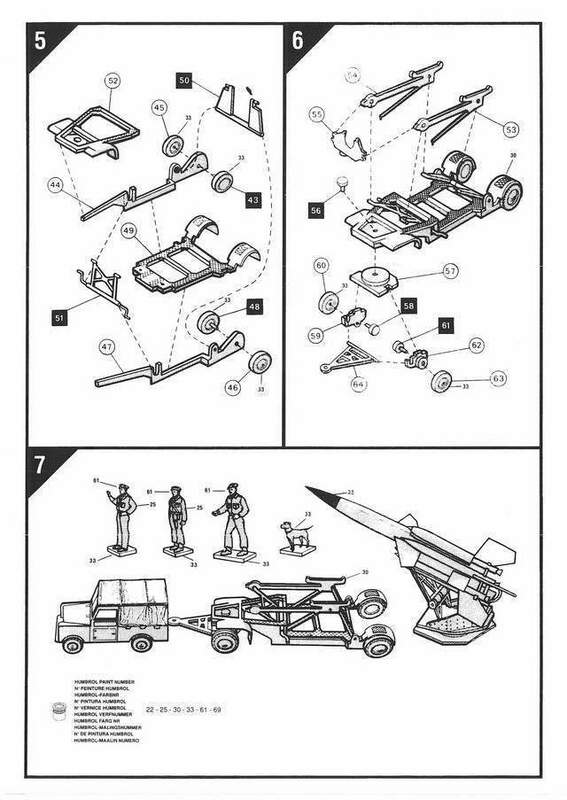 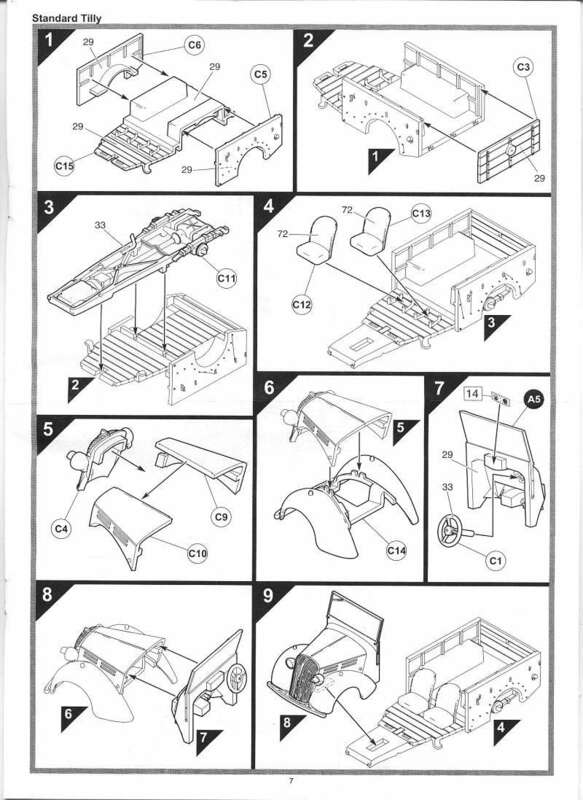 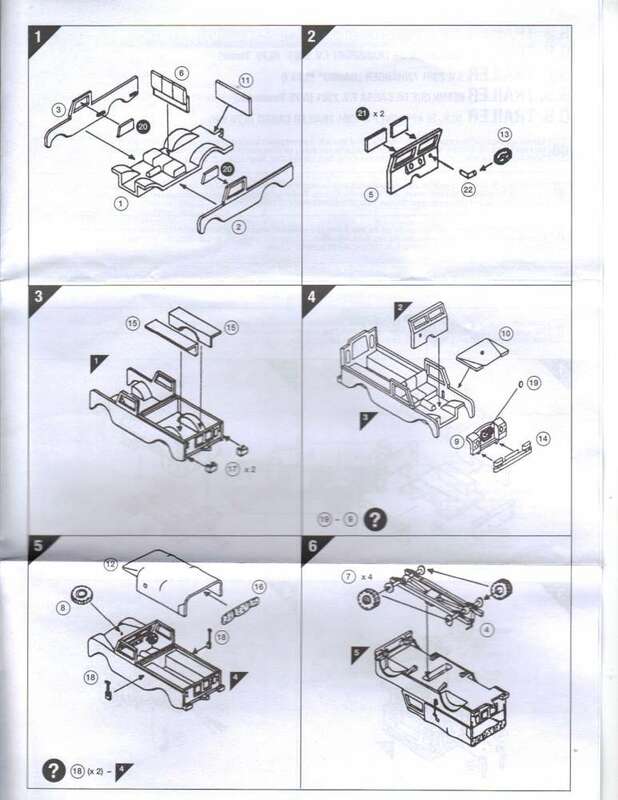 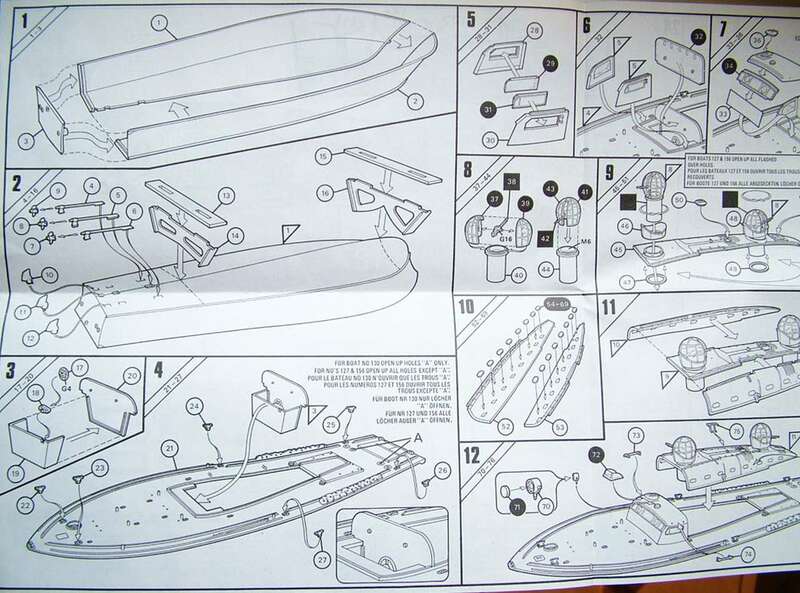 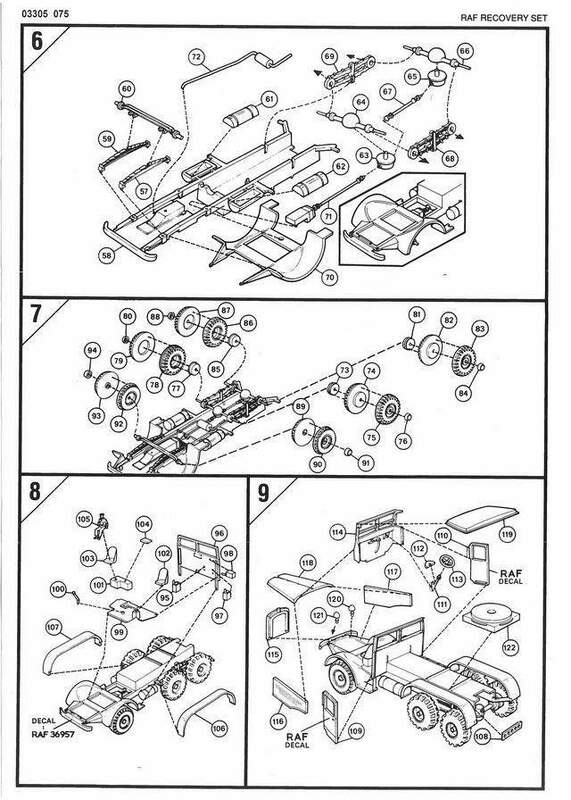 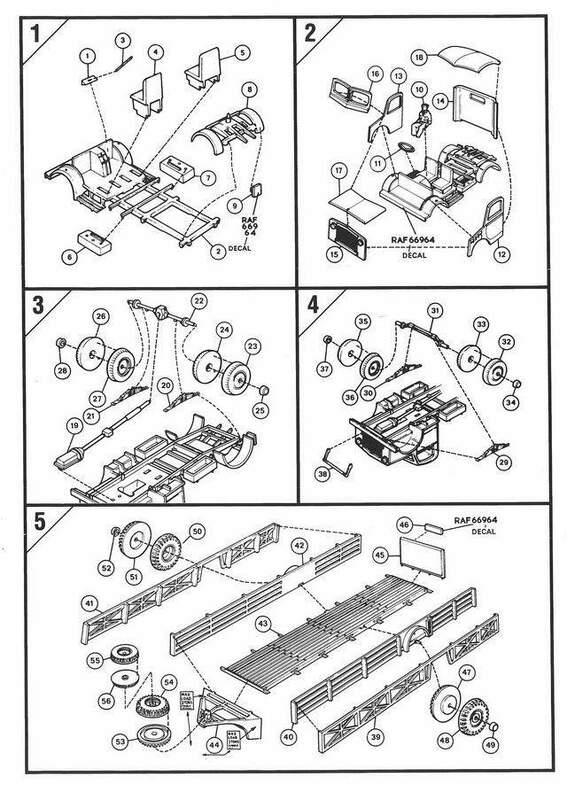 Compared to today's quality standard the Airfix kits are badly outdated. 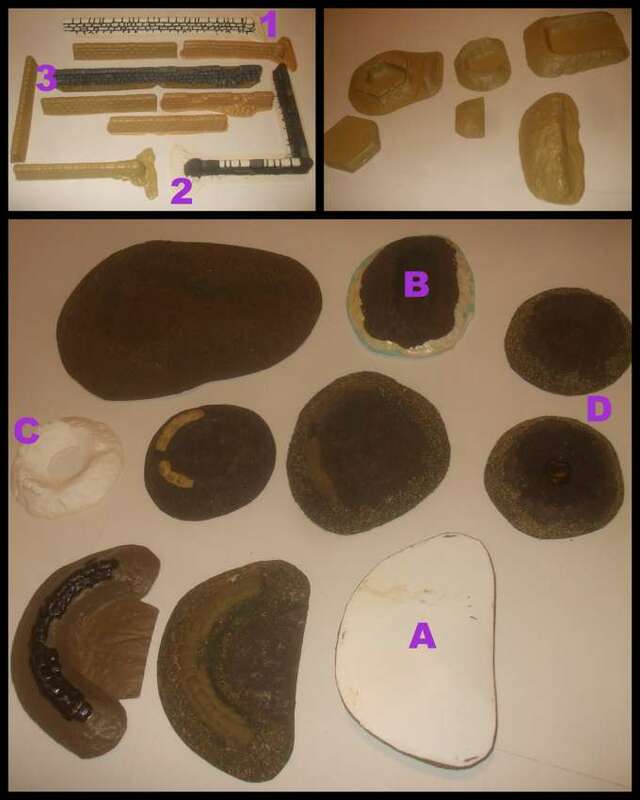 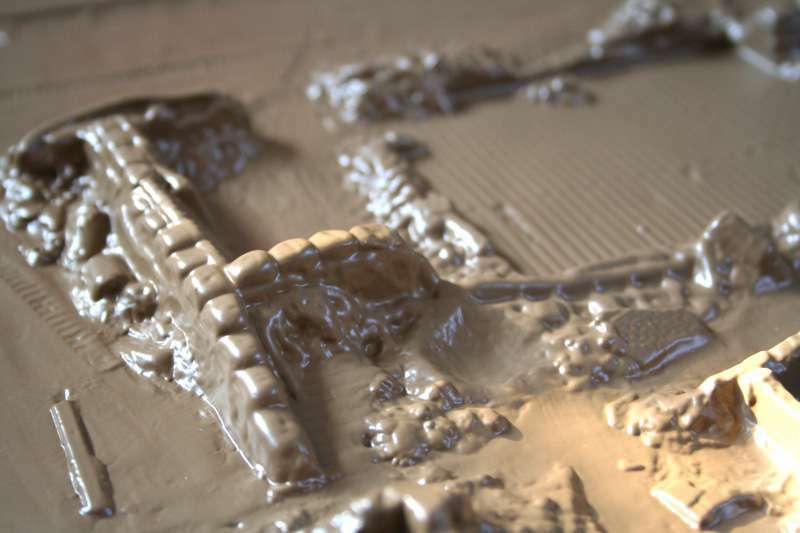 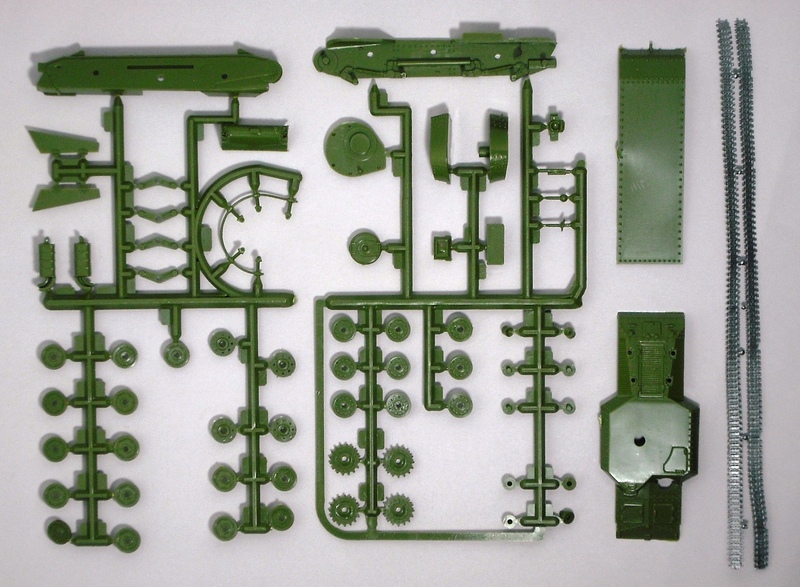 Most of the moulds are from around 1964 and have not been reworked to a higher standard. 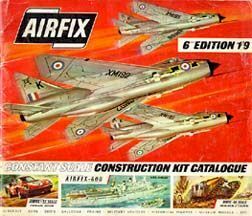 Airfix, please, update your moulds !!! 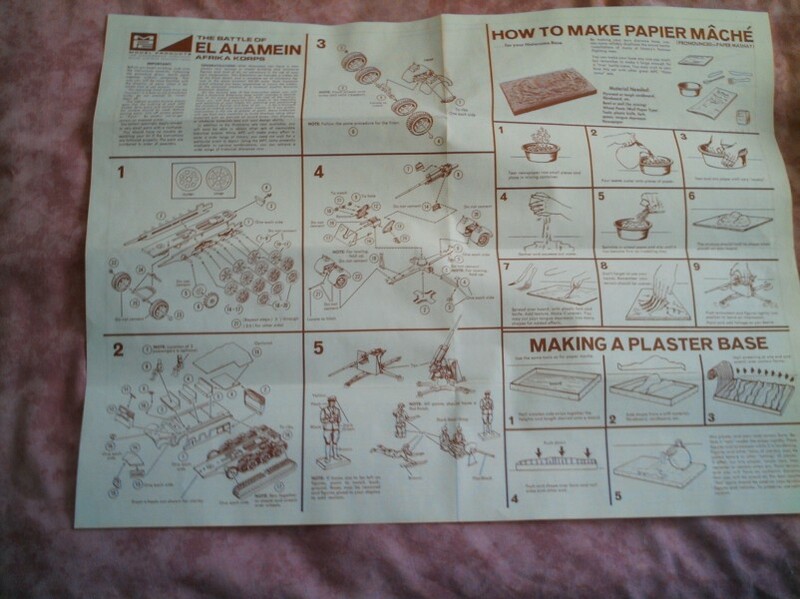 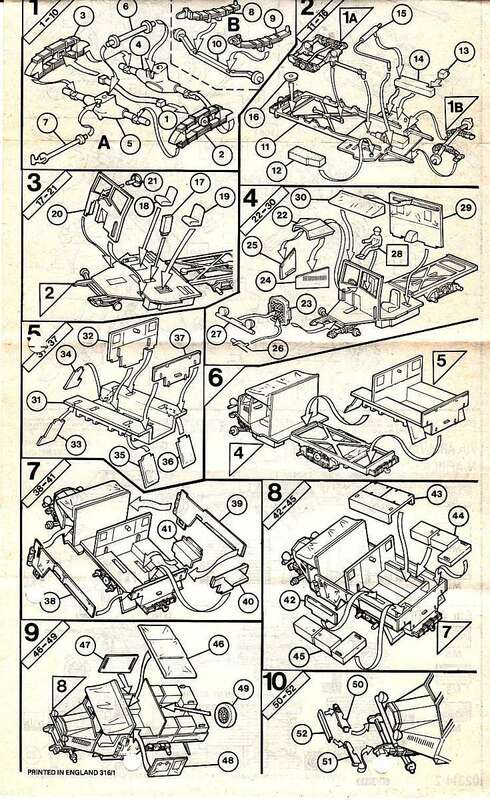 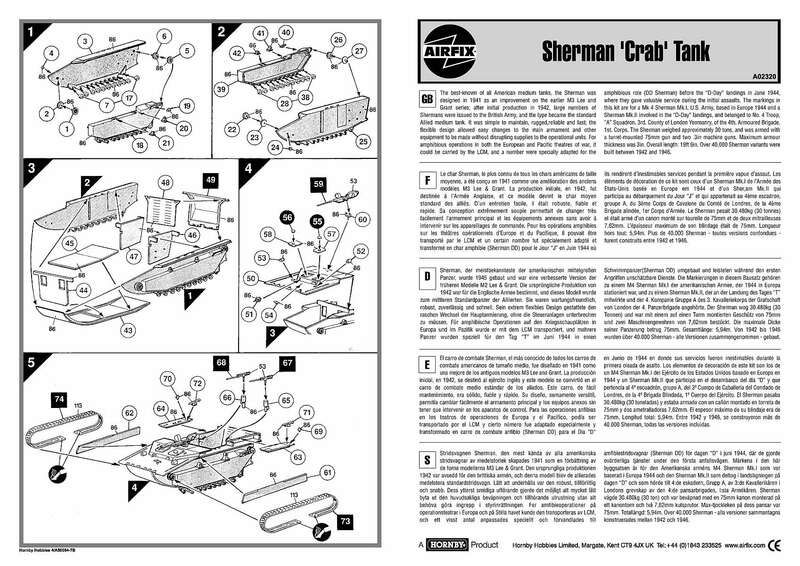 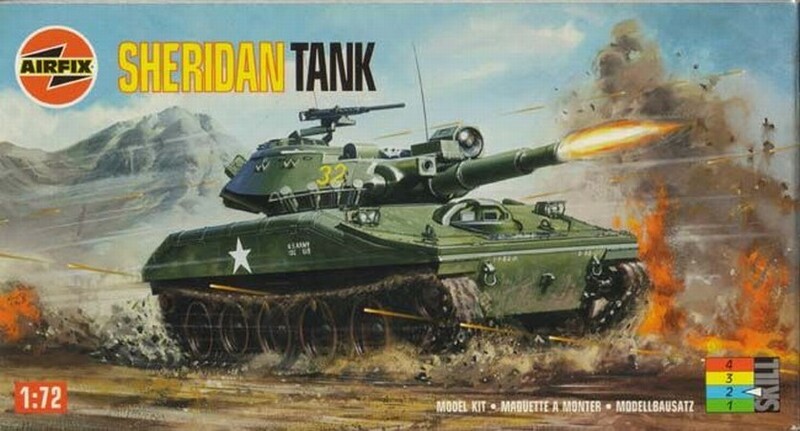 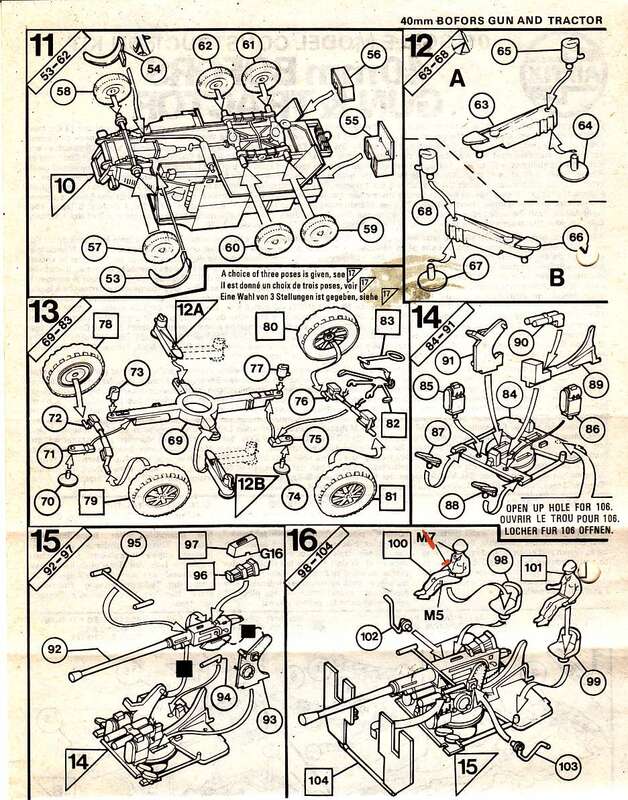 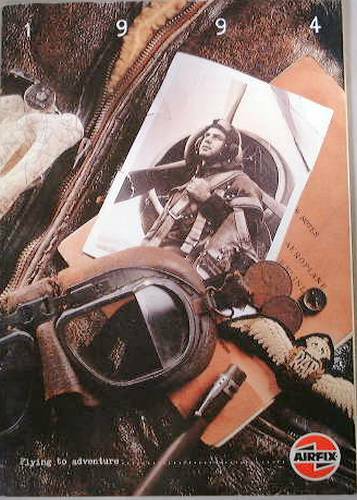 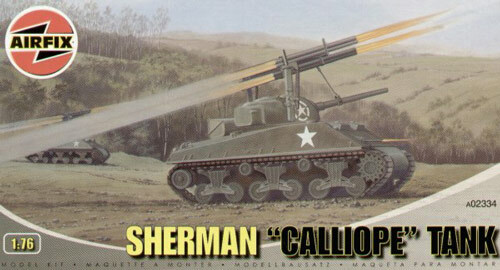 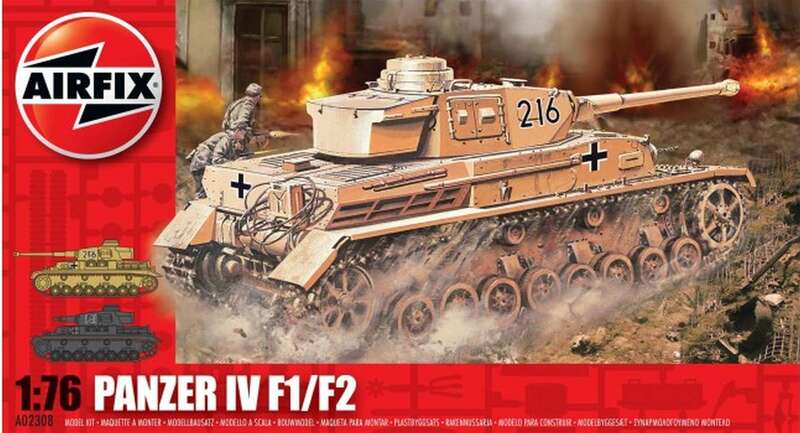 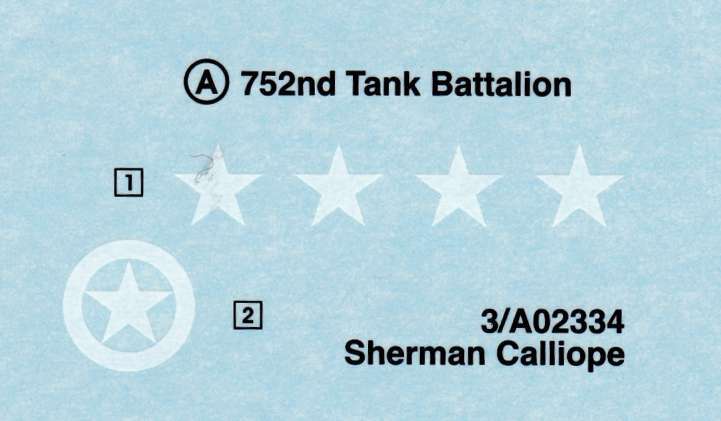 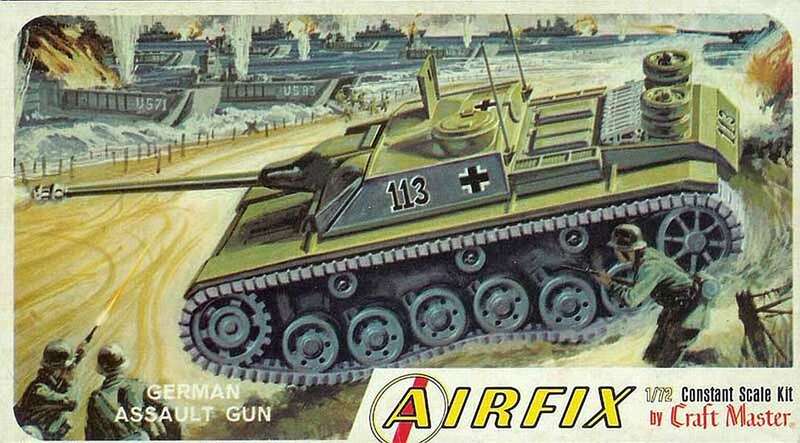 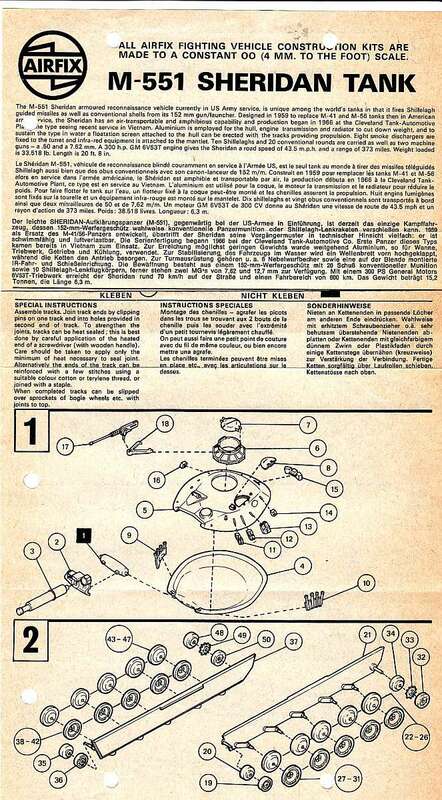 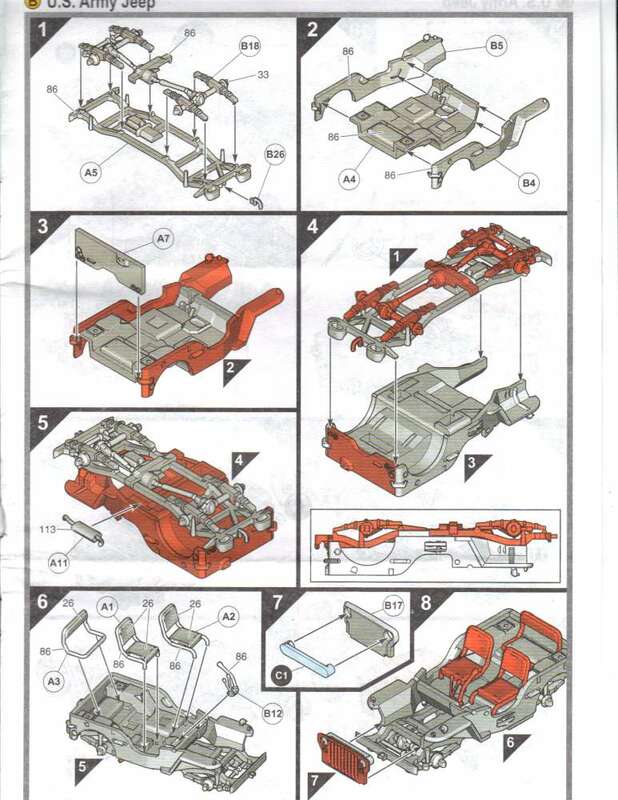 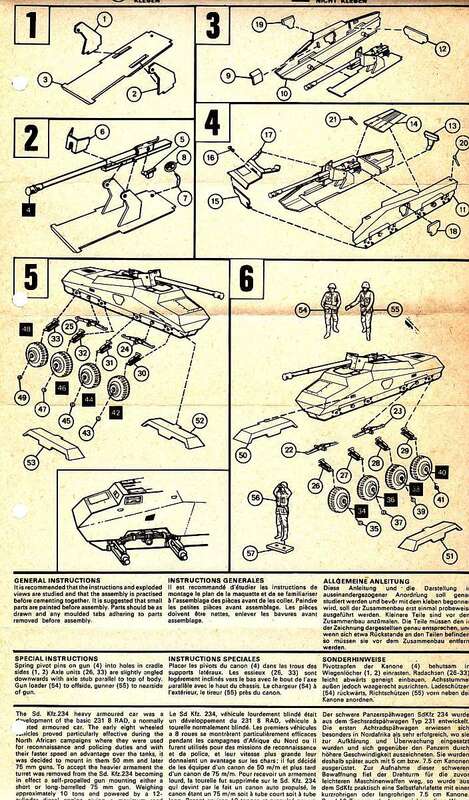 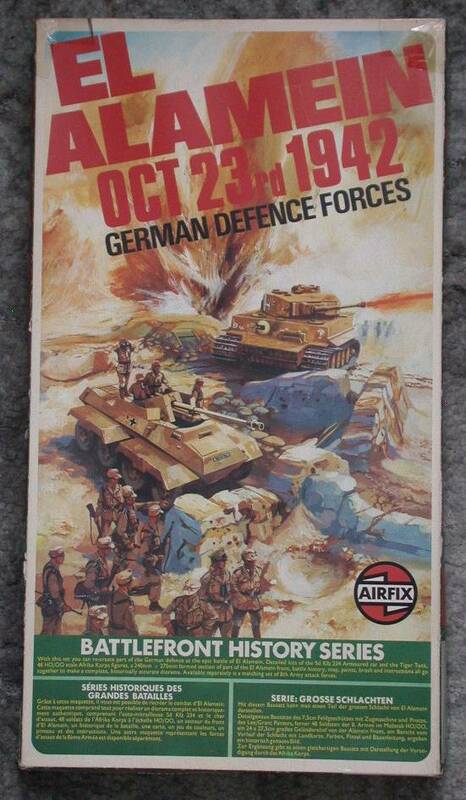 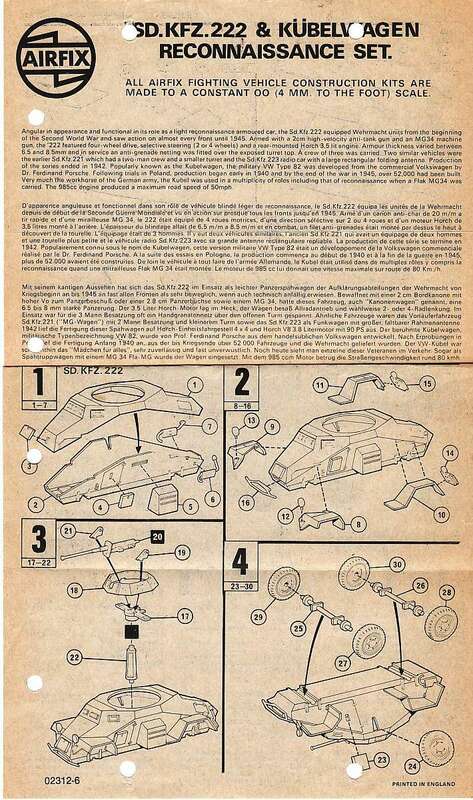 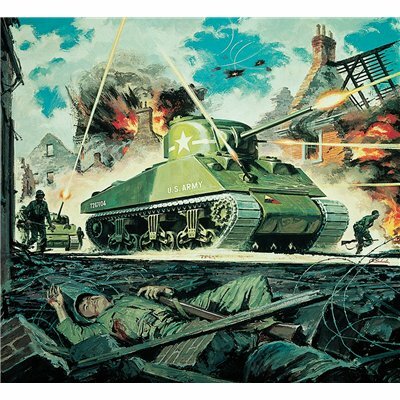 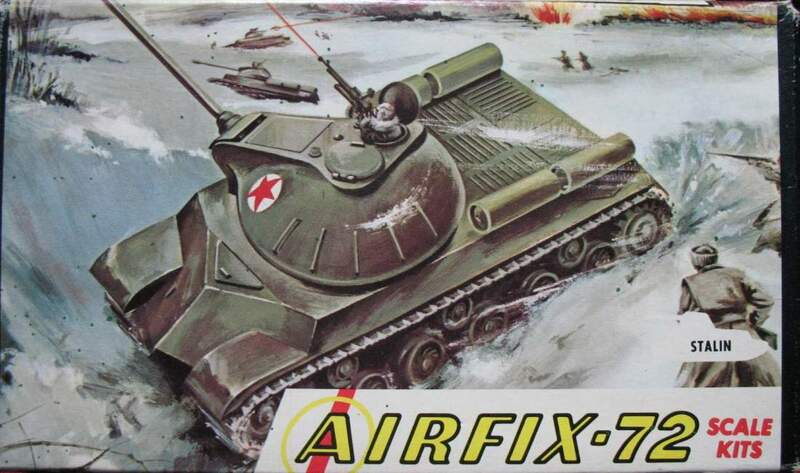 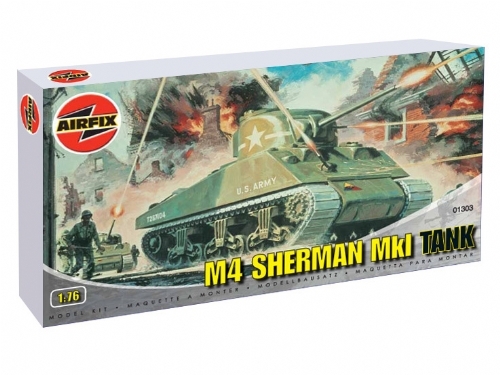 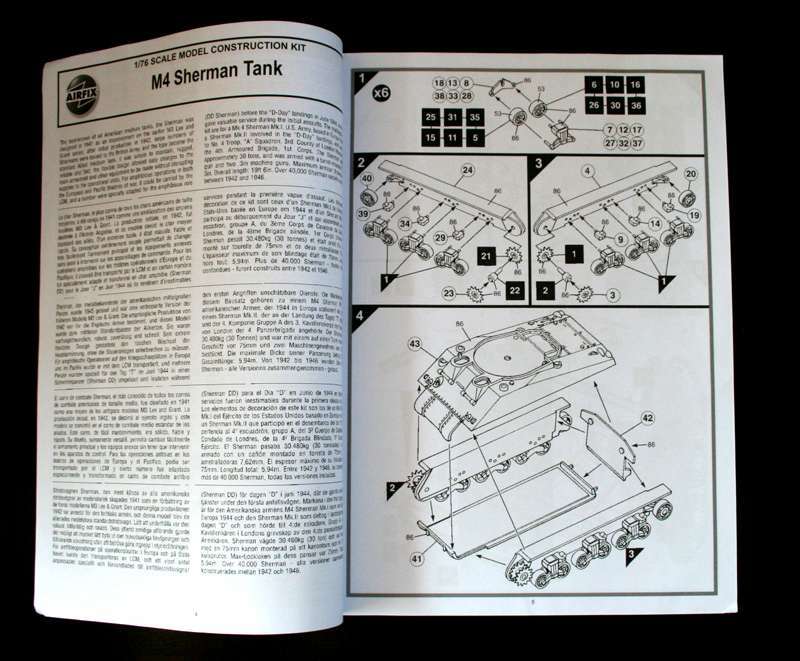 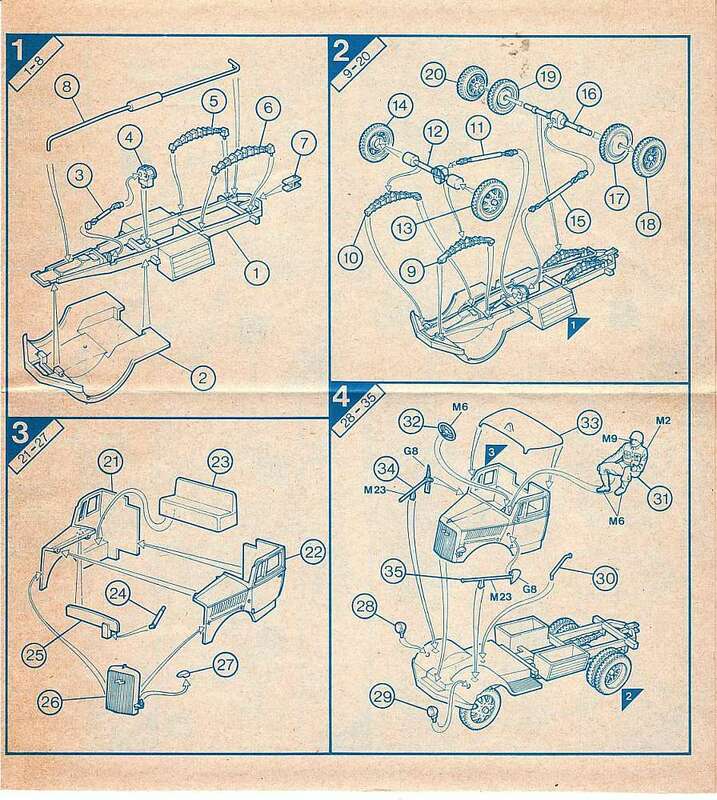 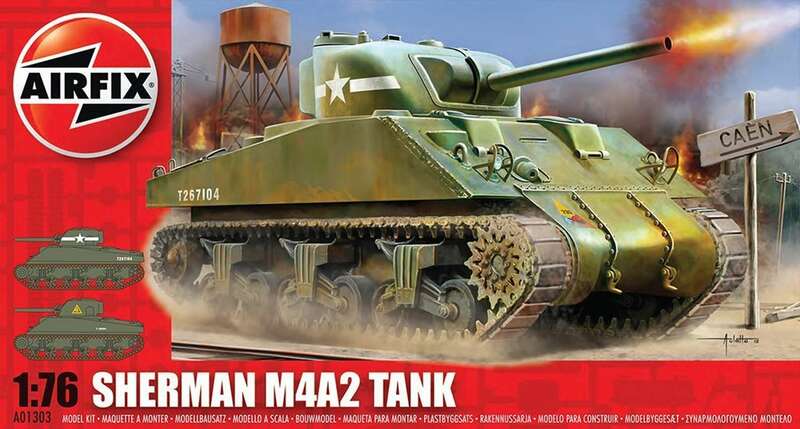 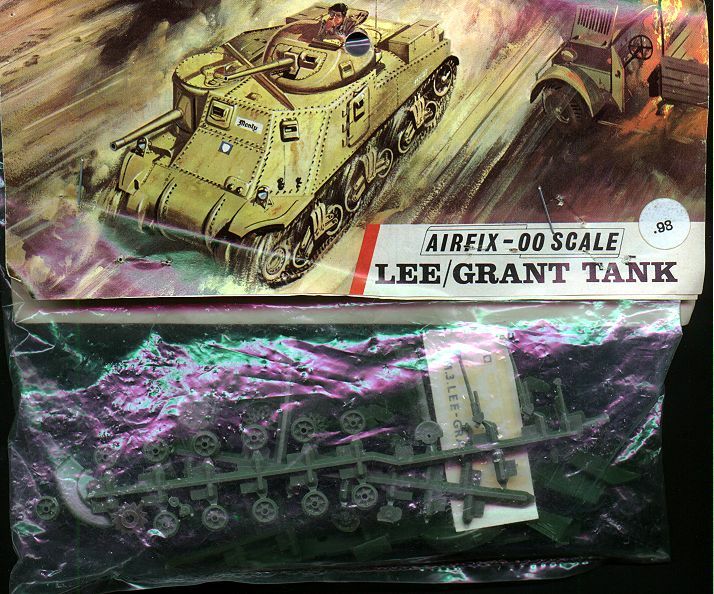 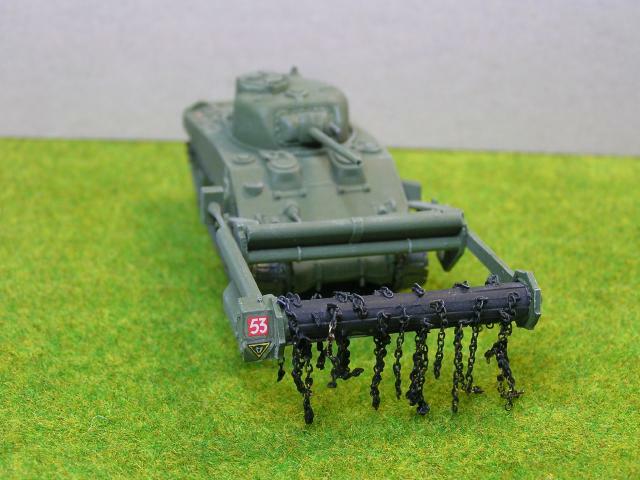 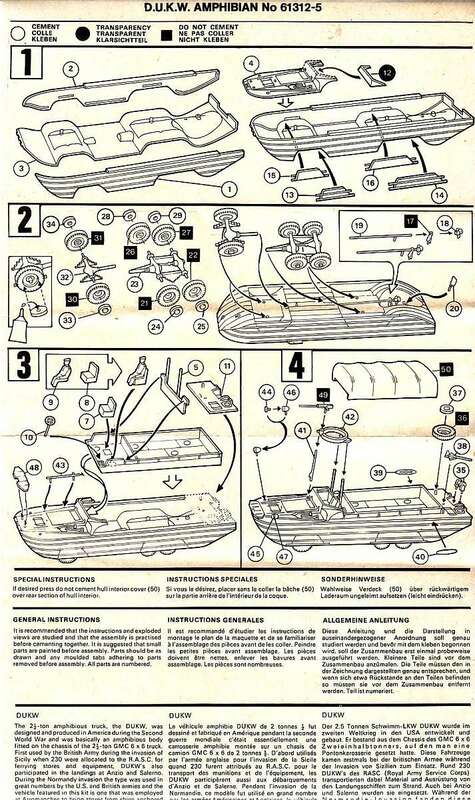 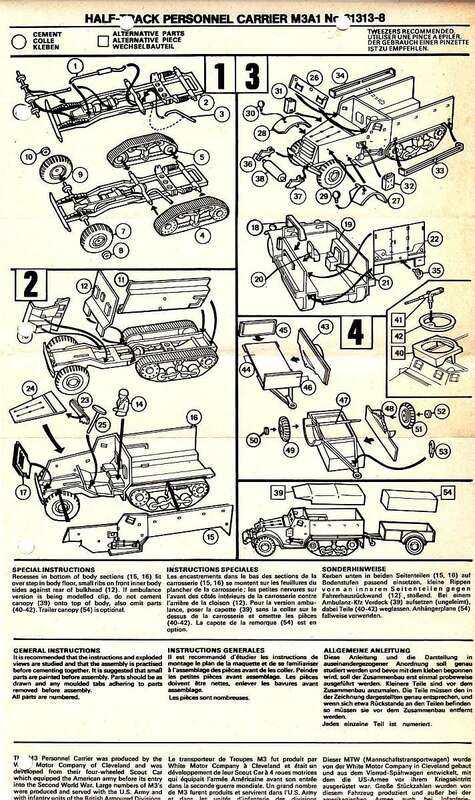 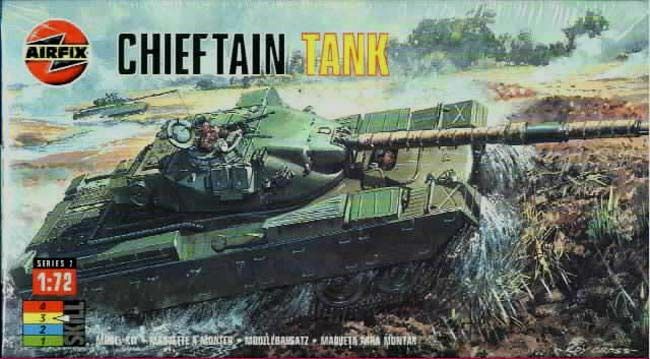 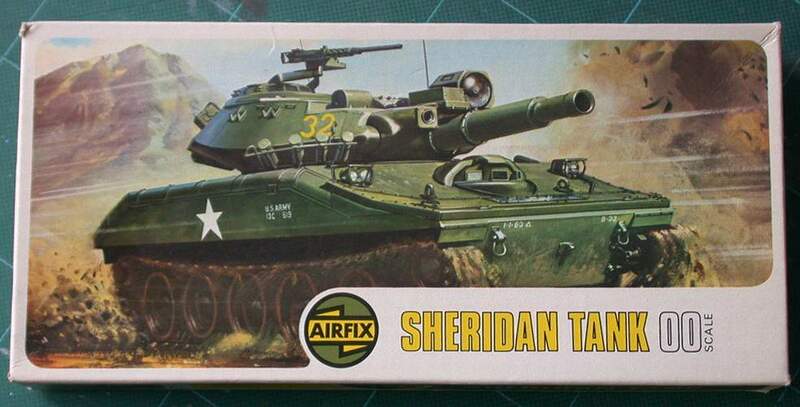 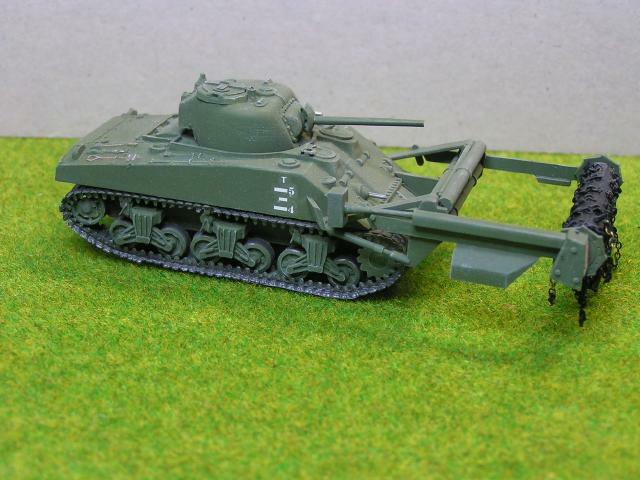 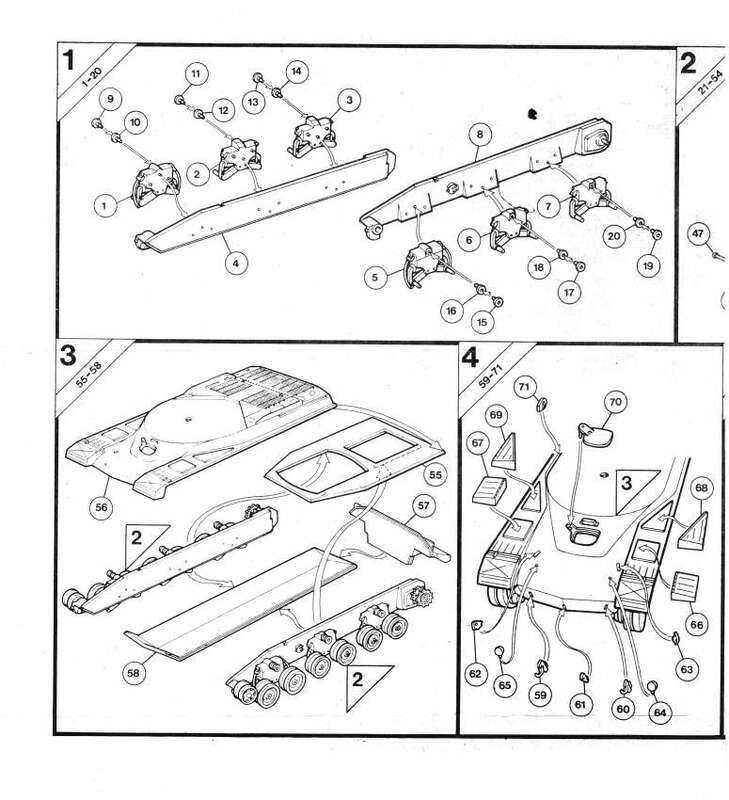 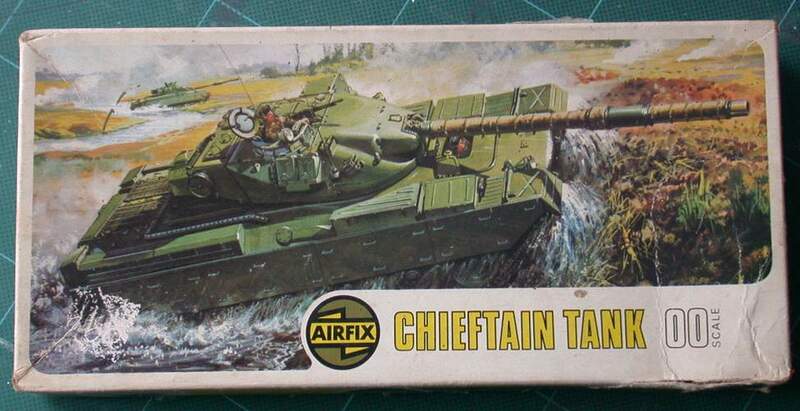 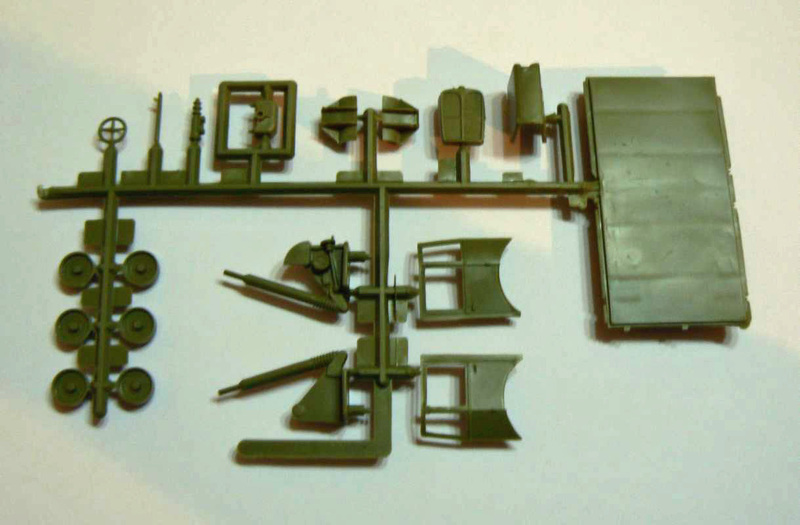 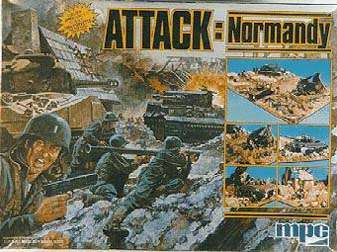 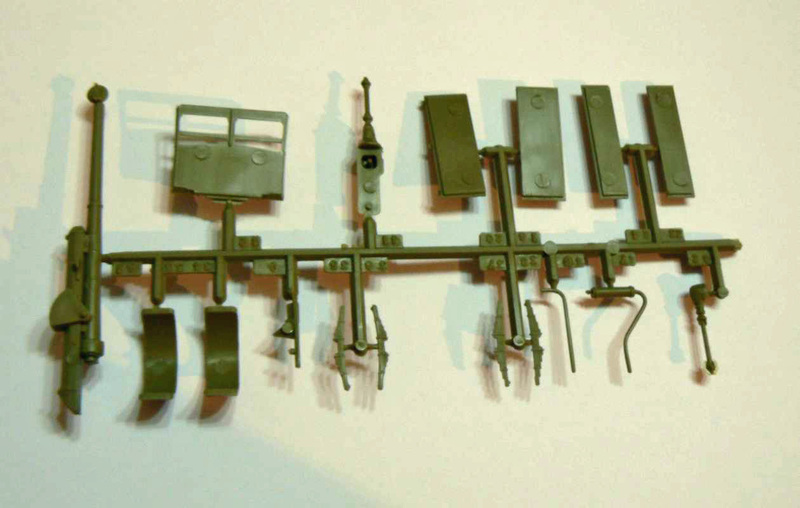 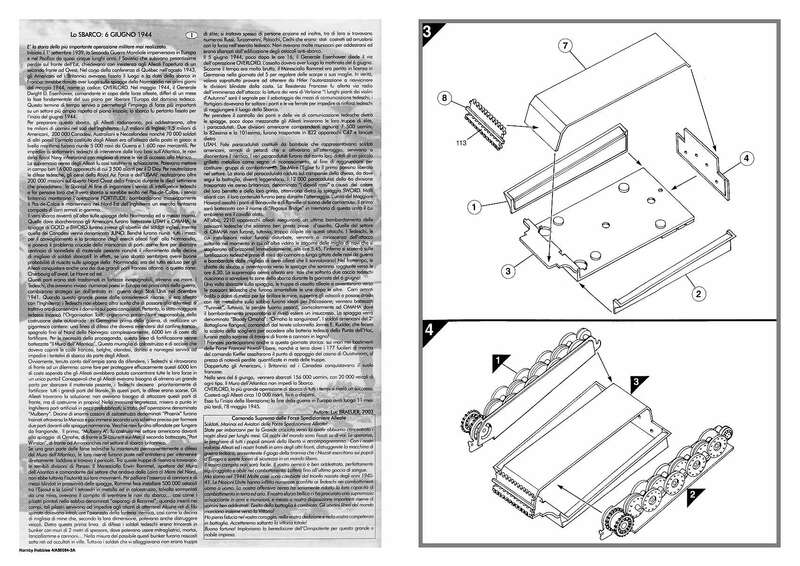 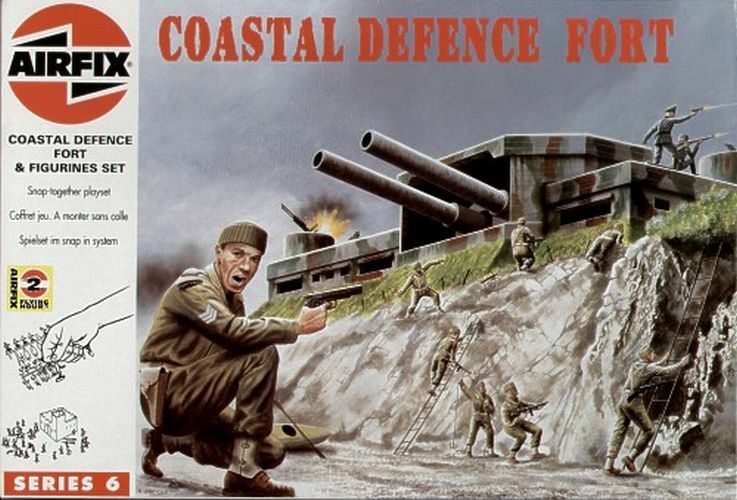 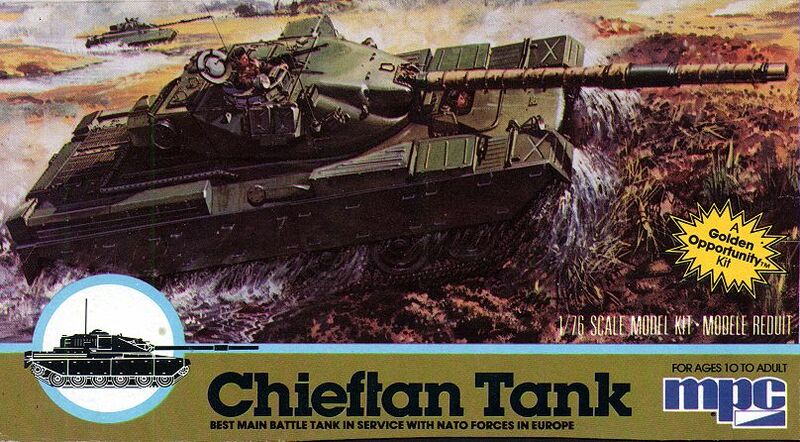 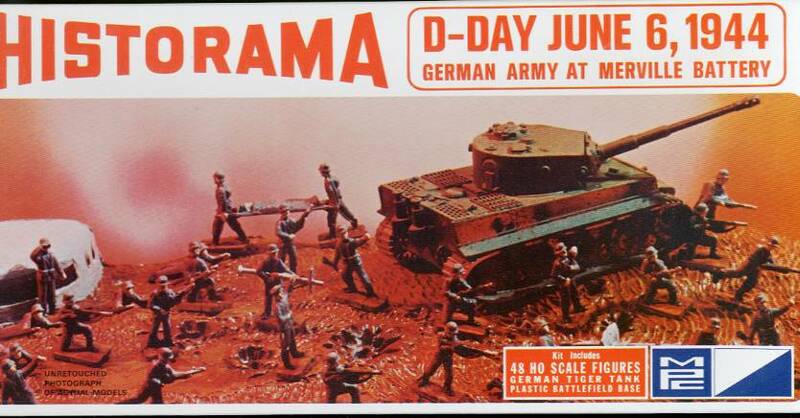 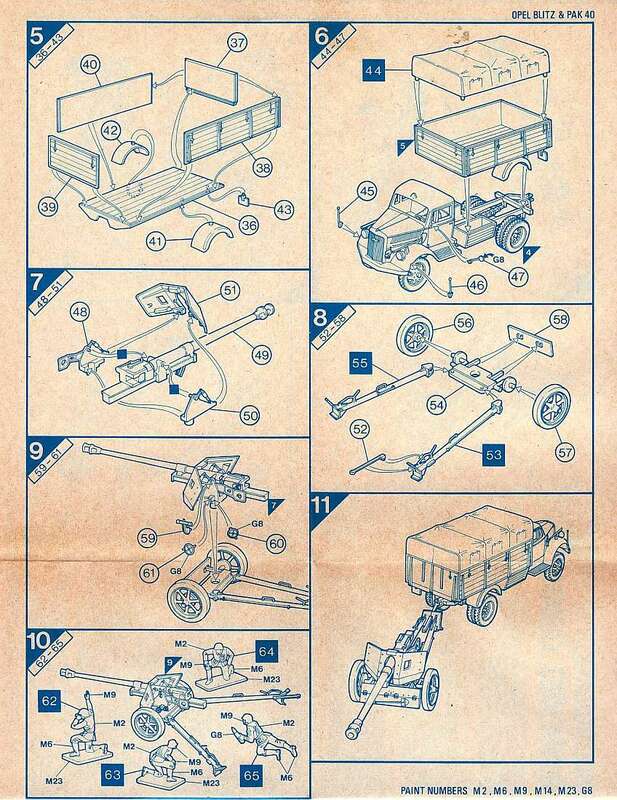 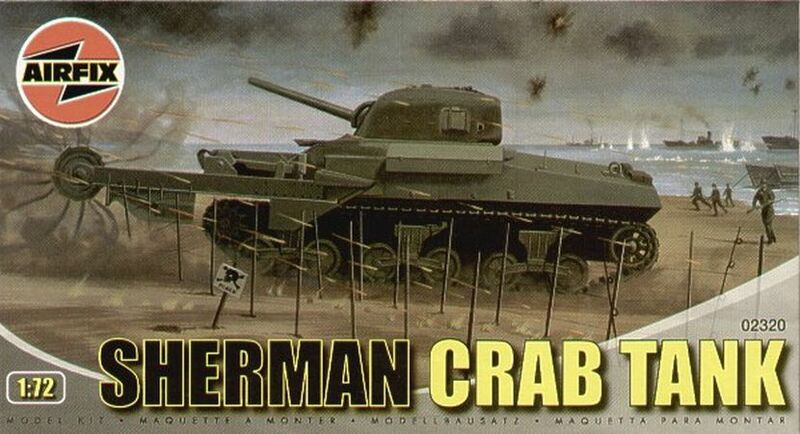 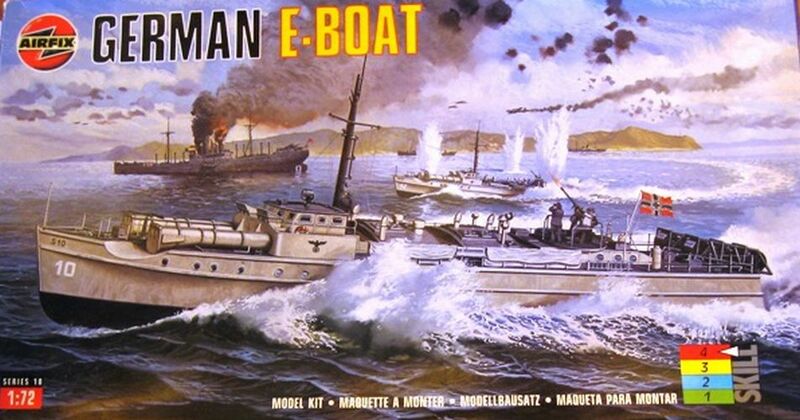 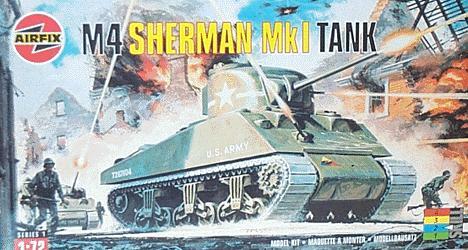 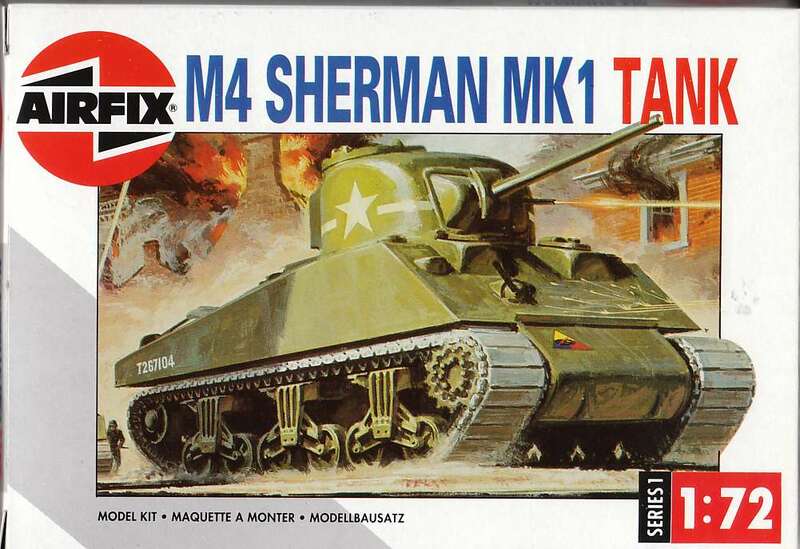 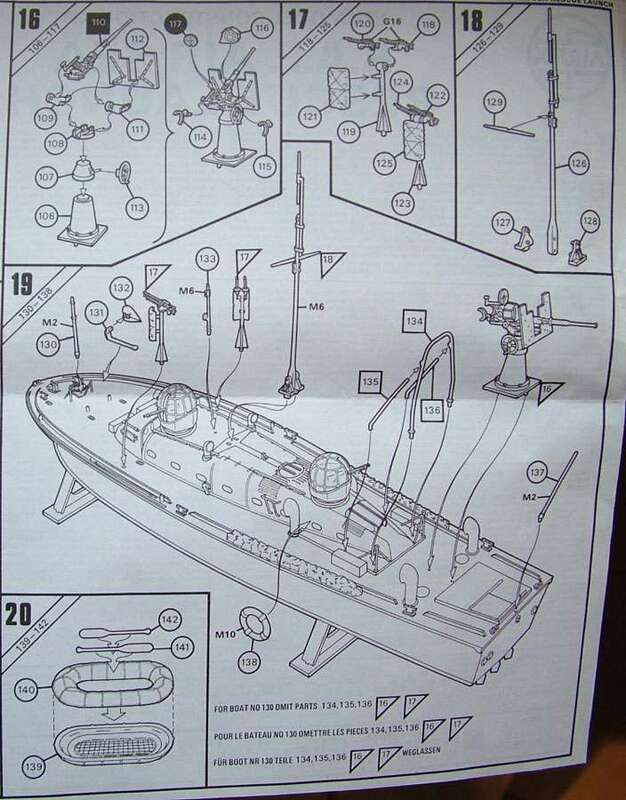 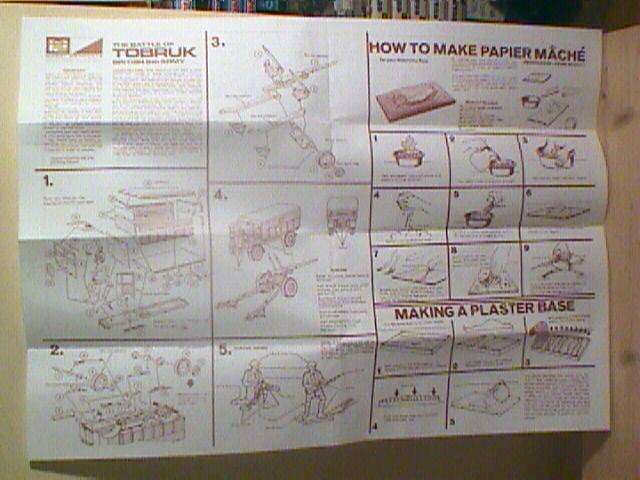 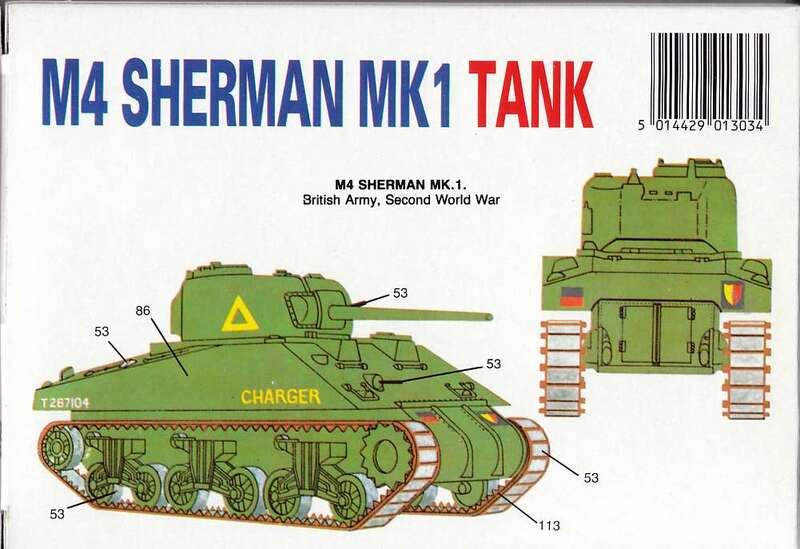 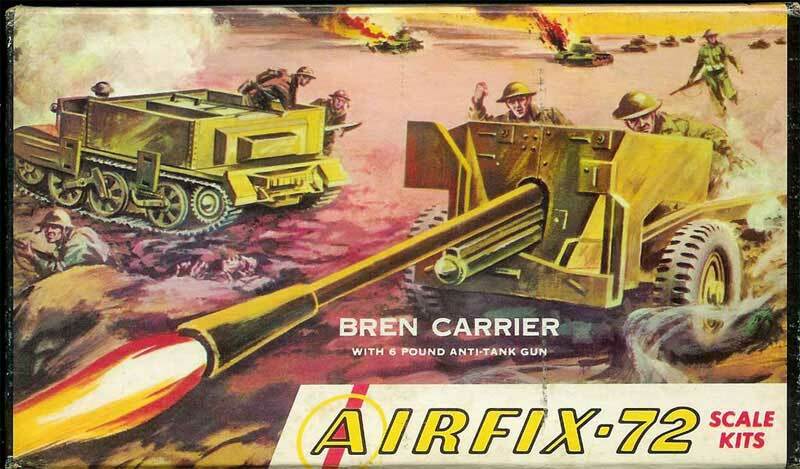 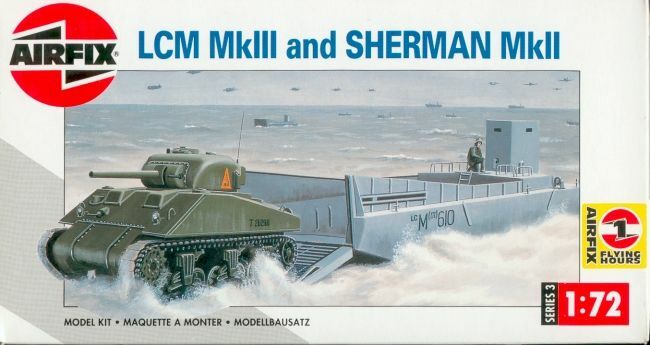 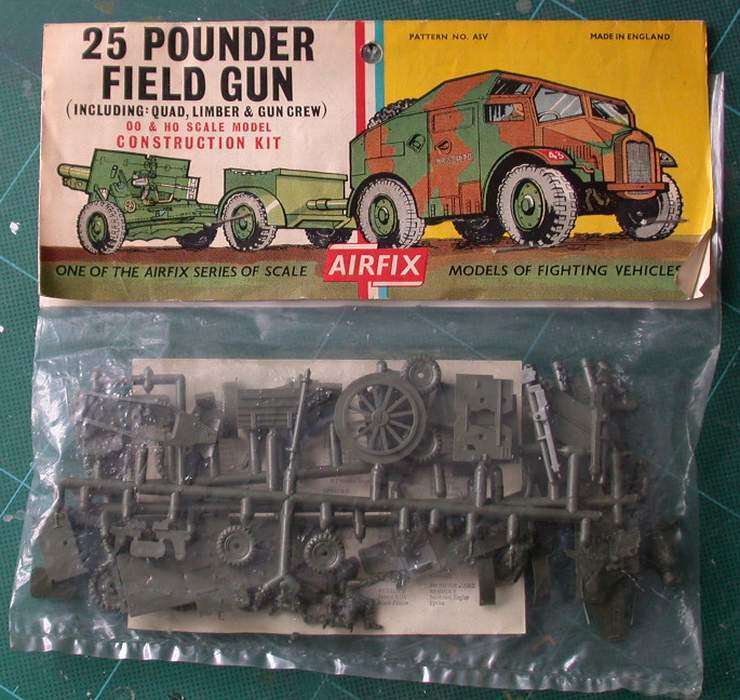 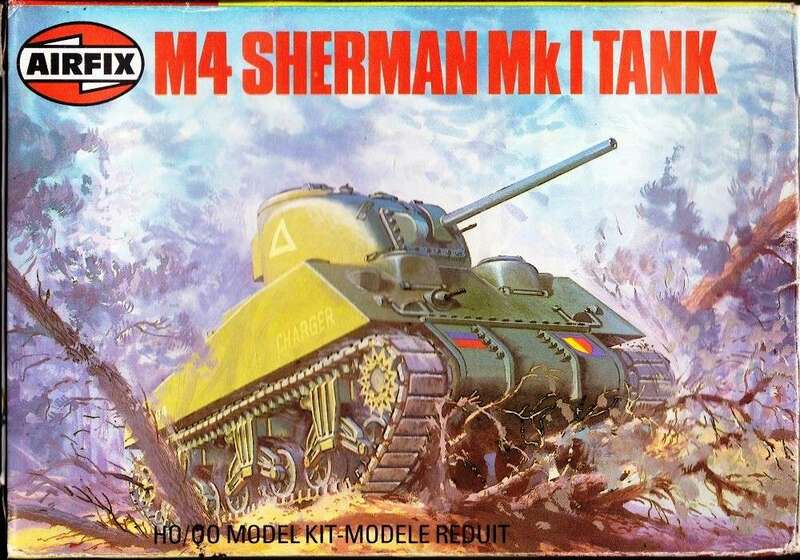 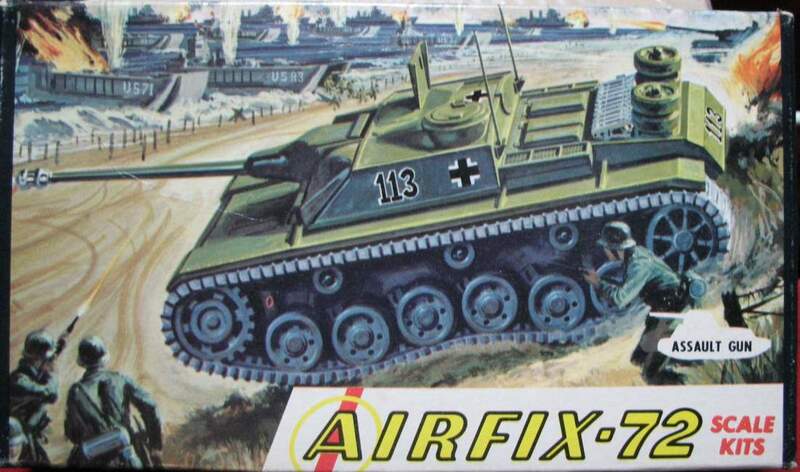 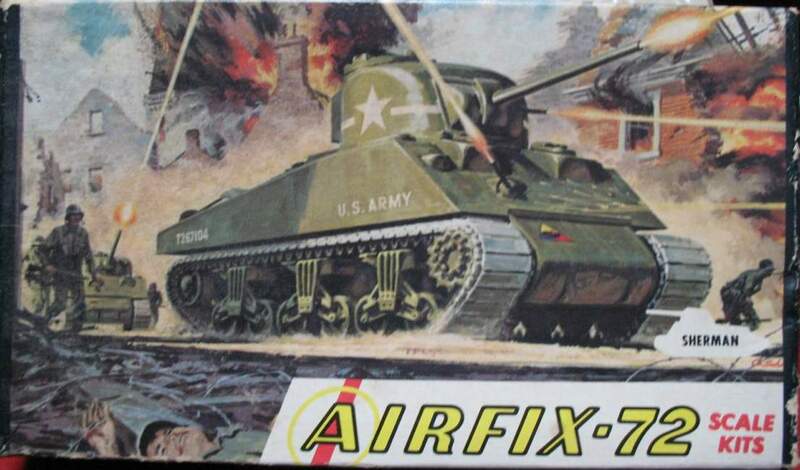 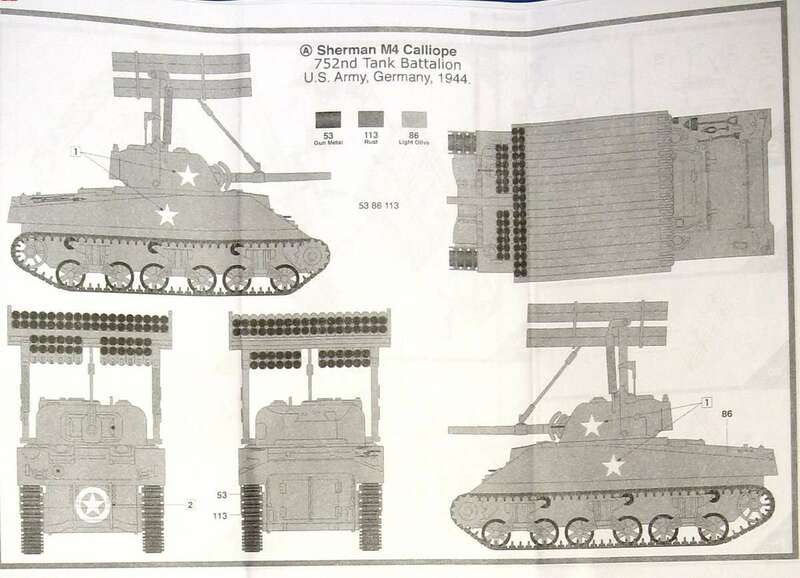 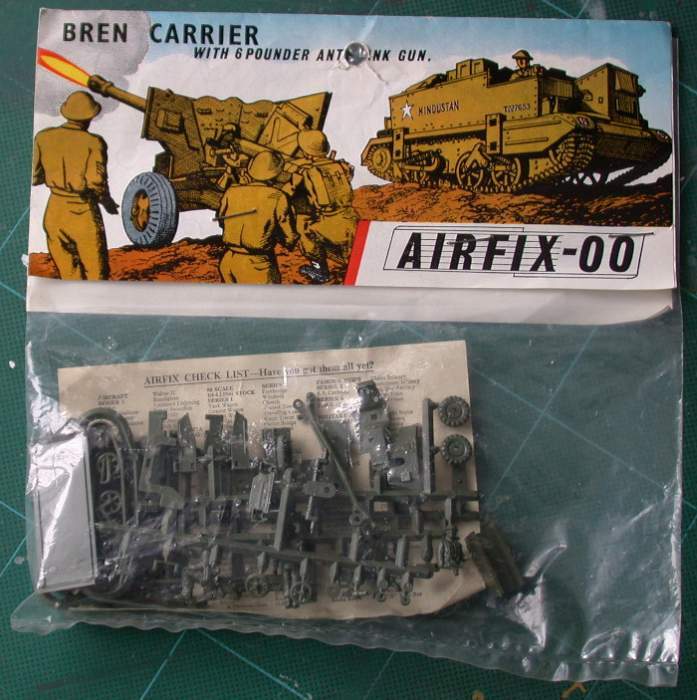 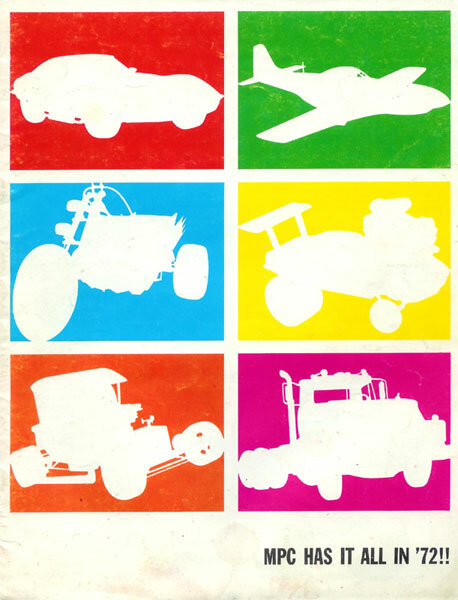 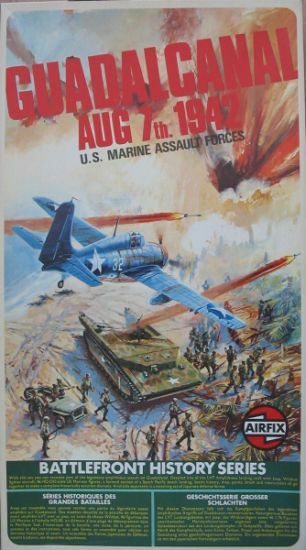 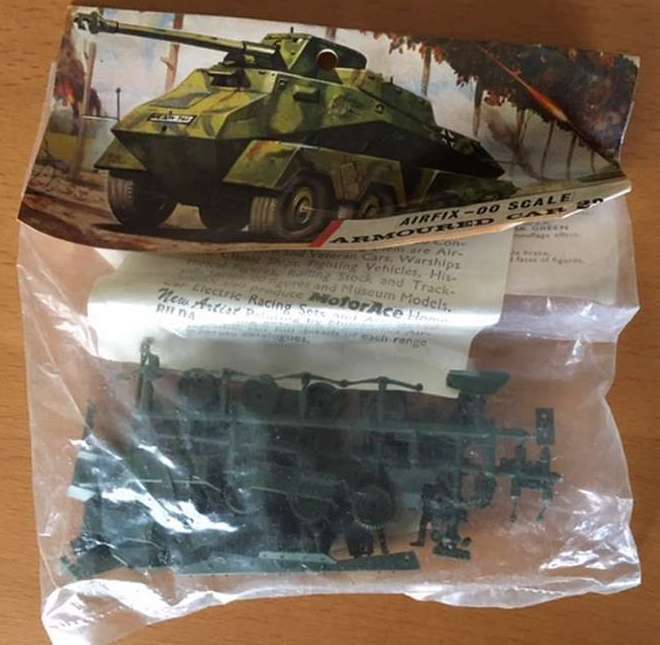 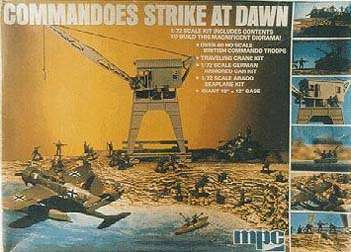 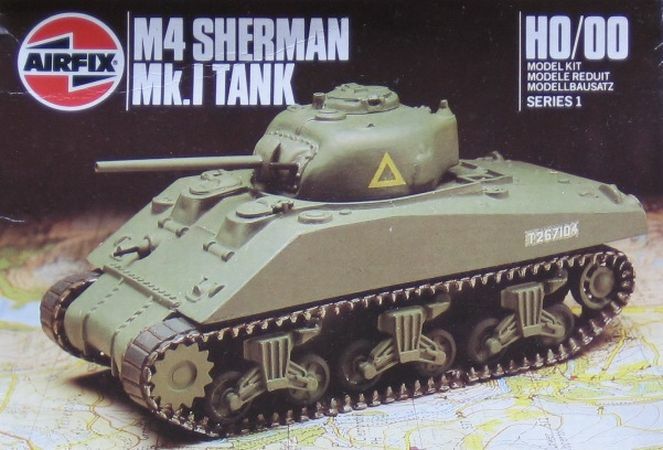 The picture is an thumbnail of one of earliest original Airfix Sherman box-art. 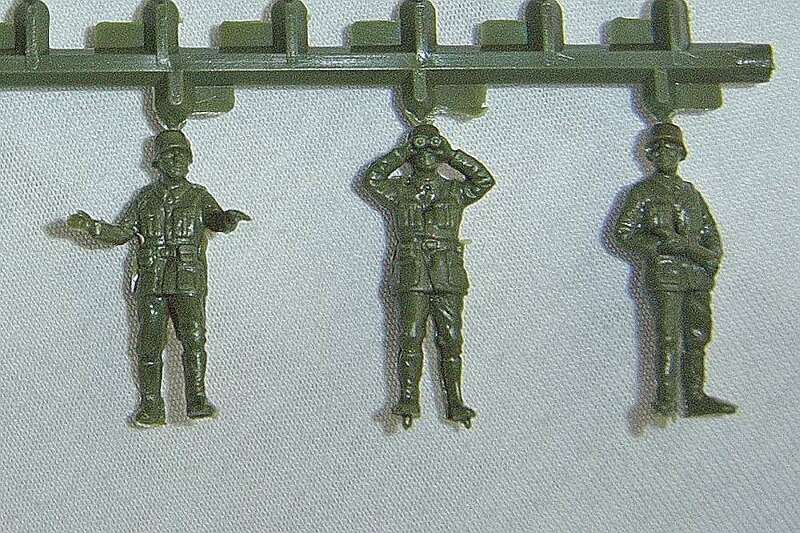 Over the years, the bottom third of the picture has been edited out, erasing the dead German in the foreground. 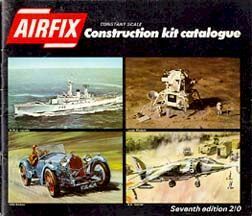 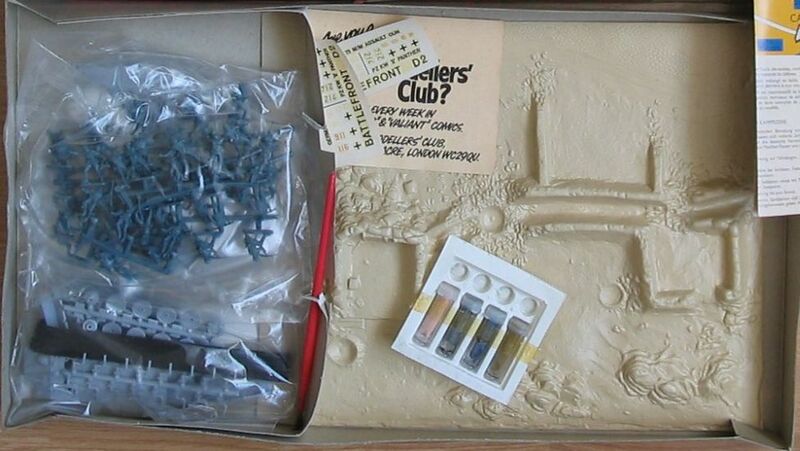 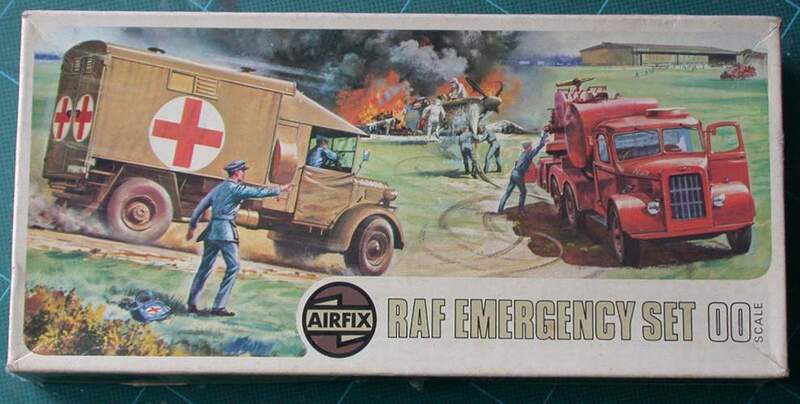 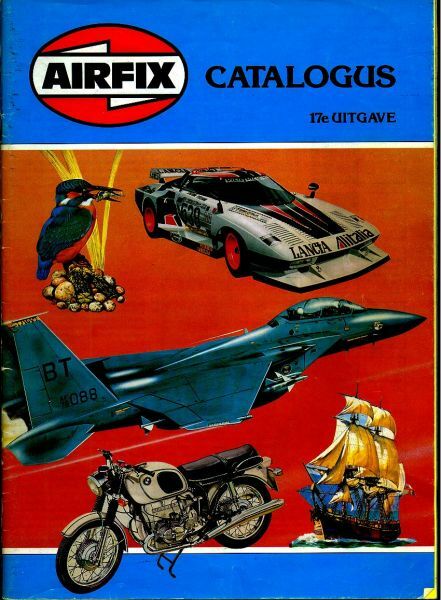 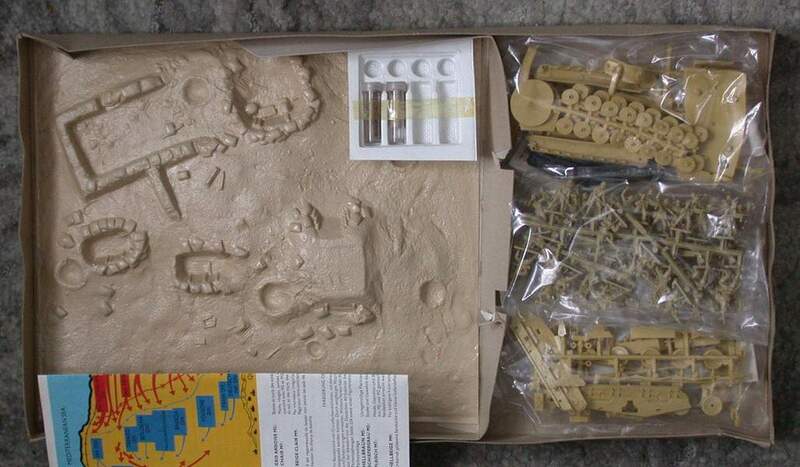 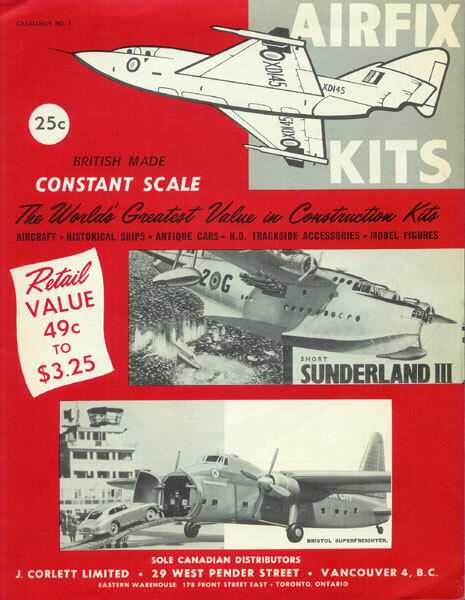 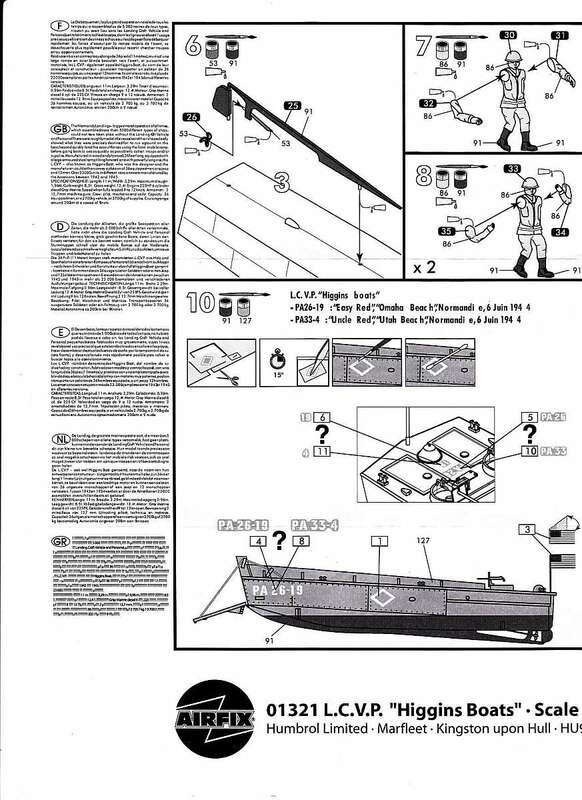 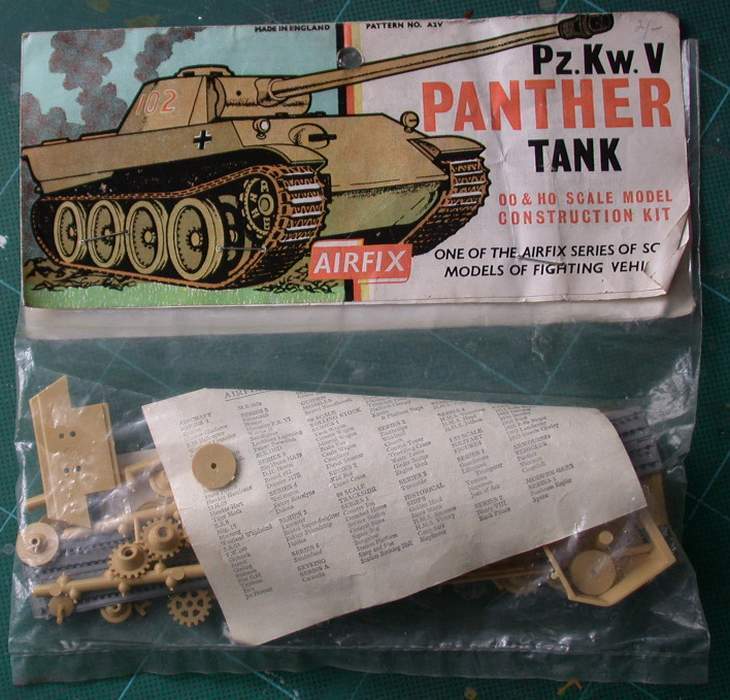 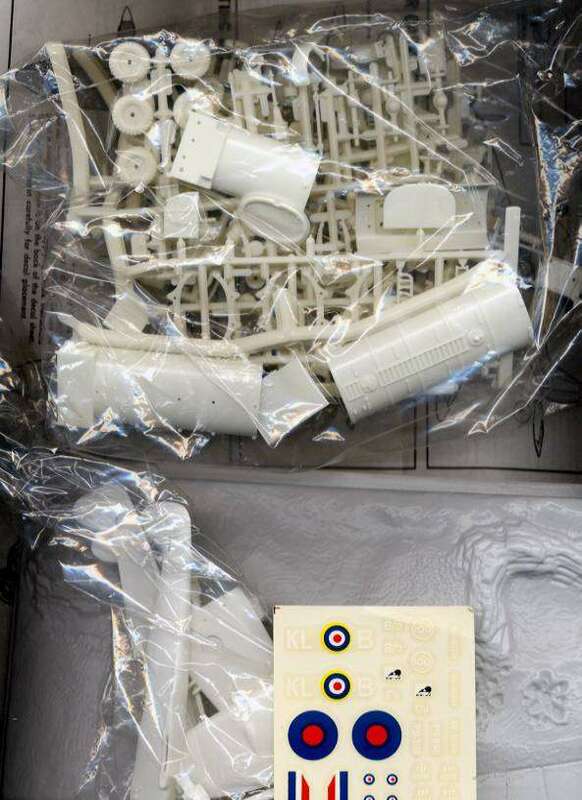 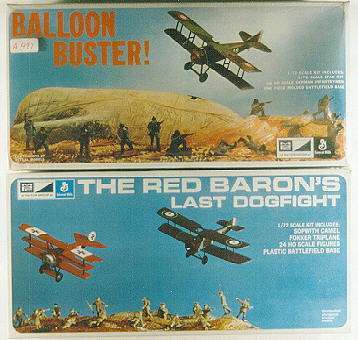 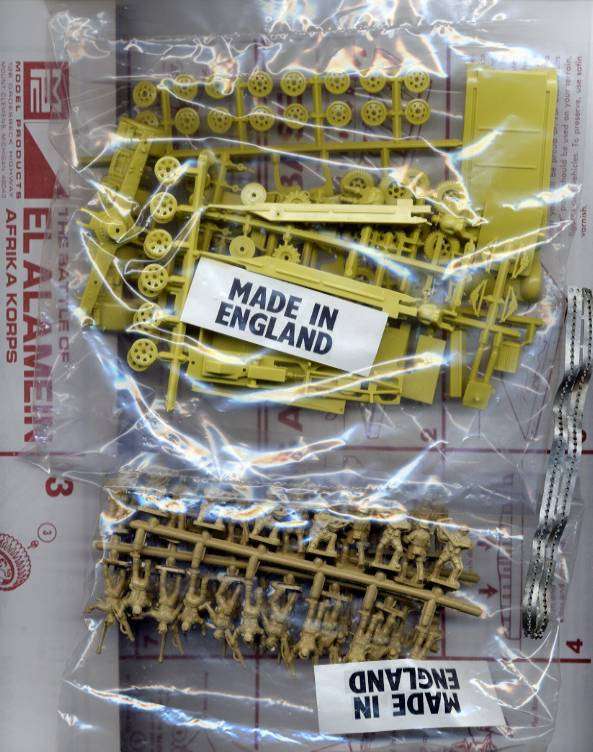 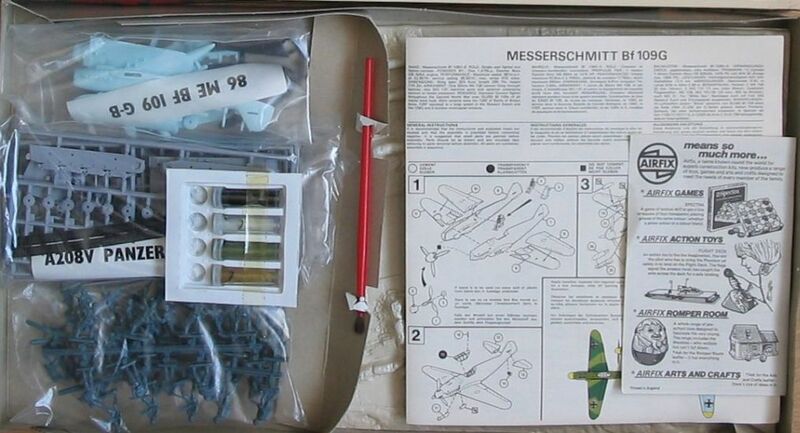 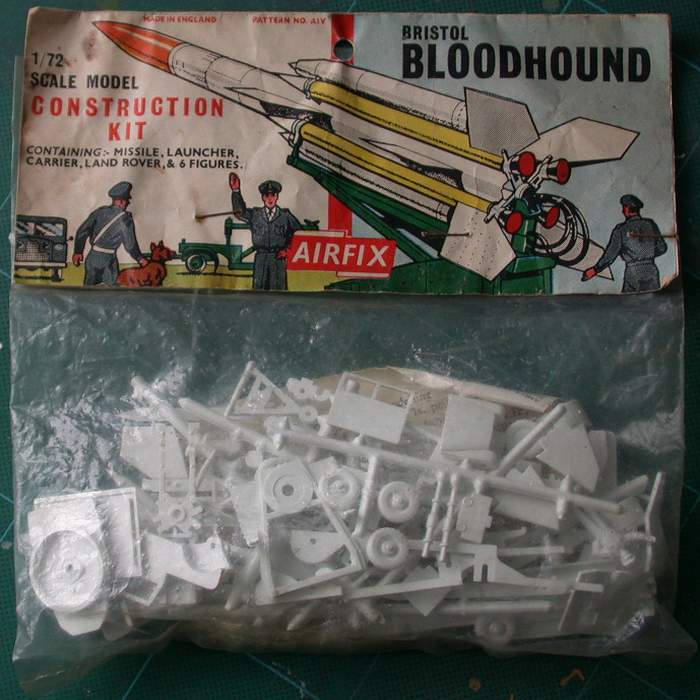 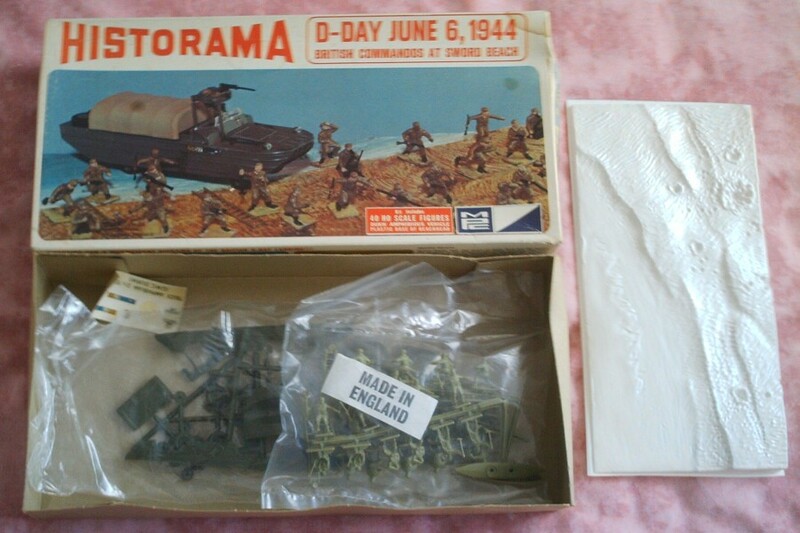 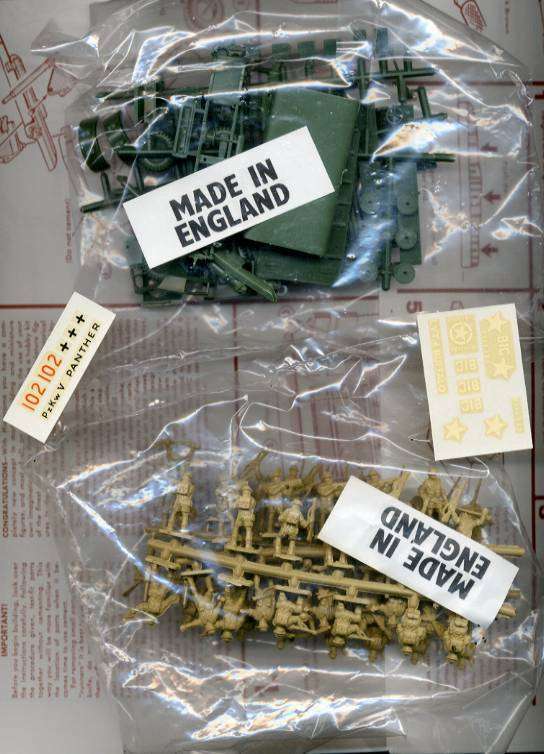 In the very beginning the small Airfix kits series 1 and 2 were packed in plastic bags with a paper label, followed by a hard-cover blister box with a carton backside. 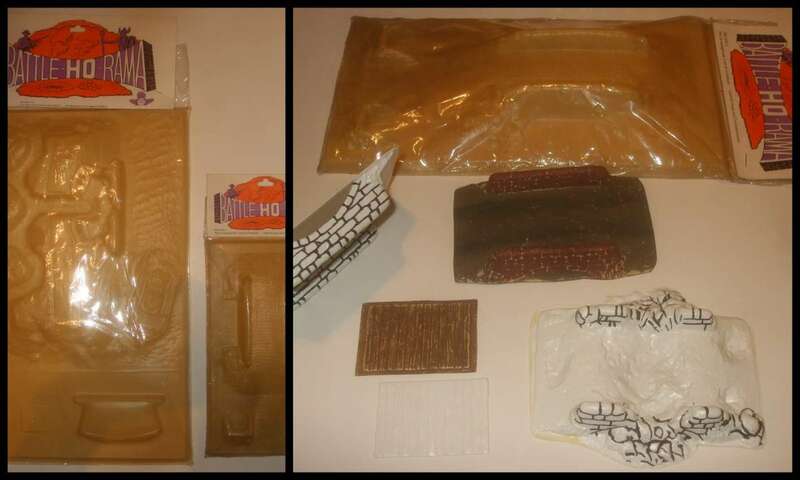 Plastic bag - Boxing type 2 - 1959 until 1960 and type 3 - 1963 until 1973. 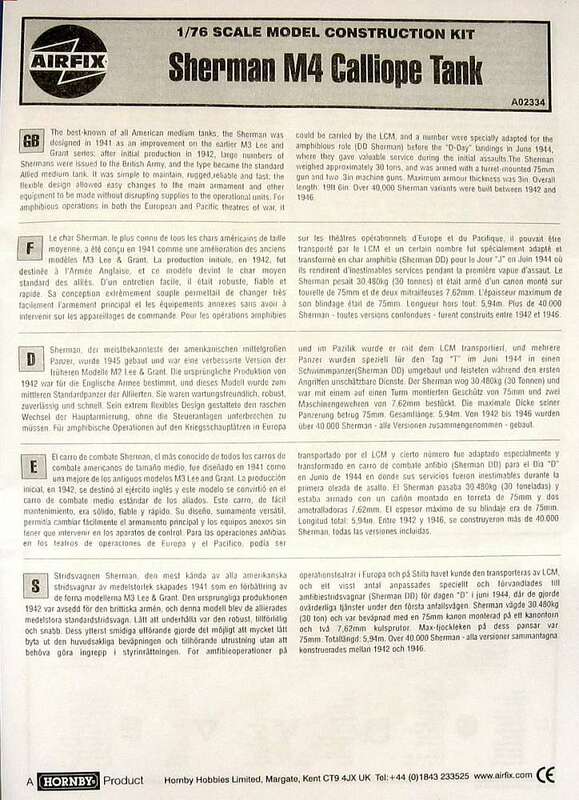 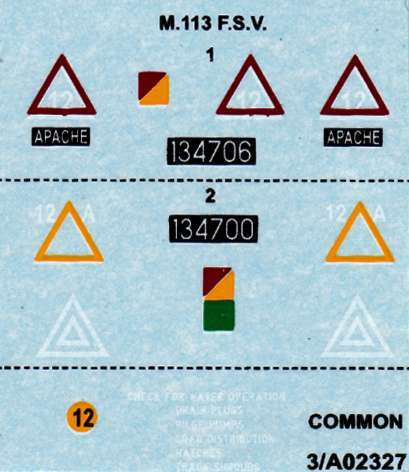 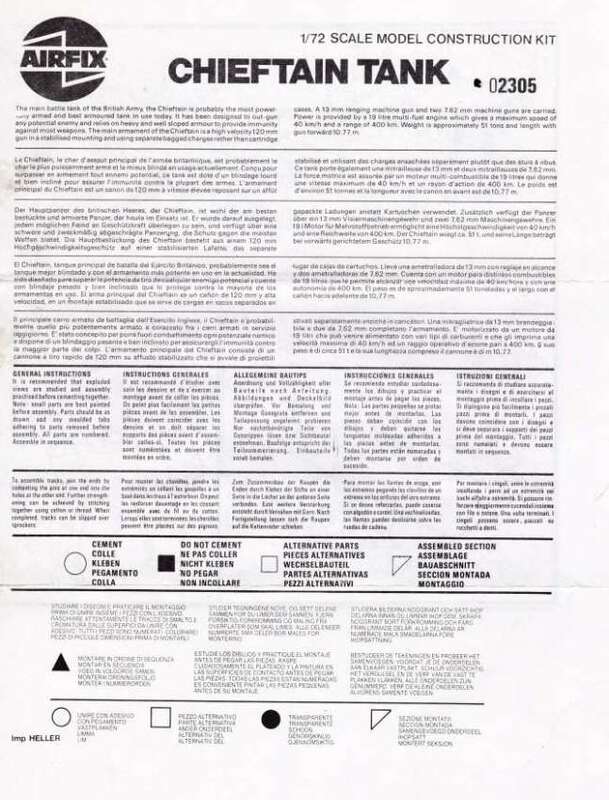 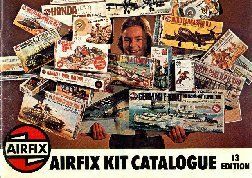 Airfix plastic bag Red Flash labels type 3 from 1963 until 1973. 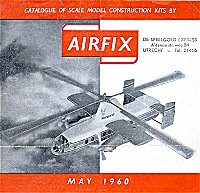 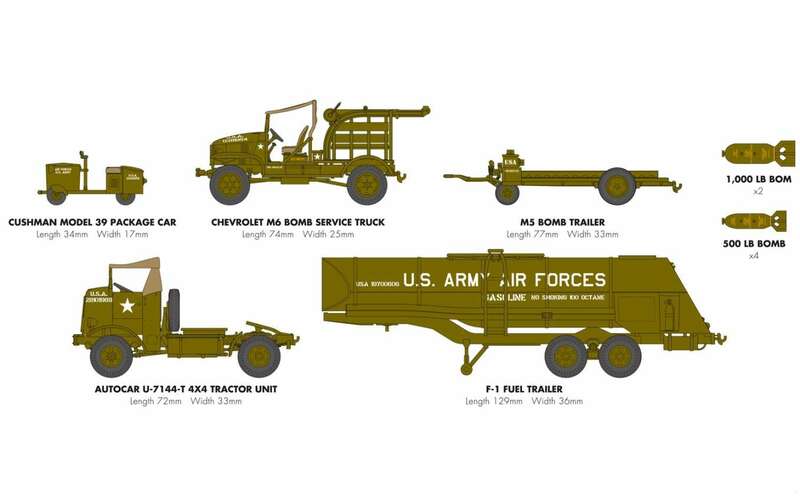 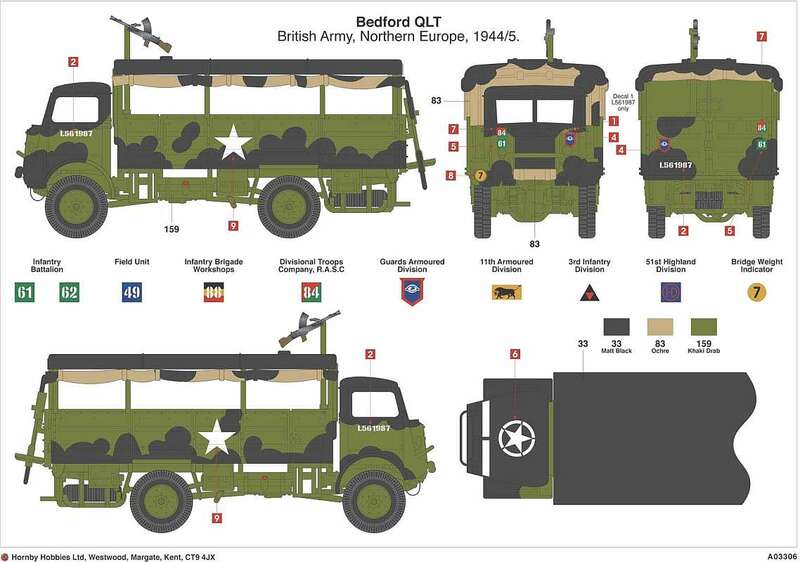 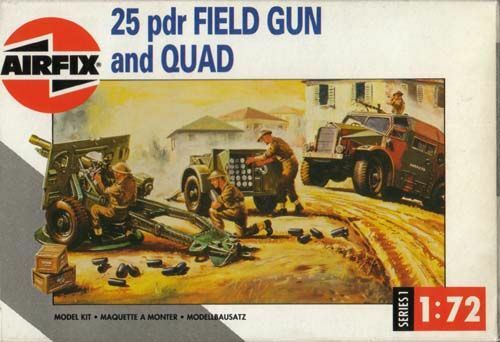 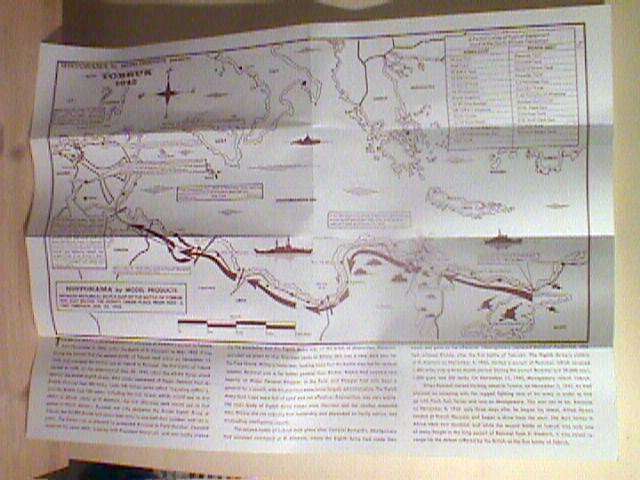 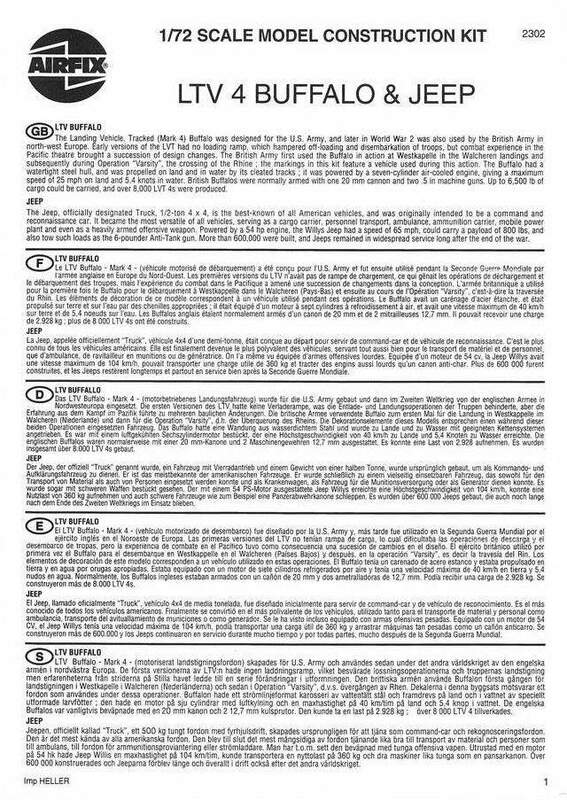 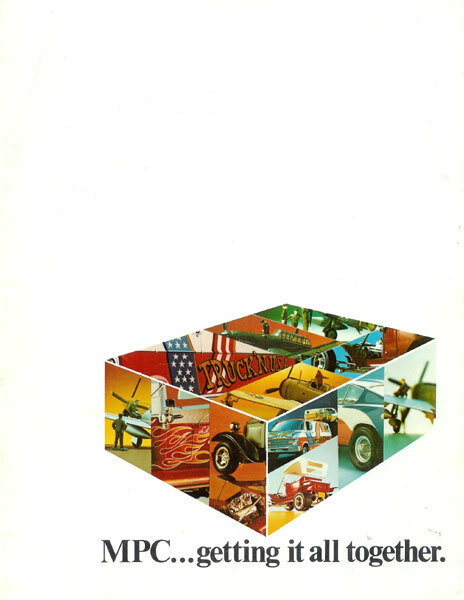 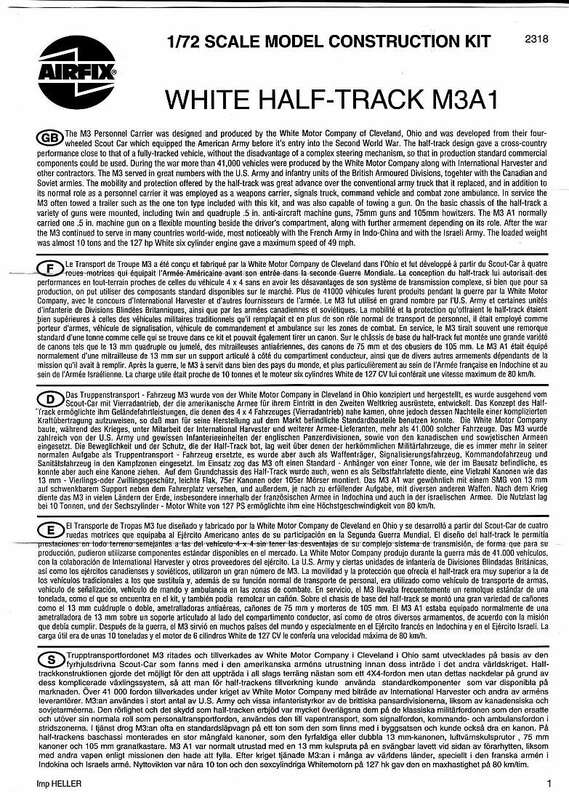 Airfix boxes Red Flash type 3 from 1963 until 1973 - US Layout. 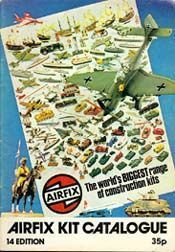 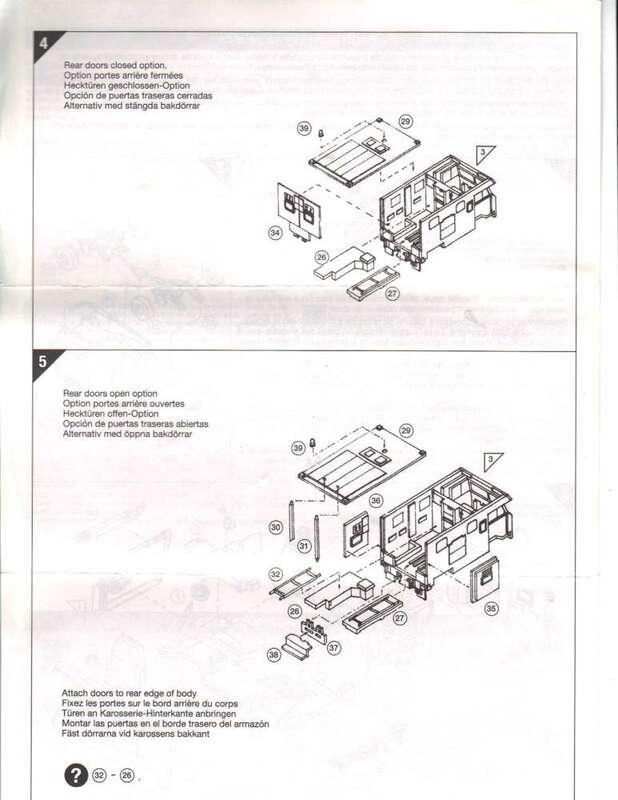 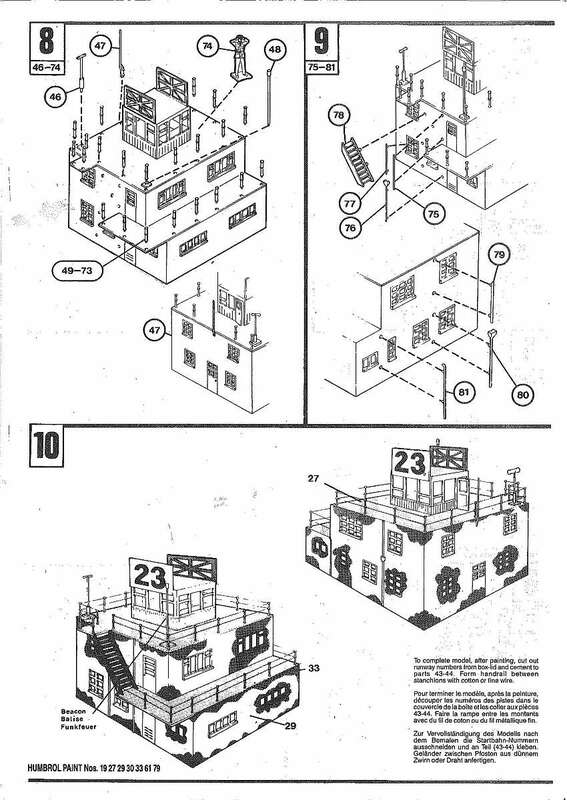 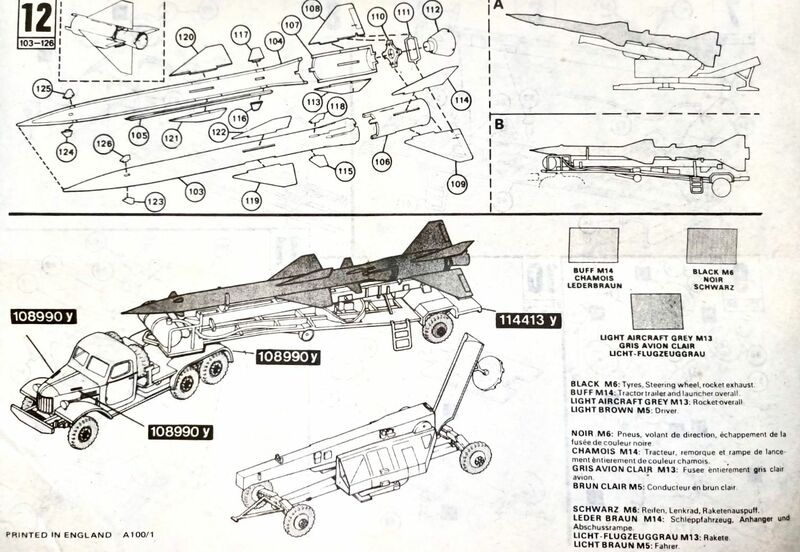 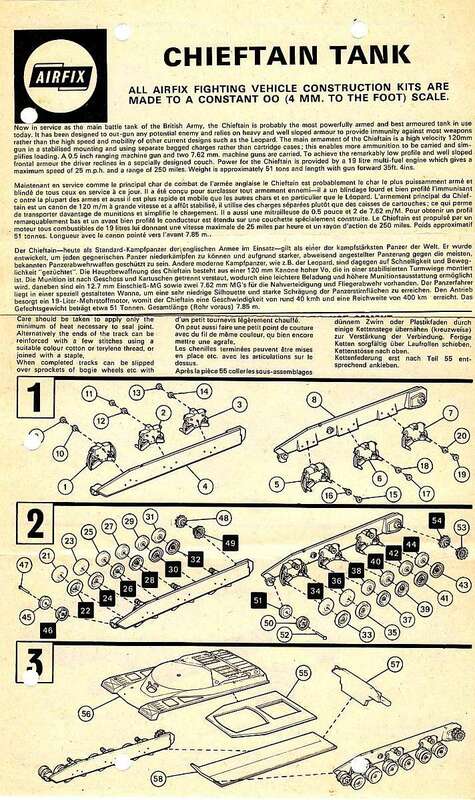 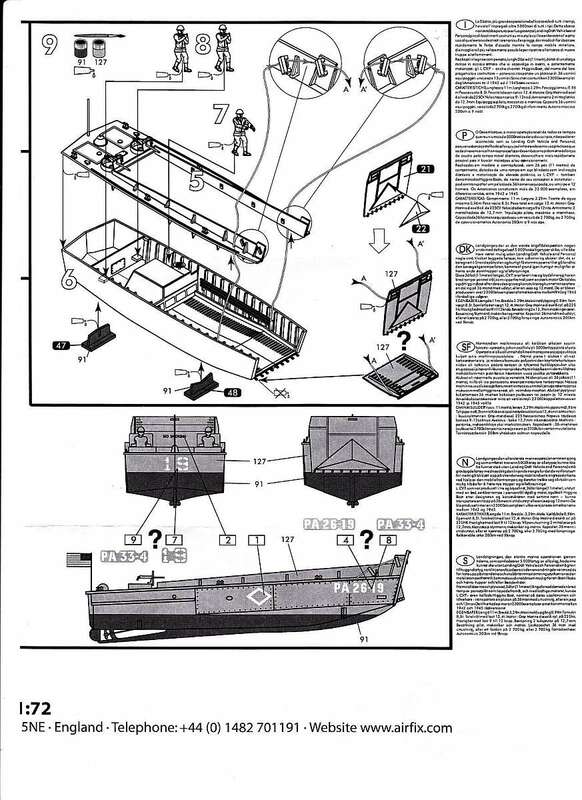 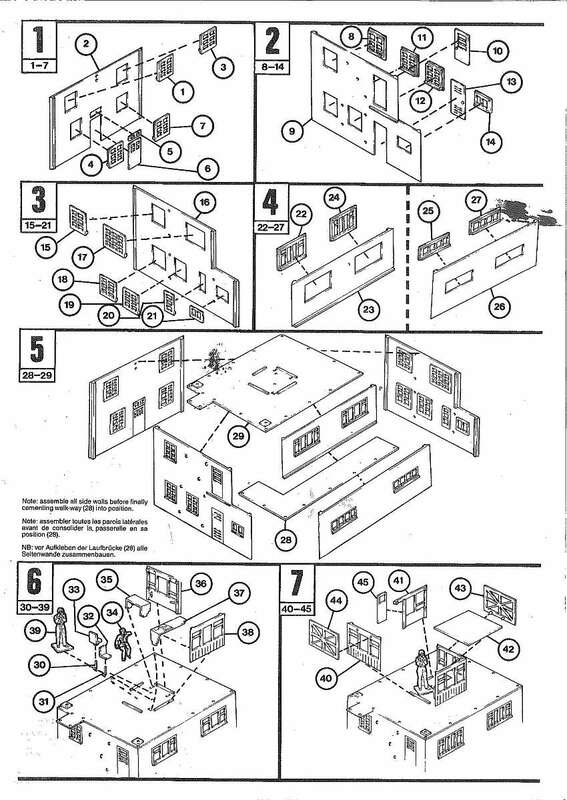 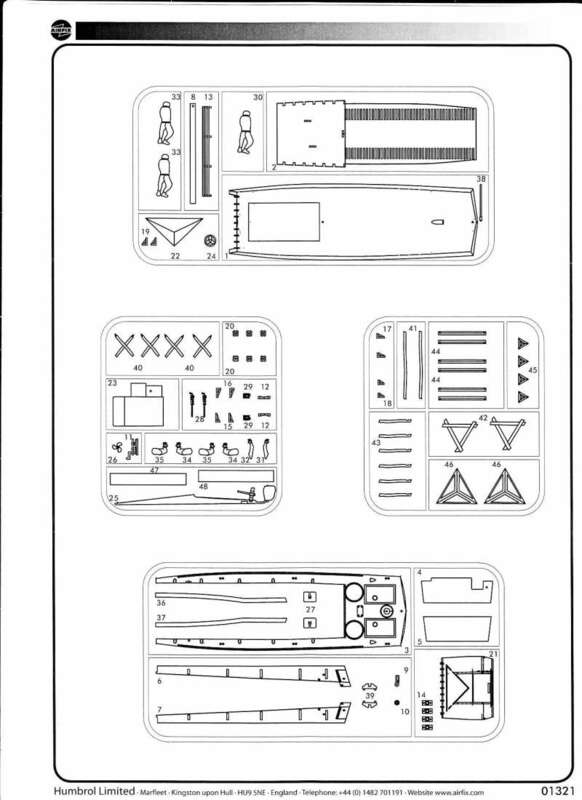 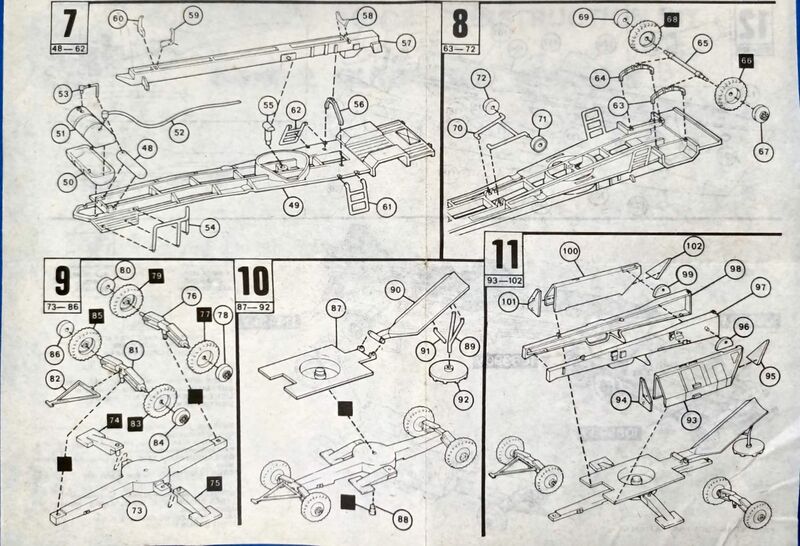 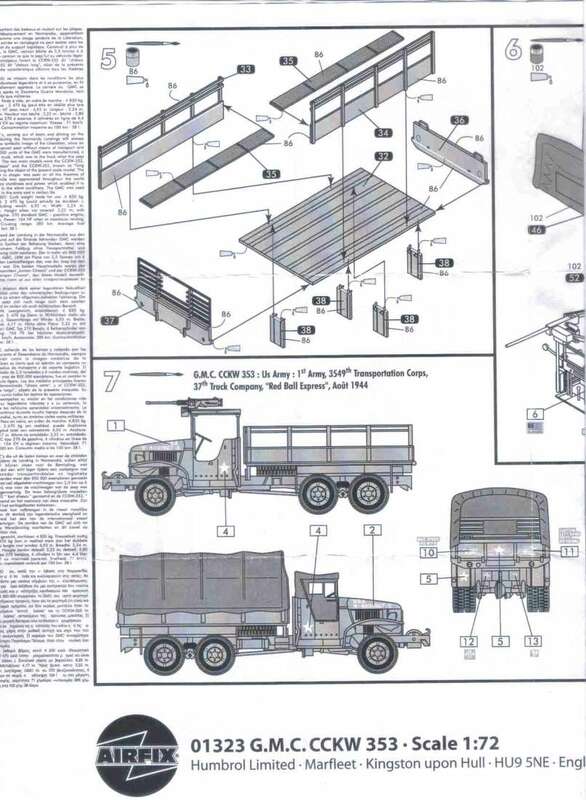 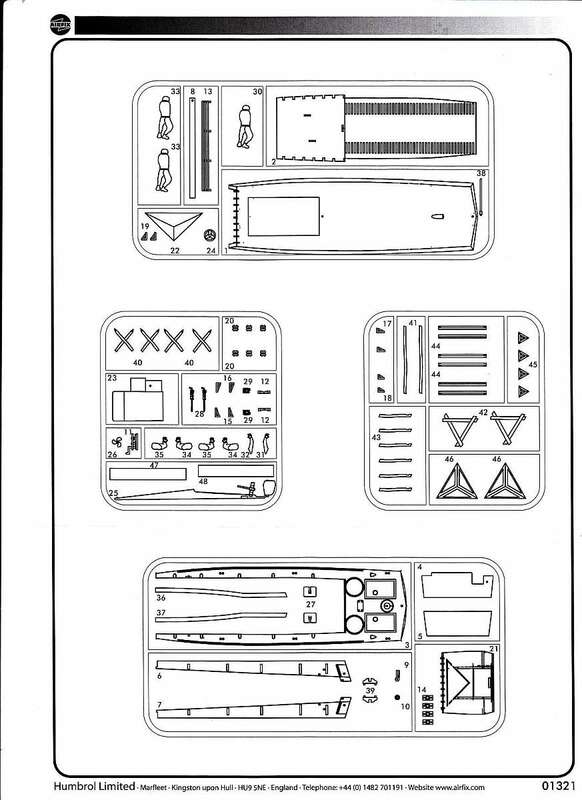 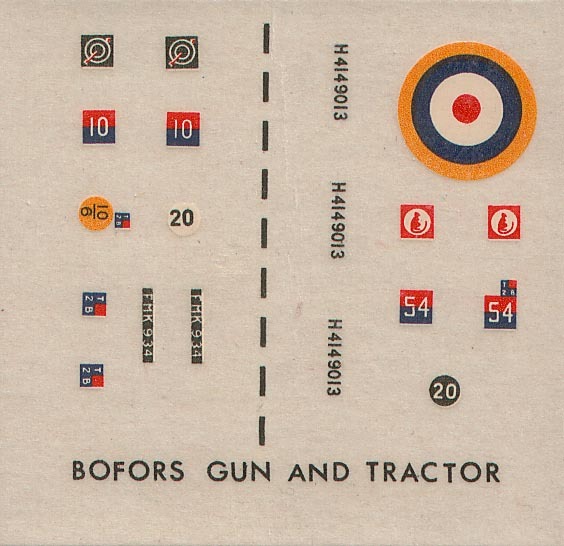 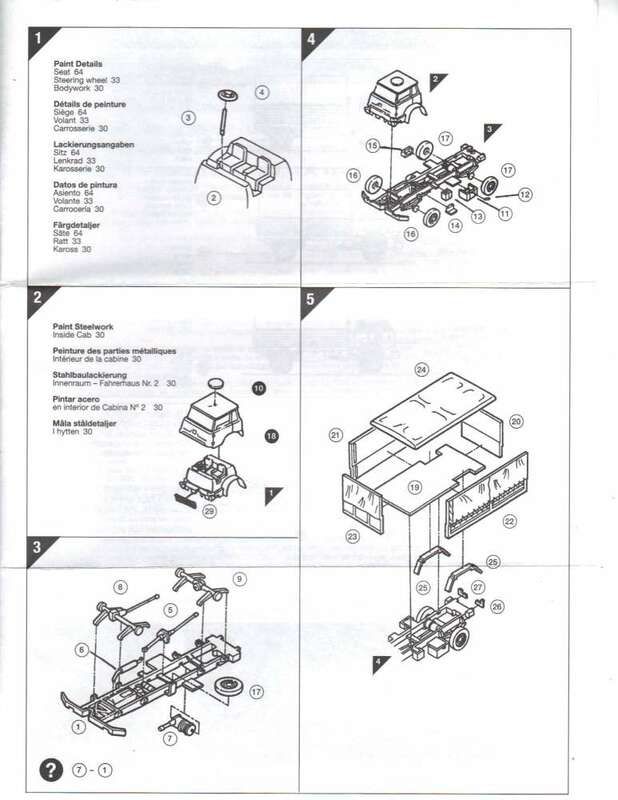 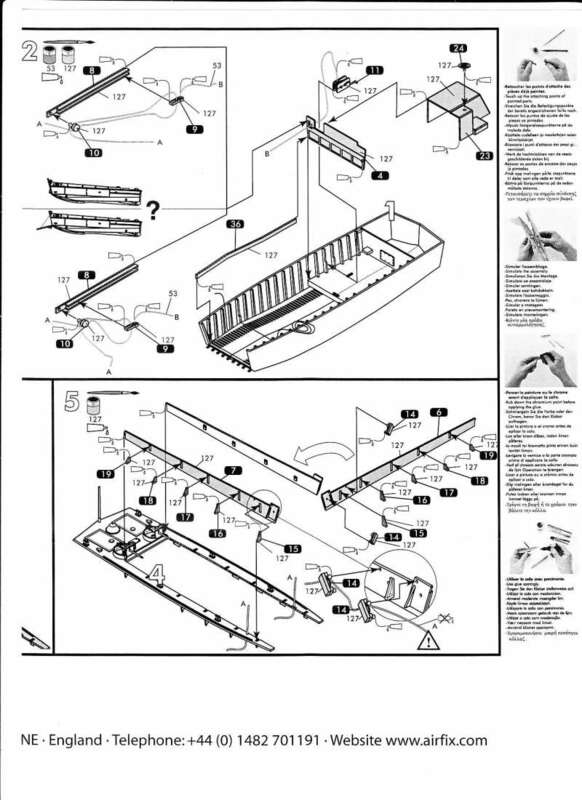 Airfix box layouts after 1977. 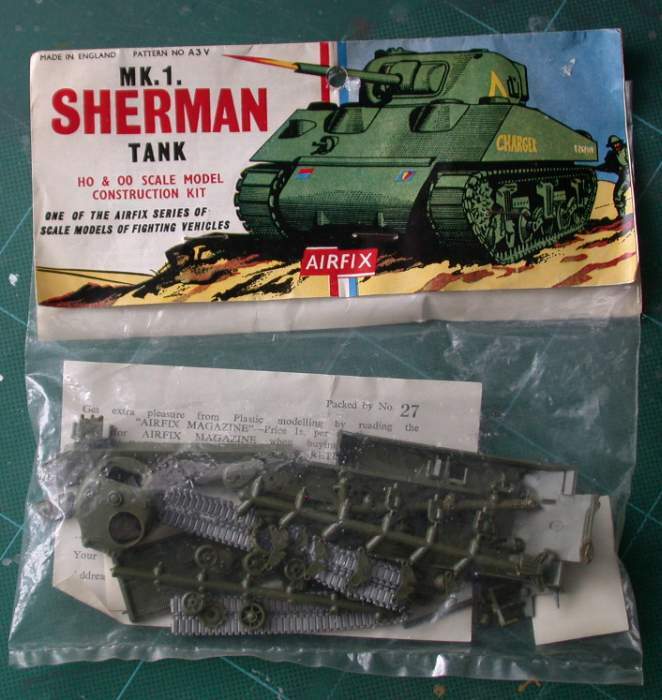 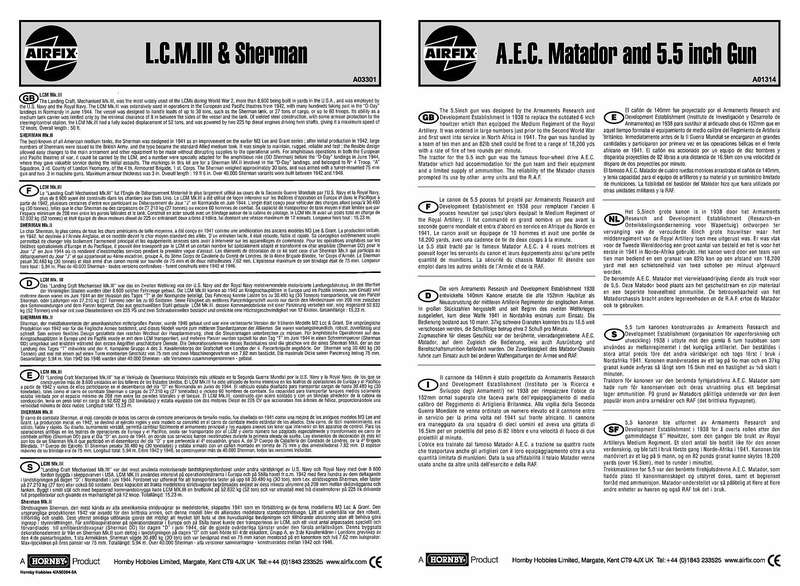 Kit 1303 Sherman M4 MK1. 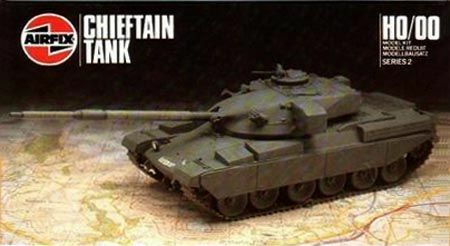 New name but the same kit. 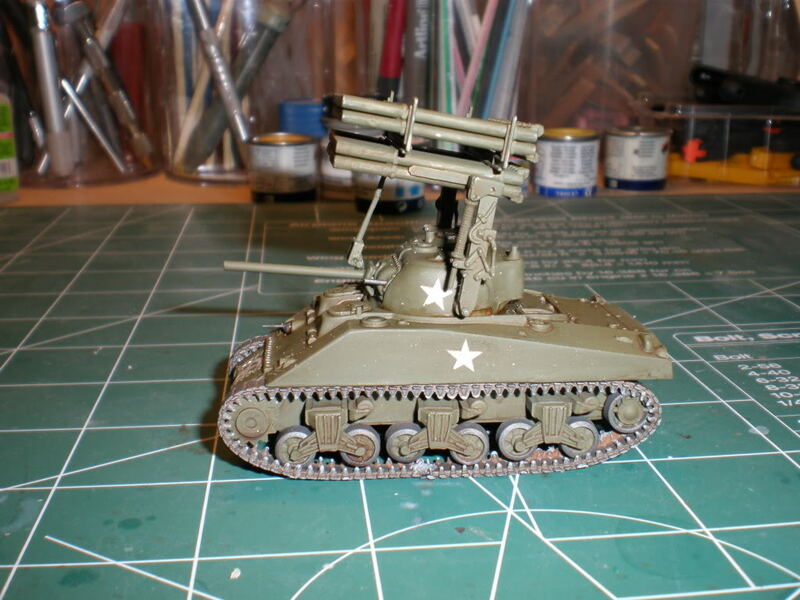 Model built by David O'Garcia. 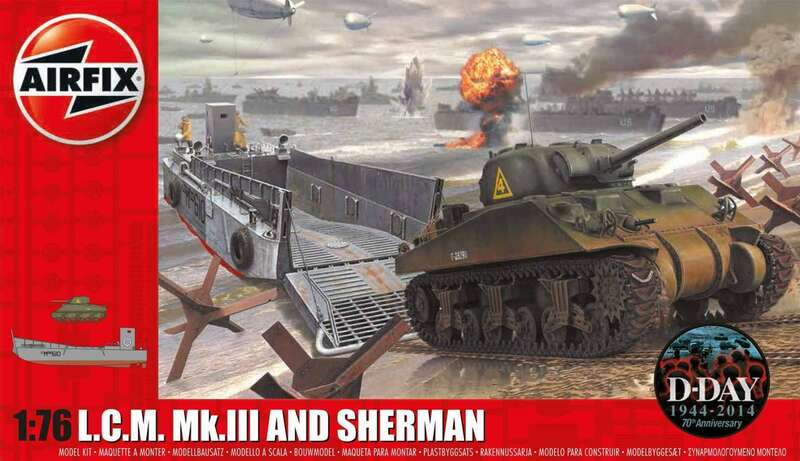 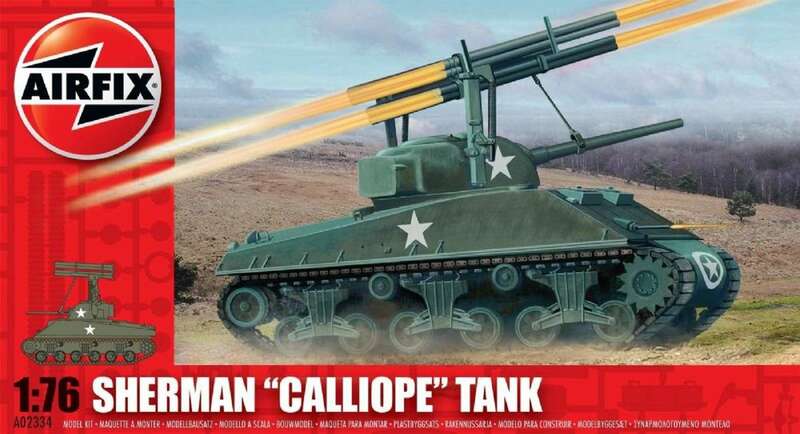 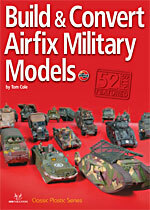 May 2011 issue of 'Scale Military Modeller' - article 'Airfix Sherman History' by Tom Cole. 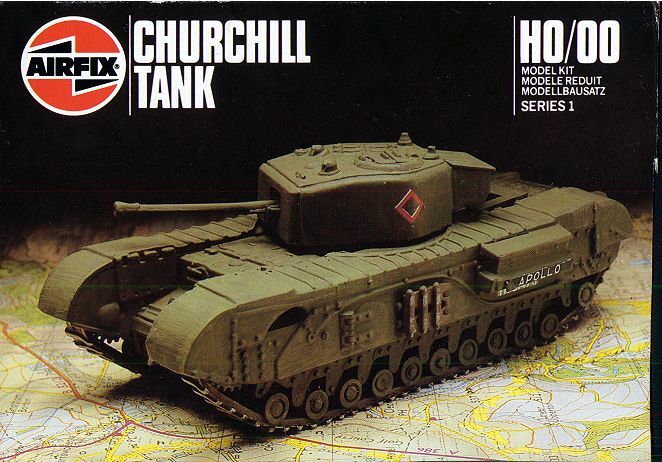 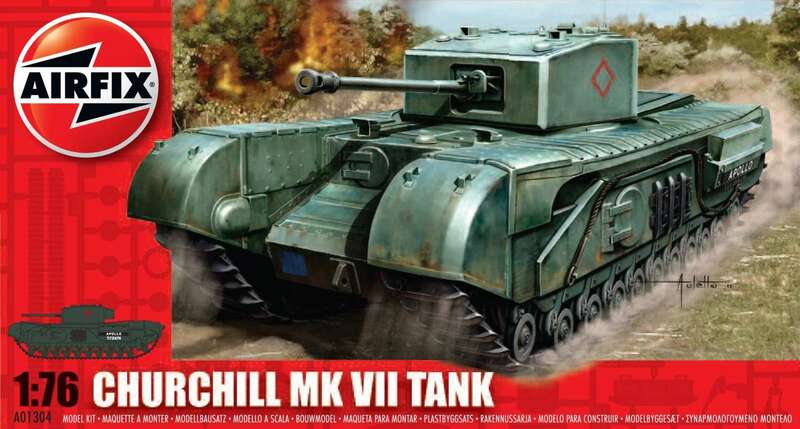 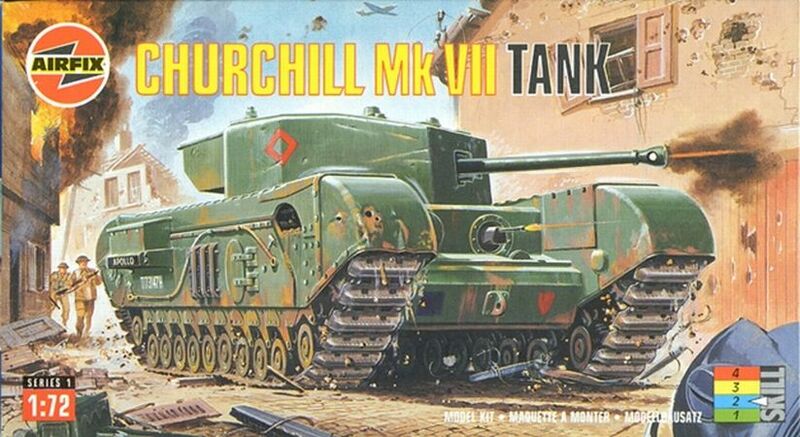 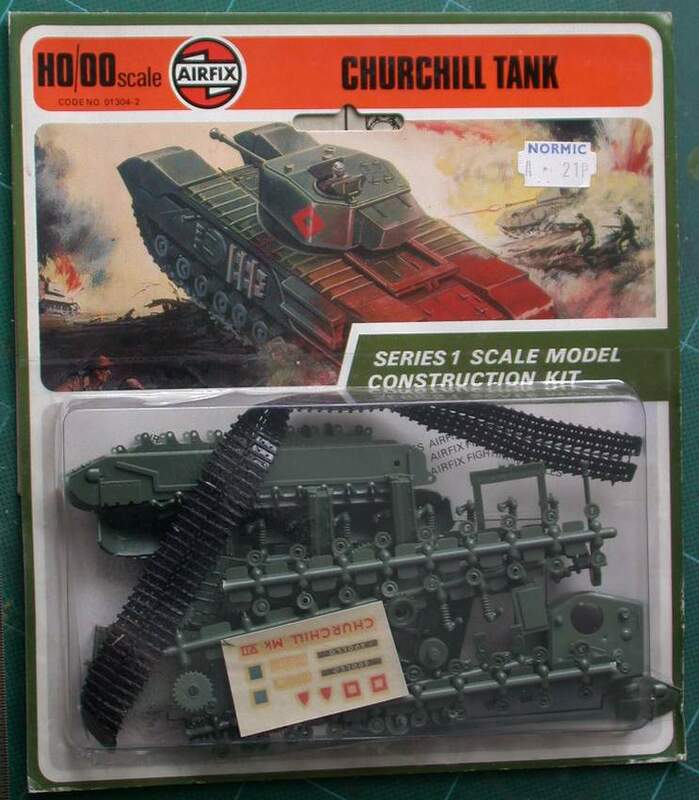 Kit 1304 Churchill MK7 tank. 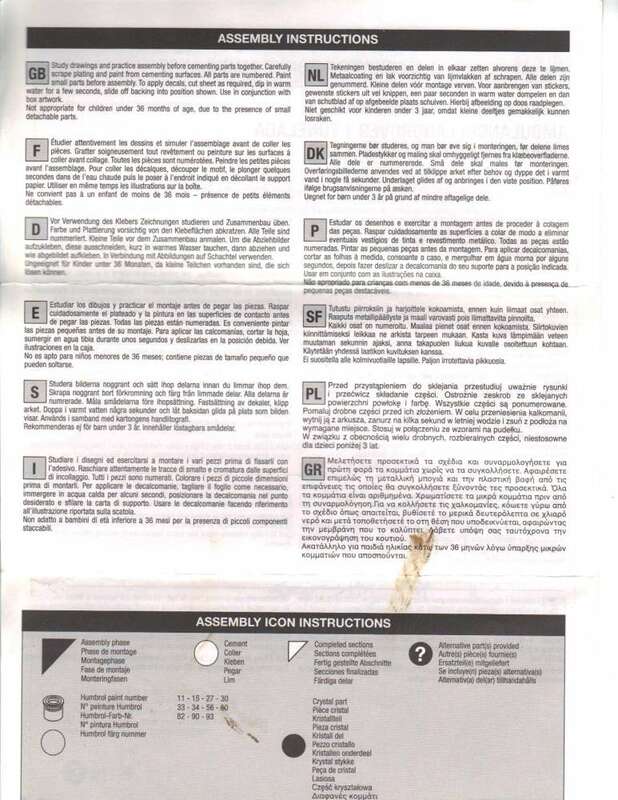 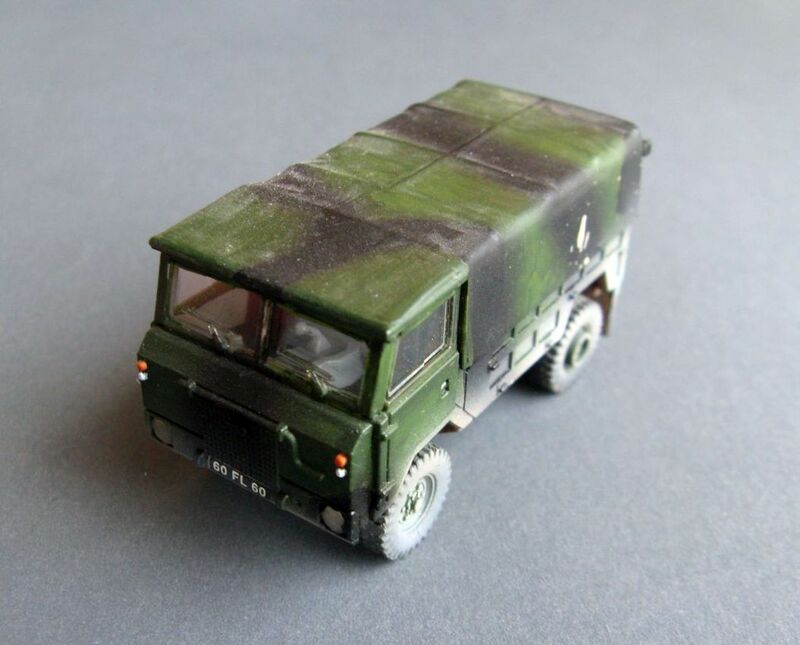 'MiniAfv' Blogspot - part 1. 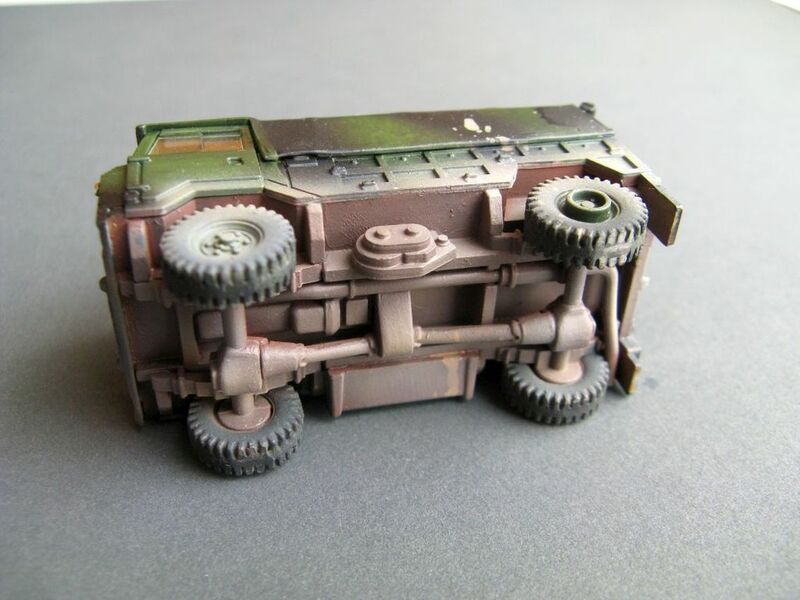 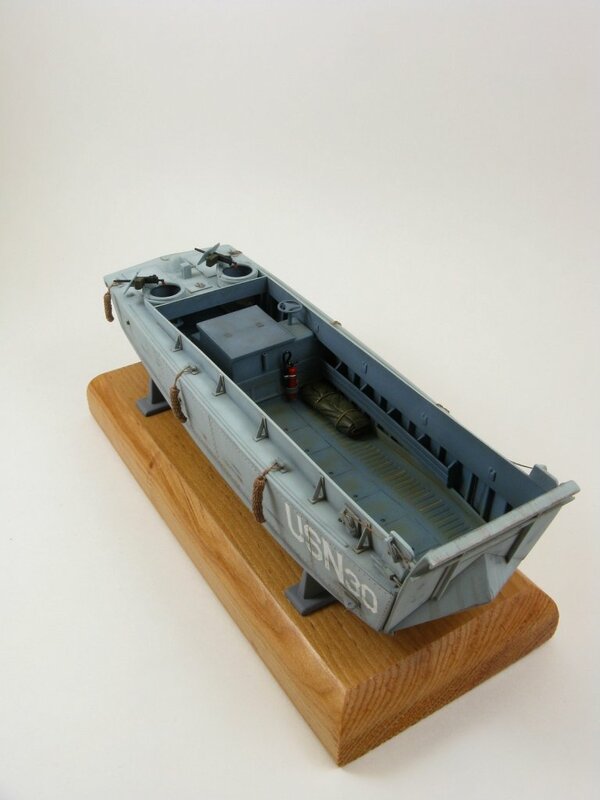 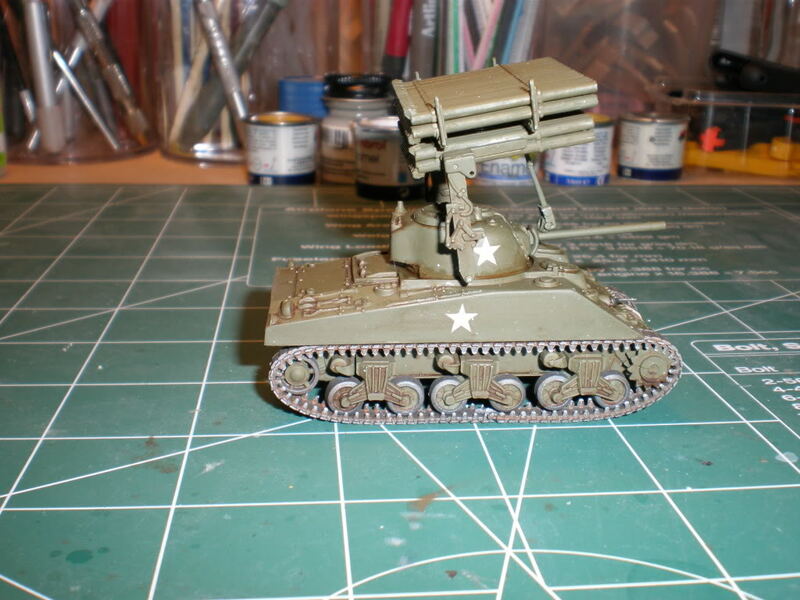 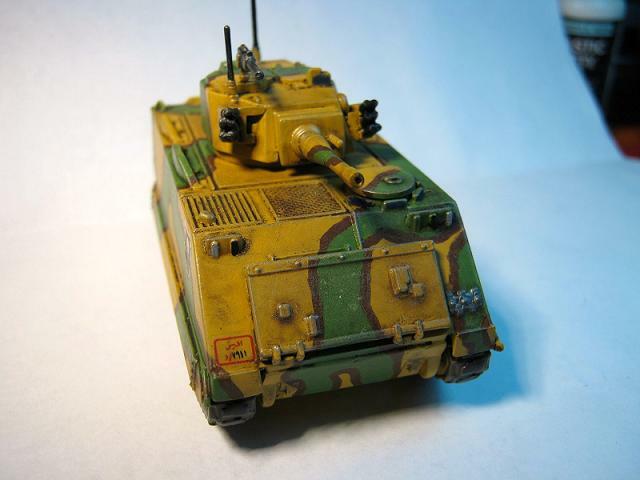 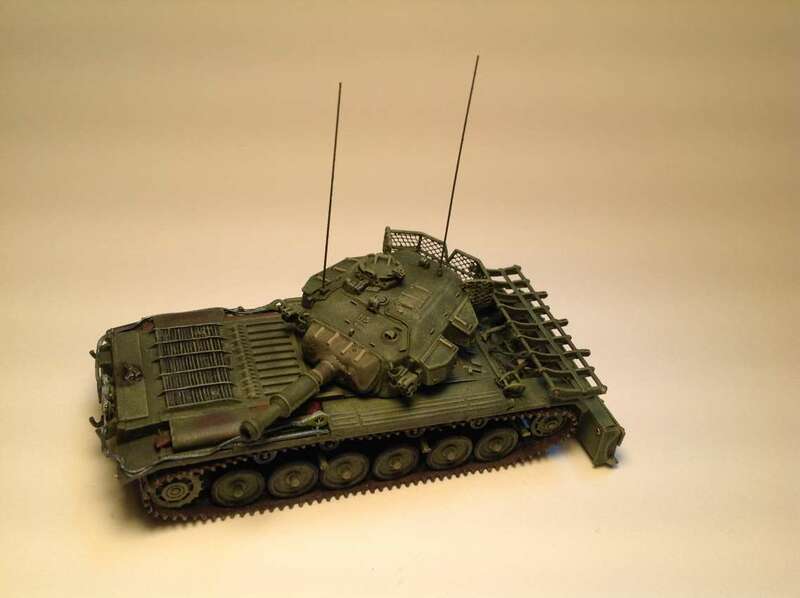 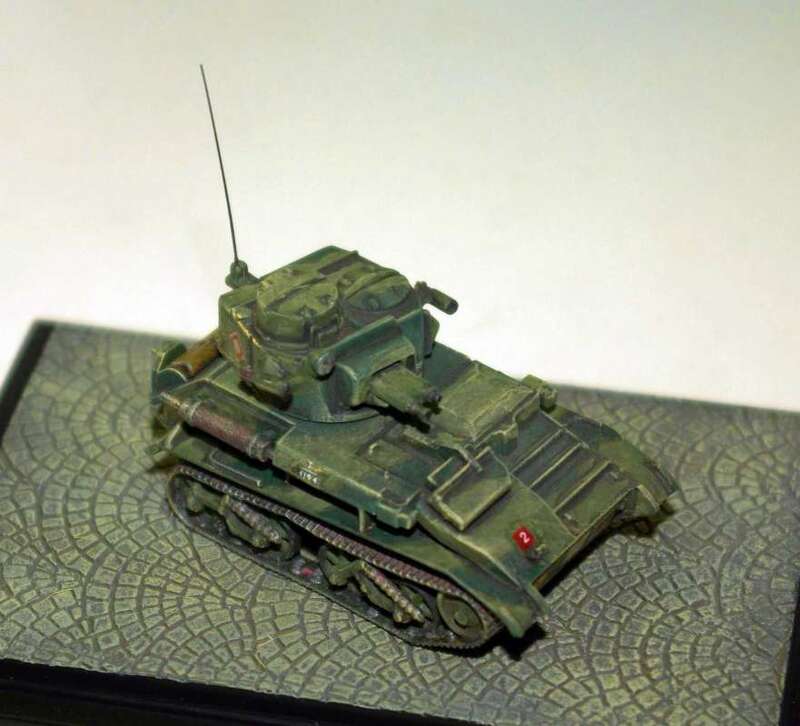 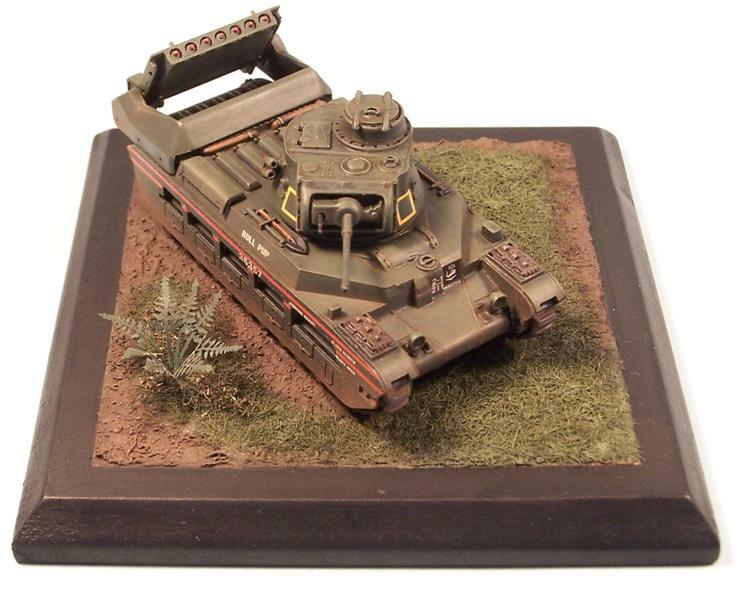 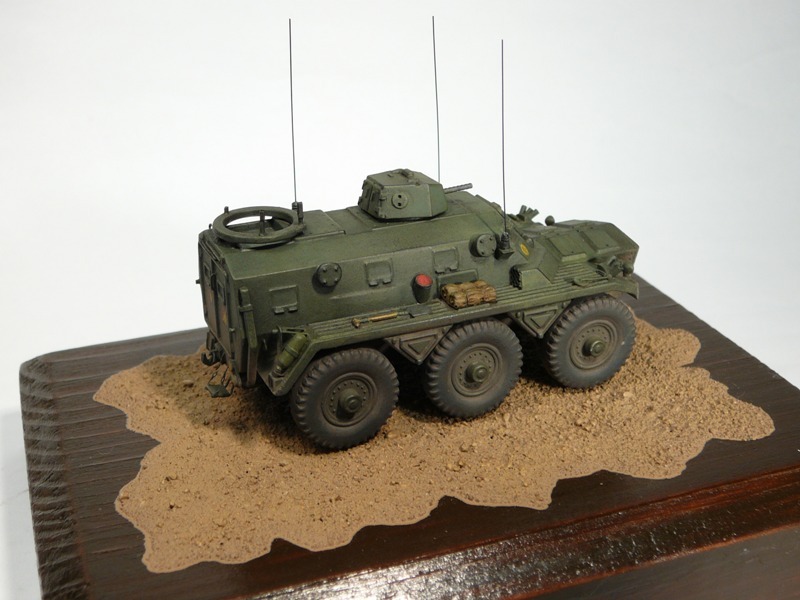 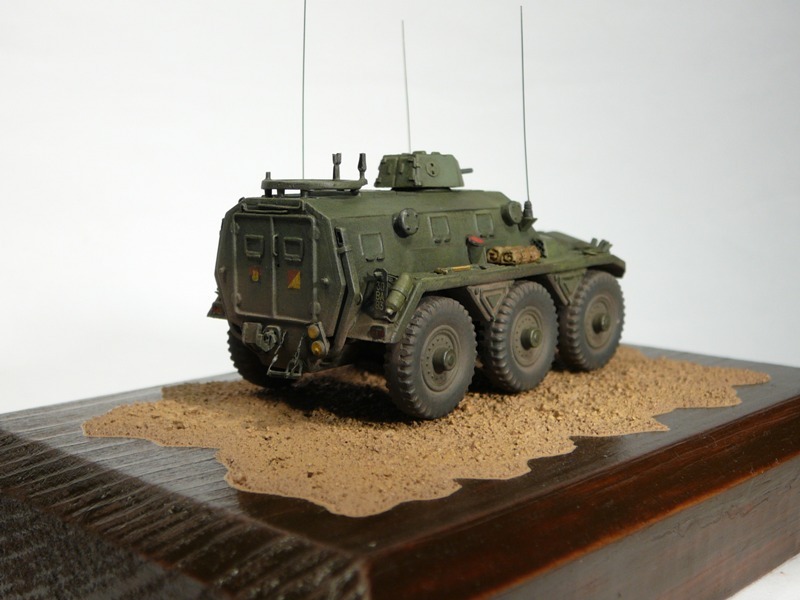 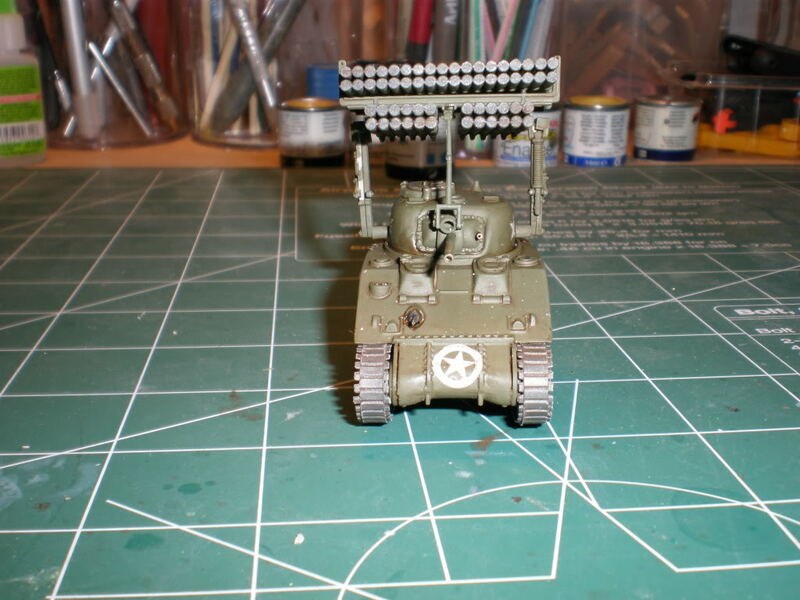 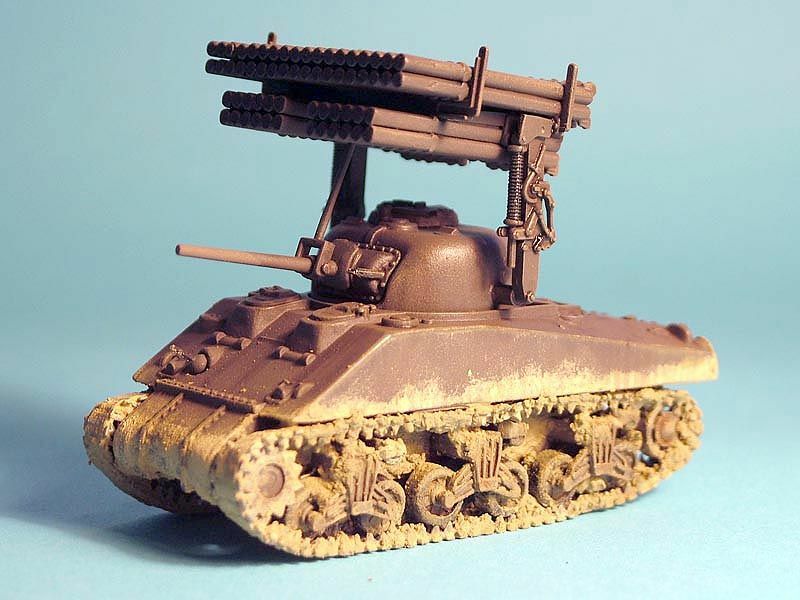 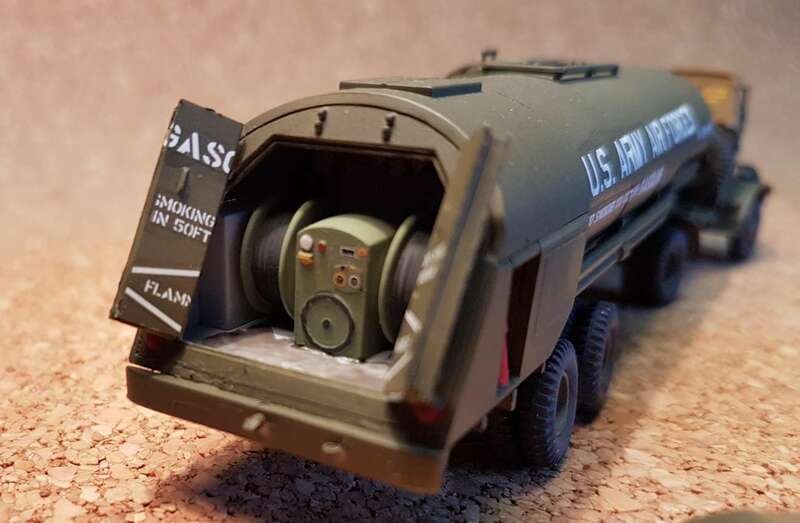 'MiniAfv' Blogspot - part 2 - finished model. 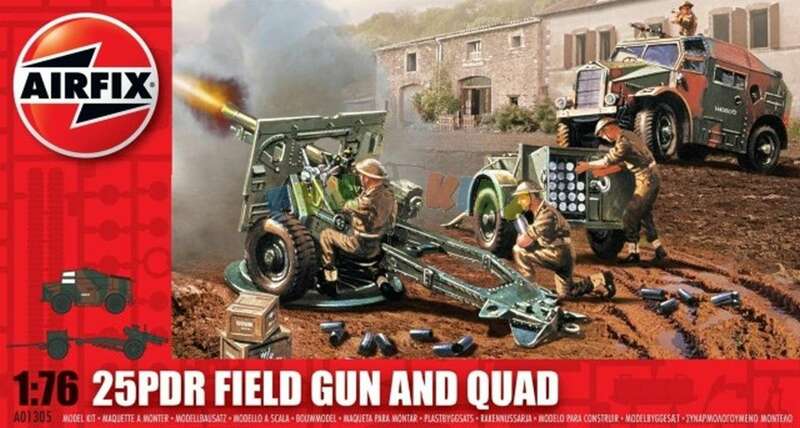 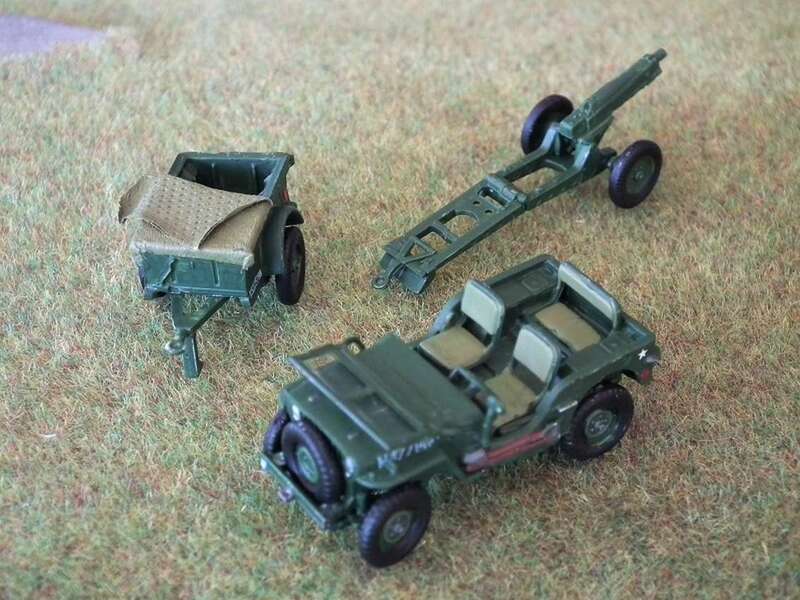 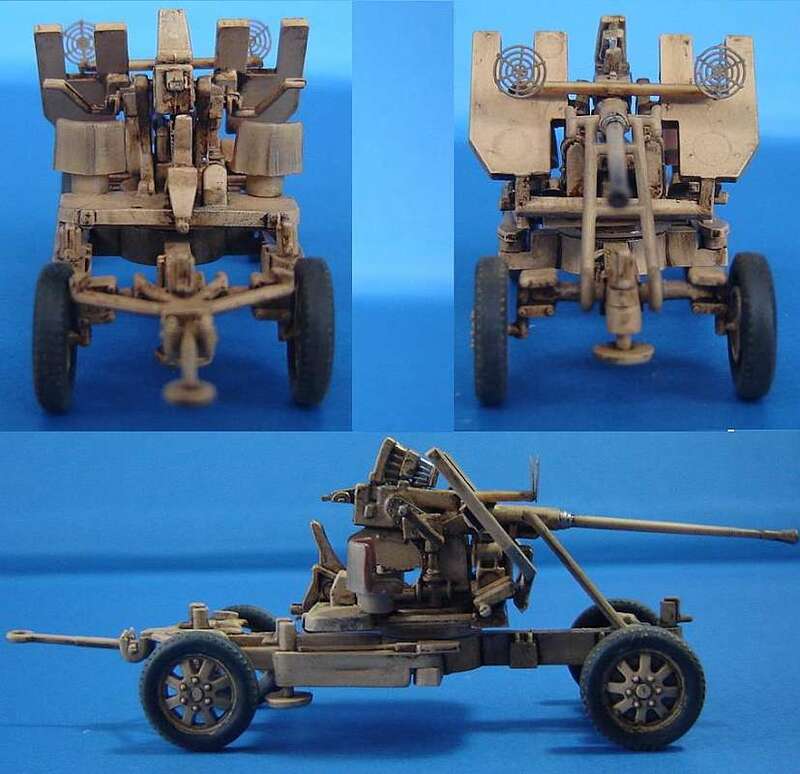 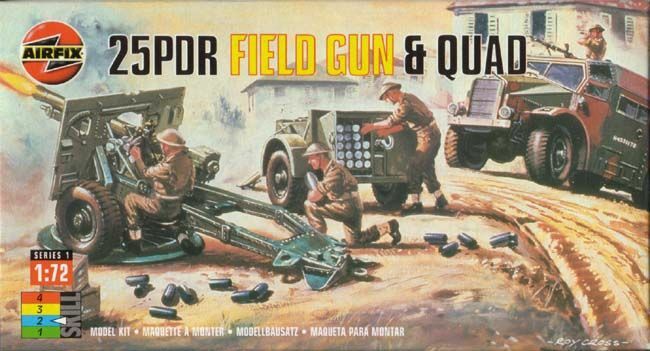 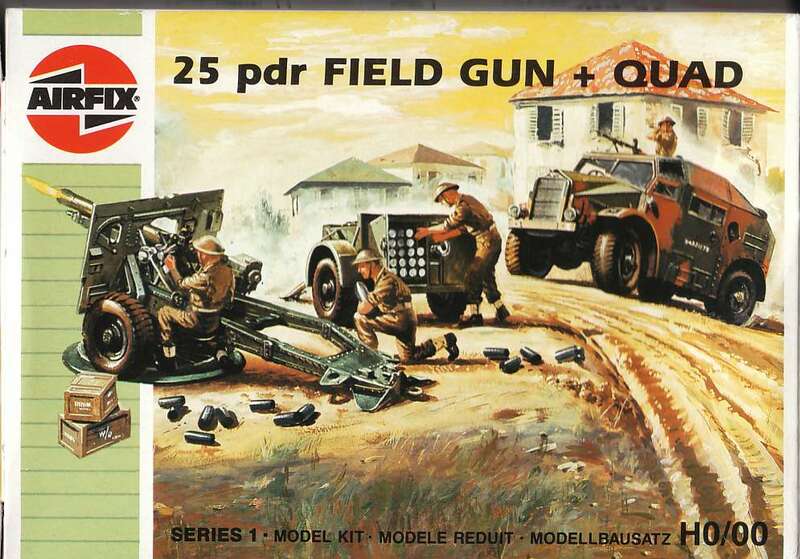 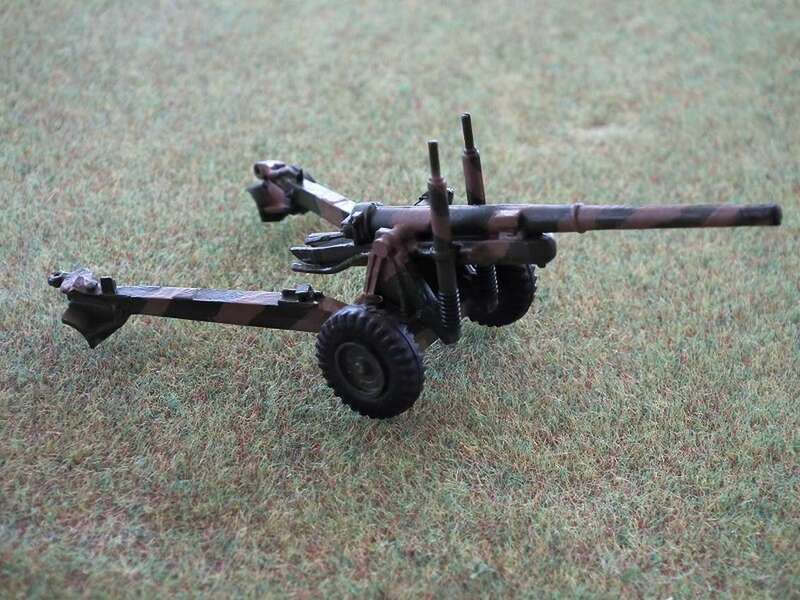 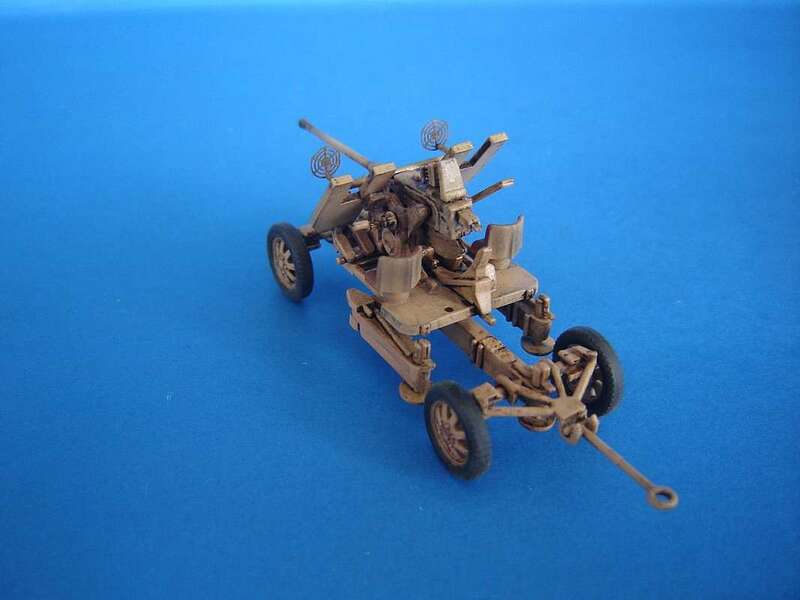 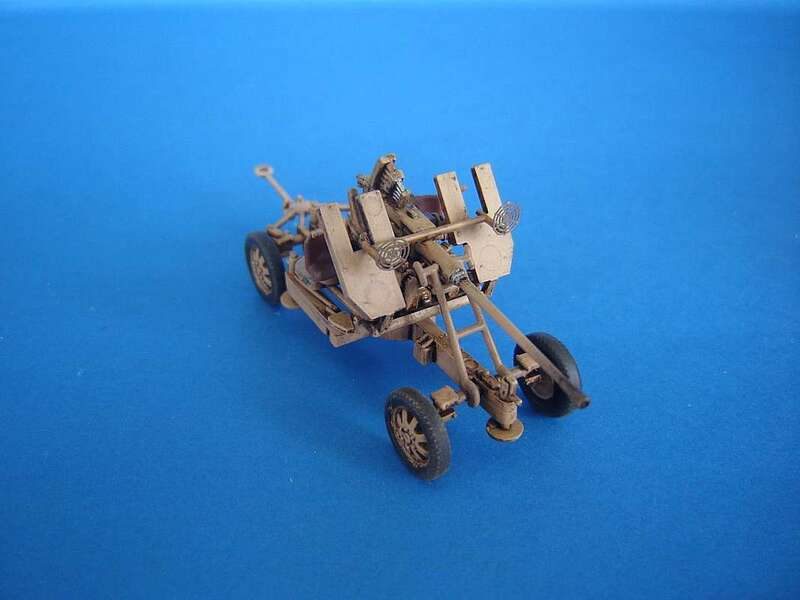 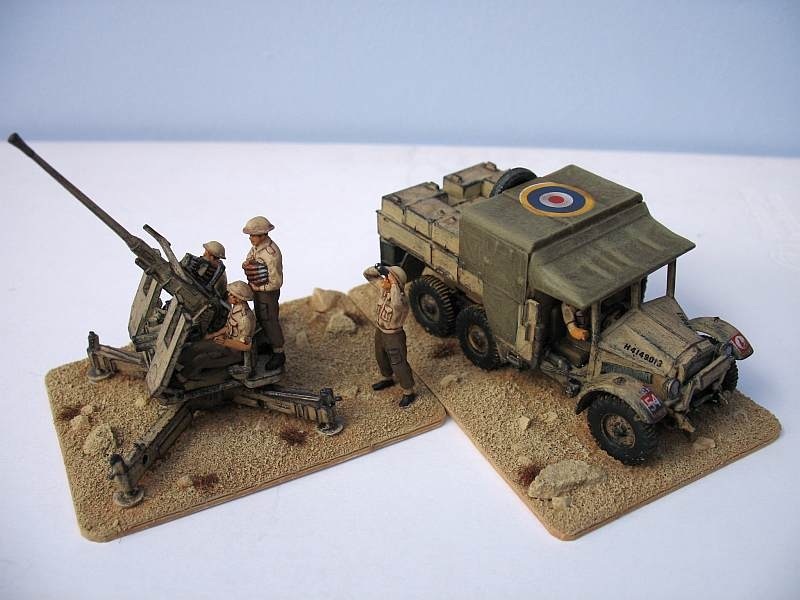 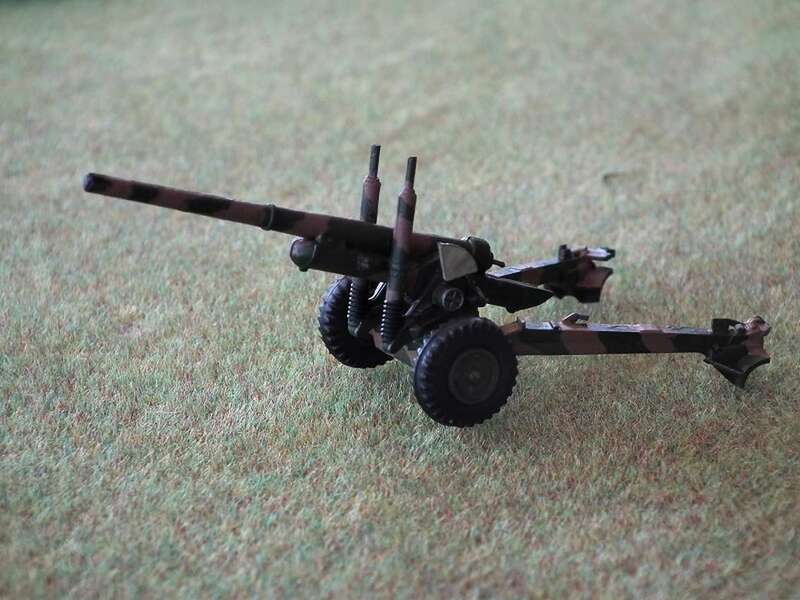 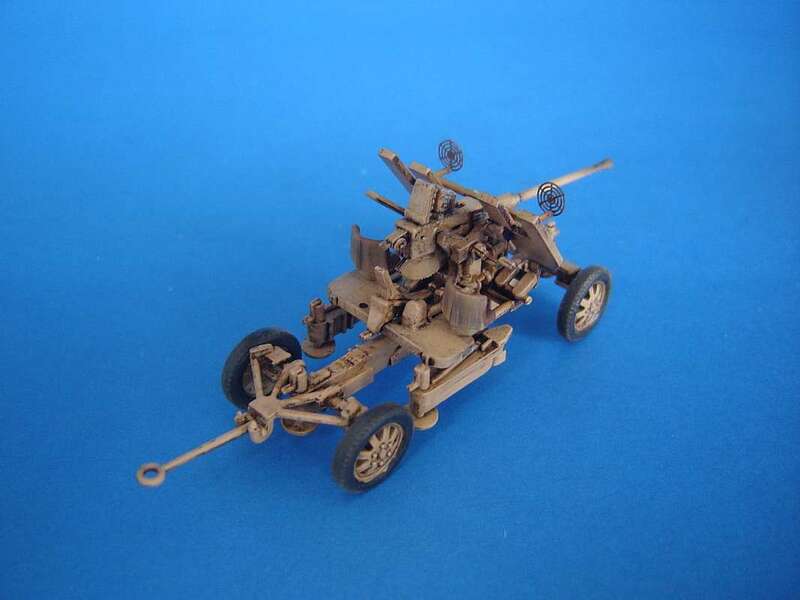 Kit 1305 25 pdr field gun and quad. 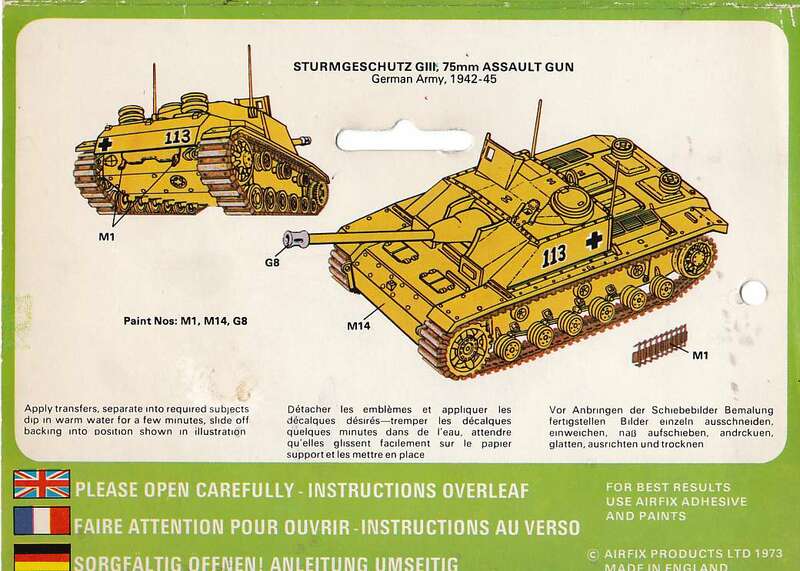 Kit 1306 German Stug III. 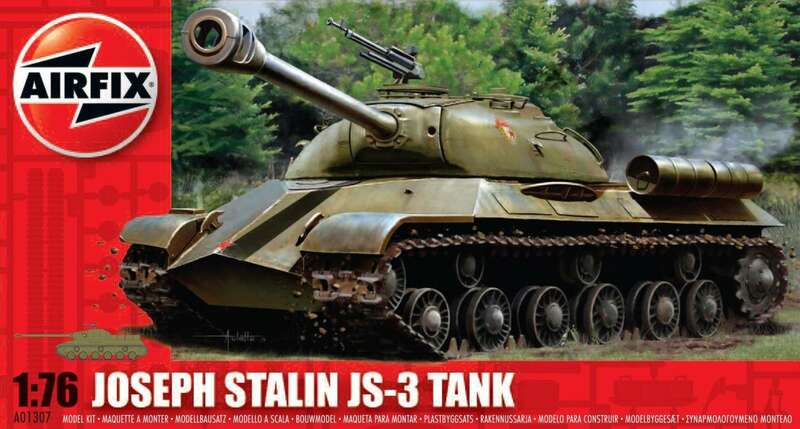 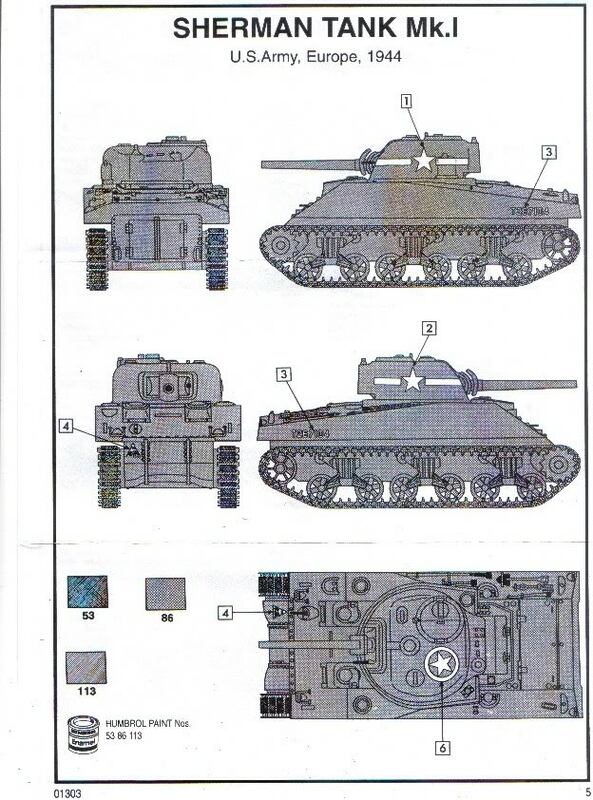 Kit 1307 JS-III Russian tank. 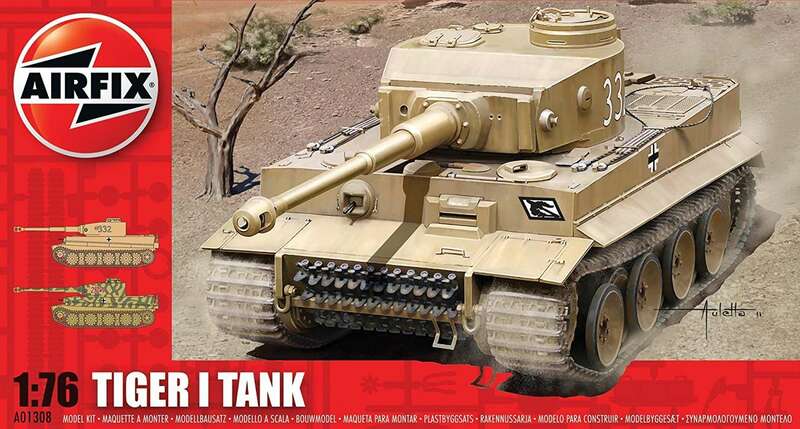 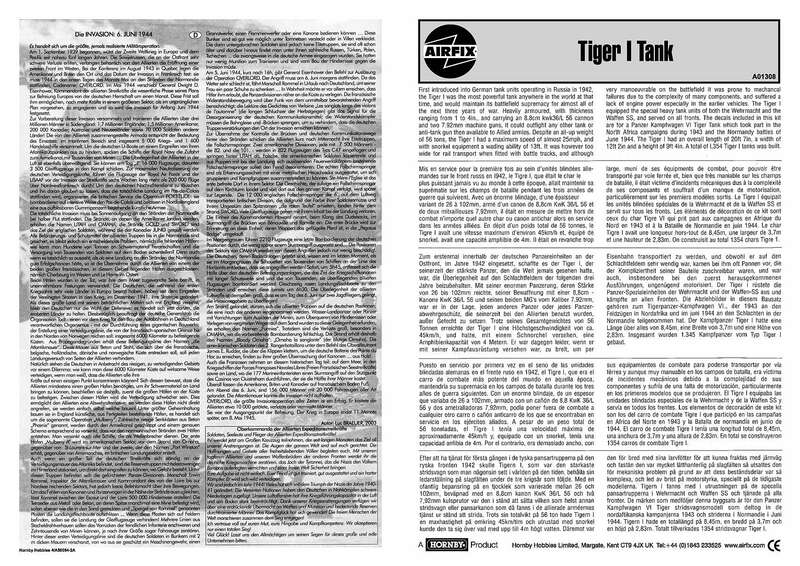 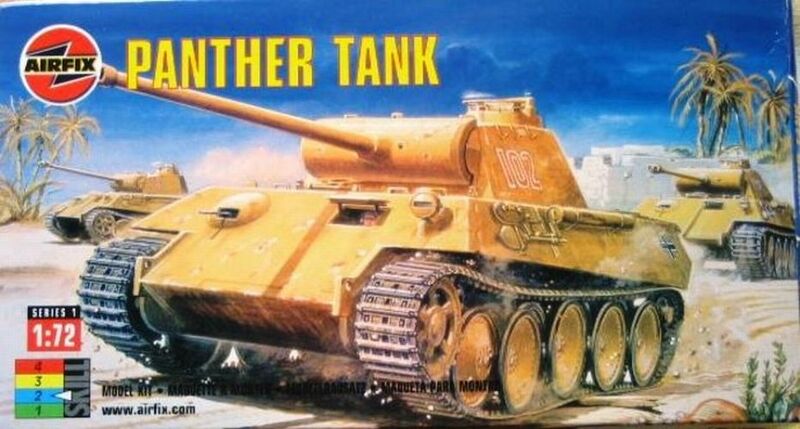 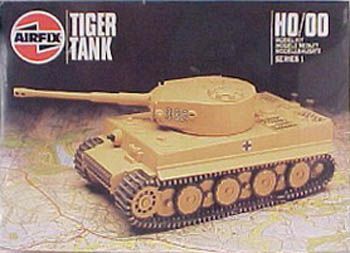 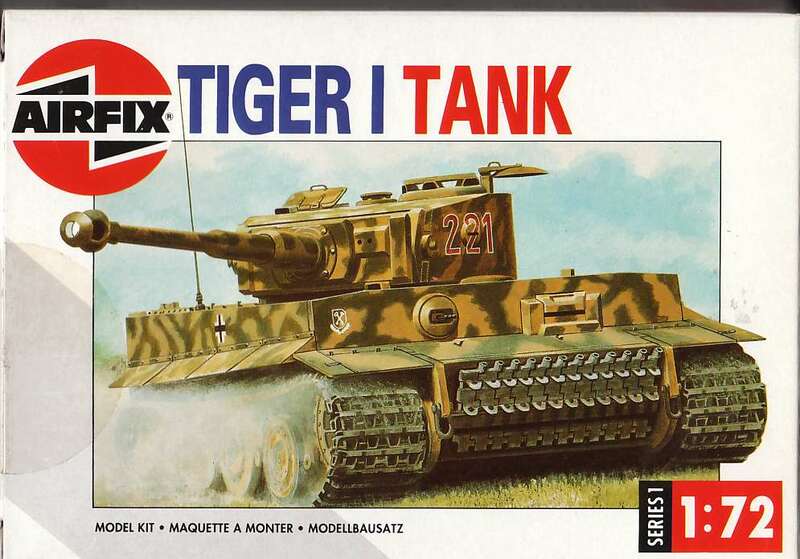 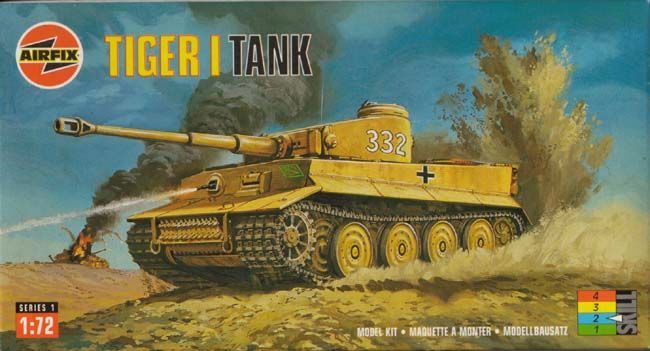 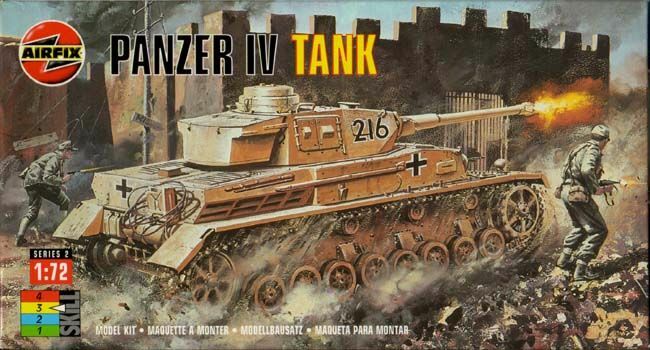 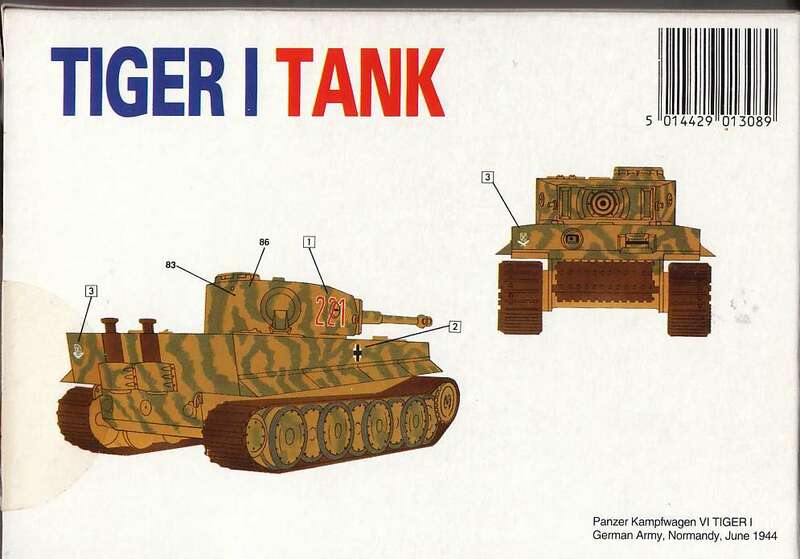 Kit 1308 German Tiger I tank. 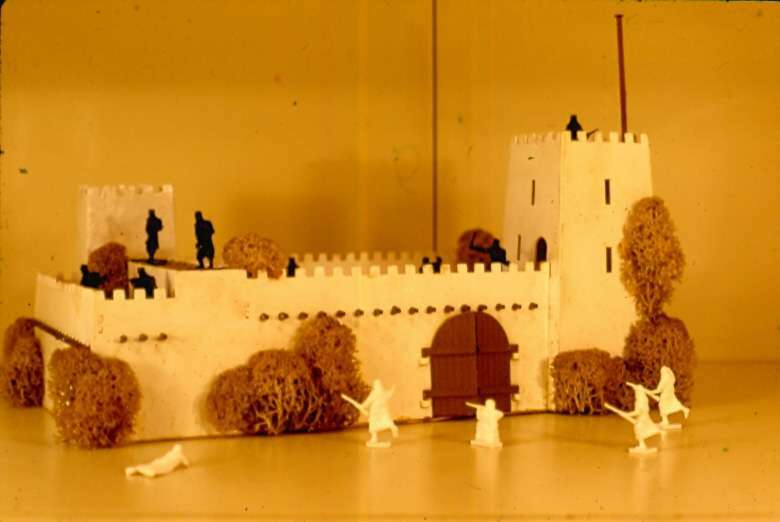 Model built by Erhan Atalay. 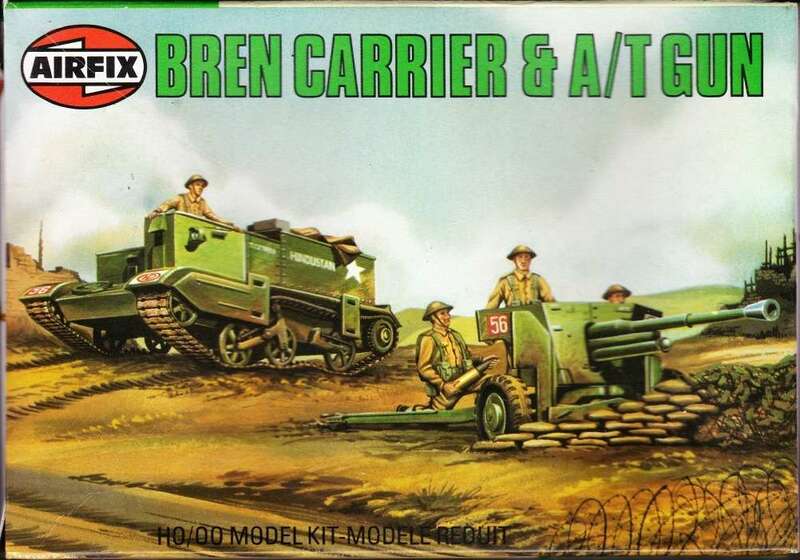 Kit 1309 bren carrier with 6 pdr anti-tank gun. 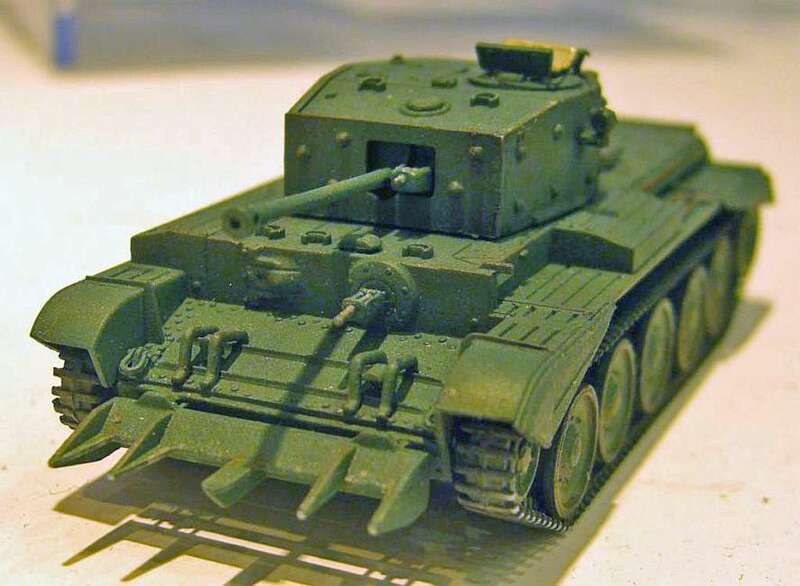 Model built by Marcin Mizielinski. 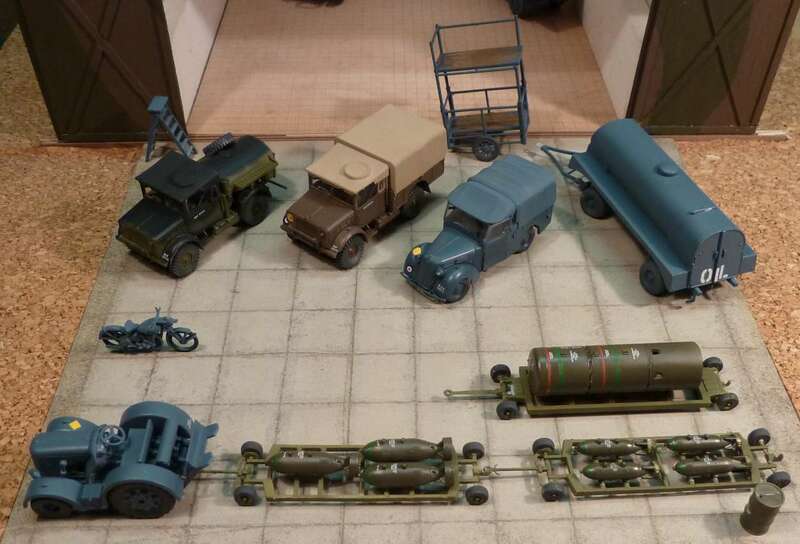 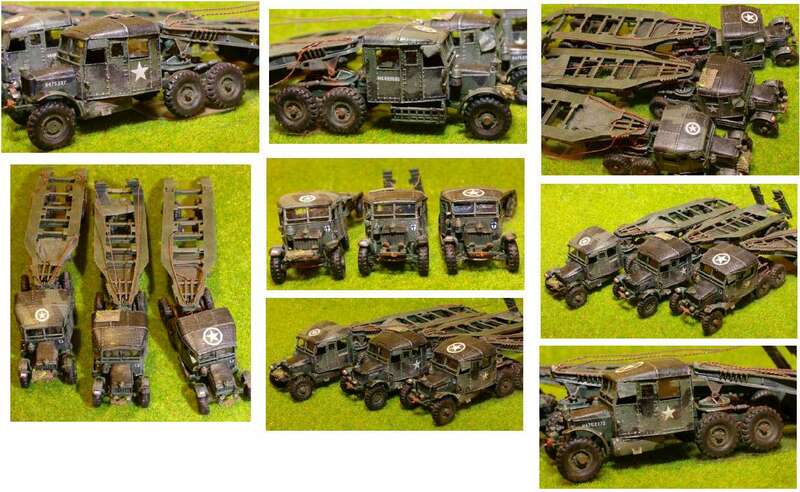 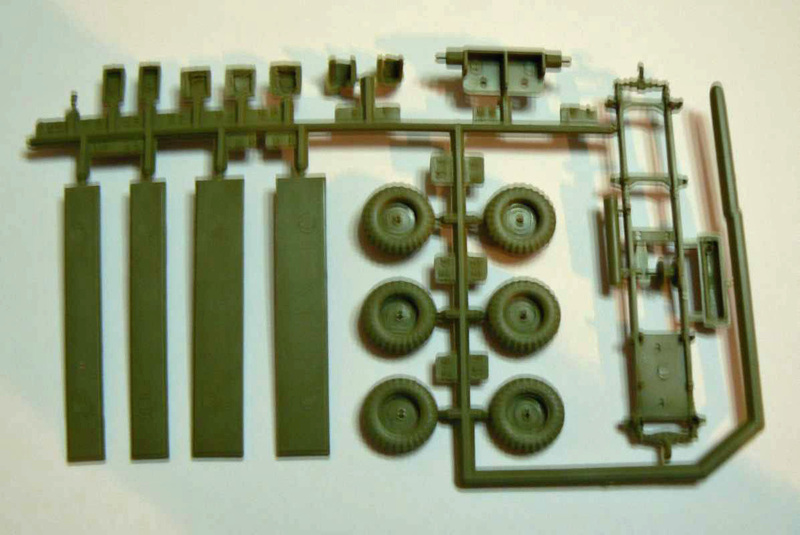 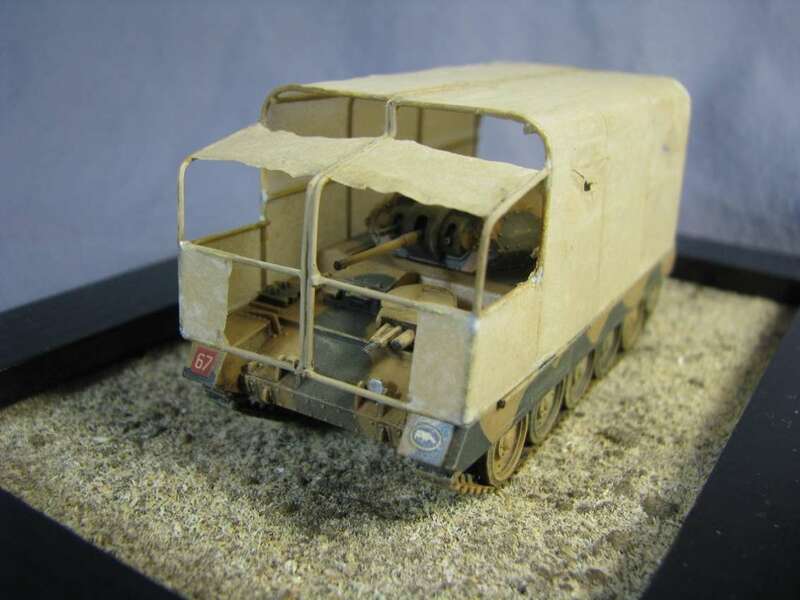 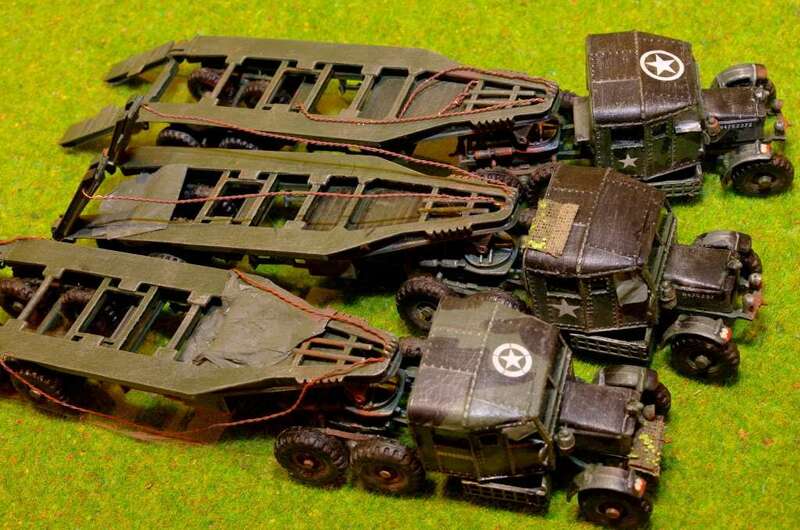 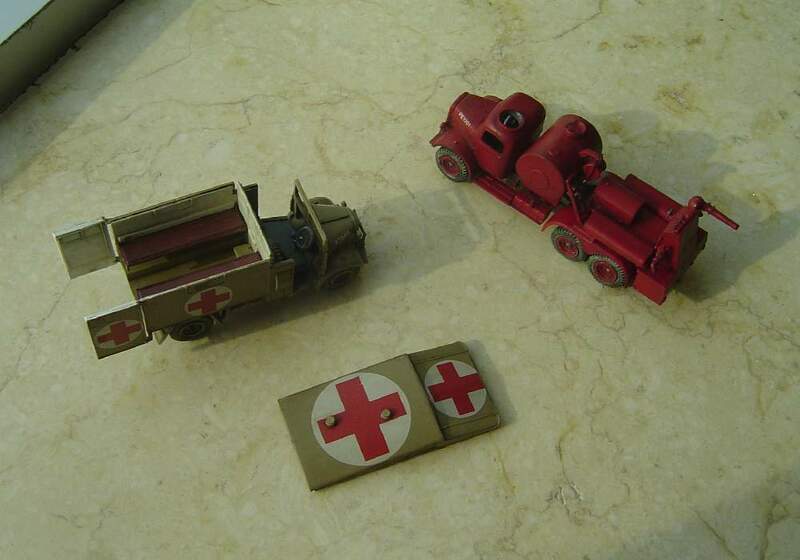 Kit 1311 8 wheeler Sdkfz 234. 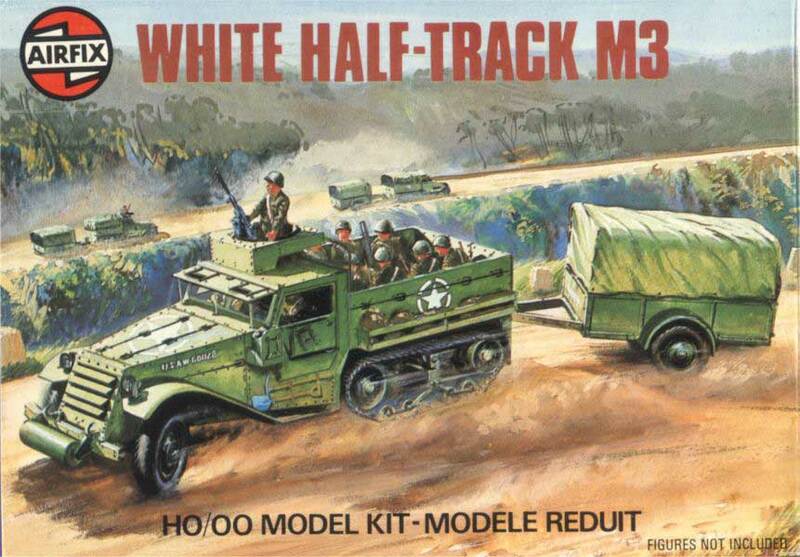 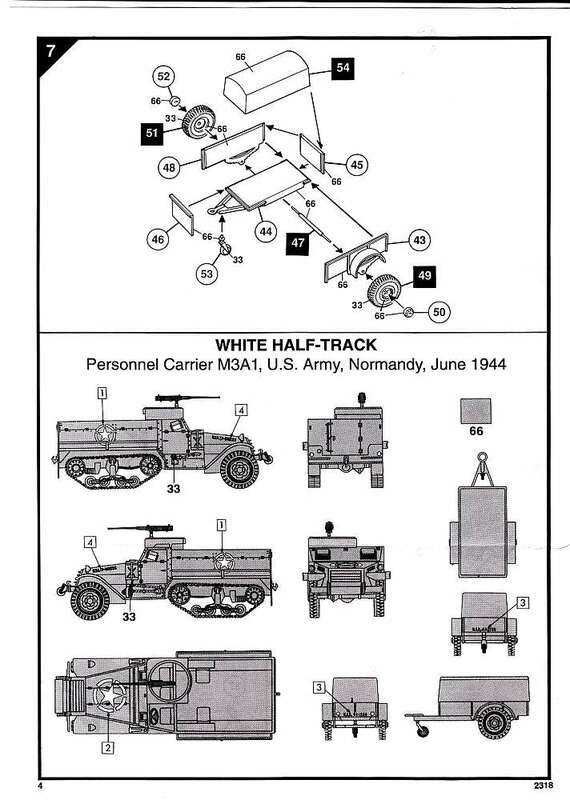 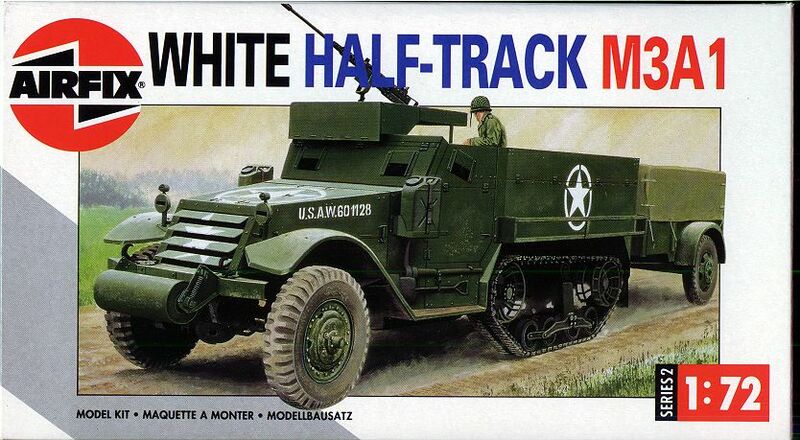 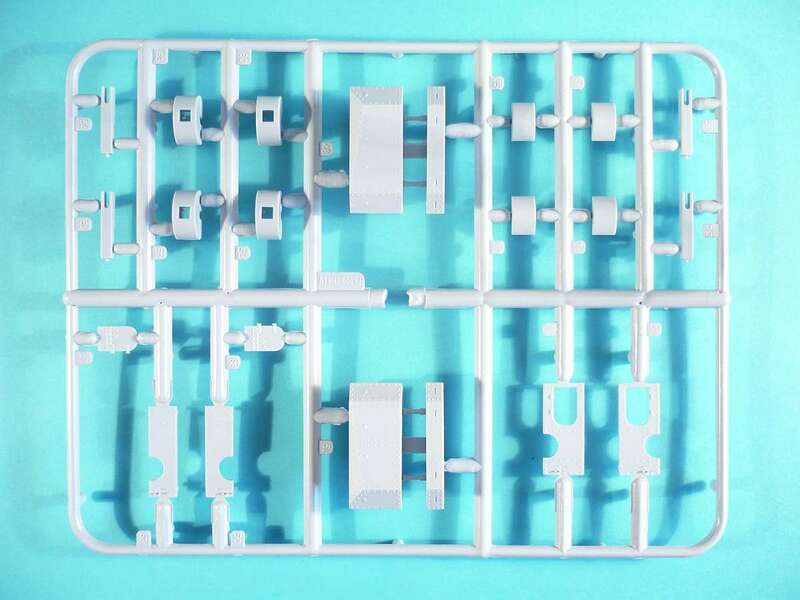 Kit 1313 White halftrack M3. 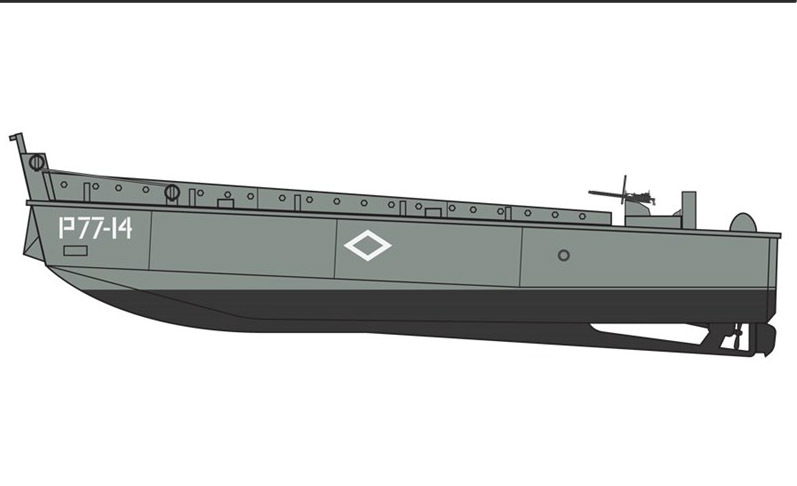 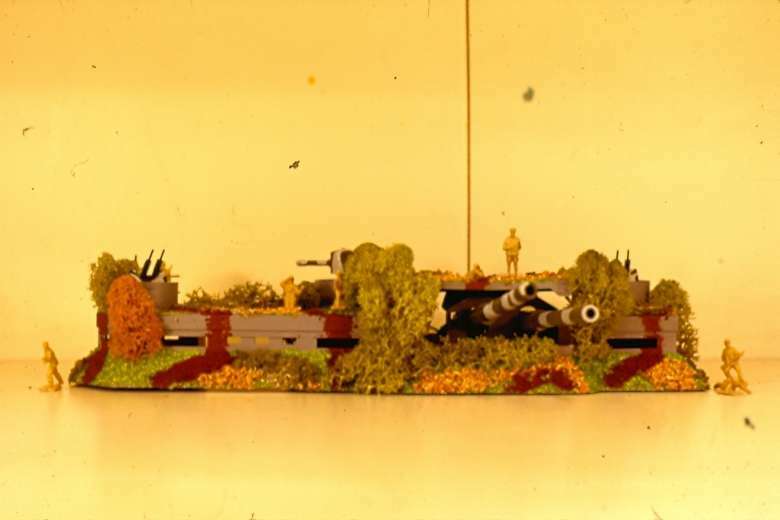 Model built by Laszlo Szasz. 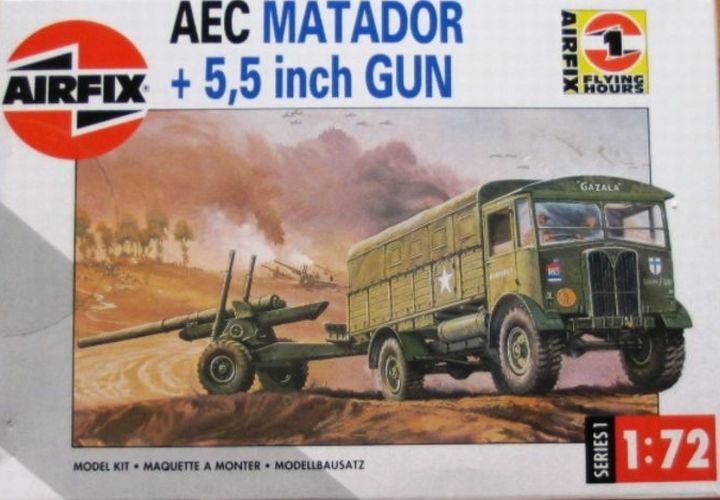 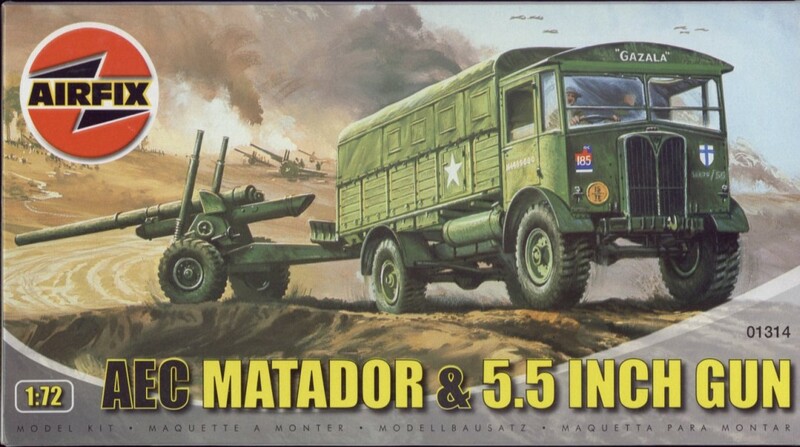 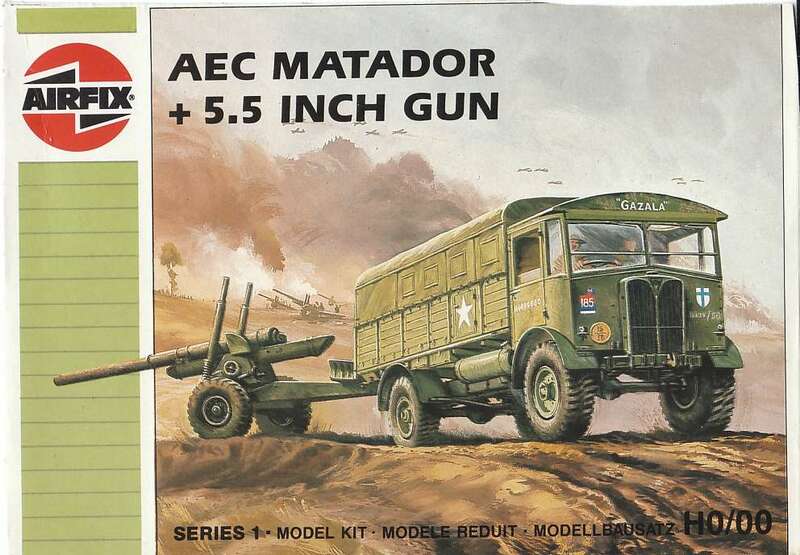 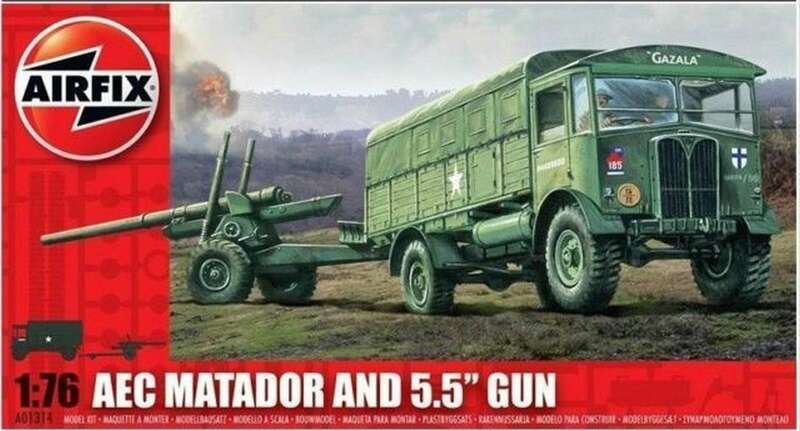 Kit 1314 AEC Matador with 5.5 inch gun. 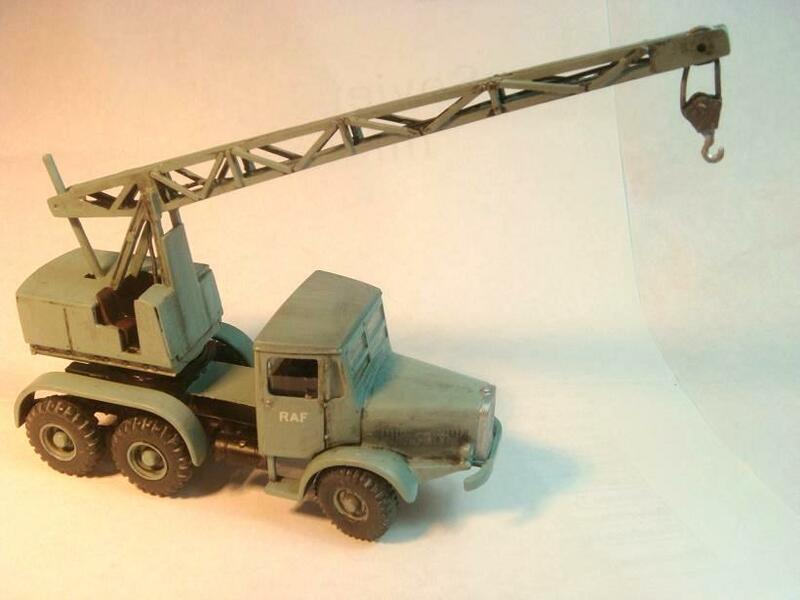 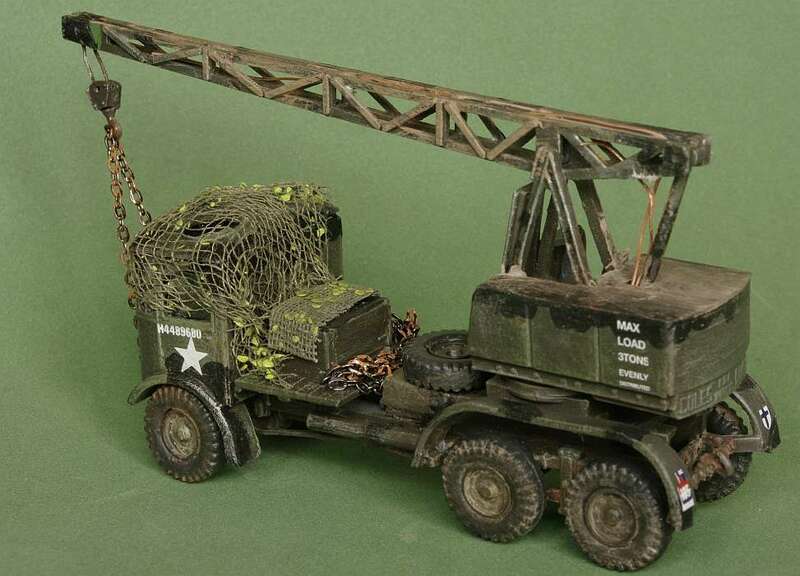 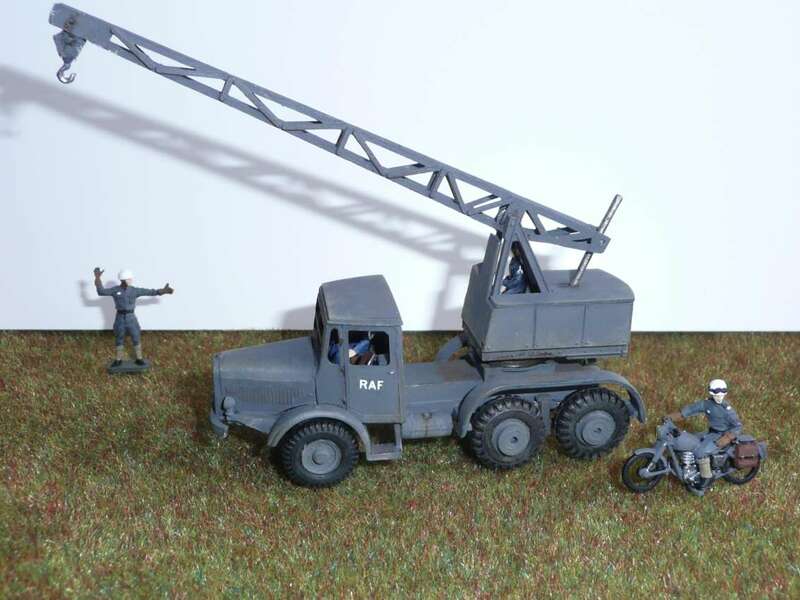 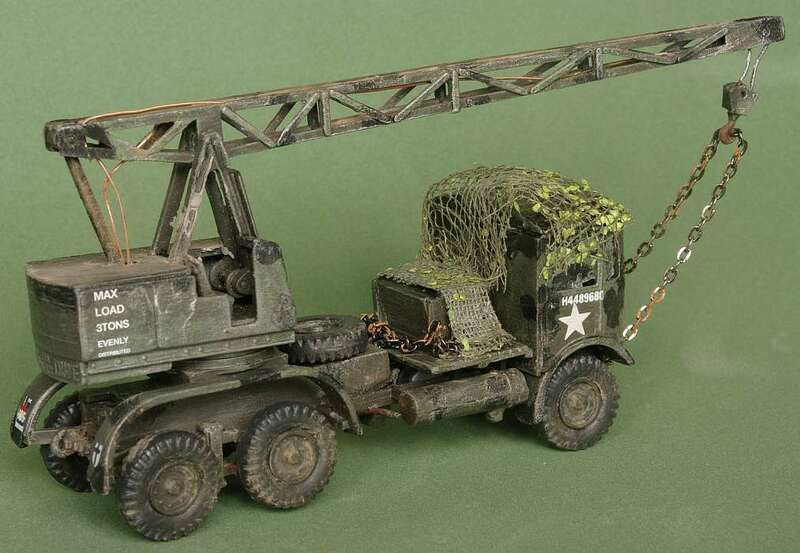 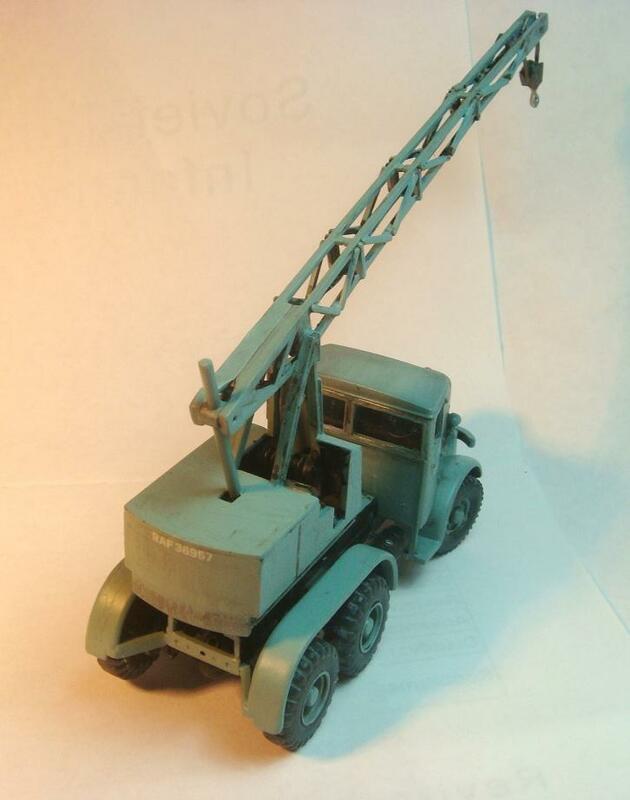 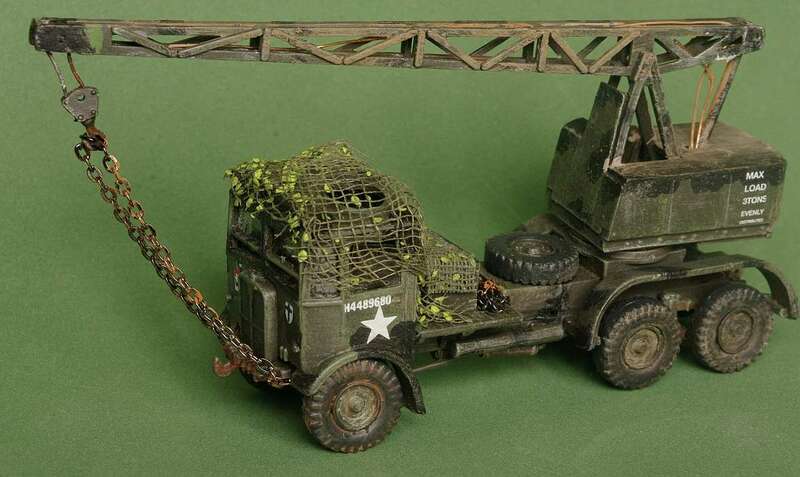 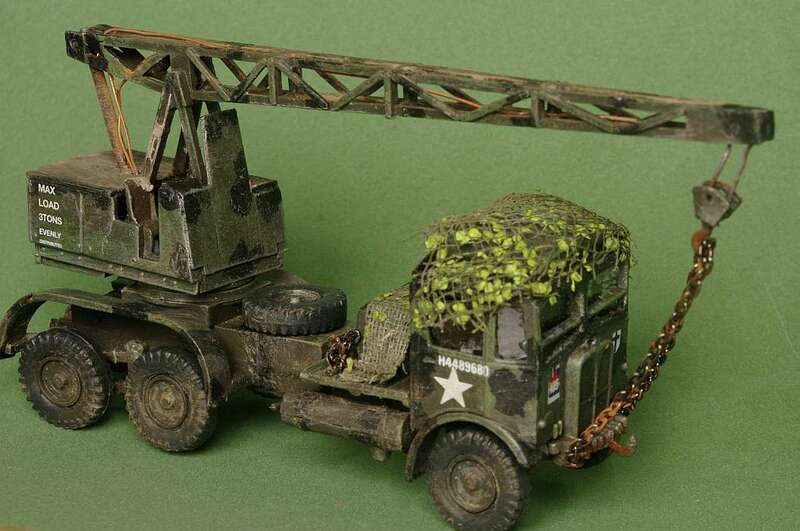 Model built by Mick Hill - Matador variant with Coles crane. 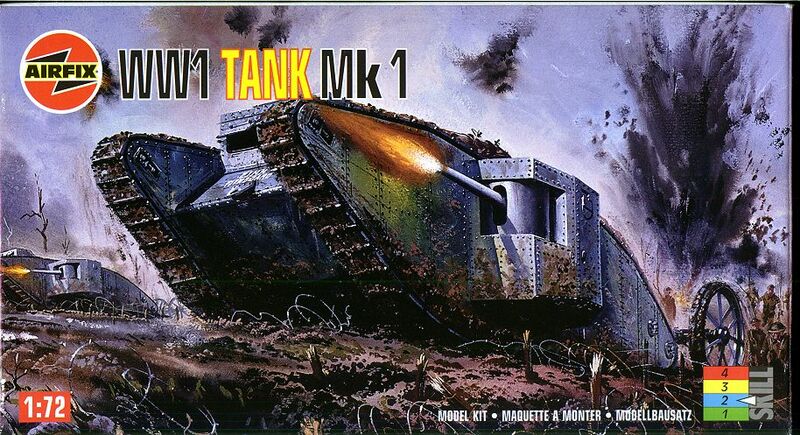 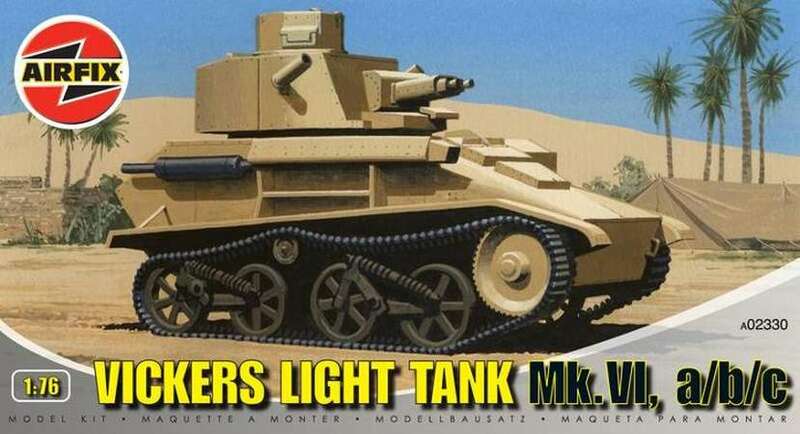 Kit 1315 WW-I MK-1 tank. 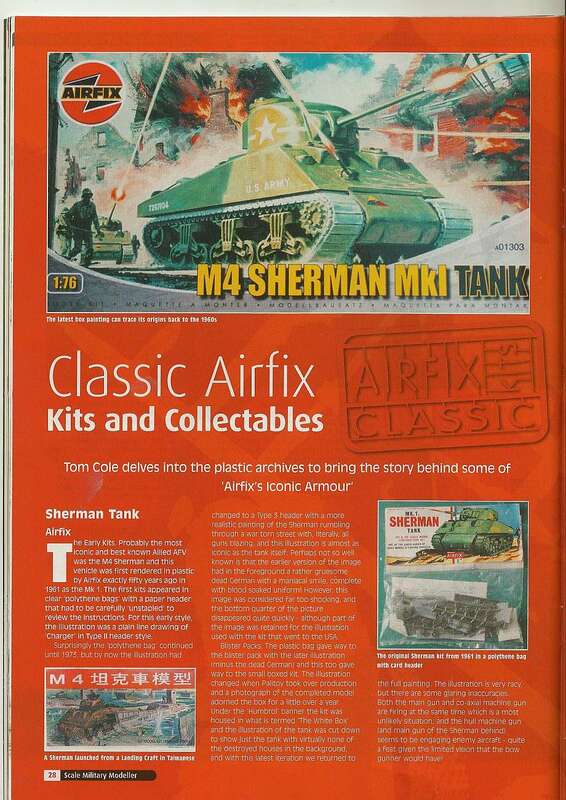 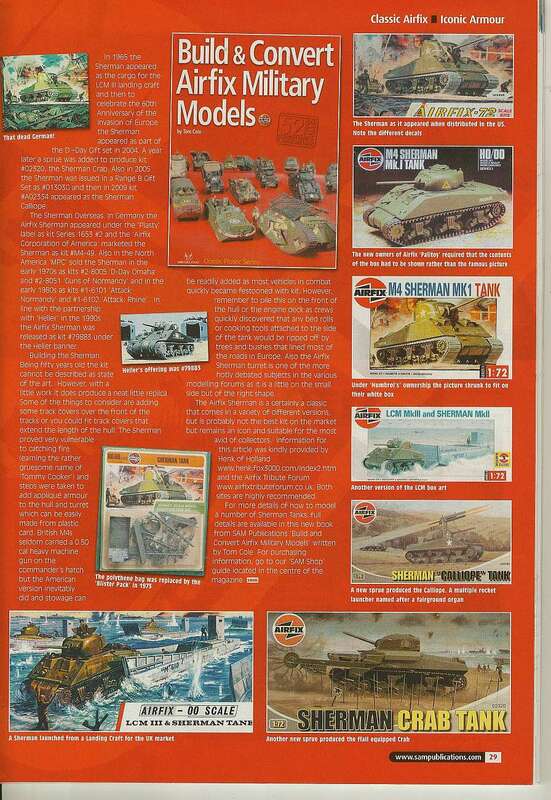 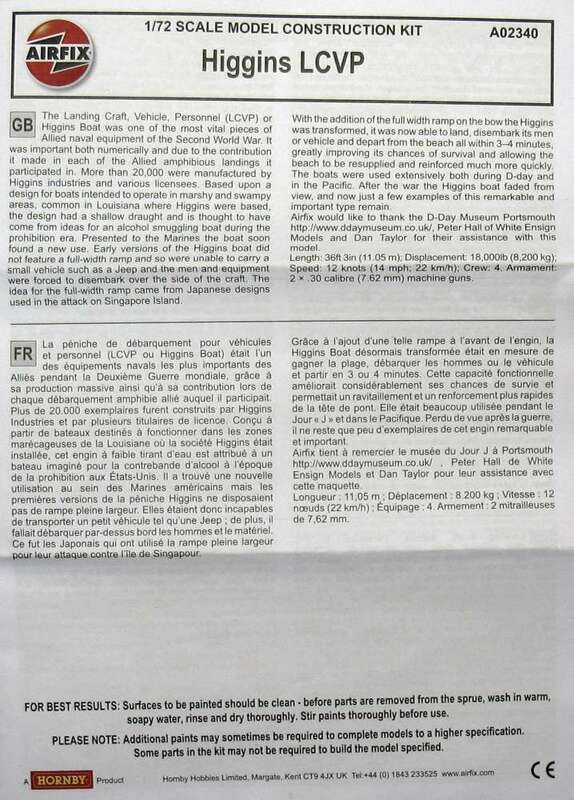 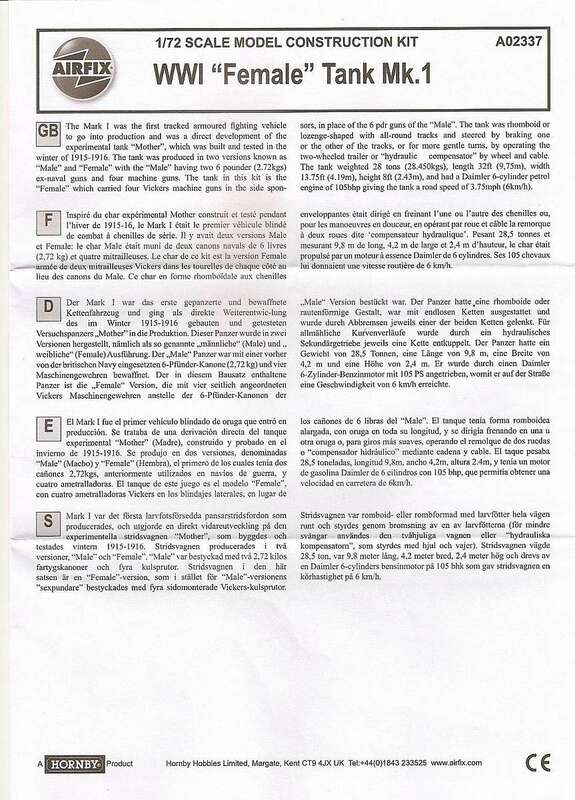 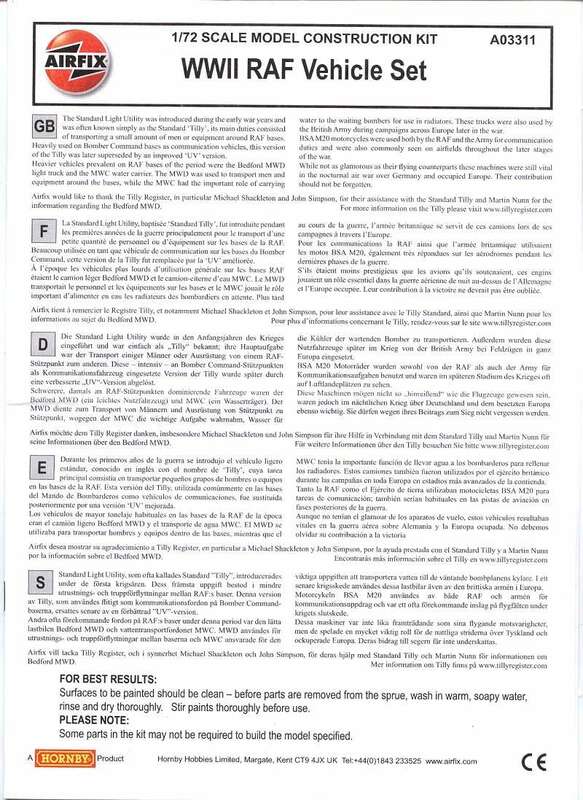 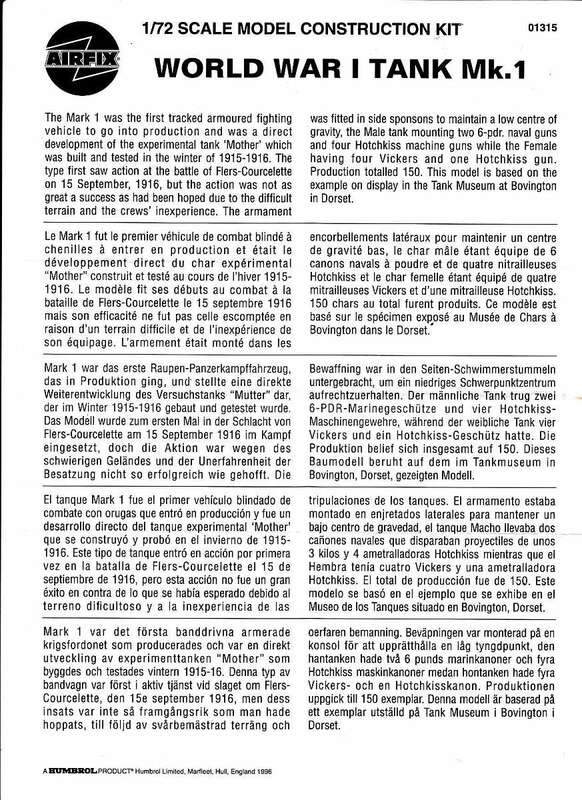 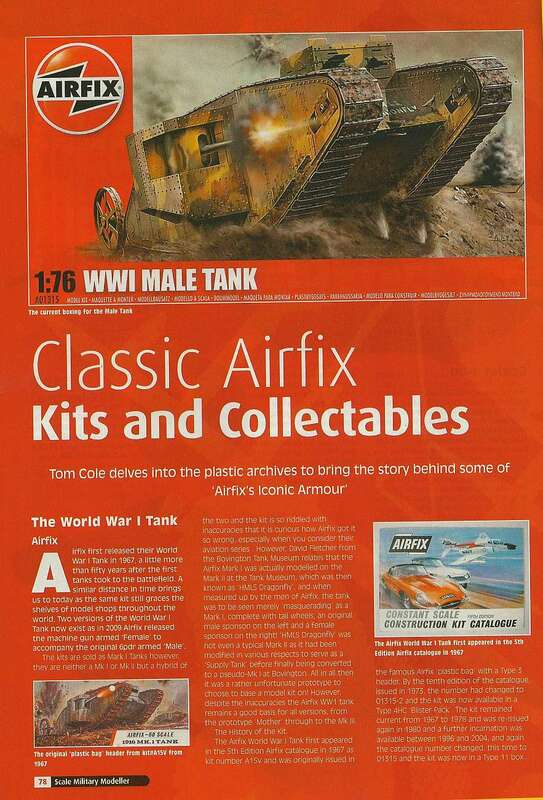 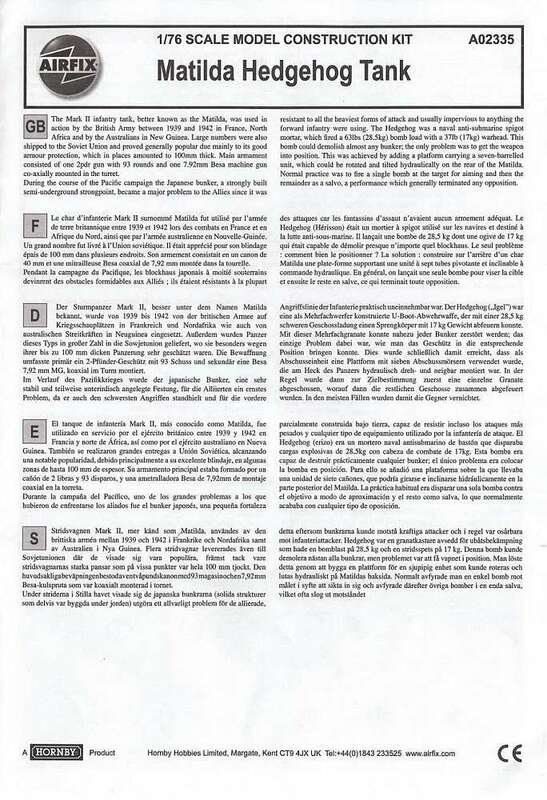 'MiniAfv' Blogspot April 2011 issue of 'Scale Military Modeller' - article 'Airfix Sherman History' by Tom Cole. 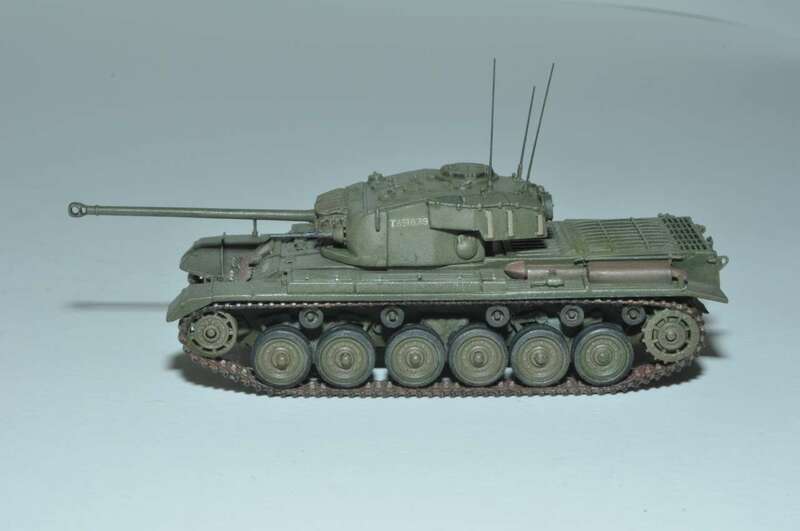 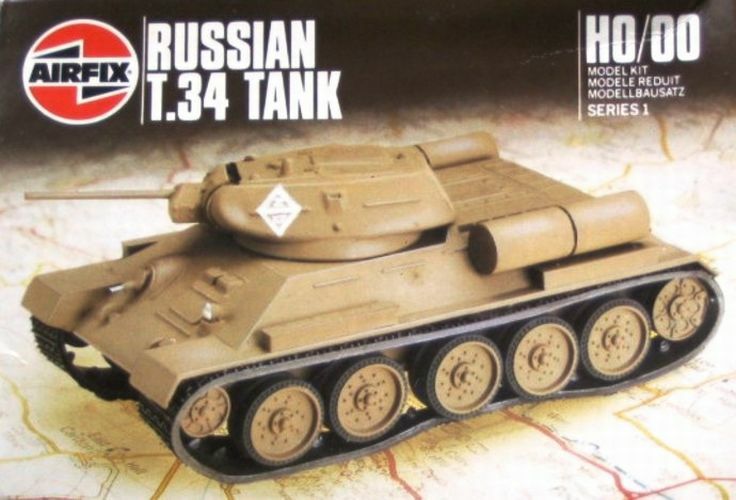 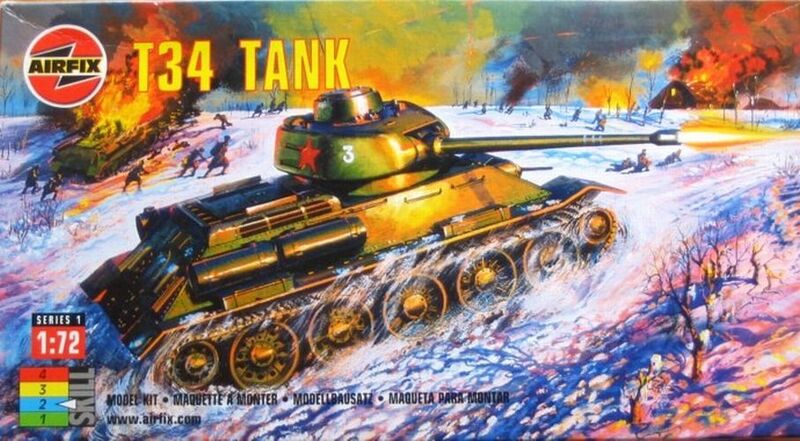 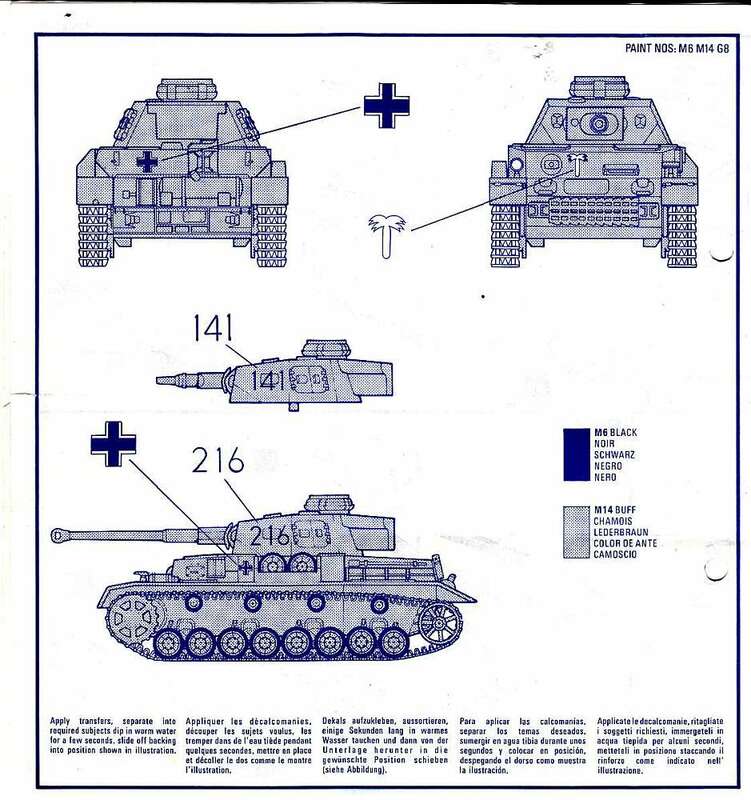 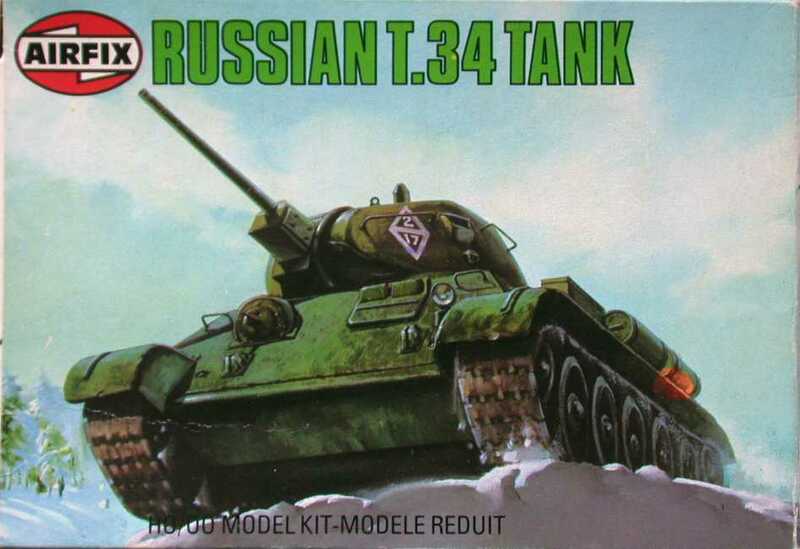 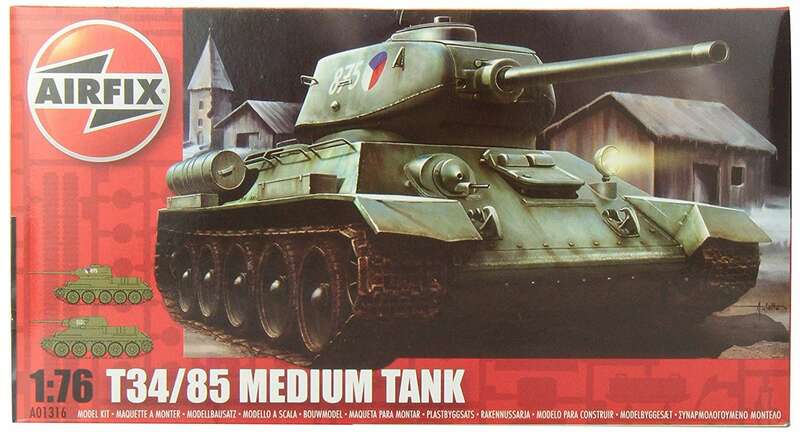 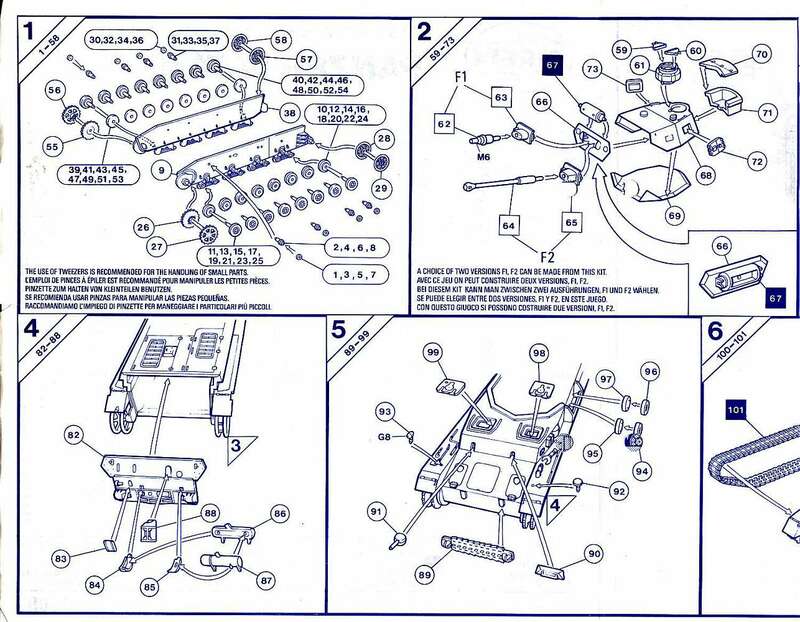 Kit 1316 Russian T34/76-85 tank. 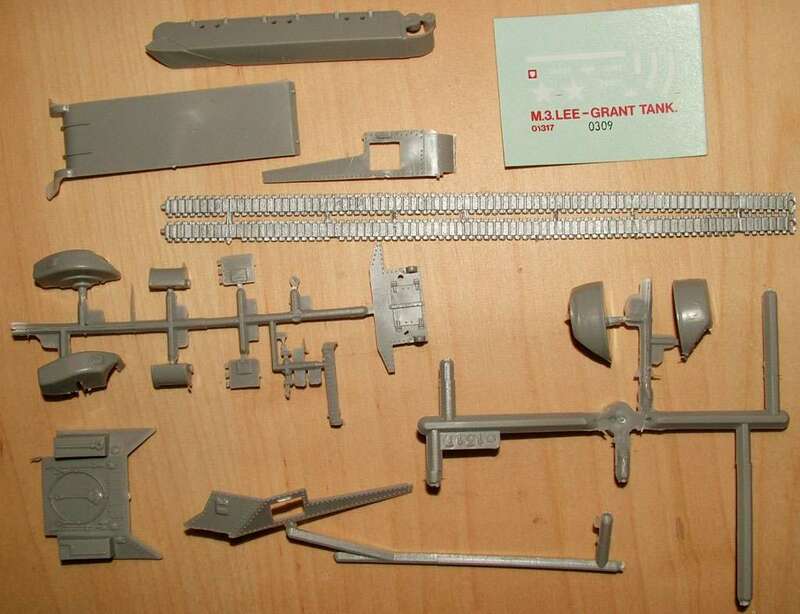 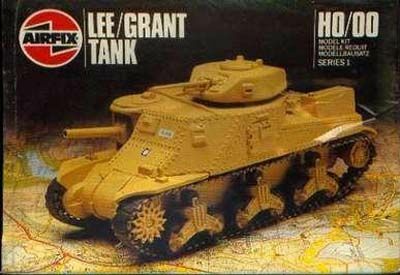 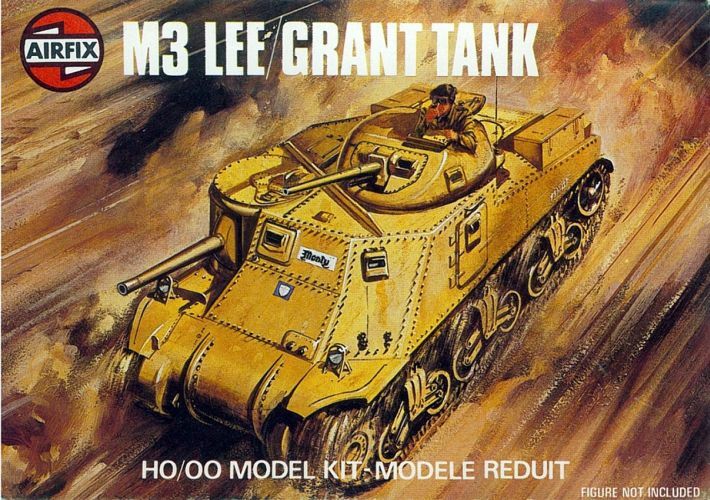 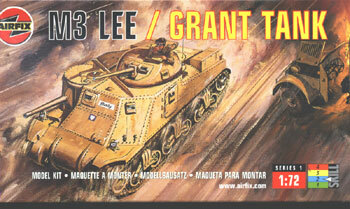 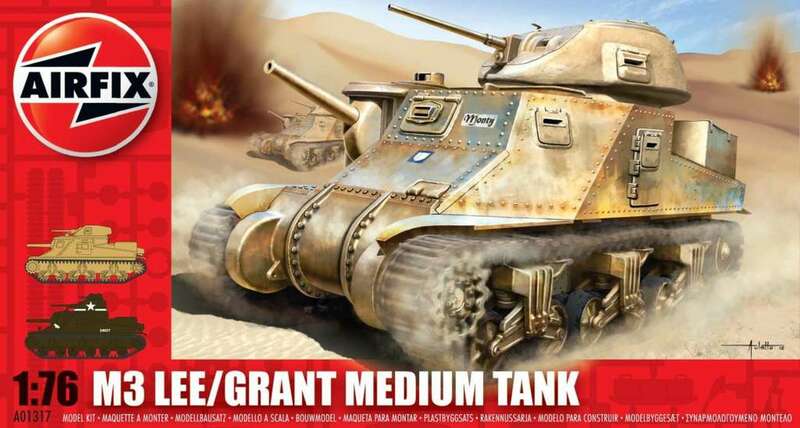 Kit 1317 M3 Grant/Lee tank. 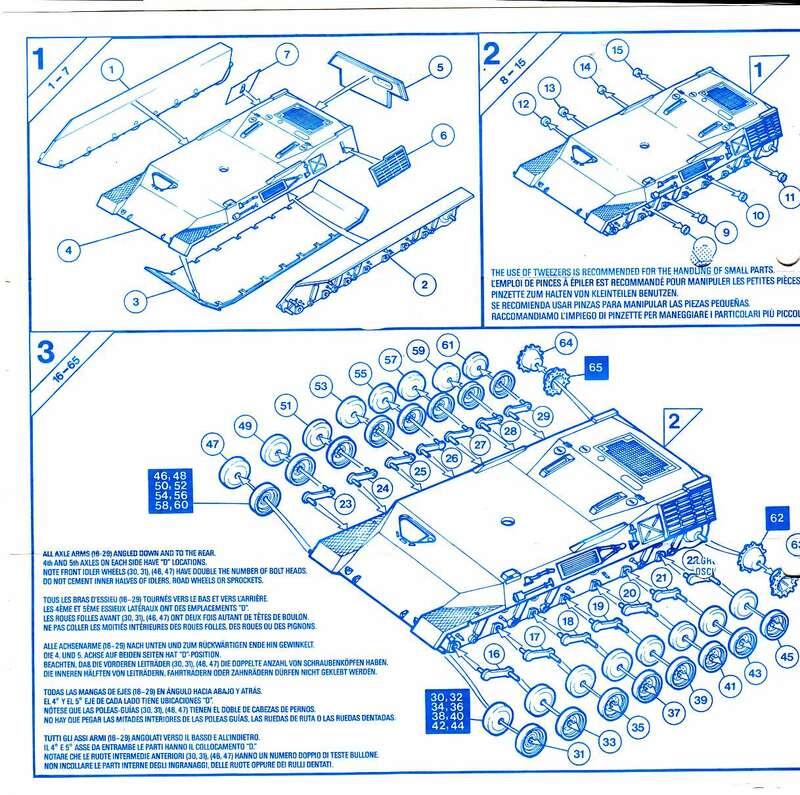 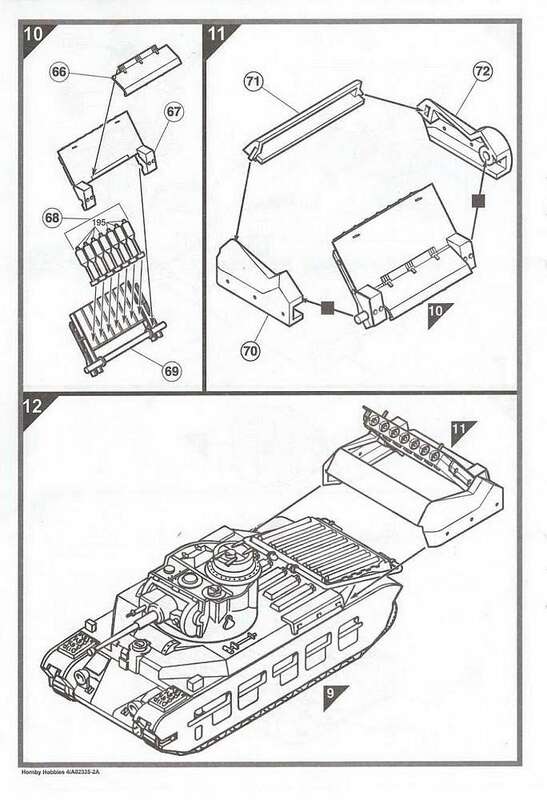 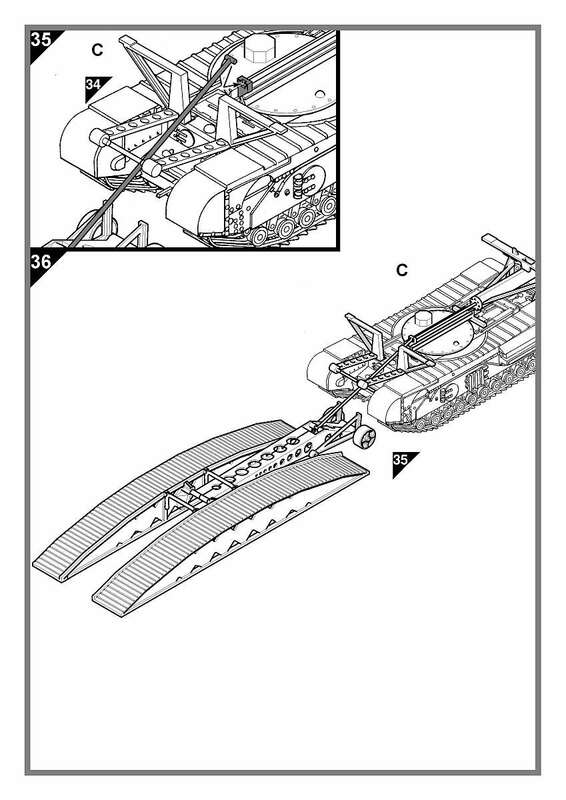 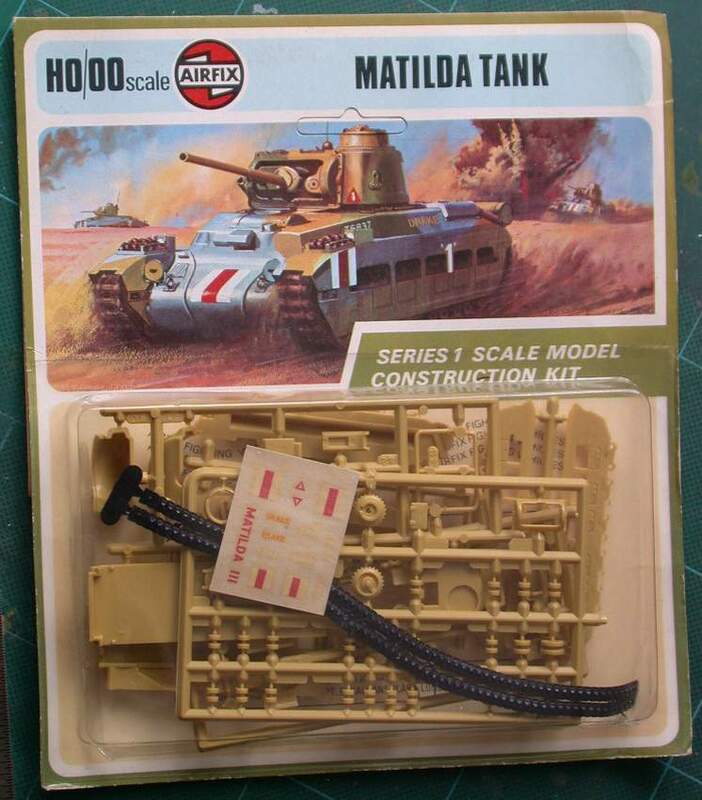 Kit 1318 Matilda II tank. 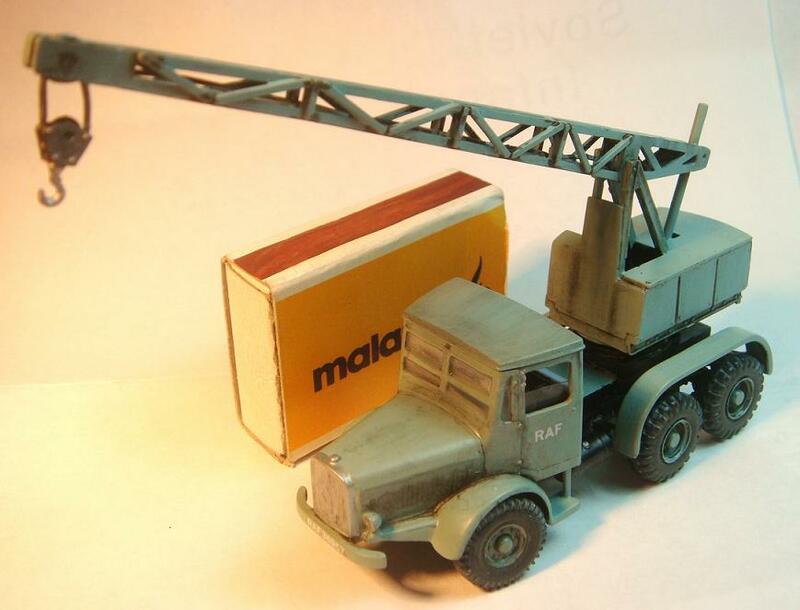 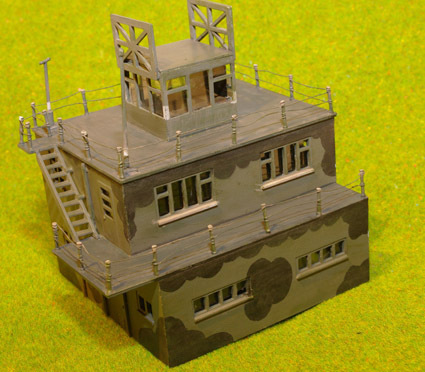 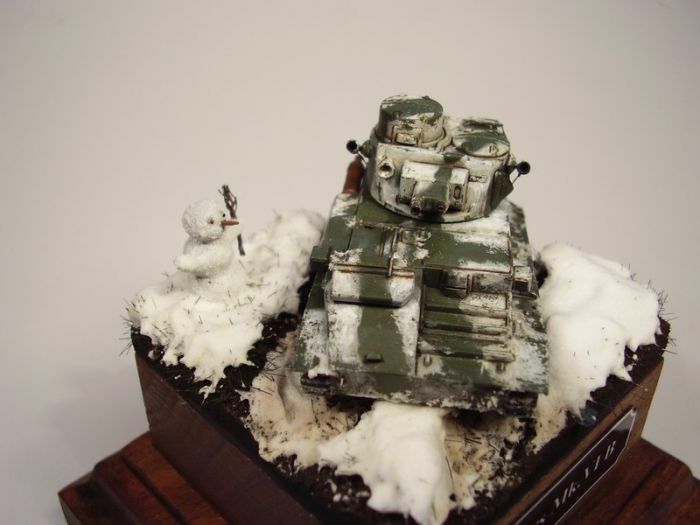 Model built by Brett Mahoney - Matilda in Russian service. 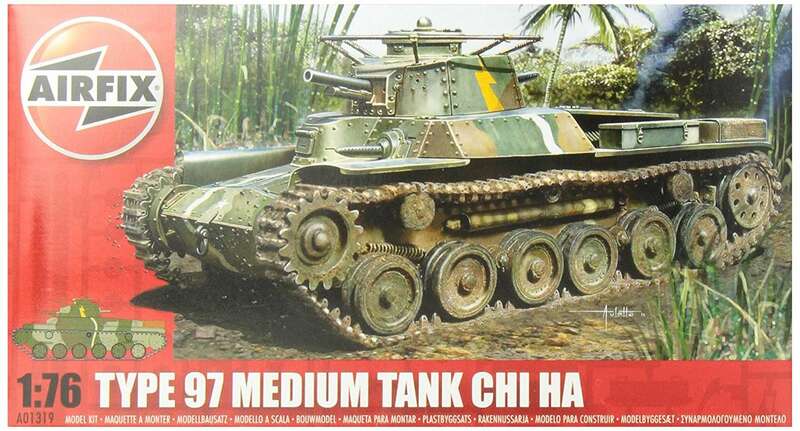 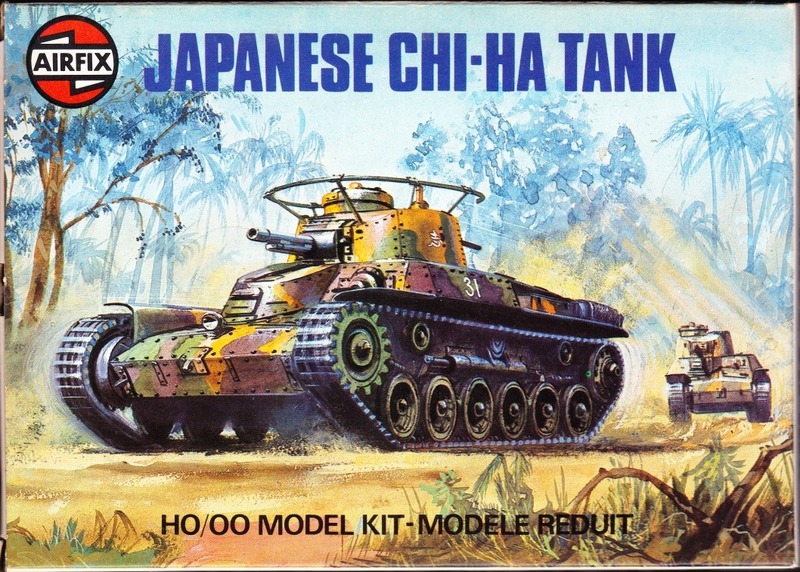 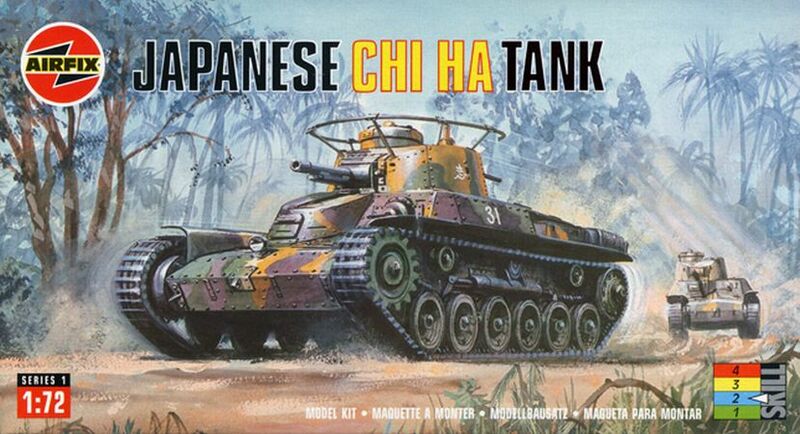 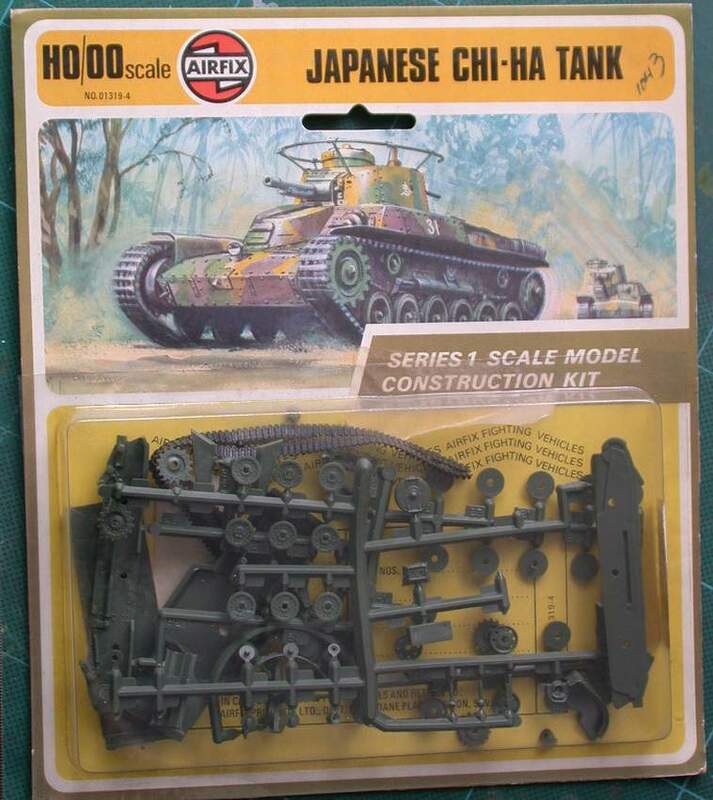 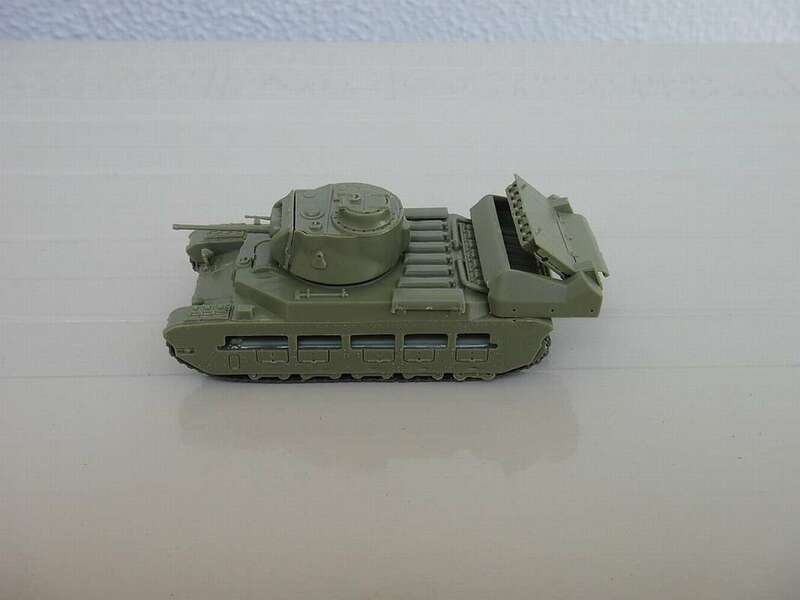 Kit 1319 Japanse Chi-Ha tank. 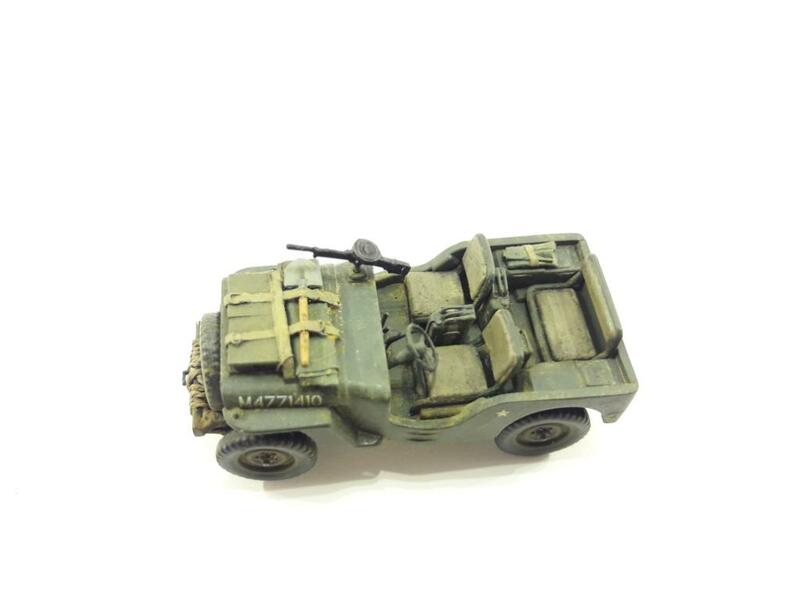 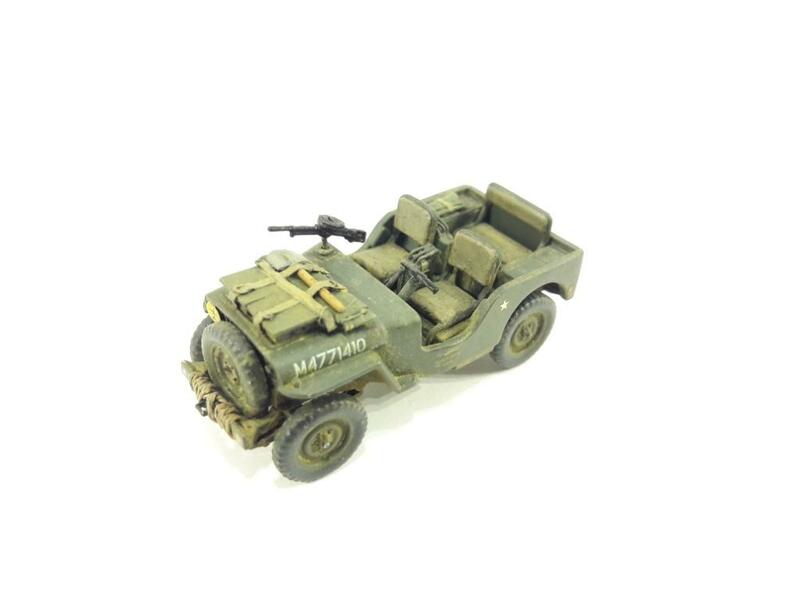 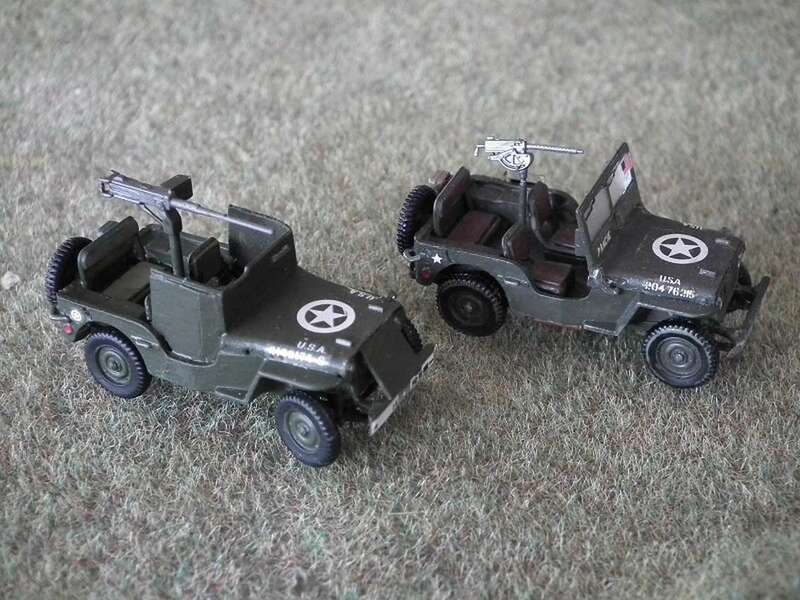 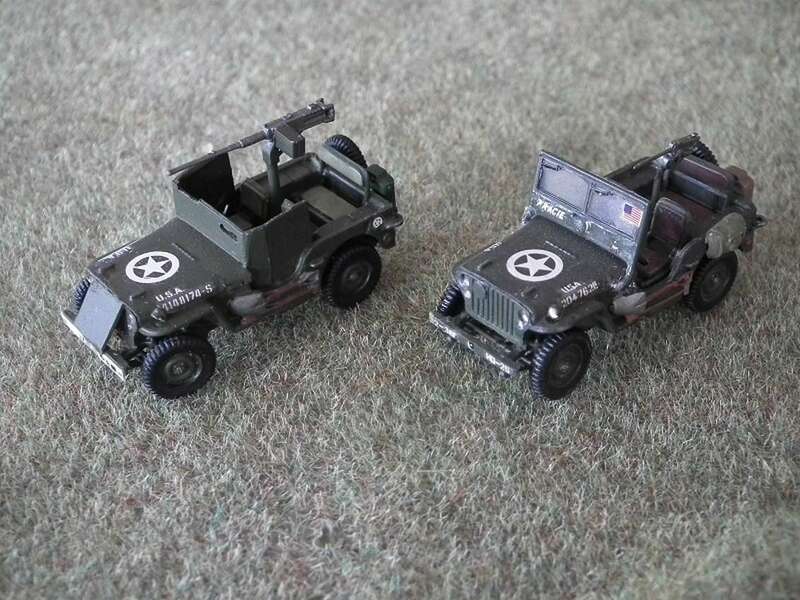 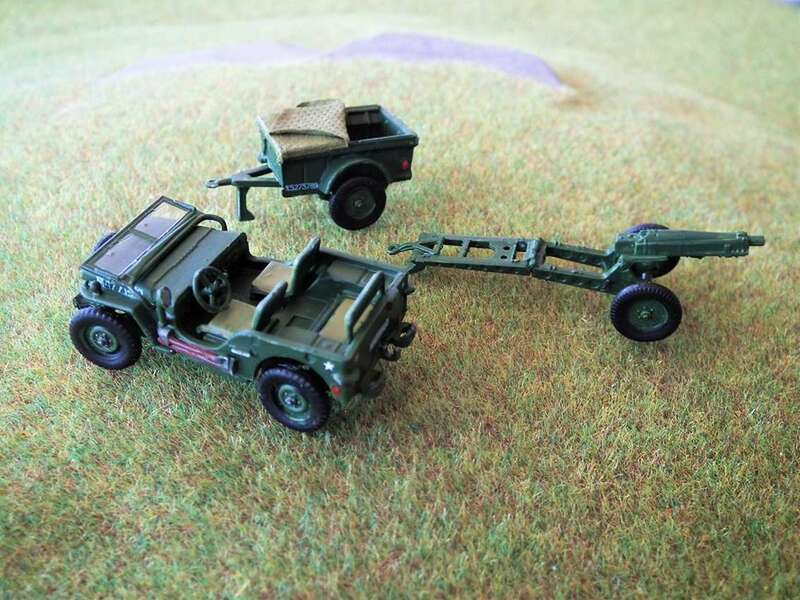 Kit 1322 Willys Jeep with trailer. 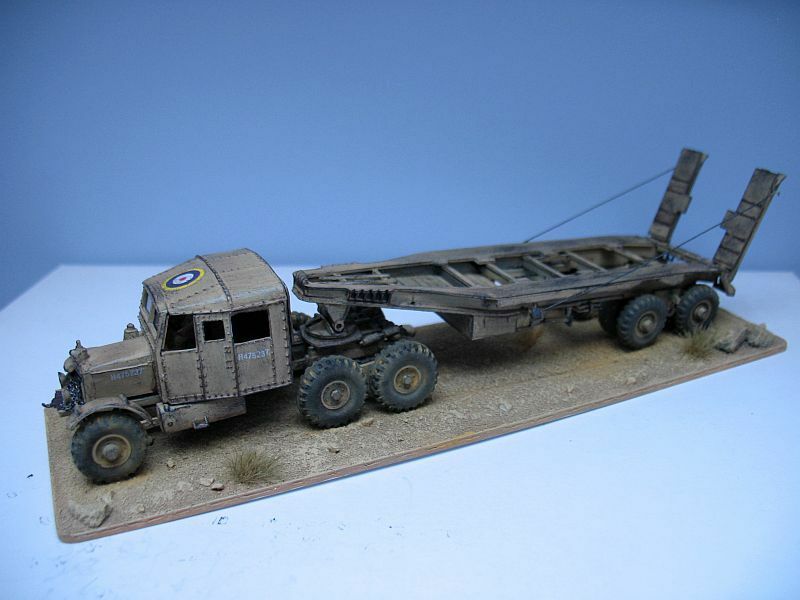 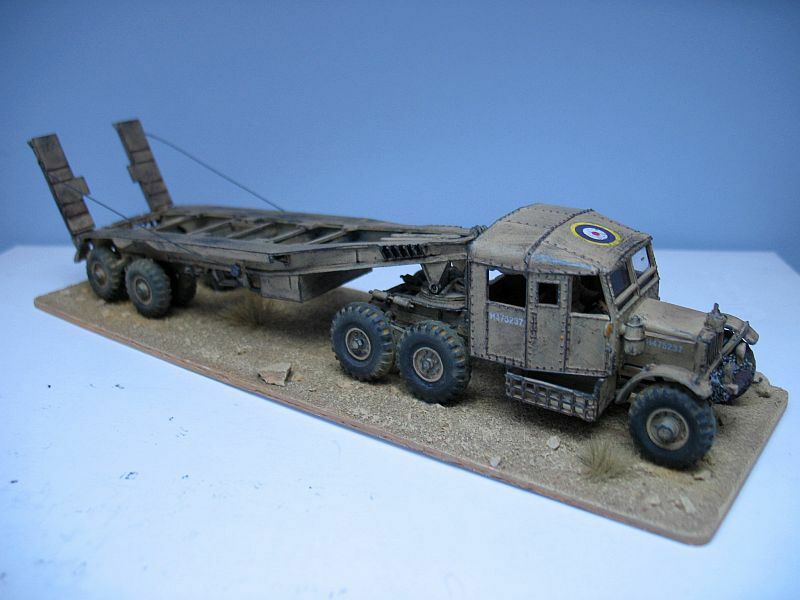 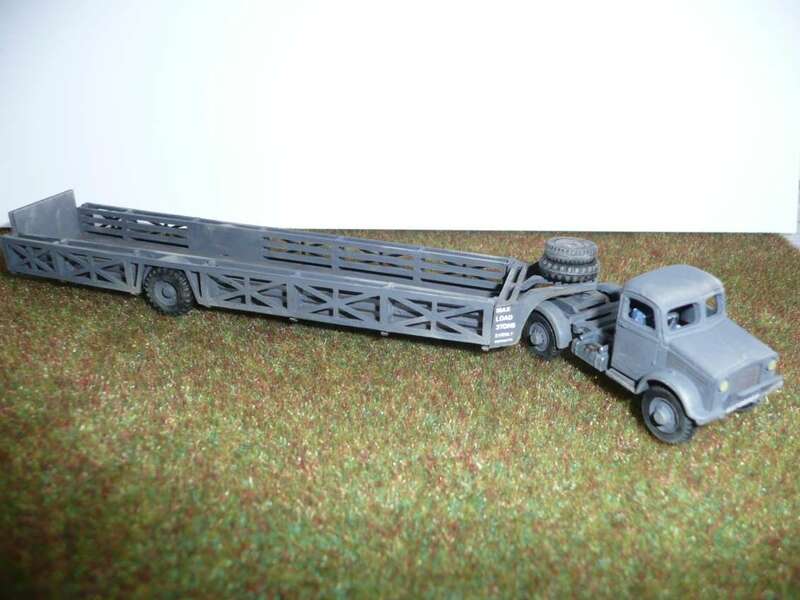 Kit 2301 Scammell tank transporter. 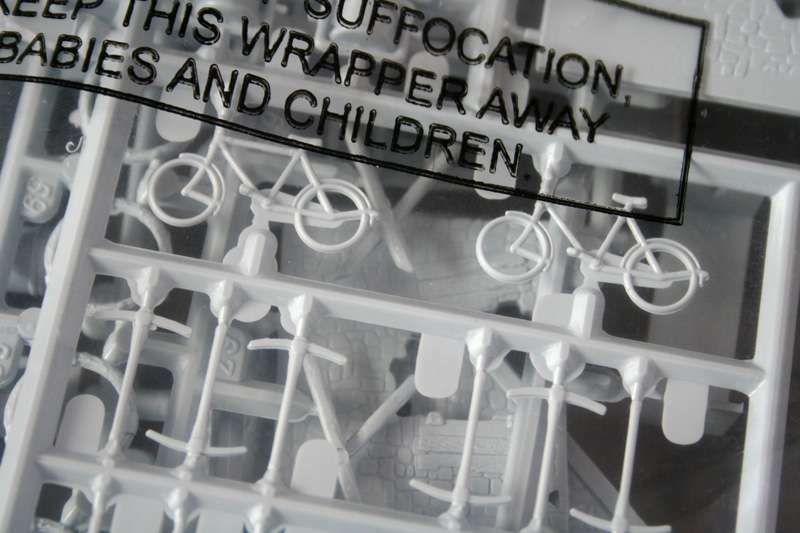 Are the latest boxtops misprints?? 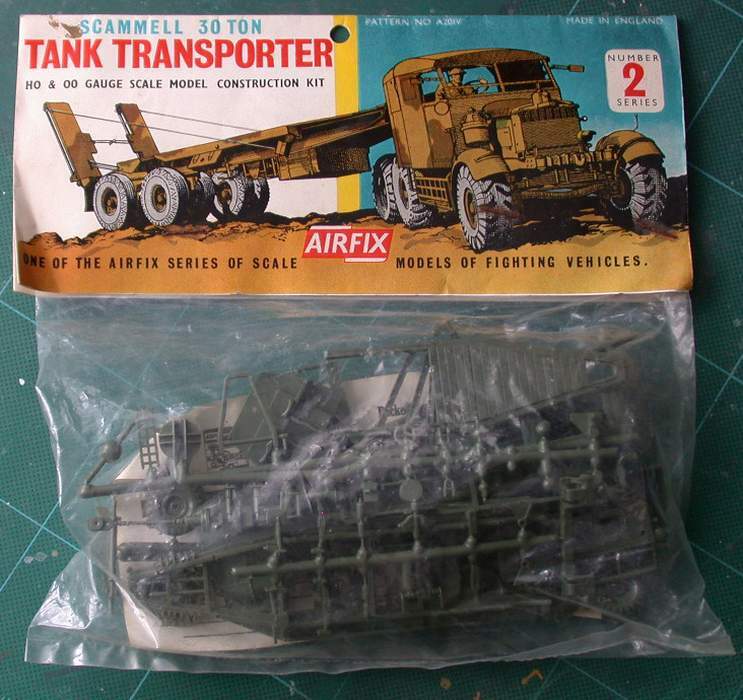 21-06-2011 Airfix Scammell TRMU-30, or simply 'tank transporter', as the box states. 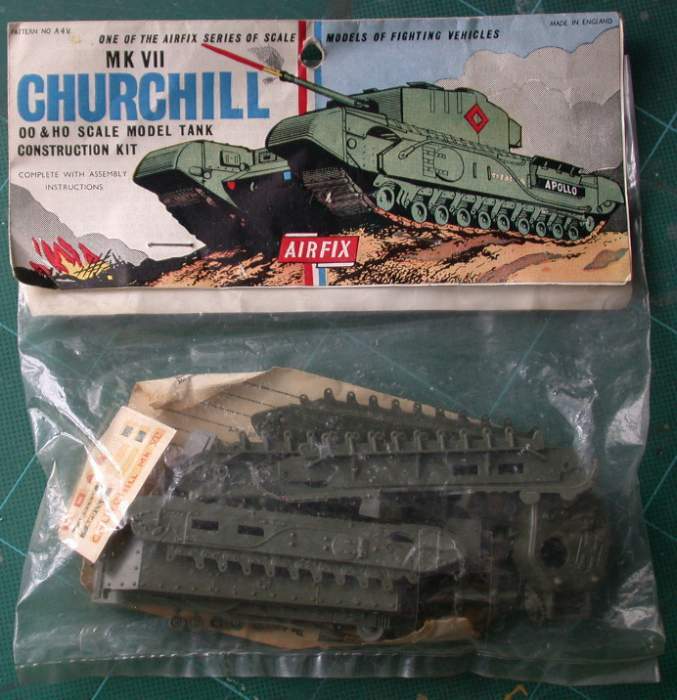 The box picture at first seemed to be mirrored from the earlier boxes, till I spotted the markings on the Churchill. 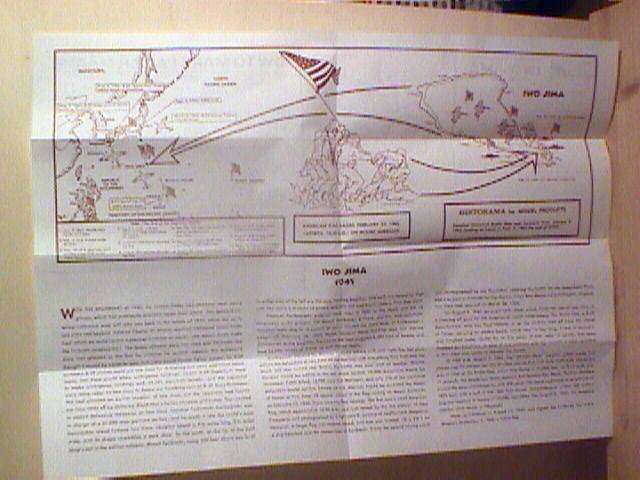 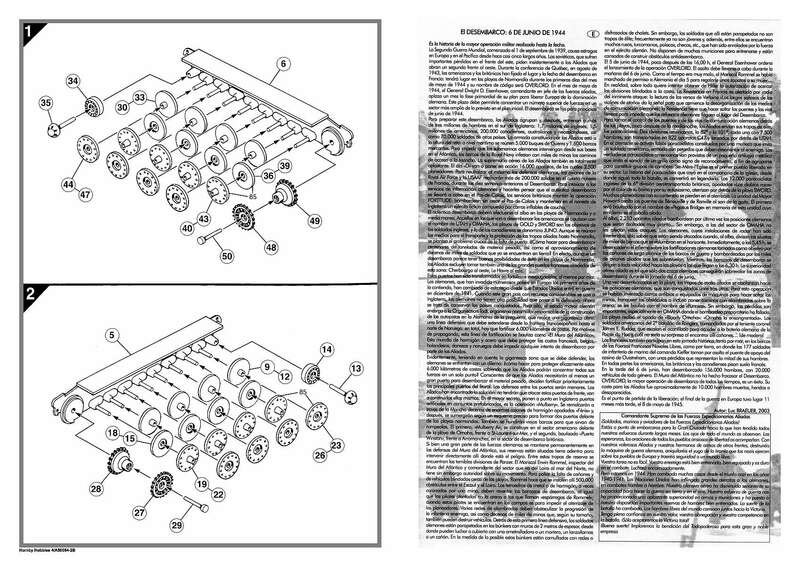 Also, on one of the sides the picture is printed upside down. 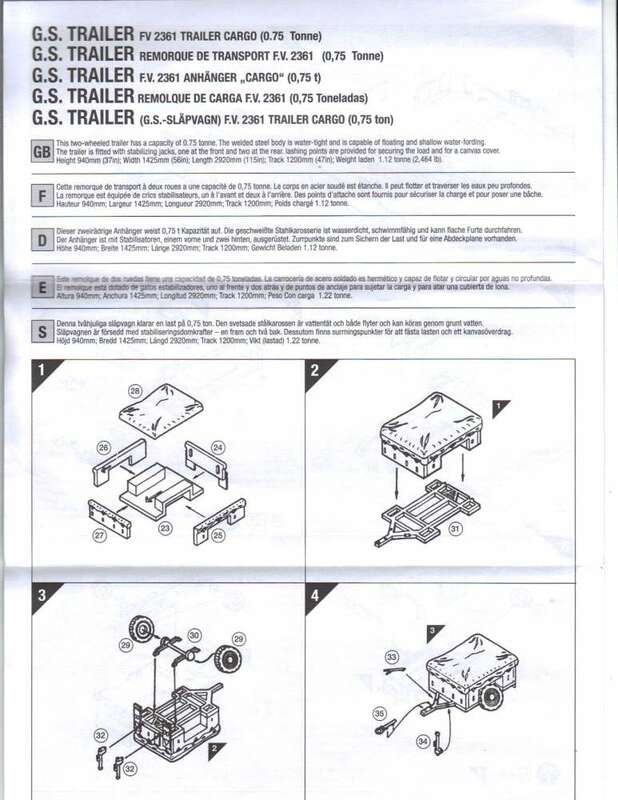 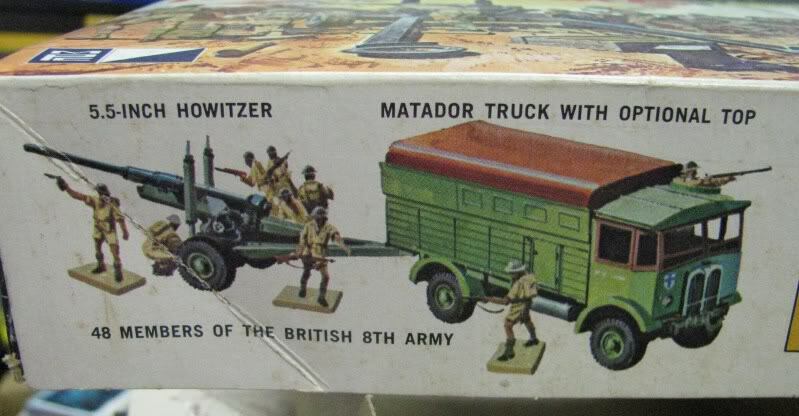 BTW, the other side of the box states 'Made in India'. 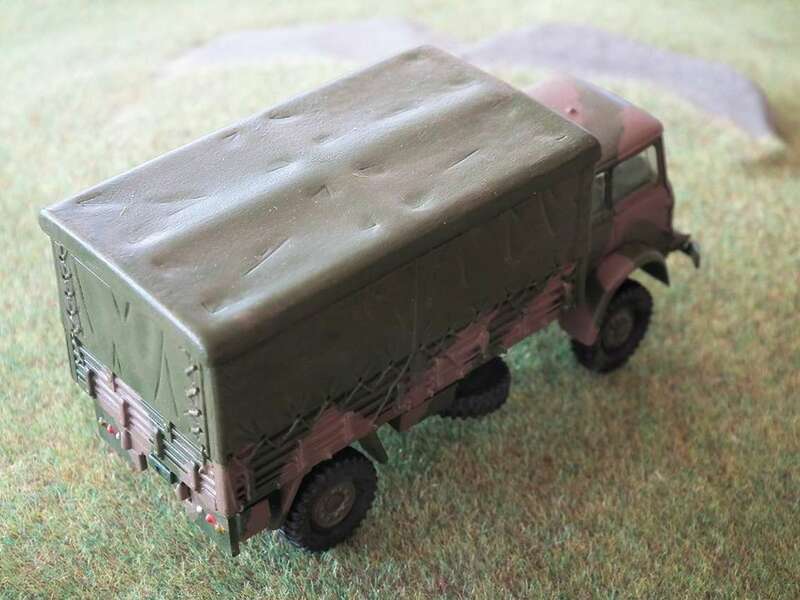 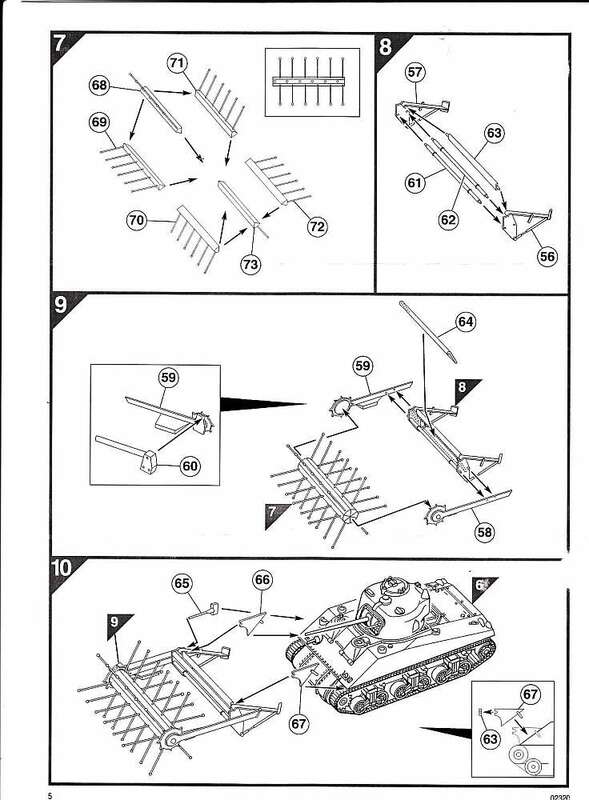 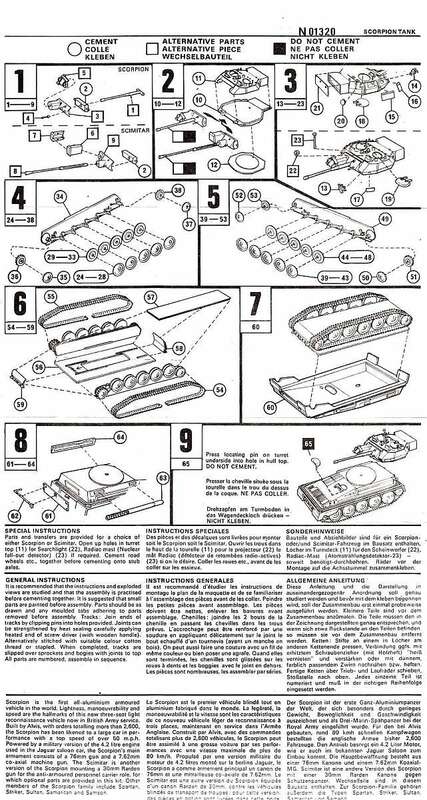 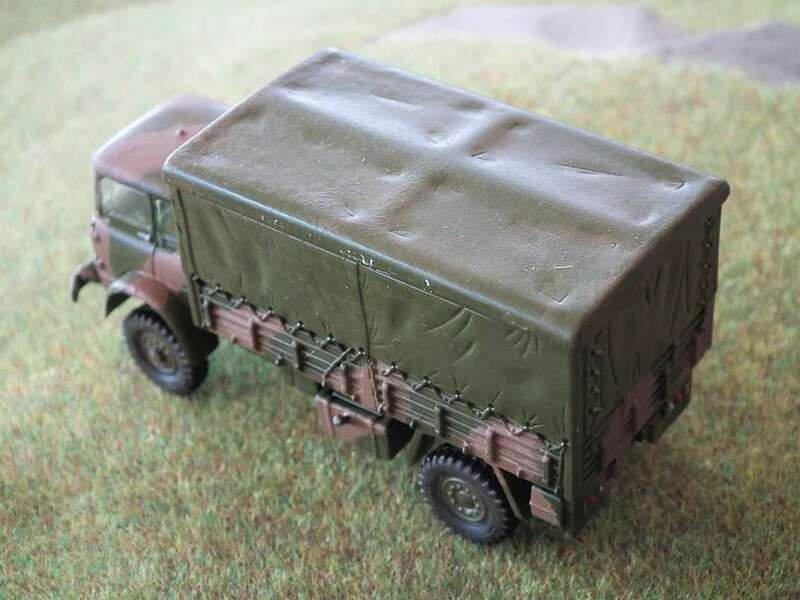 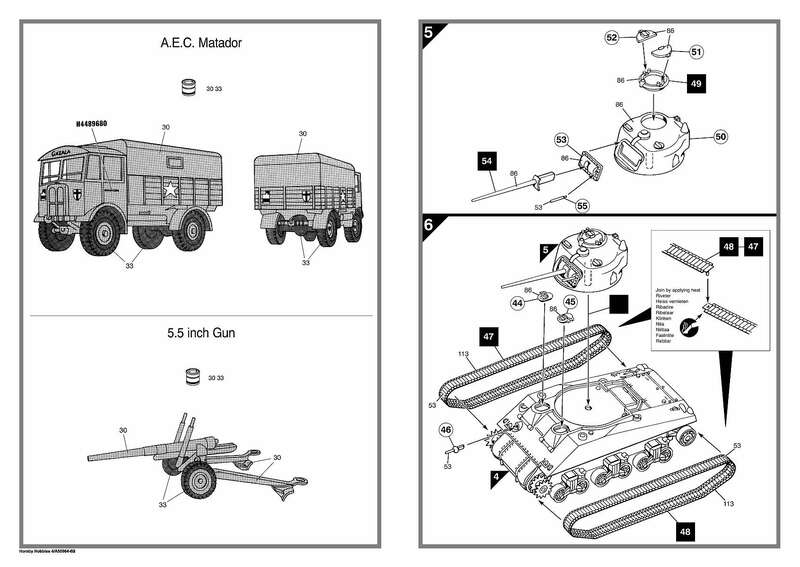 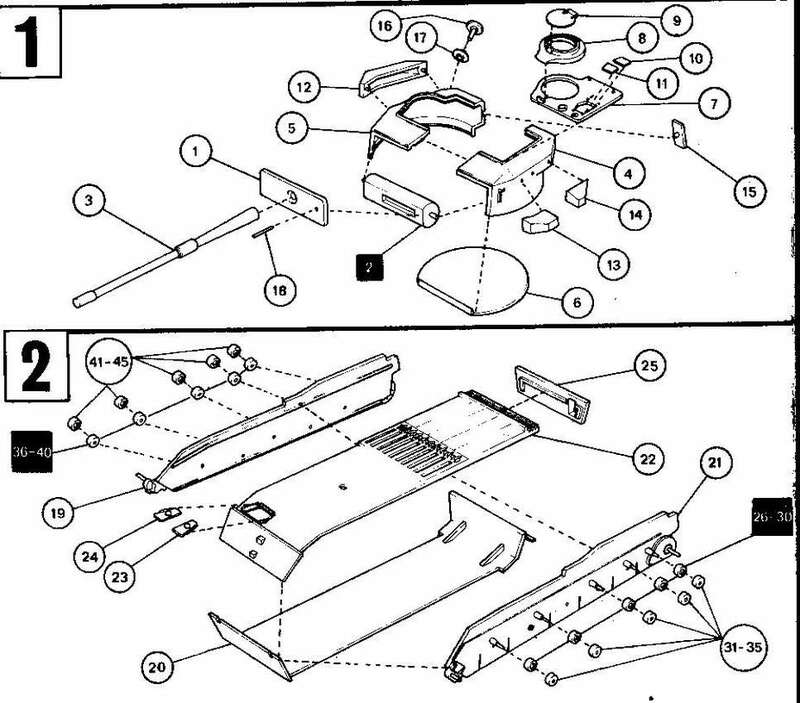 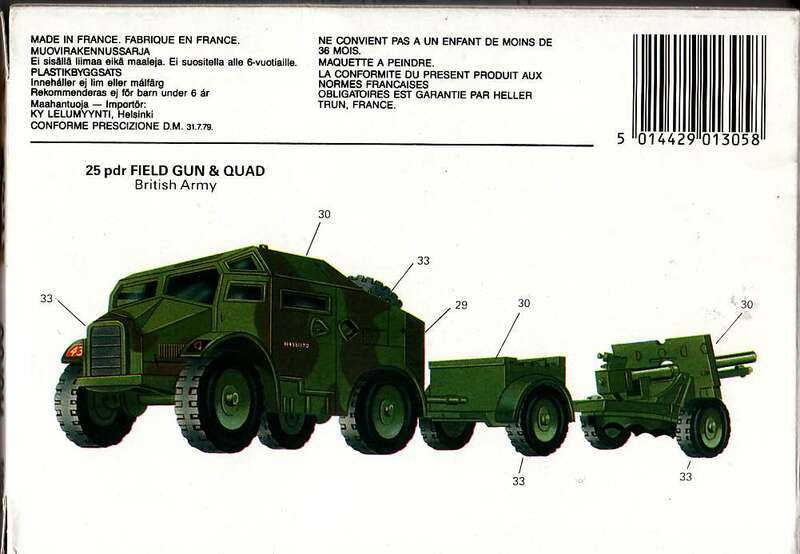 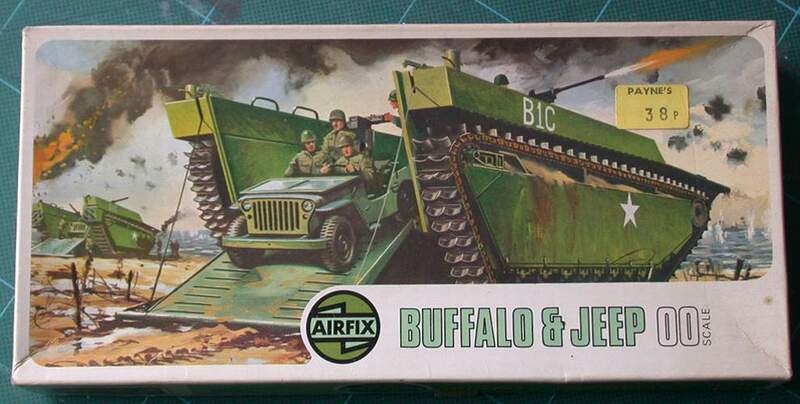 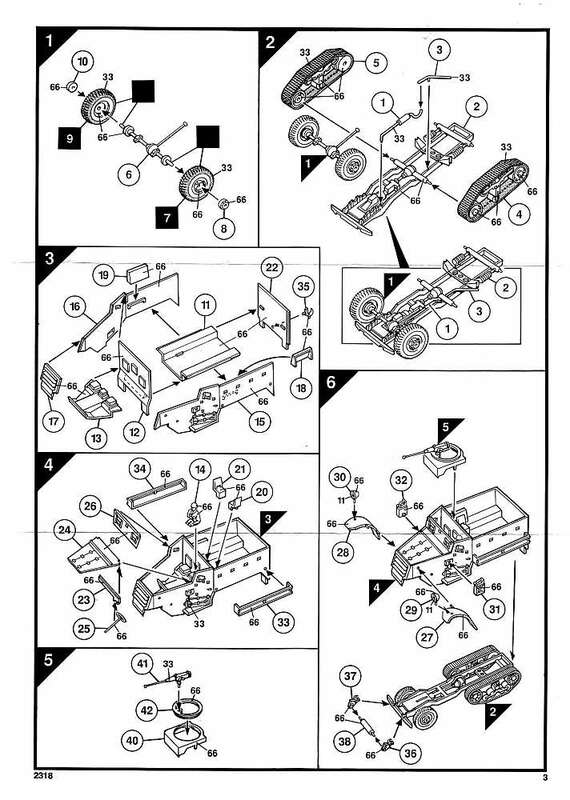 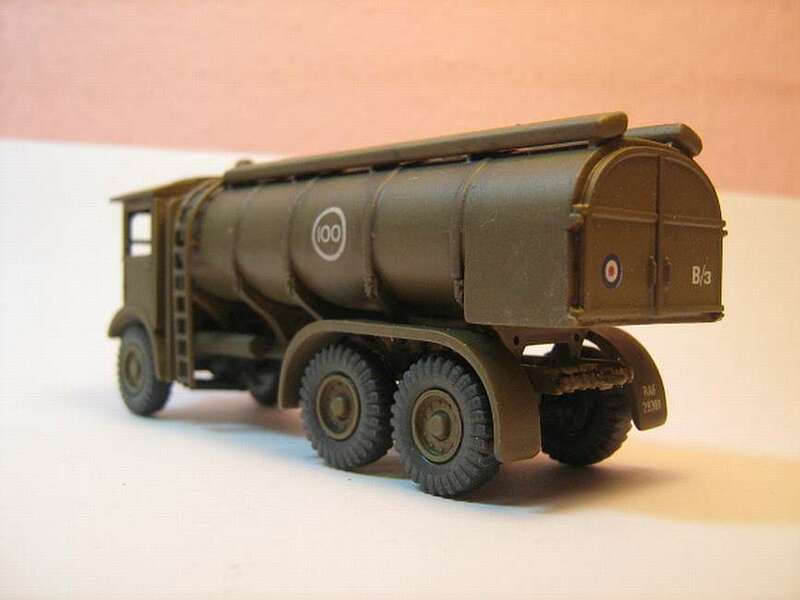 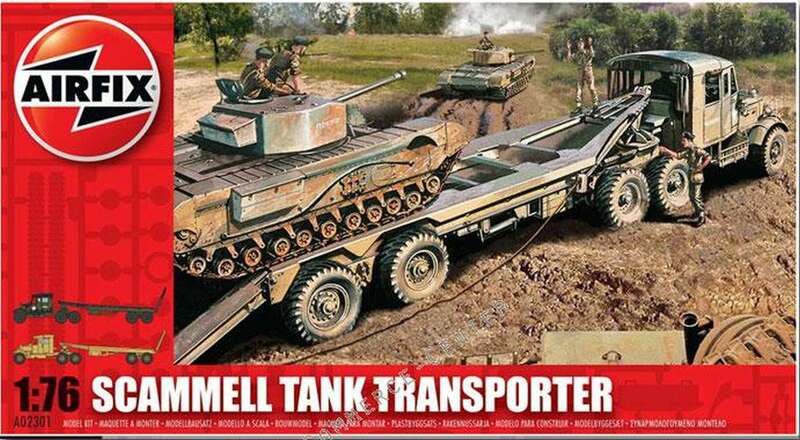 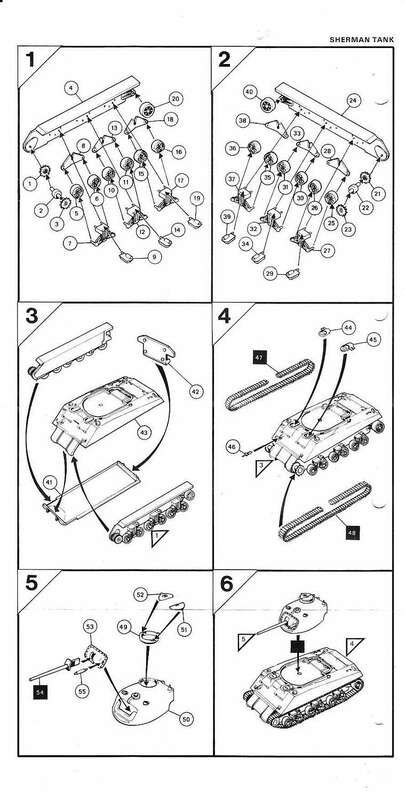 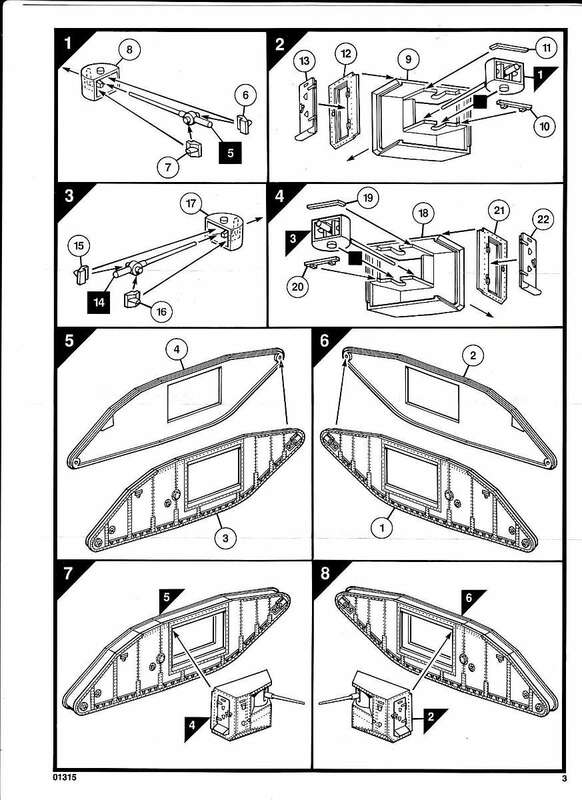 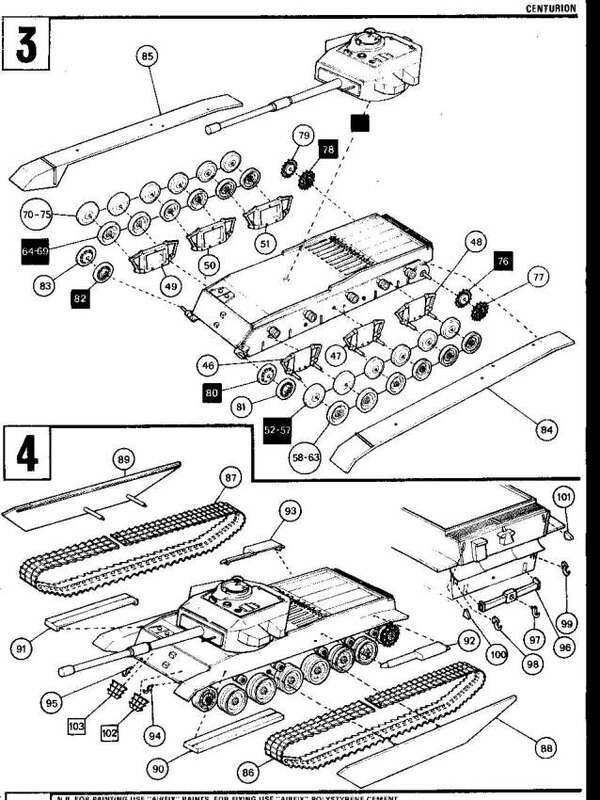 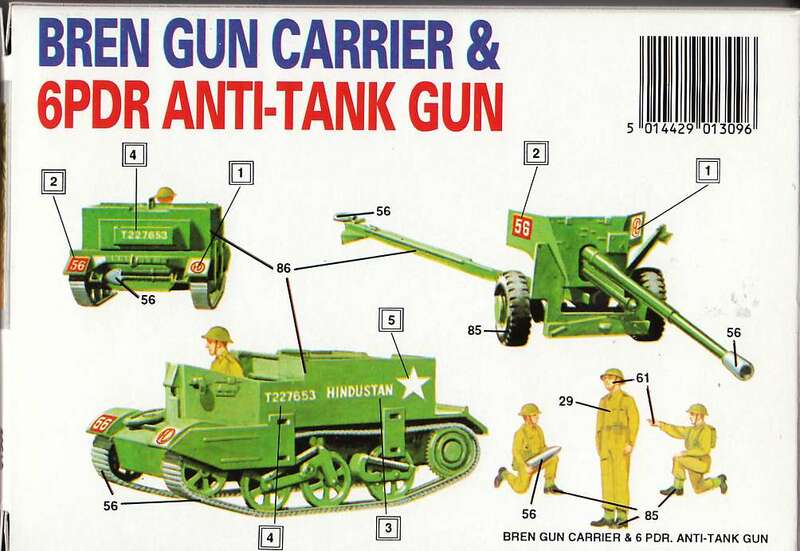 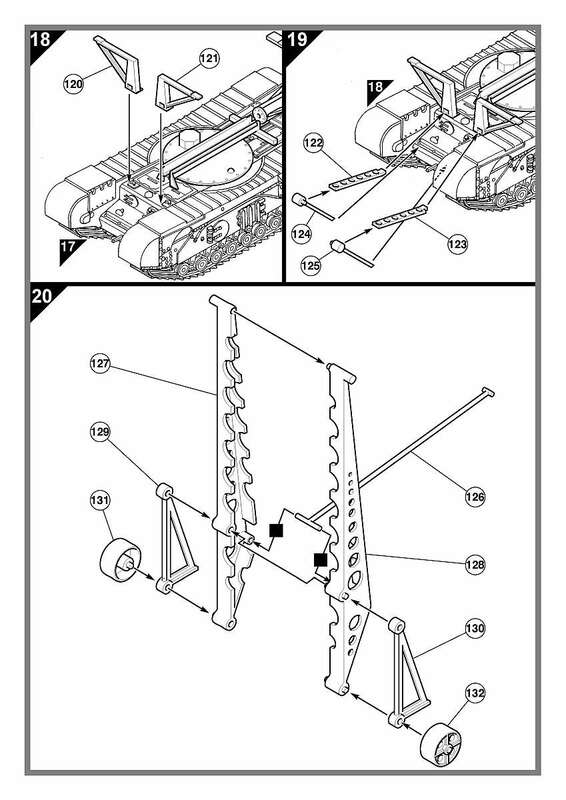 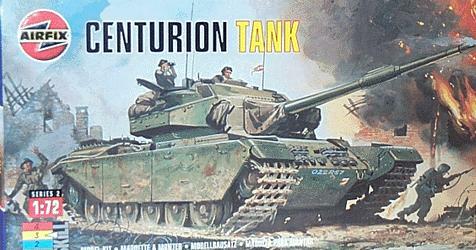 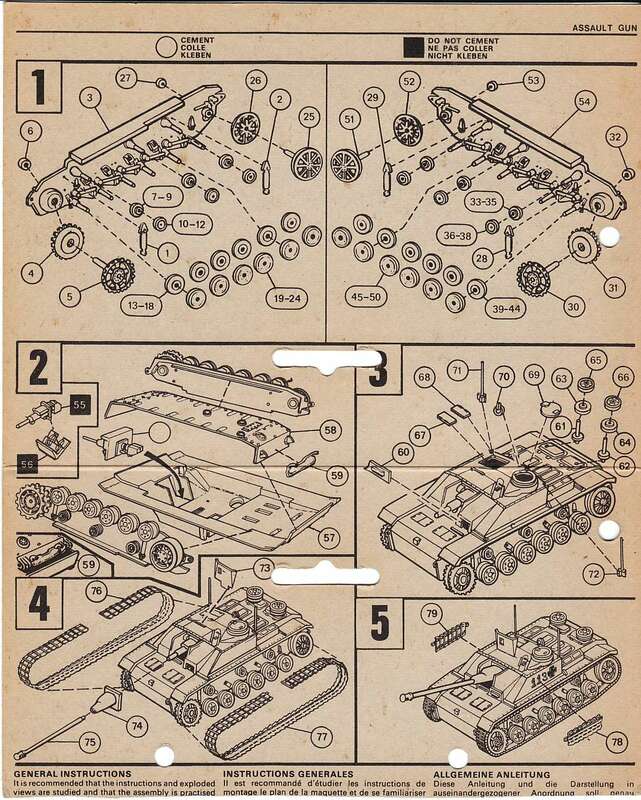 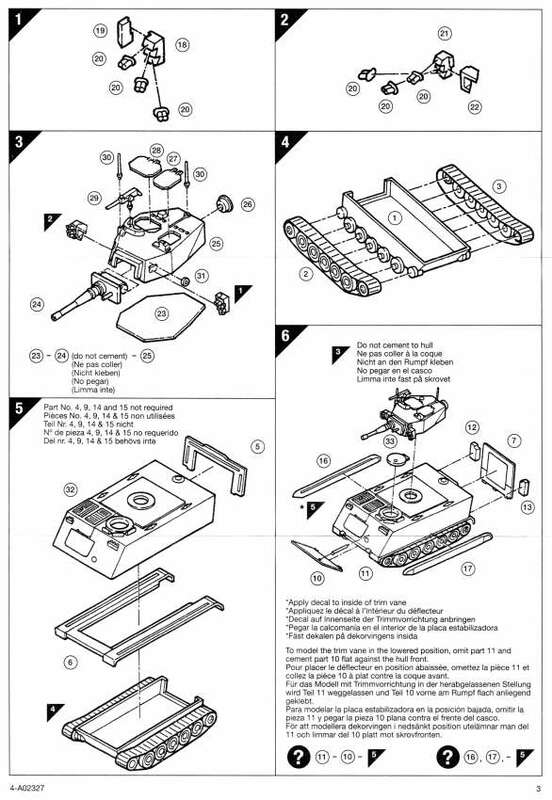 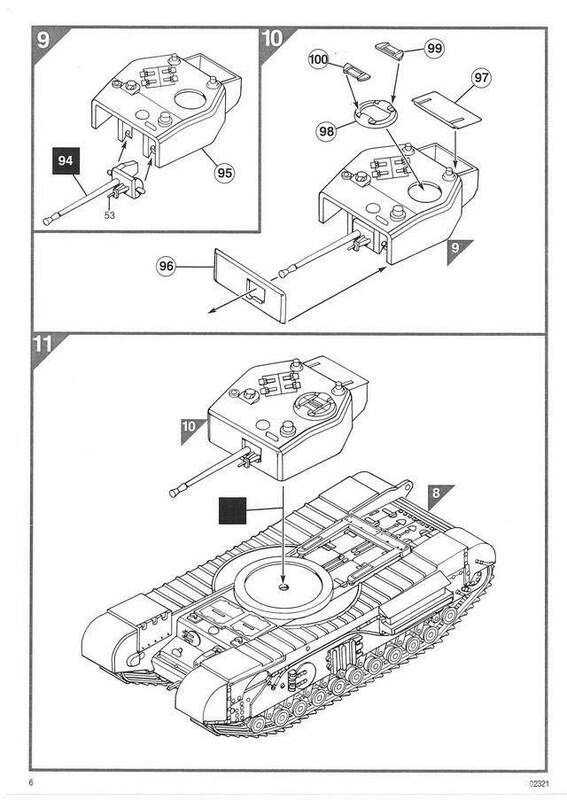 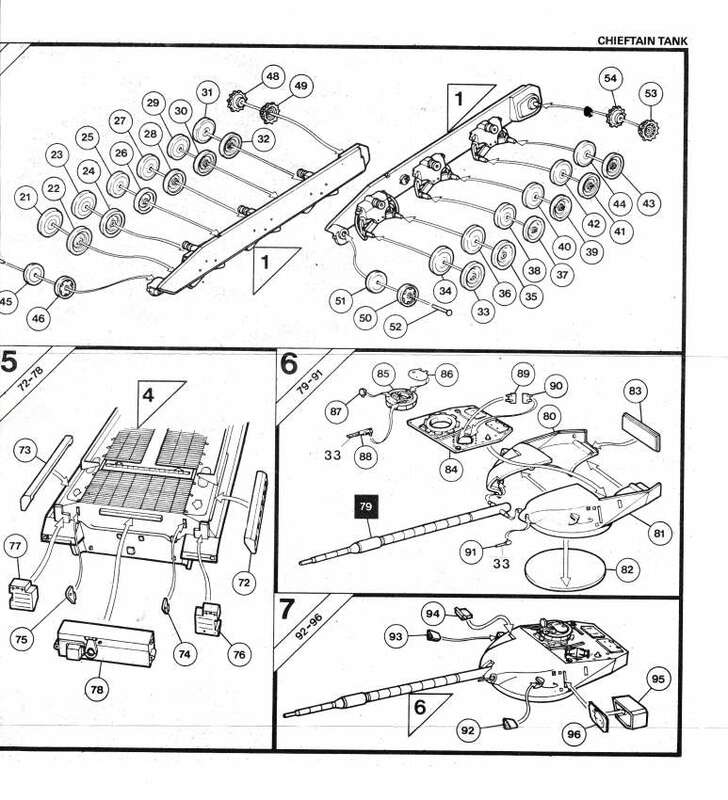 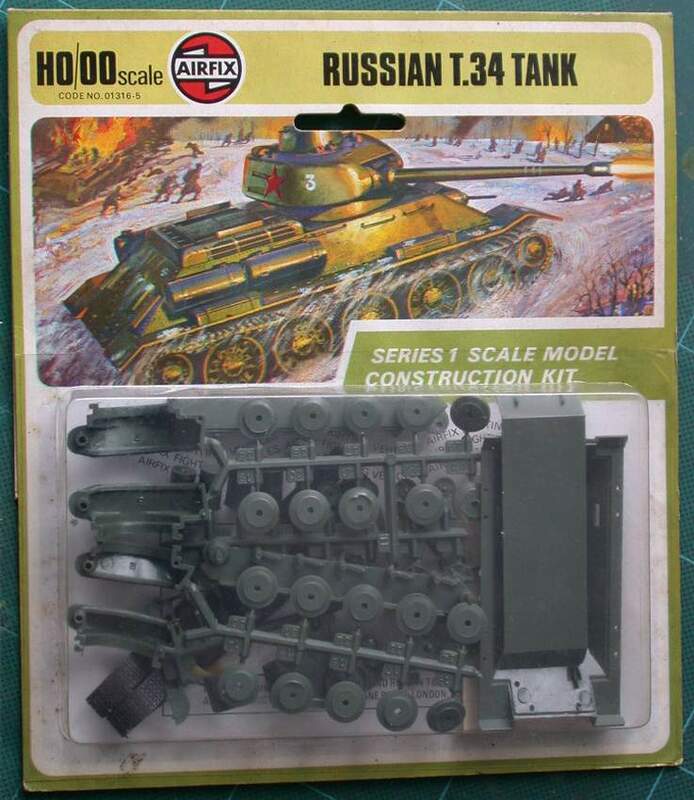 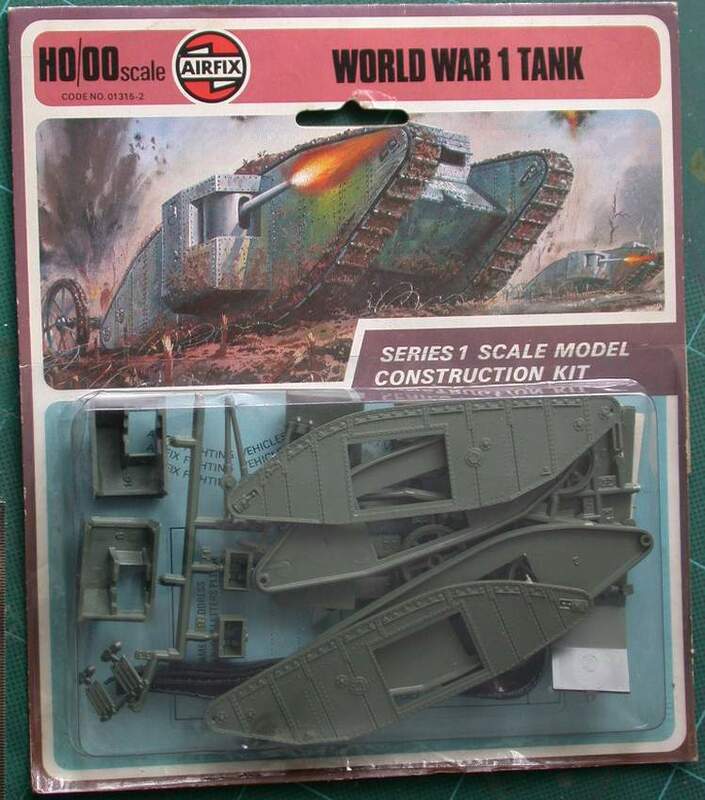 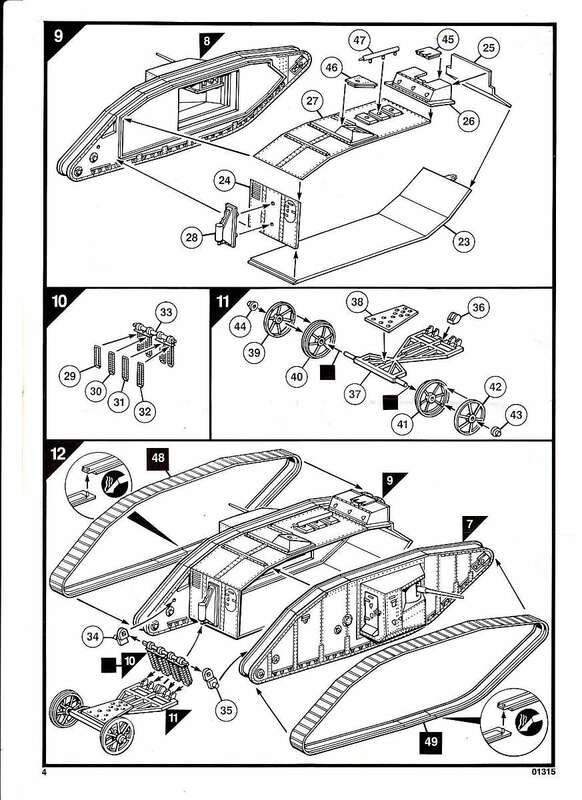 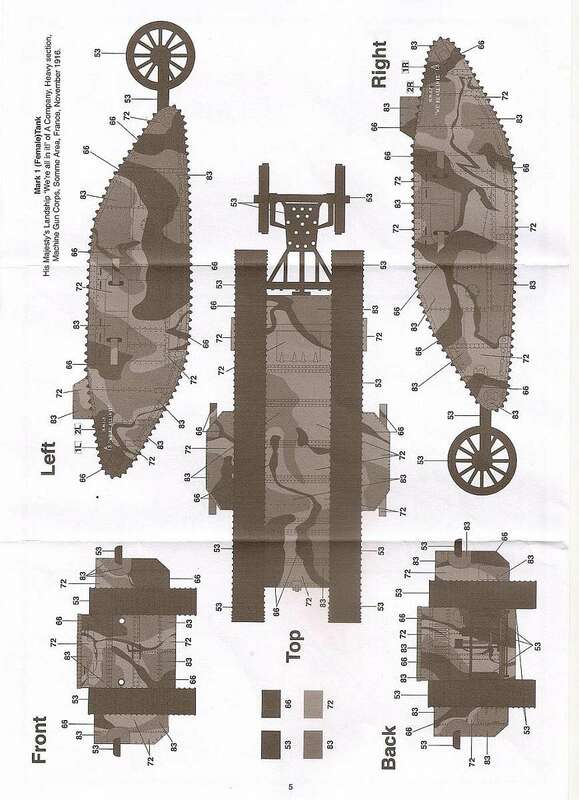 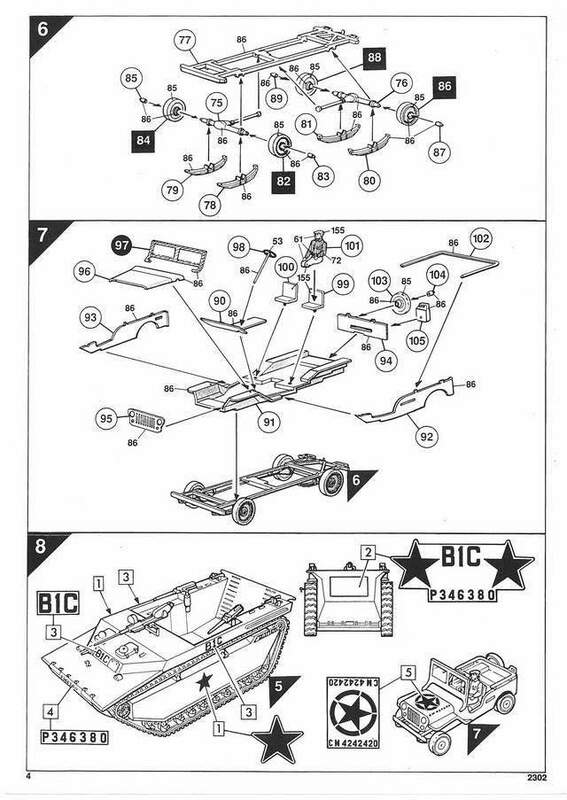 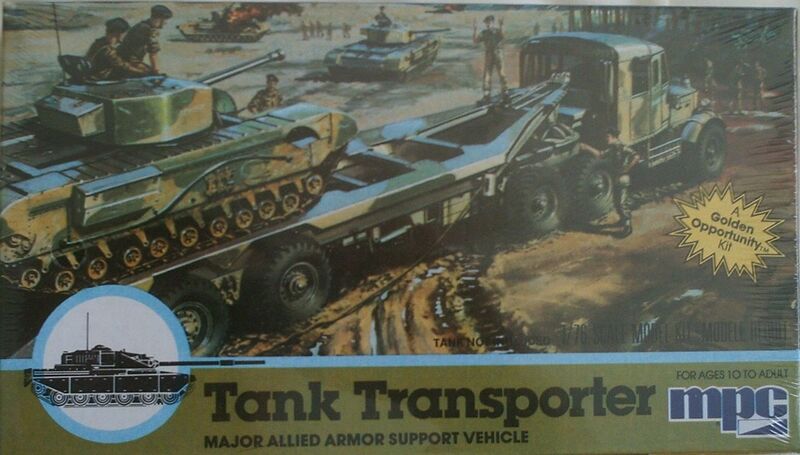 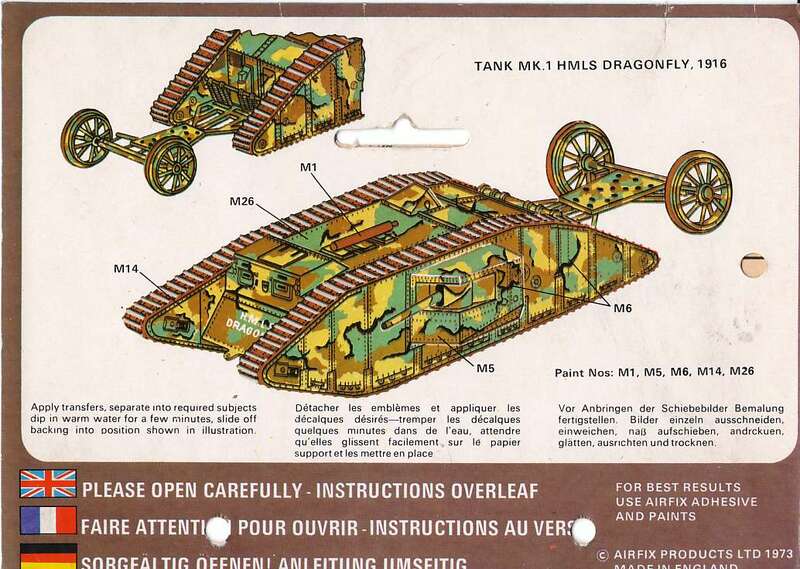 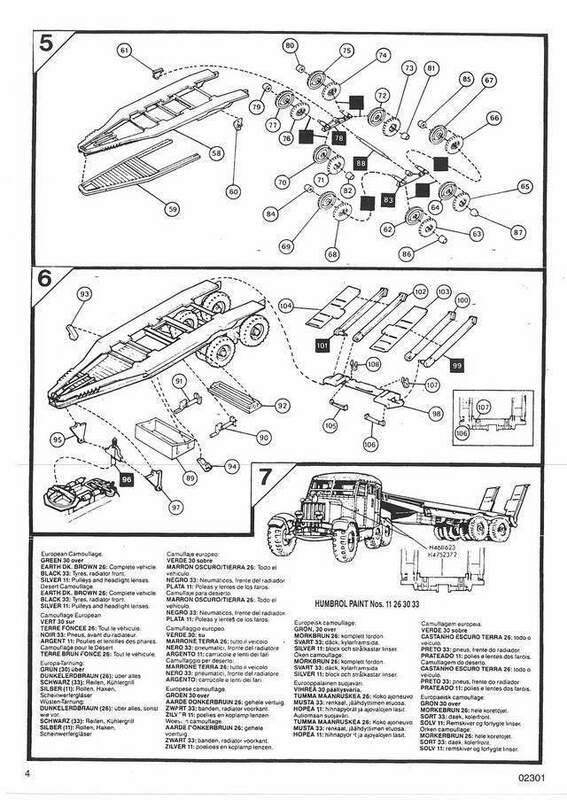 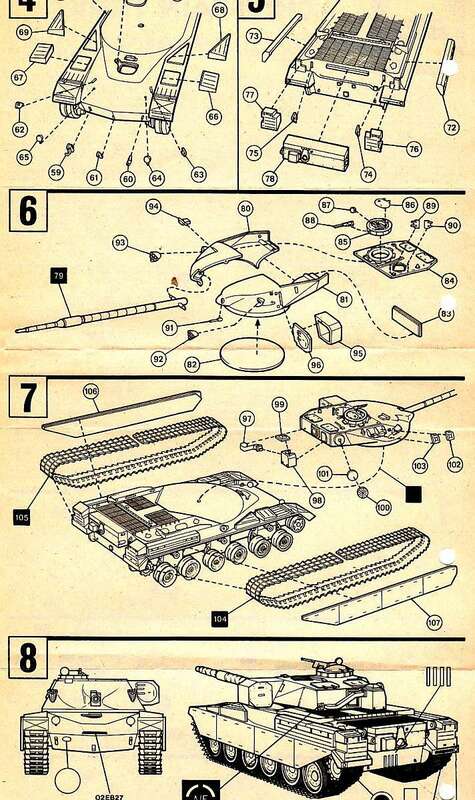 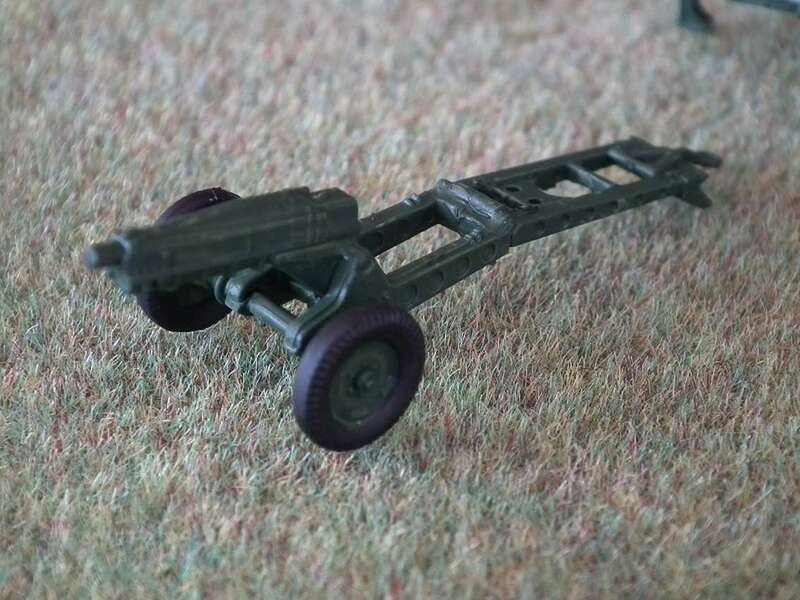 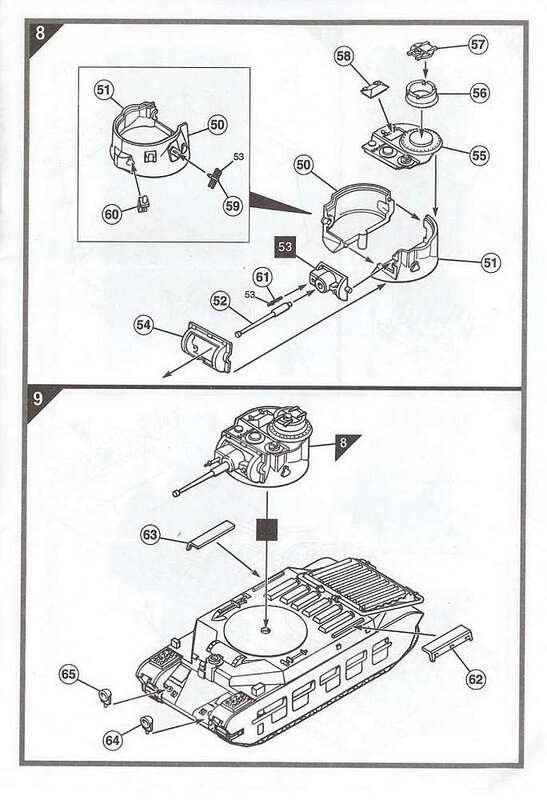 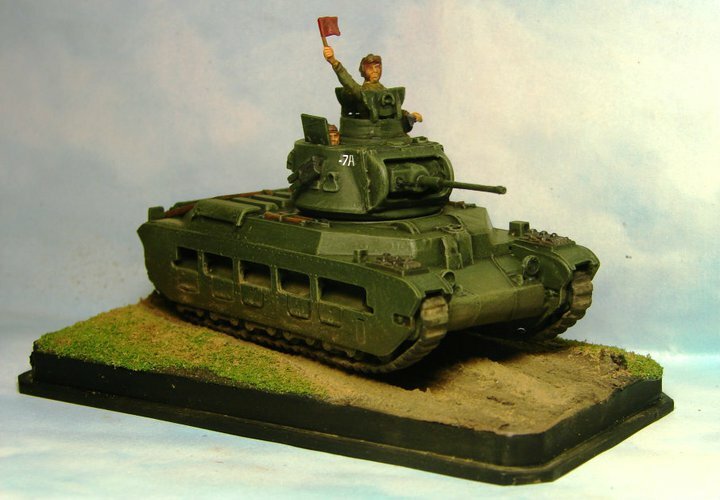 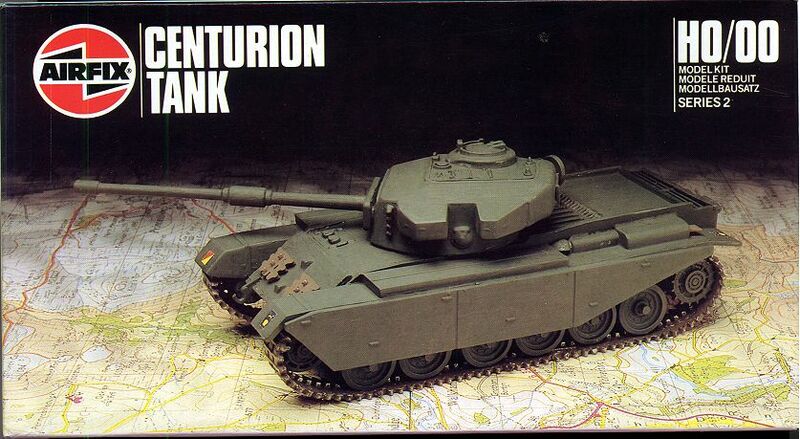 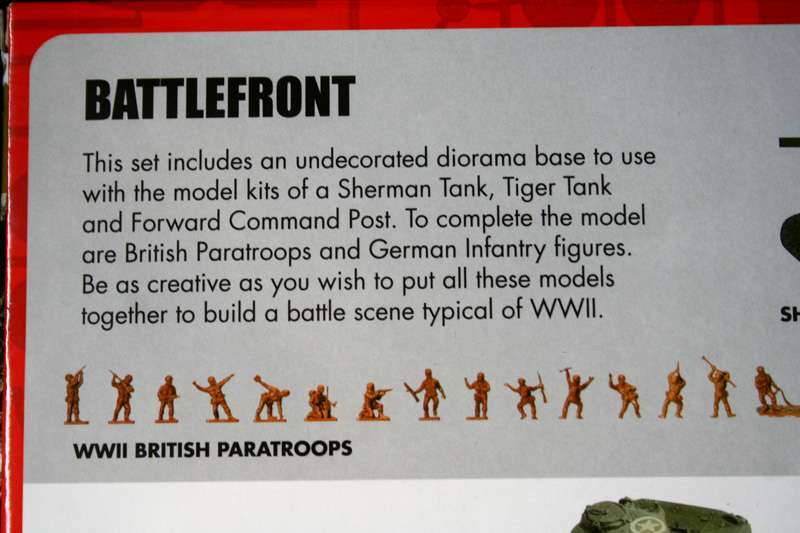 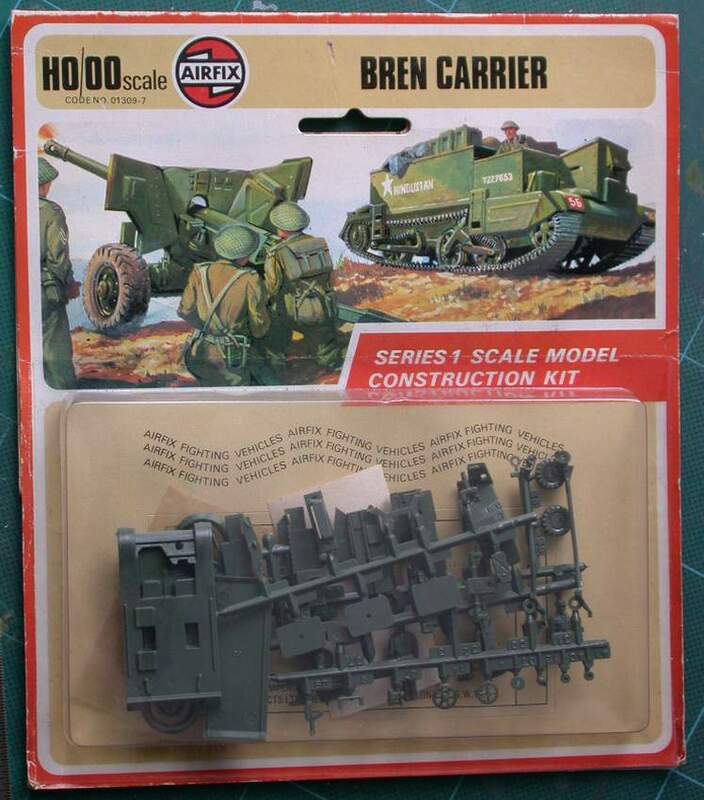 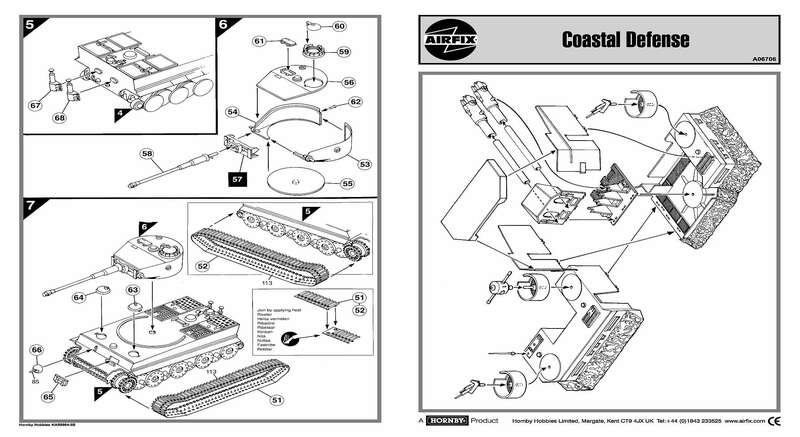 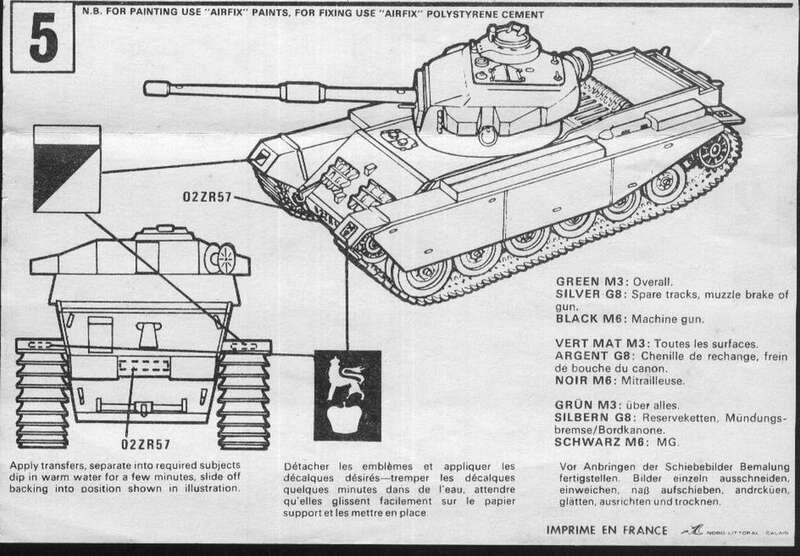 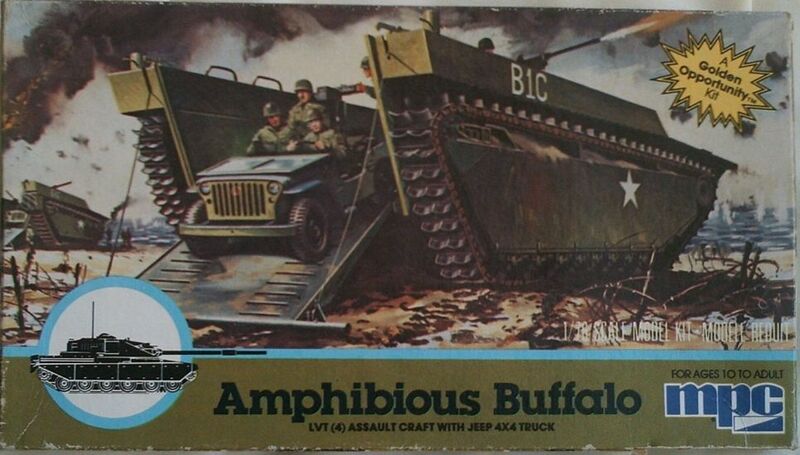 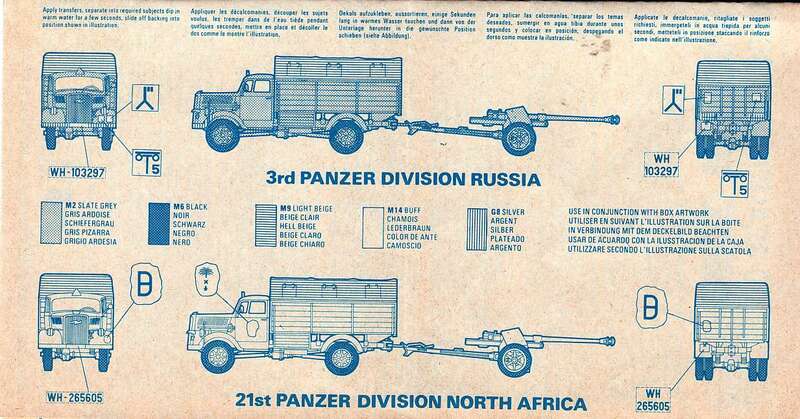 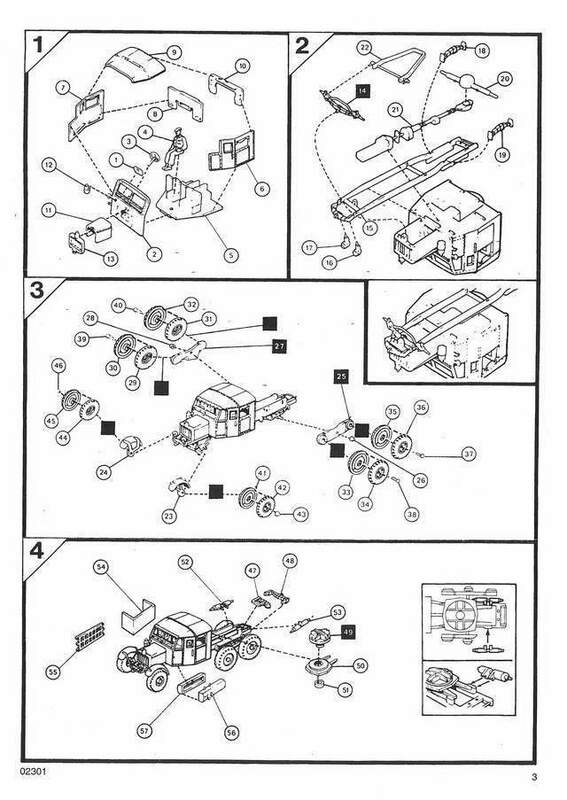 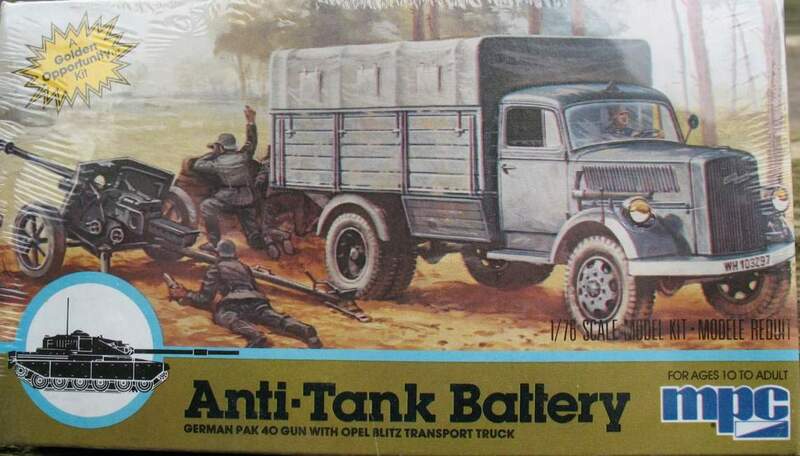 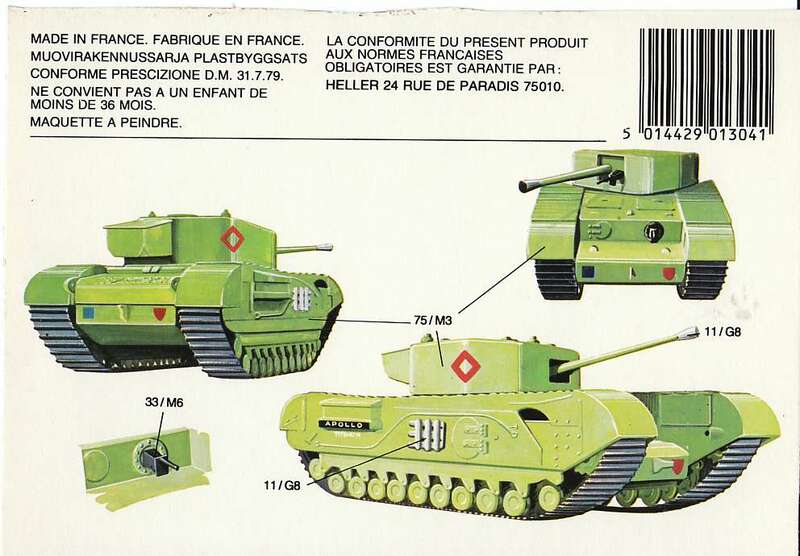 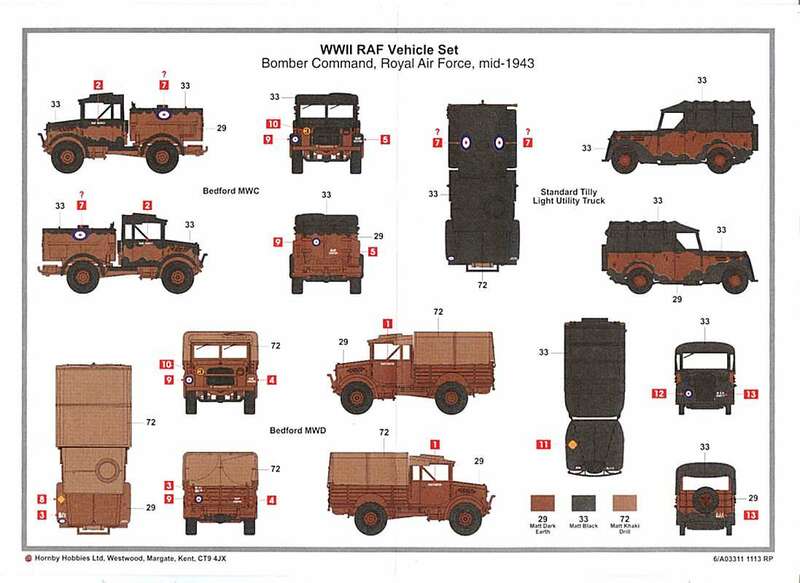 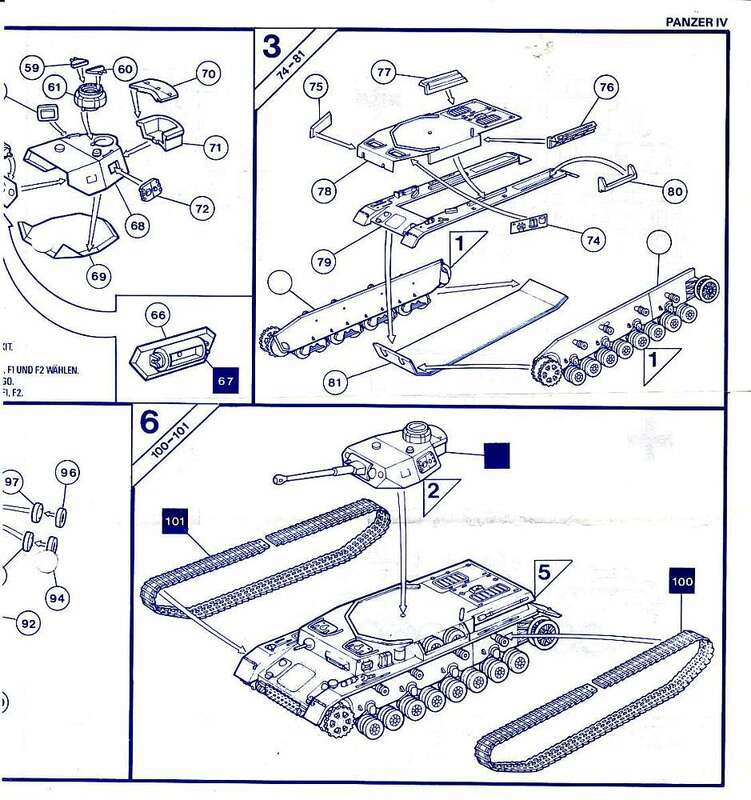 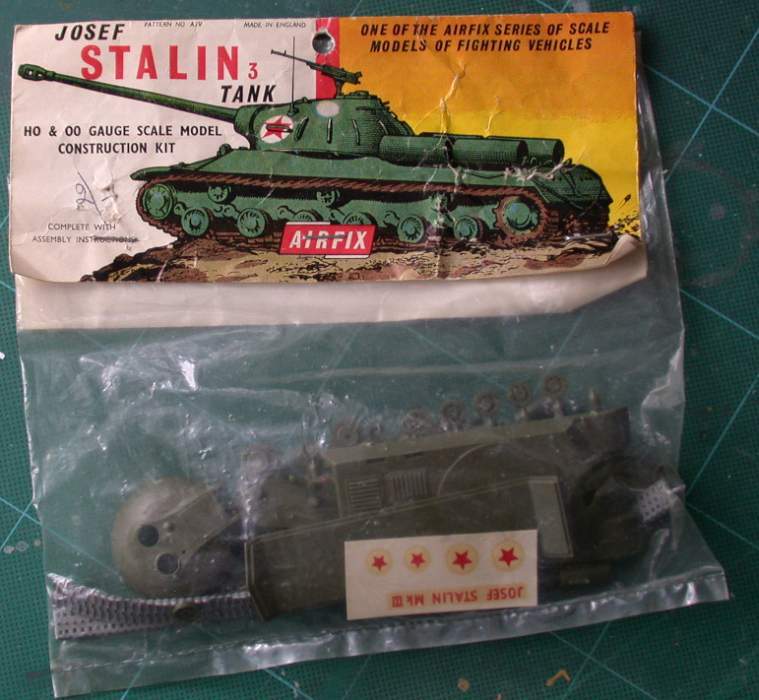 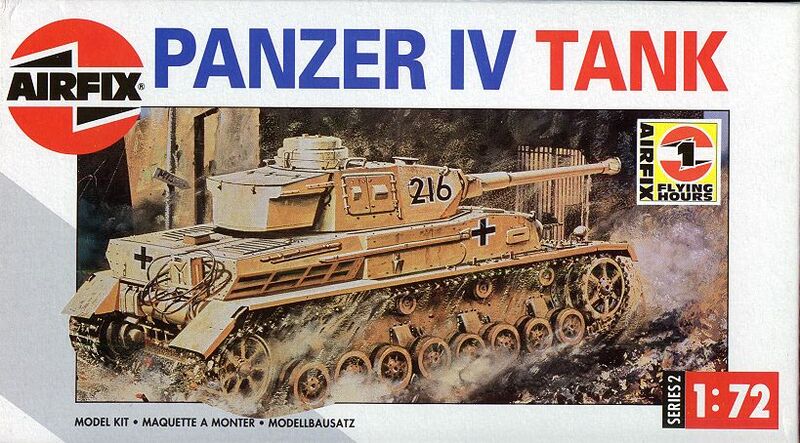 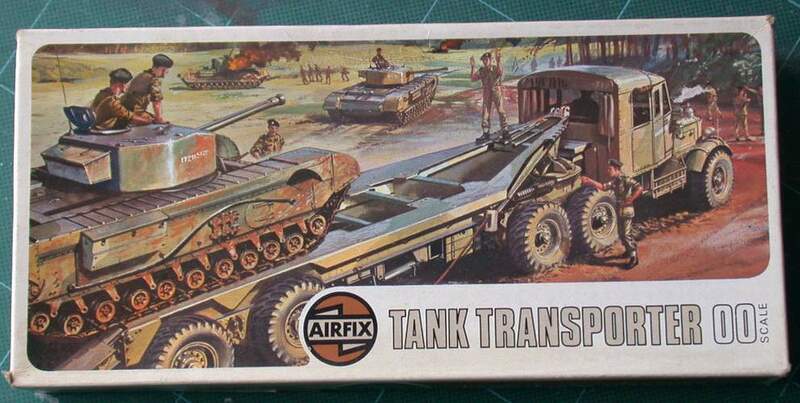 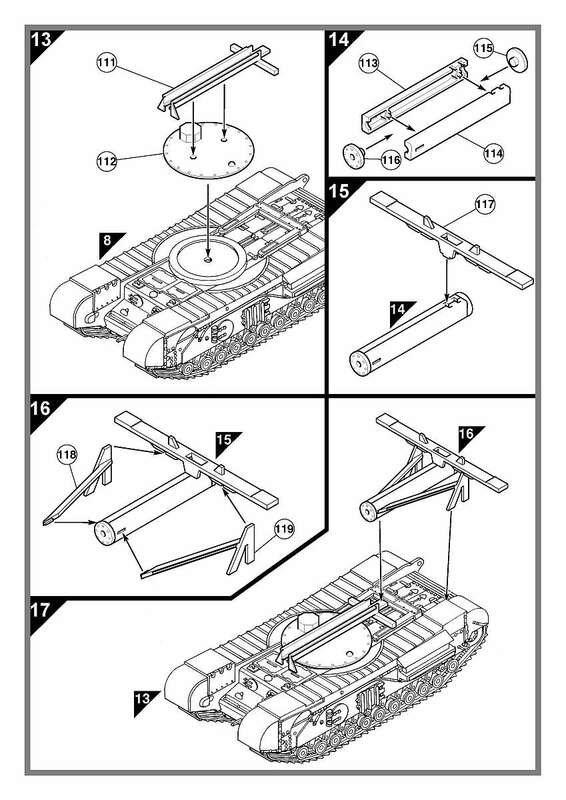 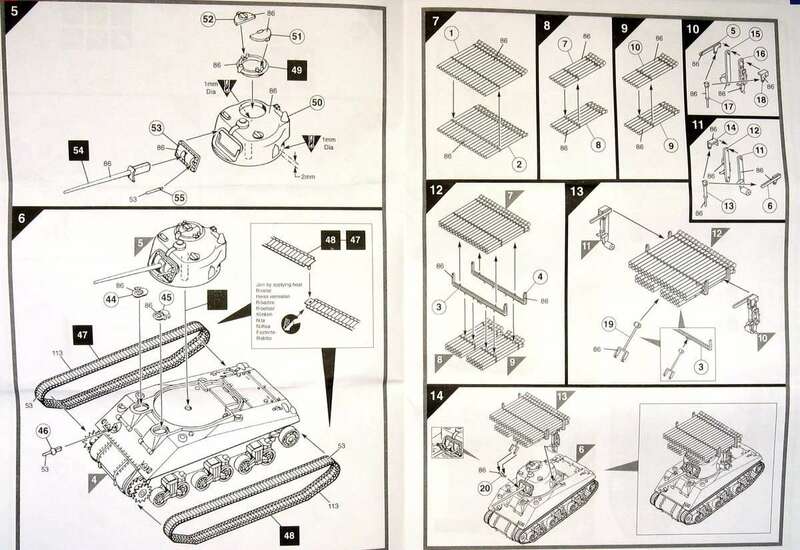 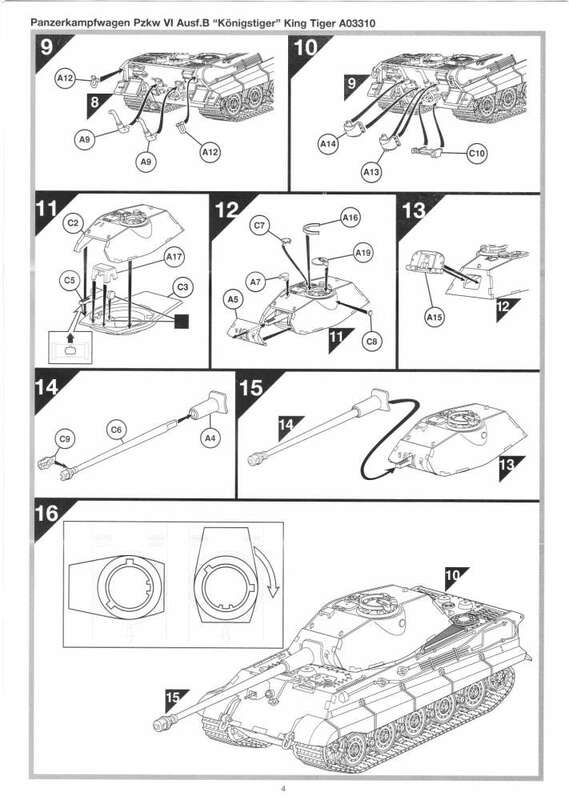 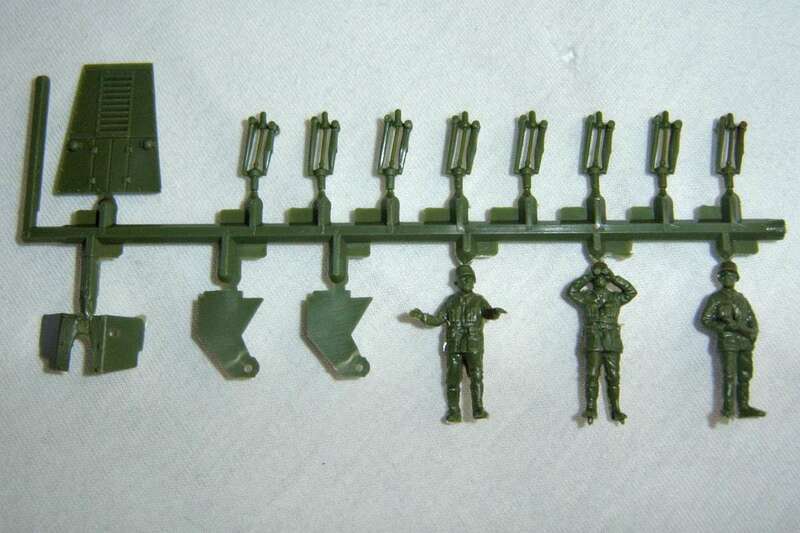 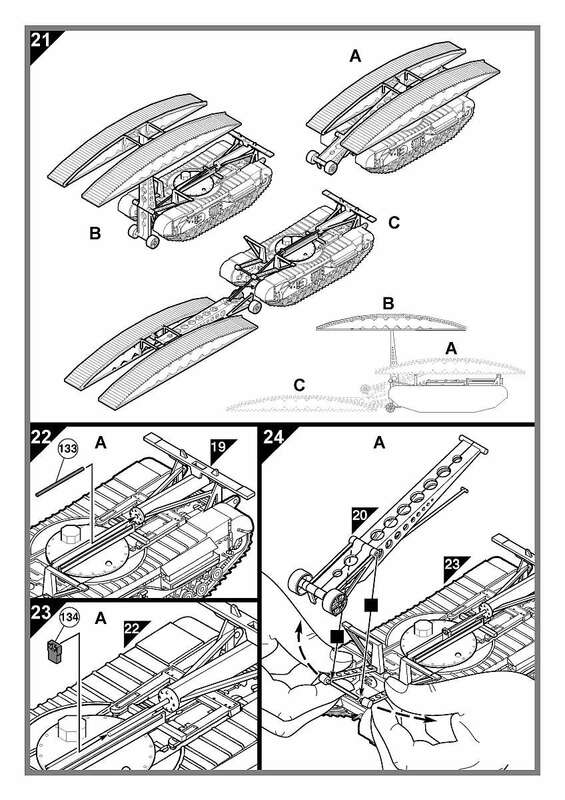 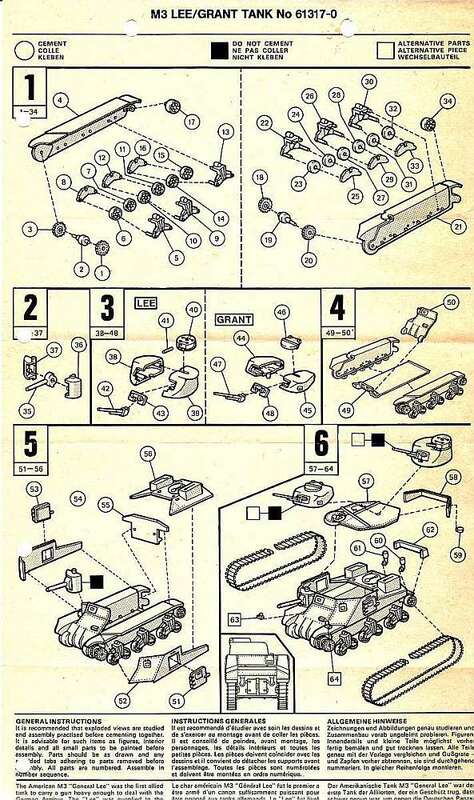 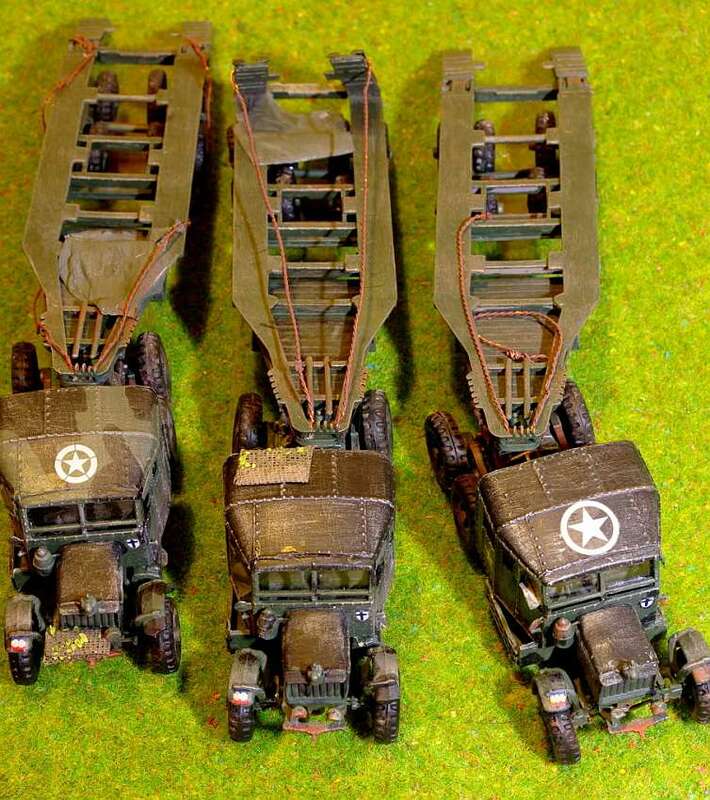 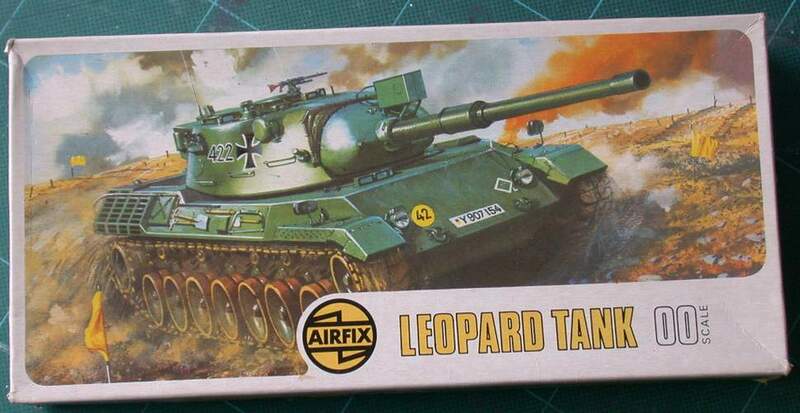 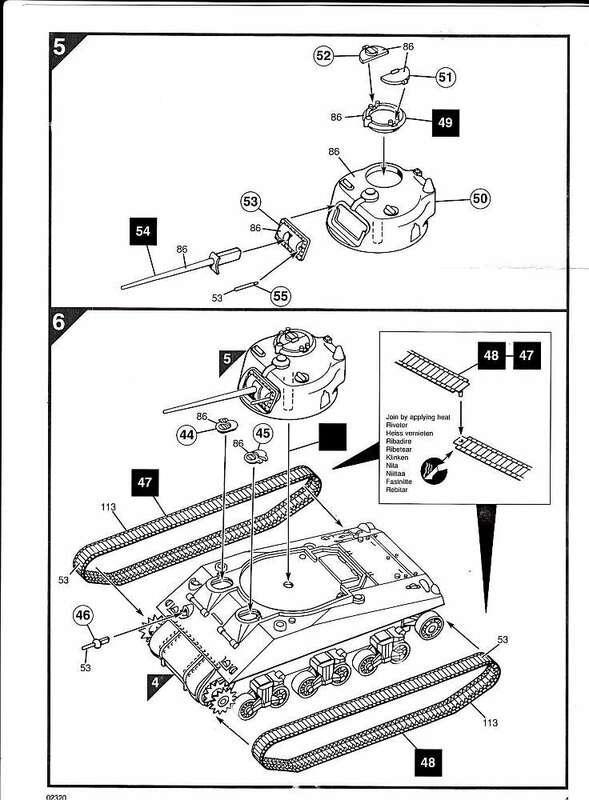 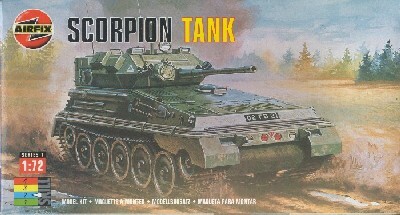 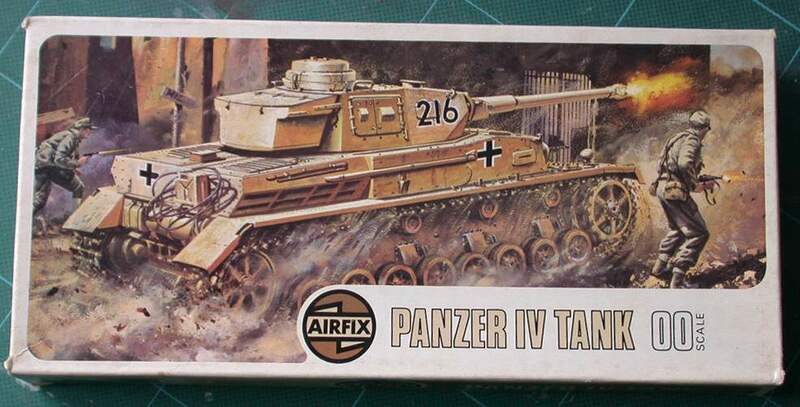 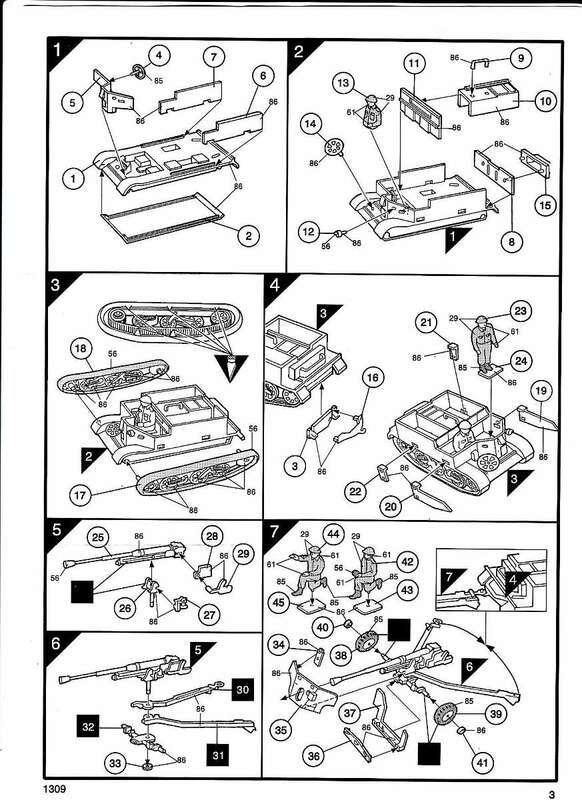 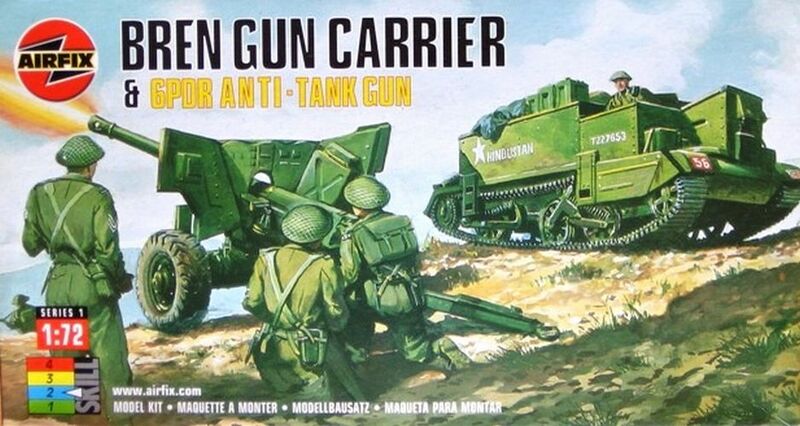 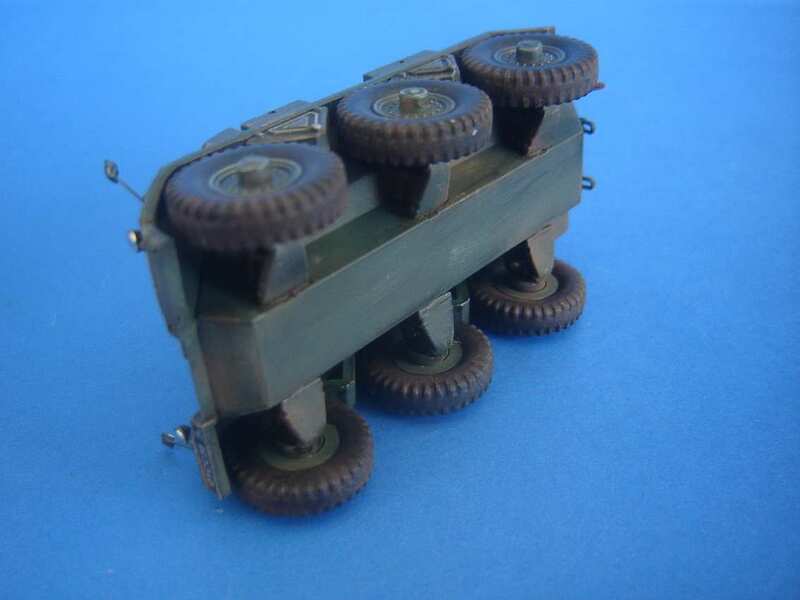 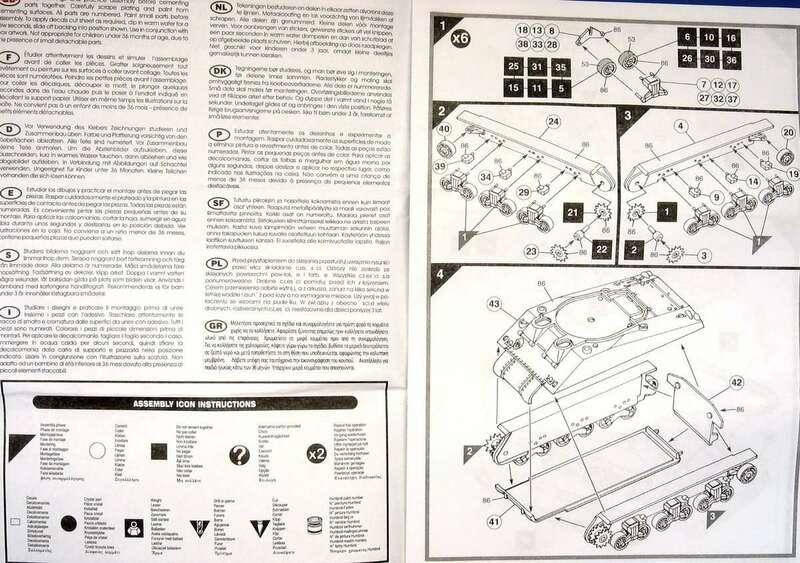 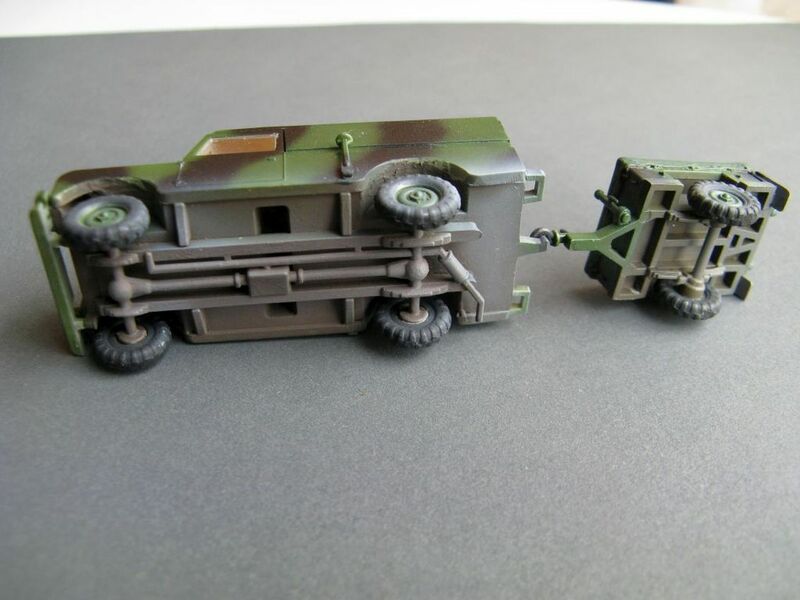 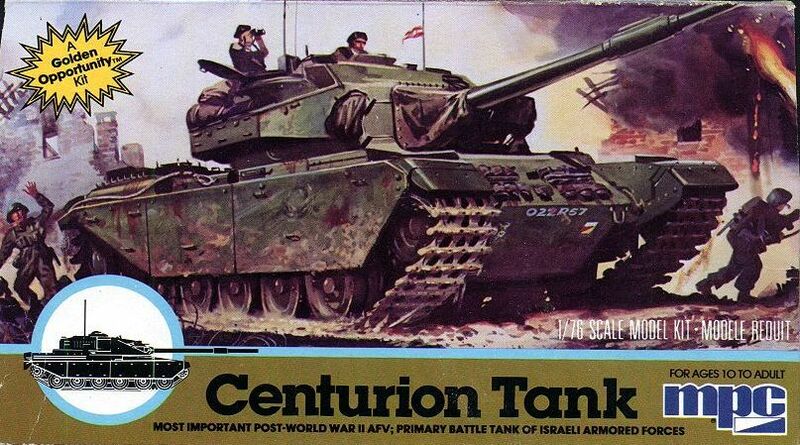 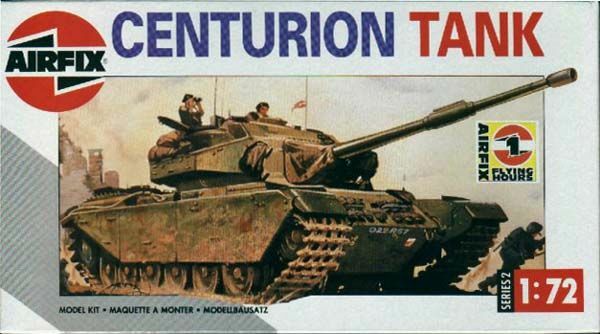 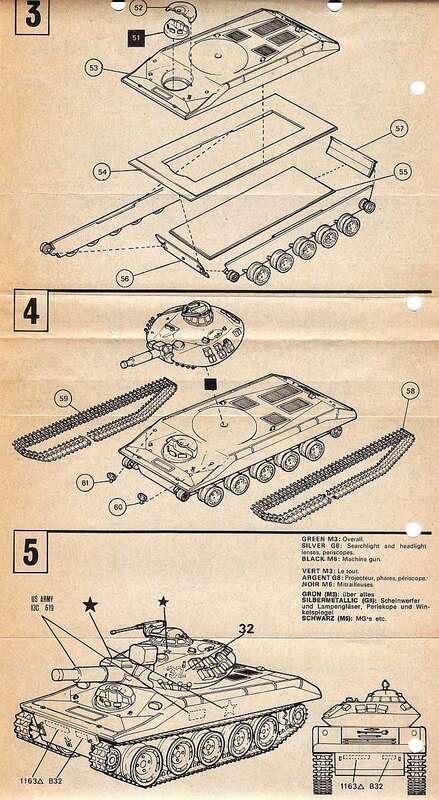 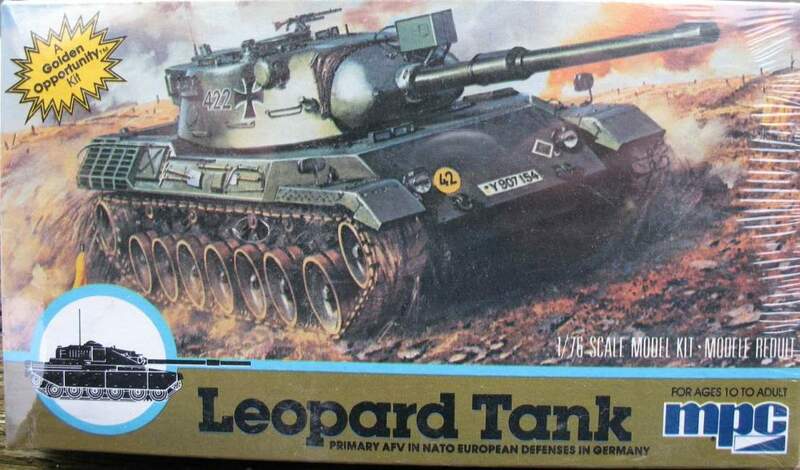 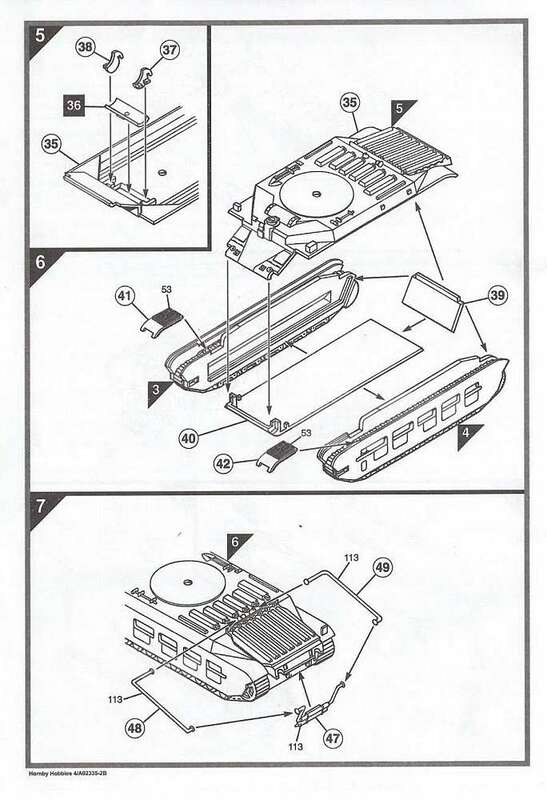 Meanwhile a friend from England pointed out another mistake on the same Airfix tank transporter kit box. 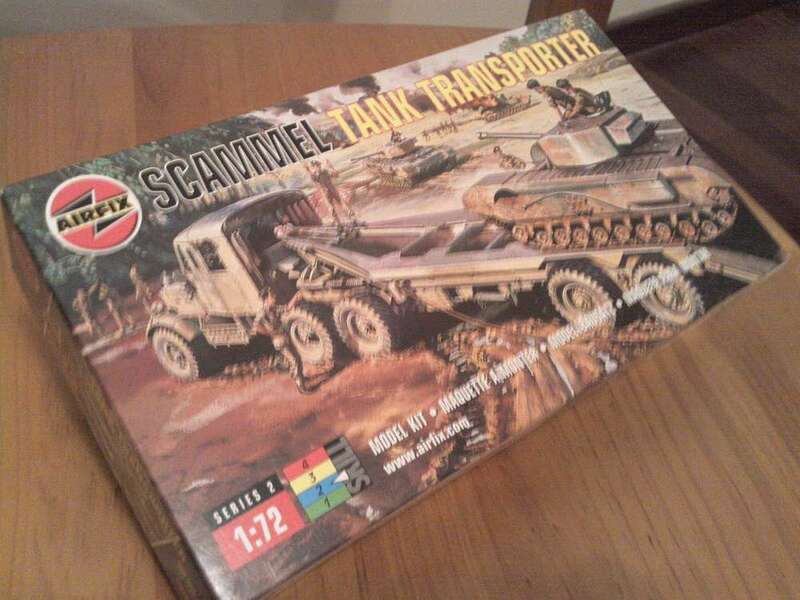 On the last Indian version it is stated 'Scammel', the right spelling is 'Scammell' with double l. I still wonder whether is this a typo or a very clever way to avoid copyrights? 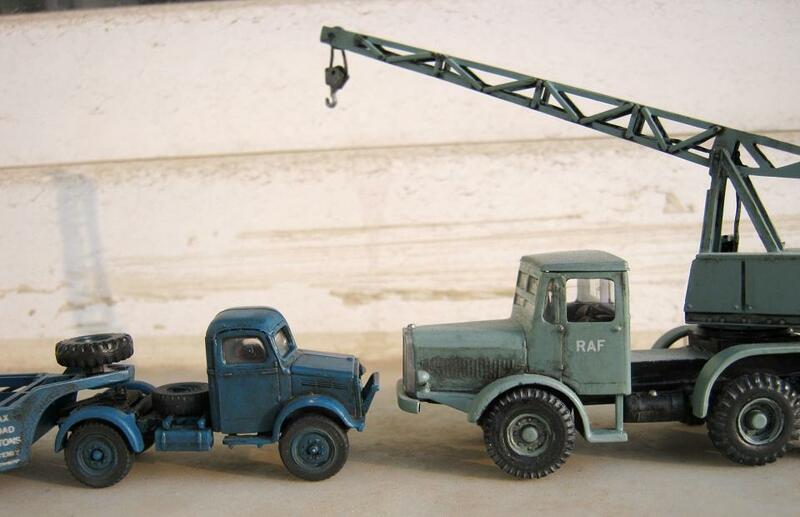 - Ilian Filipov. 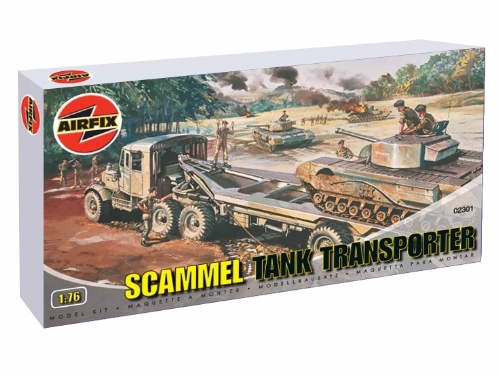 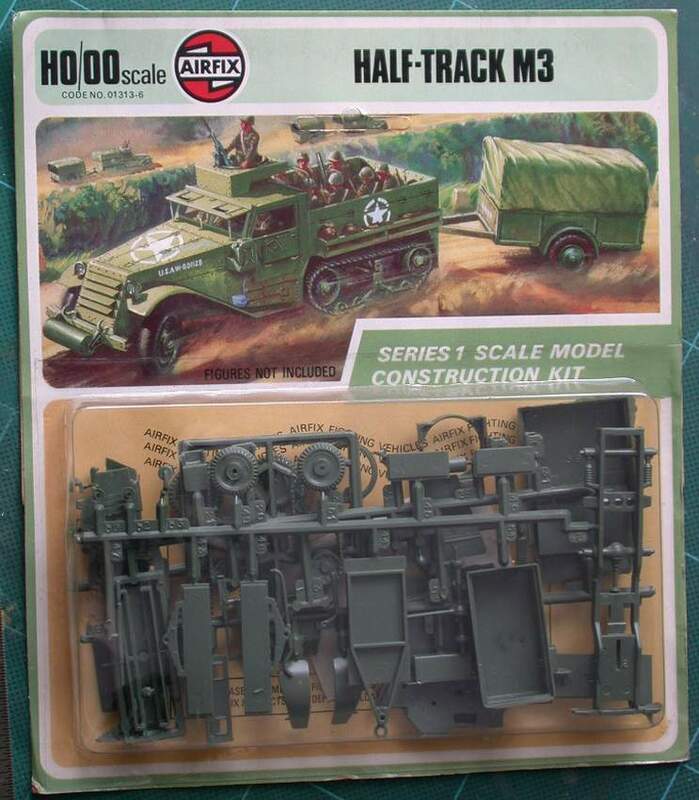 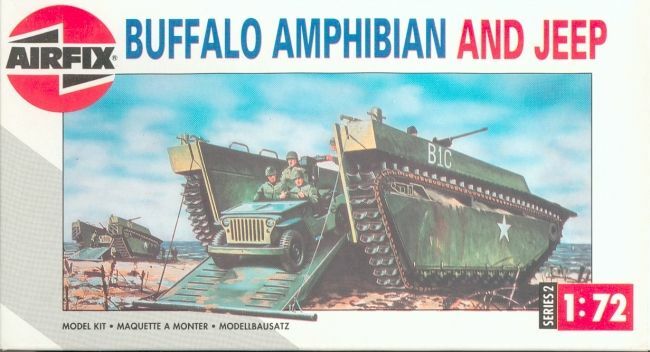 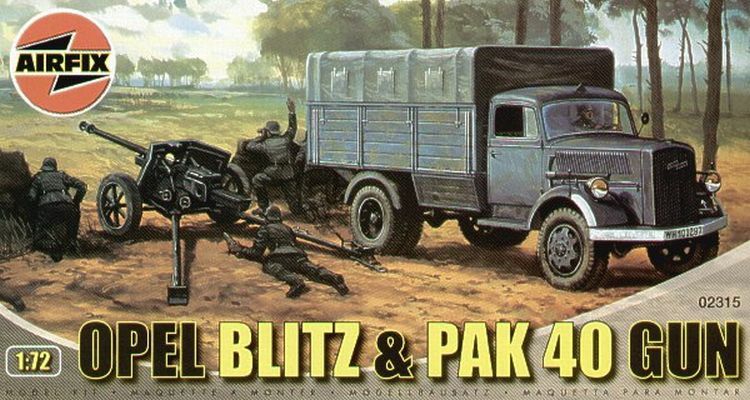 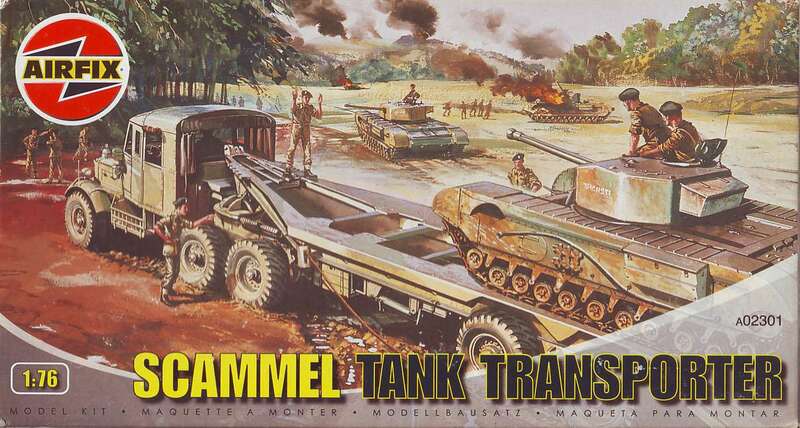 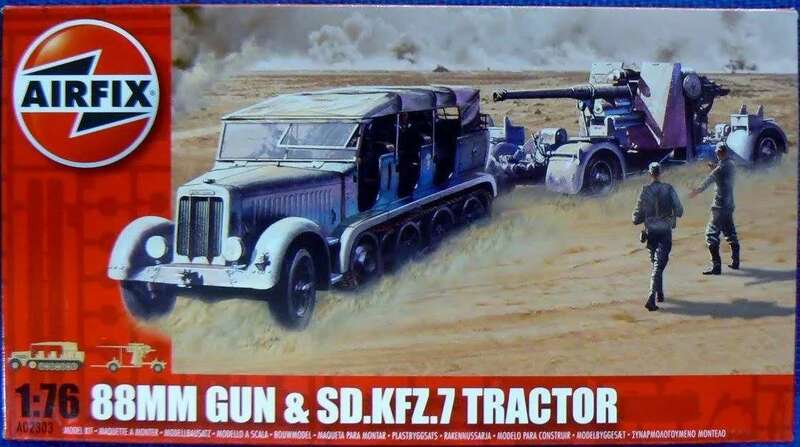 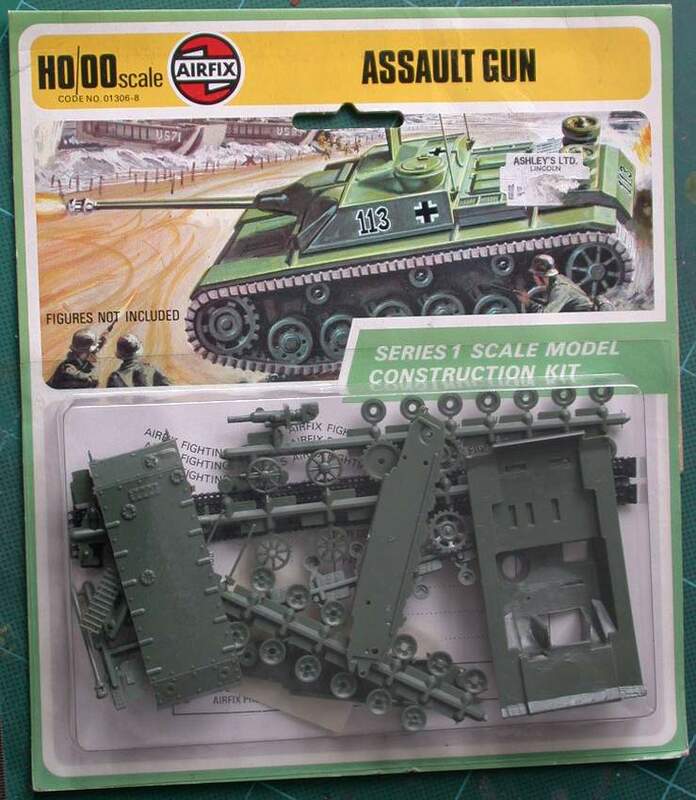 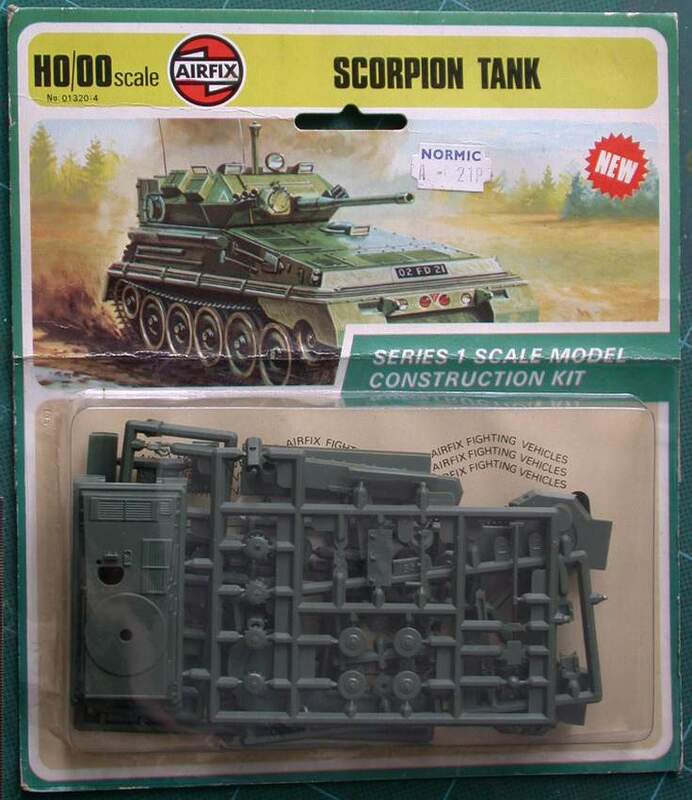 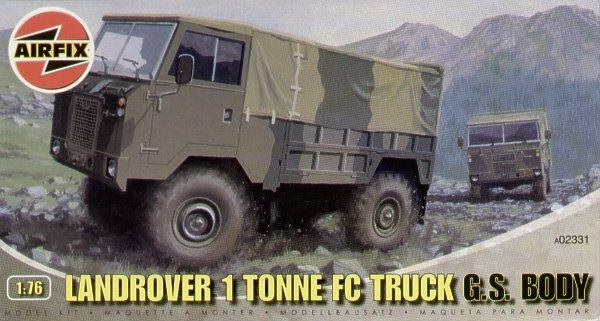 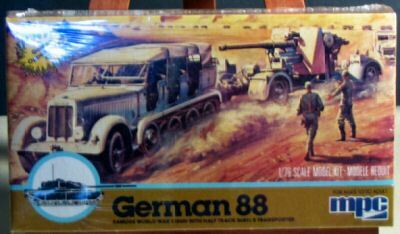 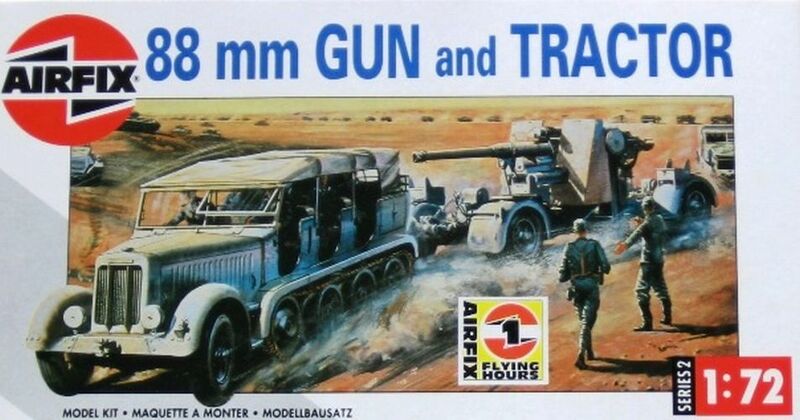 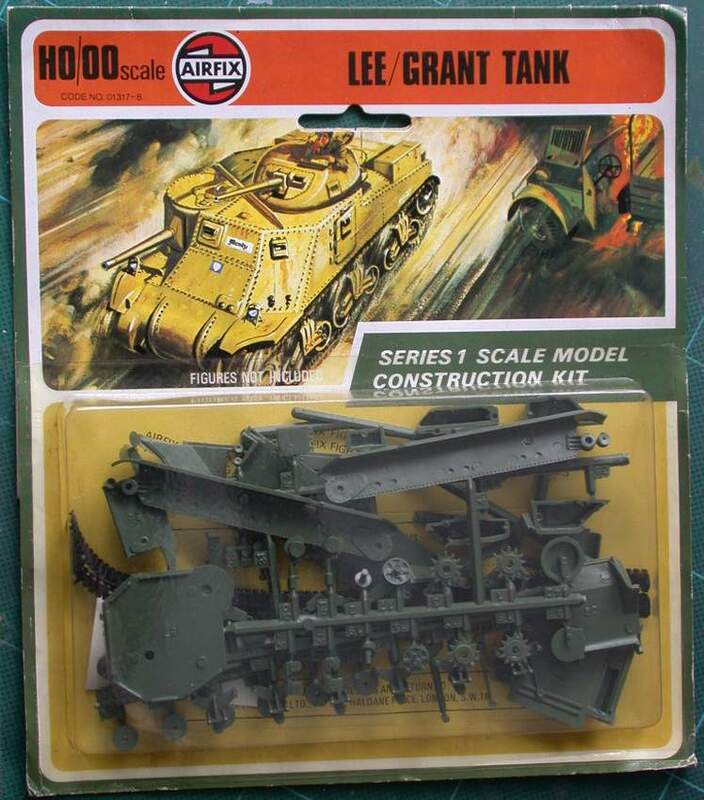 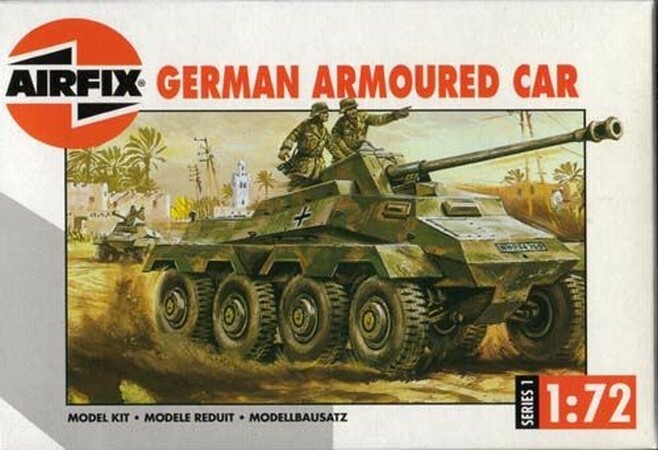 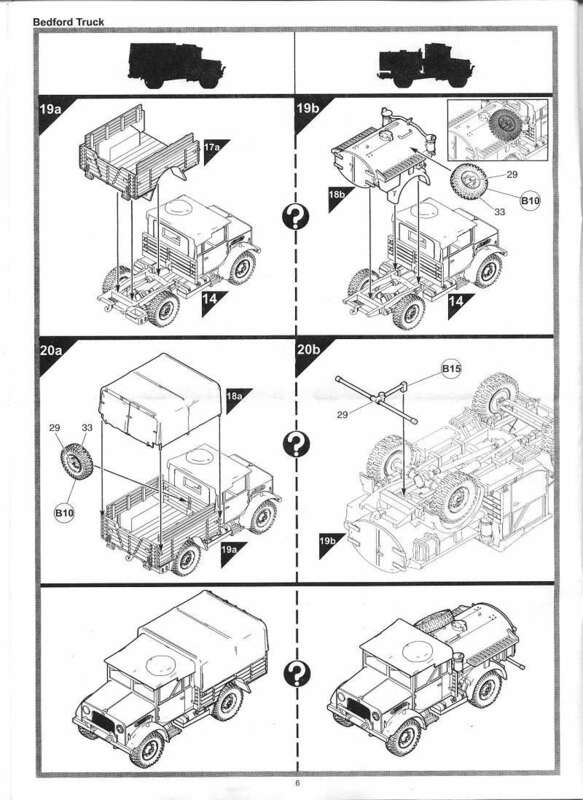 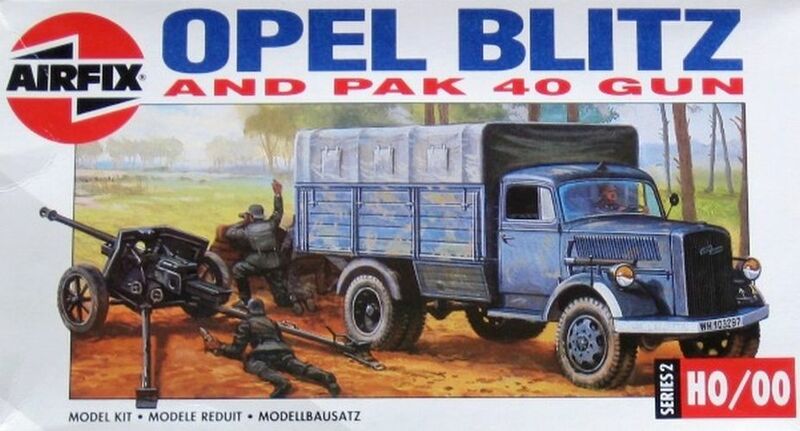 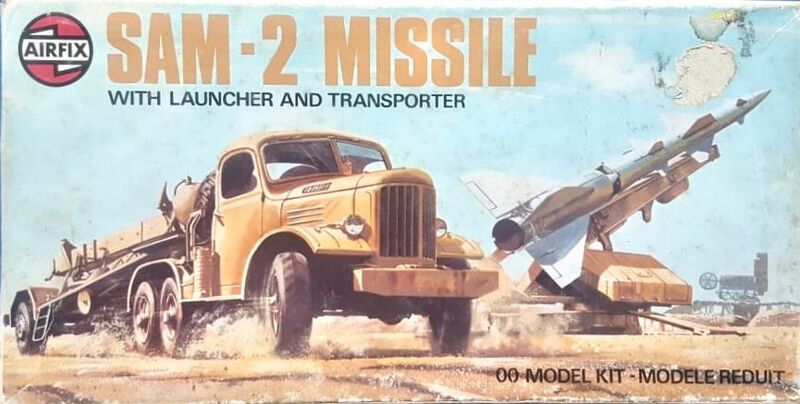 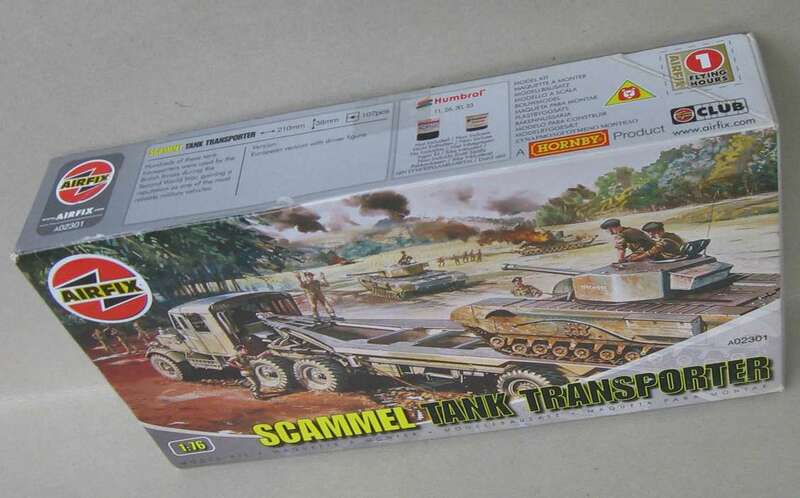 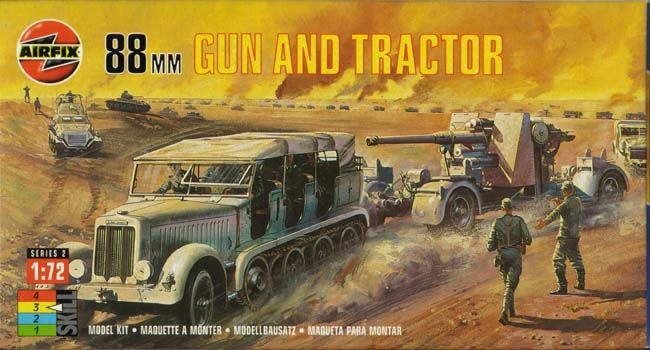 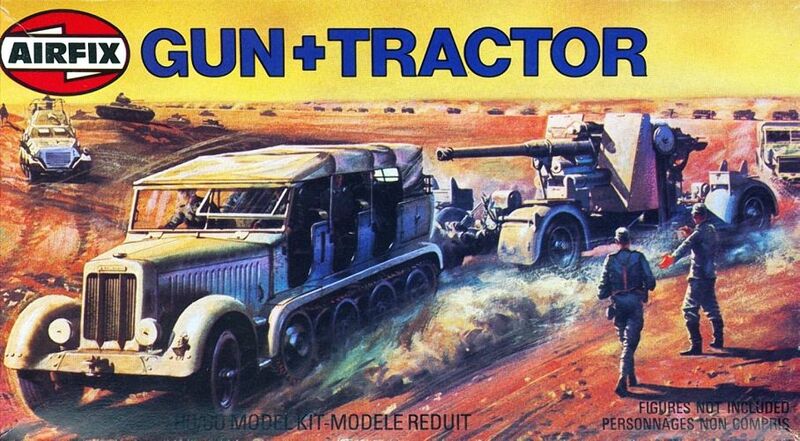 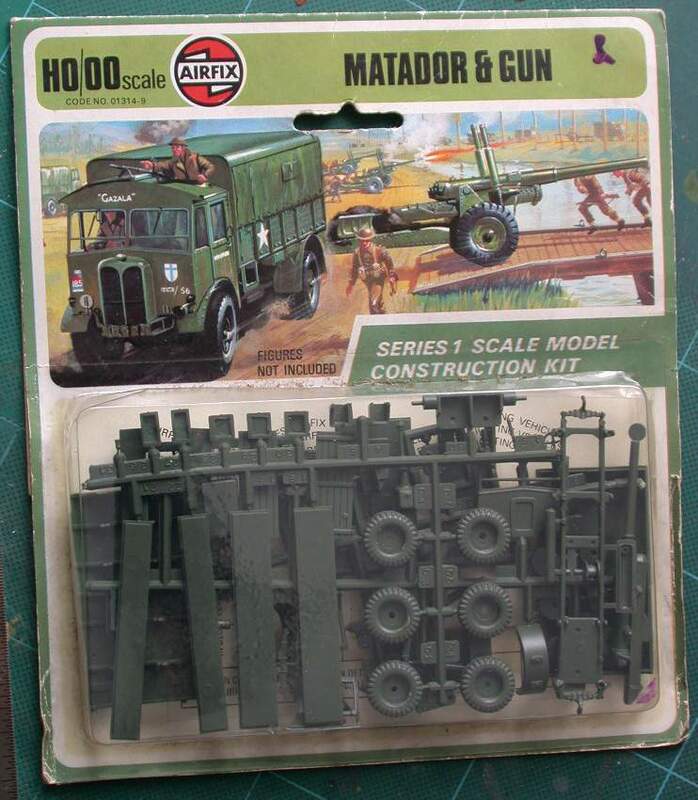 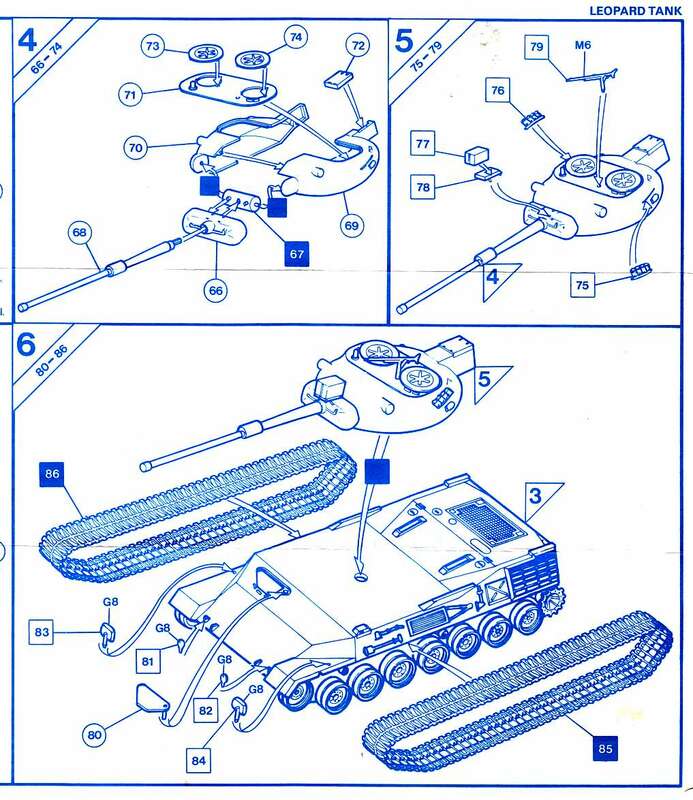 14-11-2011: Regarding the discusion concerning Airfix kit 2301 (Scammell tank transporter) mirrored box art, I bought one of these kits some time ago. 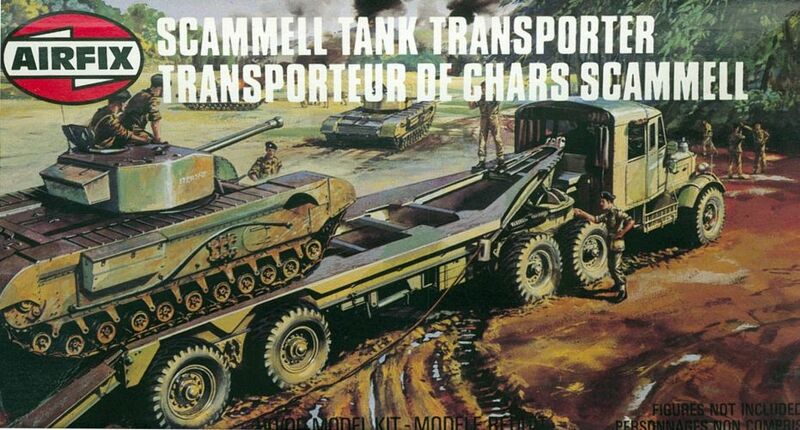 It featured both mirrored boxart and the wrong spelling of 'SCAMMEL'. 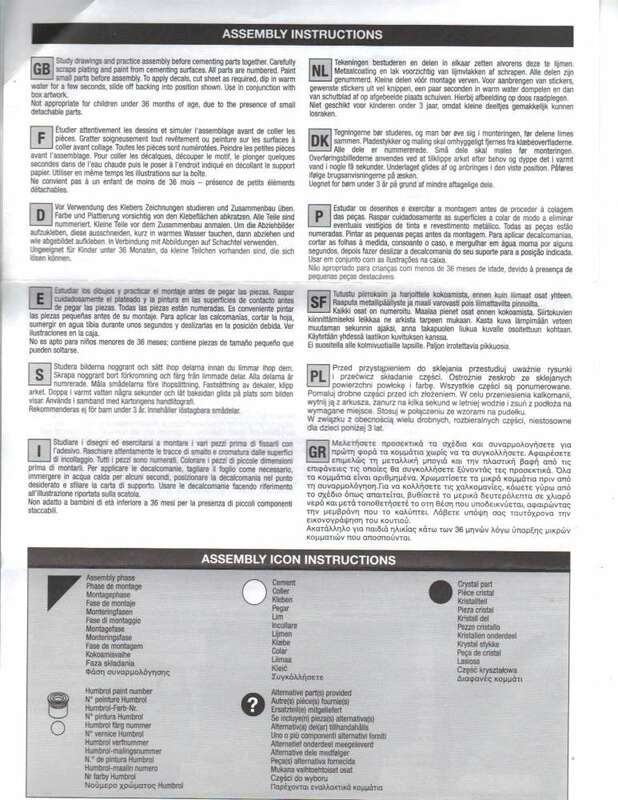 My kit is 'made in France' by Humbrol Group and I think it is of an earlier date than the 'made in India' kits. 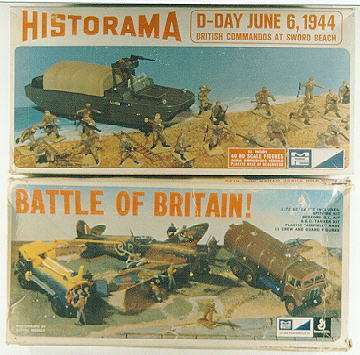 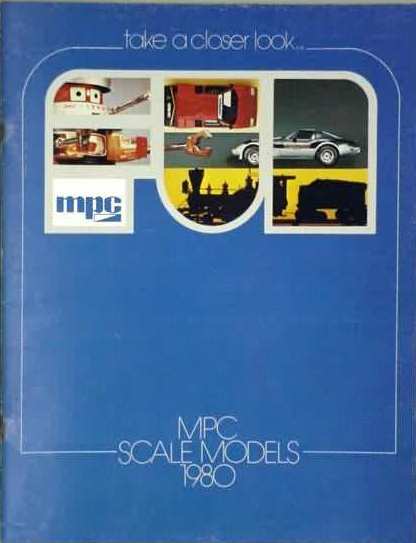 Adding to the rarity of this edition is the fact that it is labelled as 1:72 scale, while earlier and later editions state H0/00 and 1:76, respectively. 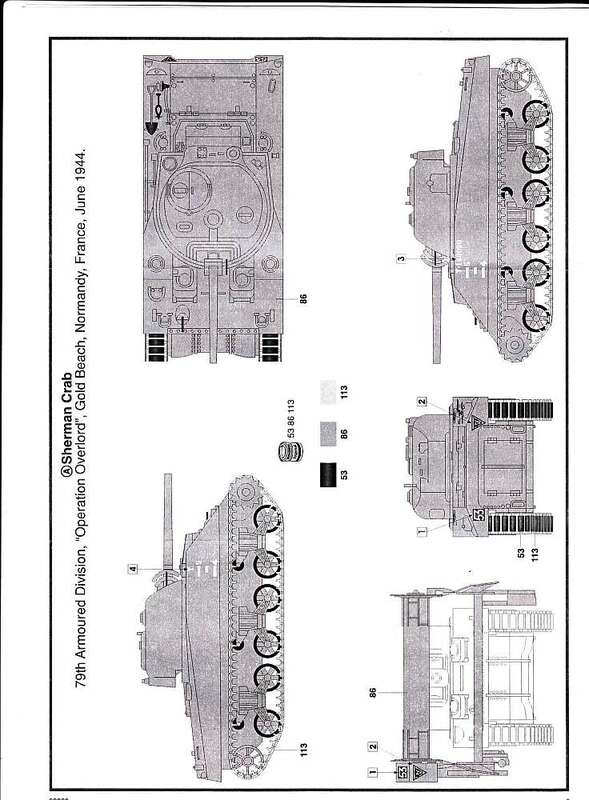 I hope the information is of interest. 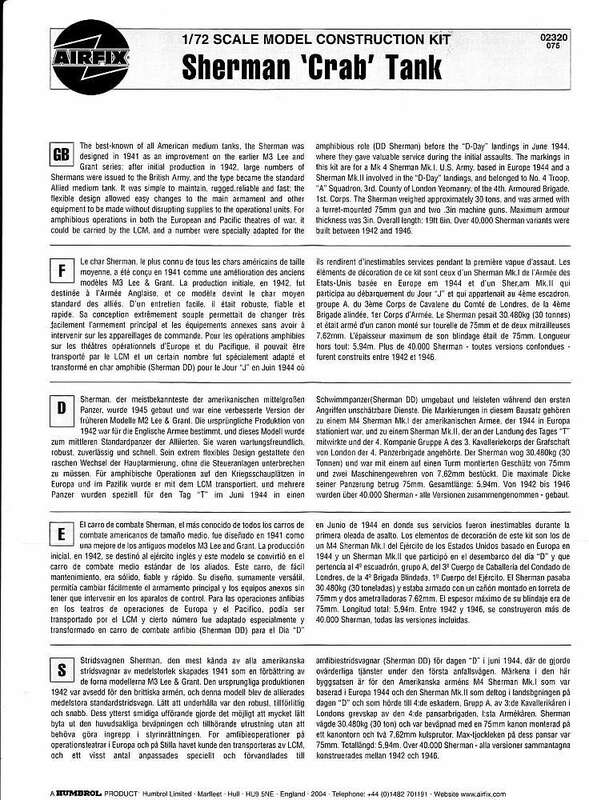 David Sanz, Madrid, Spain. 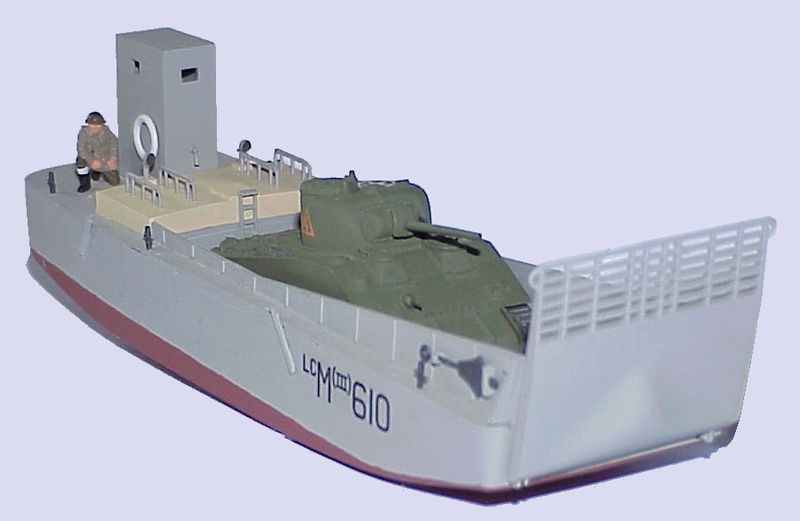 Model built by Alexandre Novellino. 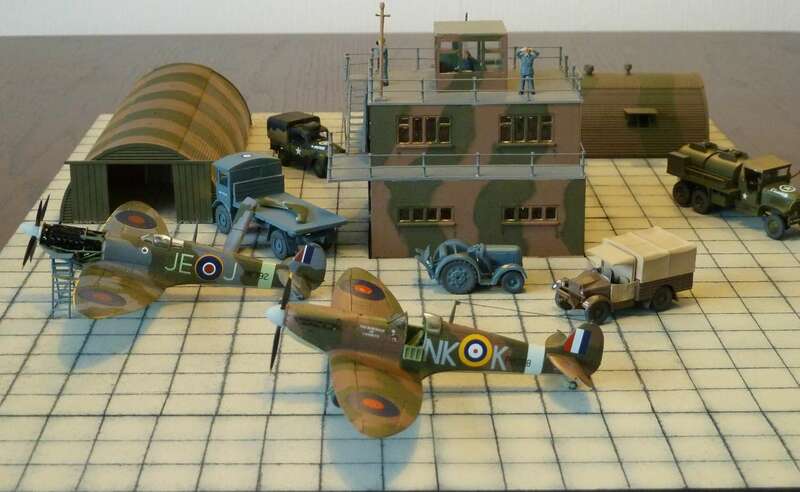 Models built by Mick Hill. 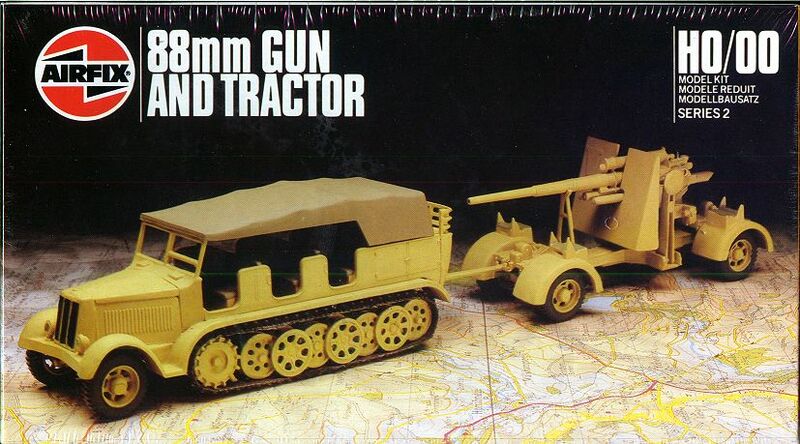 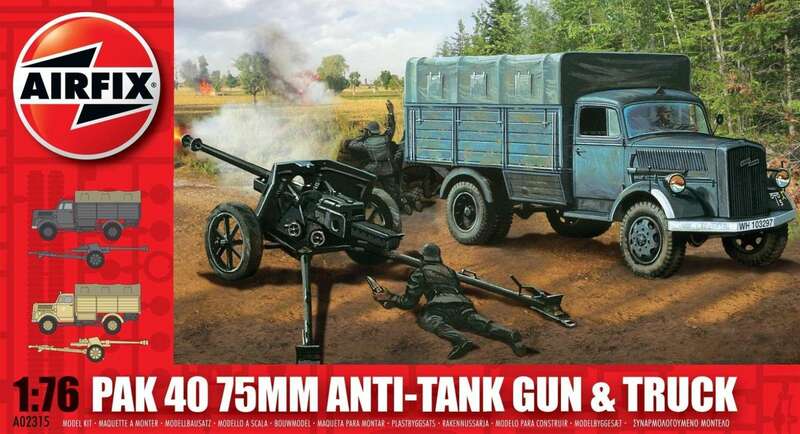 Kit 2303 88mm AA gun with tractor. 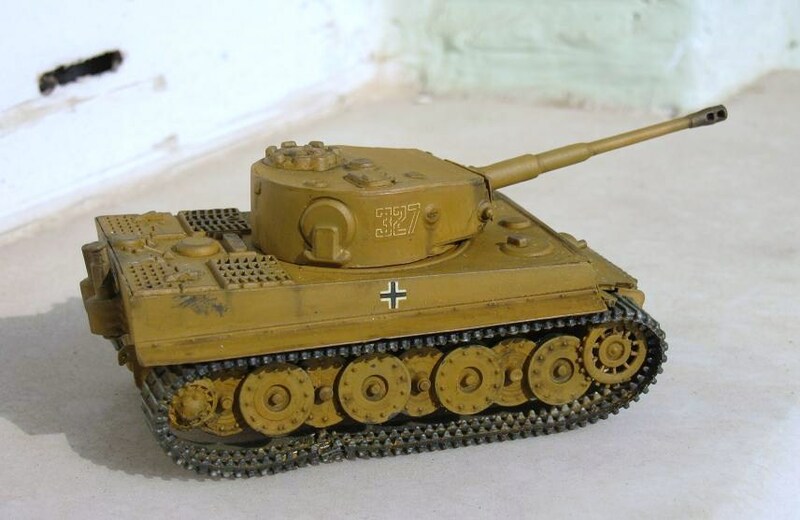 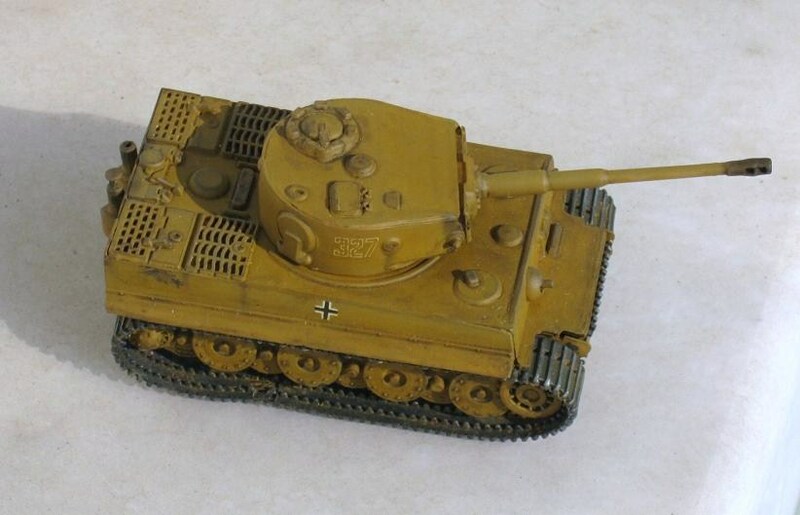 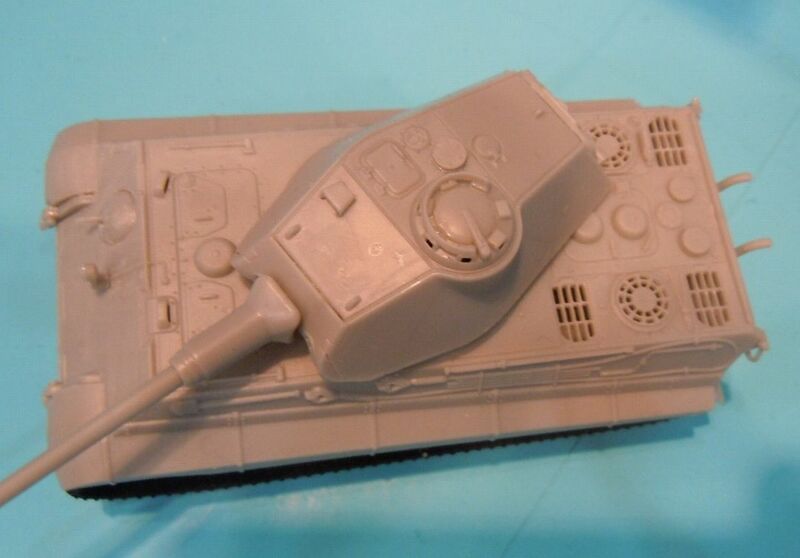 Kit 2308 Panzer IV tank. 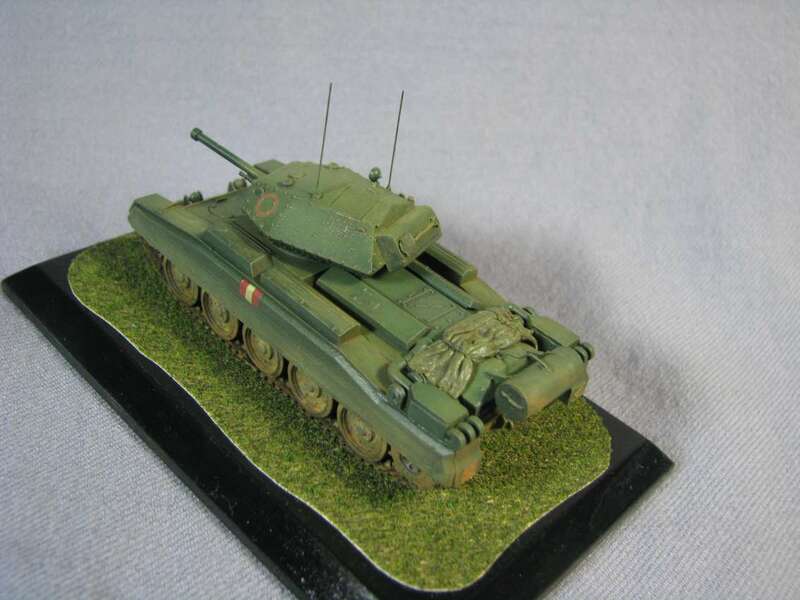 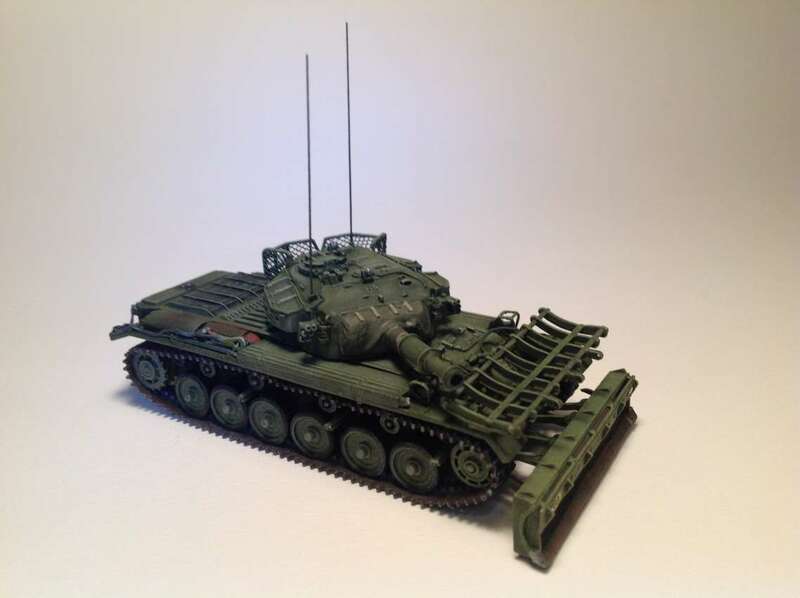 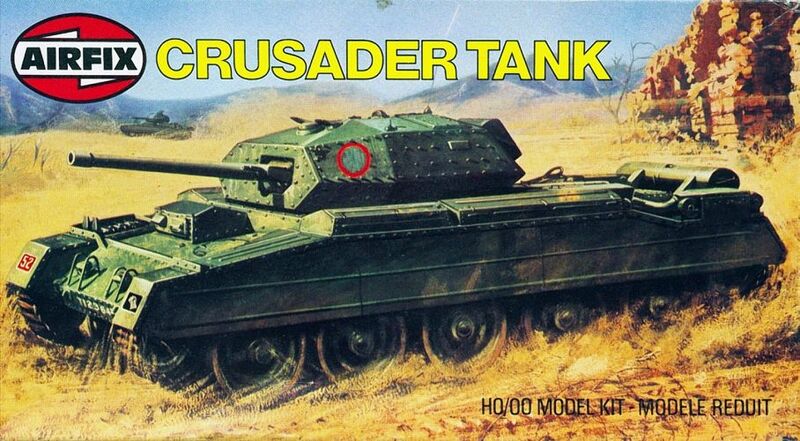 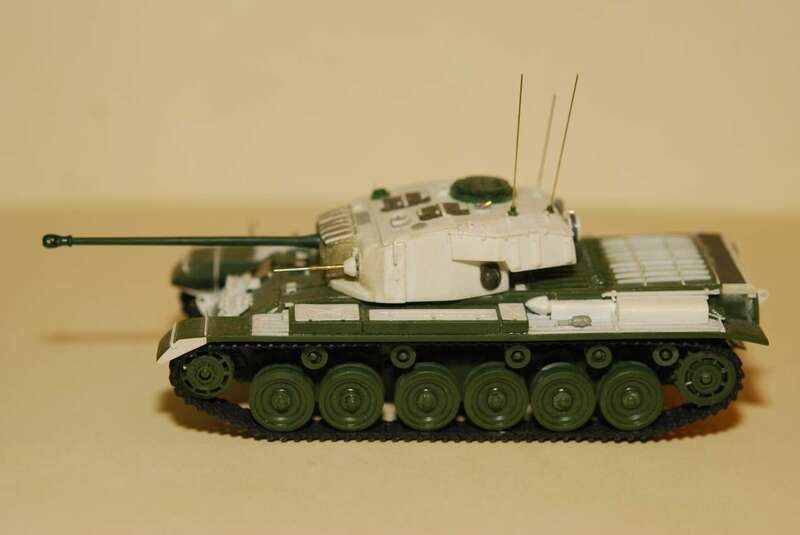 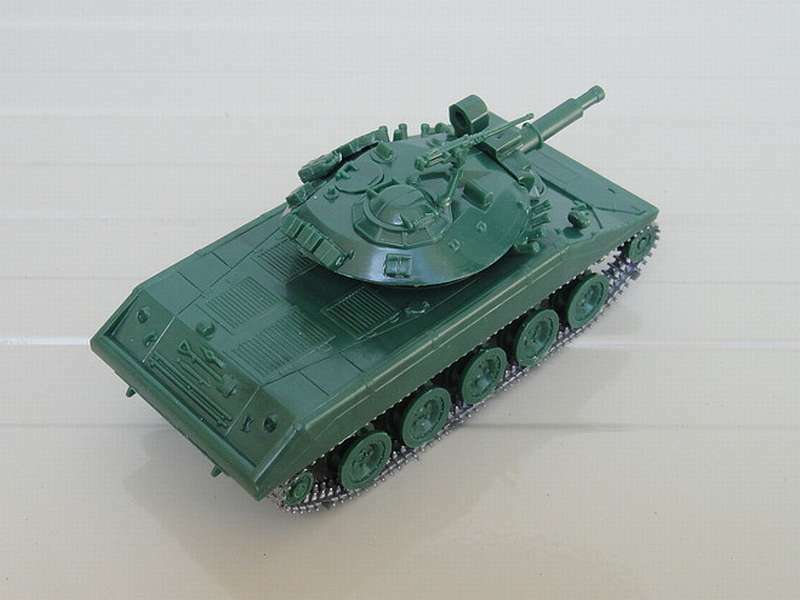 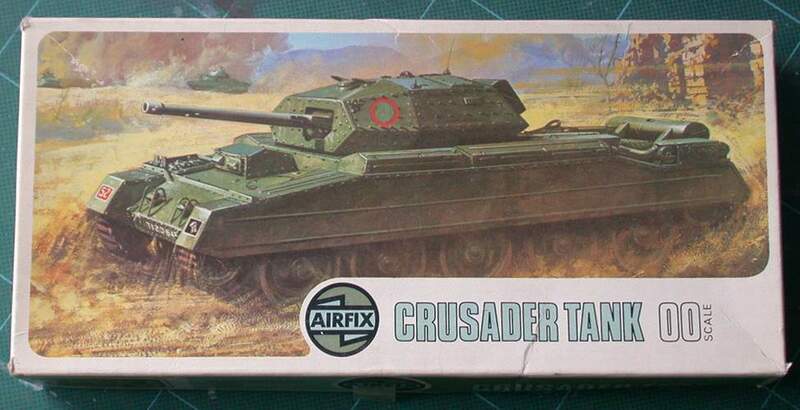 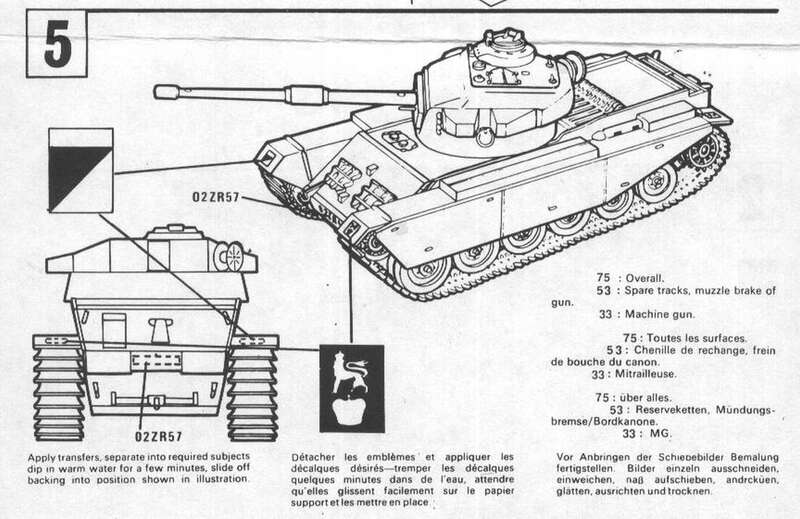 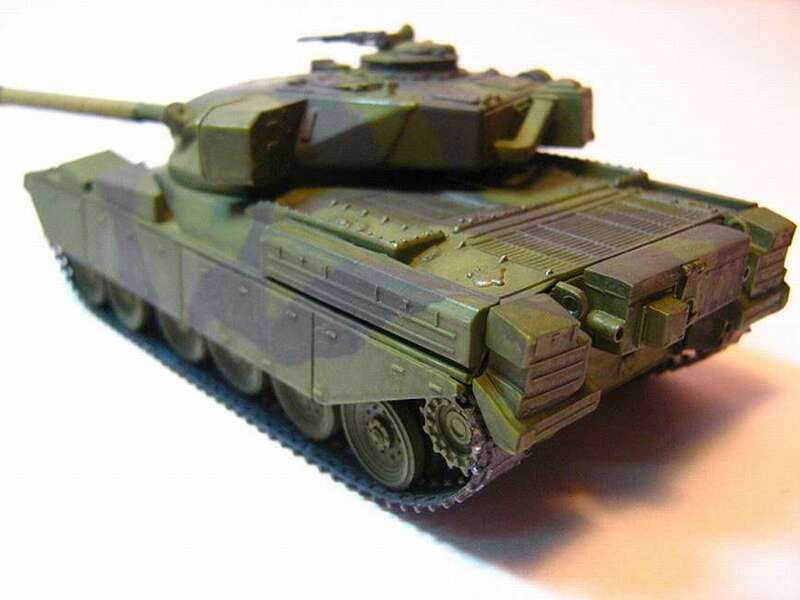 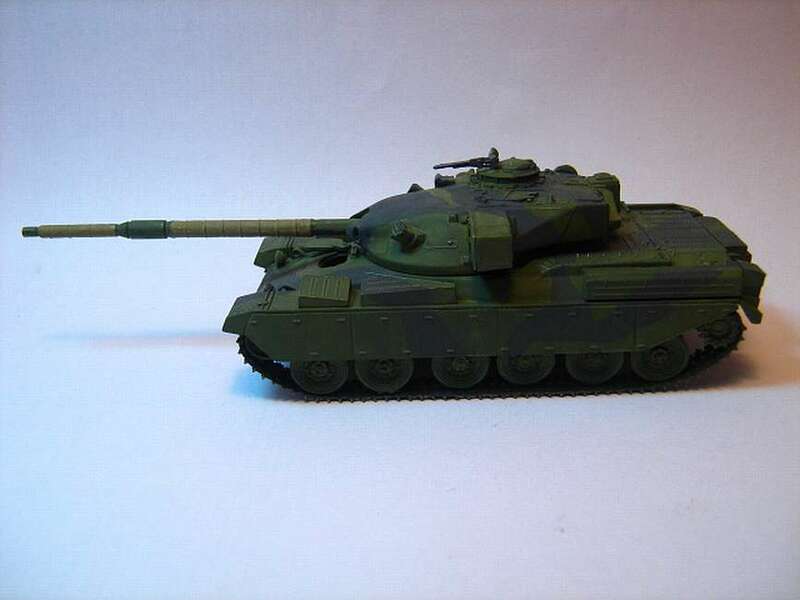 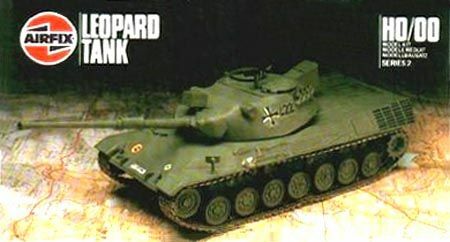 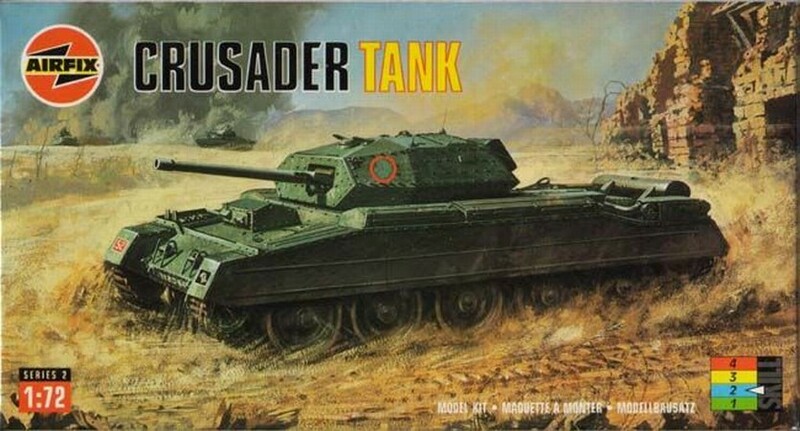 Kit 2310 - A15 Crusader tank. 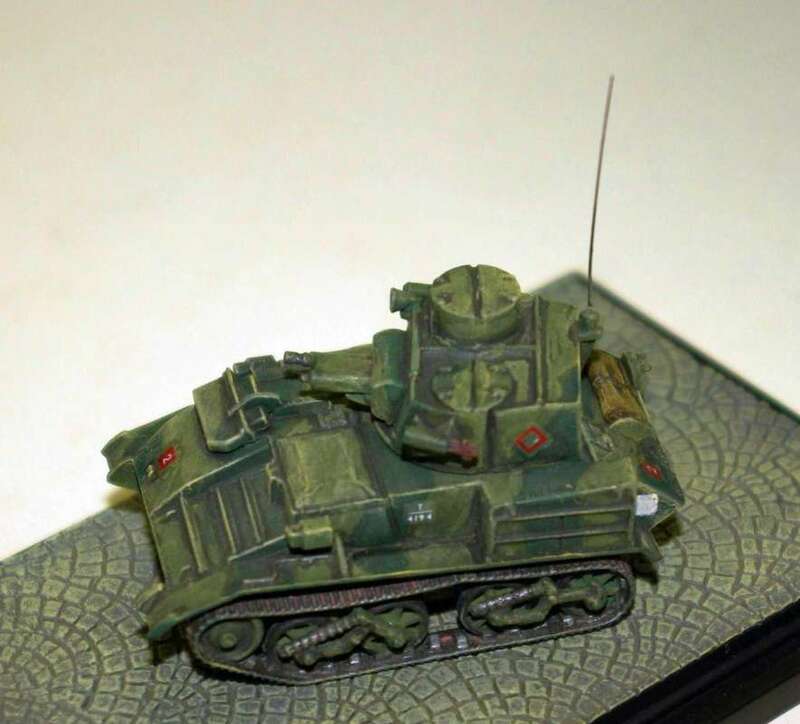 Model built by Zhenmin Han. 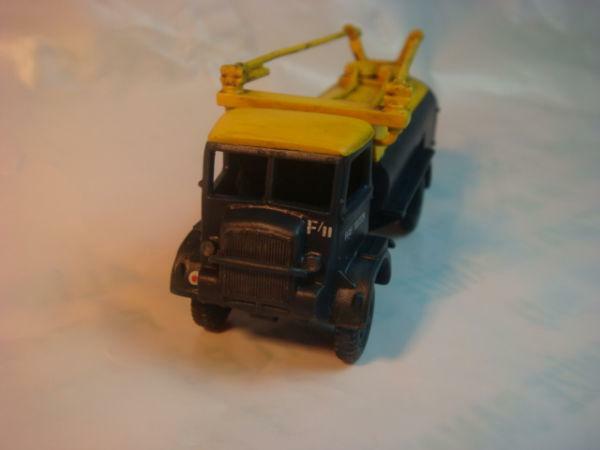 'MiniAfv' Blogspot - part 1. 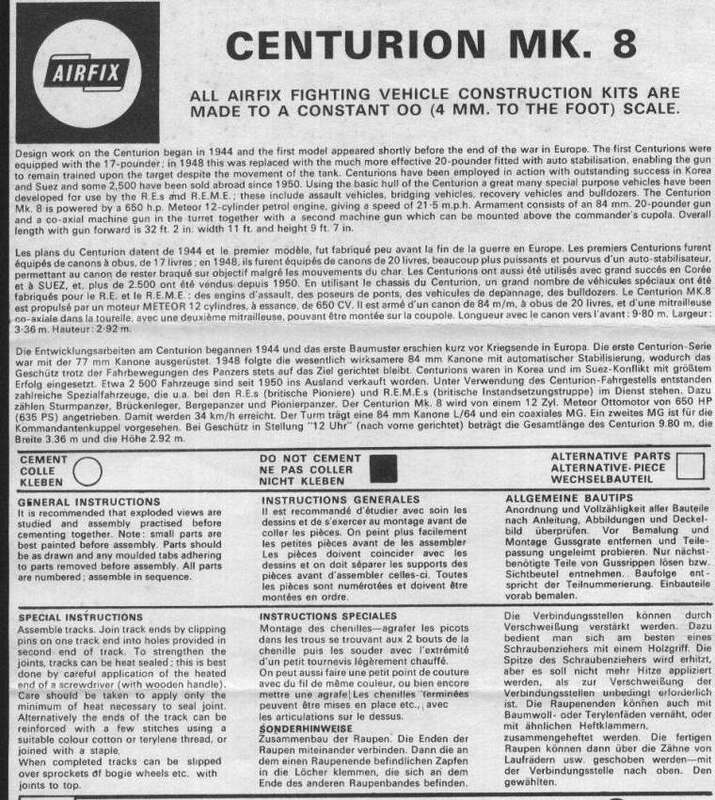 'MiniAfv' Blogspot - part2 completed. 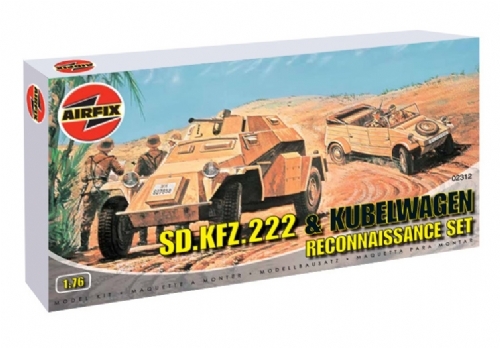 Kit 2312 German reconnaissance set. 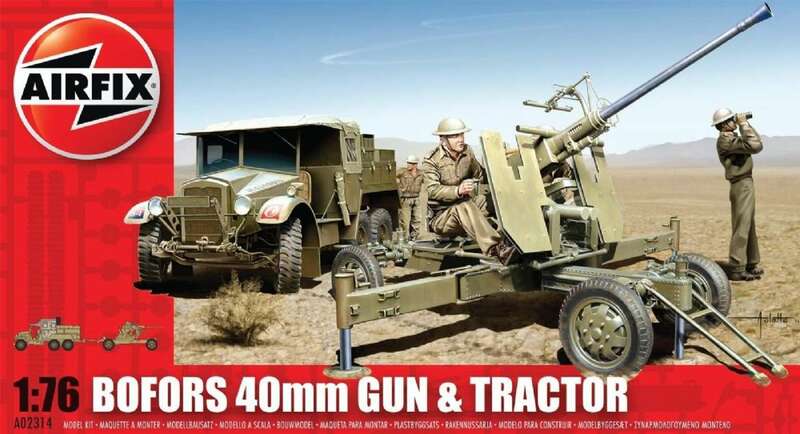 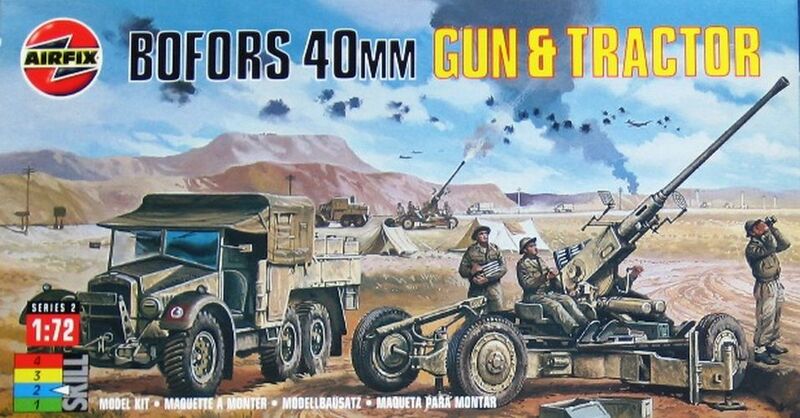 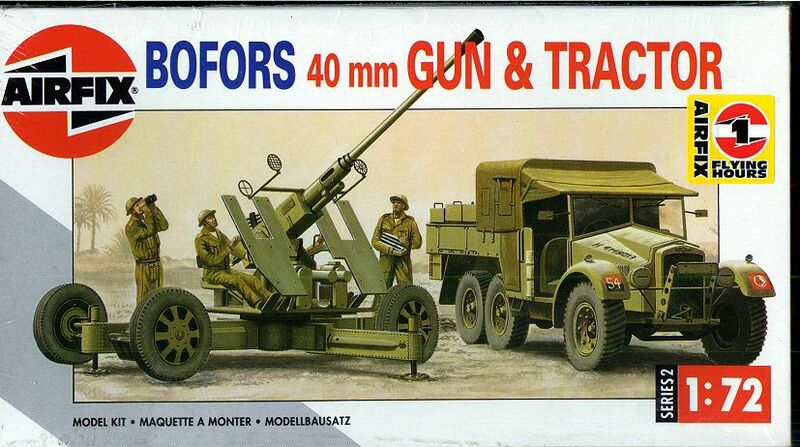 Kit 2314 Bofors 40mm Gun with tractor. 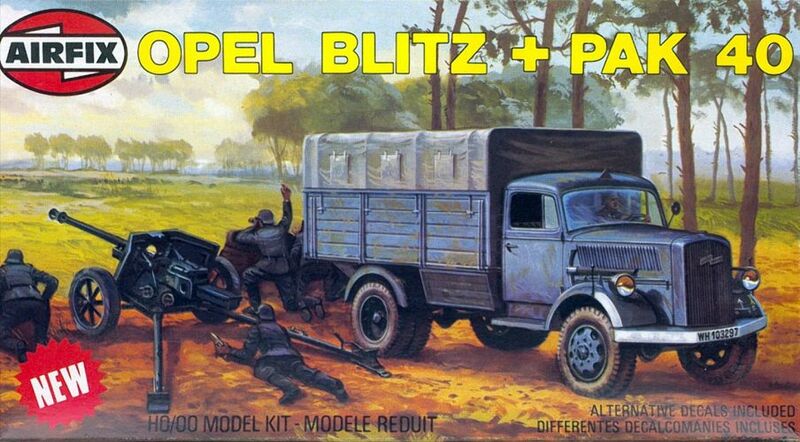 Kit 2315 Opel Blitz with AT40 gun. 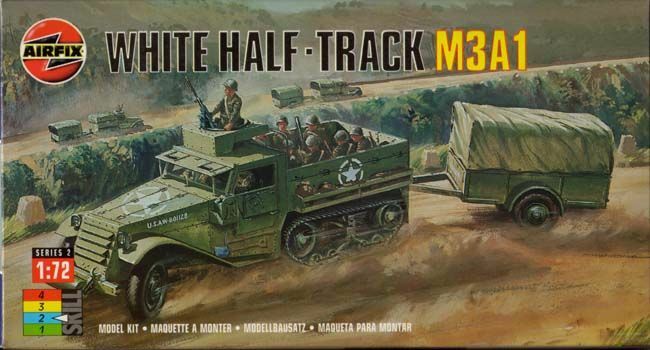 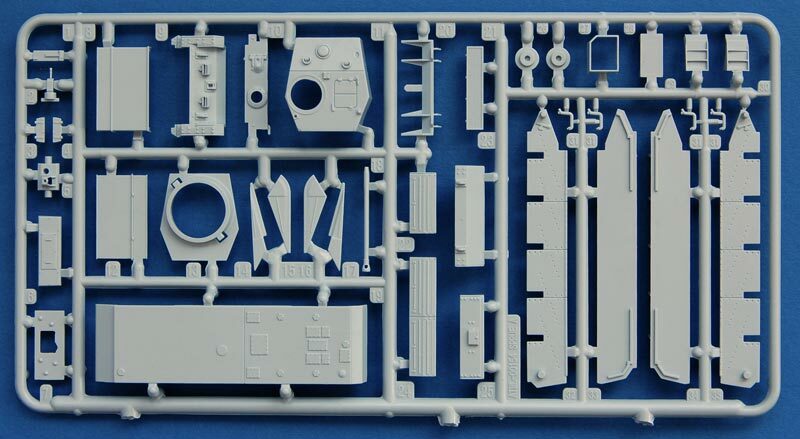 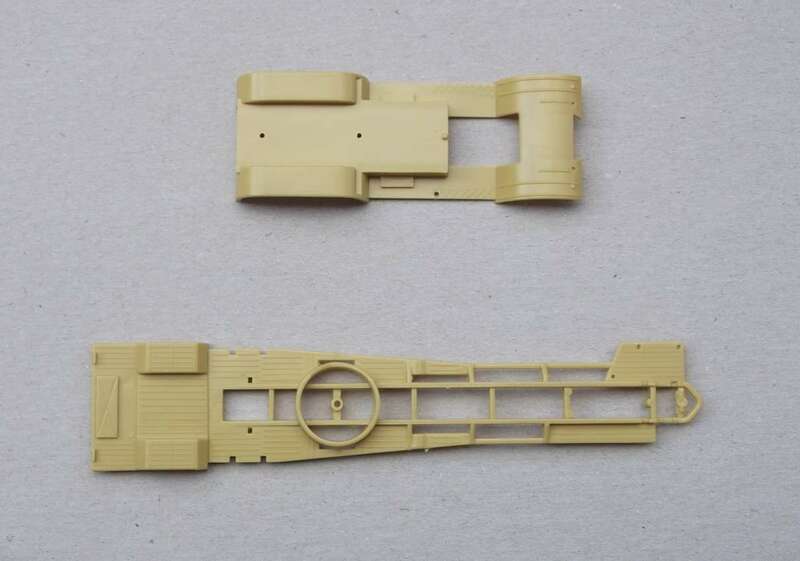 Kit 2318 White halftrack M3A1. 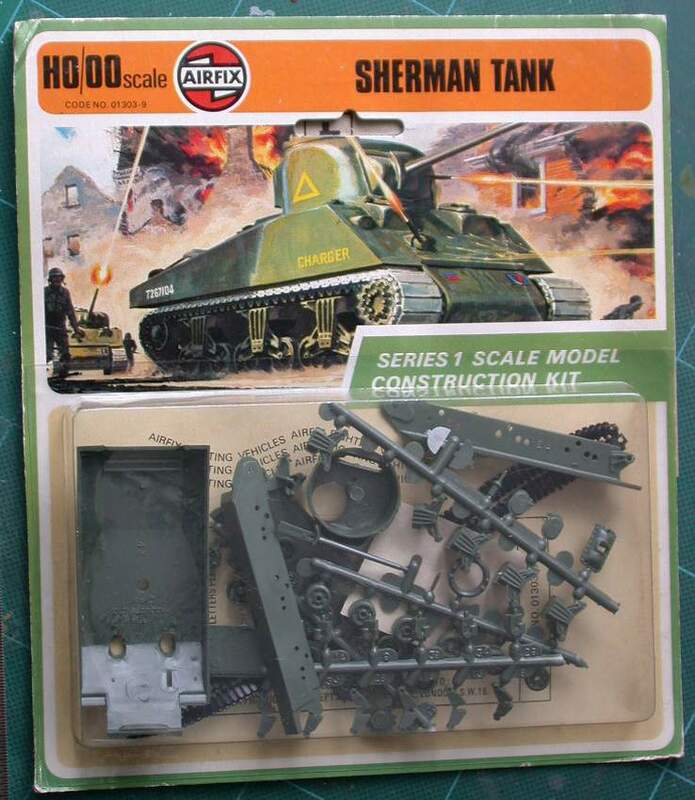 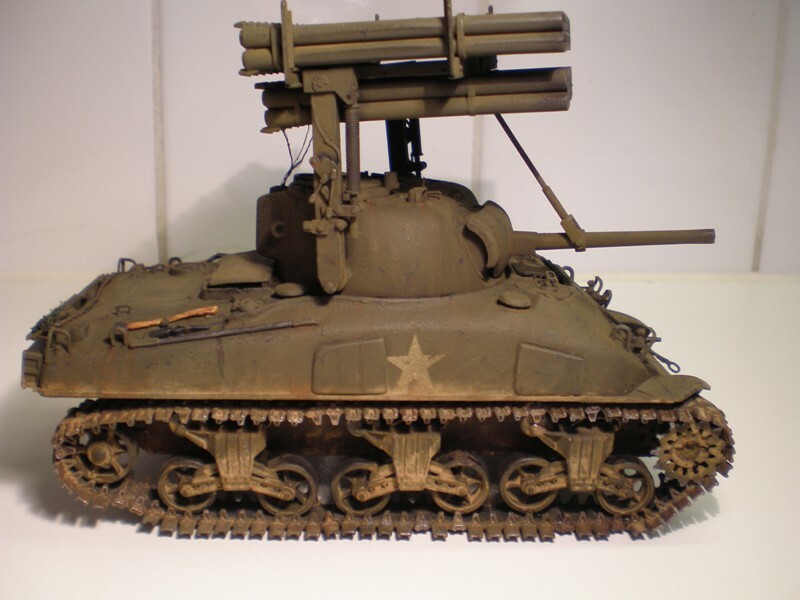 Kit 2320 - Sherman with Crab mine clearing device. 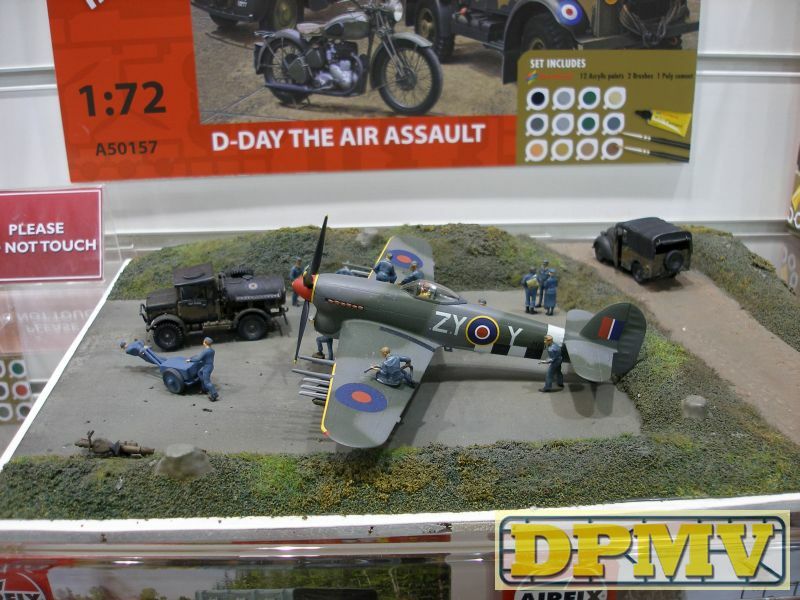 Pictures taken at the Airfix tribute forum. 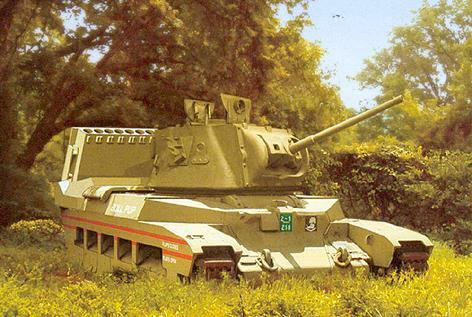 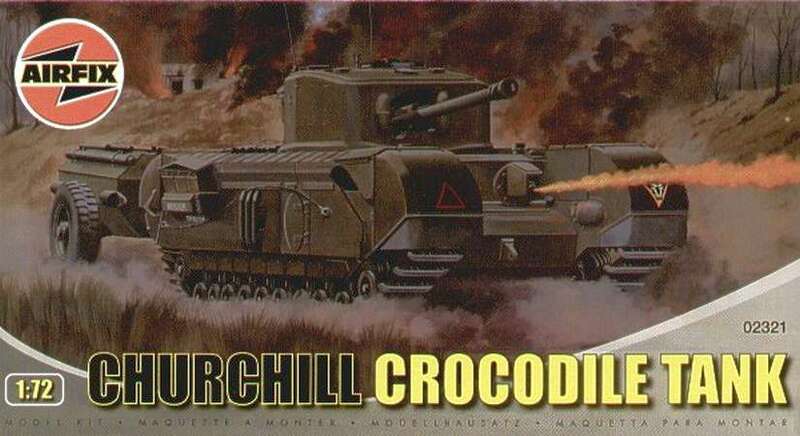 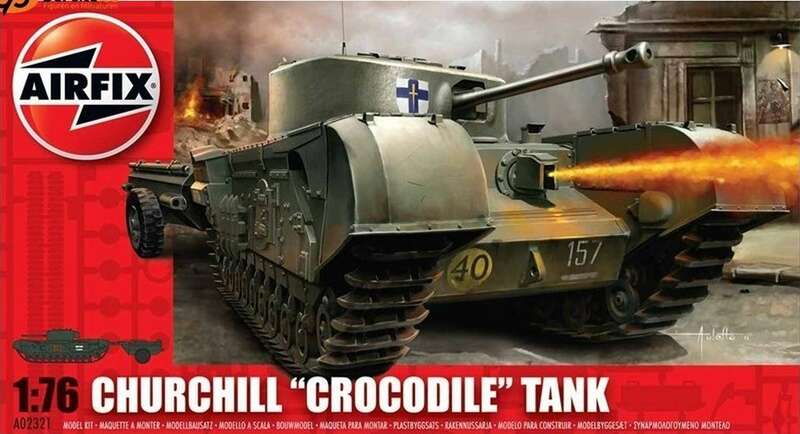 Kit 2321 - Churchill with 'Crocodille' flamethrower. 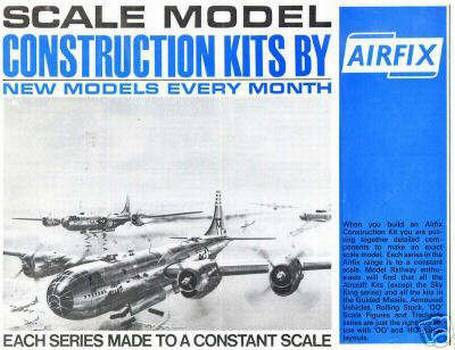 Note: The kits 2320 and 2321 are not new kits. 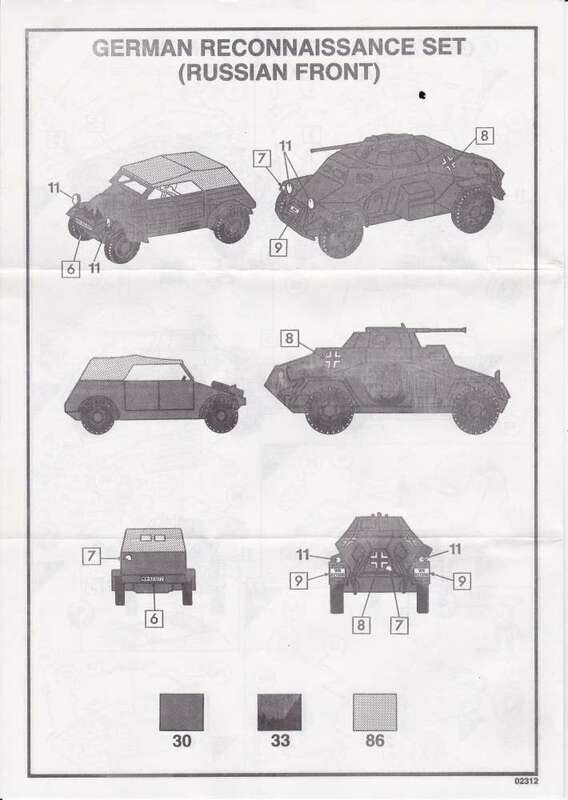 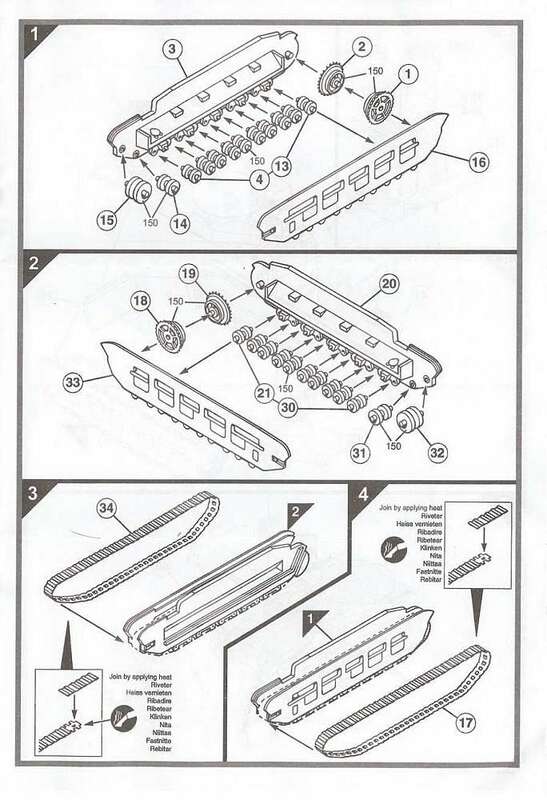 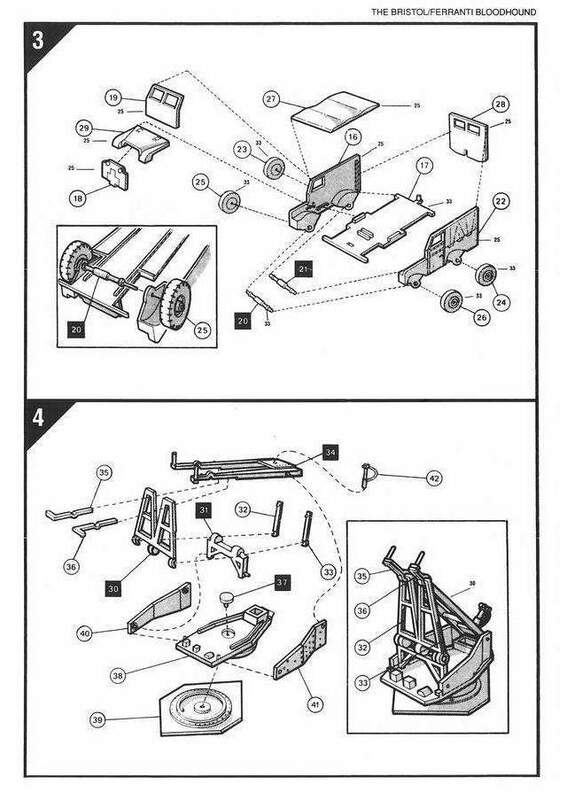 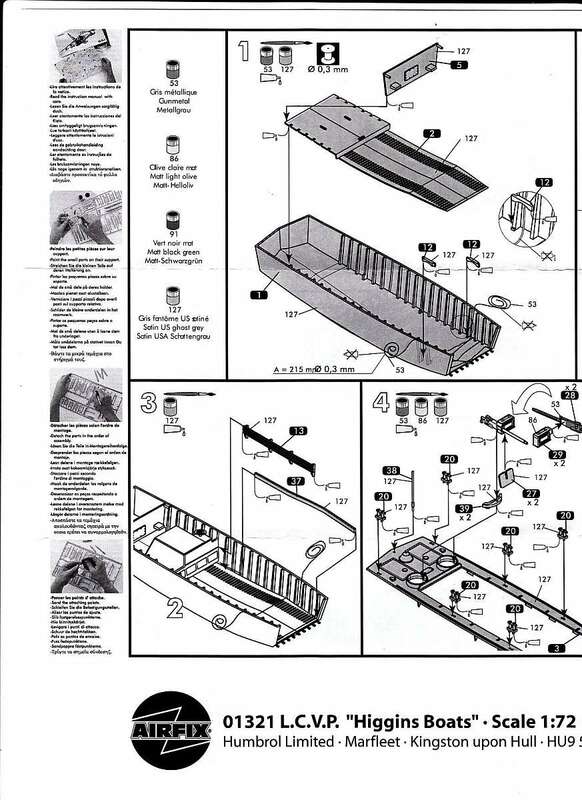 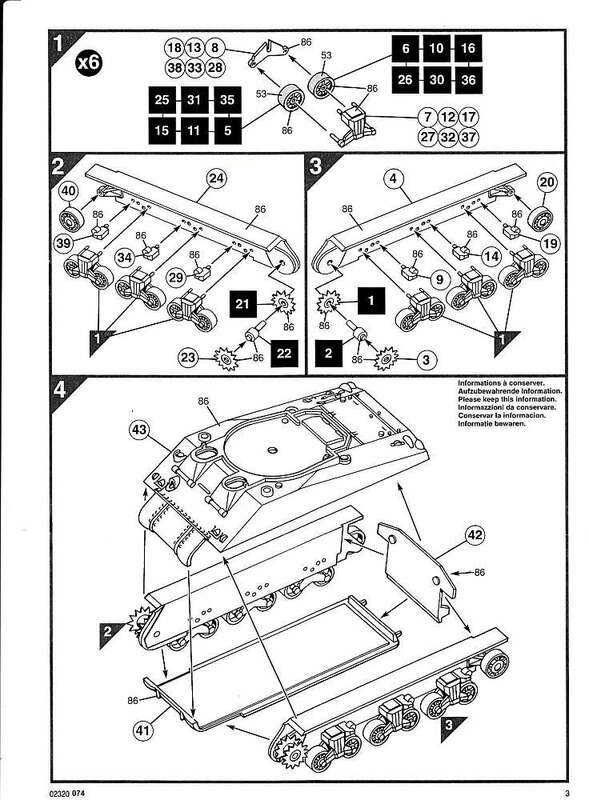 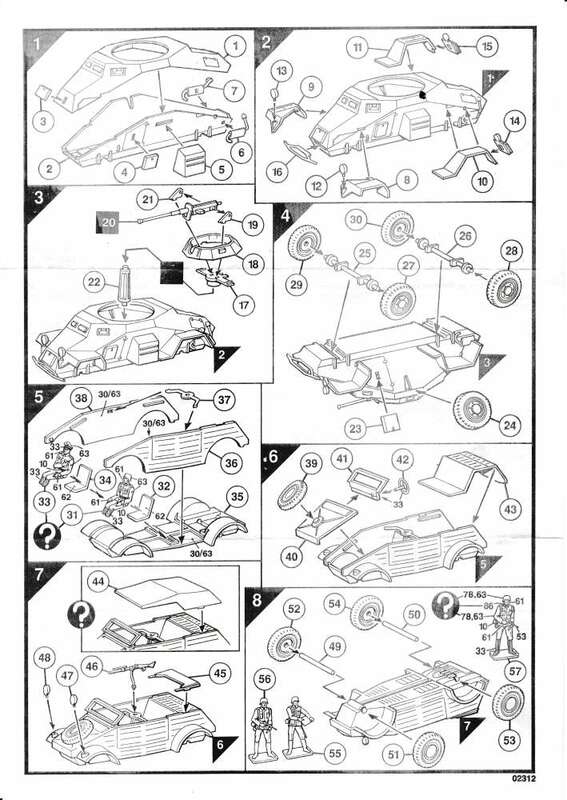 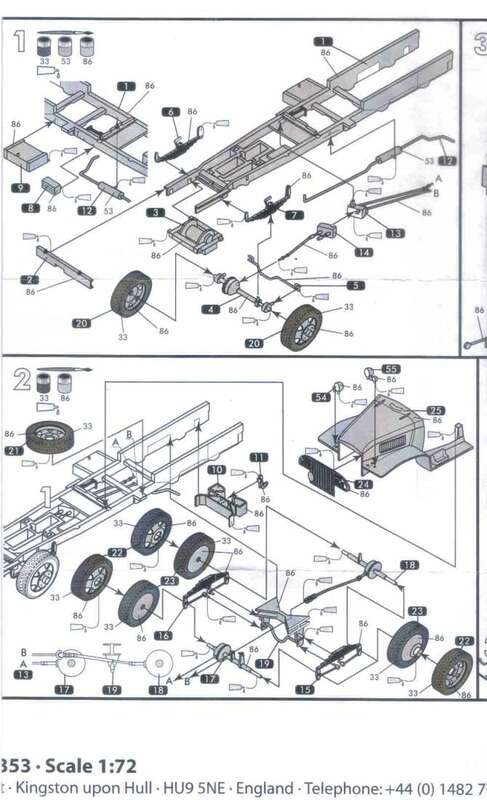 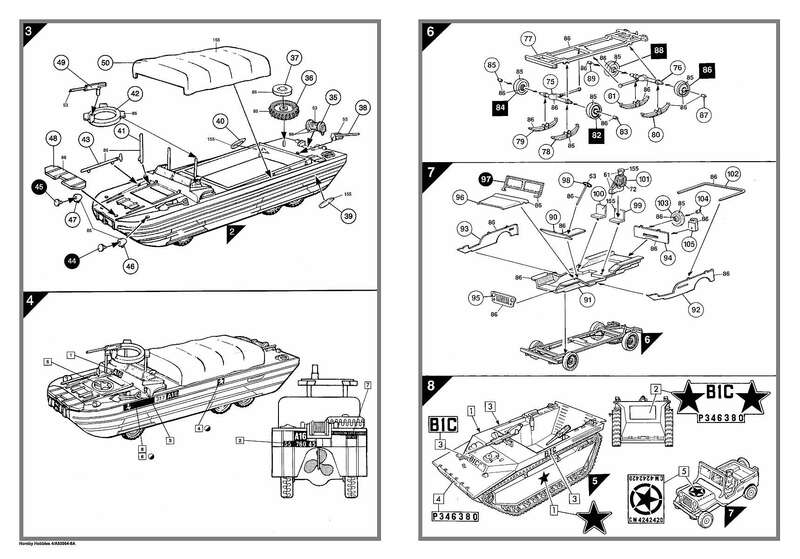 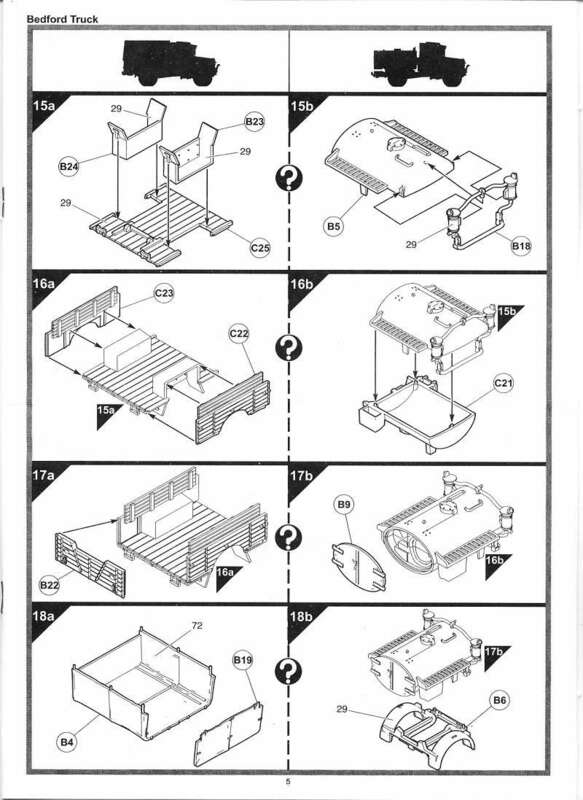 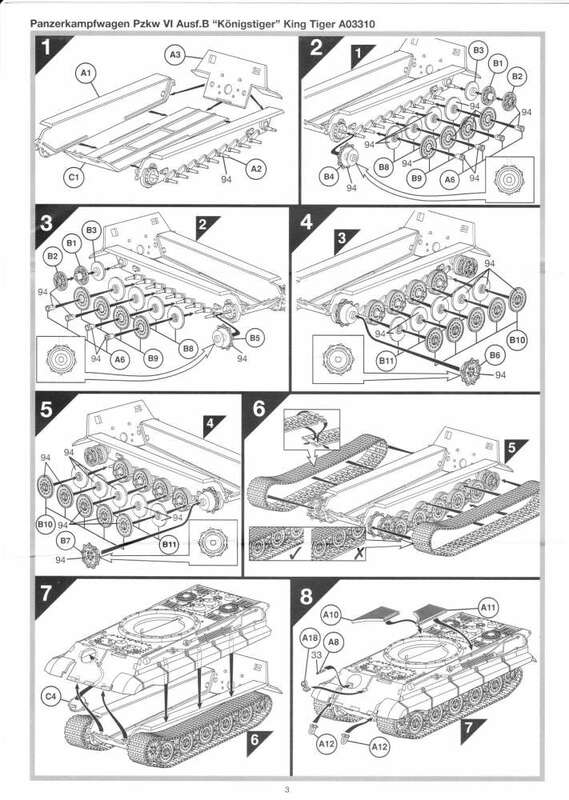 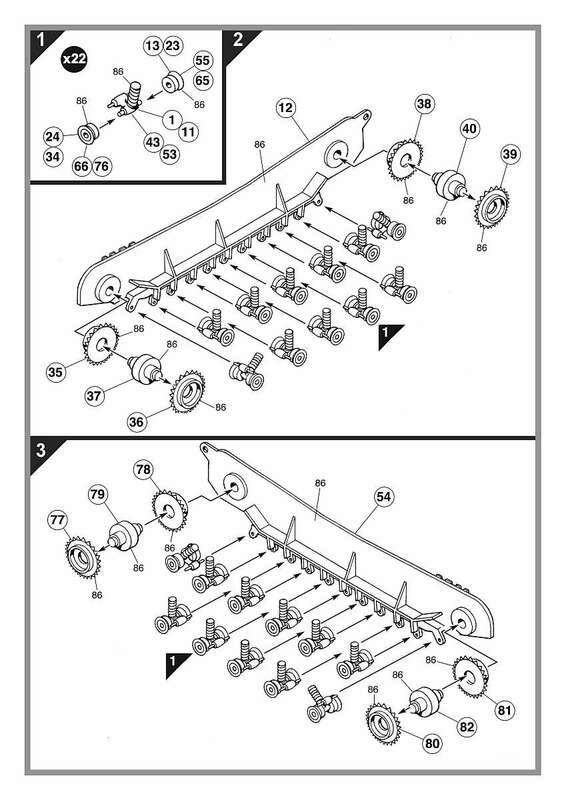 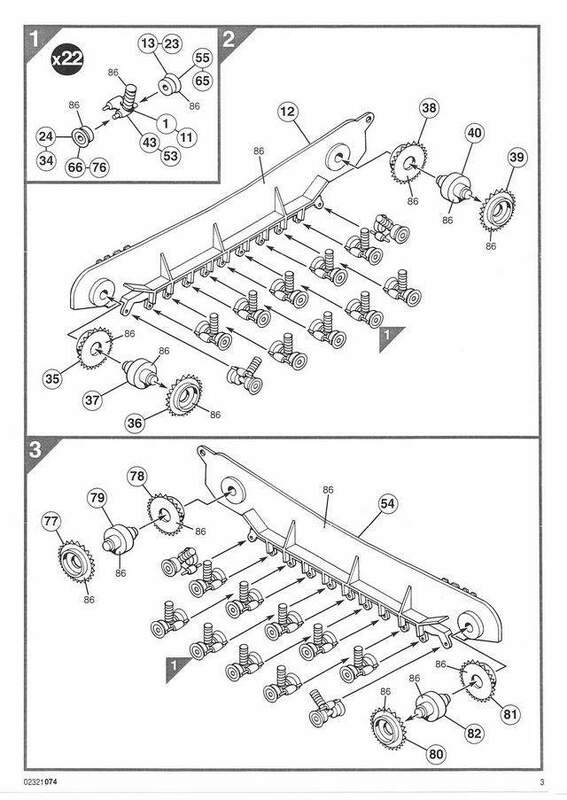 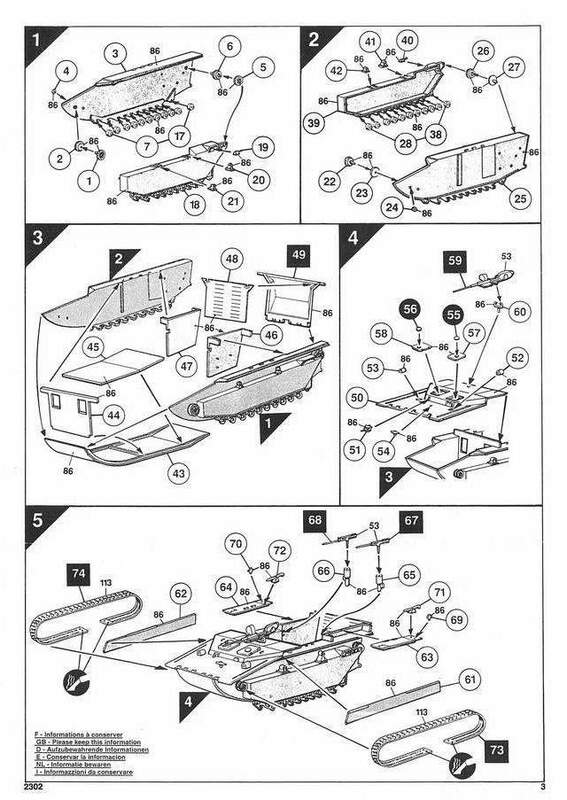 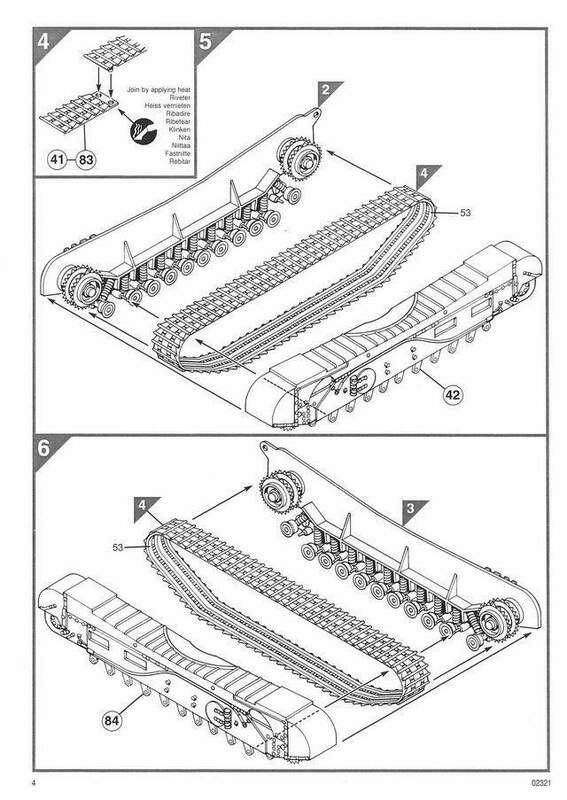 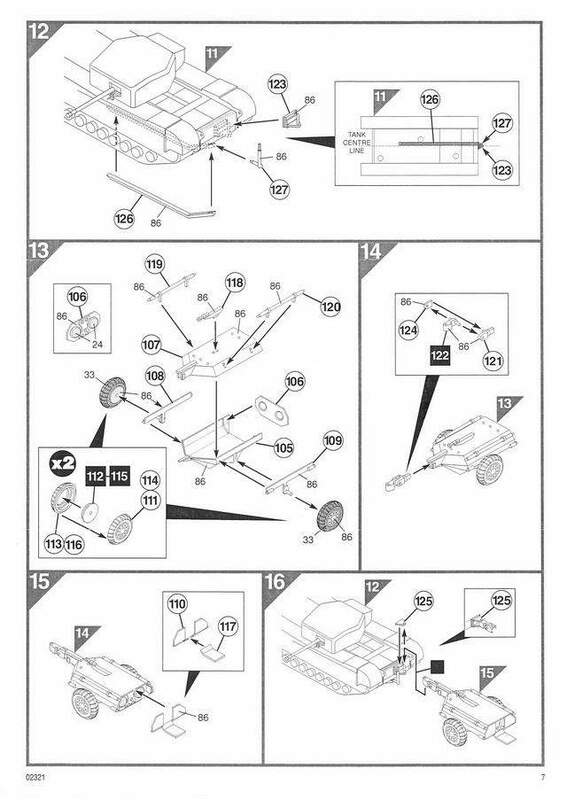 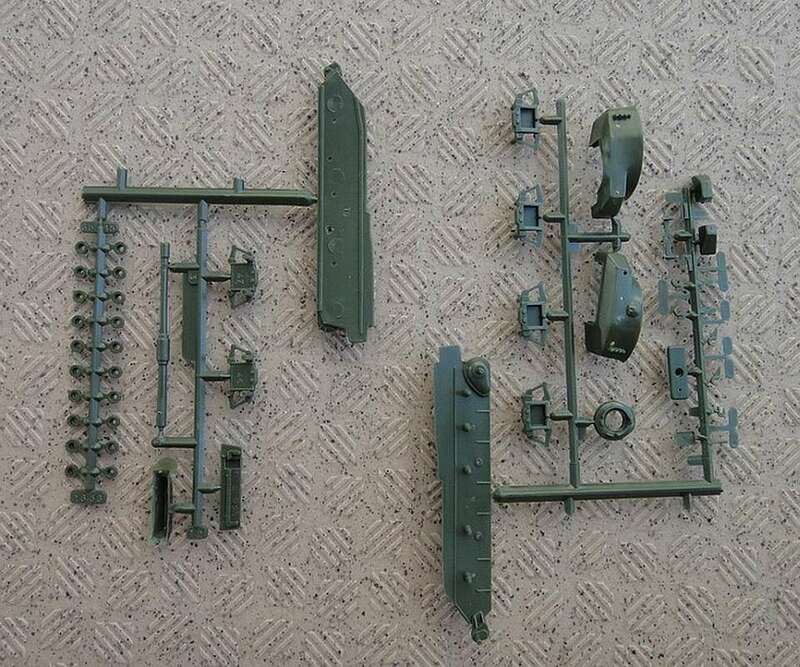 Only the parts for the 'Crab' and 'Crocodile' are new. 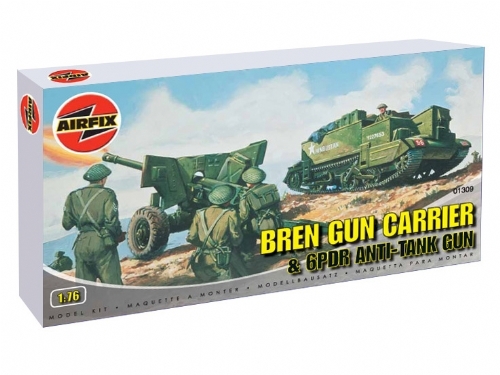 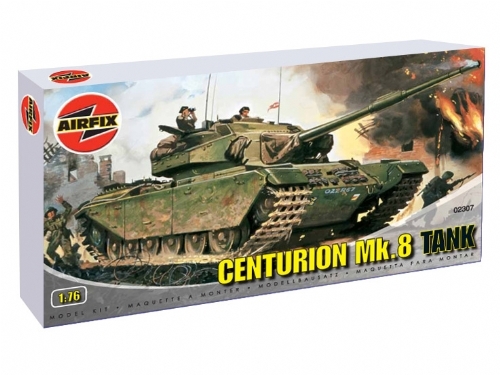 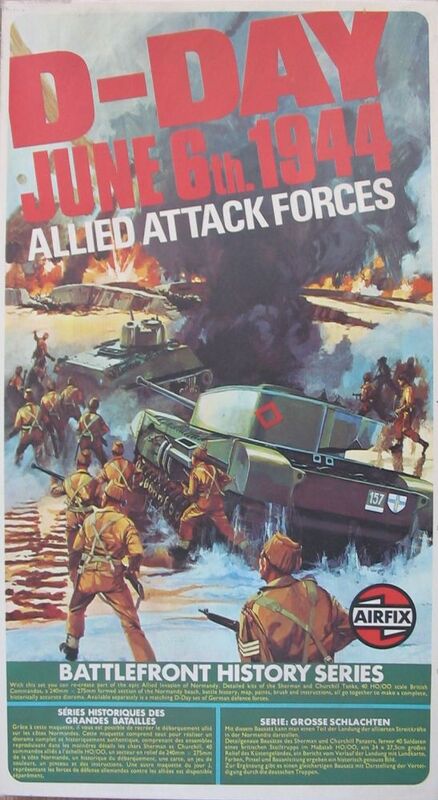 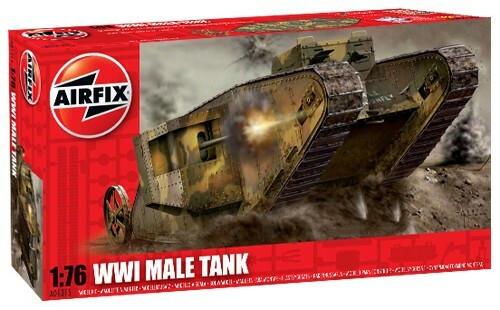 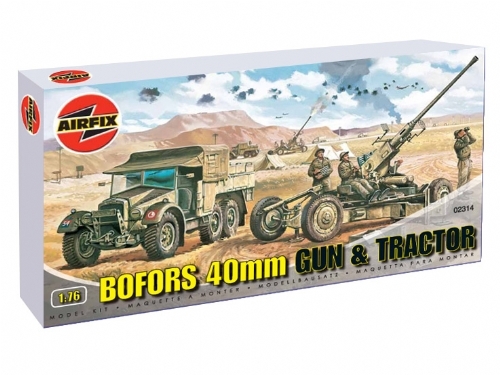 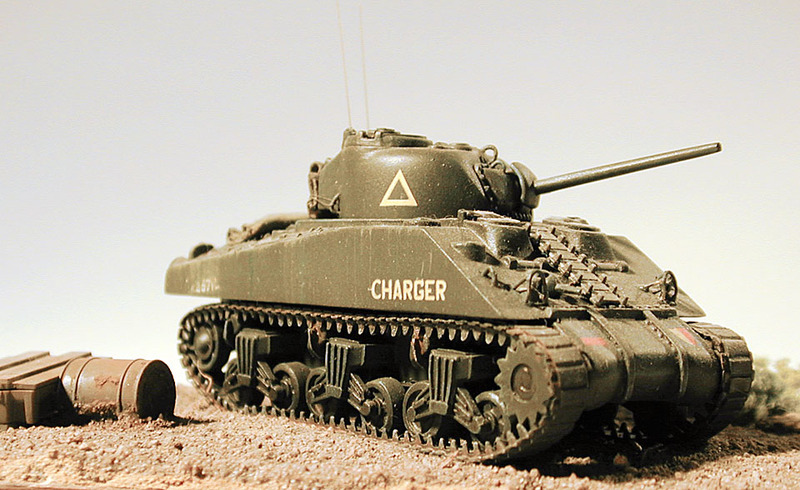 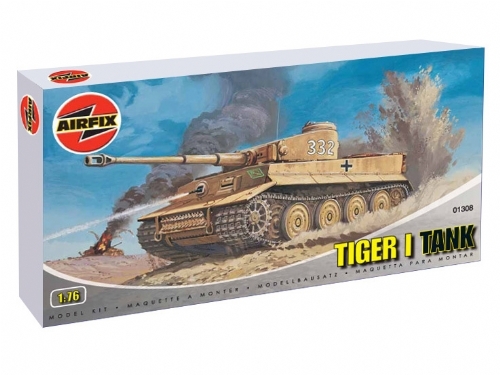 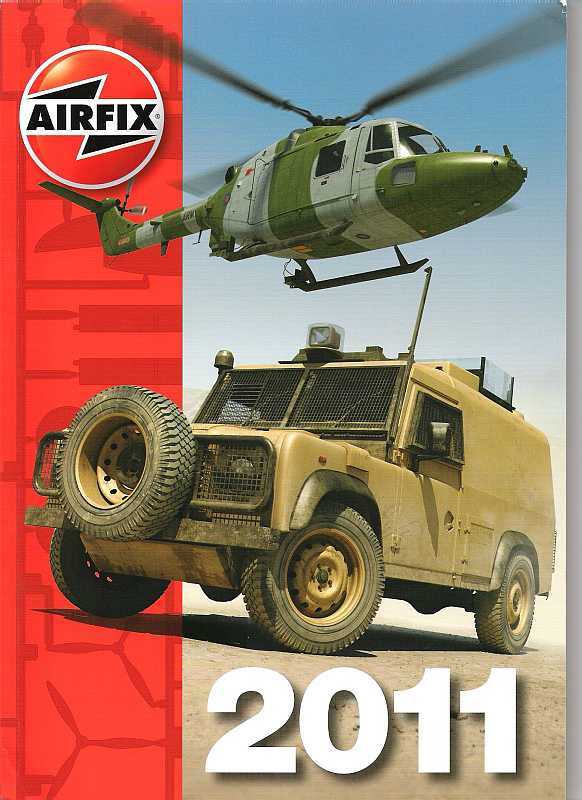 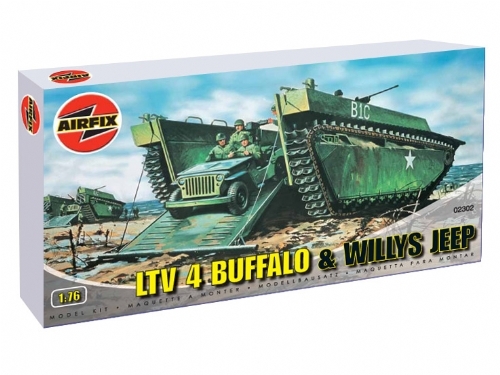 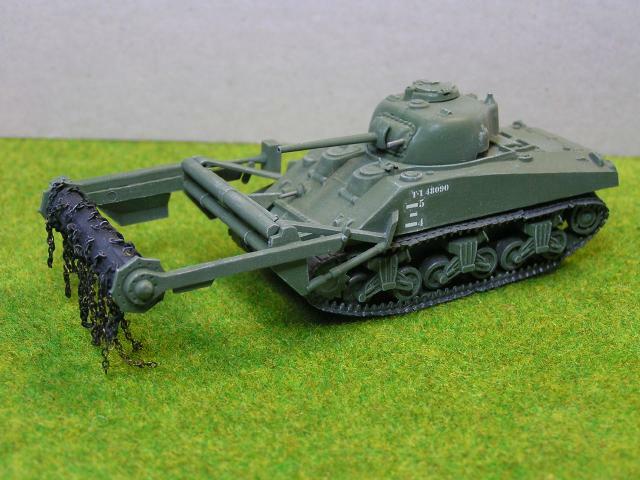 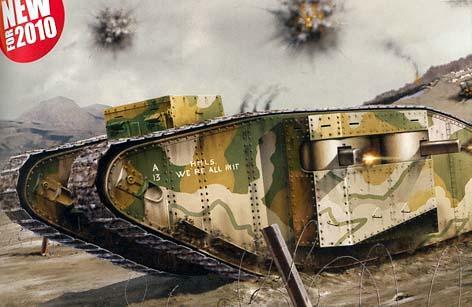 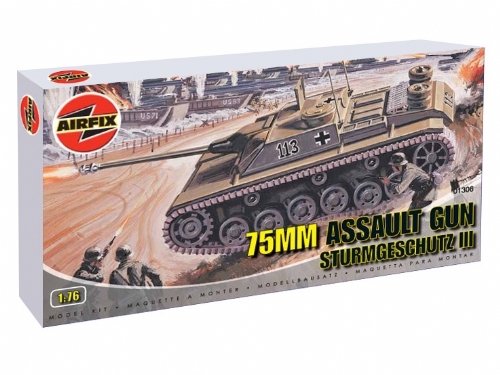 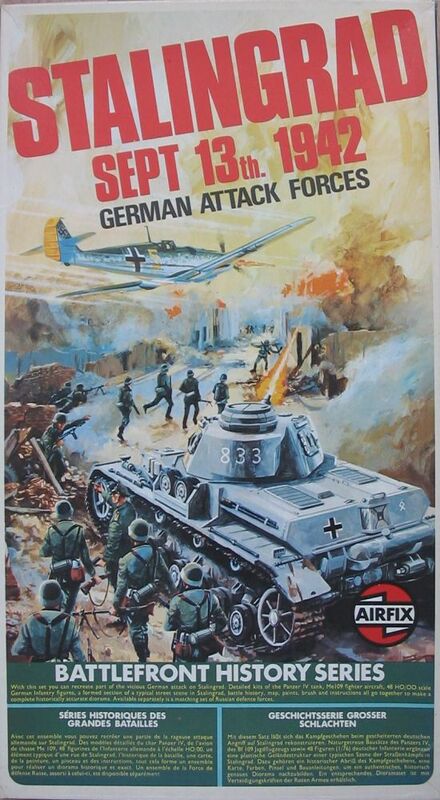 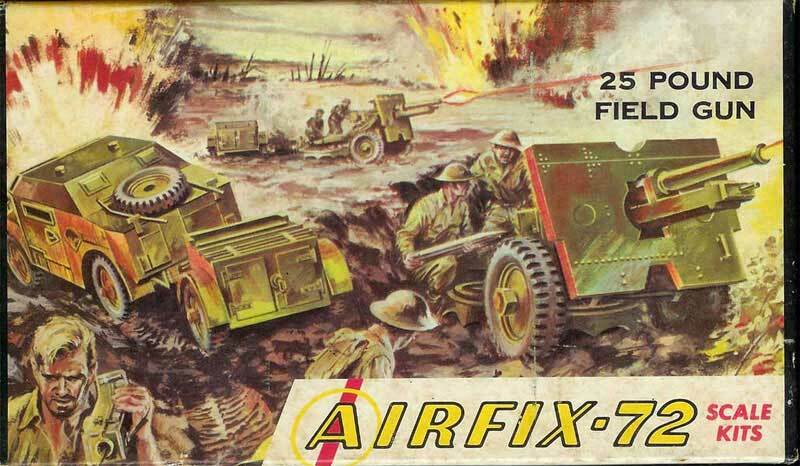 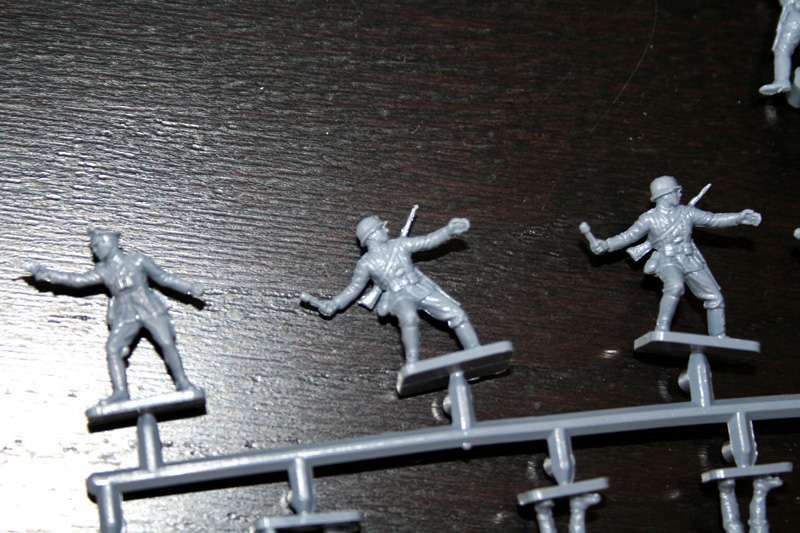 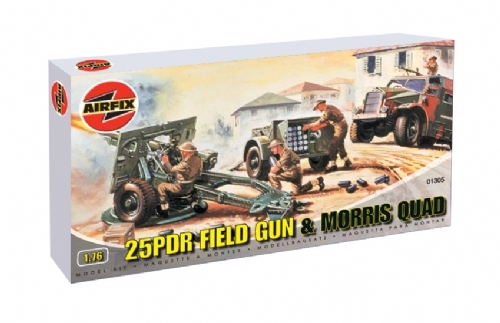 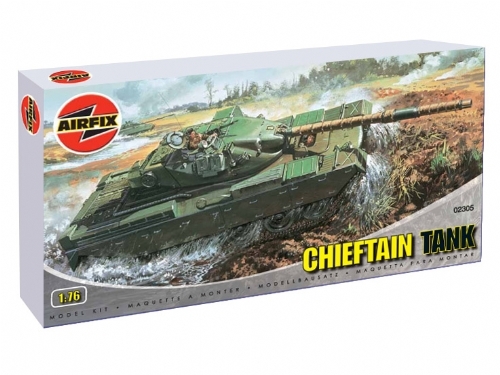 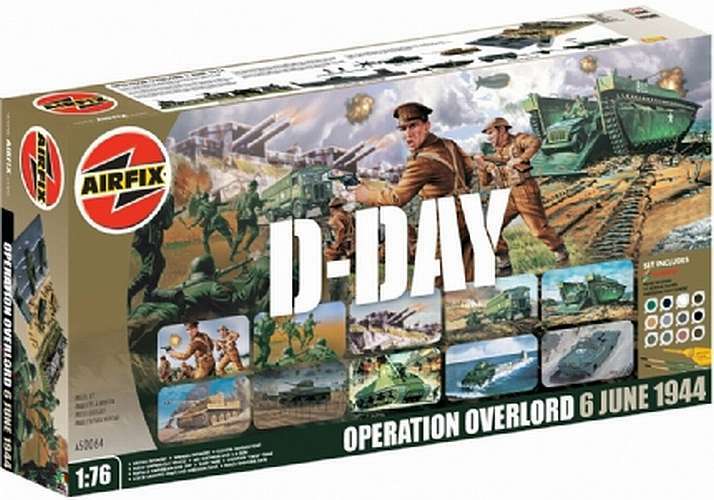 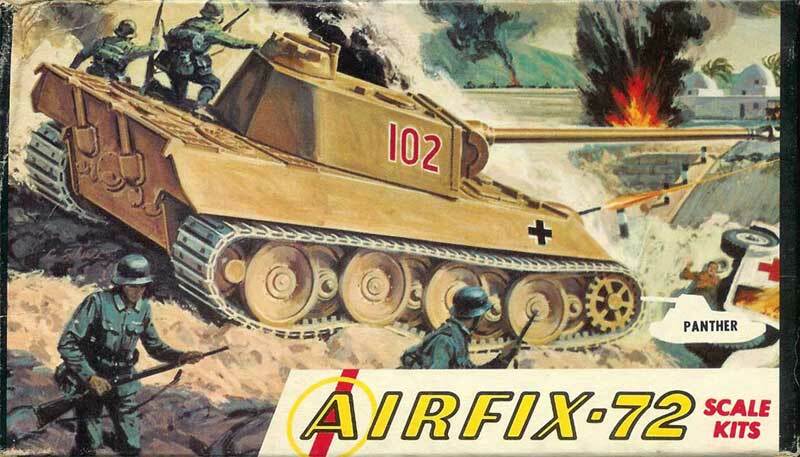 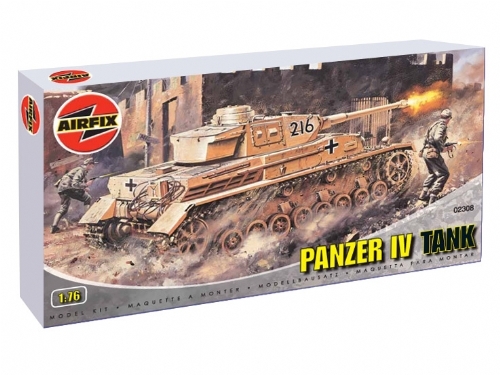 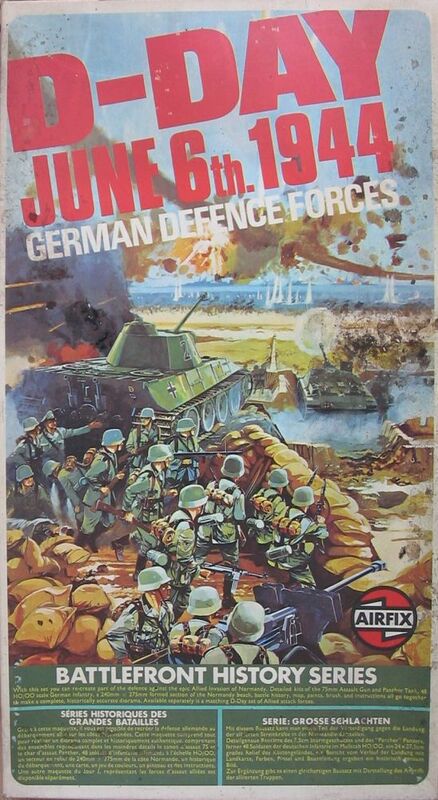 Airfix works offensive and has made conversions of its old models. 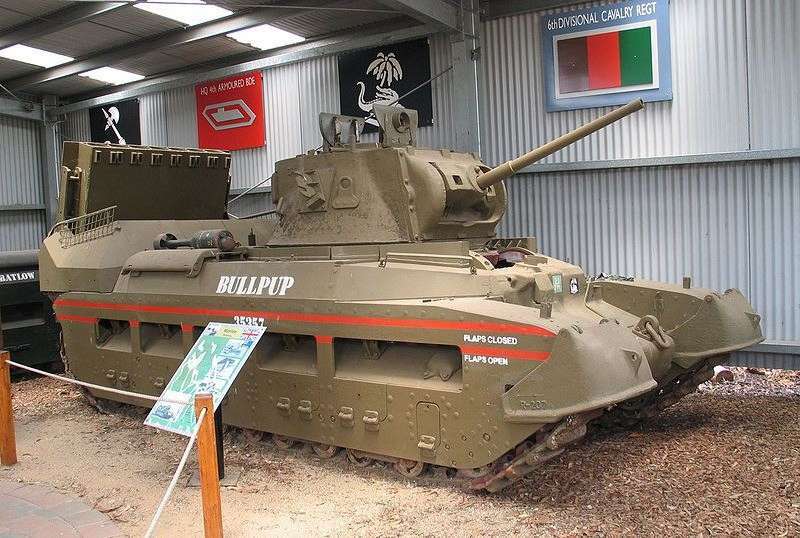 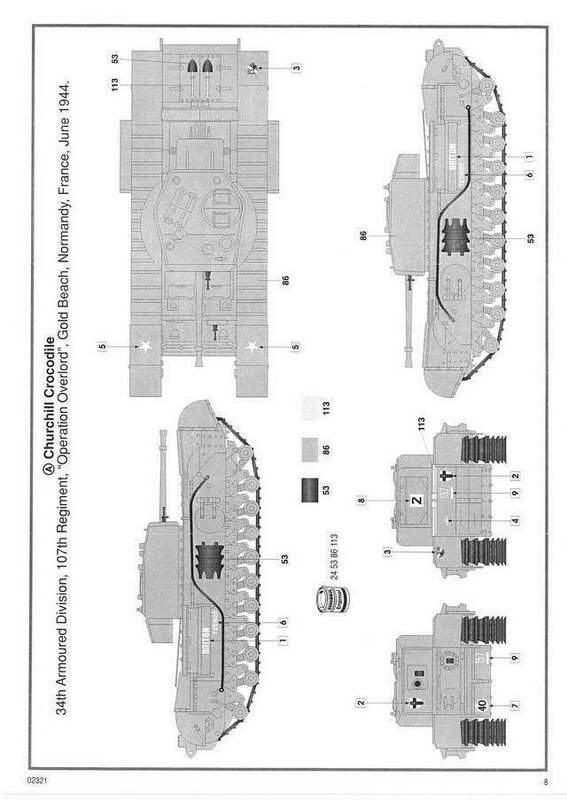 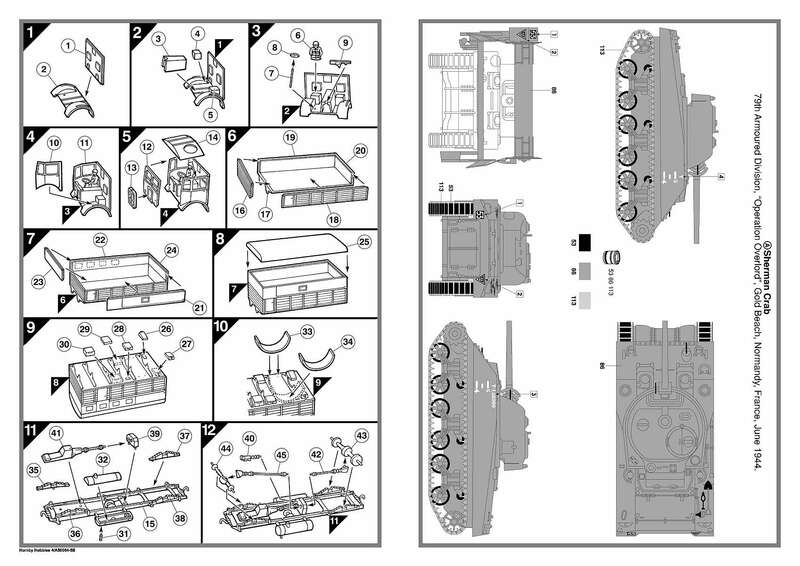 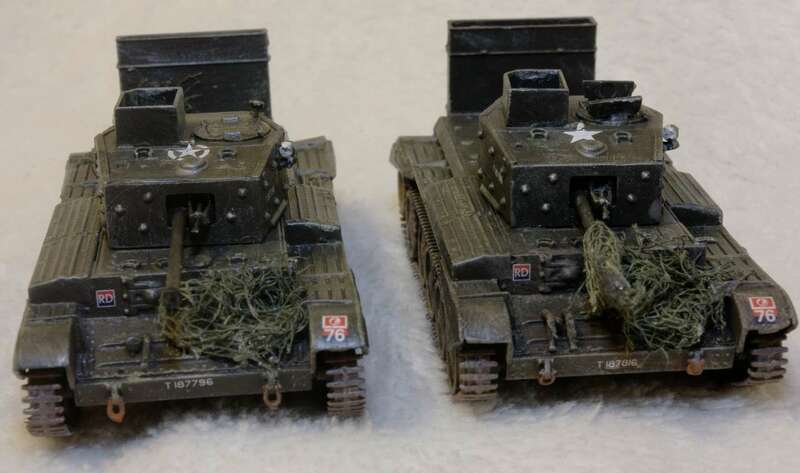 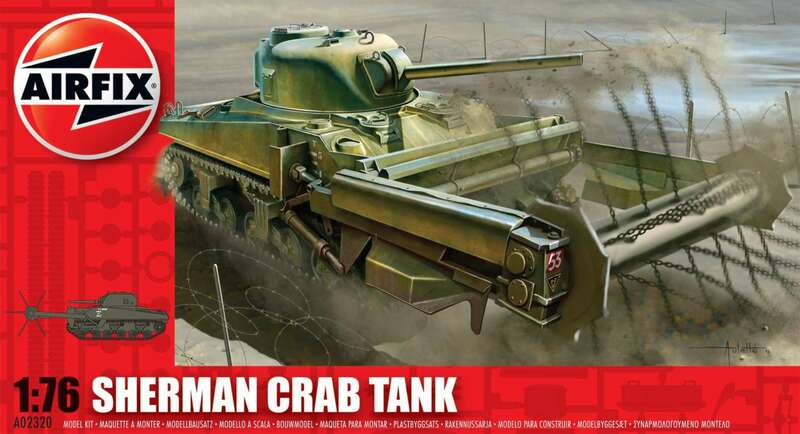 Thus, the old Sherman and the old Churchill were used to configure into the Sherman Crab and into to the Churchill Crocodile respectively. 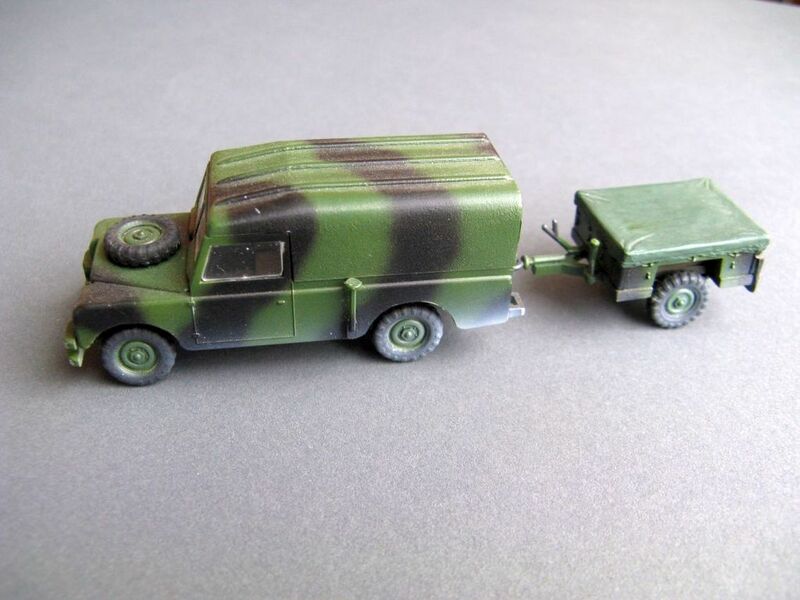 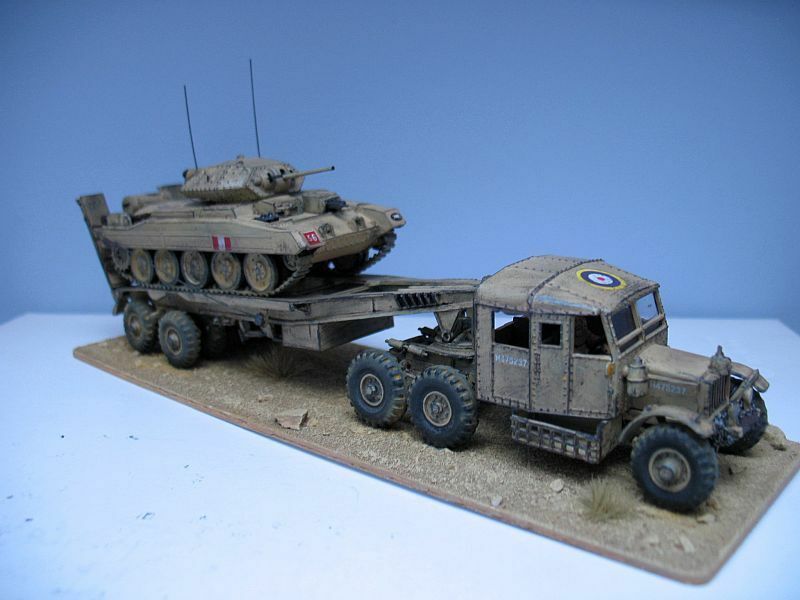 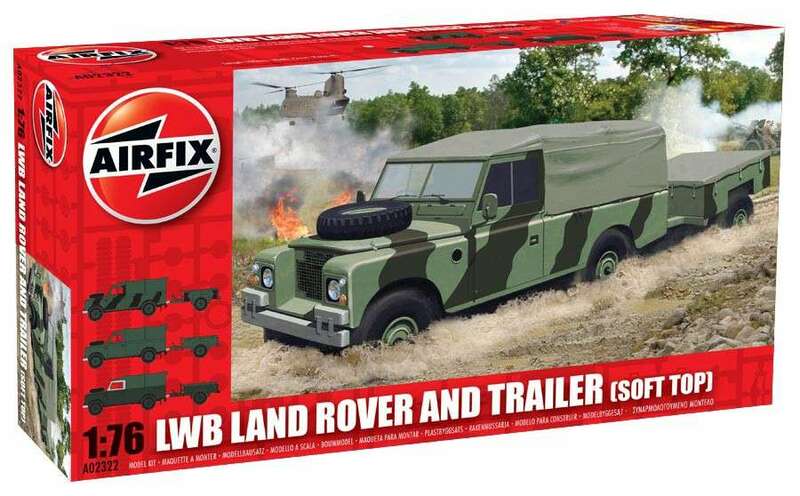 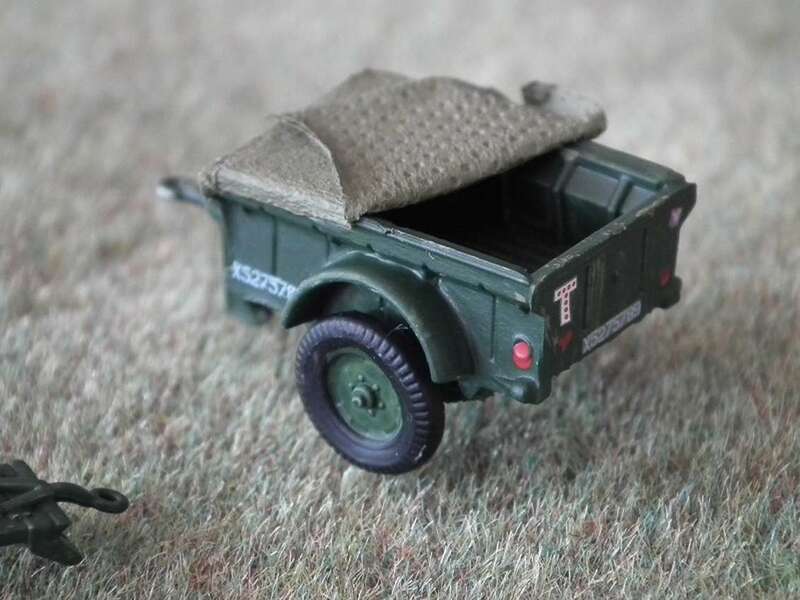 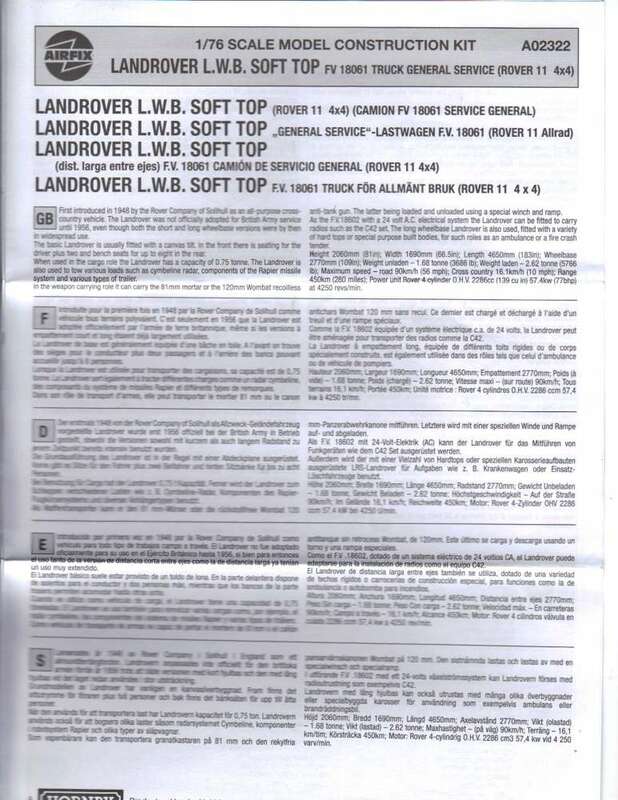 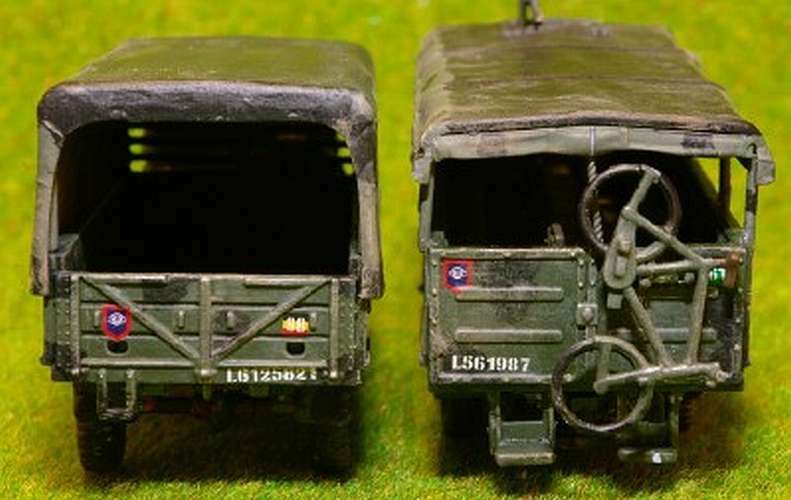 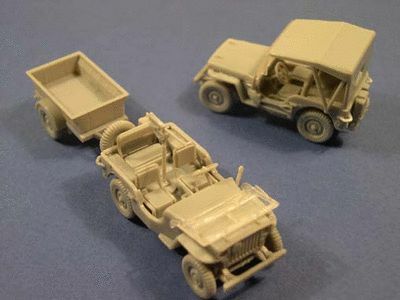 Kit 2322 - LWB Landrover (soft top) & trailer - ex-JBModels. 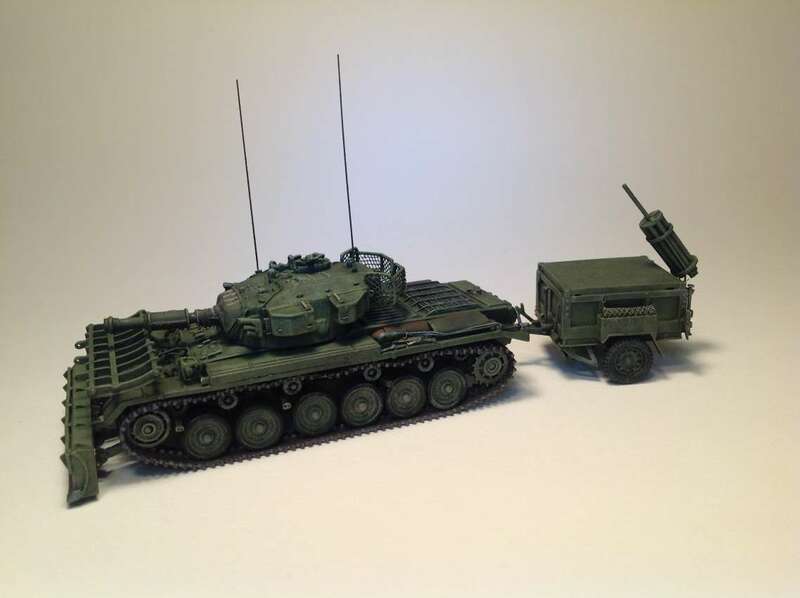 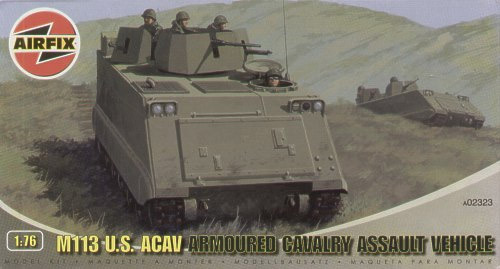 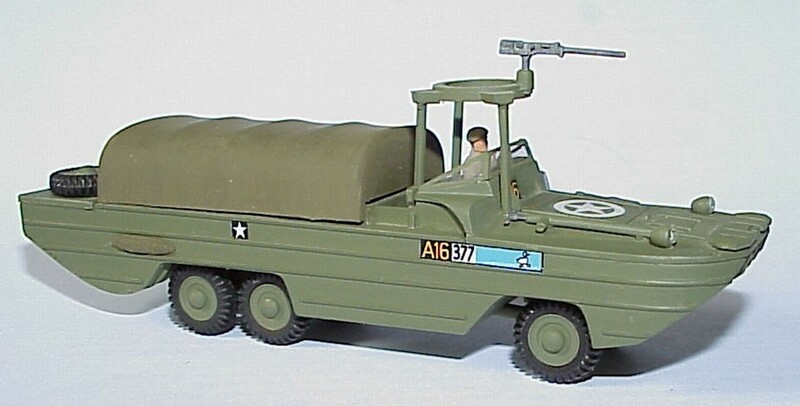 Kit 2323 - M113 U.S. ACAV - ex-JBModels. 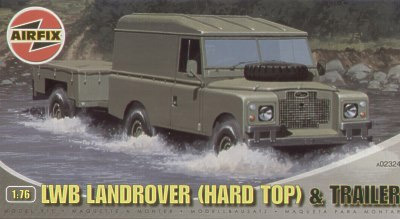 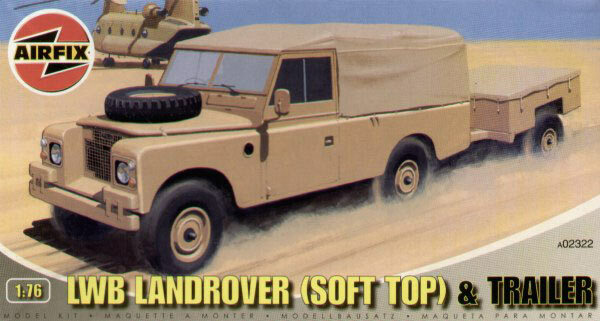 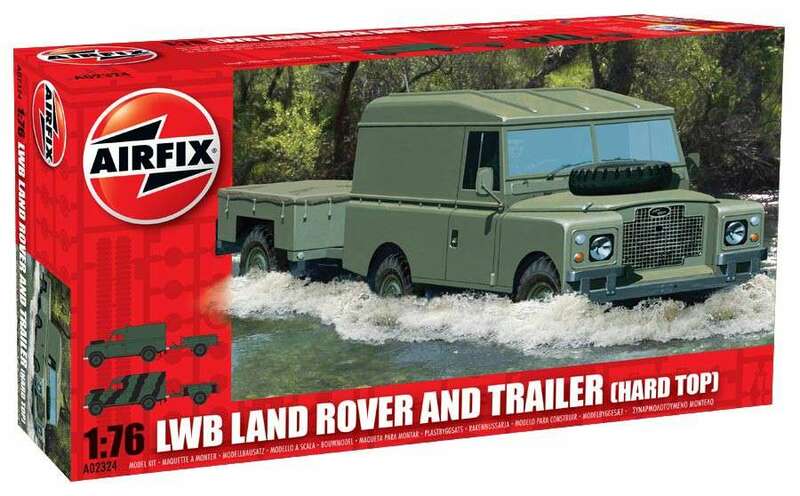 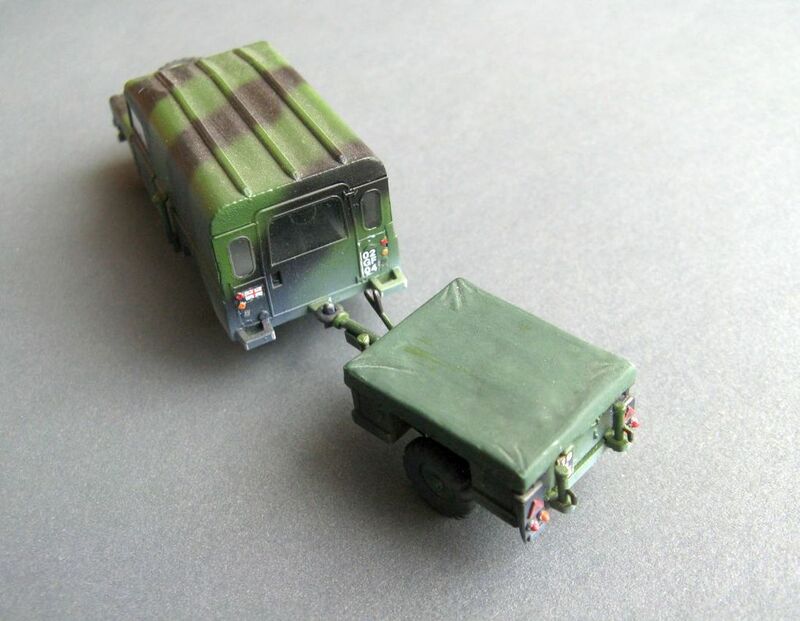 Kit 2324 - LWB Landrover (hard top) & trailer - ex-JBModels. 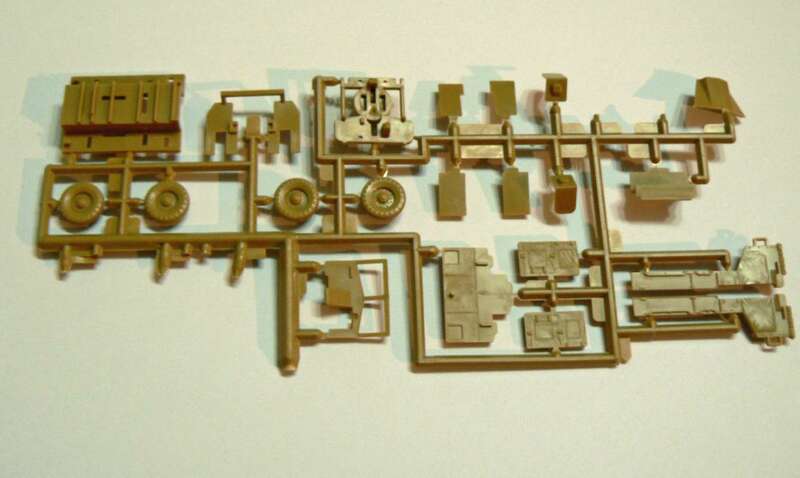 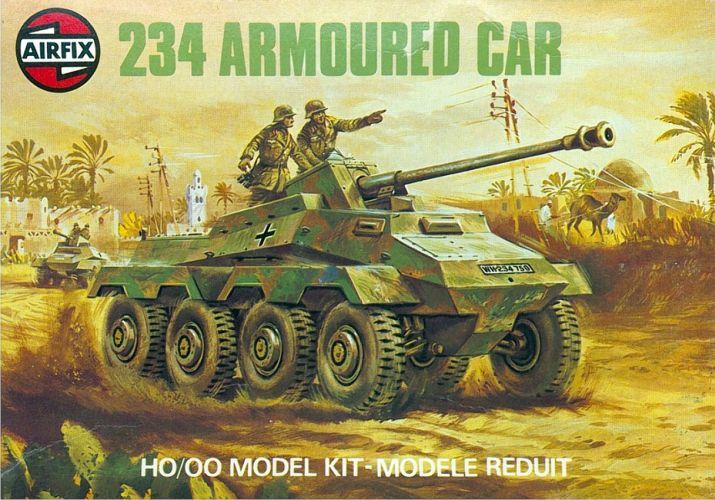 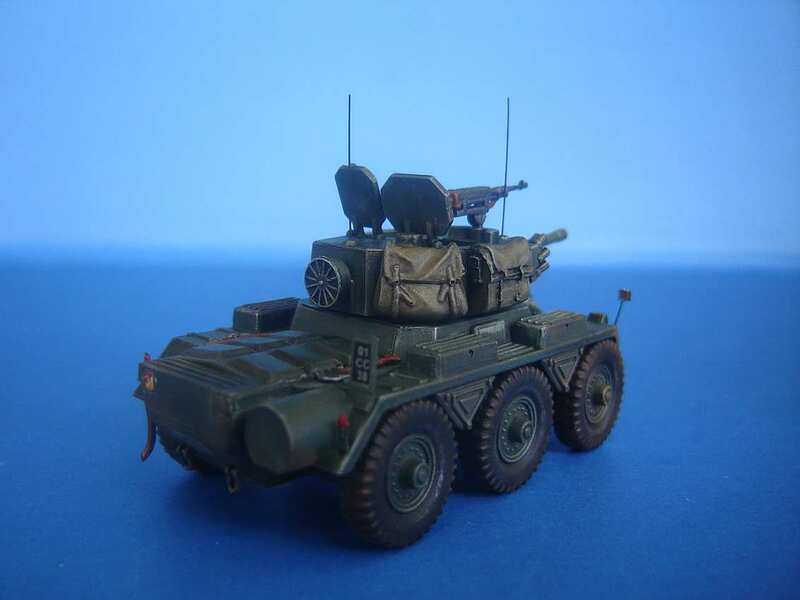 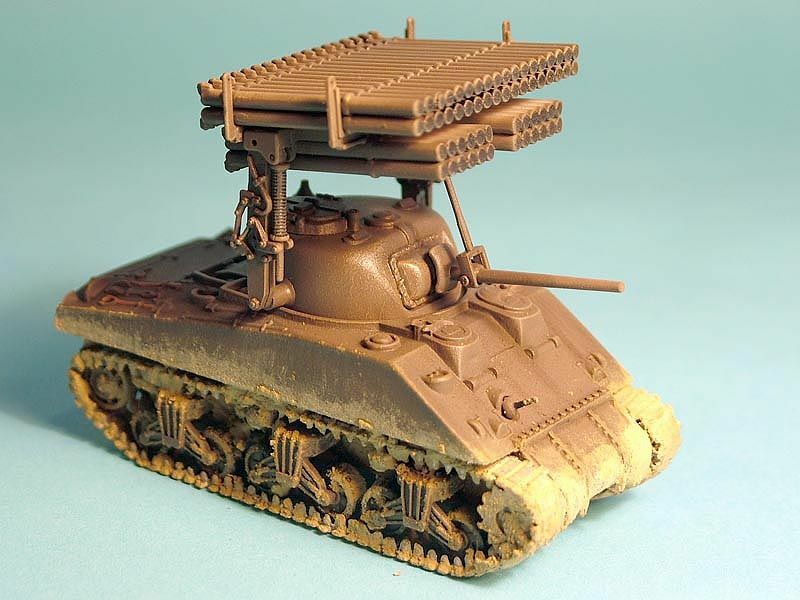 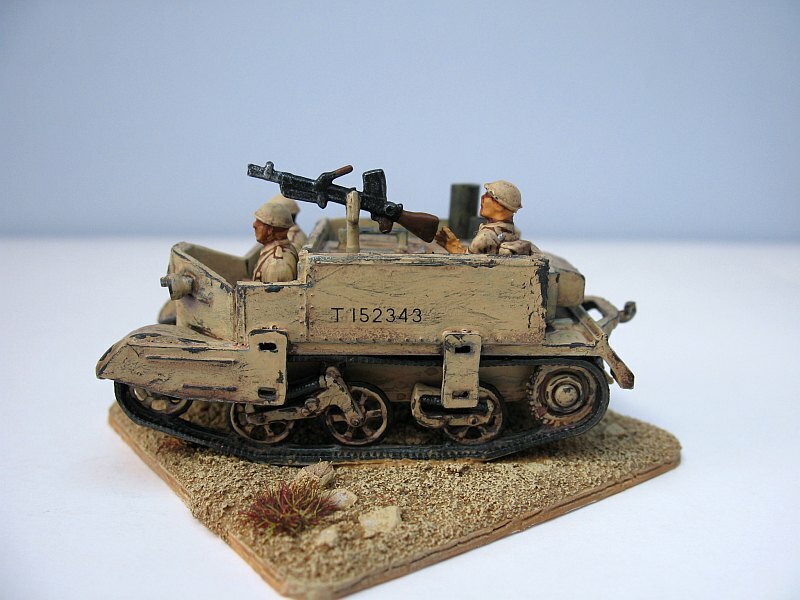 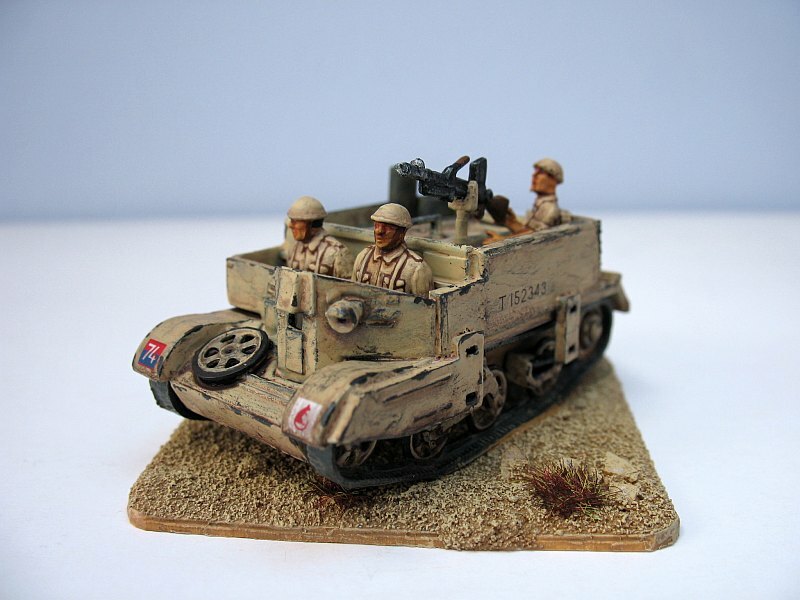 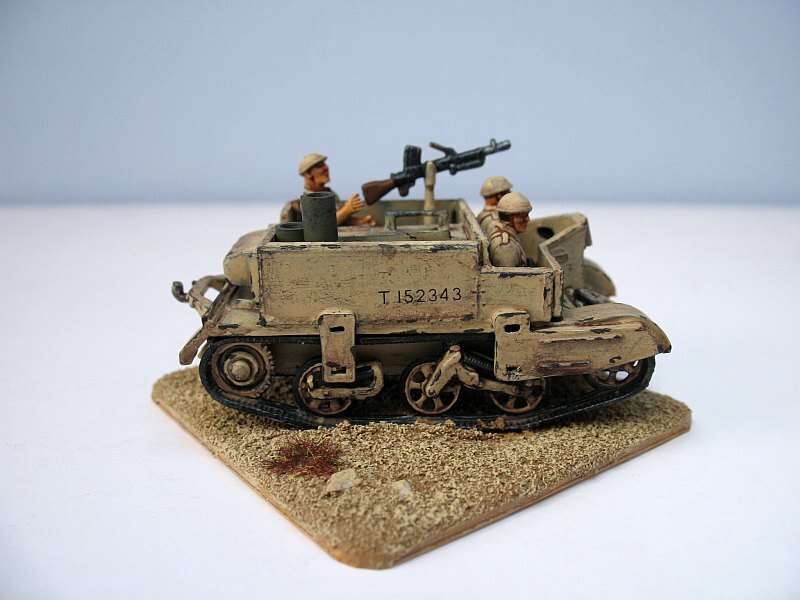 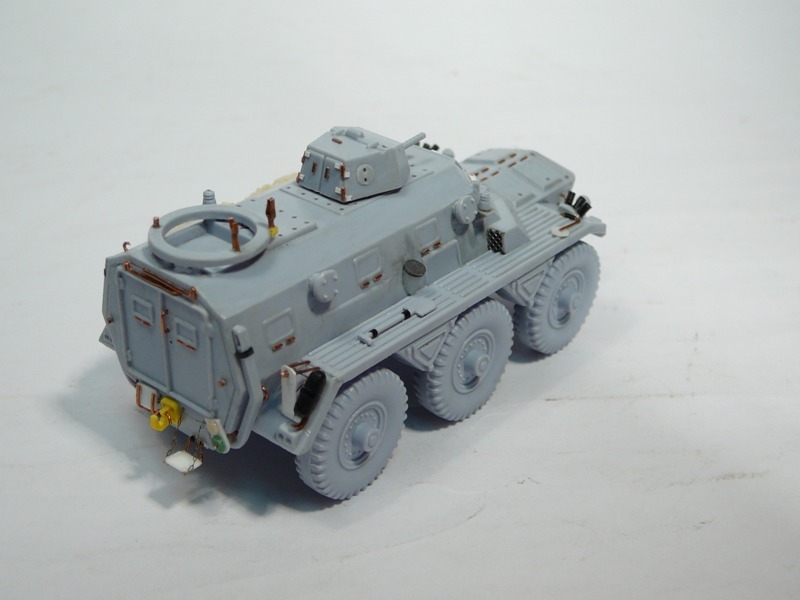 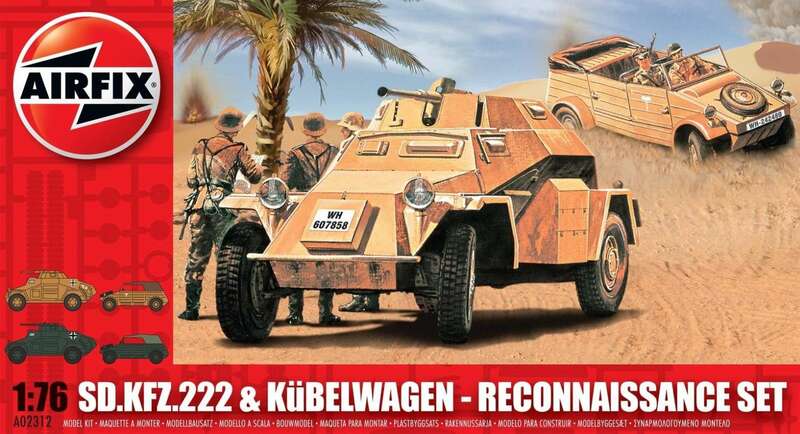 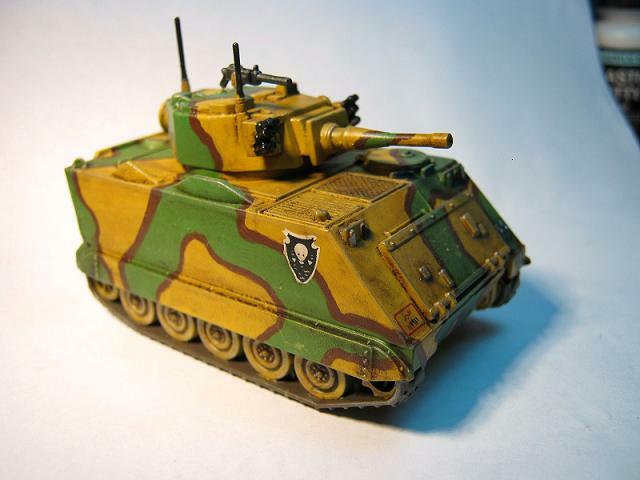 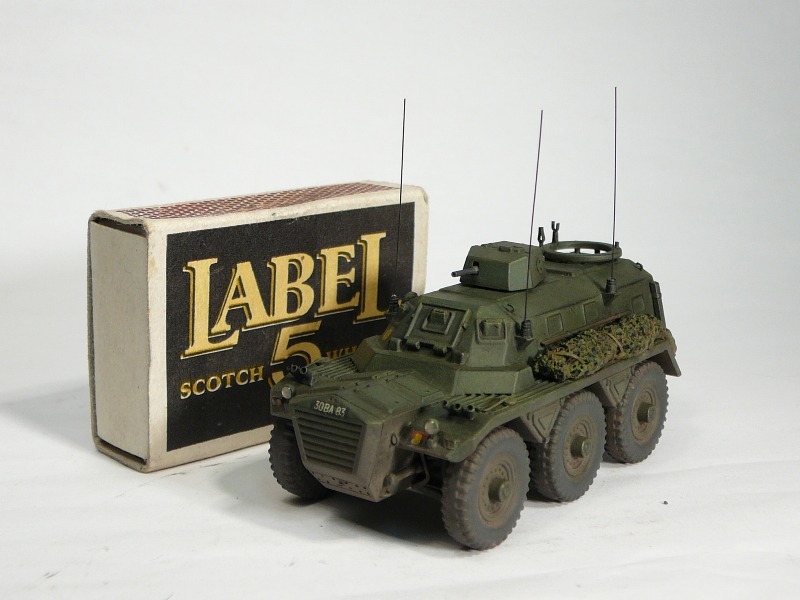 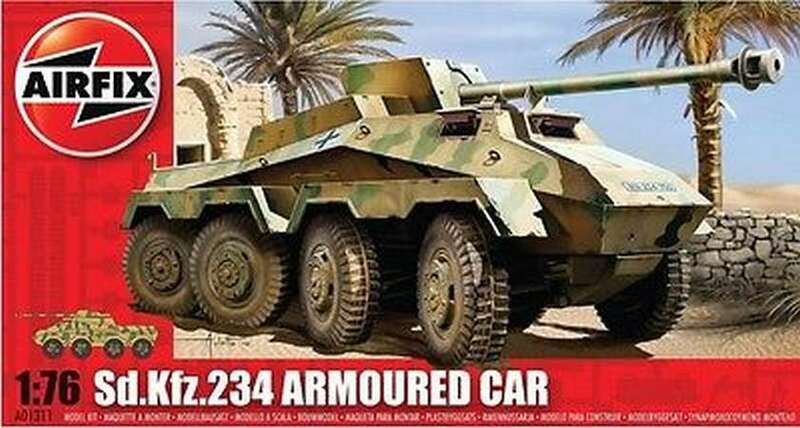 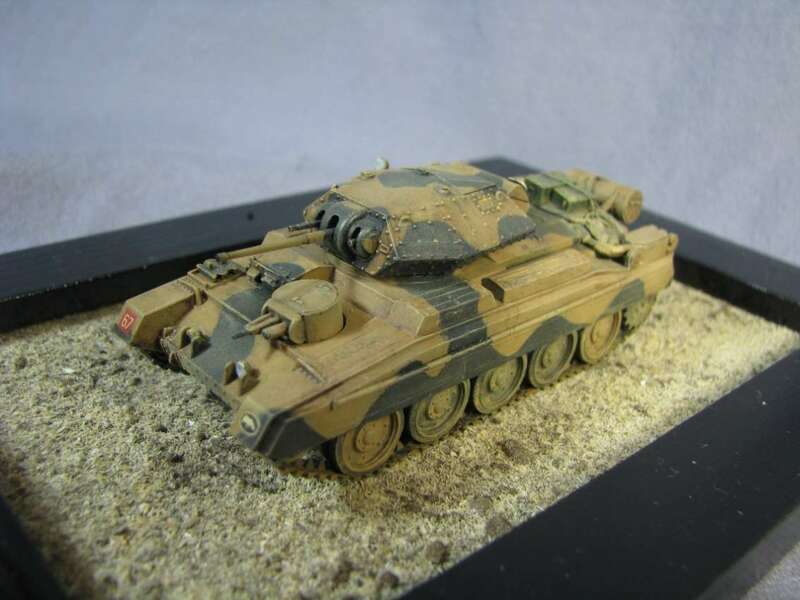 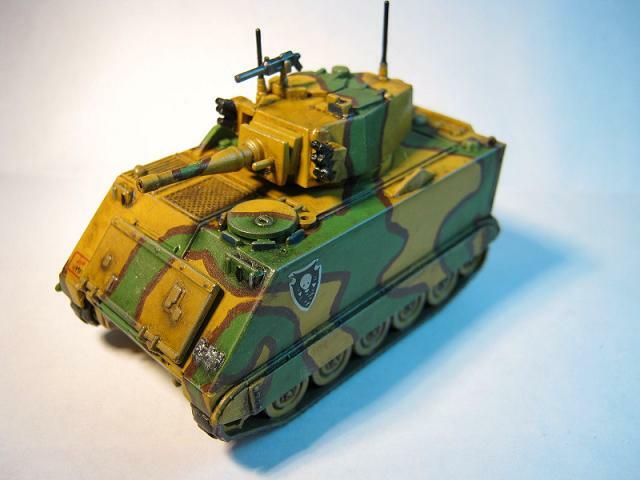 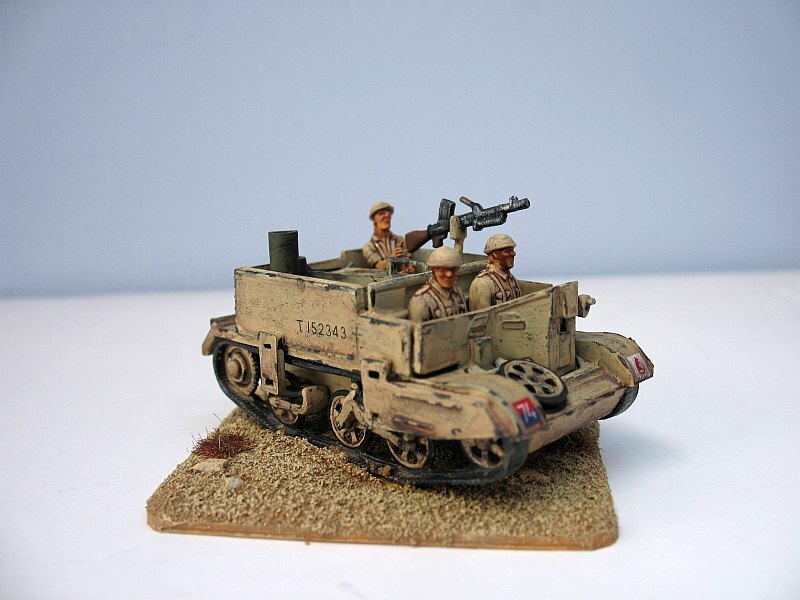 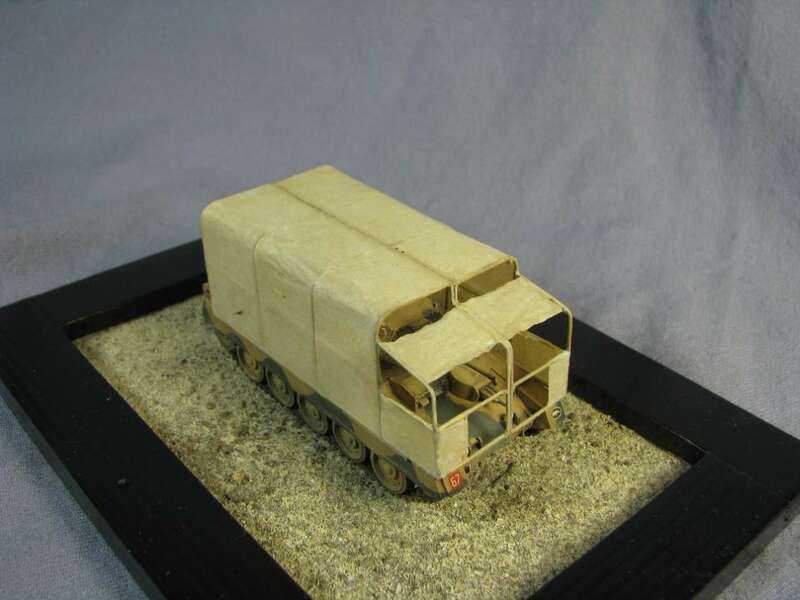 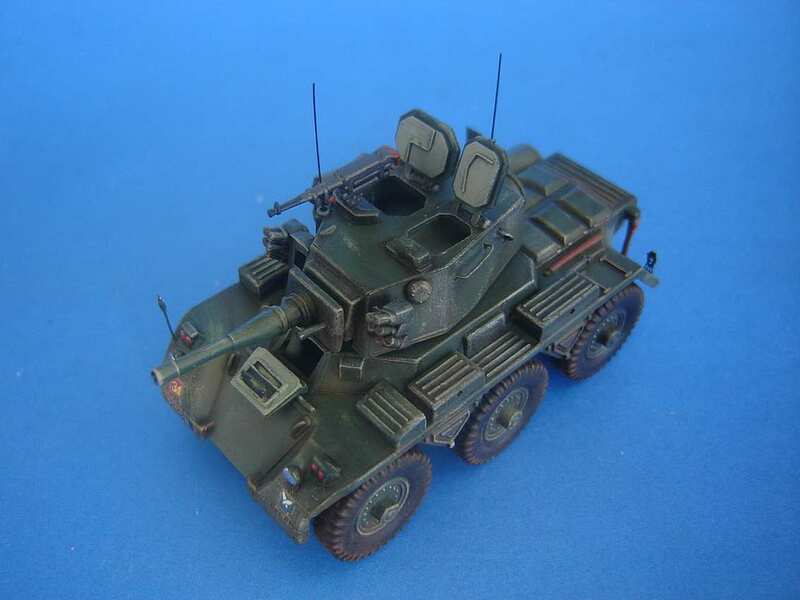 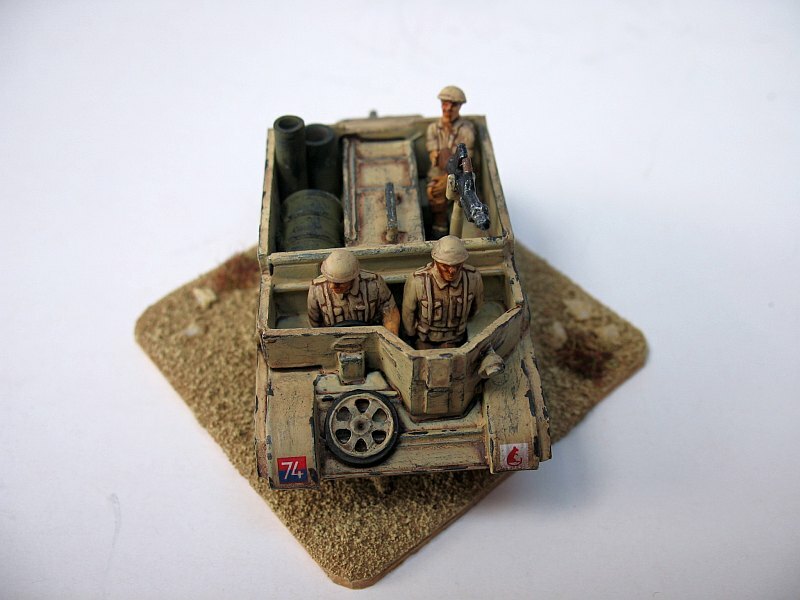 Kit 2325 - Saladin MkII armoured car - ex-JBModels. 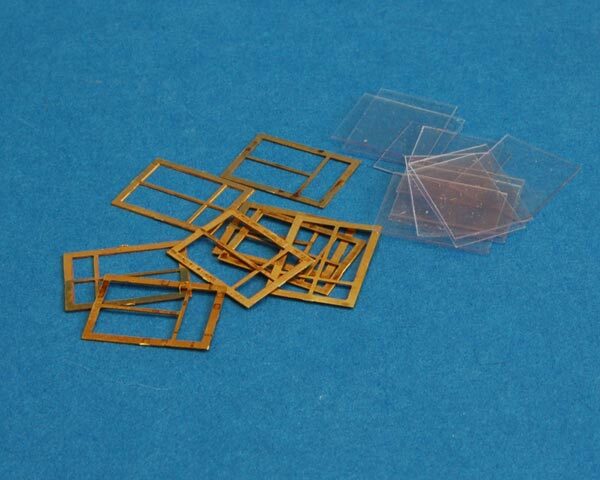 Mirrors: made with copper wire. 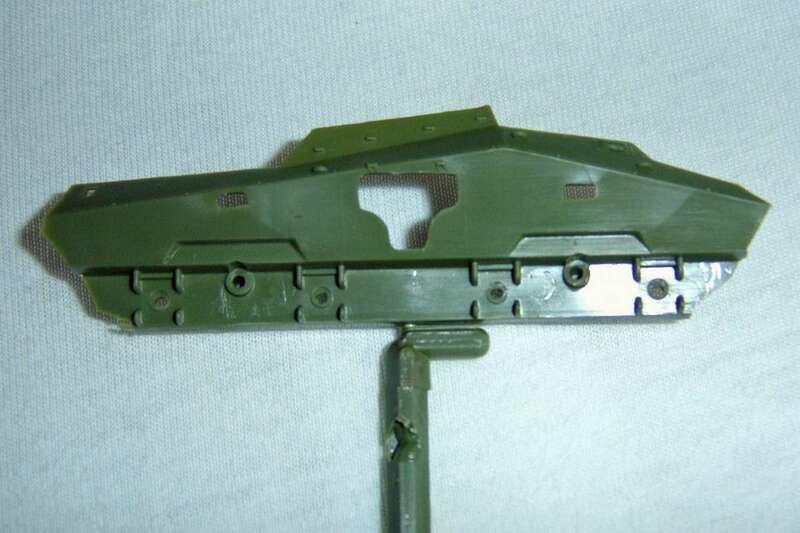 The turret and hull doors: detailed with copper wire. 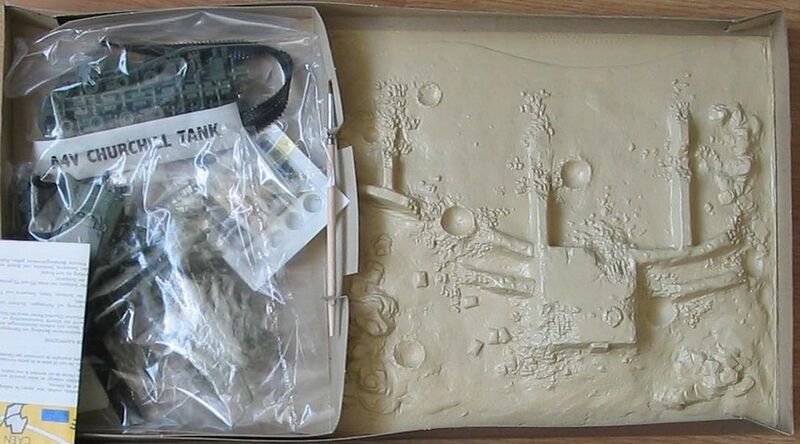 Bags: from resin set. 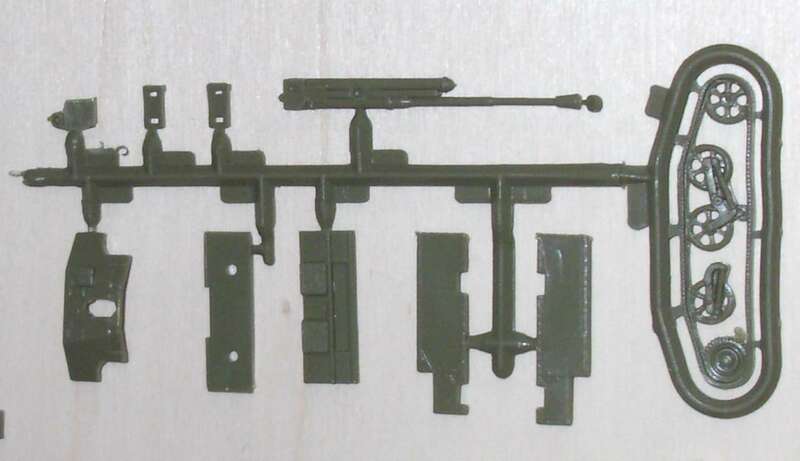 Machine-gun: replaced with a more detailed one. 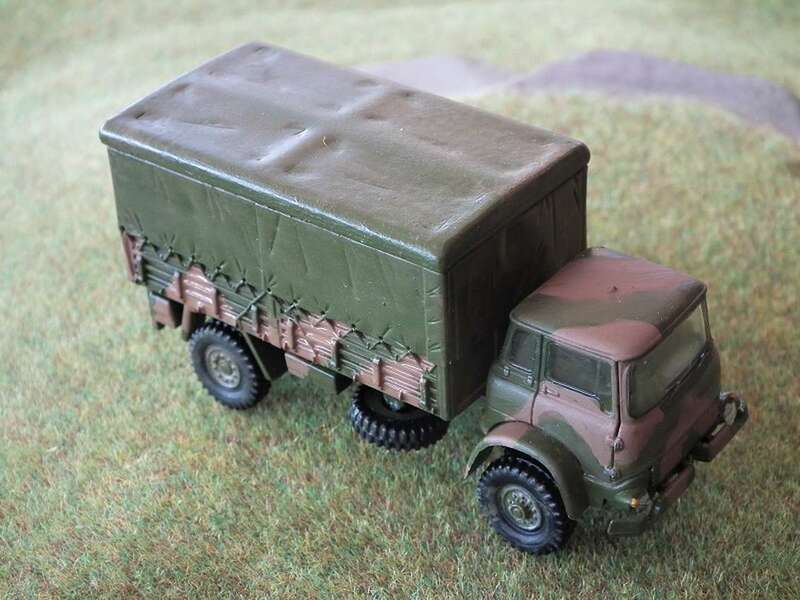 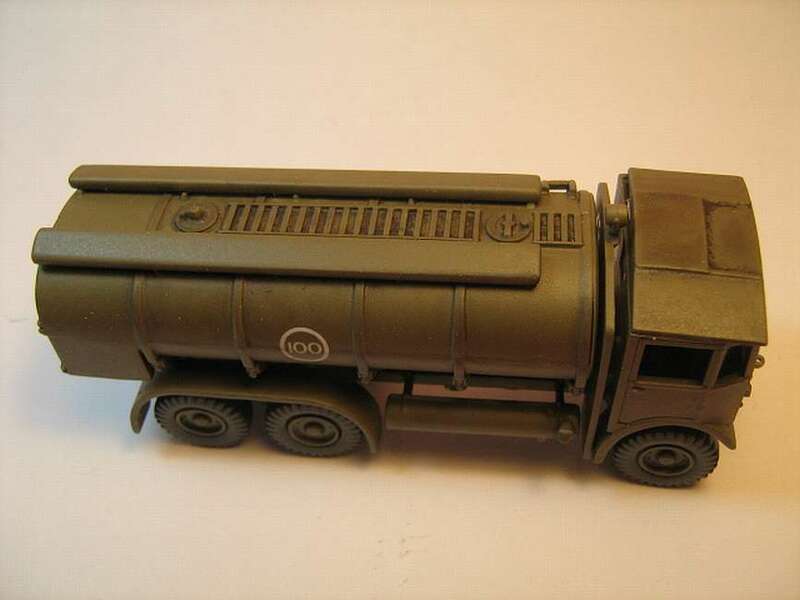 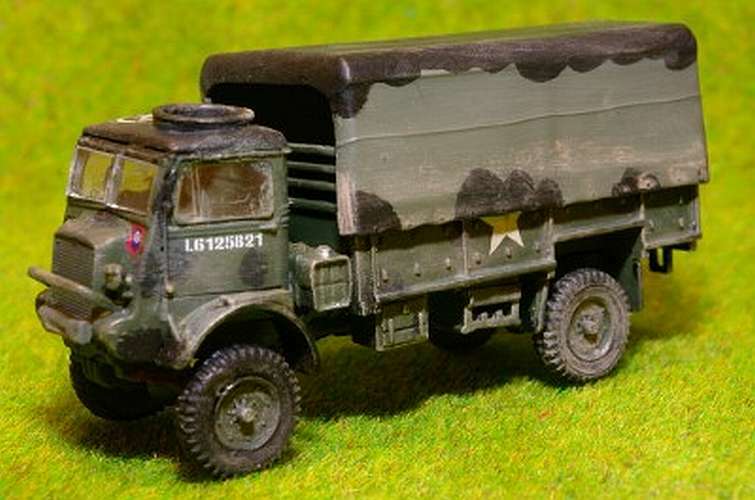 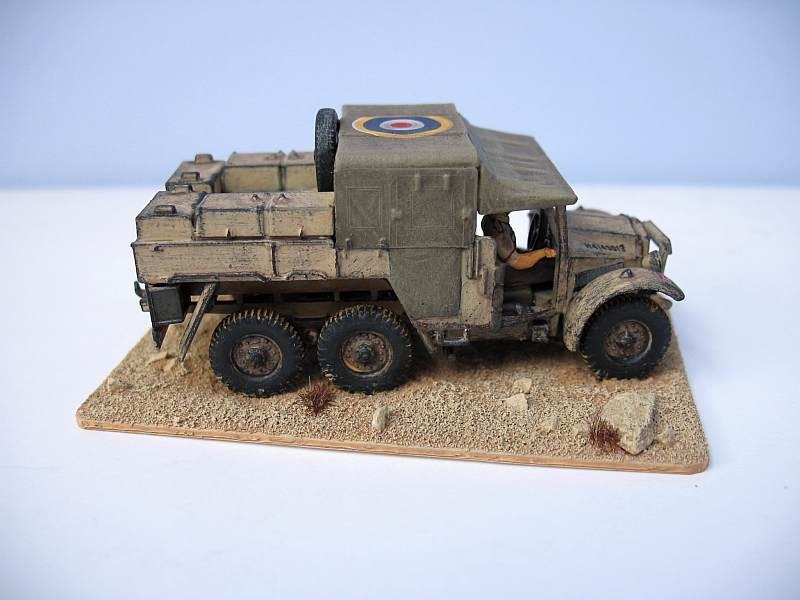 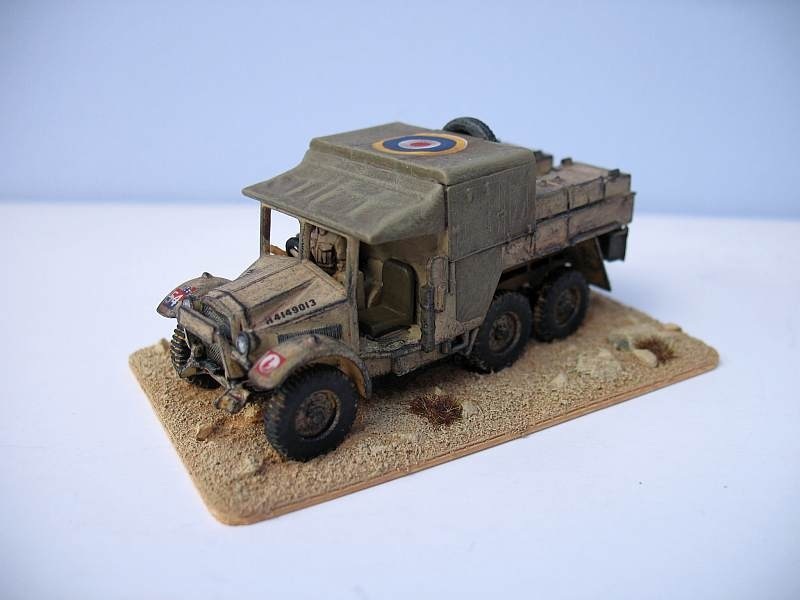 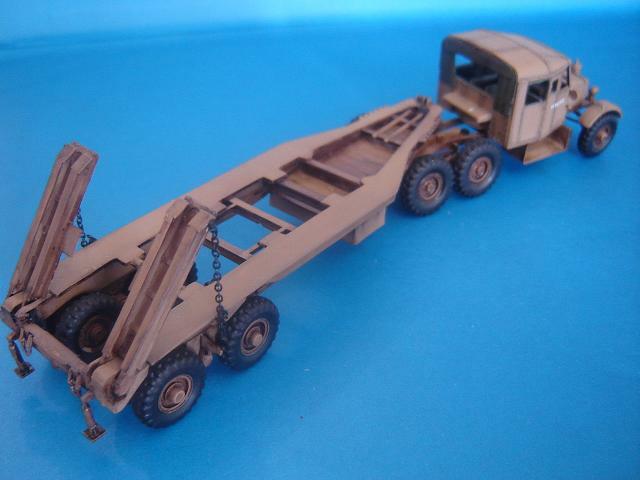 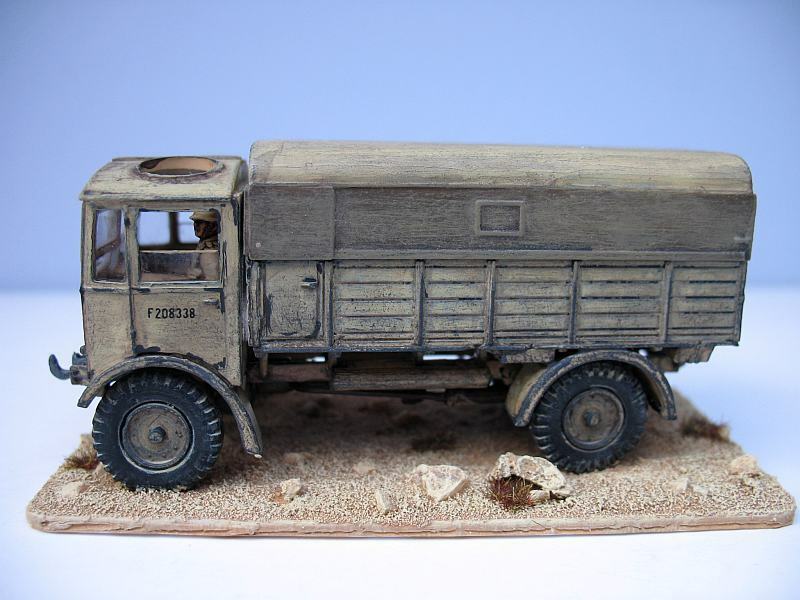 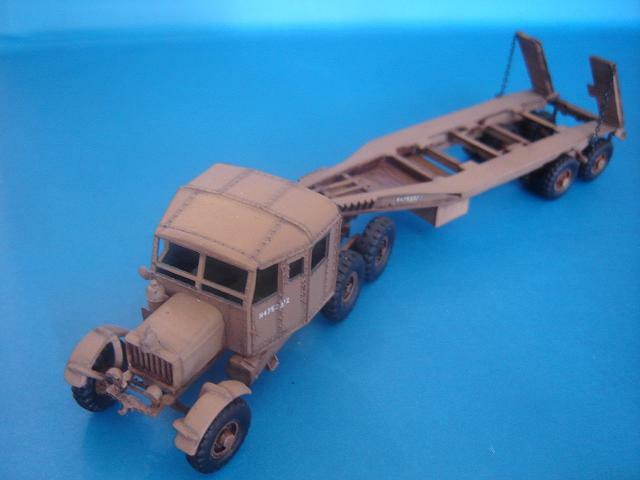 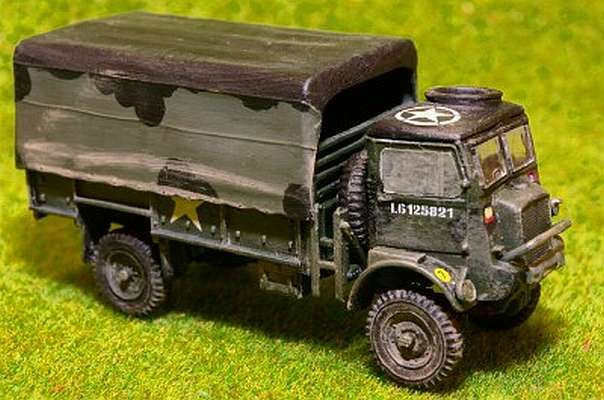 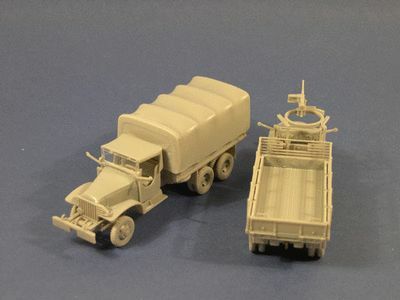 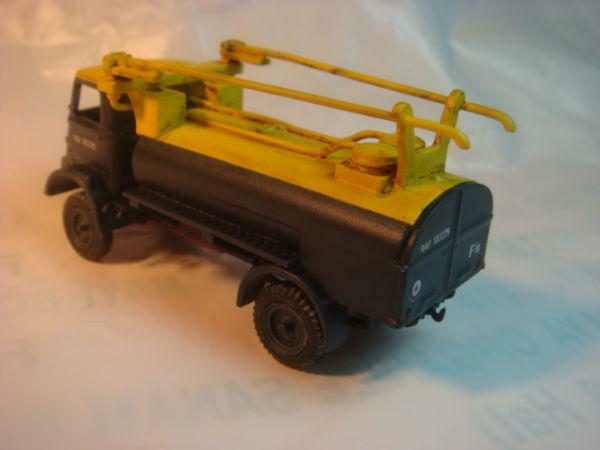 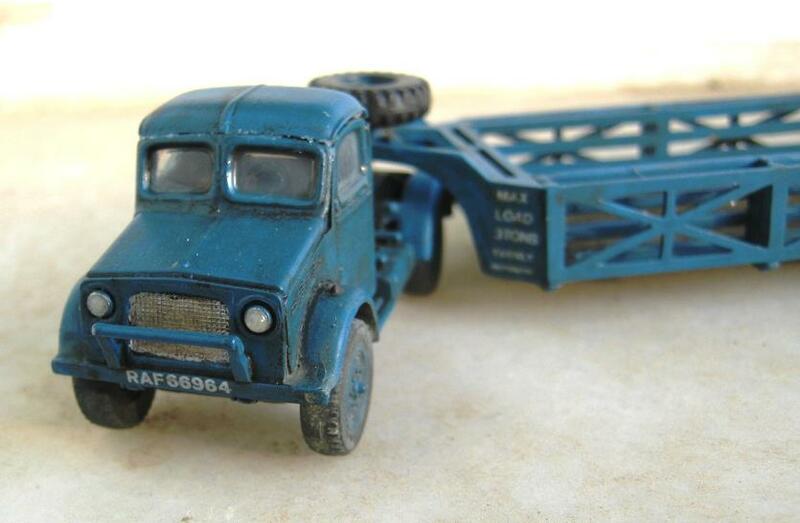 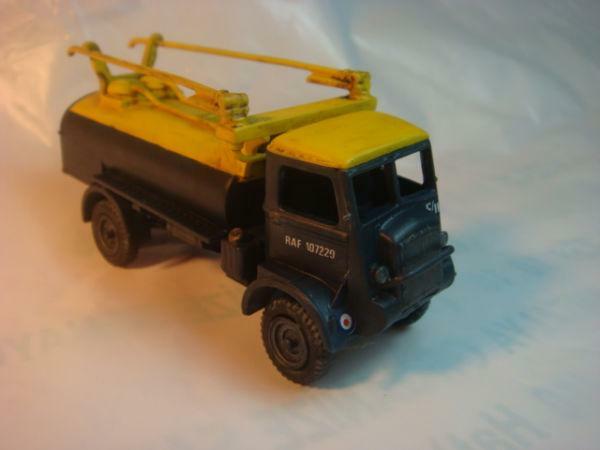 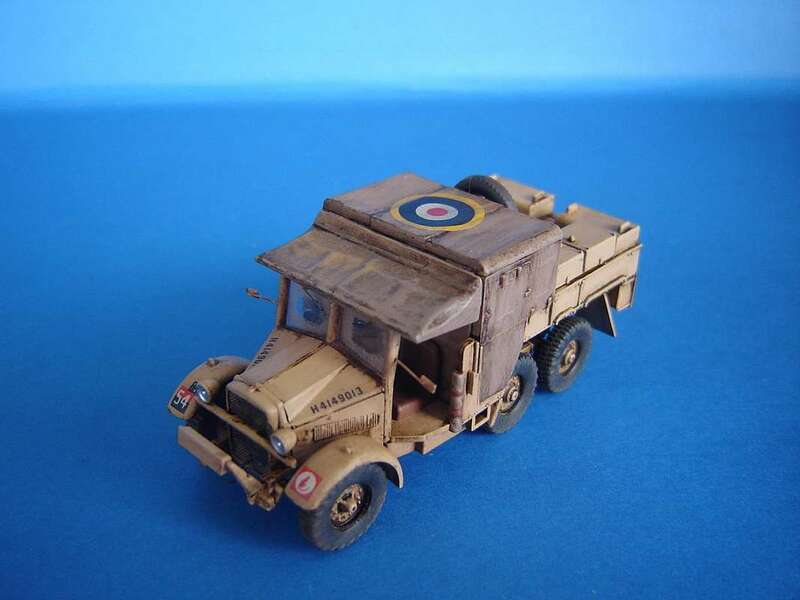 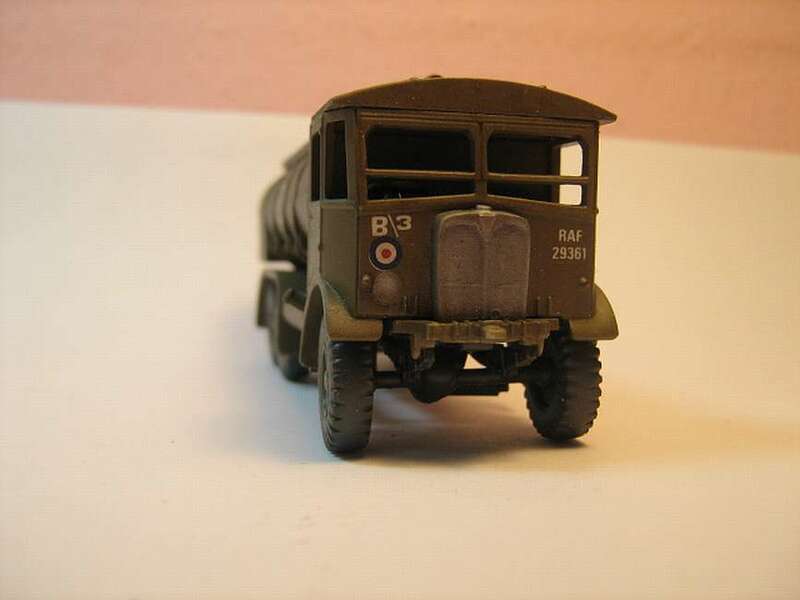 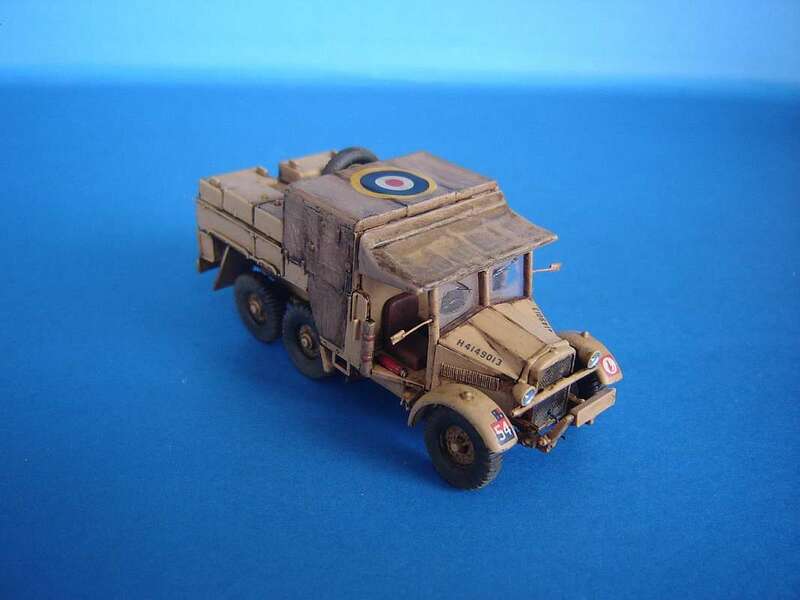 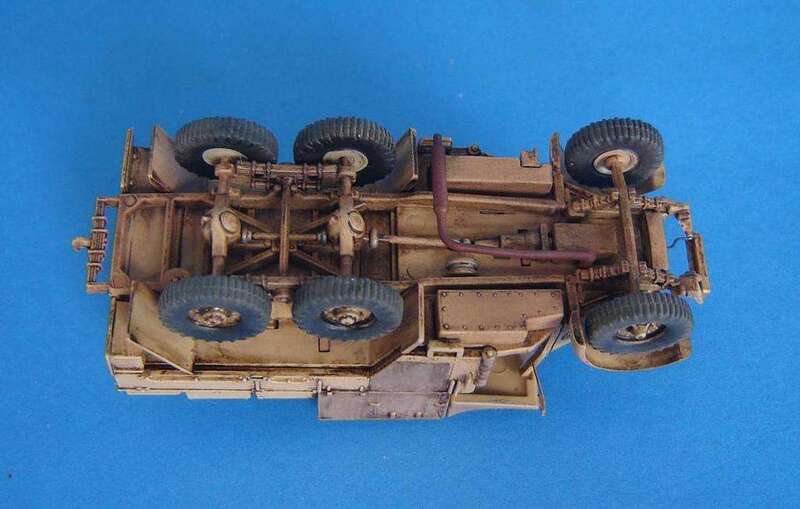 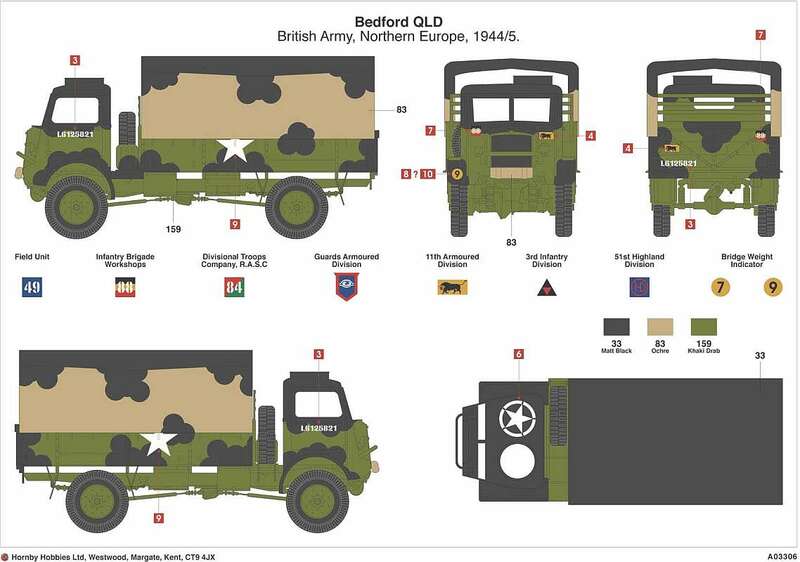 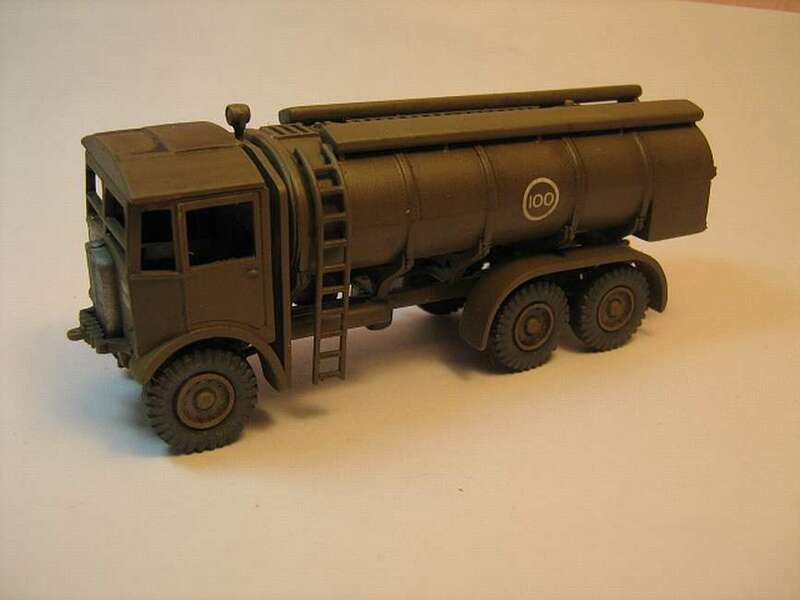 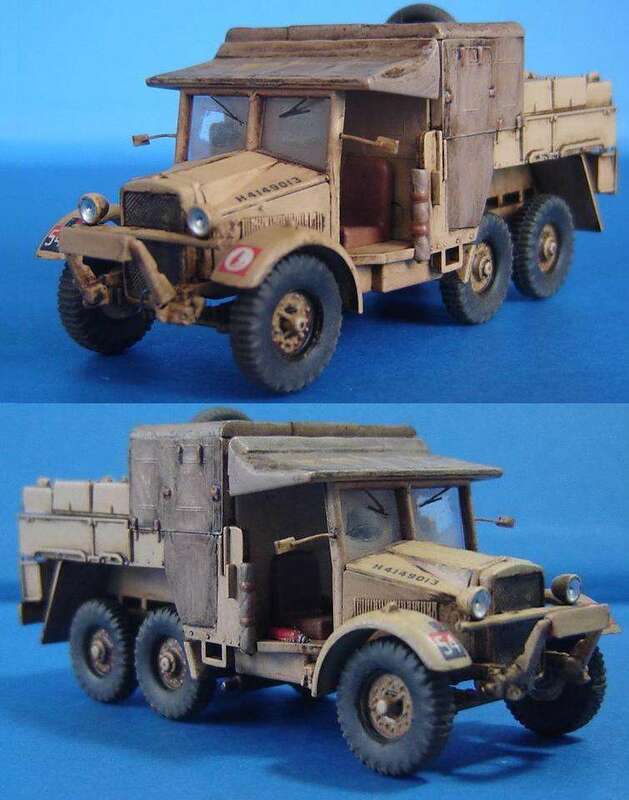 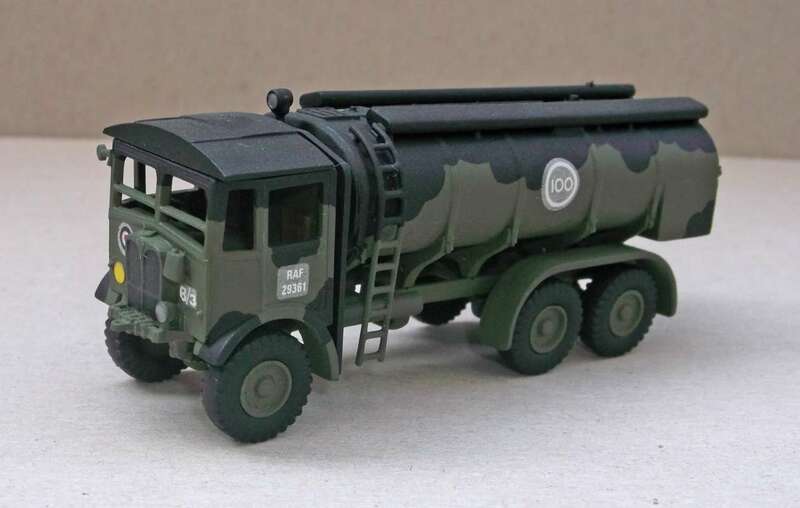 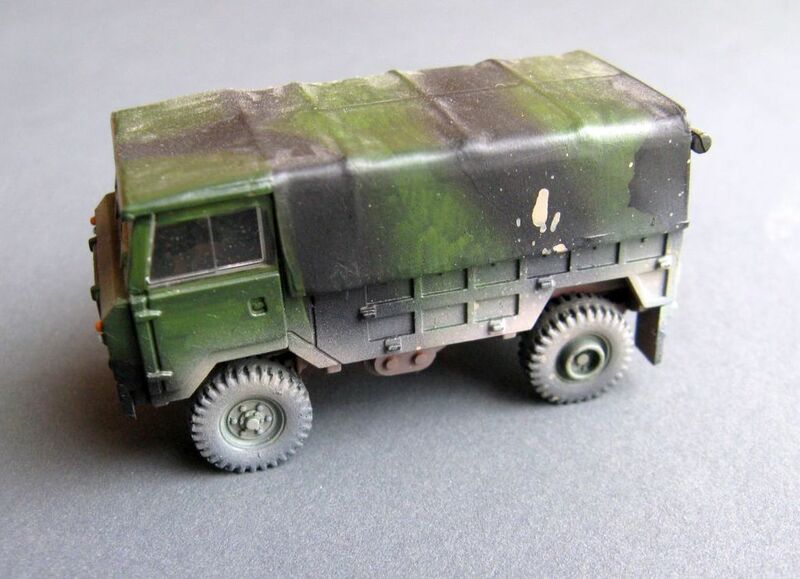 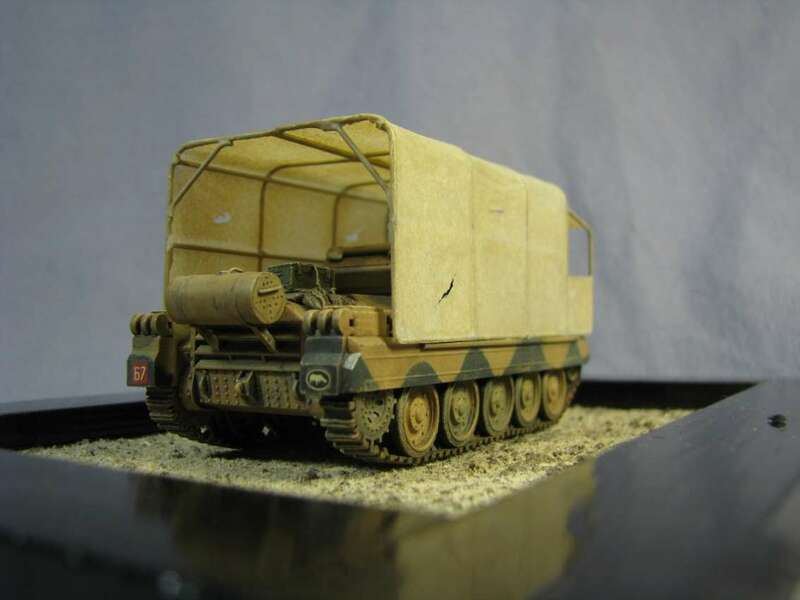 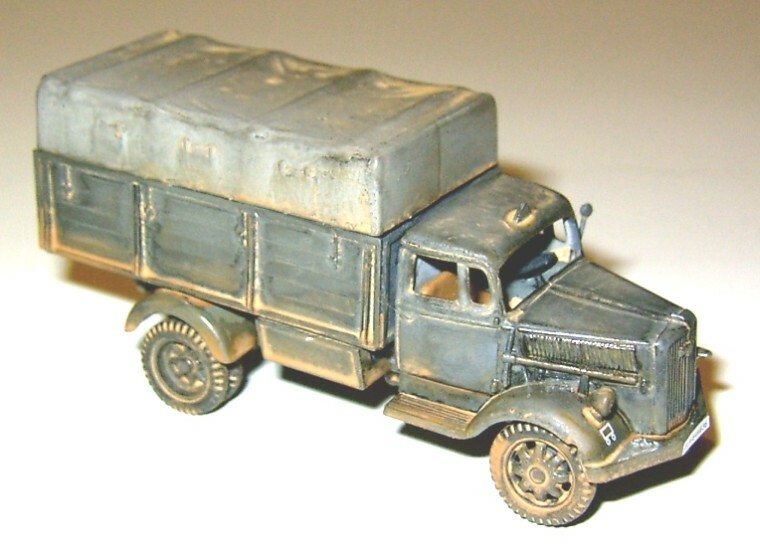 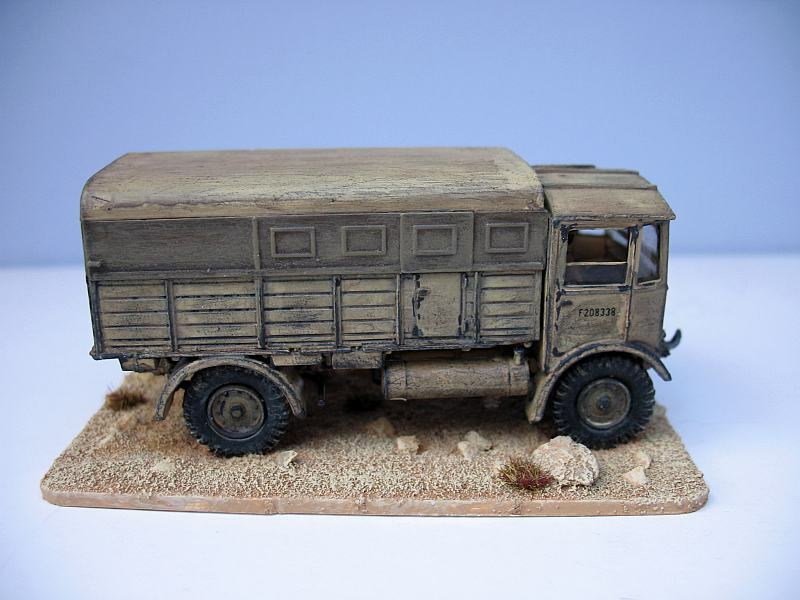 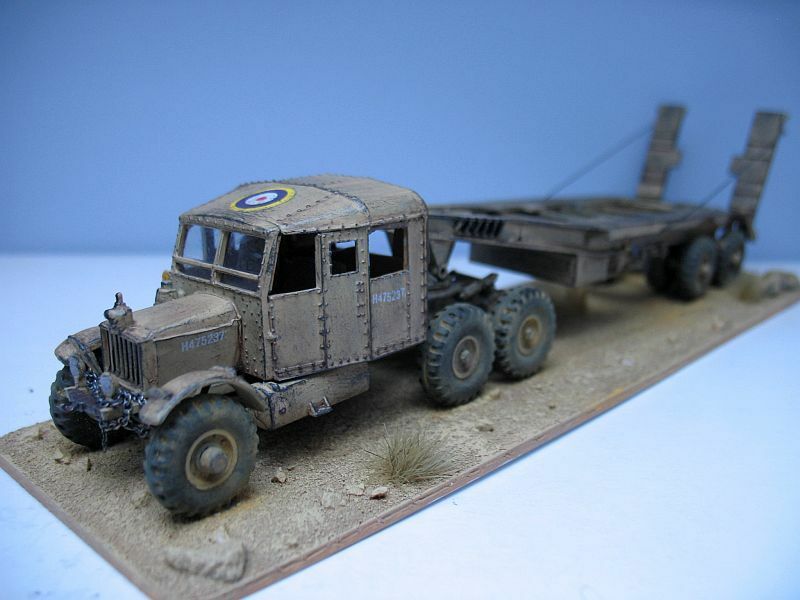 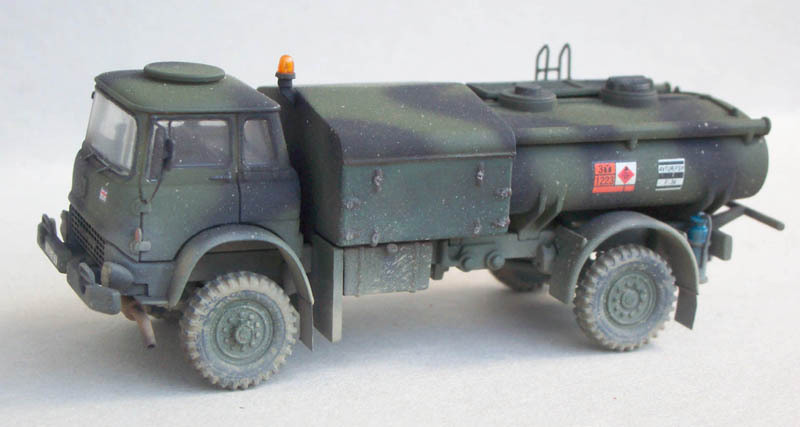 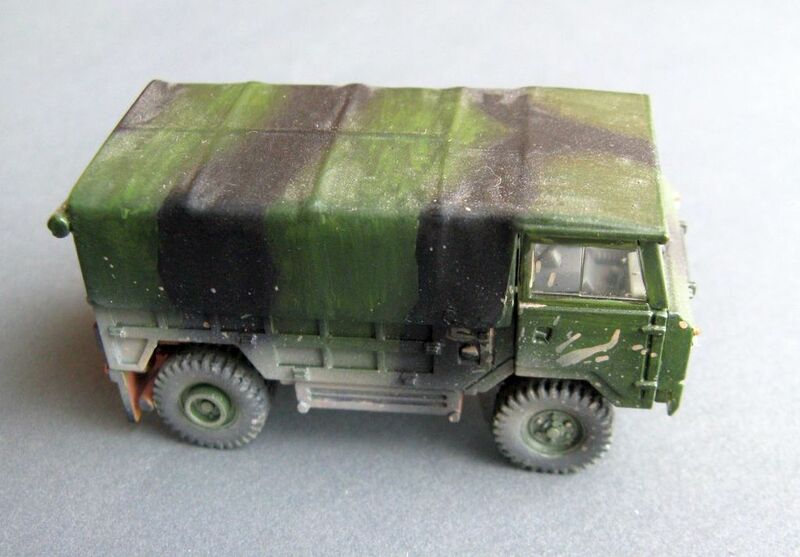 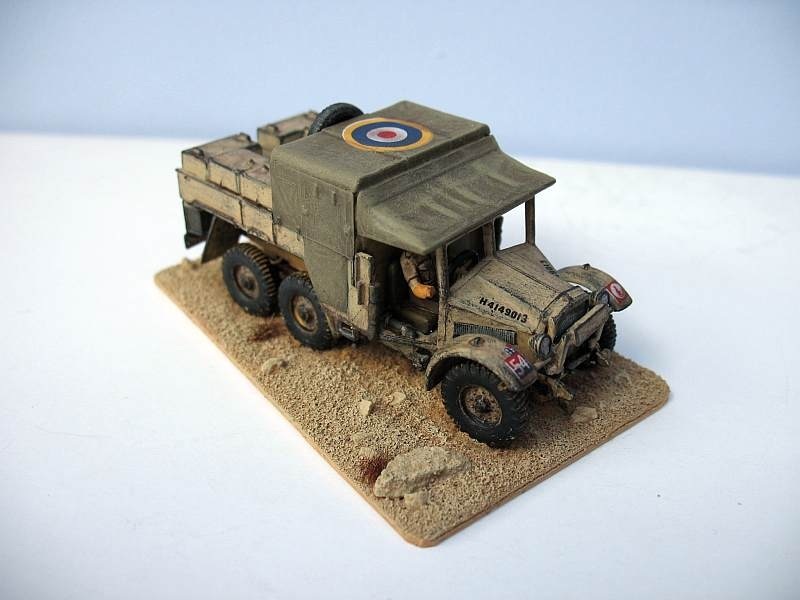 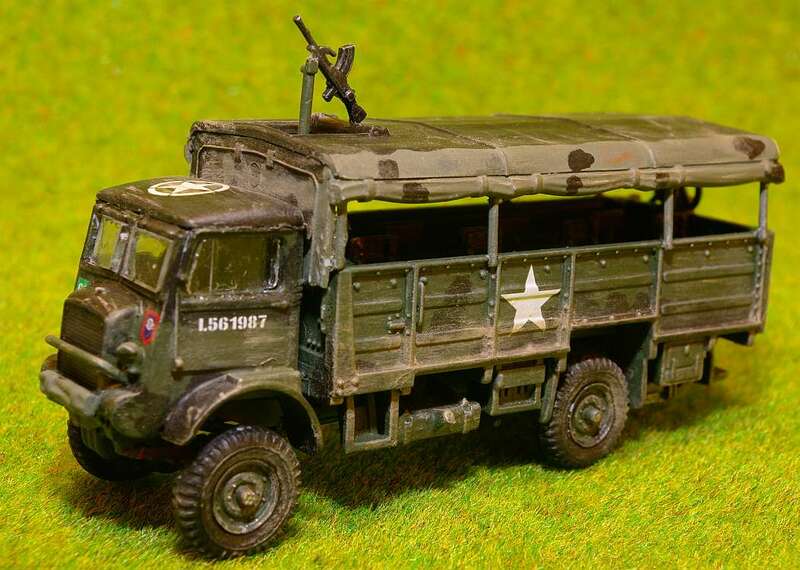 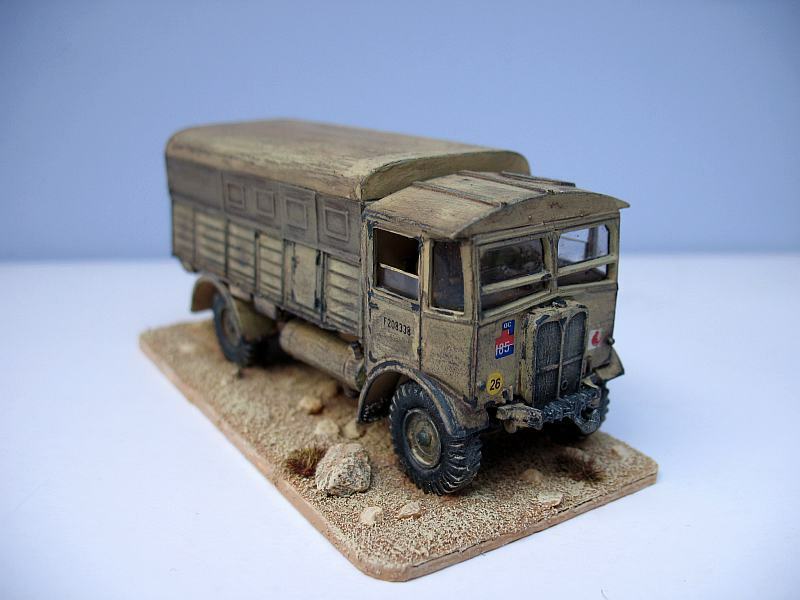 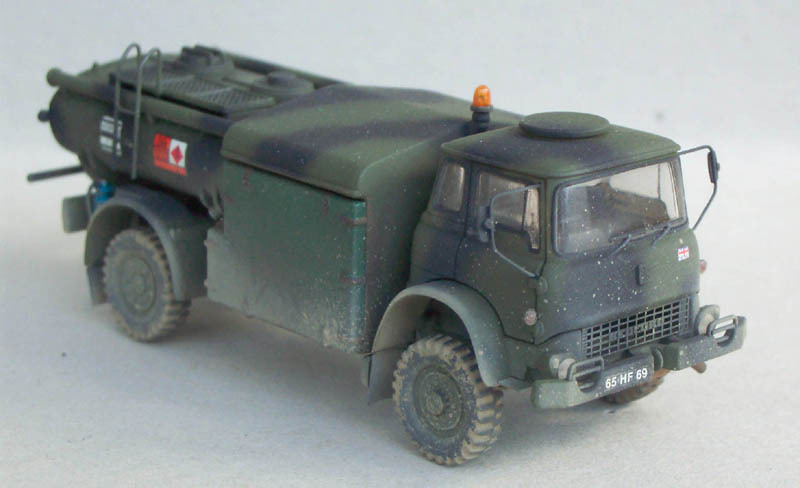 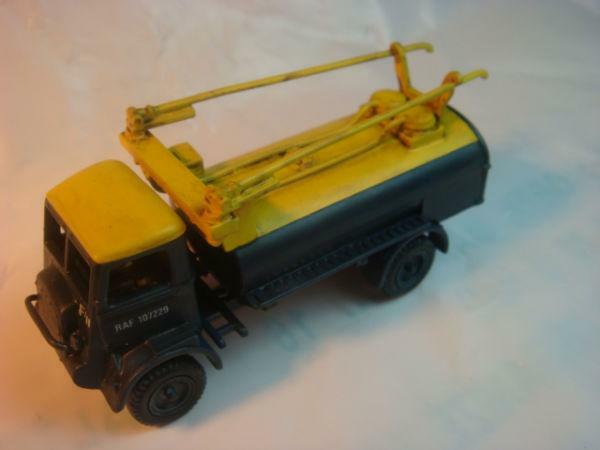 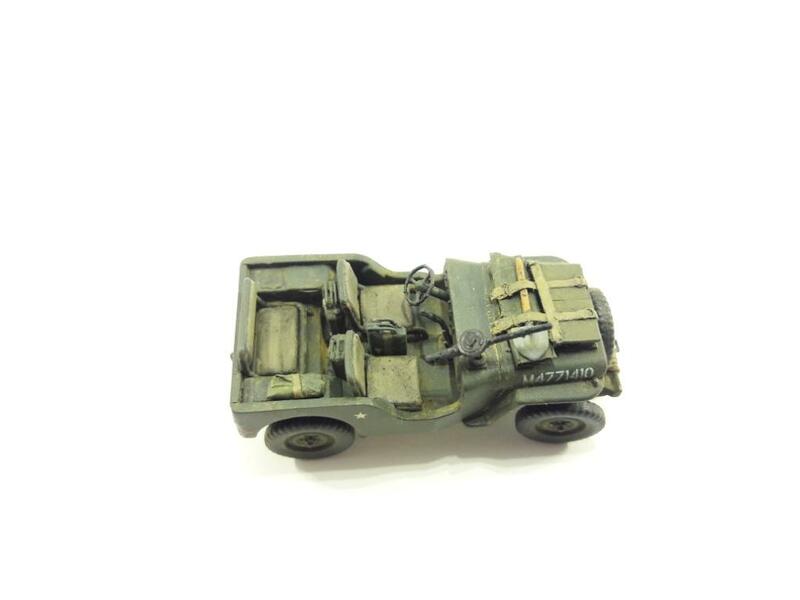 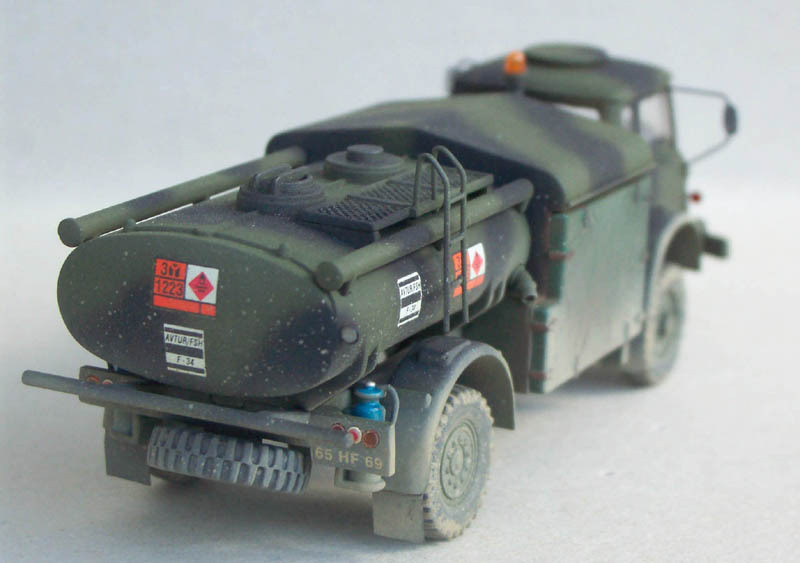 Kit 2326 - Bedford MK 4ton truck - ex-JBModels. 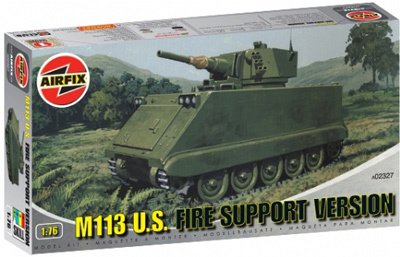 Kit 2327 - M113 U.S. fire support vehicle - ex-JBModels. 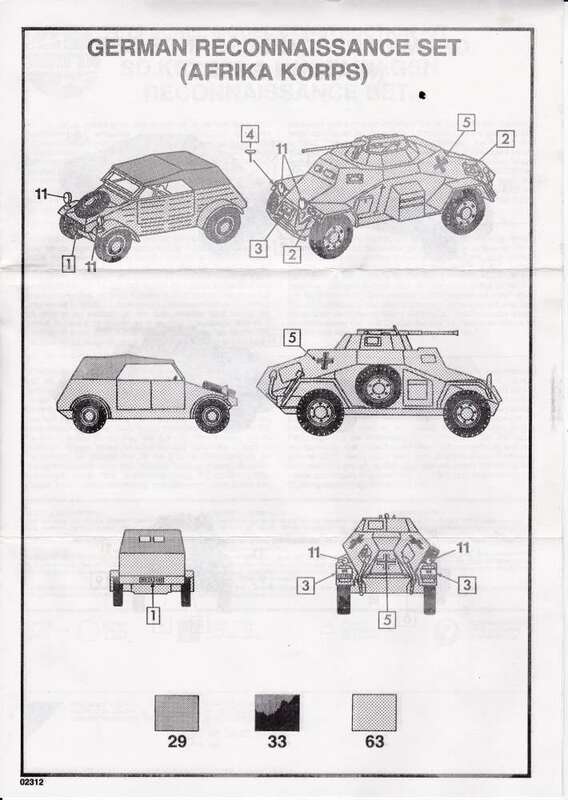 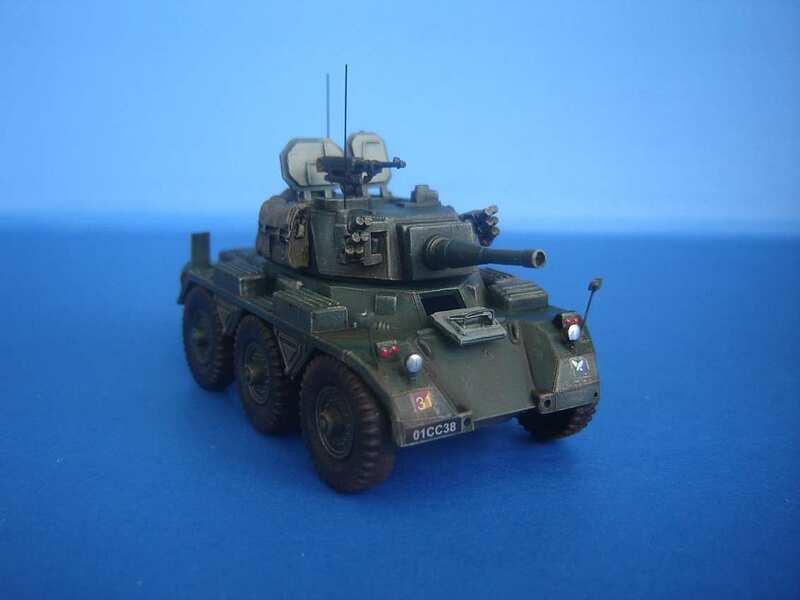 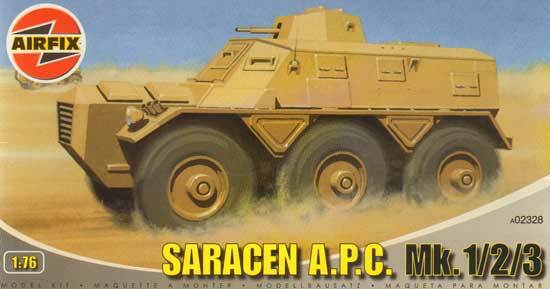 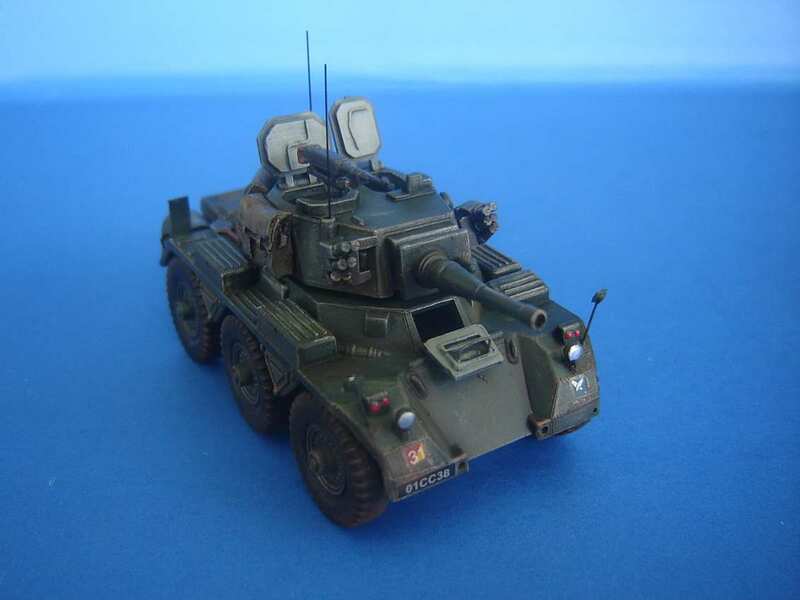 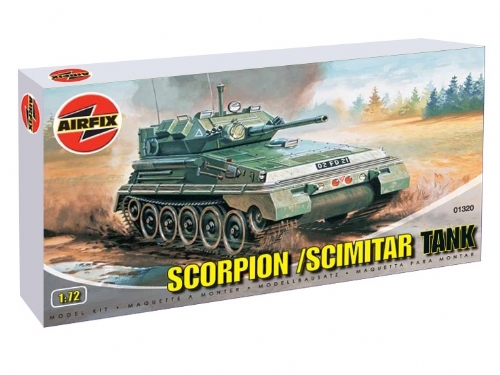 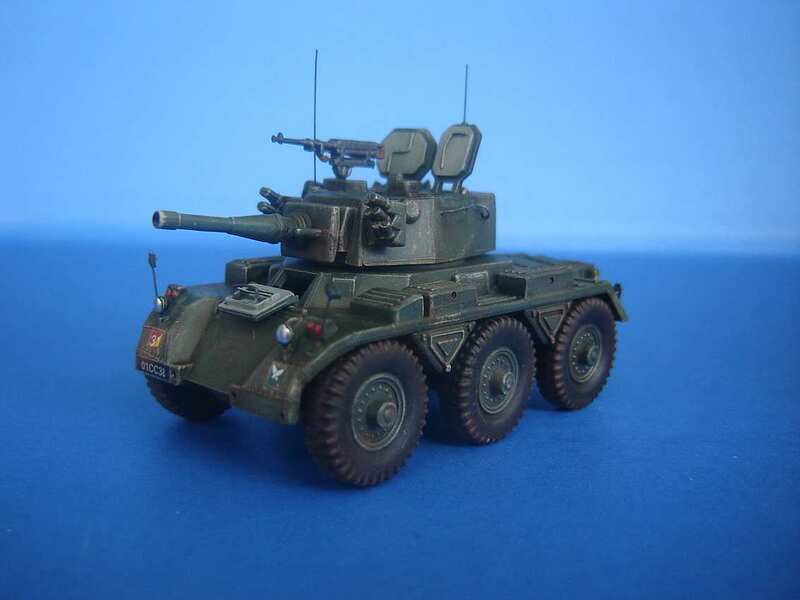 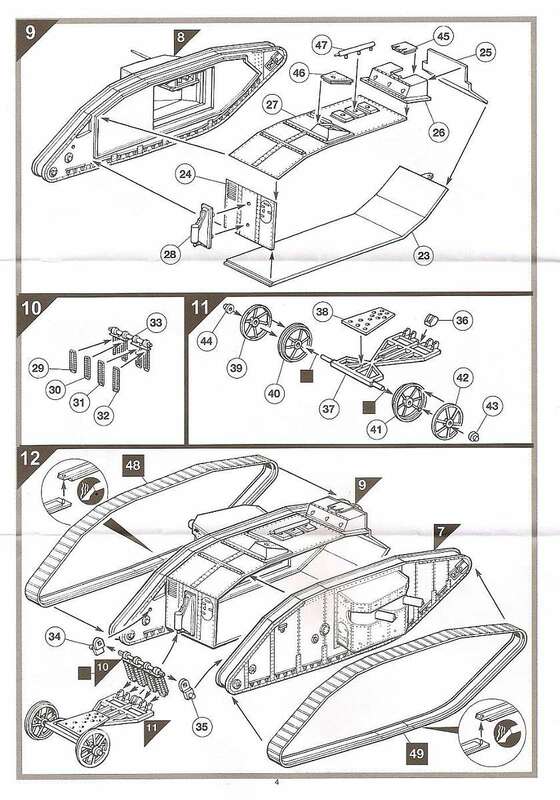 Kit 2328 - Saracen APC Mk1/2/3 - ex-JBModels. 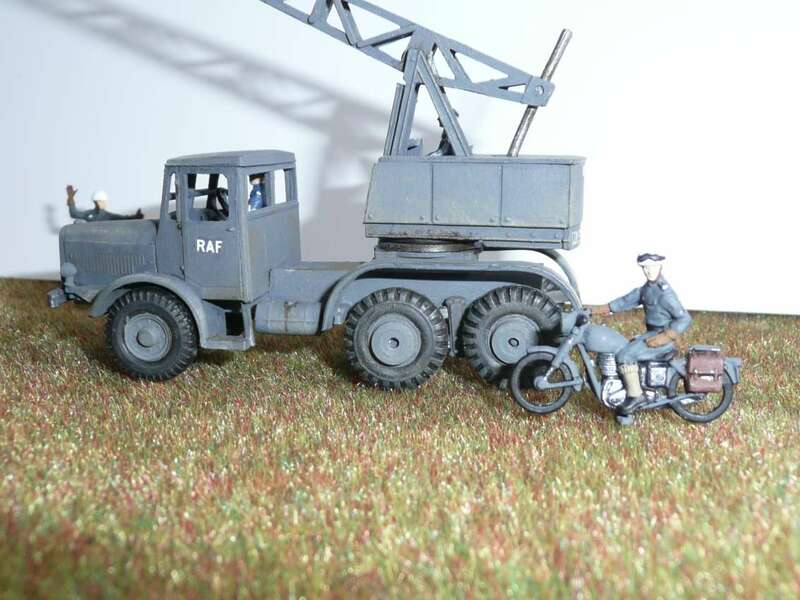 Model built by Tomas Hrdlicka. 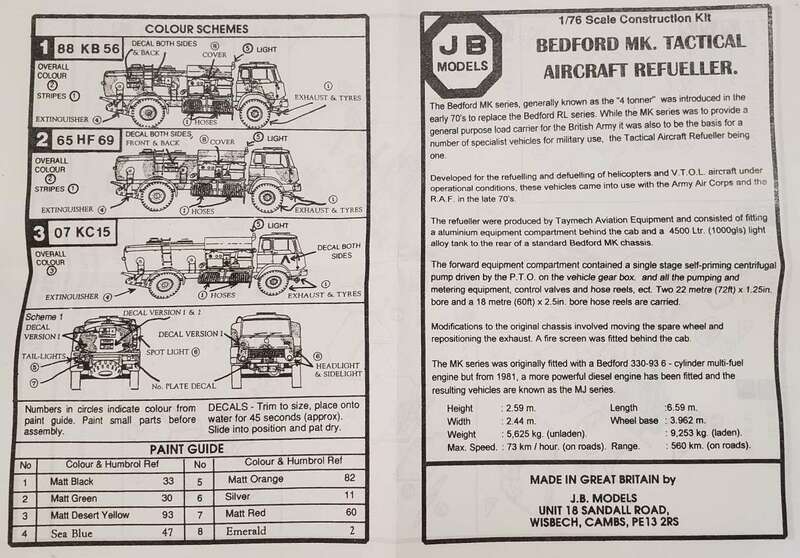 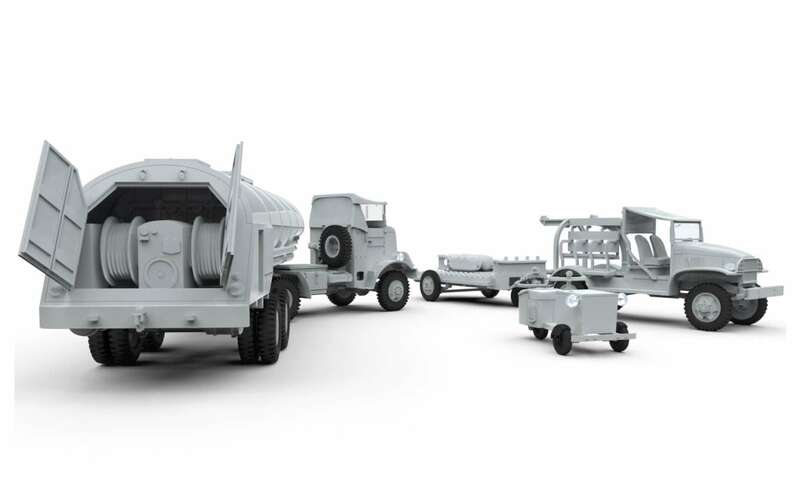 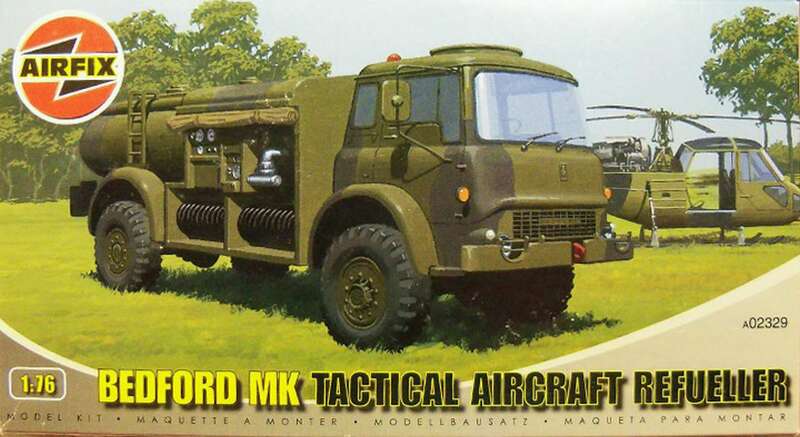 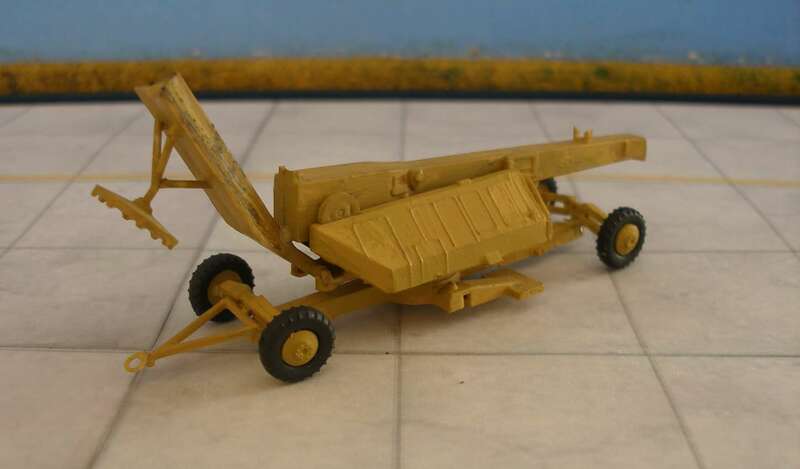 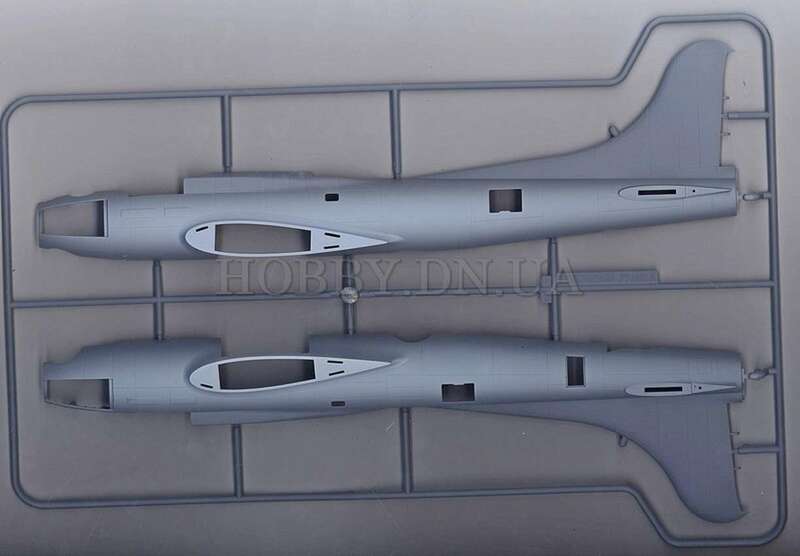 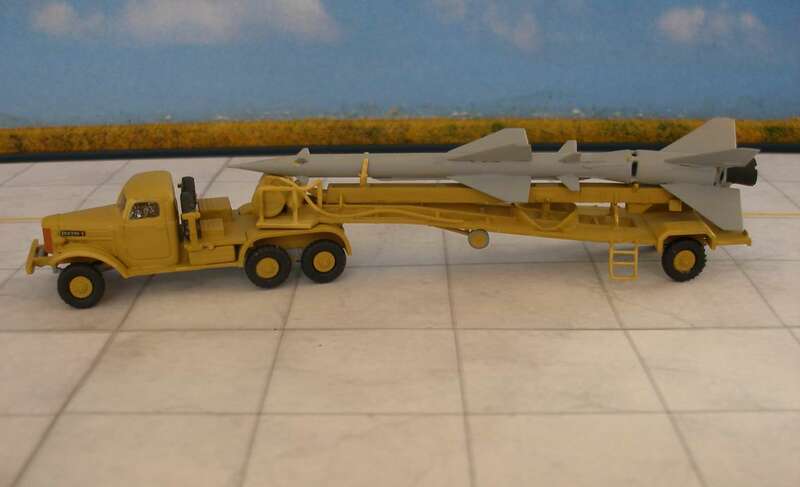 Kit 2329 - Bedford Mk tactical aircraft refueller - ex-JBModels. 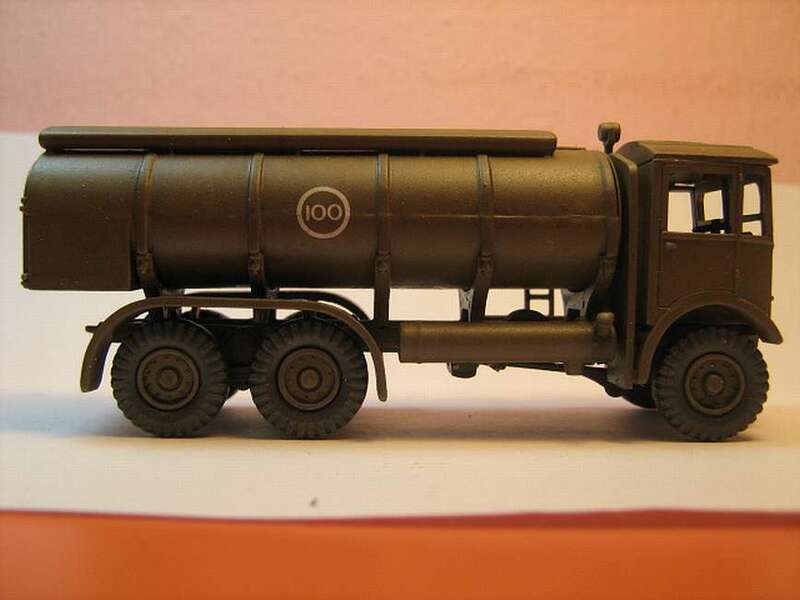 Model built by Ilian Filipov. 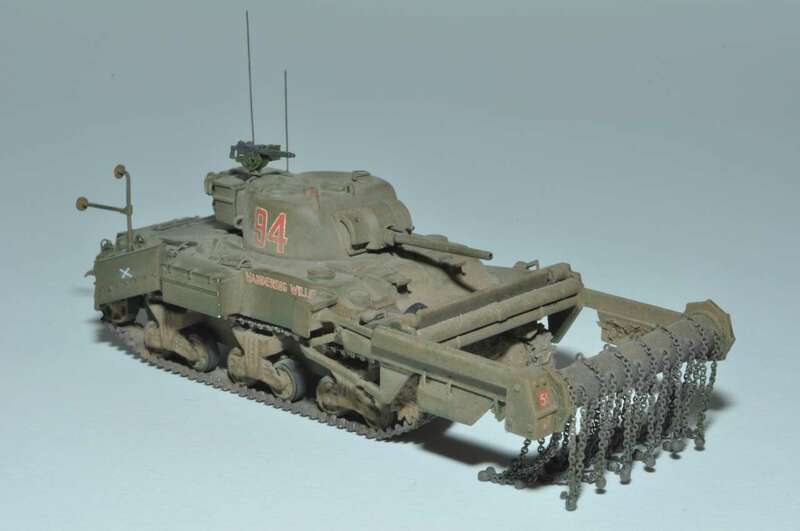 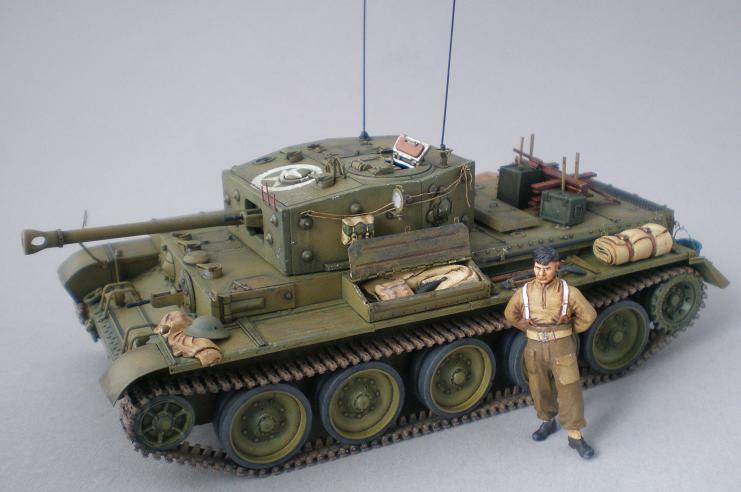 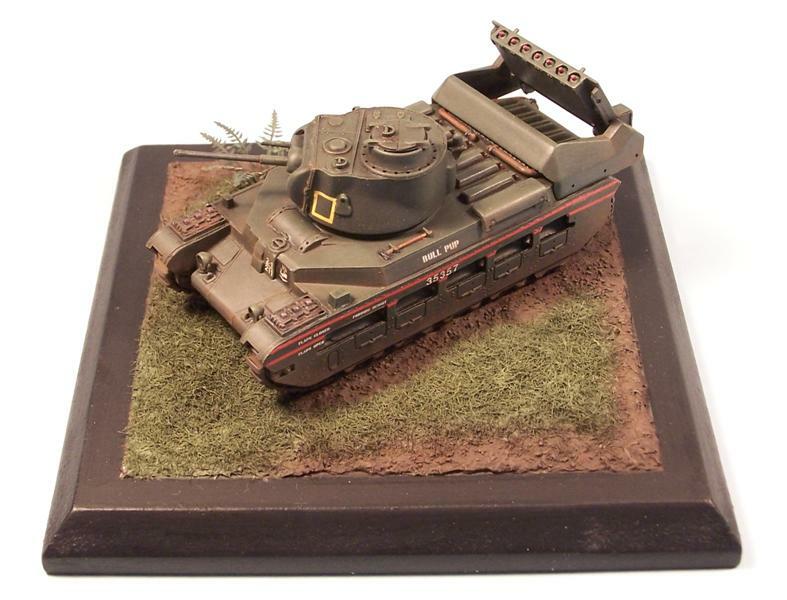 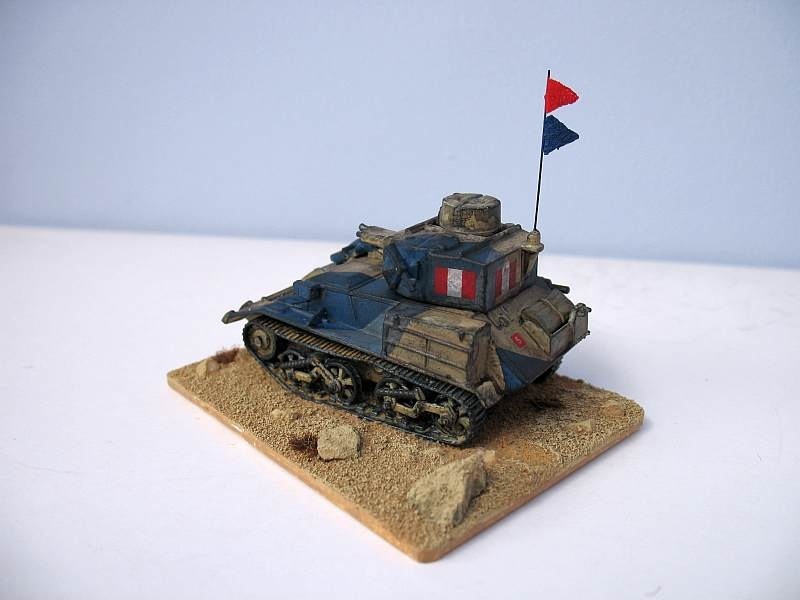 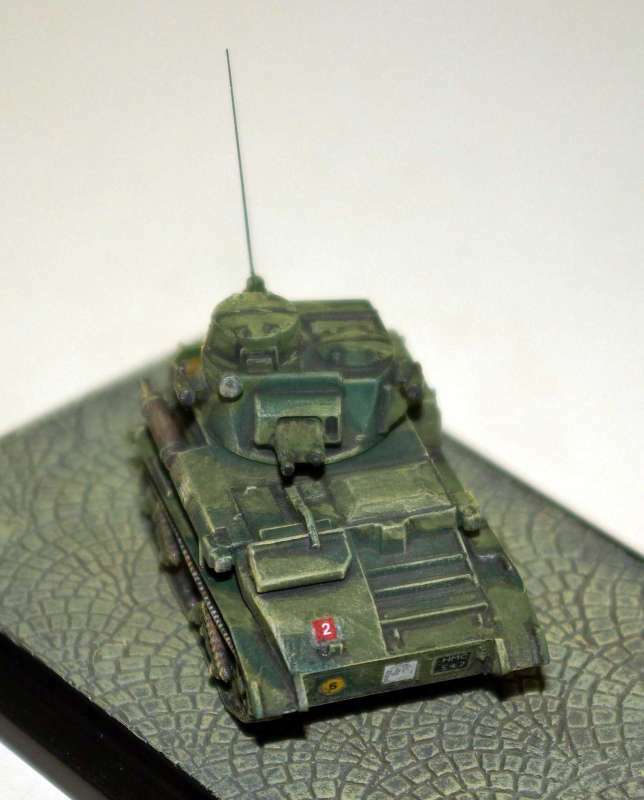 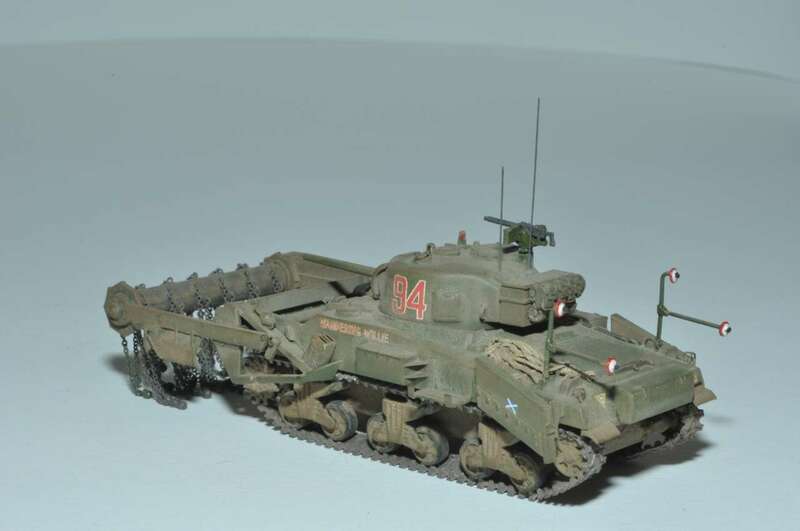 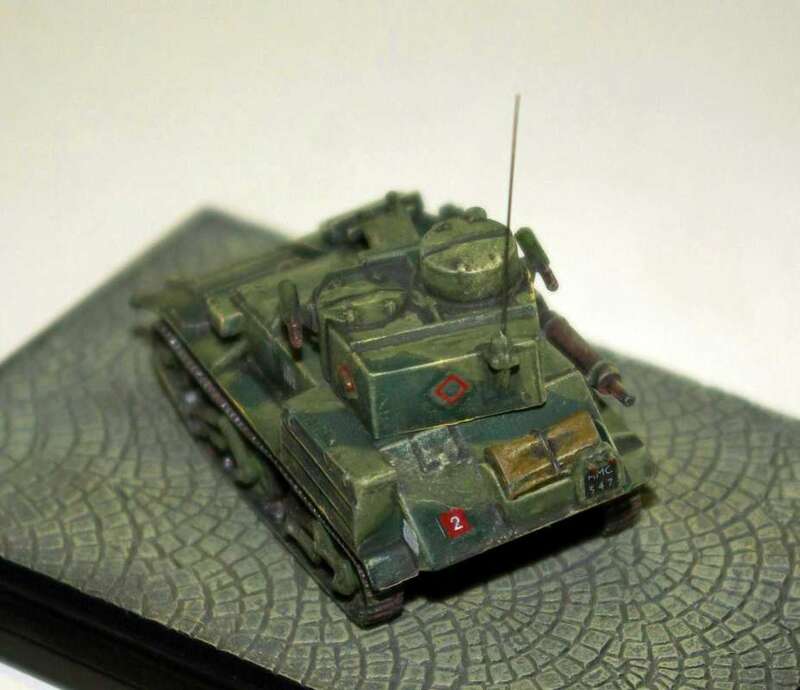 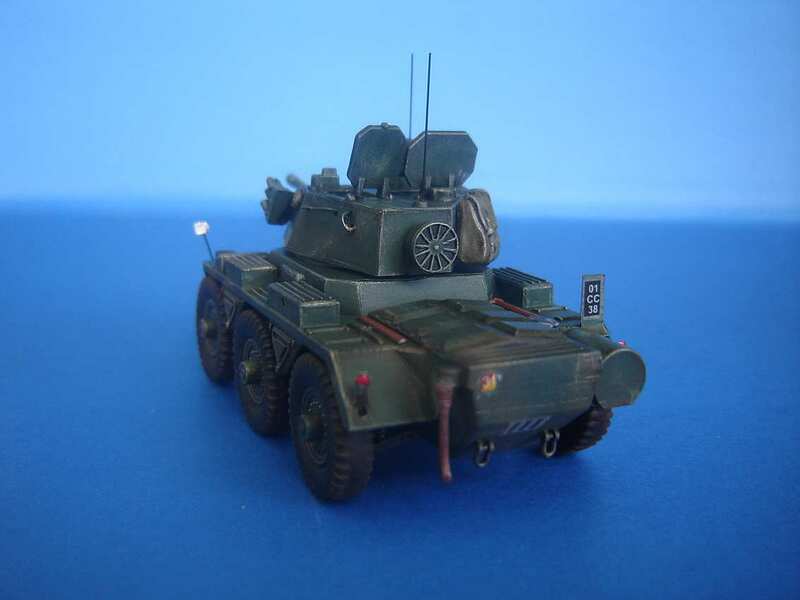 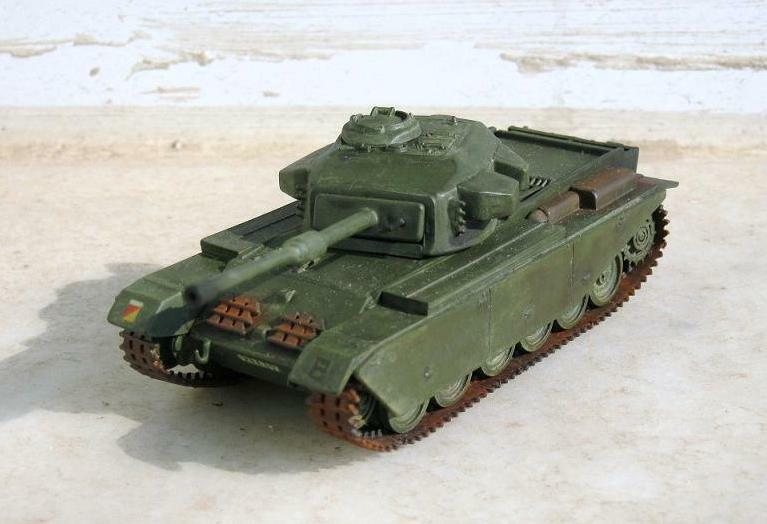 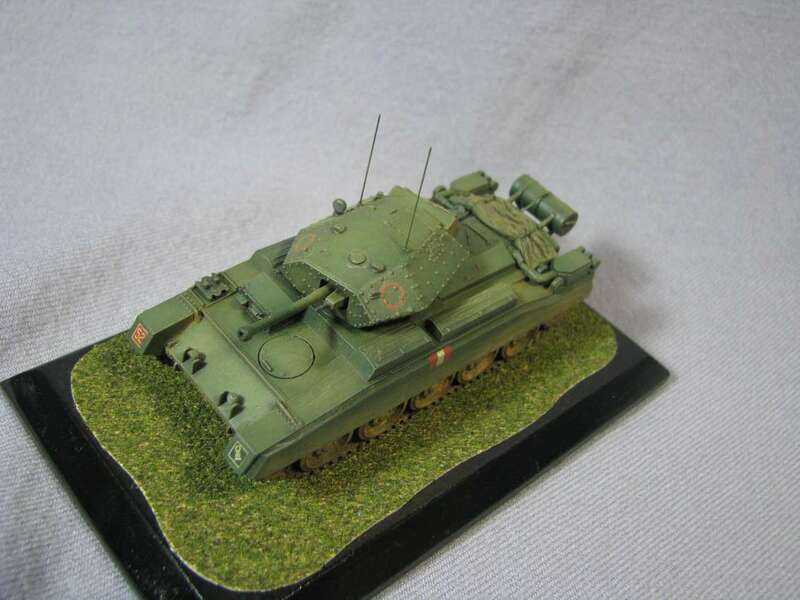 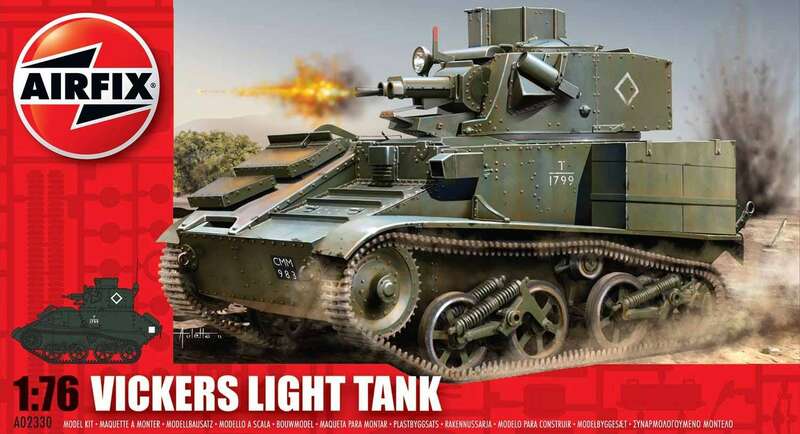 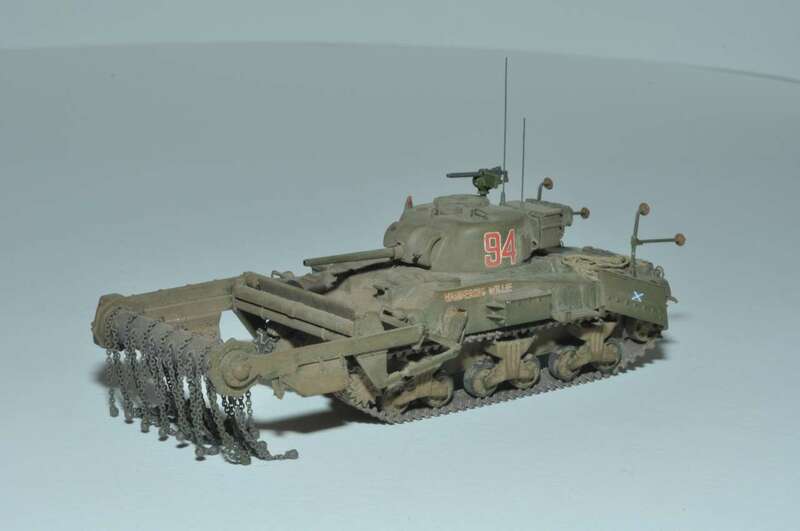 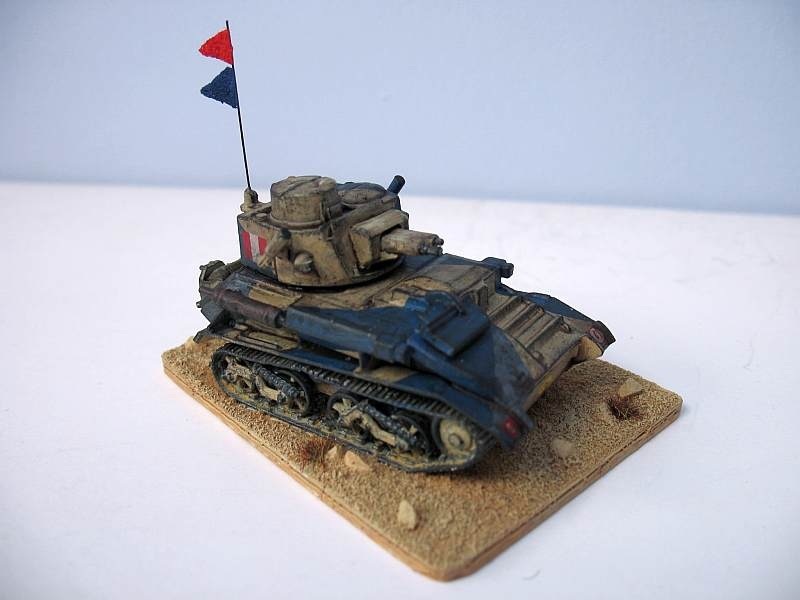 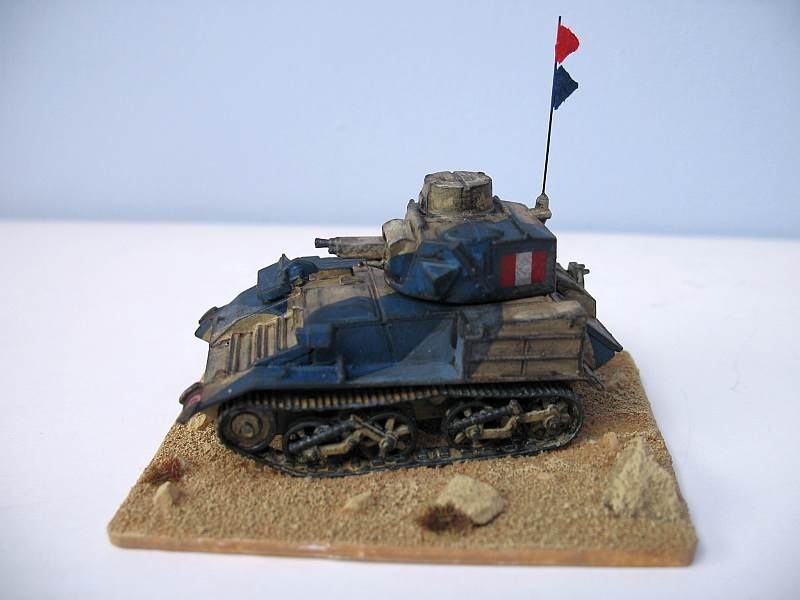 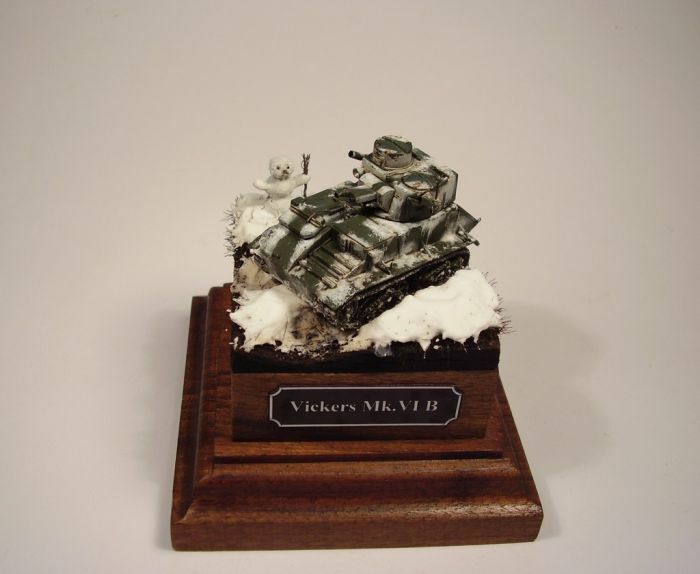 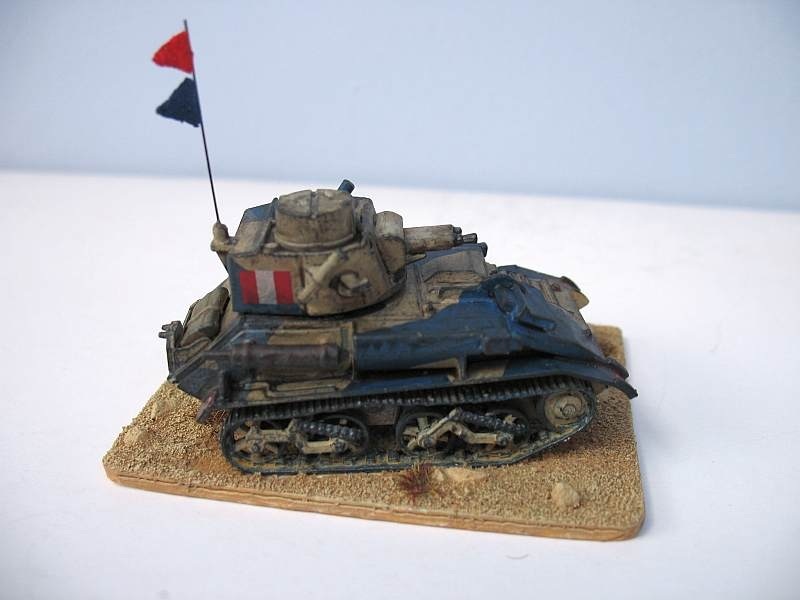 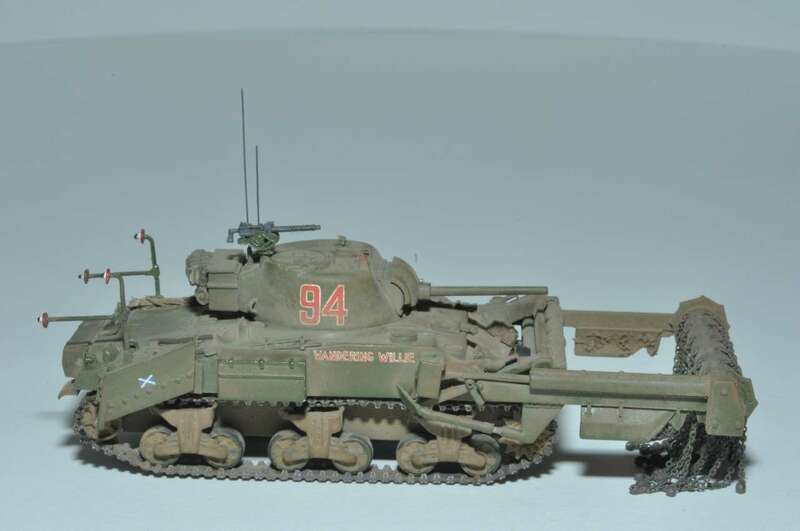 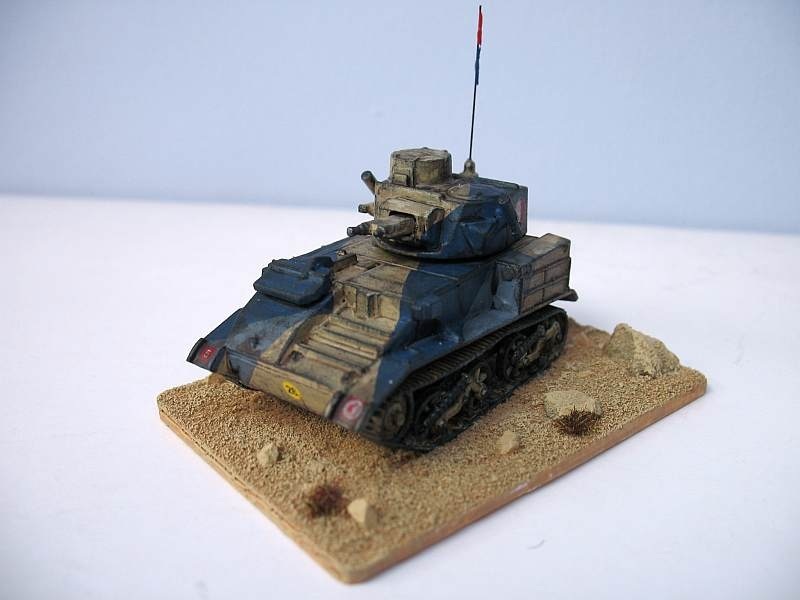 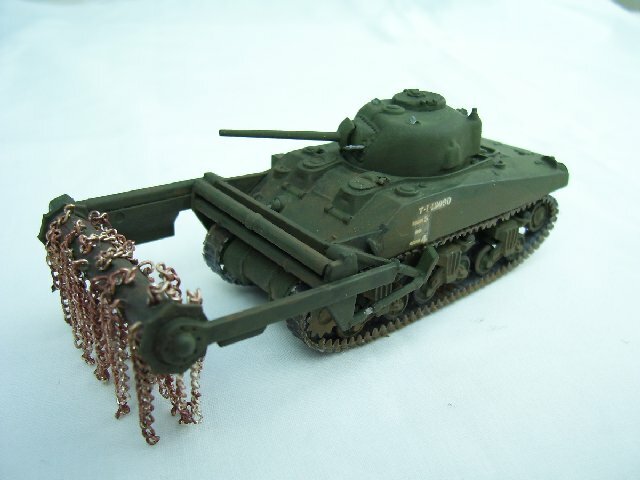 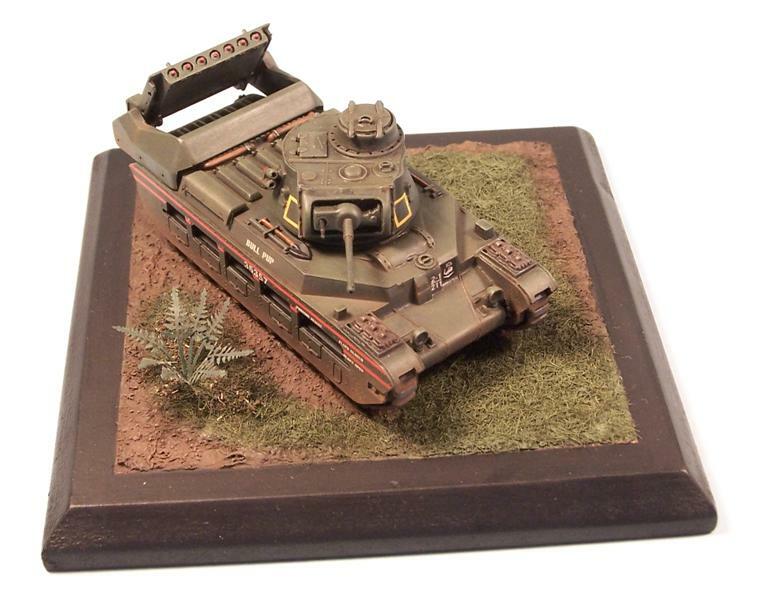 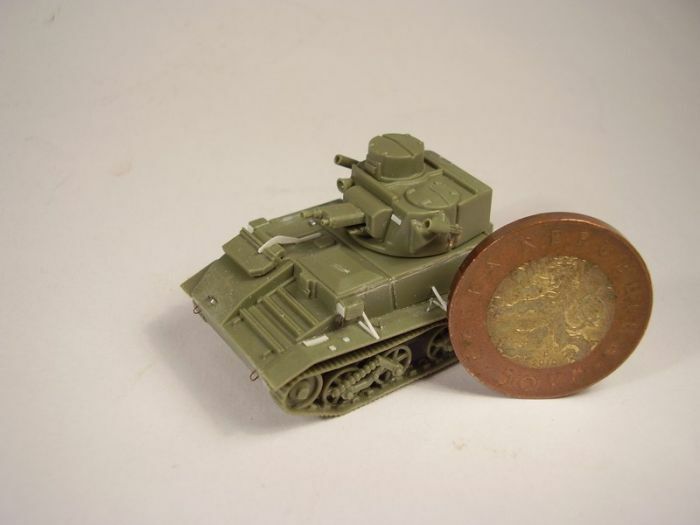 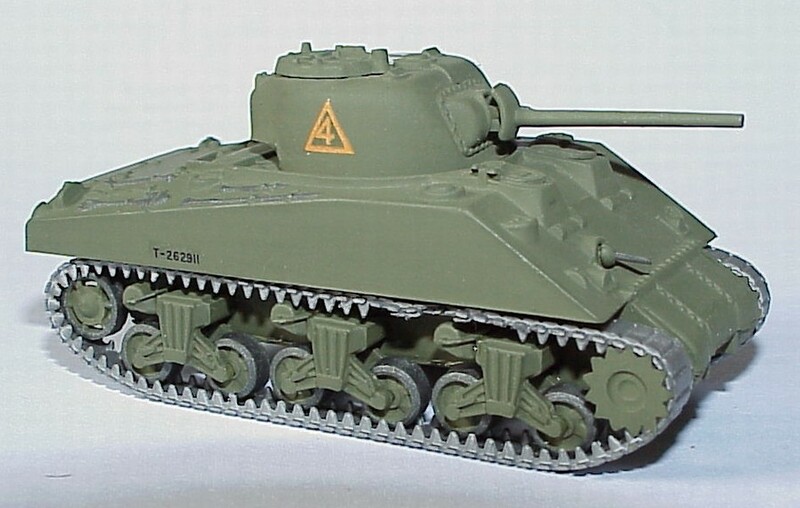 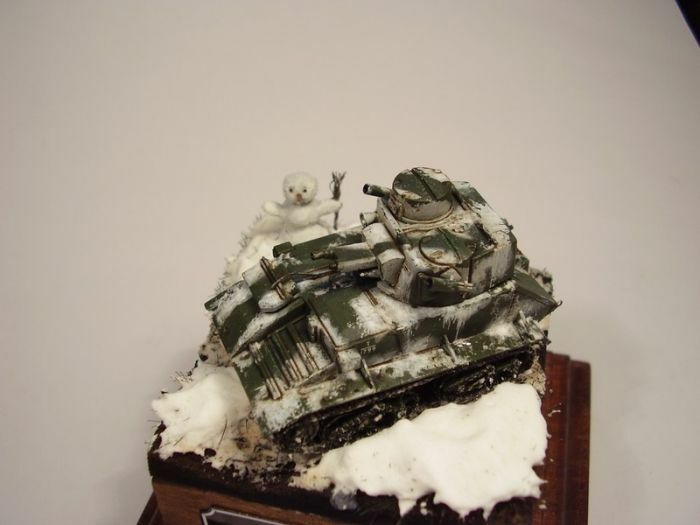 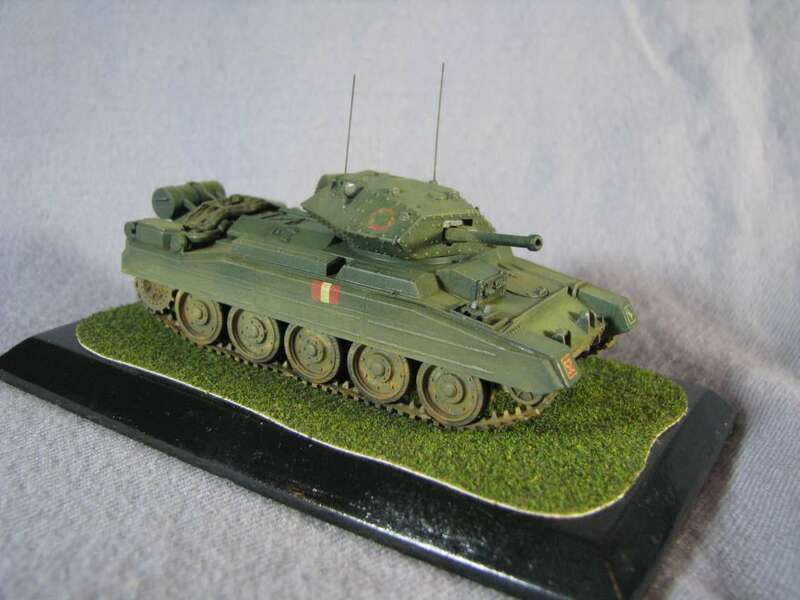 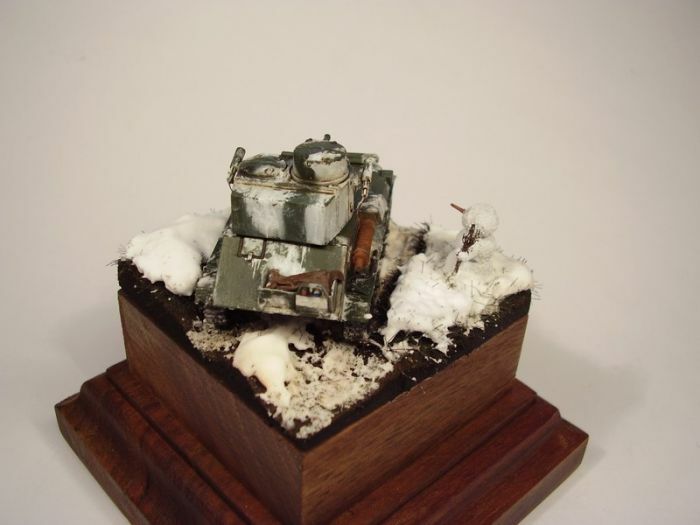 Kit 2330 - Vickers light tank - ex-JBModels. 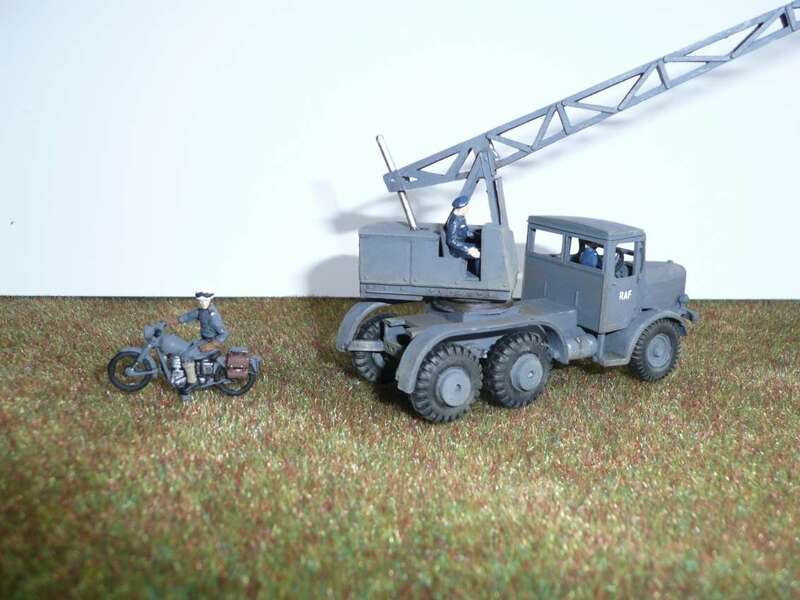 Model built by Petr Hlavacek. 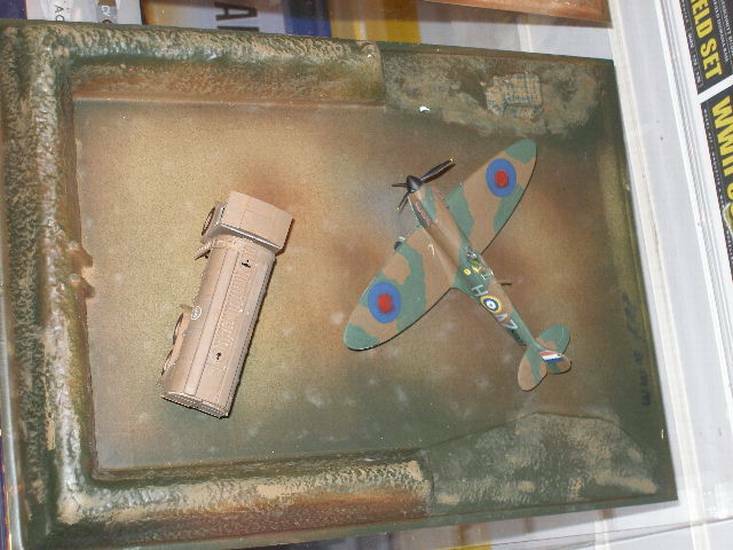 Model built by Olaf Klein - Vickers VIB France 40. 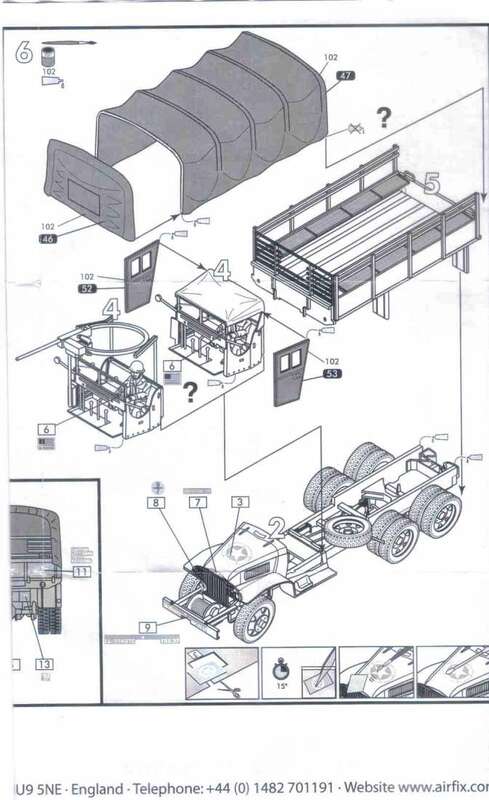 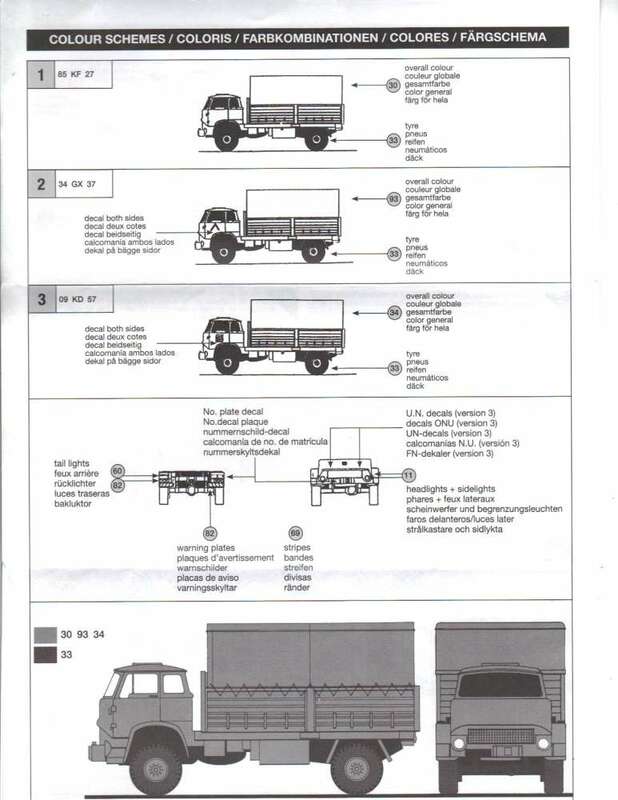 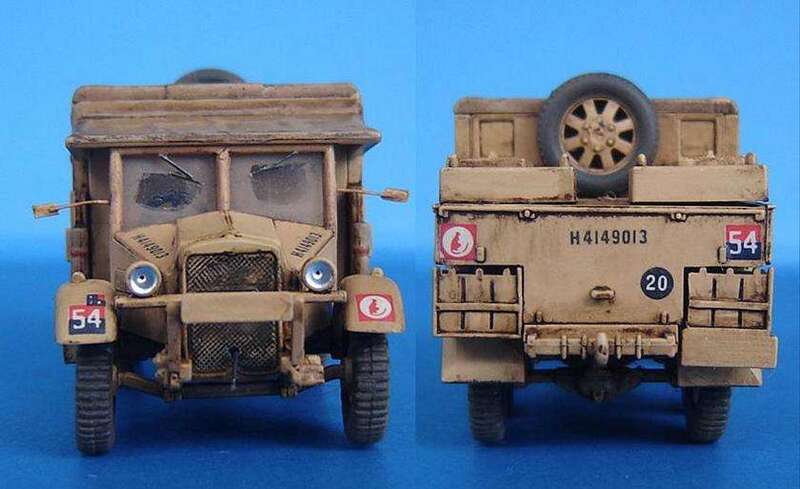 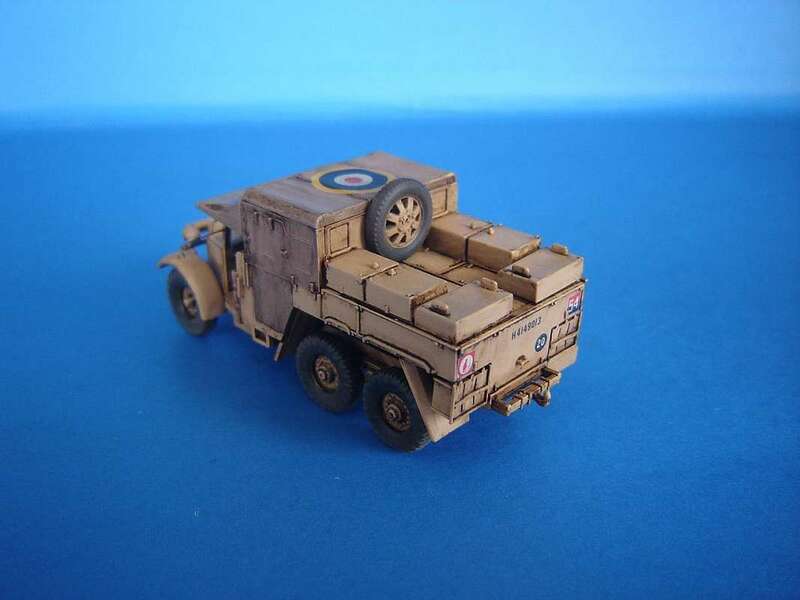 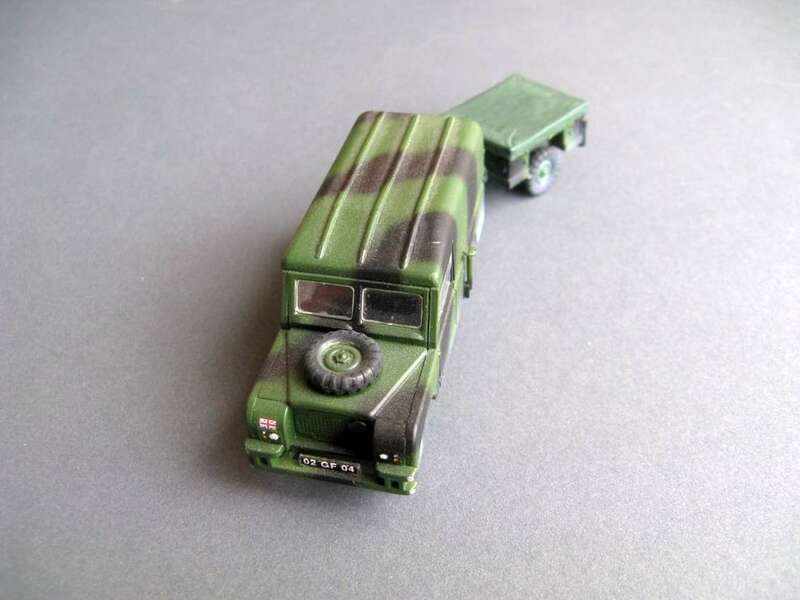 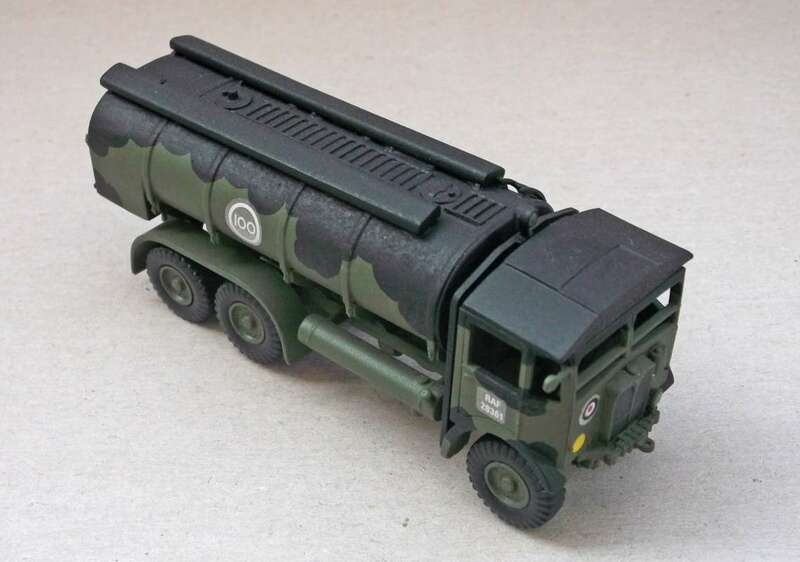 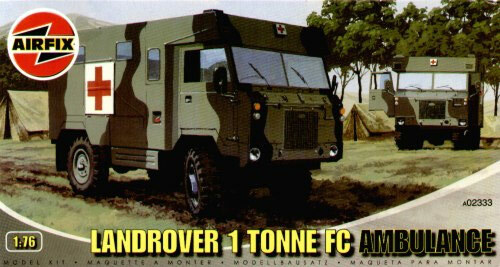 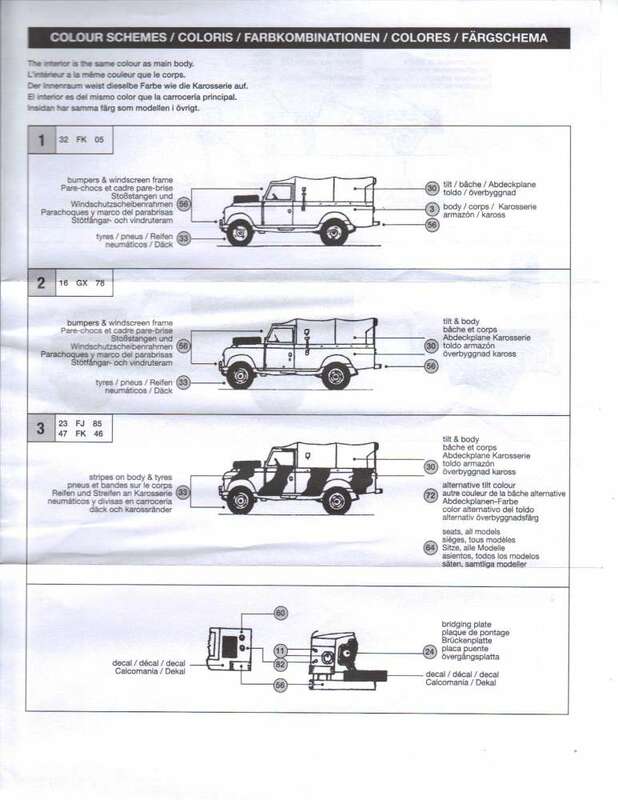 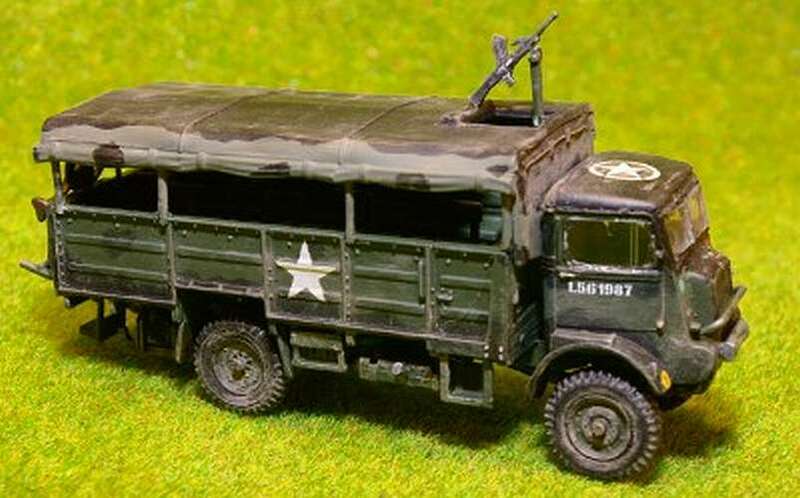 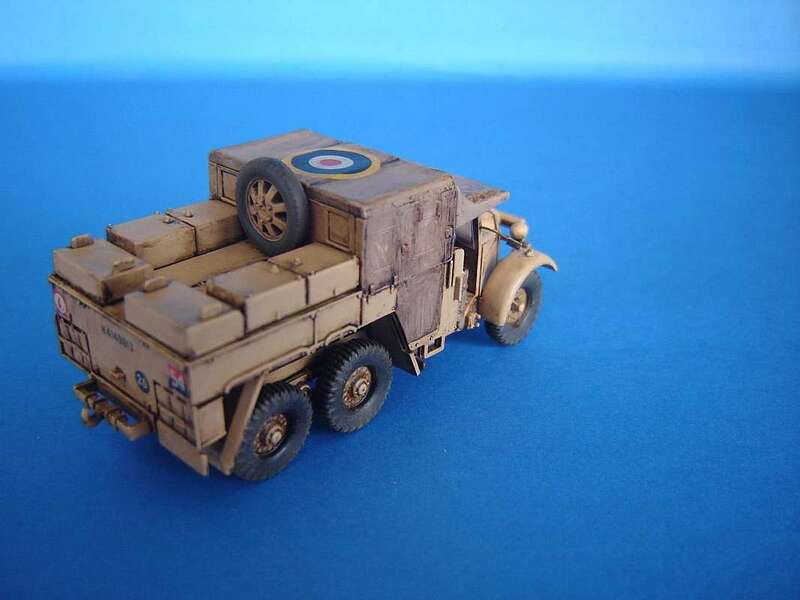 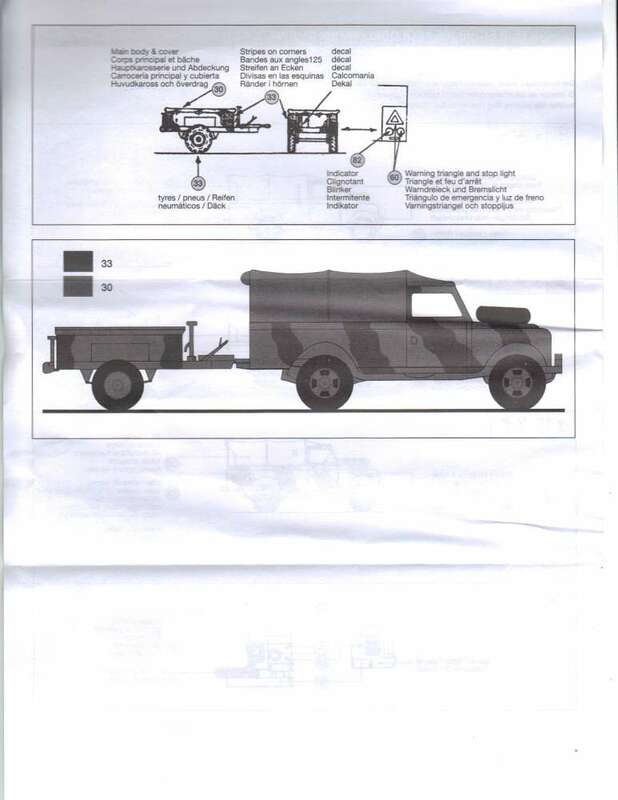 Kit 2331 - Landrover 1ton FC truck G.S. 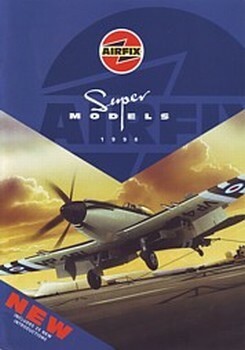 Body - ex-JBModels. 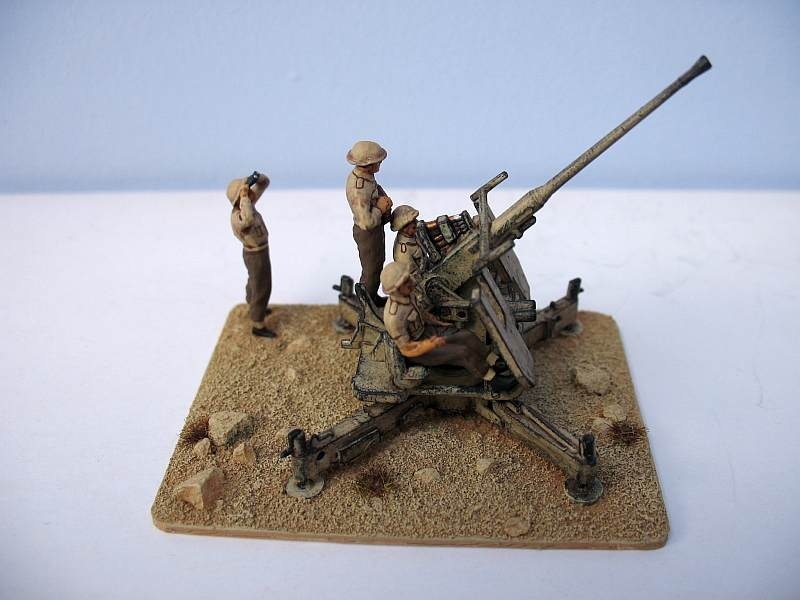 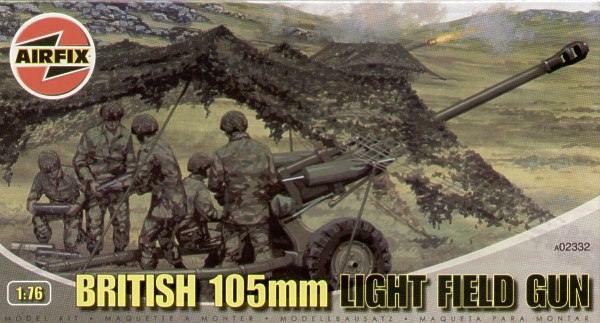 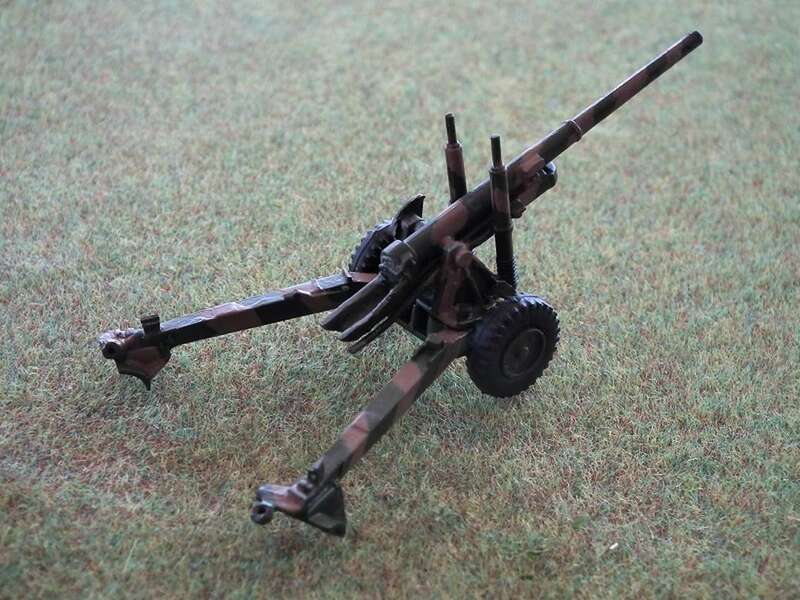 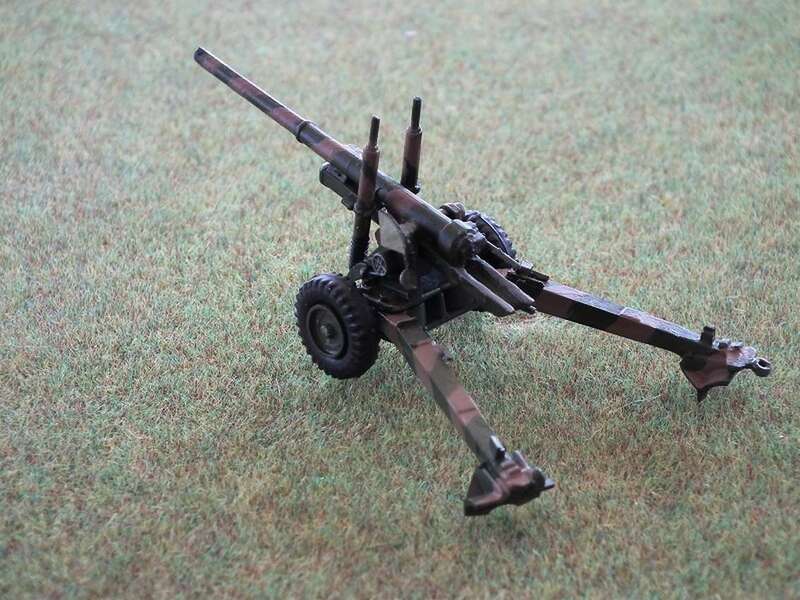 Kit 2332 - British M119 105mm light field gun - ex-JBModels. 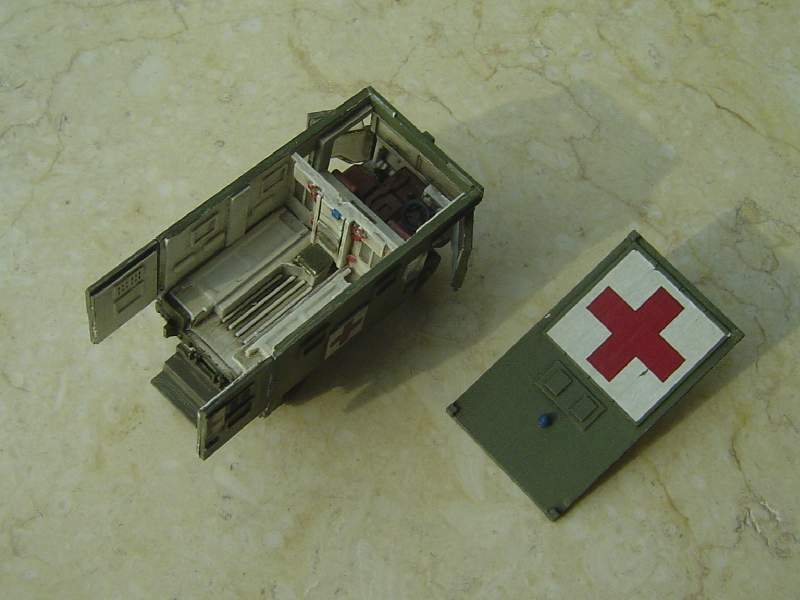 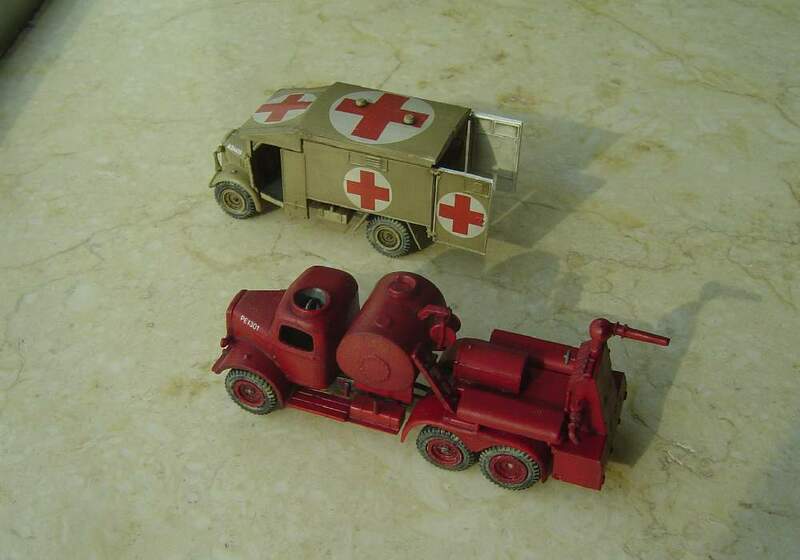 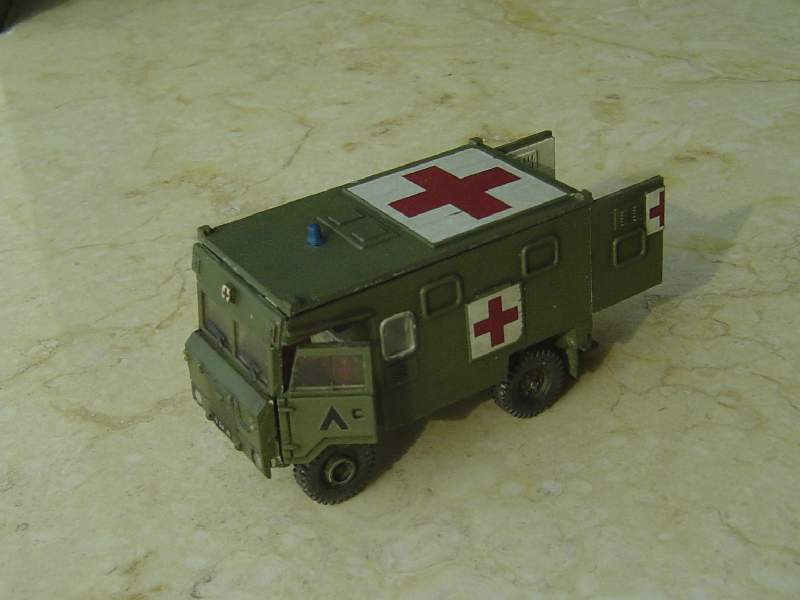 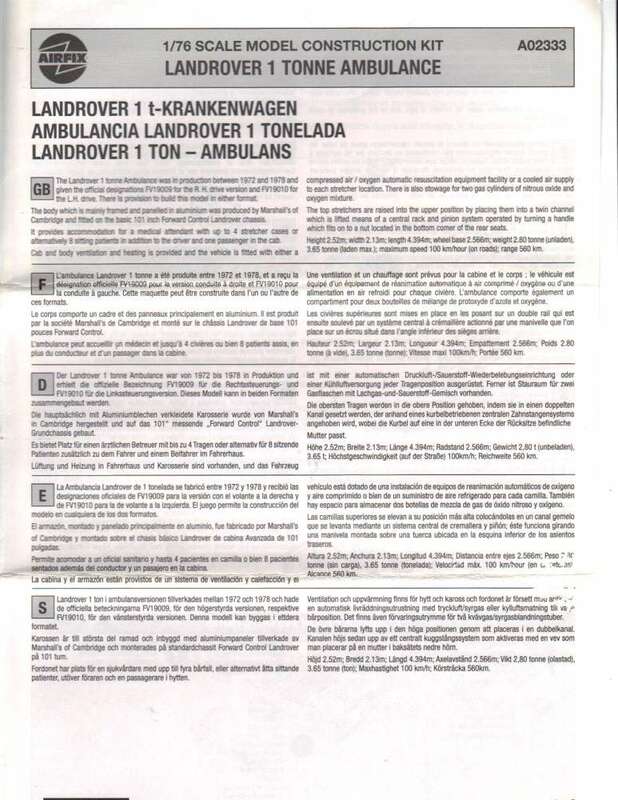 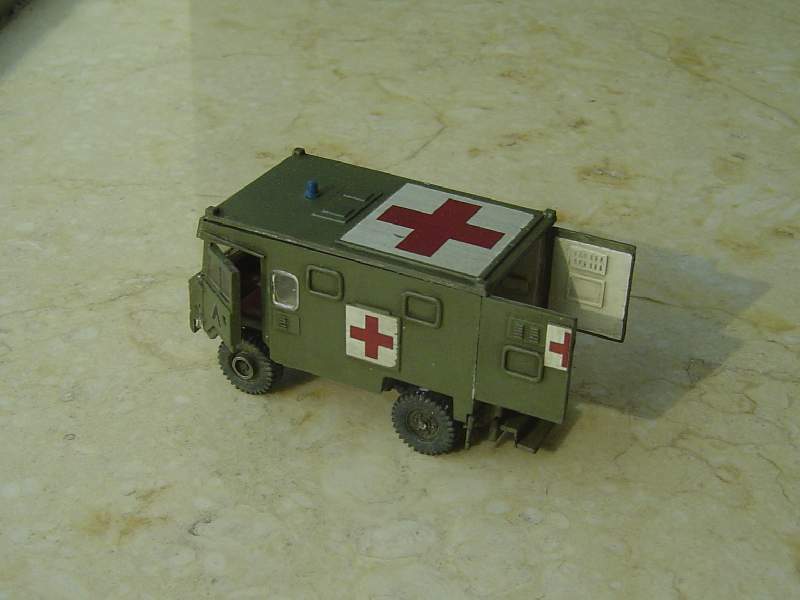 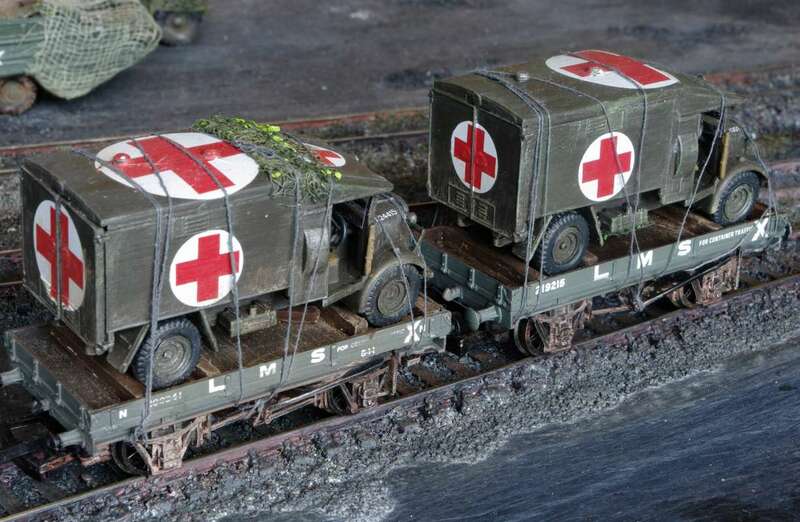 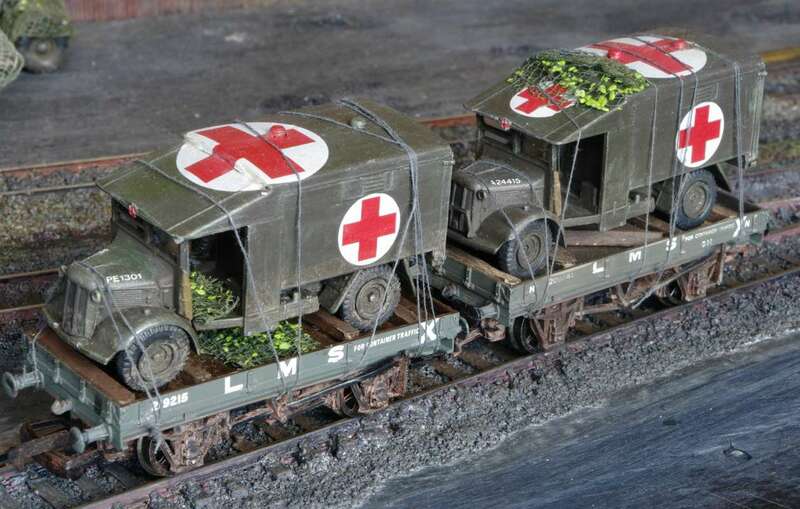 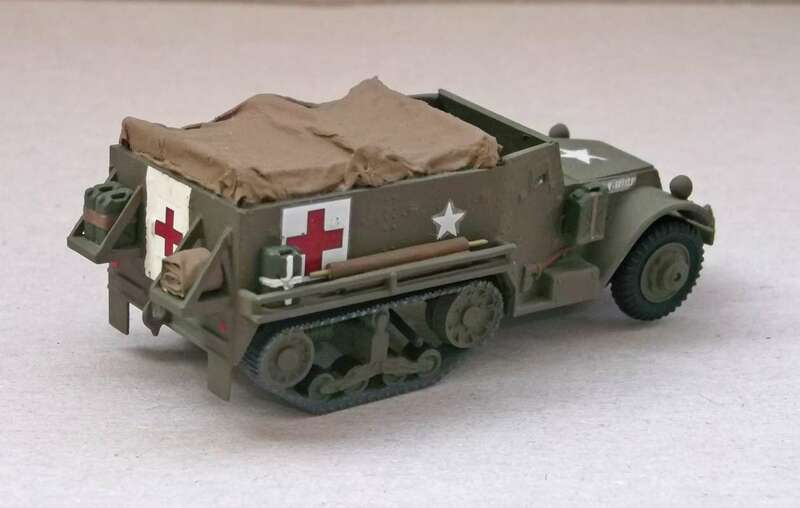 Kit 2333 - Landrover 1ton FC ambulance - ex-JBModels. 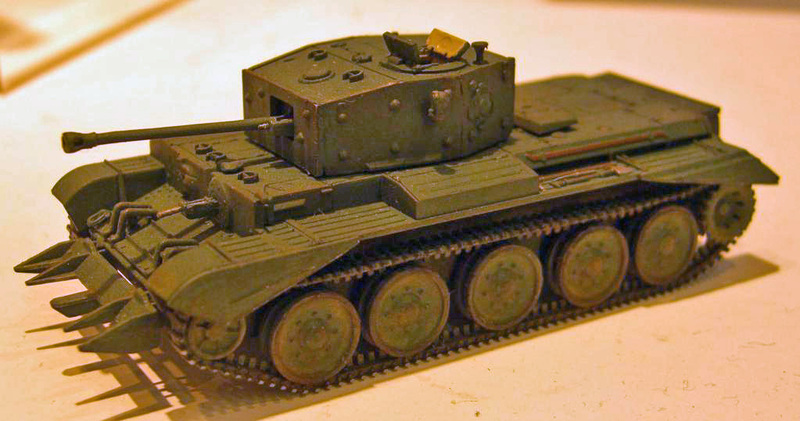 Model built by Jonathan Mock. 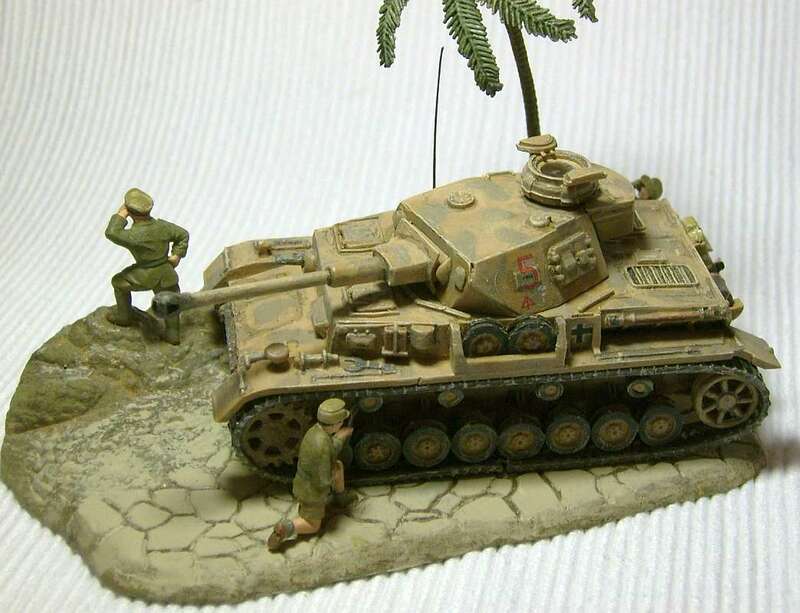 Model built - owners unknown. 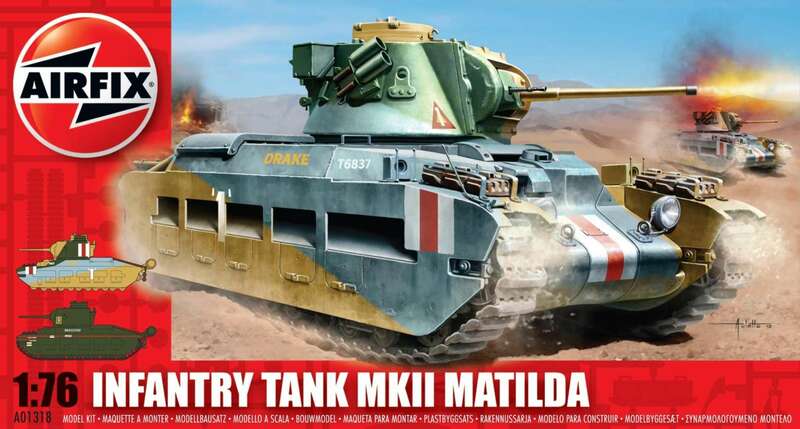 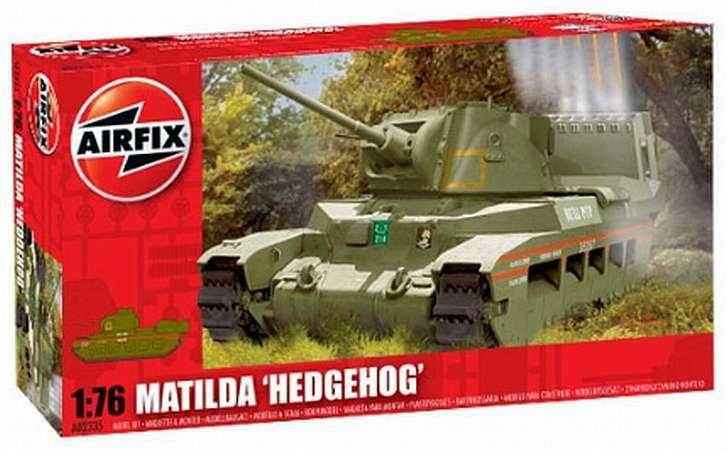 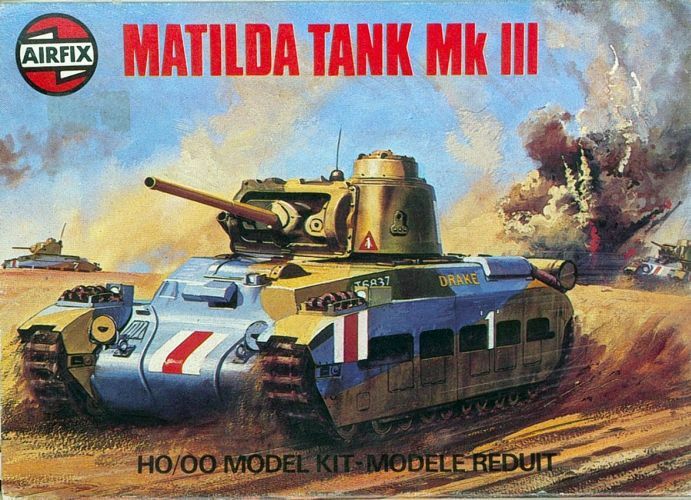 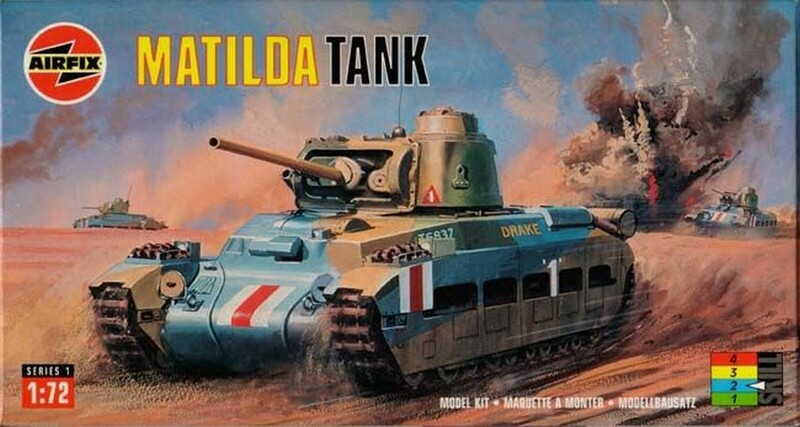 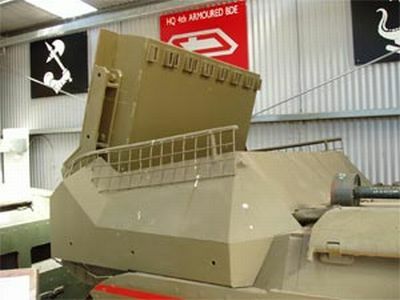 Kit 2335 - Matilda 'Hedgehog'. 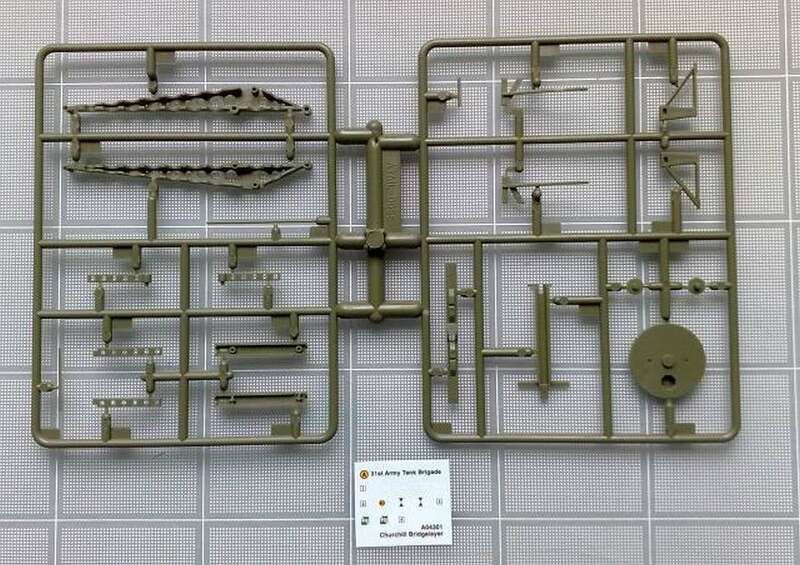 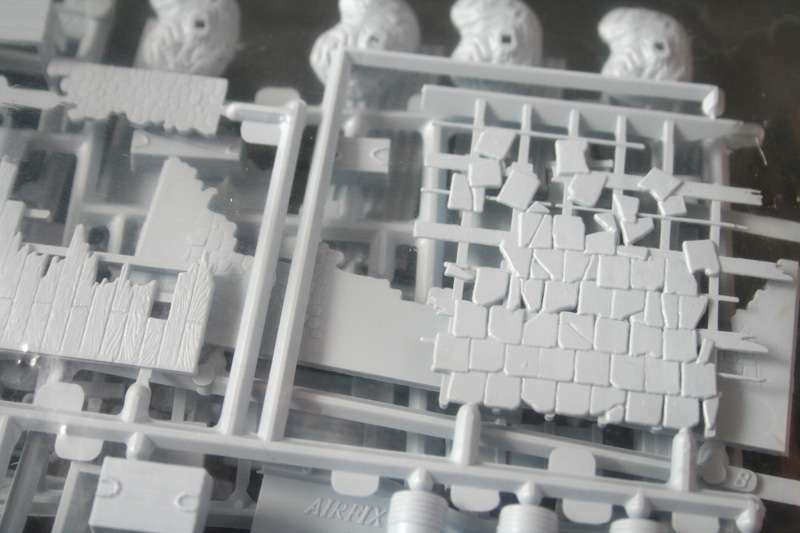 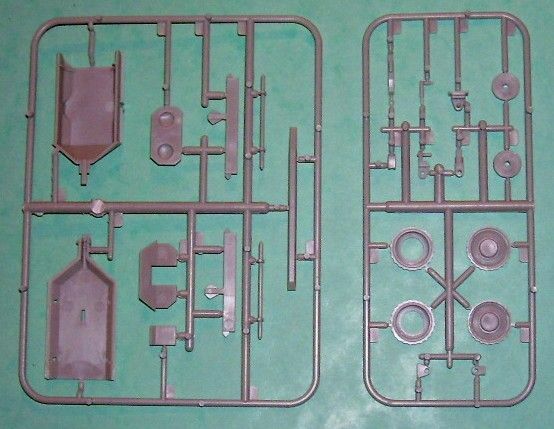 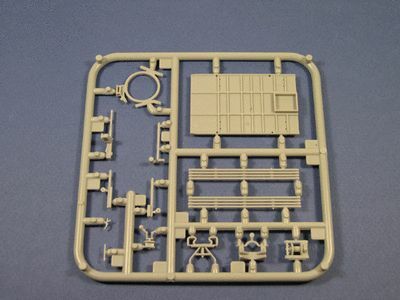 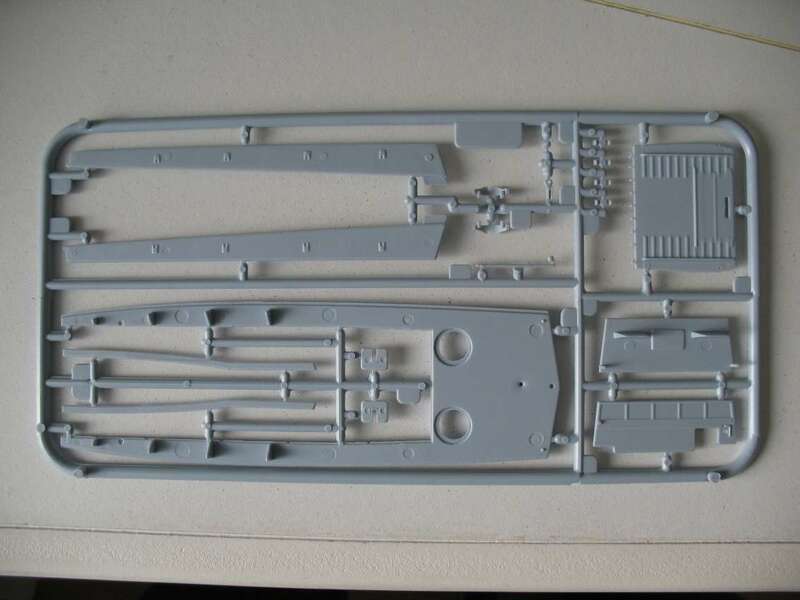 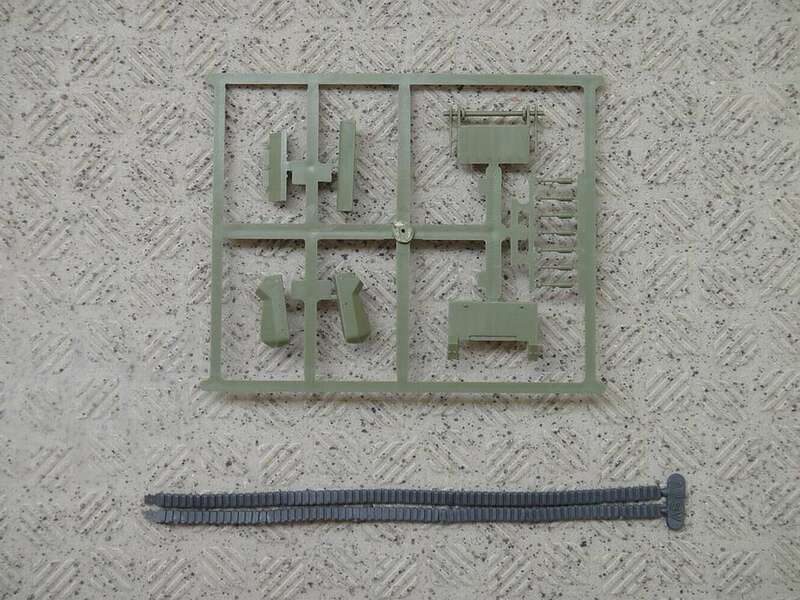 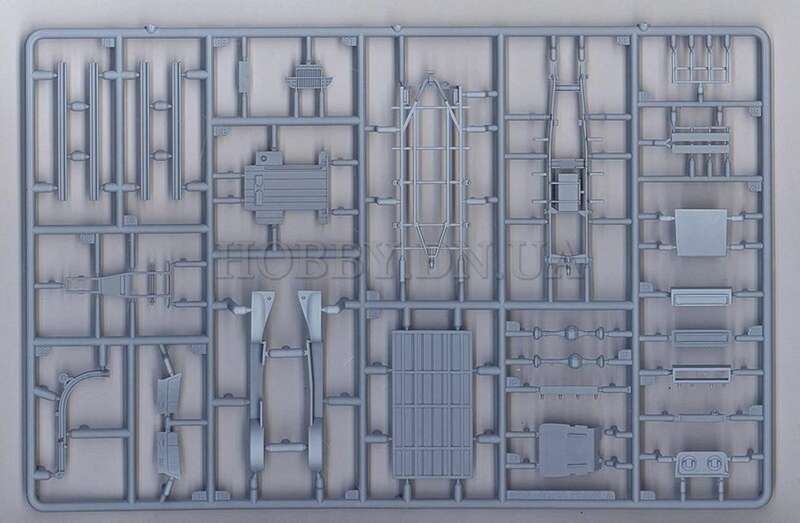 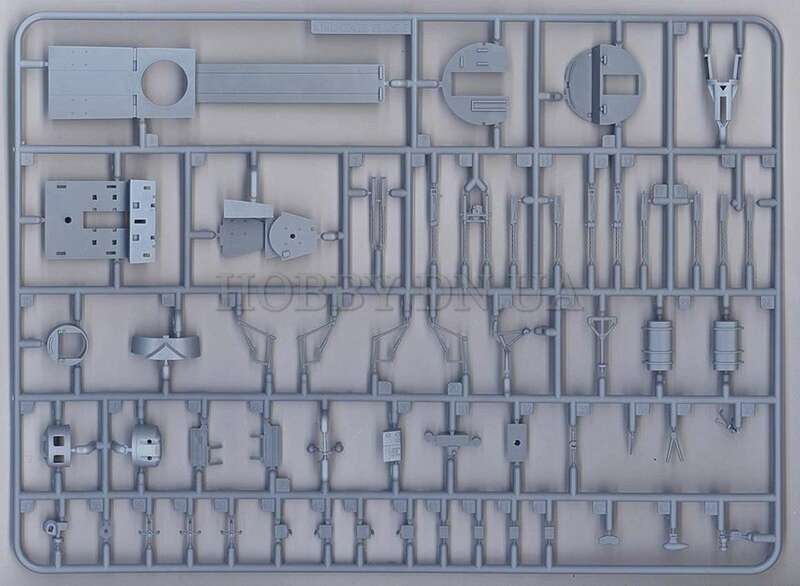 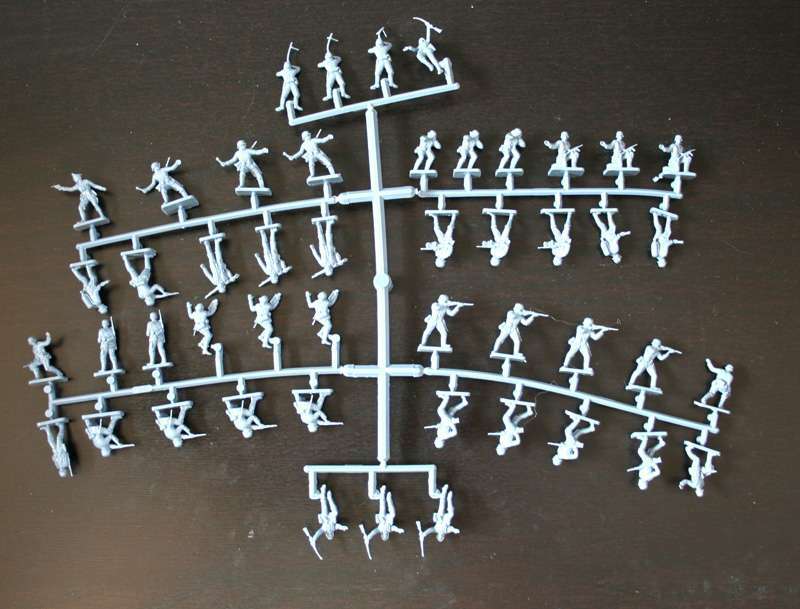 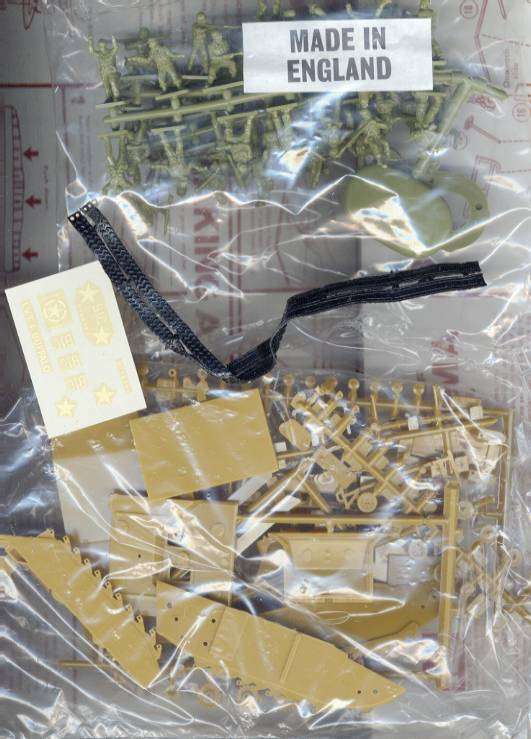 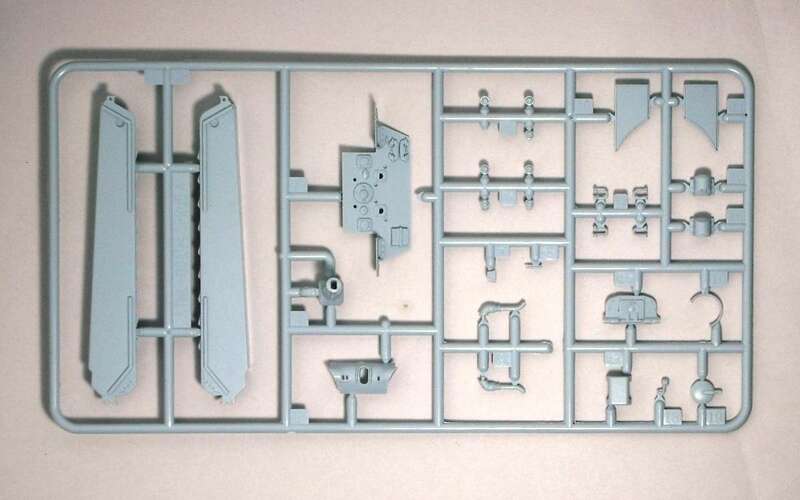 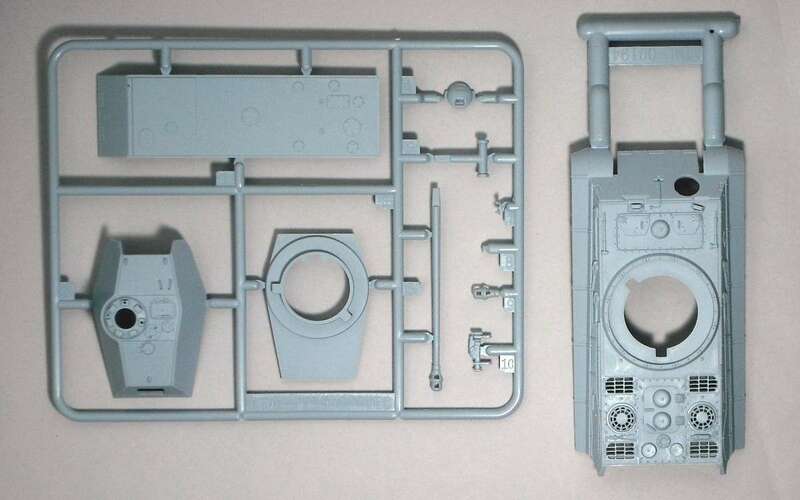 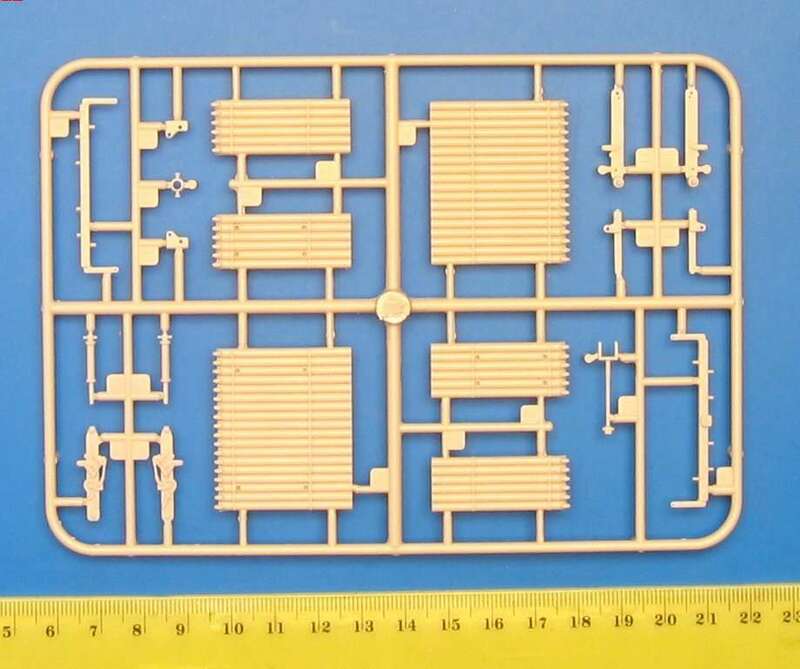 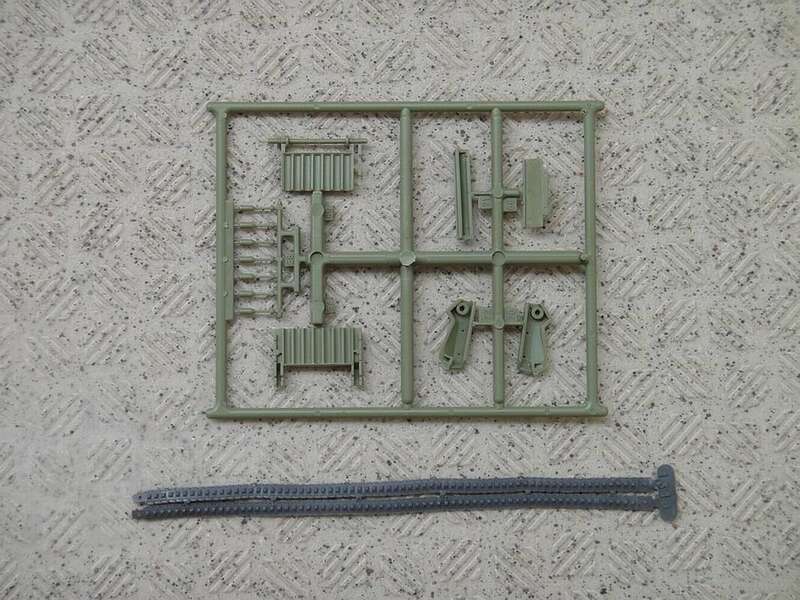 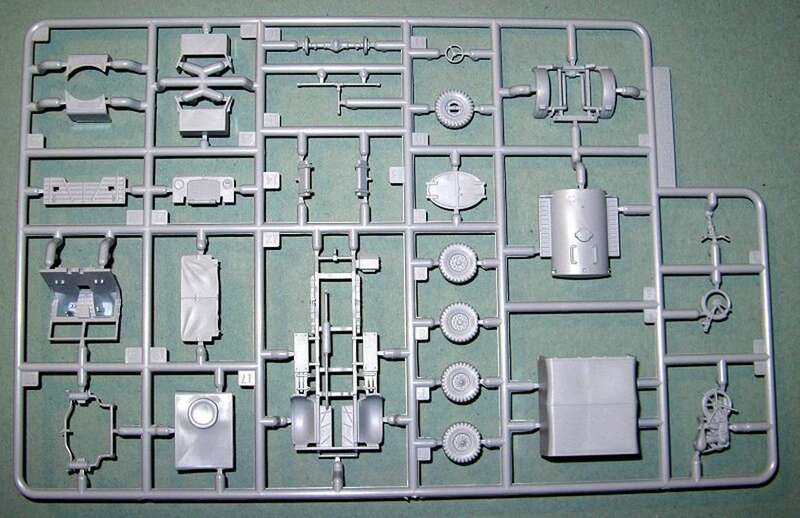 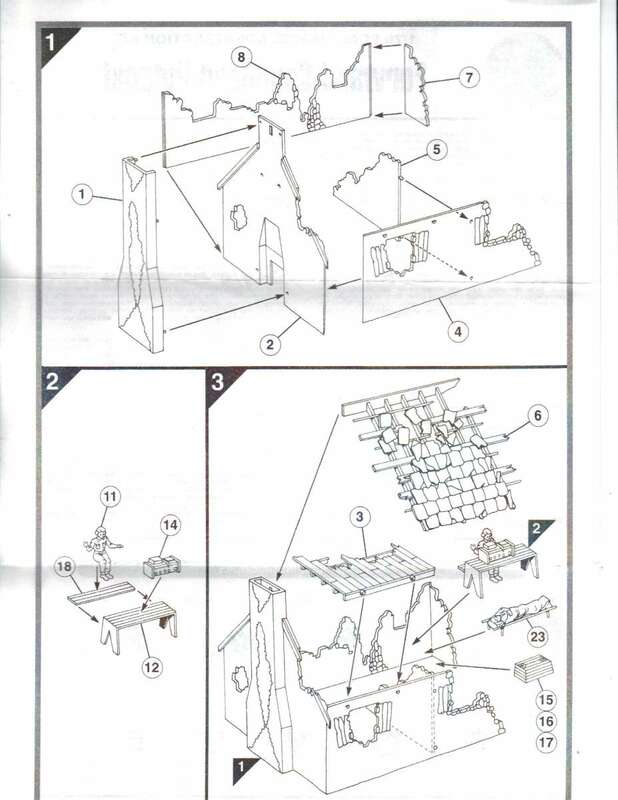 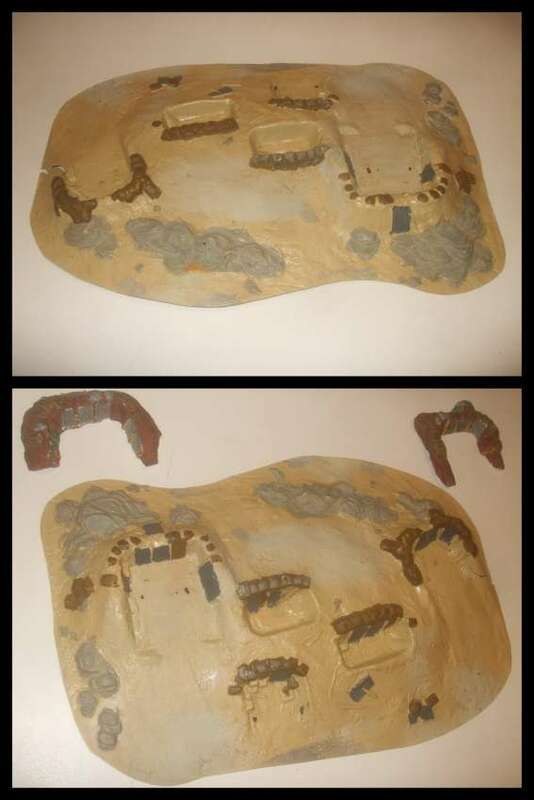 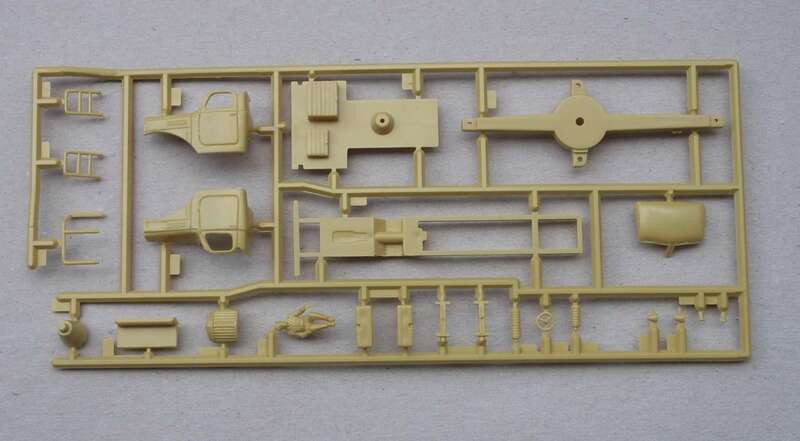 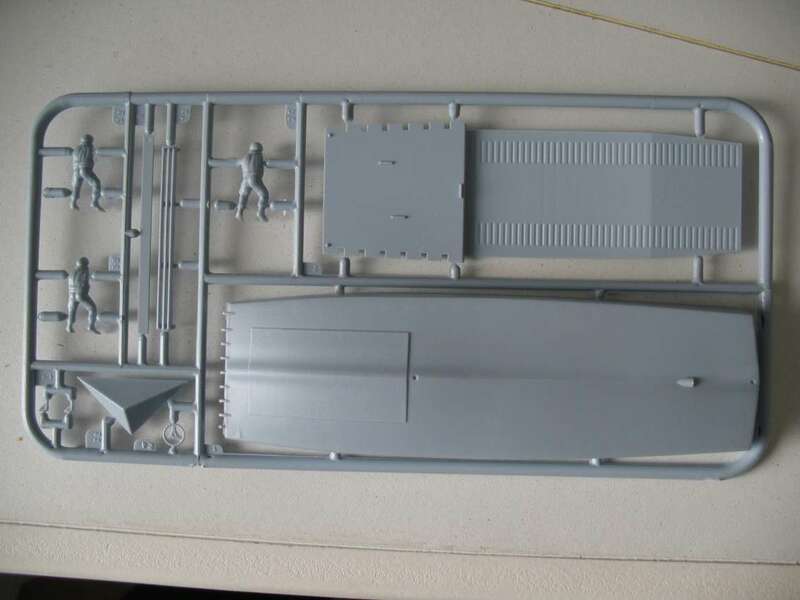 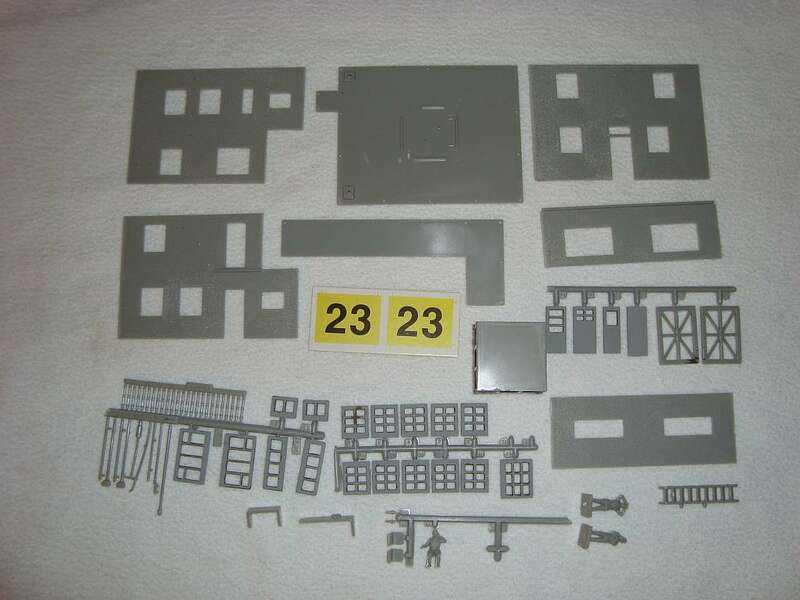 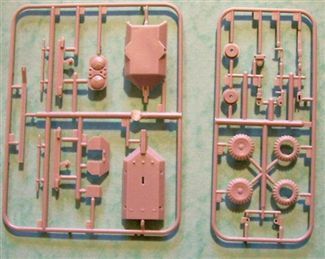 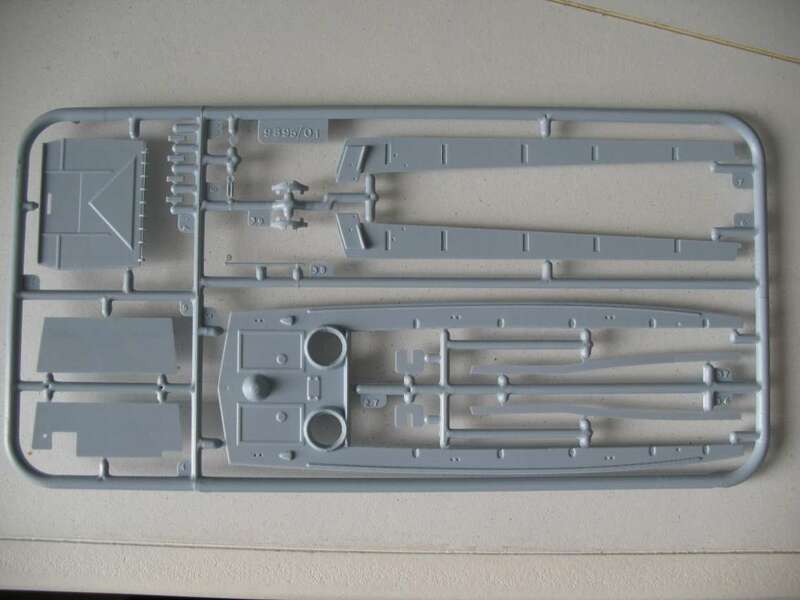 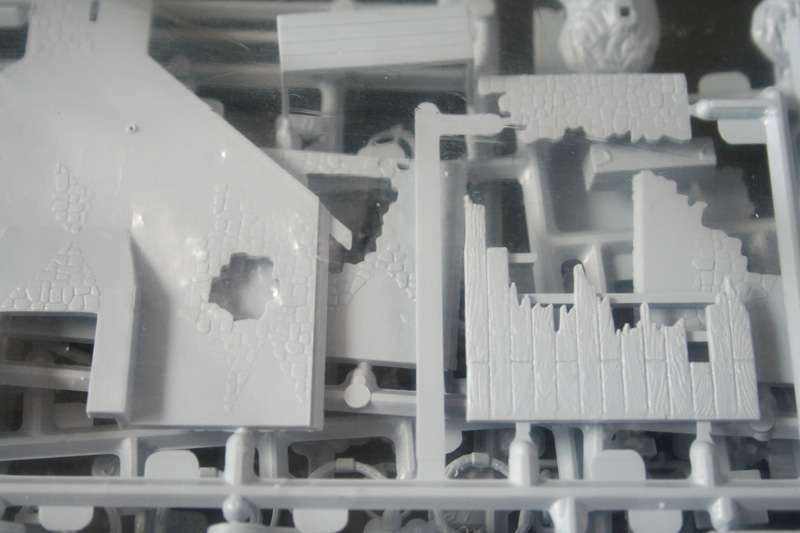 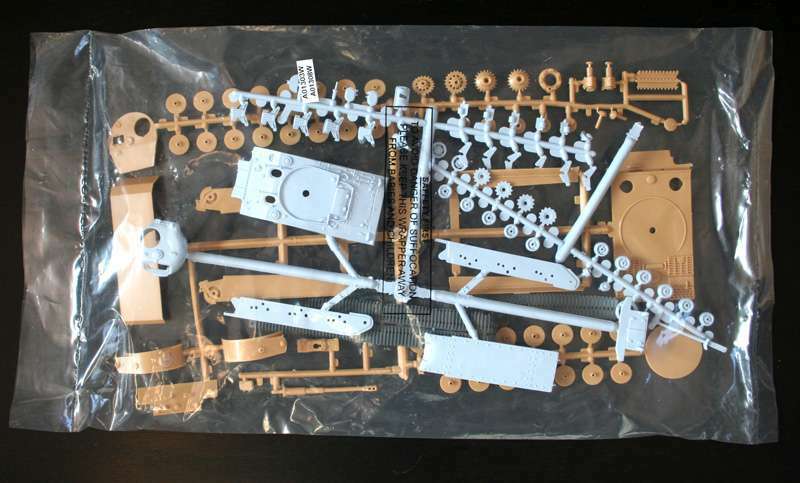 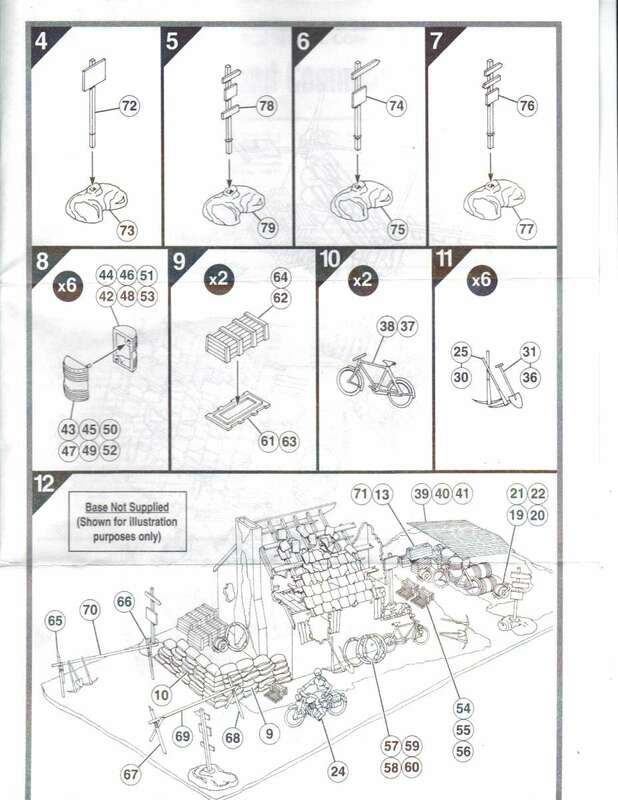 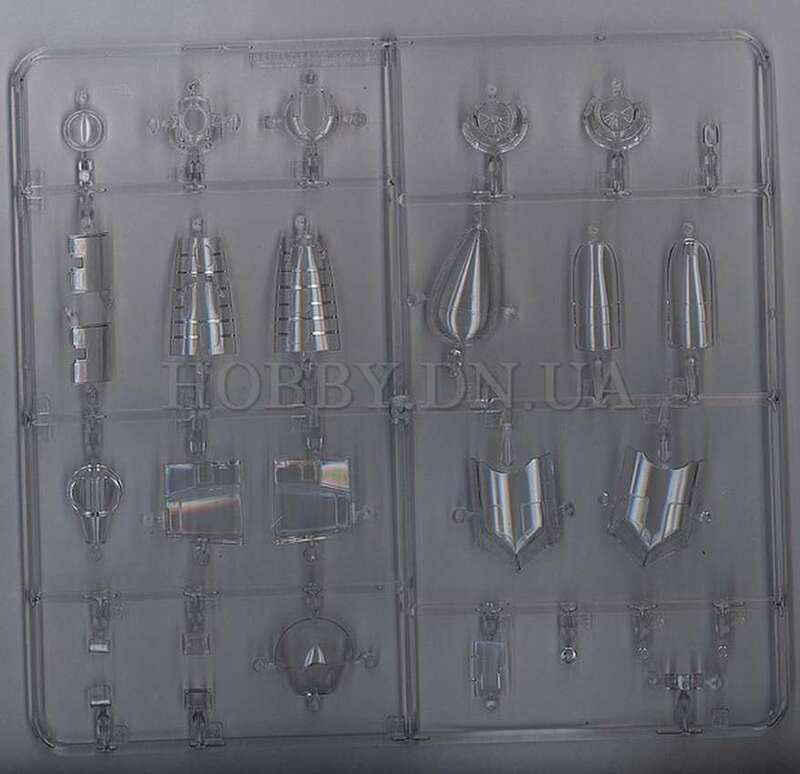 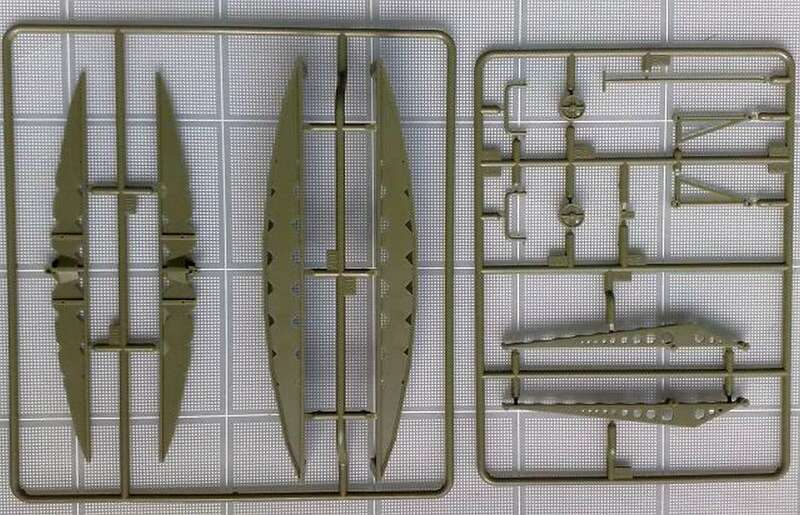 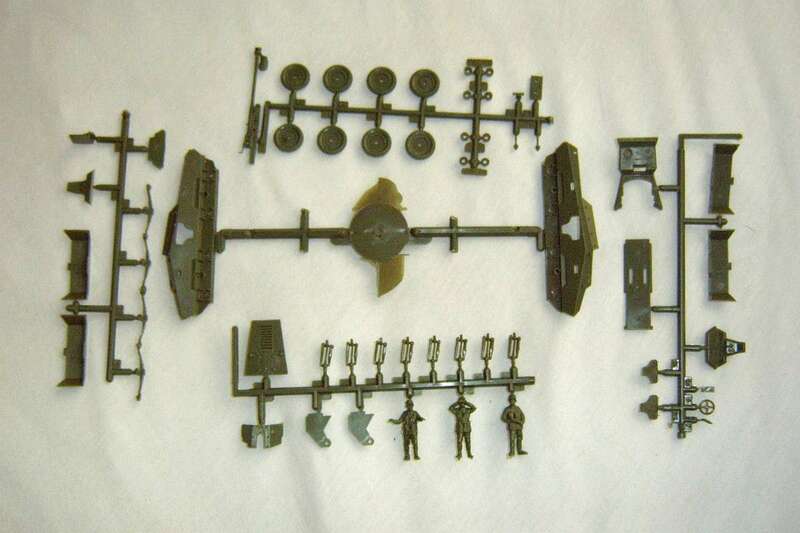 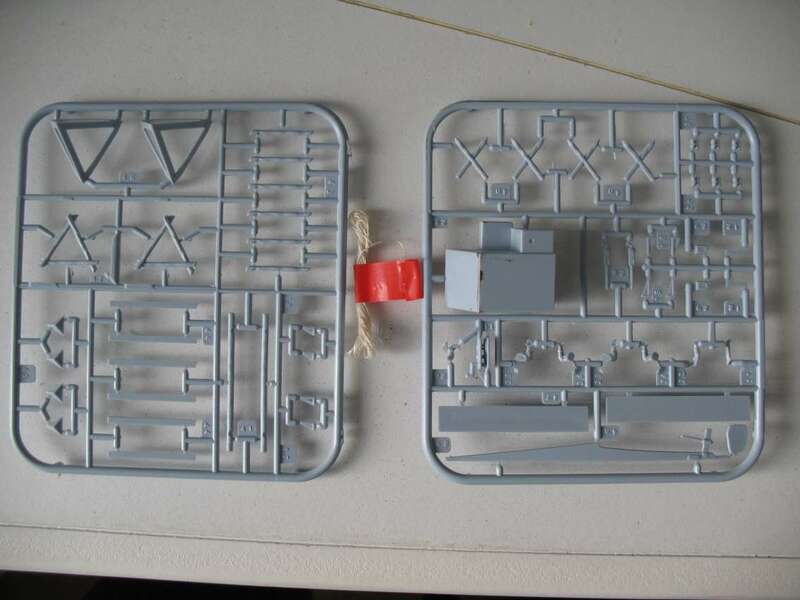 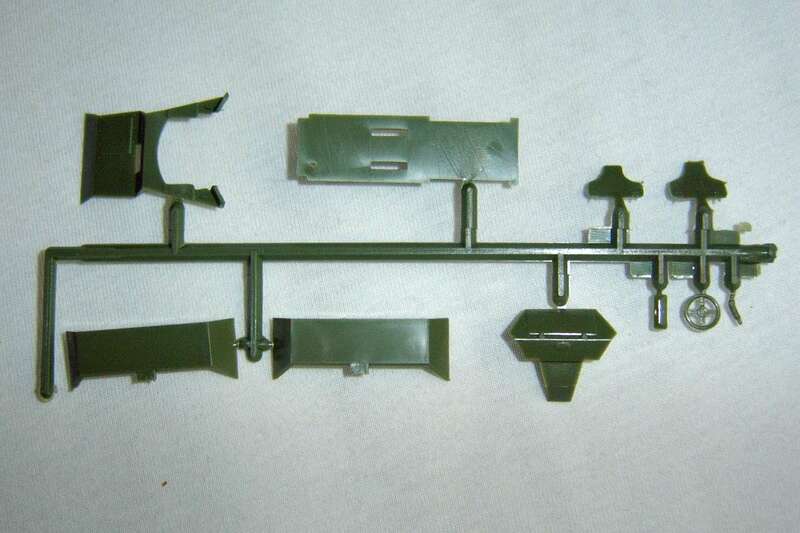 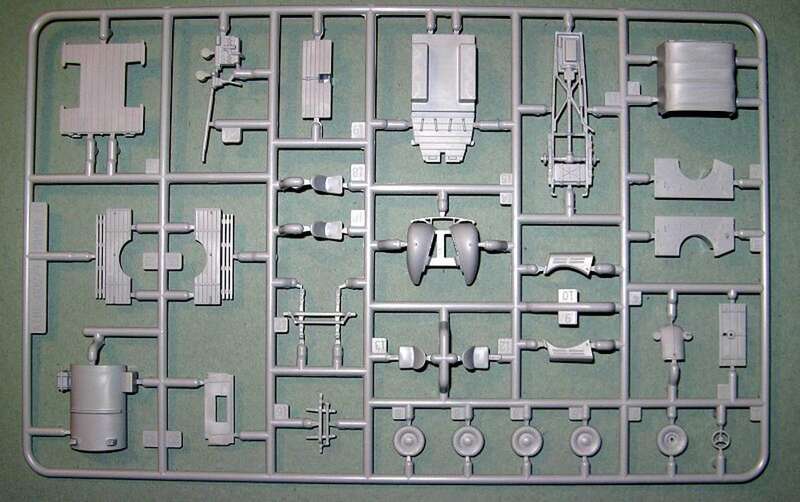 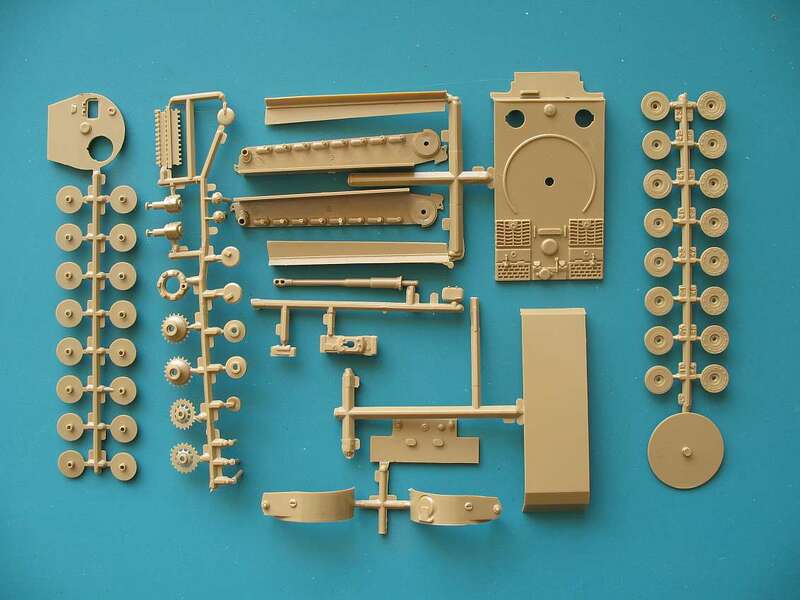 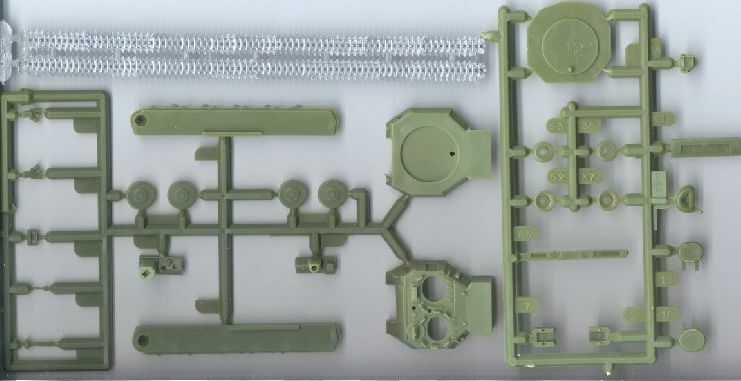 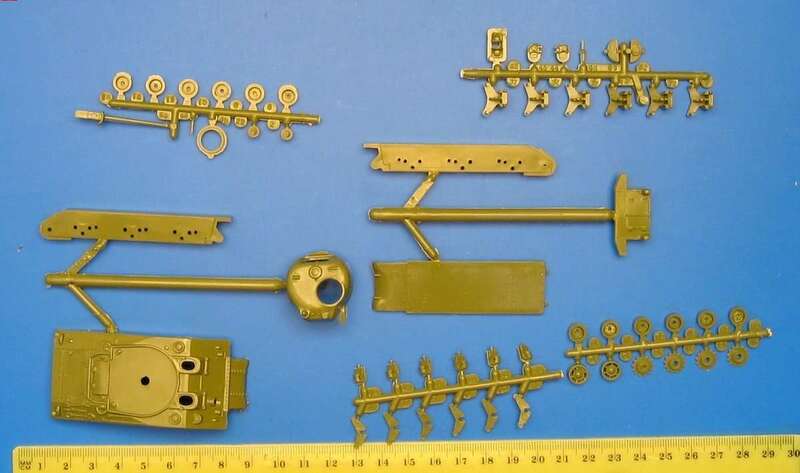 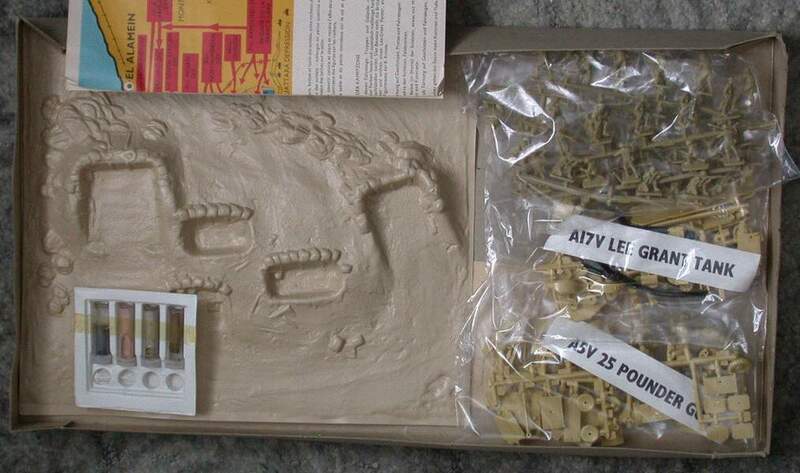 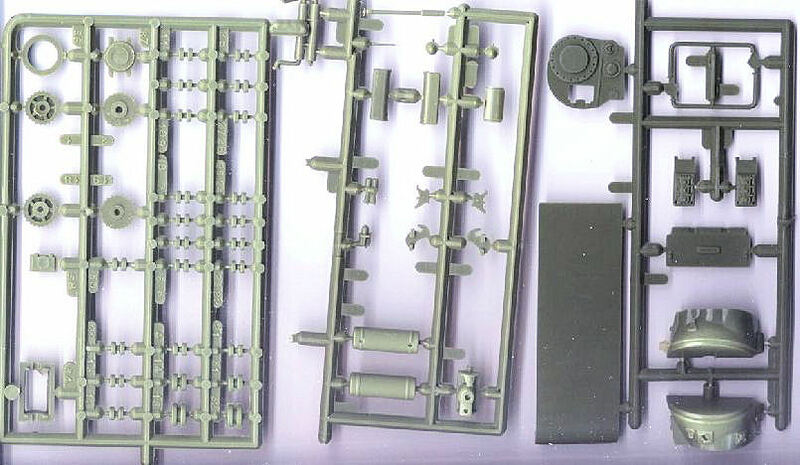 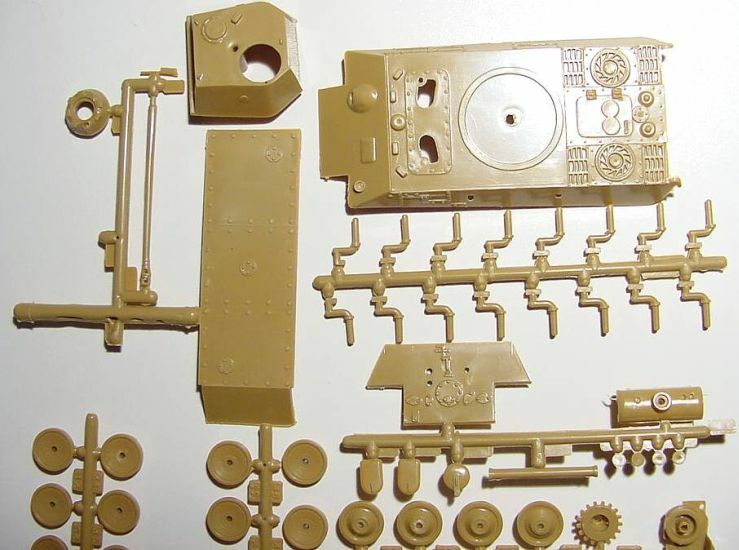 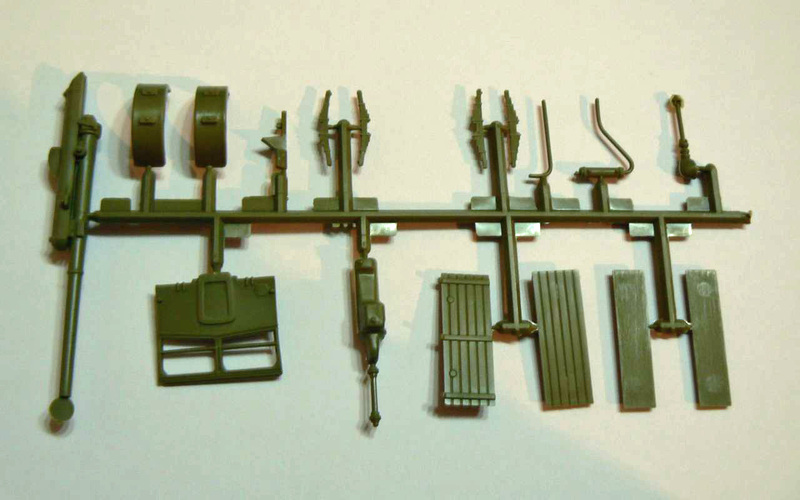 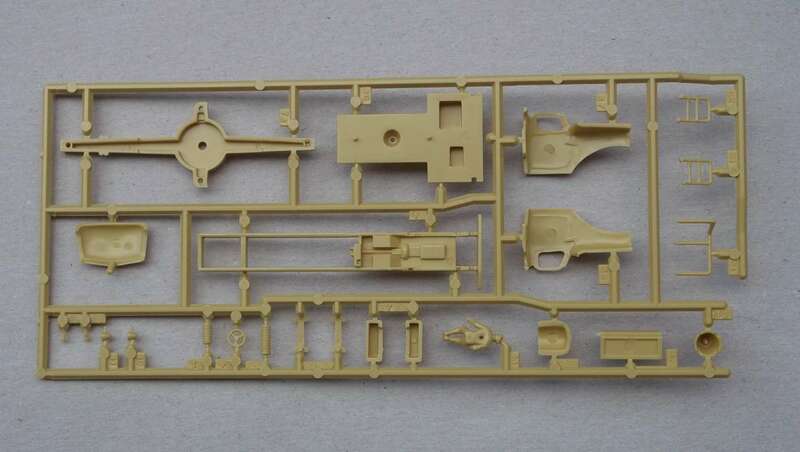 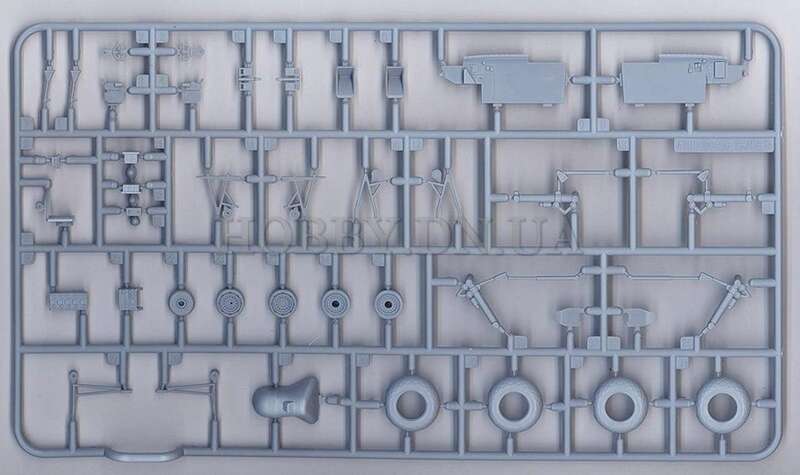 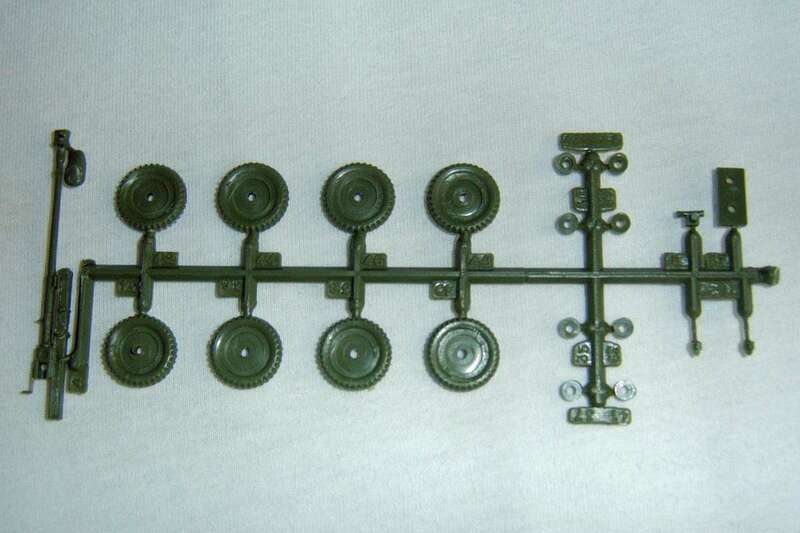 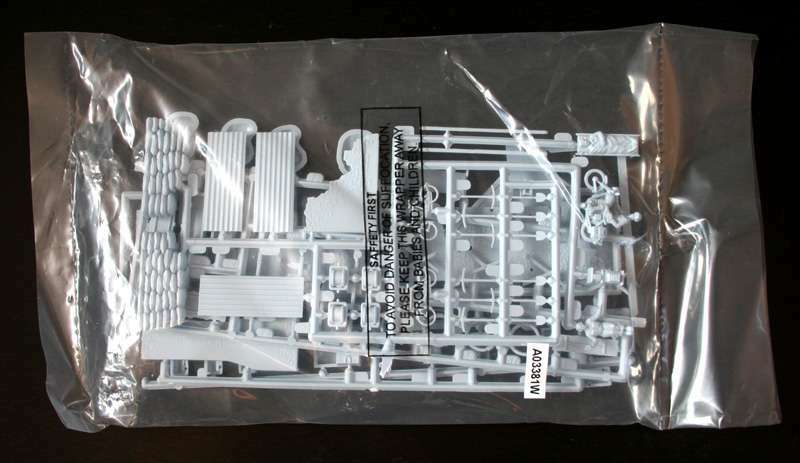 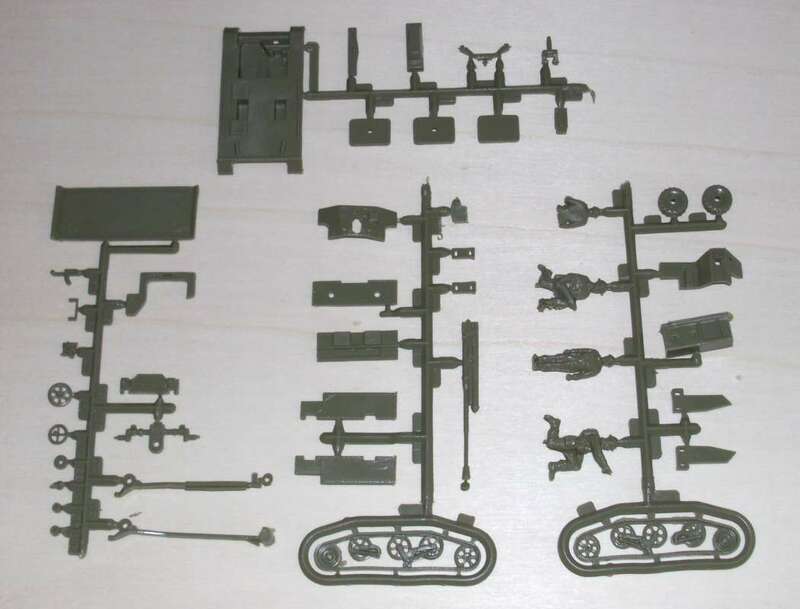 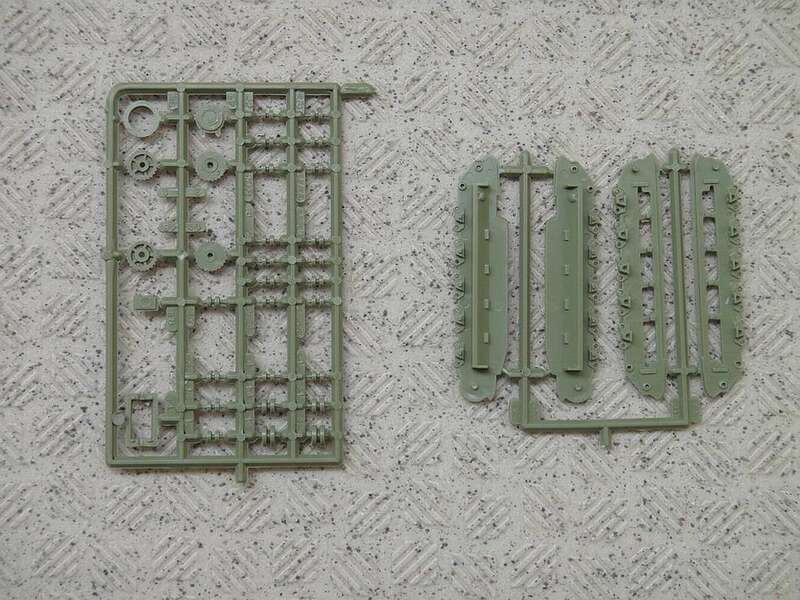 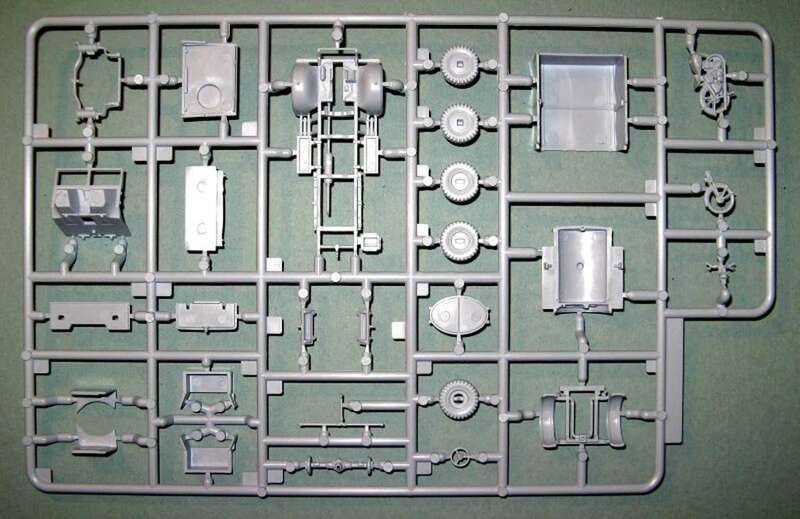 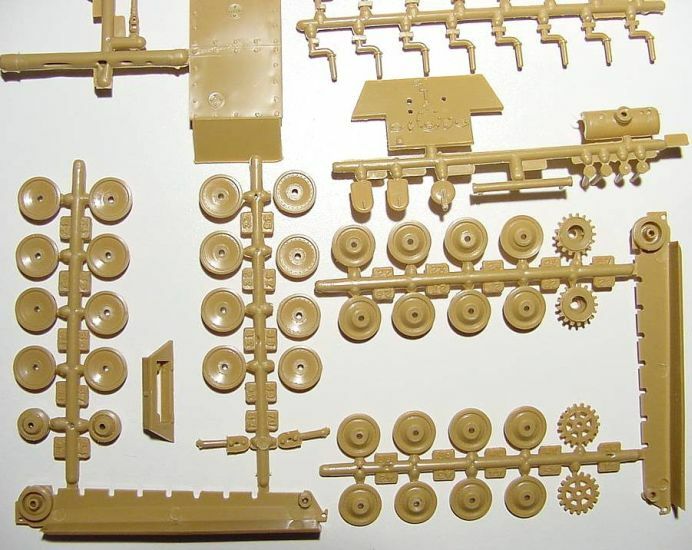 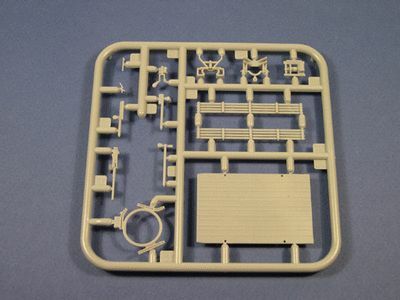 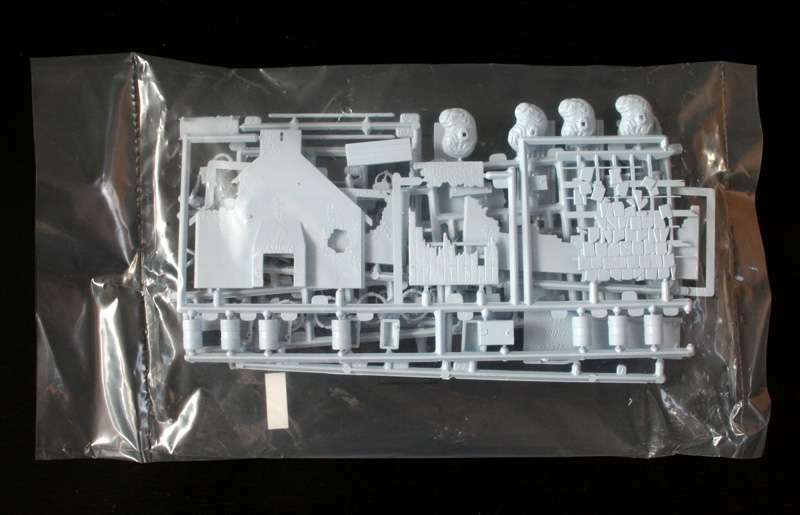 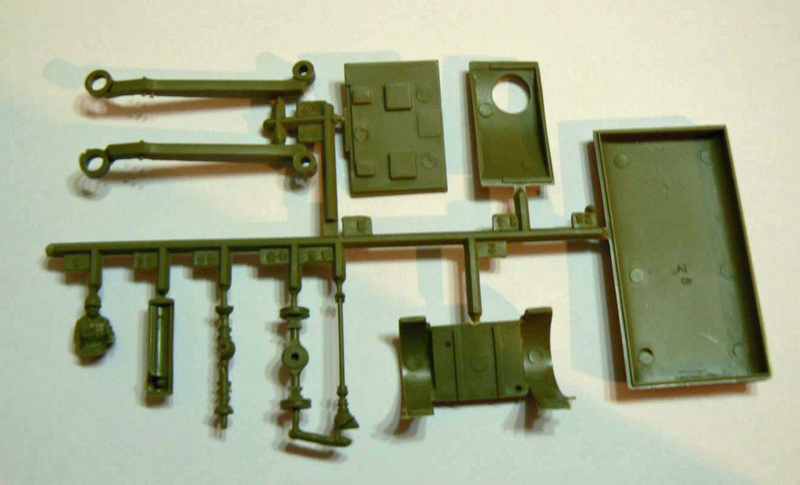 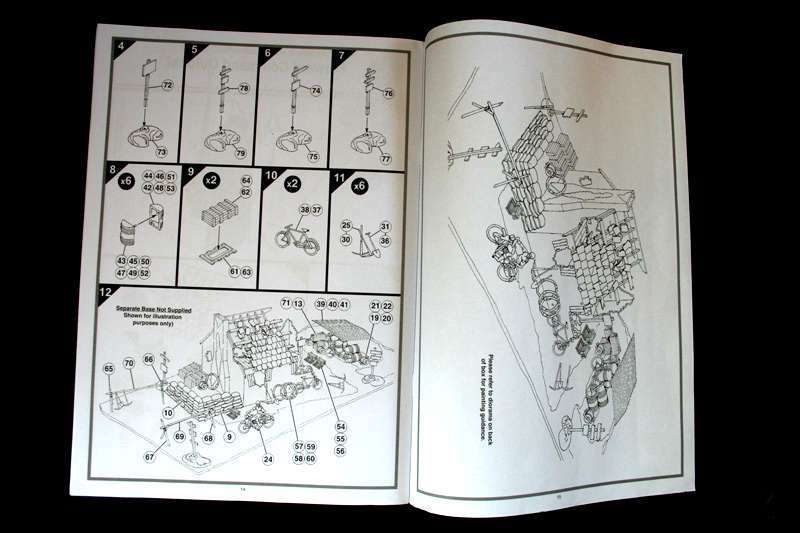 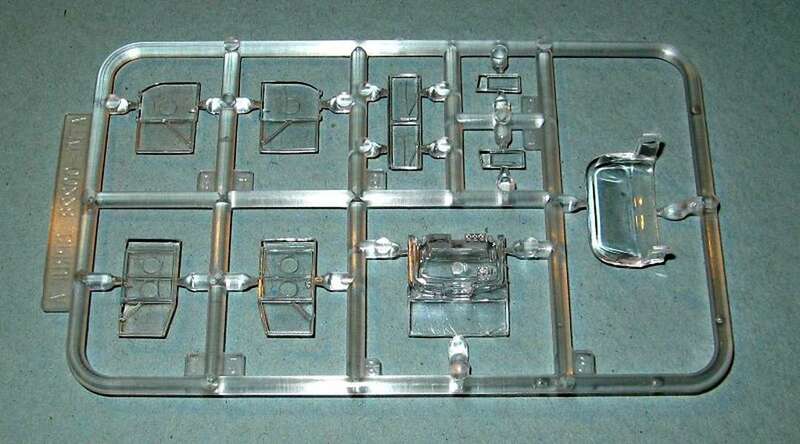 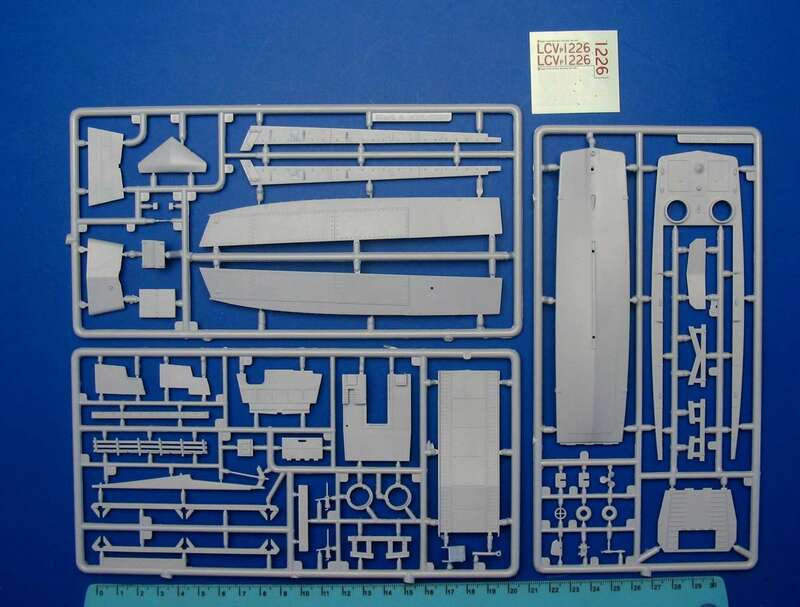 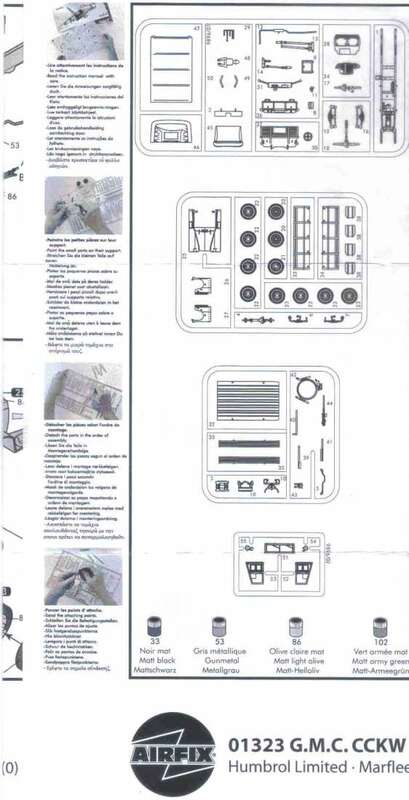 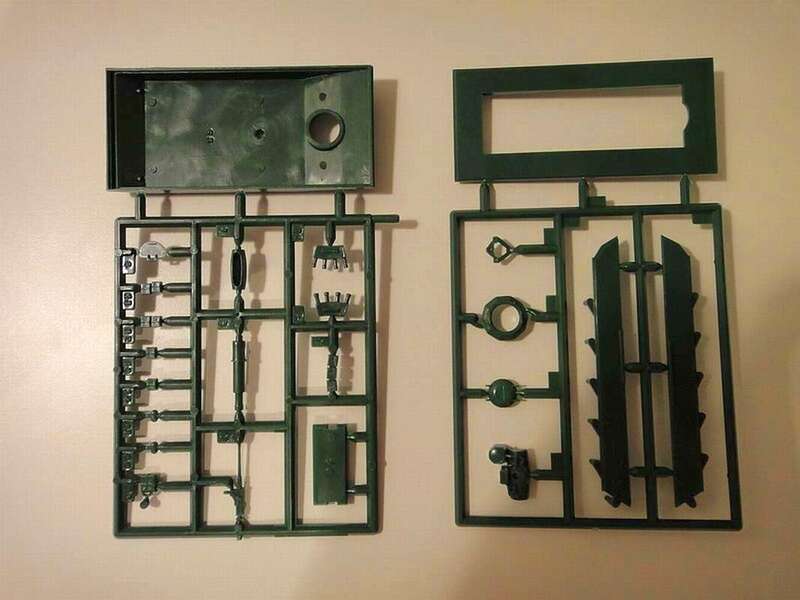 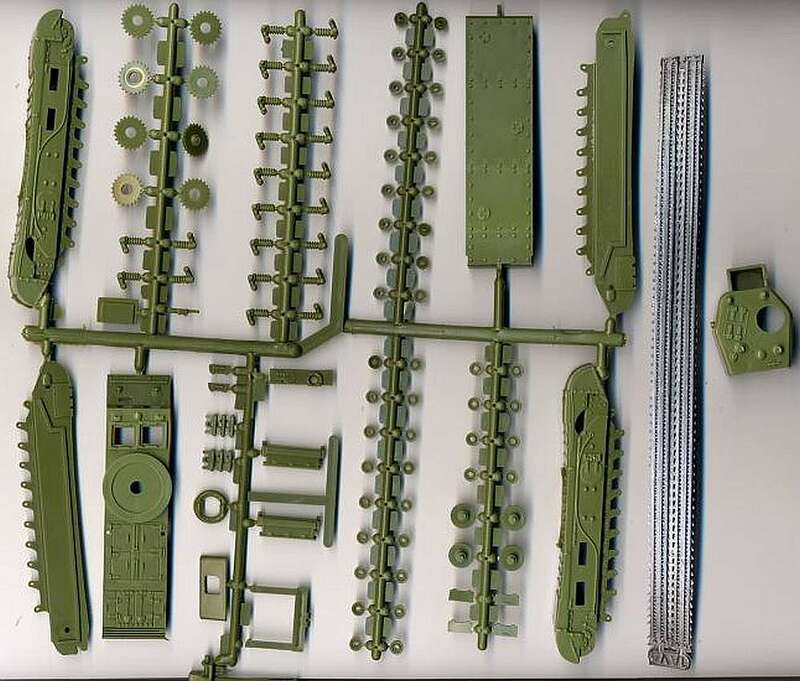 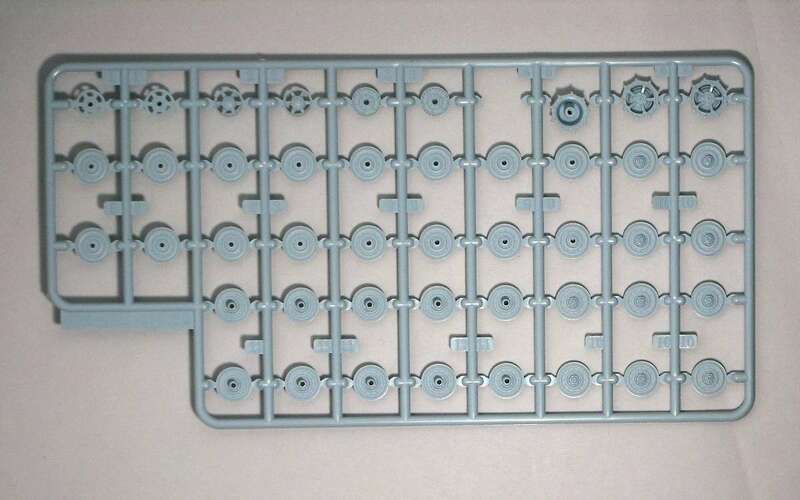 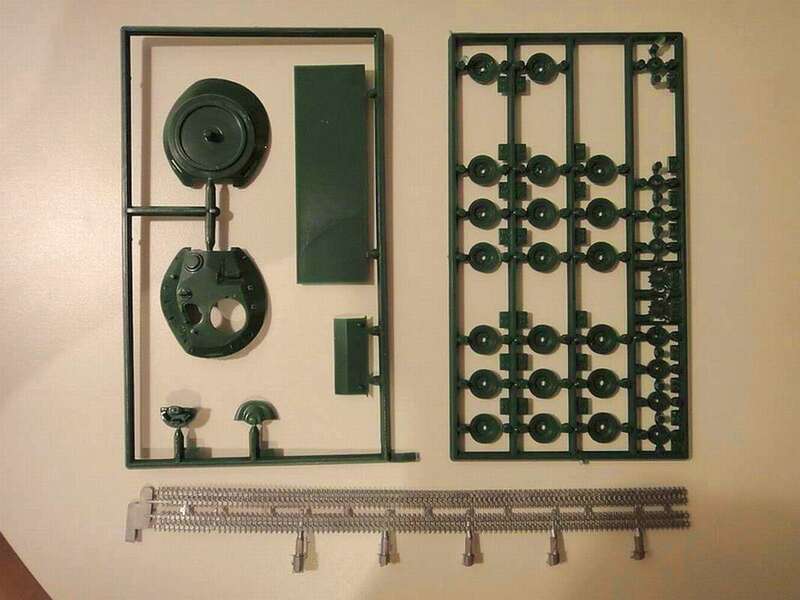 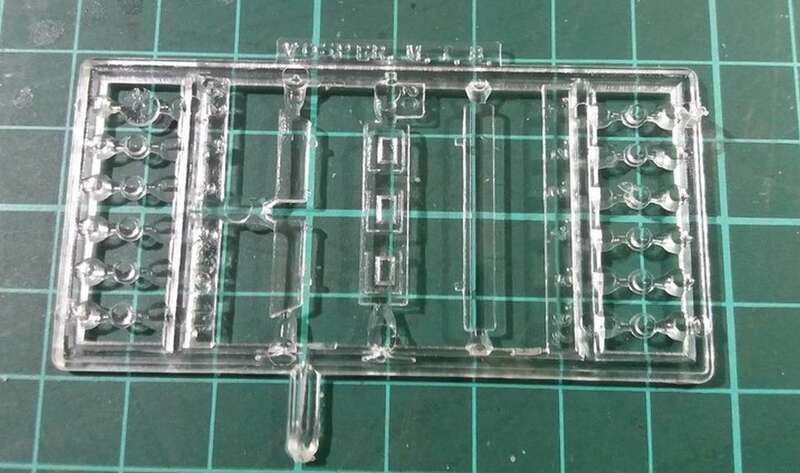 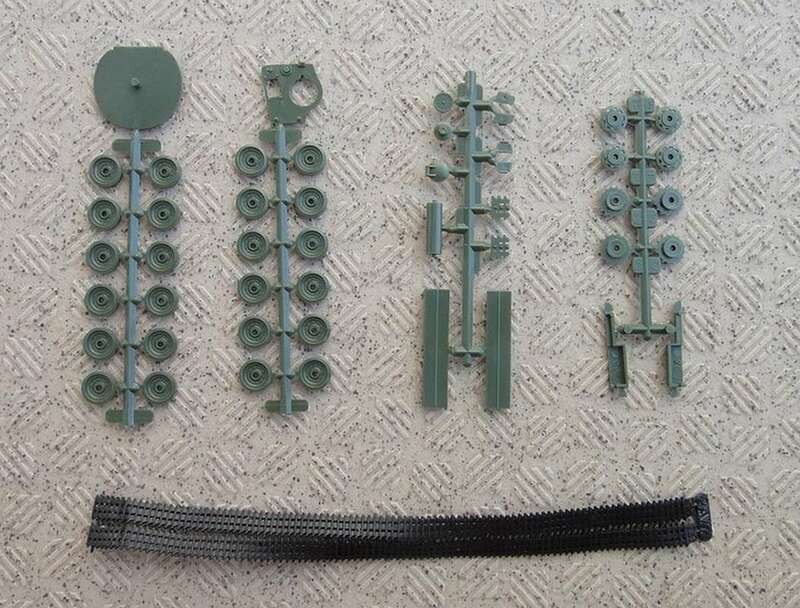 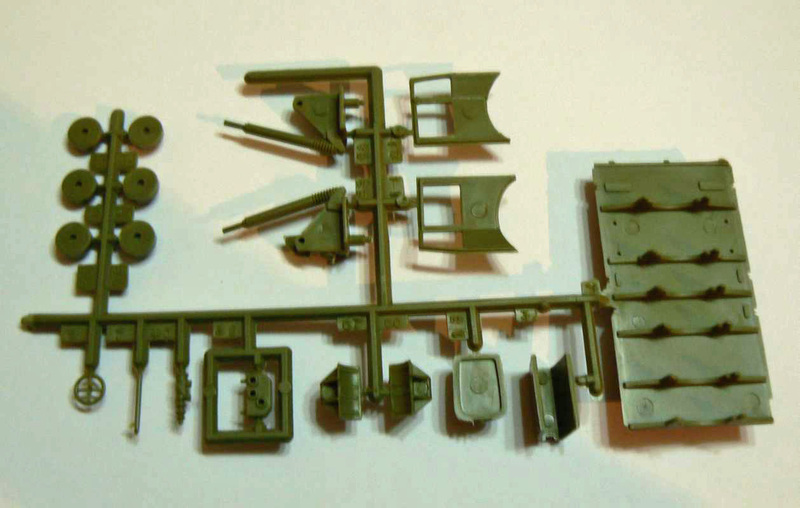 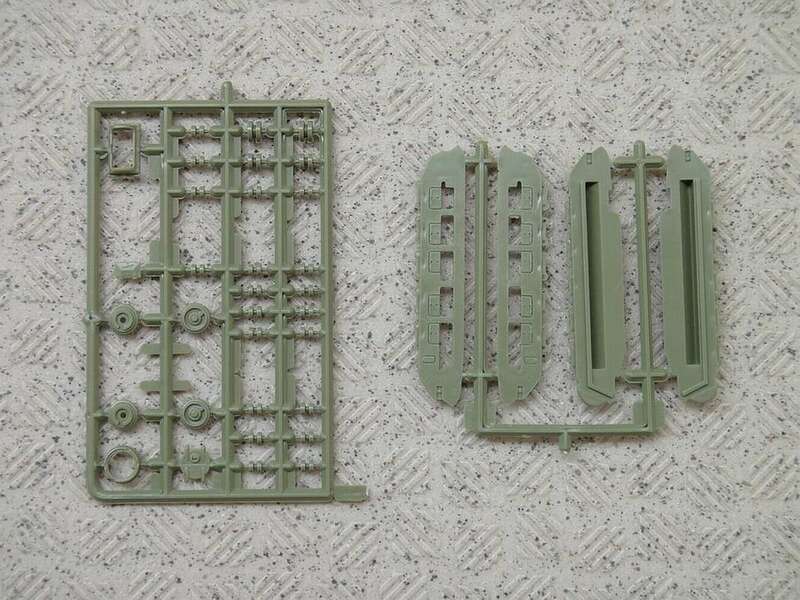 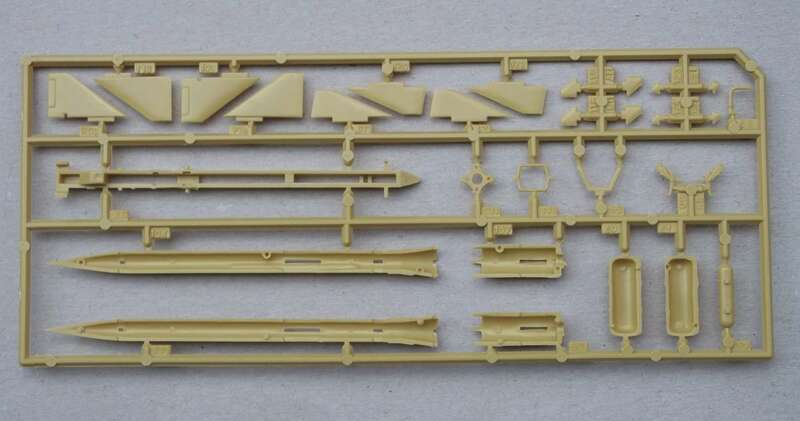 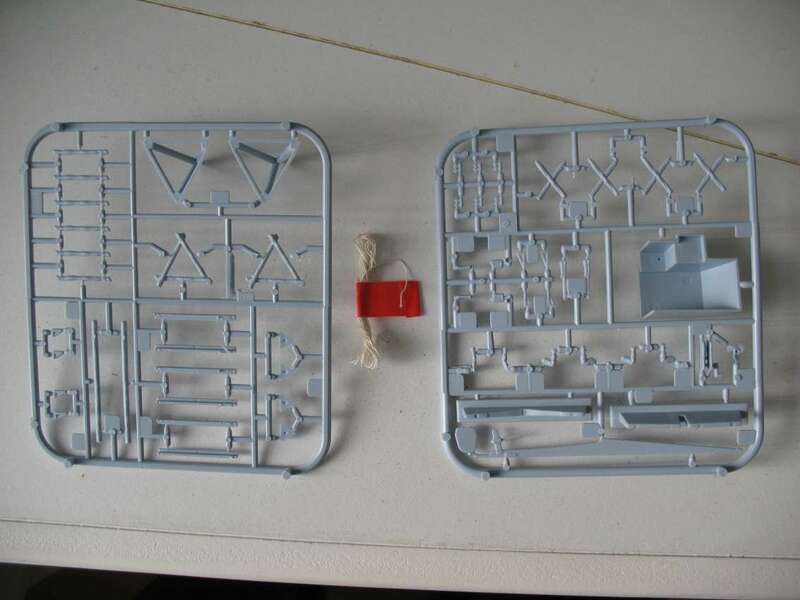 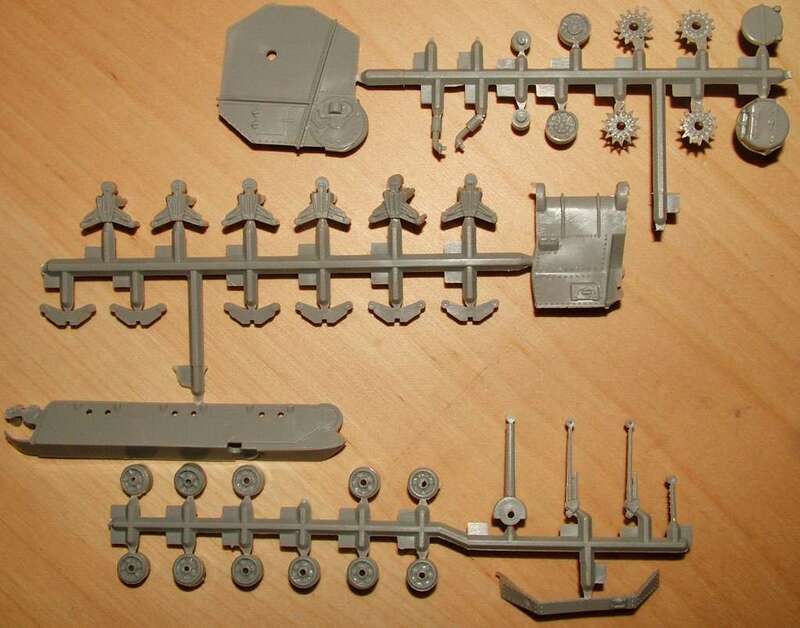 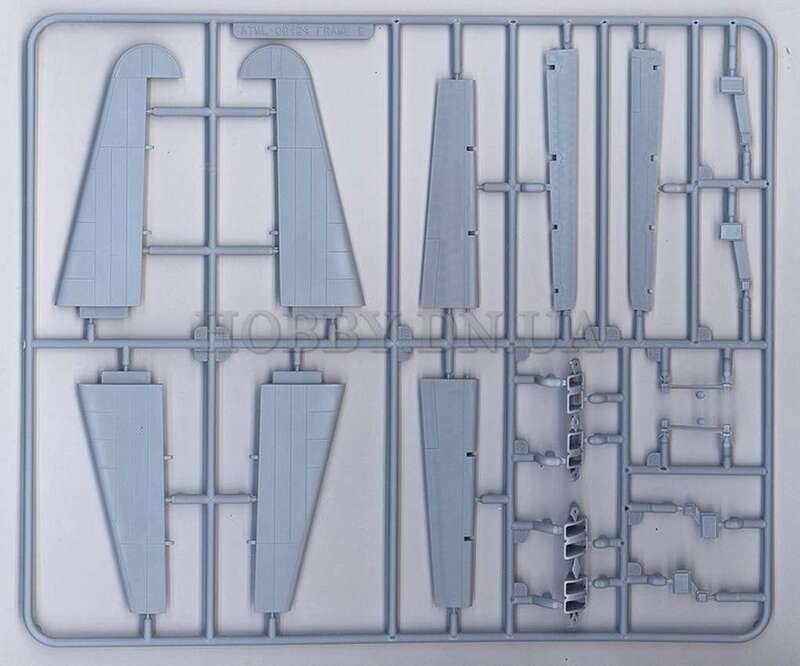 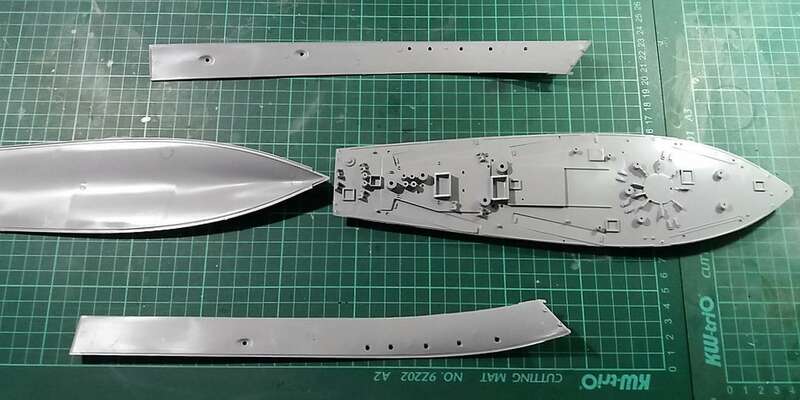 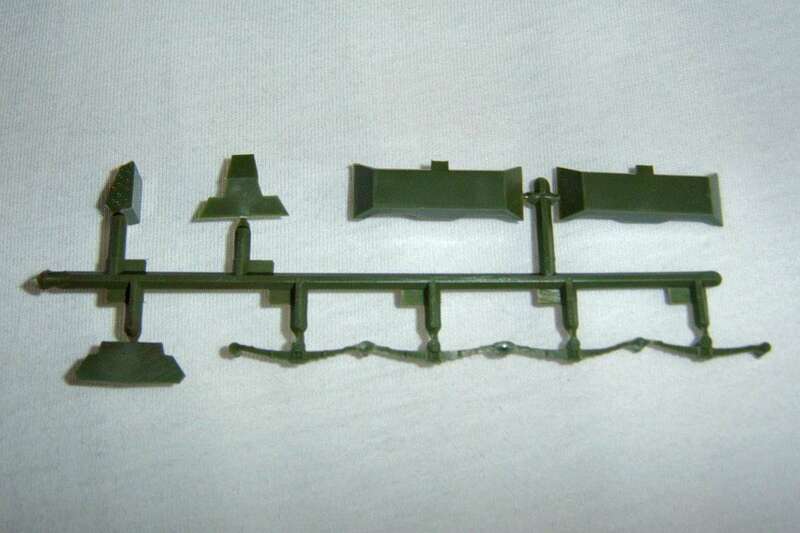 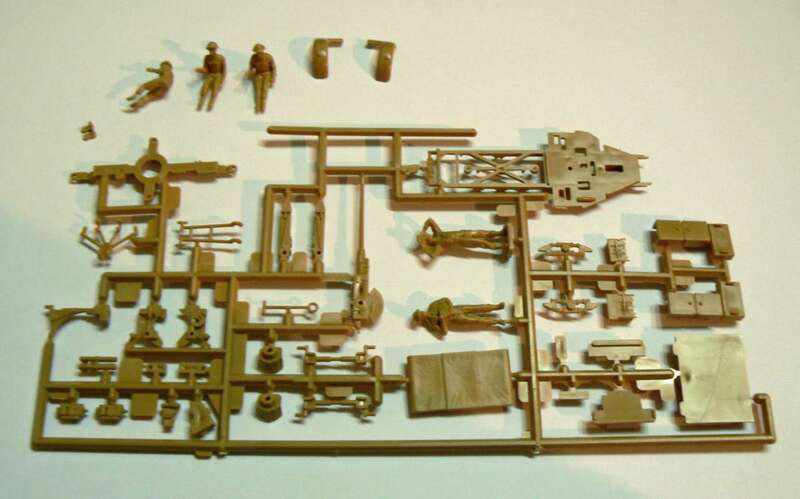 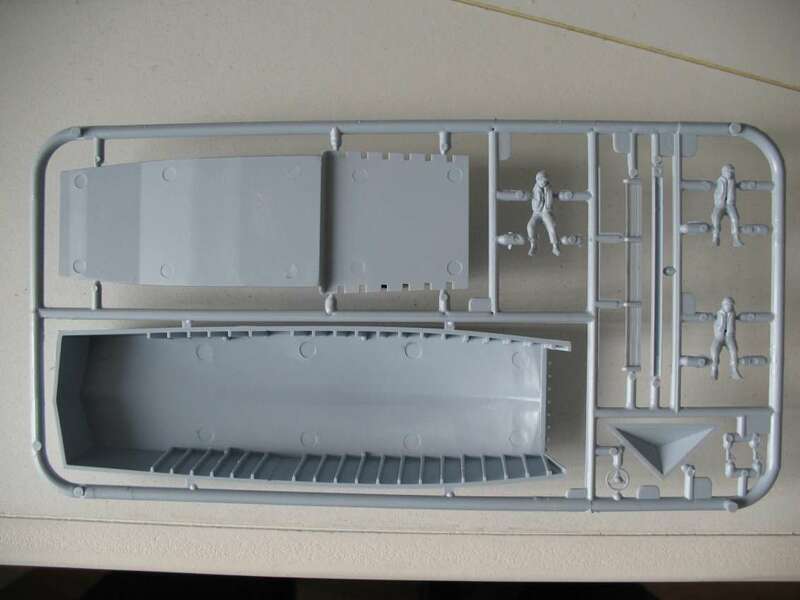 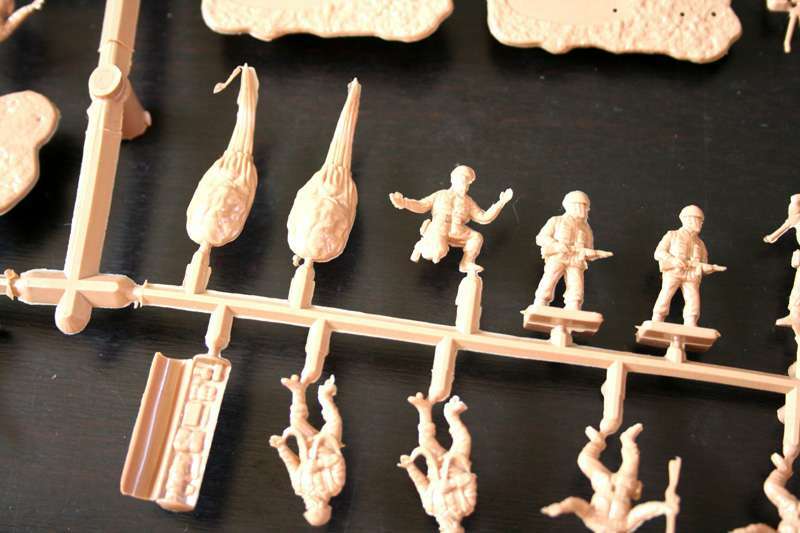 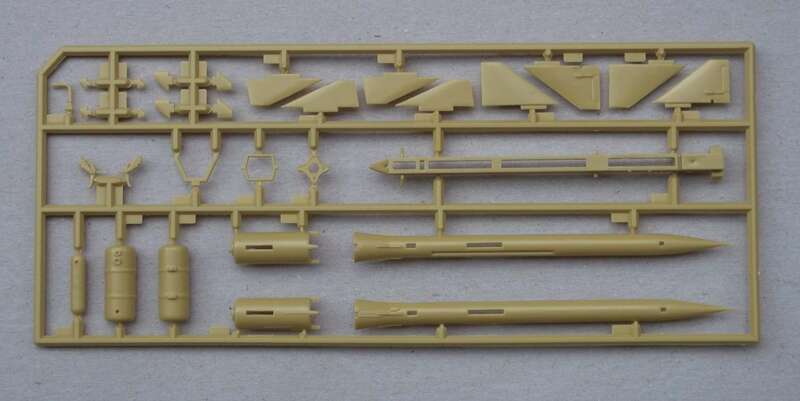 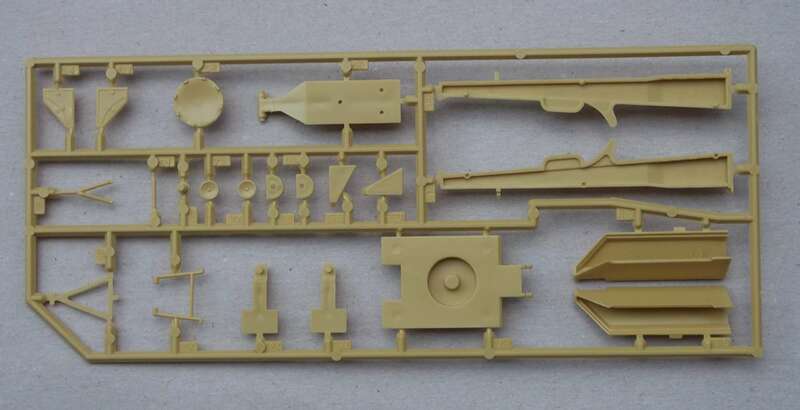 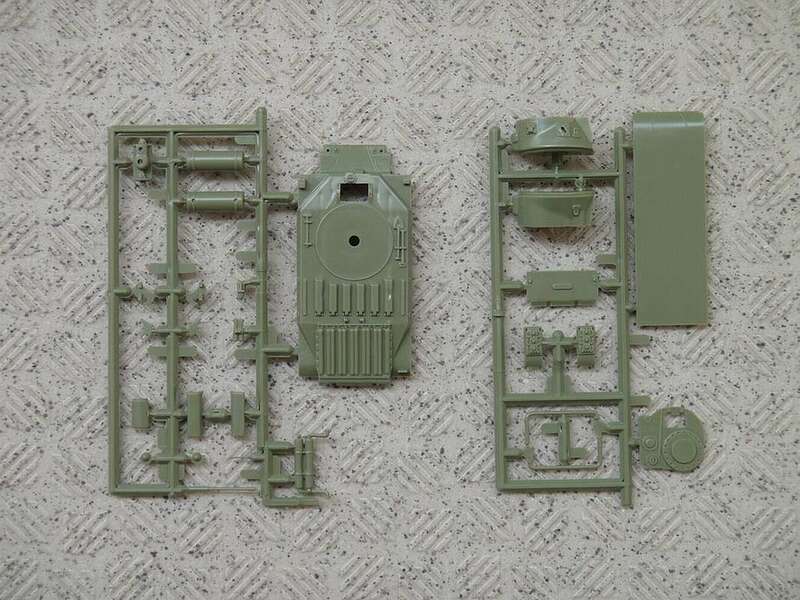 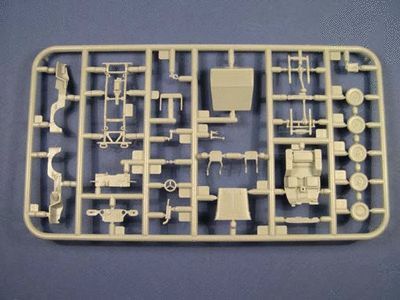 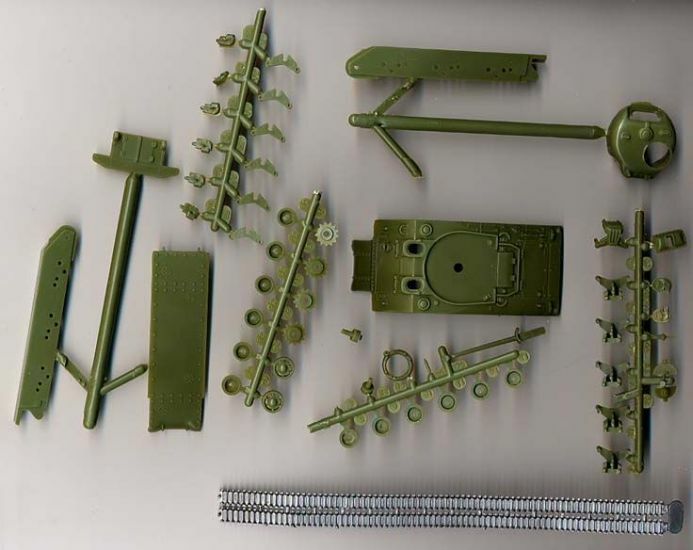 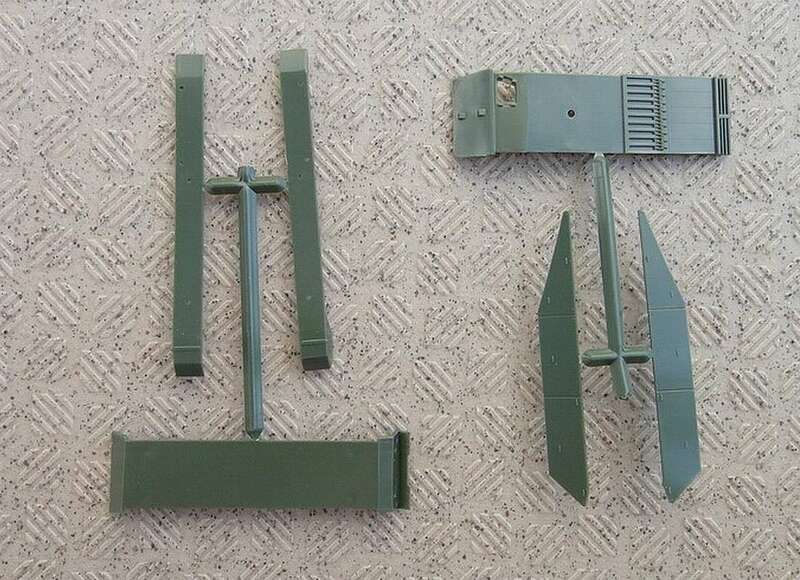 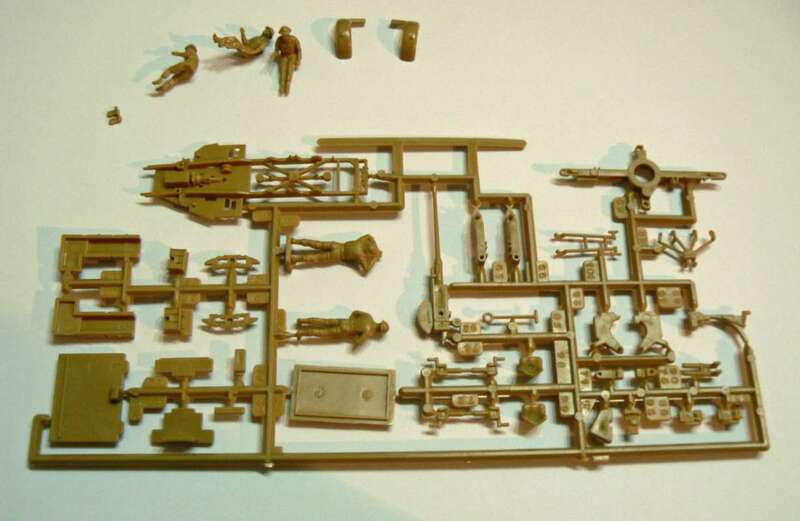 Sprue parts and pictures of finished model were sent to me, but who is the owner? 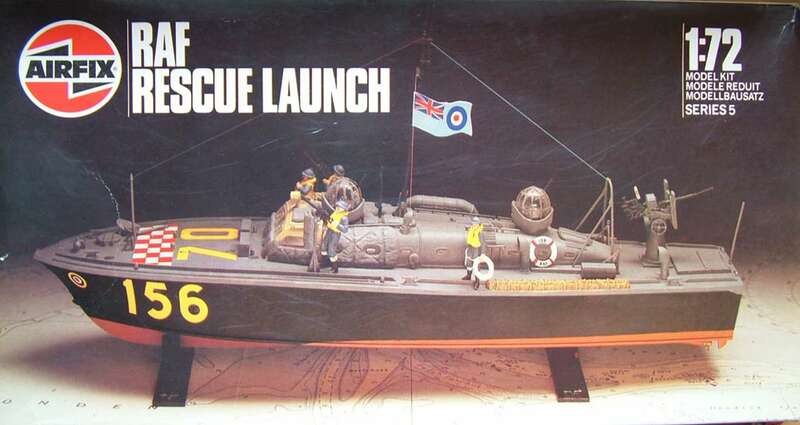 Model built by Mike Johnson. 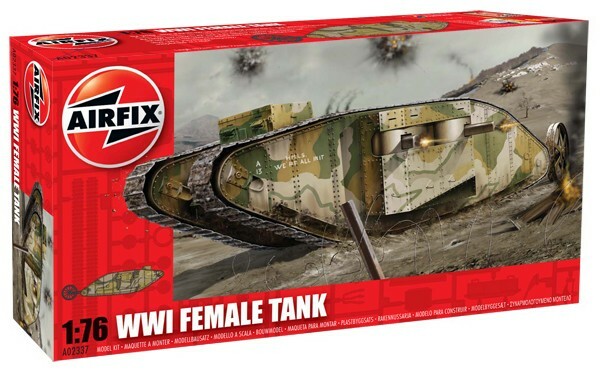 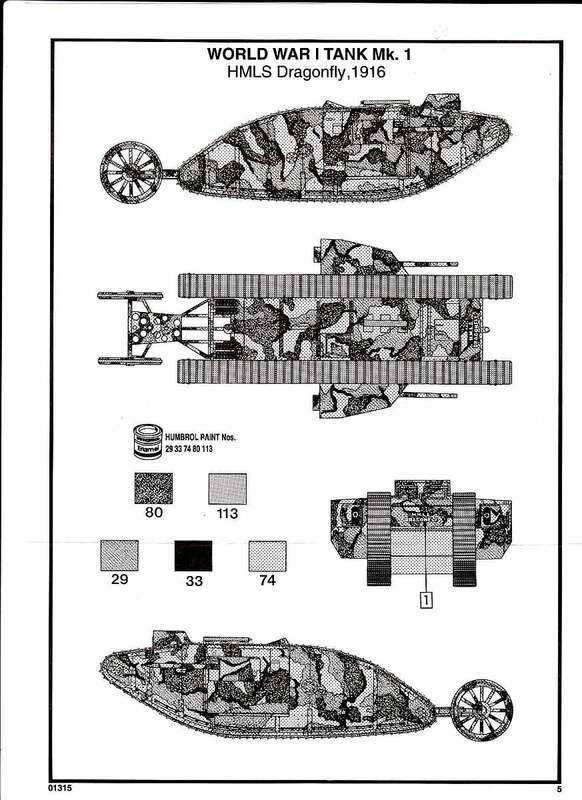 Kit 2337 - WW-I female tank. 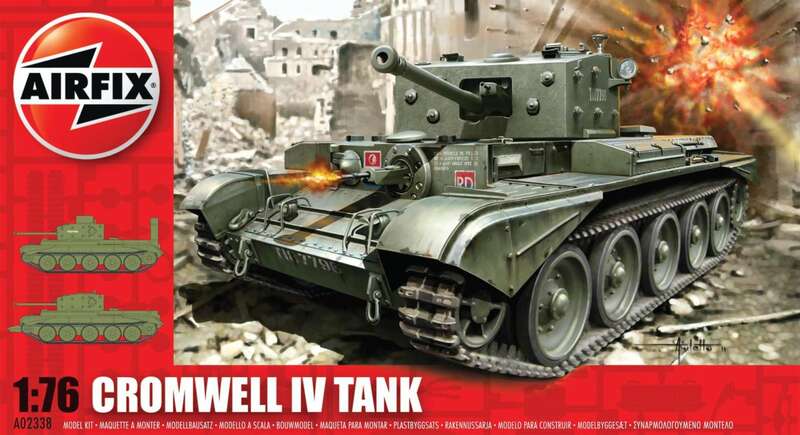 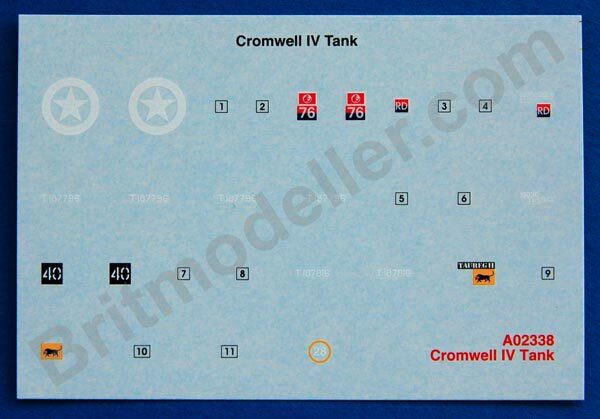 Kit 2338 - Cromwell cruiser tank. 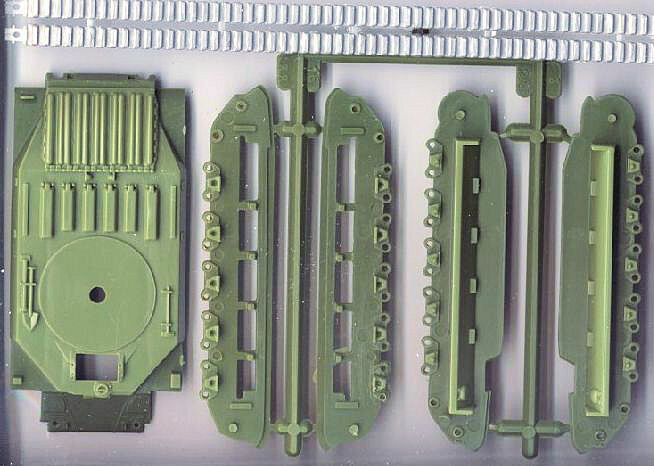 'Scale Plastic & Rail' website. 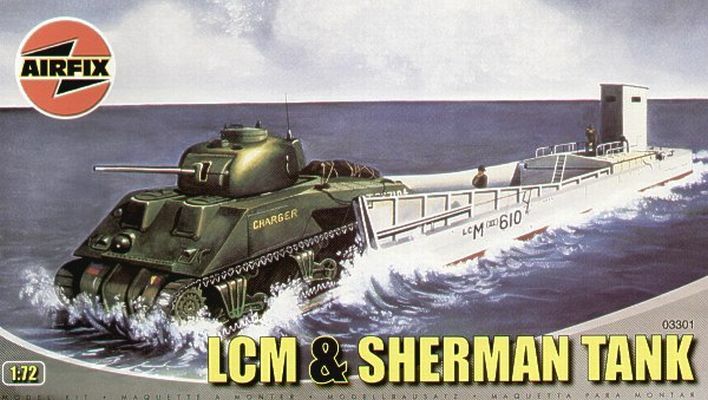 Kit 3301 LCM III with Sherman. 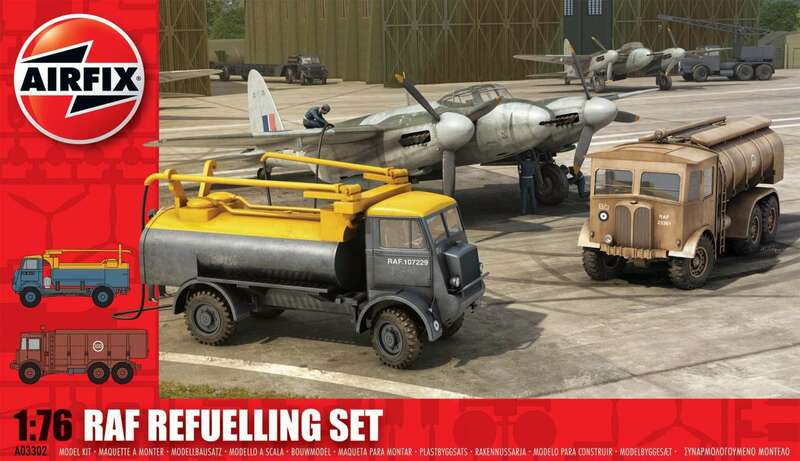 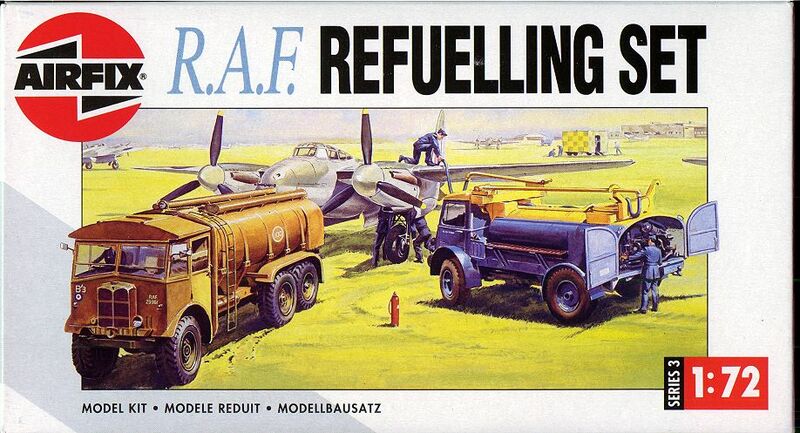 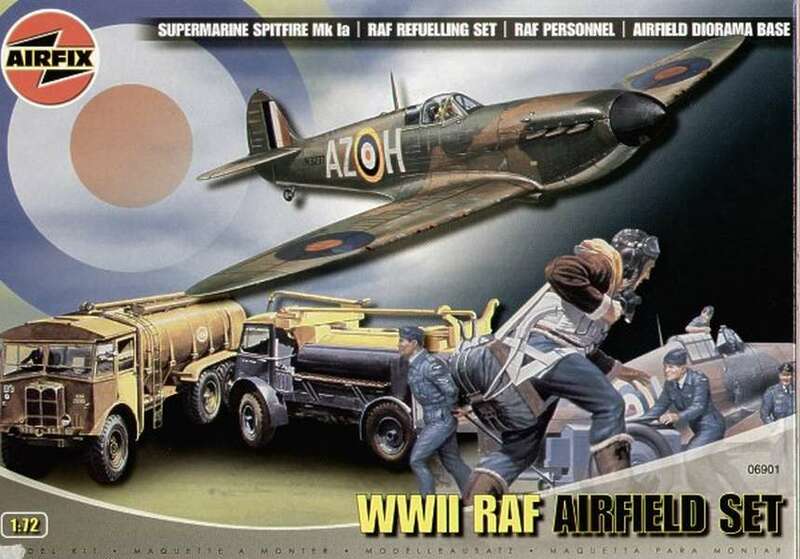 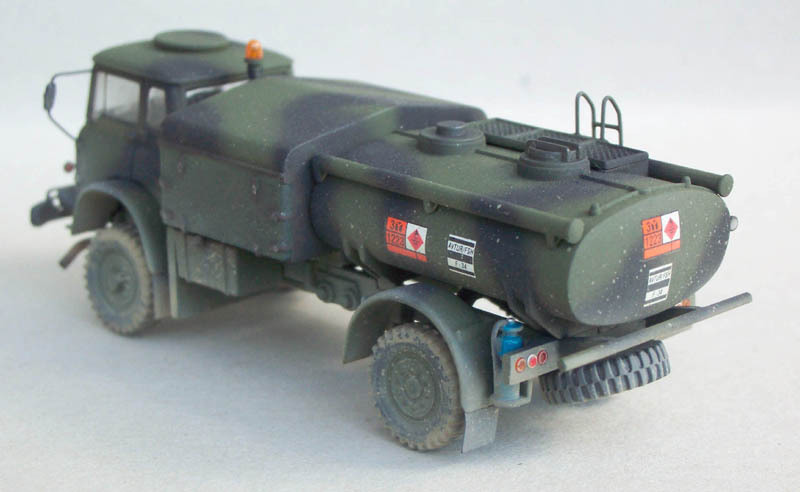 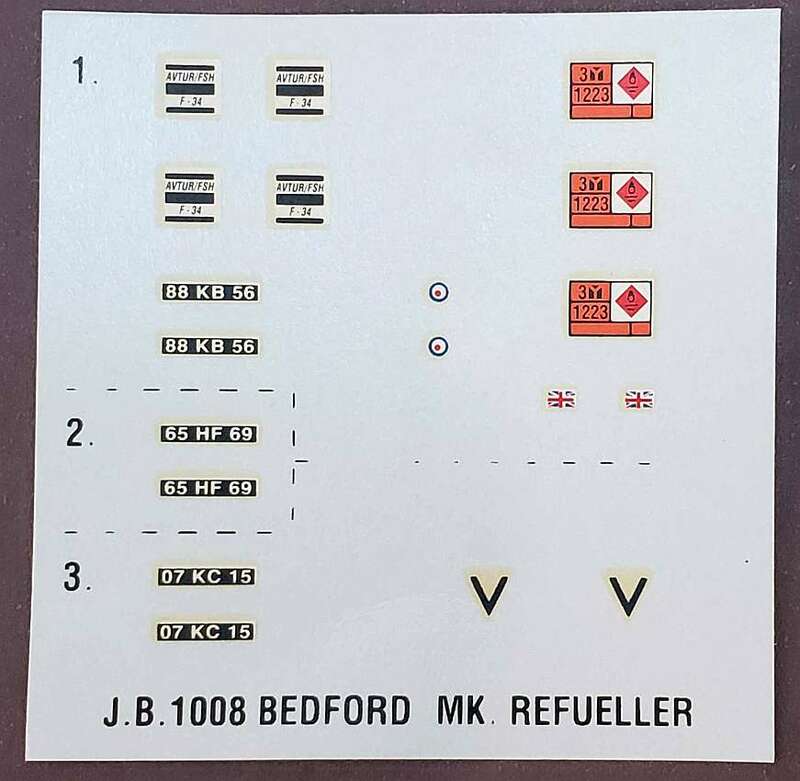 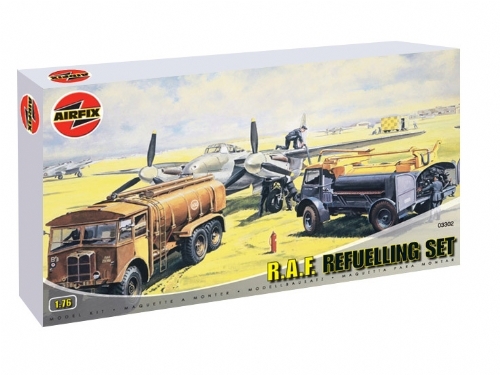 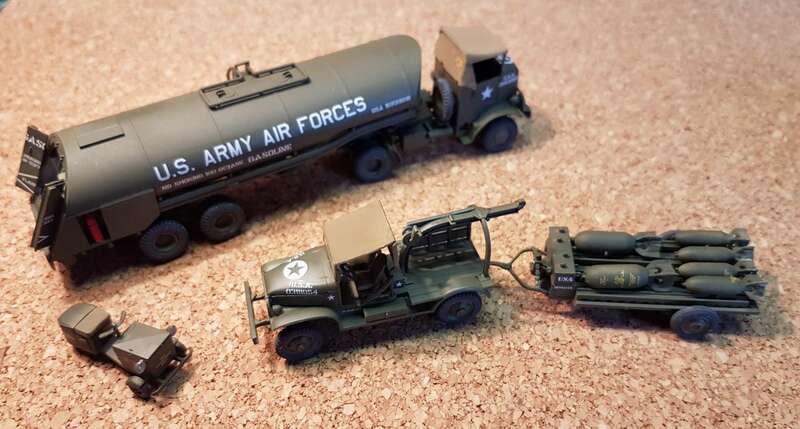 Kit 3302 RAF refuelling set. 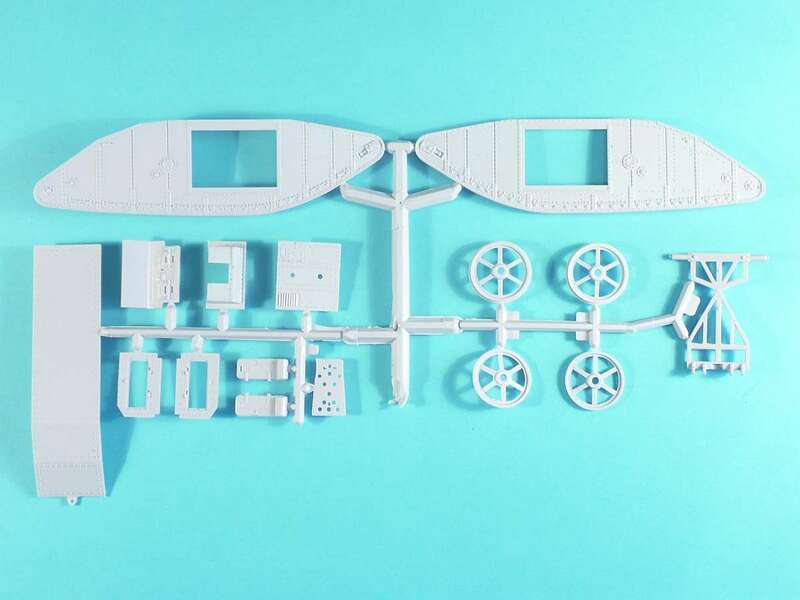 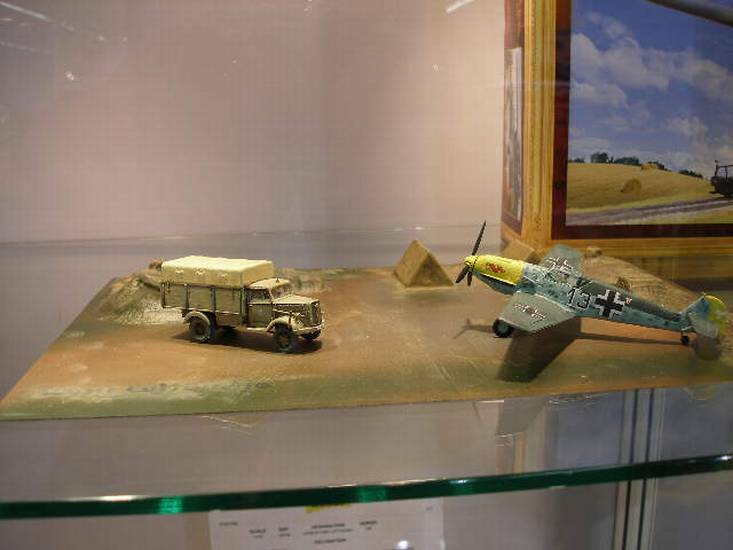 Models built by Erhan Atalay. 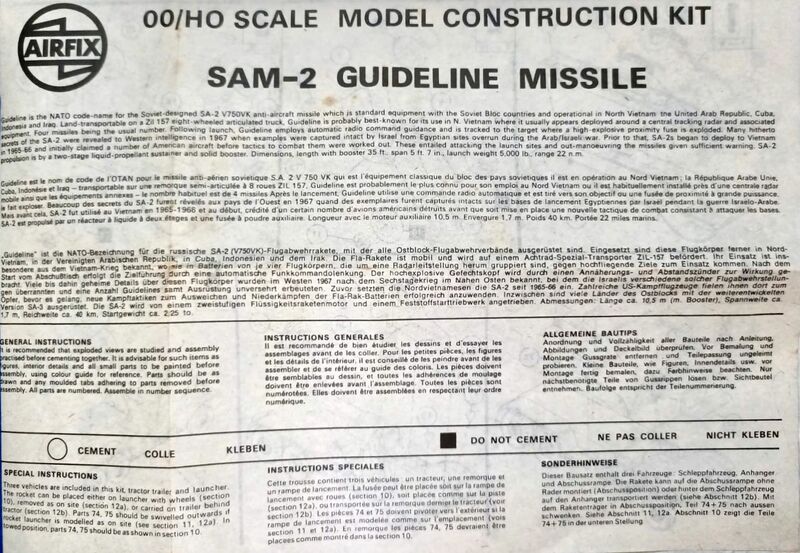 Kit 3303 Sam 2 missile 'Guideline'. 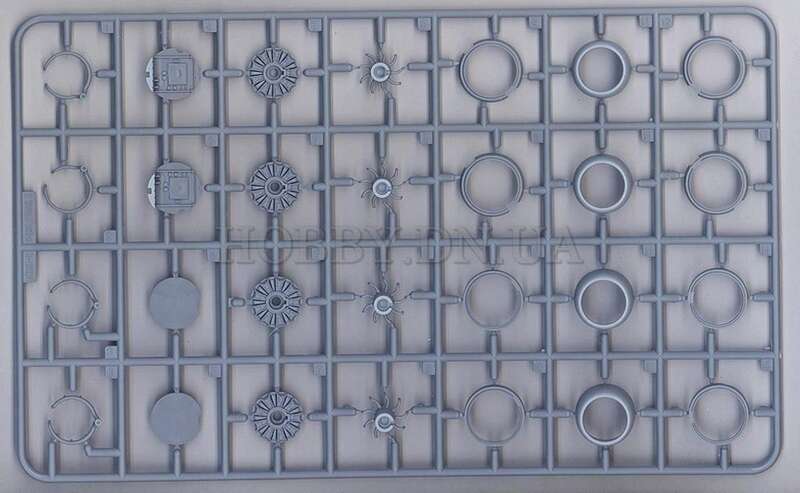 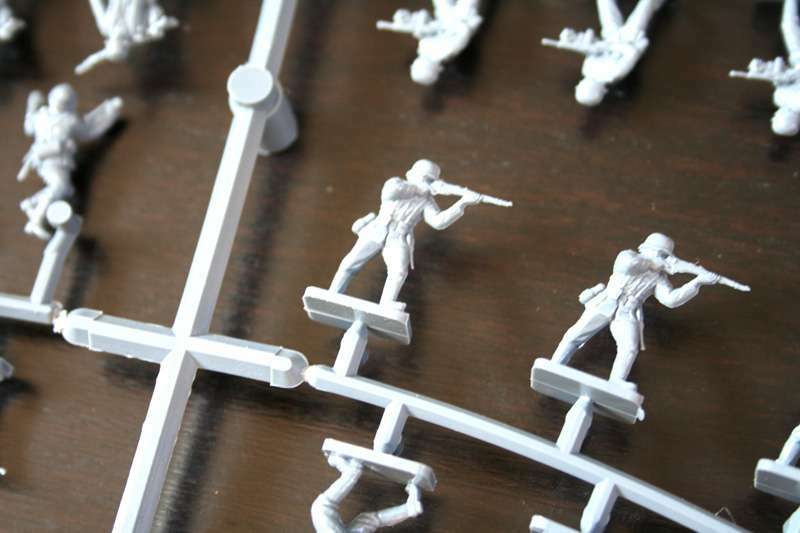 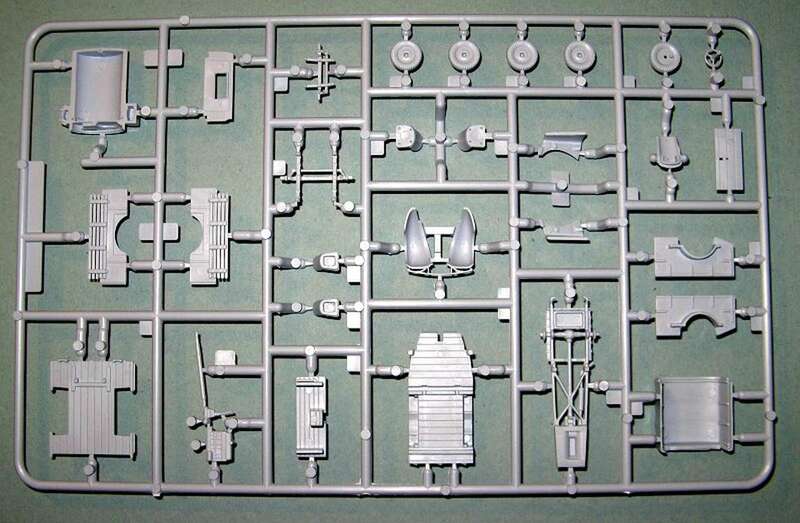 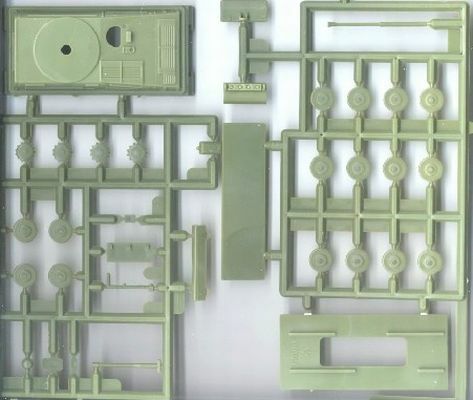 Sprue part pictures by Laszlo Szasz. 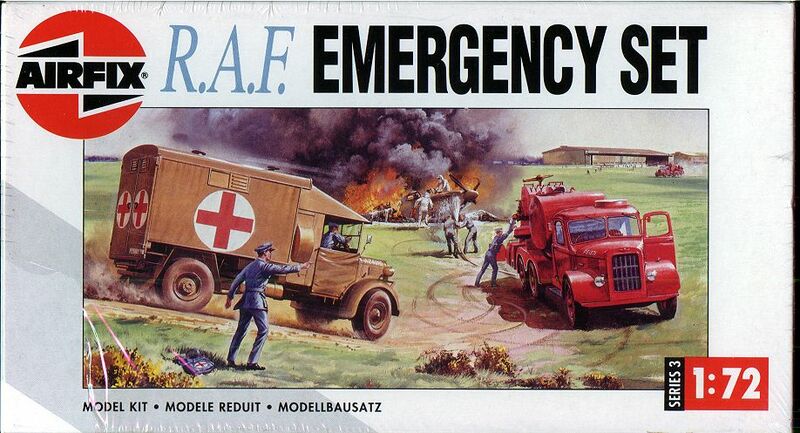 Kit 3304 RAF emergency set. 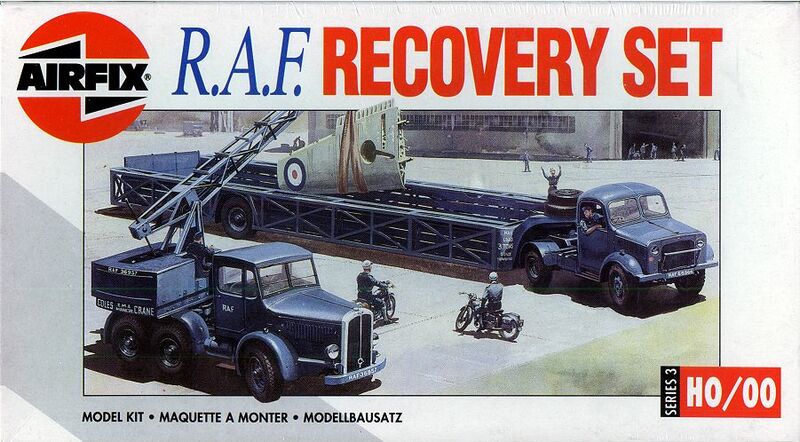 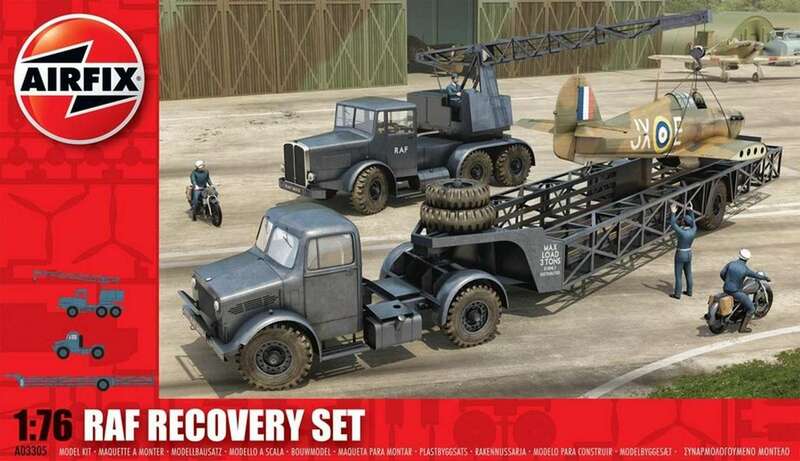 Kit 3305 RAF recovery set. 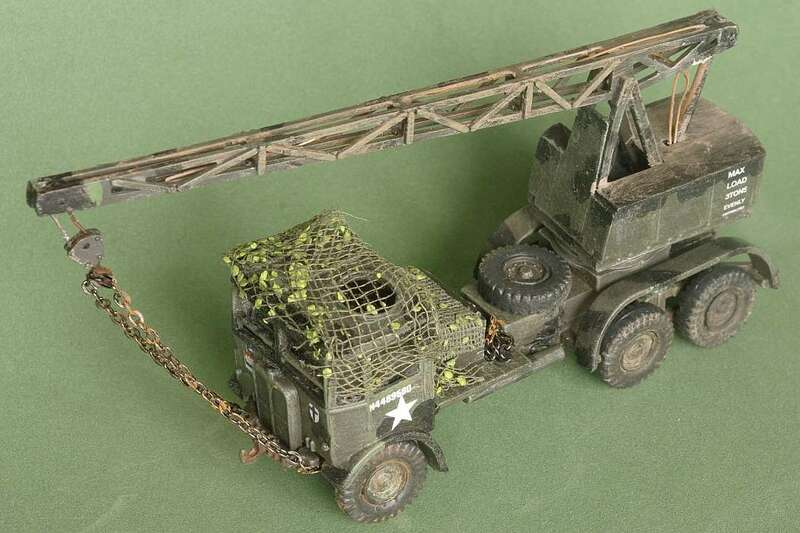 Model built by Patrice Dauga. 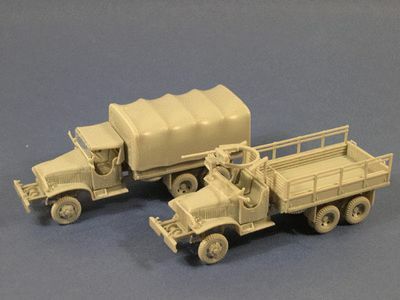 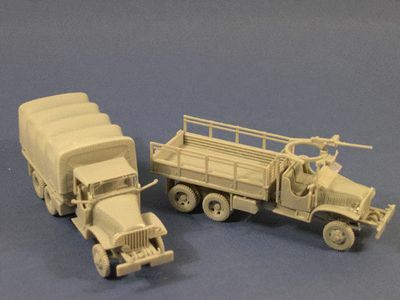 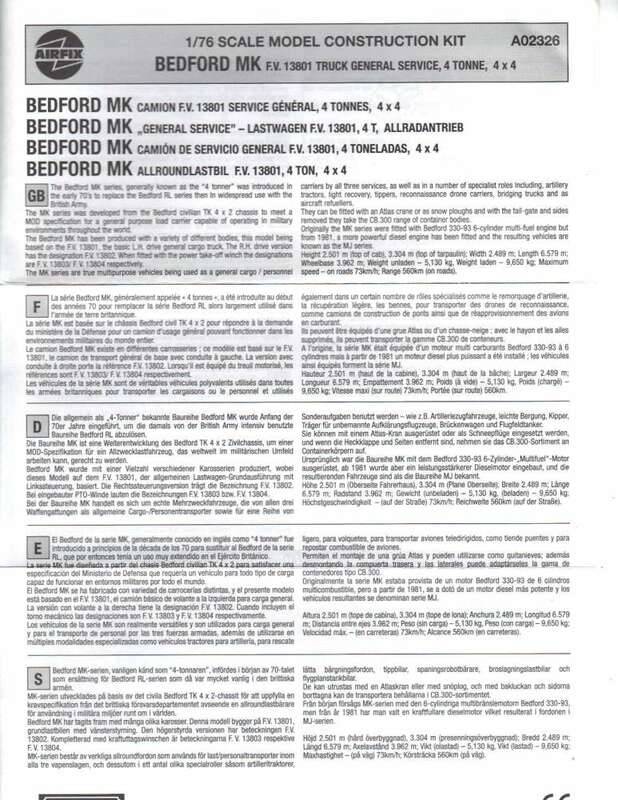 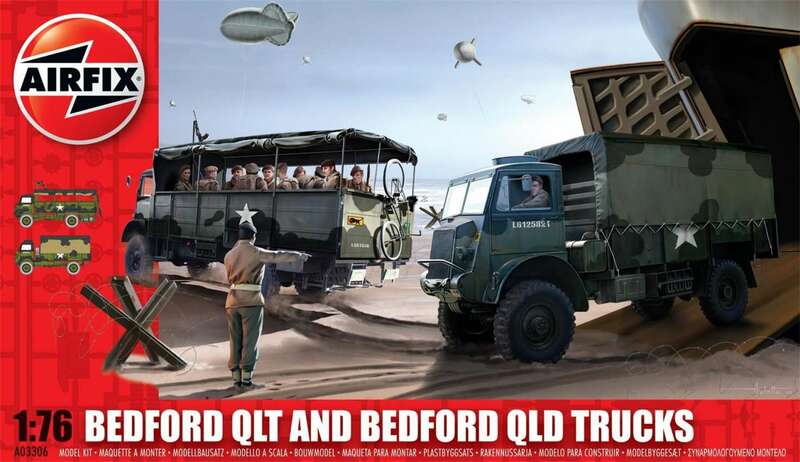 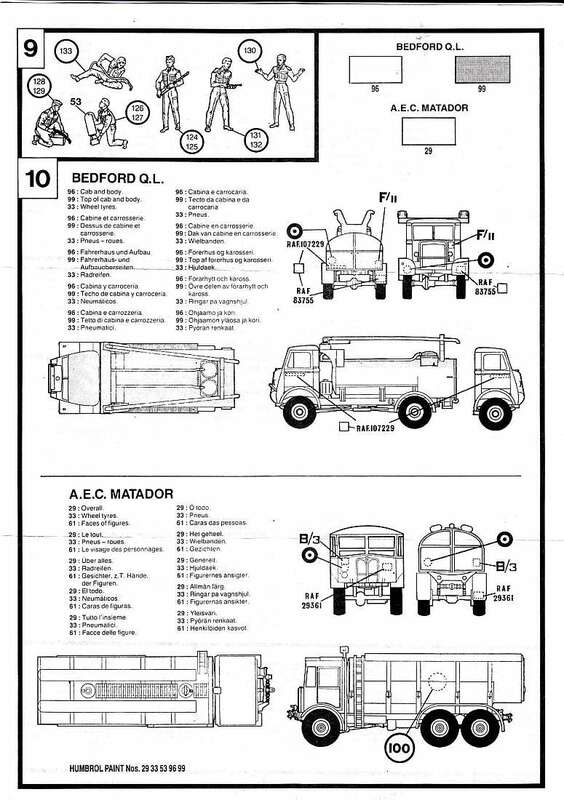 Kit 3306 - Bedford QL trucks (QLT and QLD) - Two kits in one box. 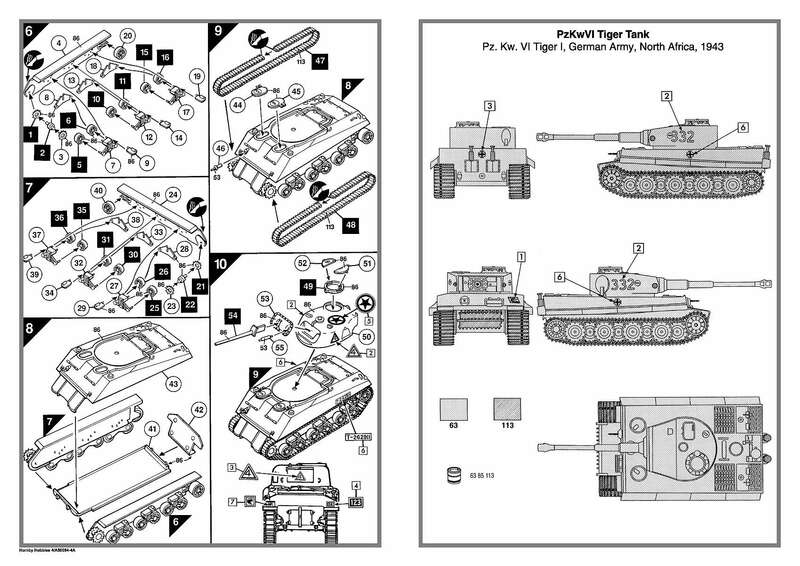 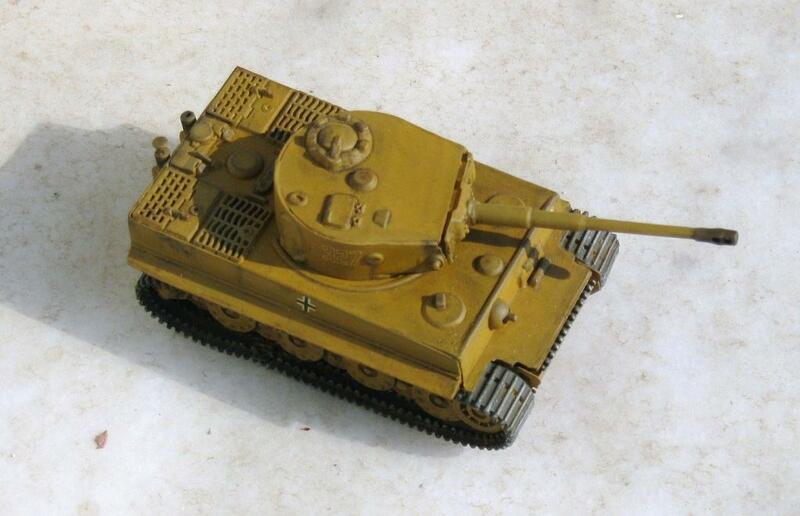 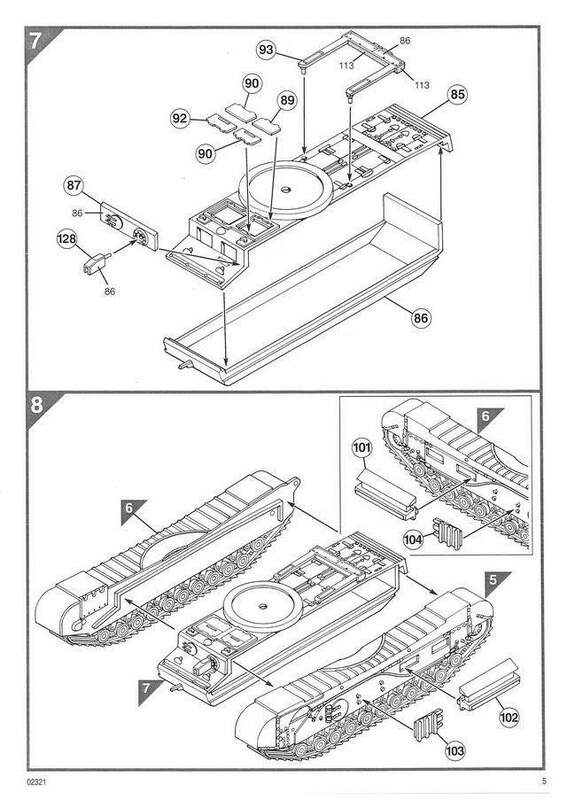 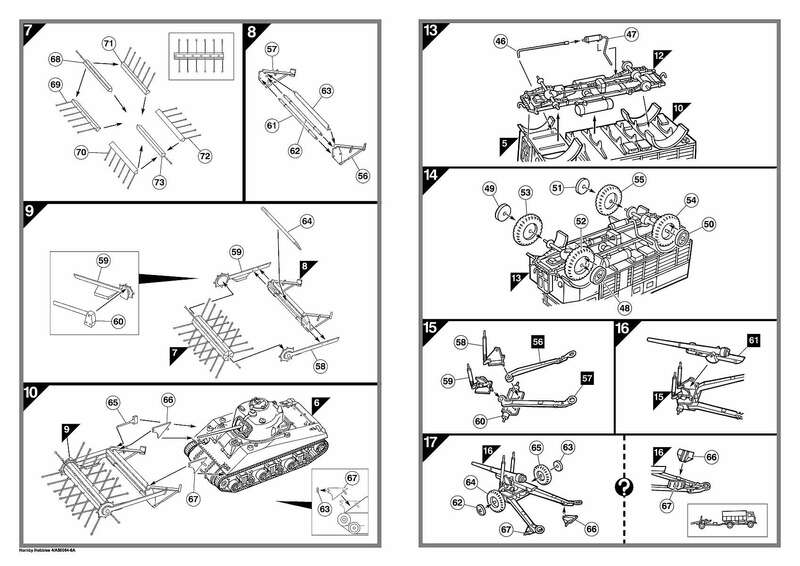 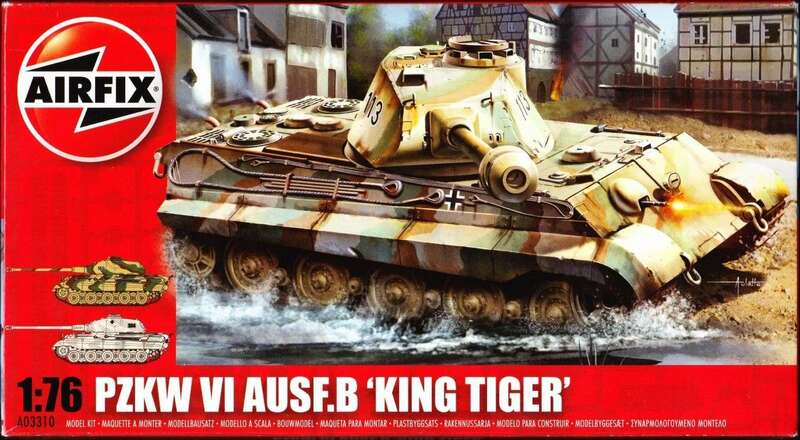 Kit 3310 - King Tiger Ausf. 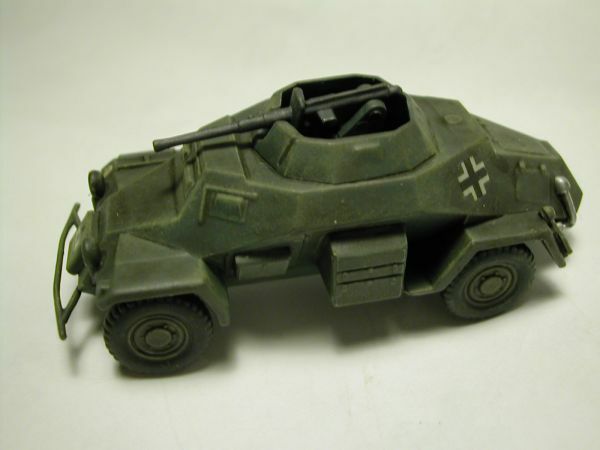 B - Porsche. 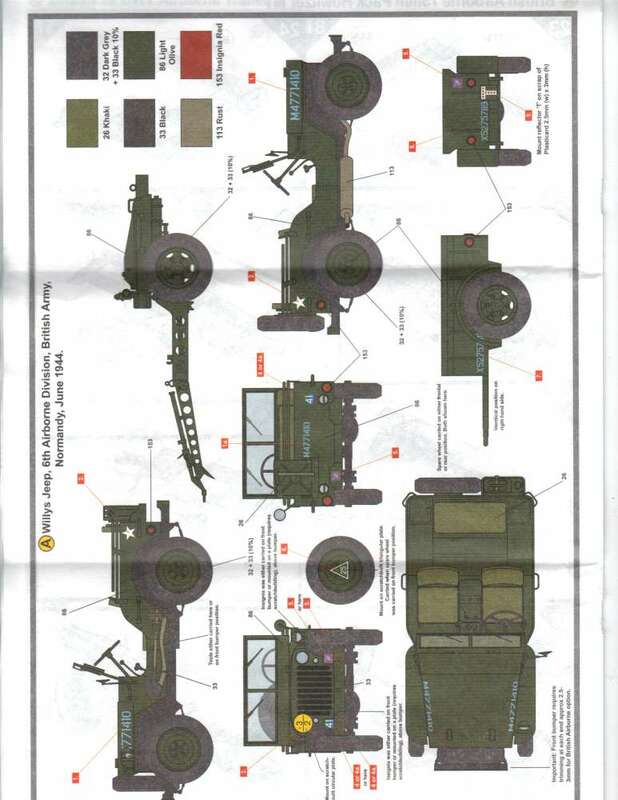 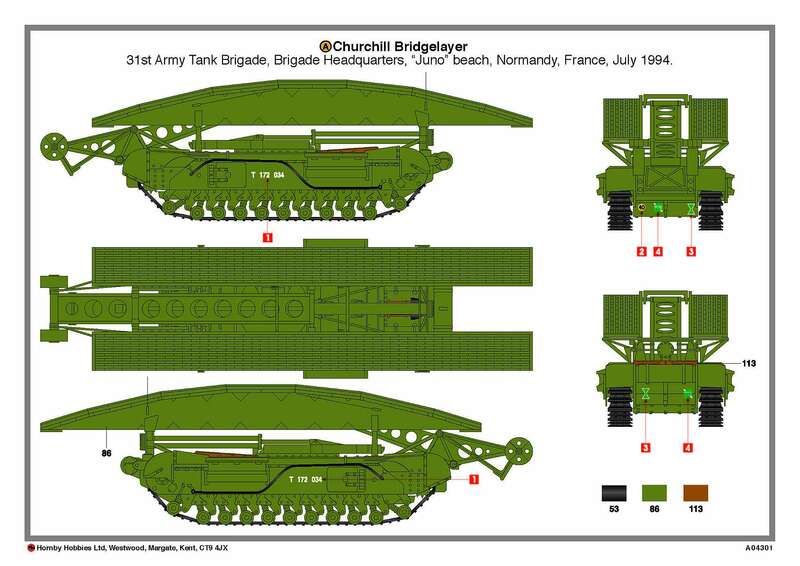 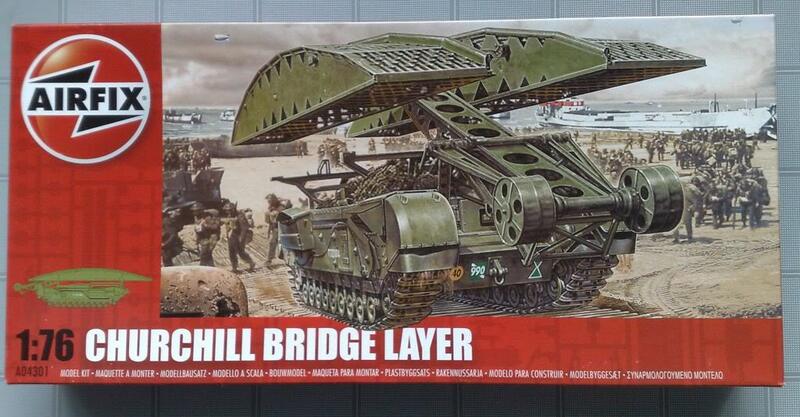 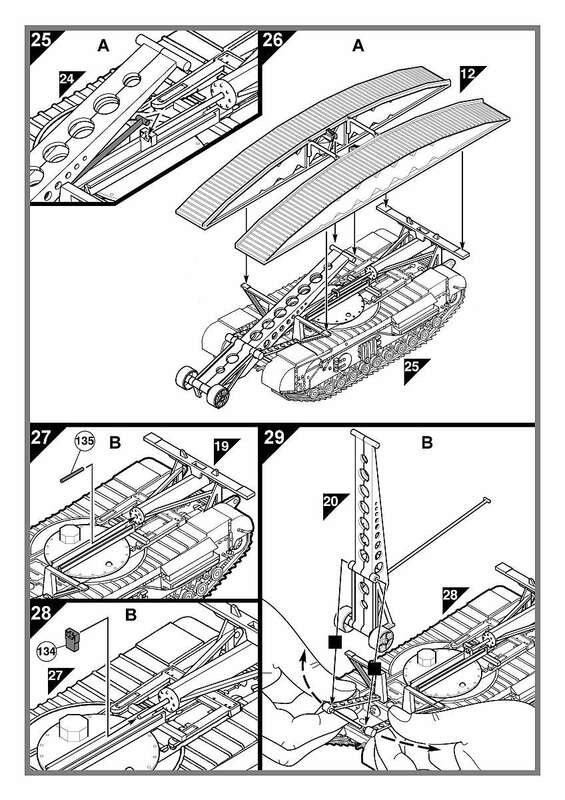 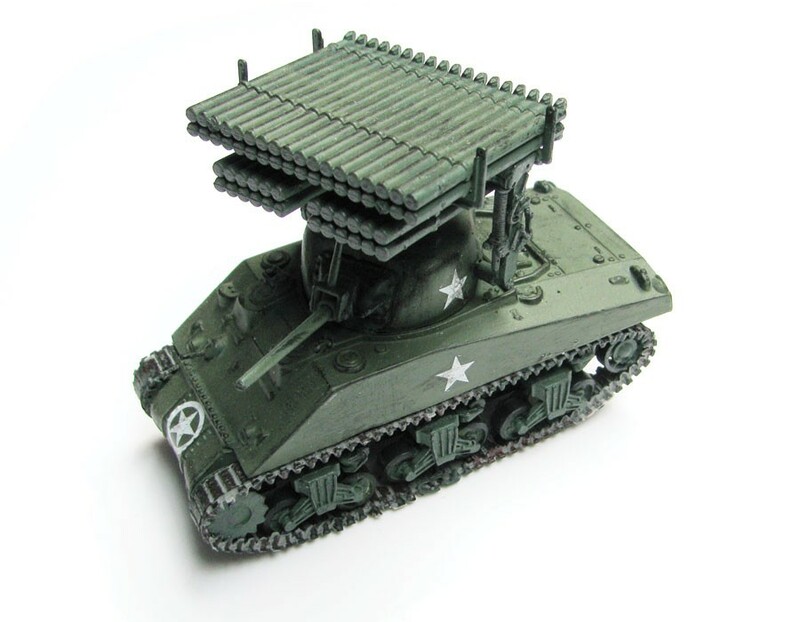 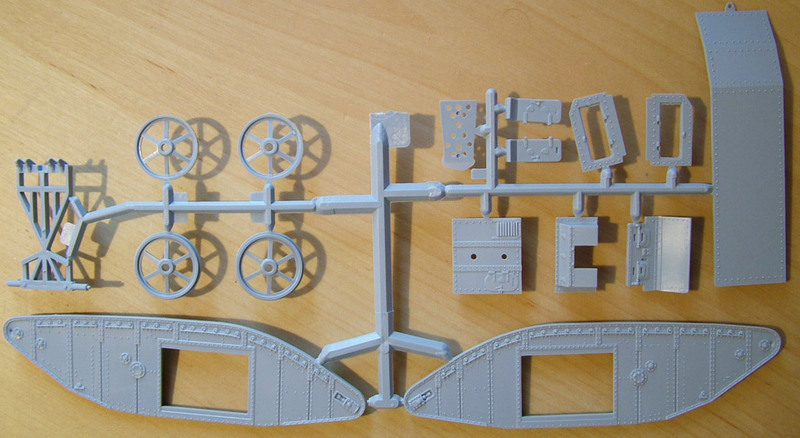 Kit 4301 - Churchill bridgelayer - note: bridge is in-correct. 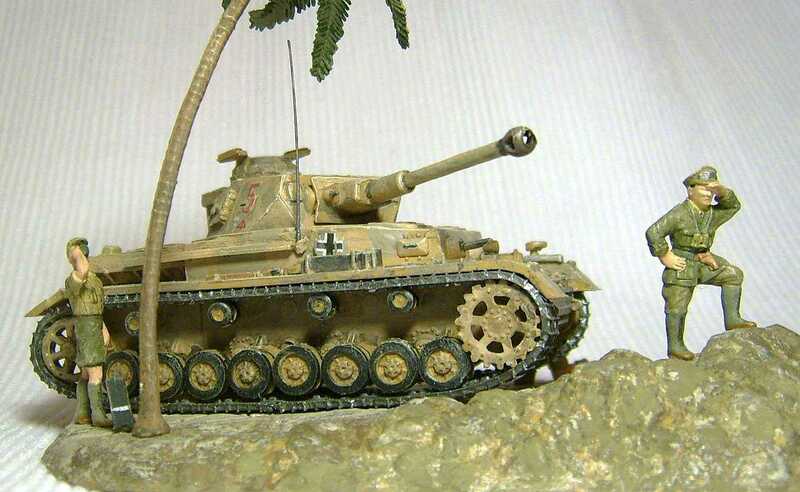 Model built - owner unknown. 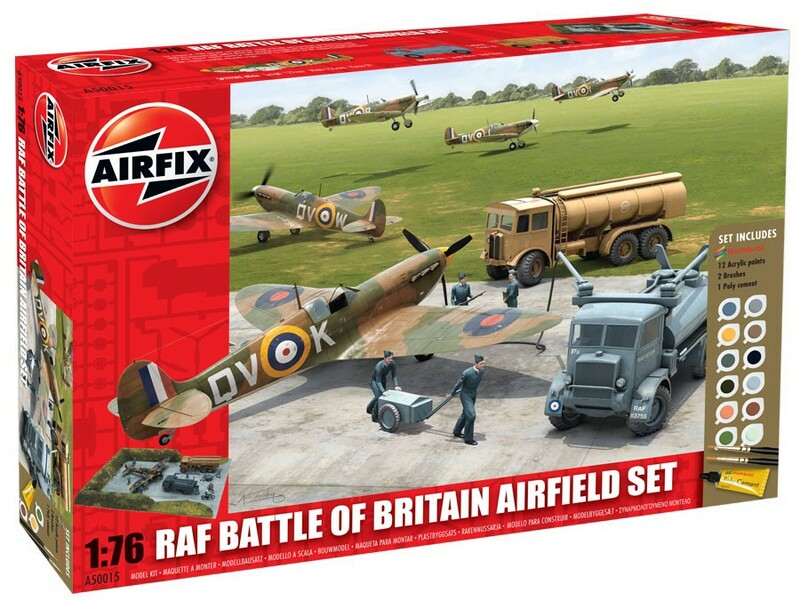 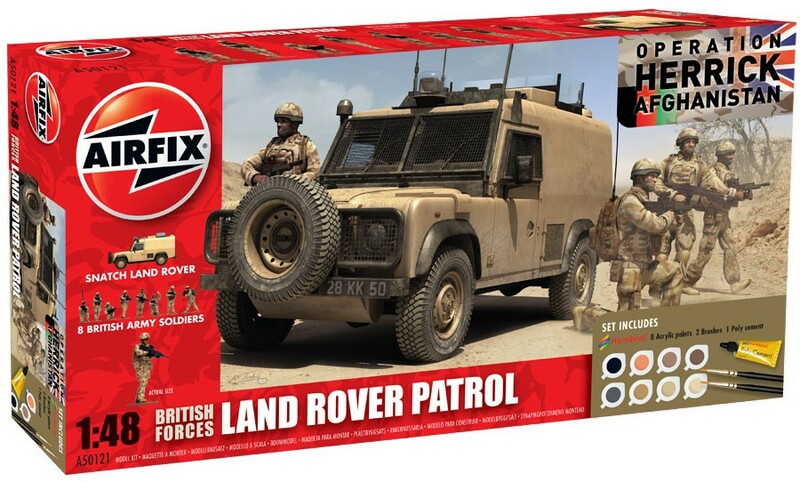 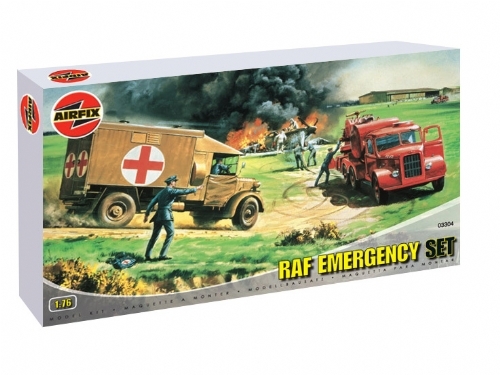 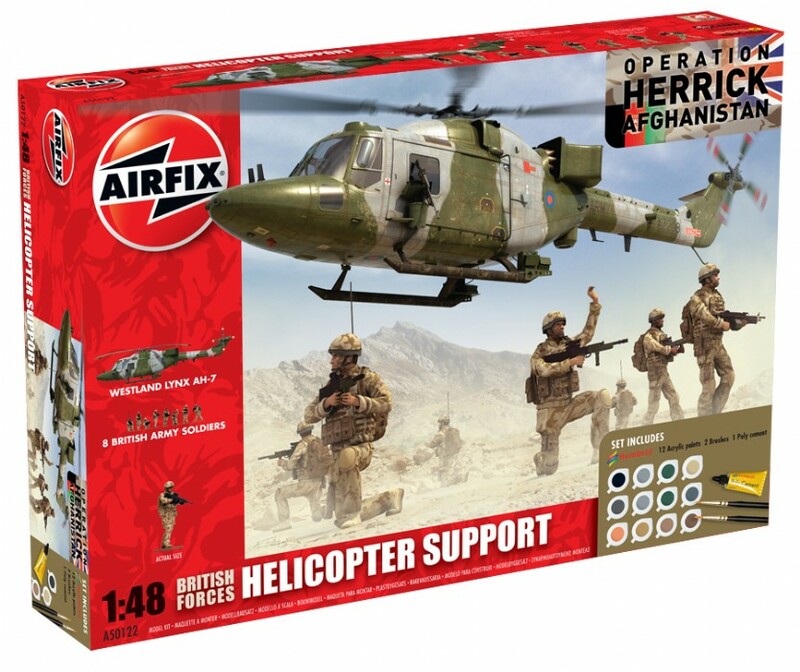 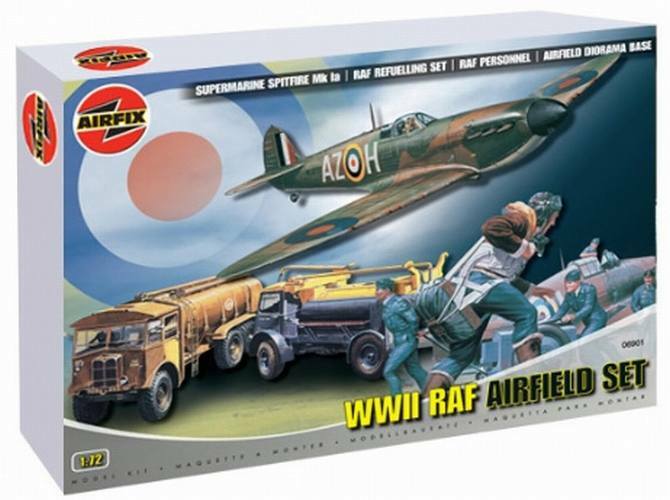 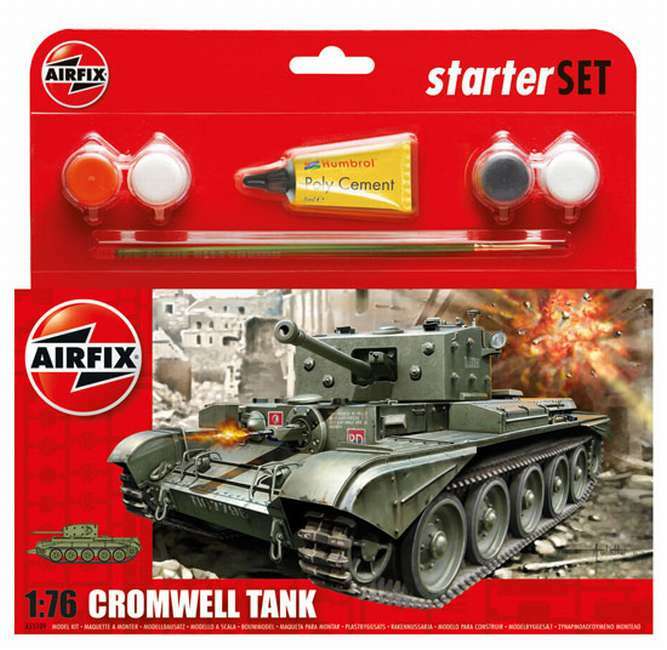 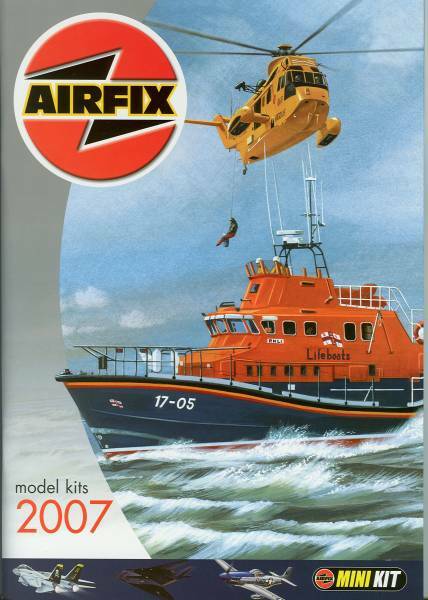 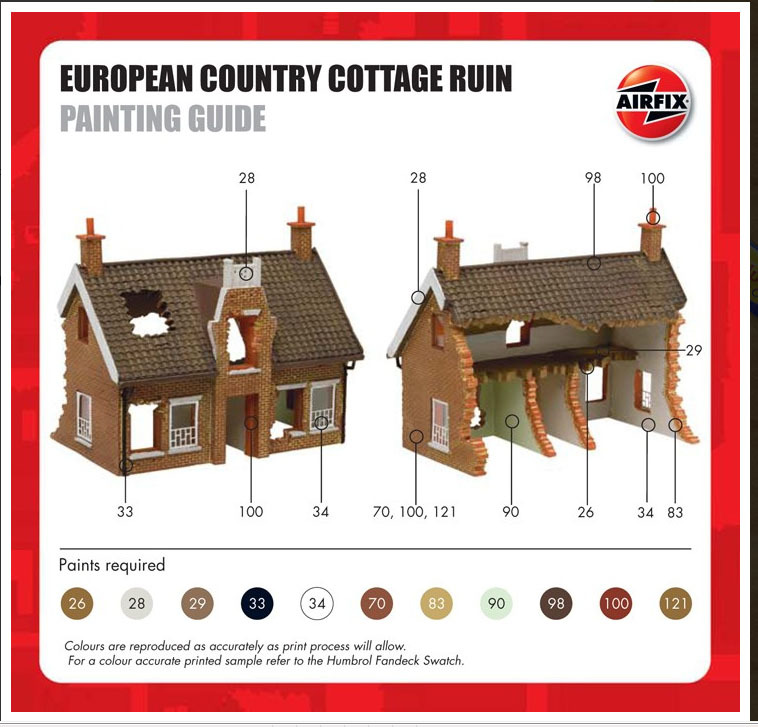 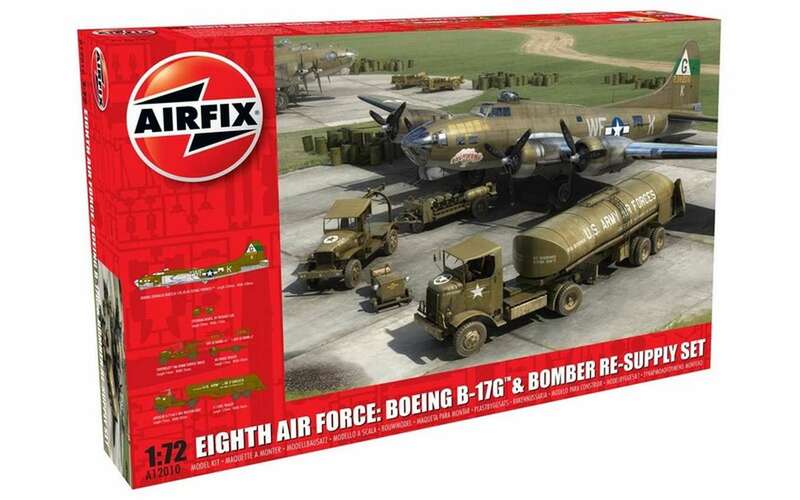 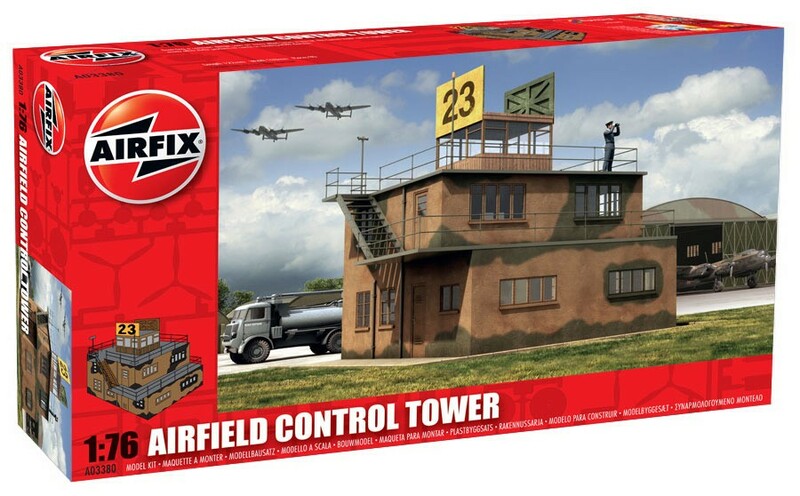 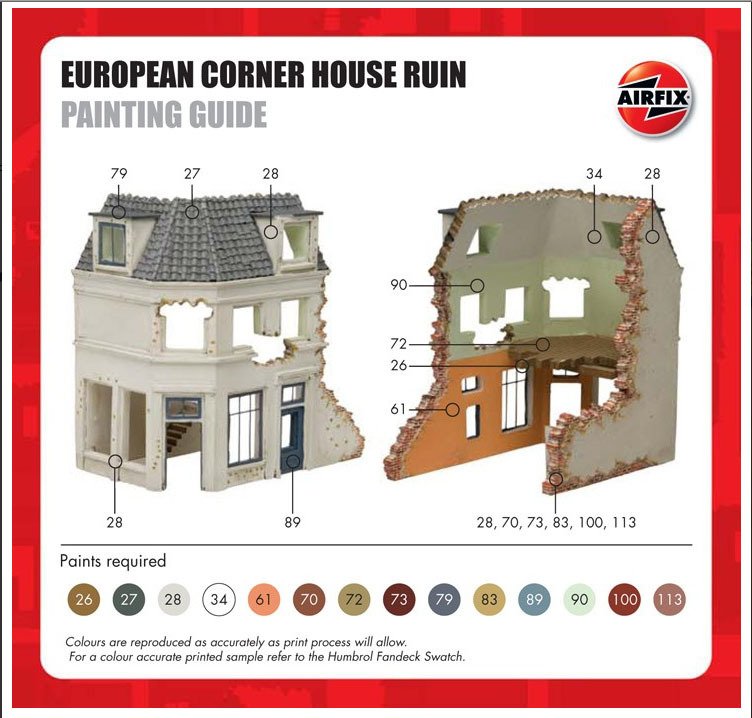 Airfix starter / gift sets - paint, paintbrush and glue included. 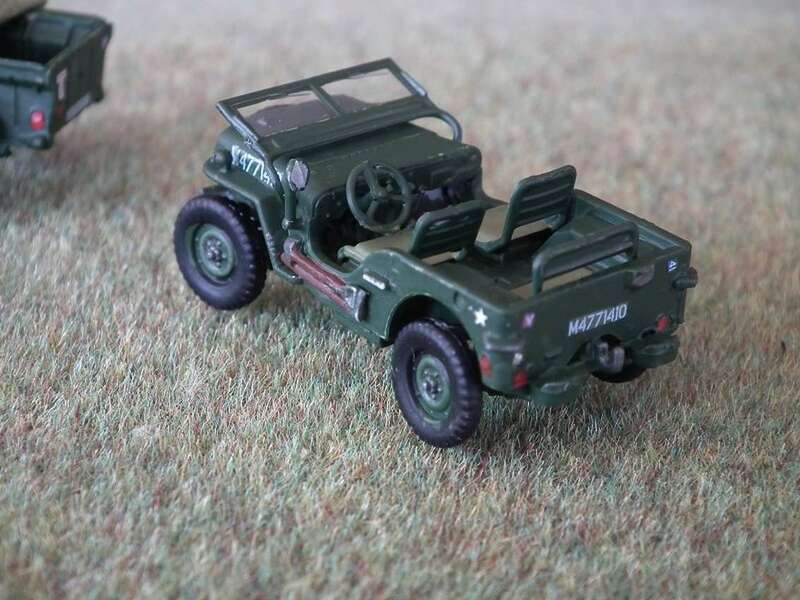 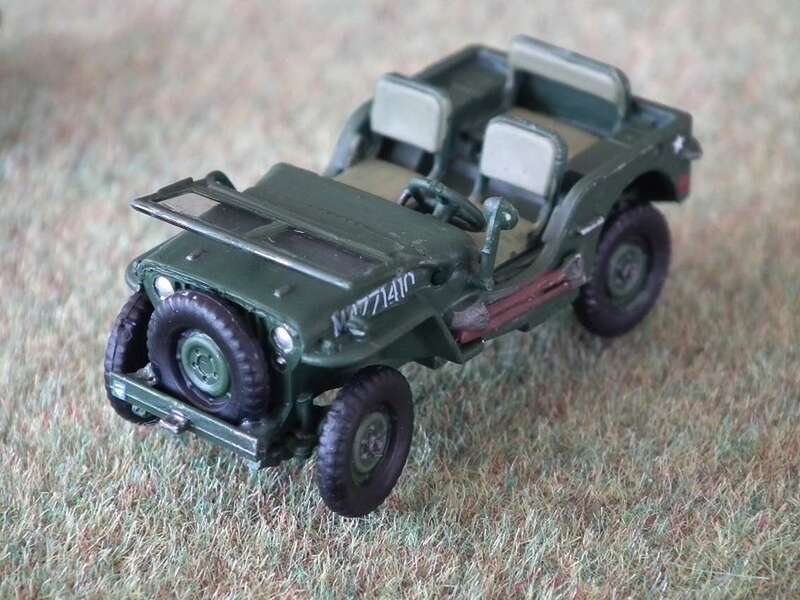 Kit 50121 - Landrover Patrol. 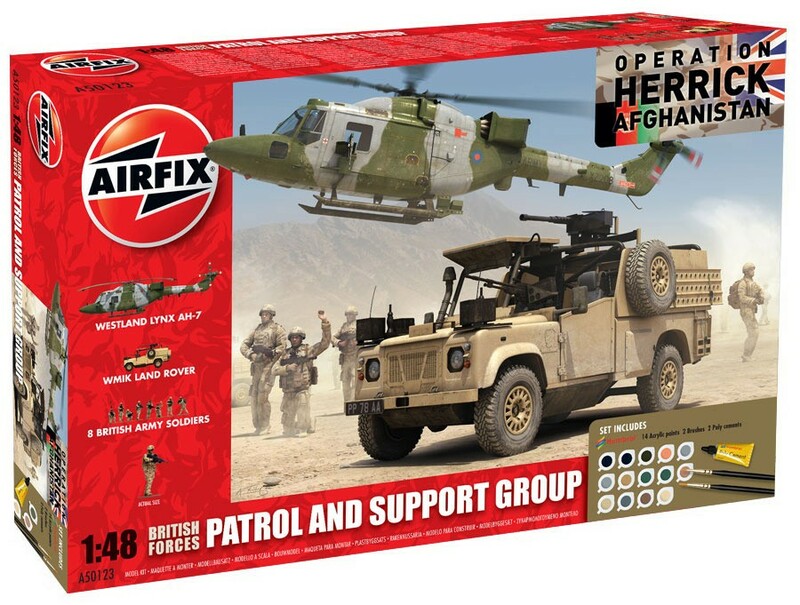 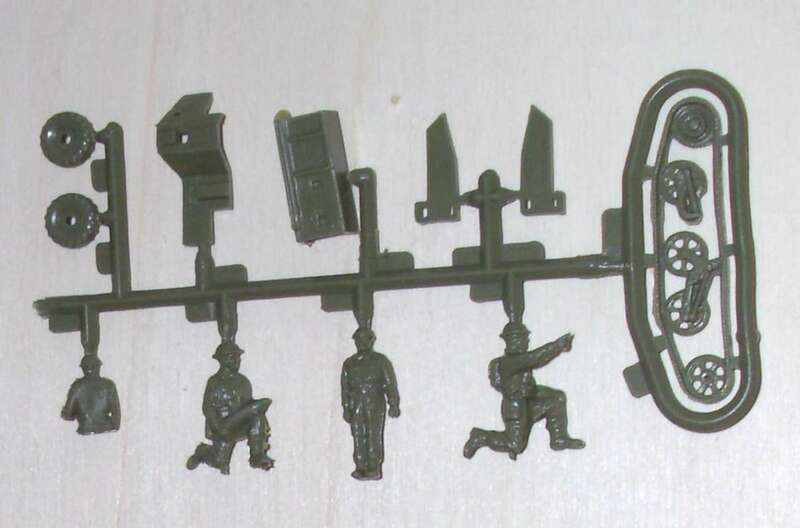 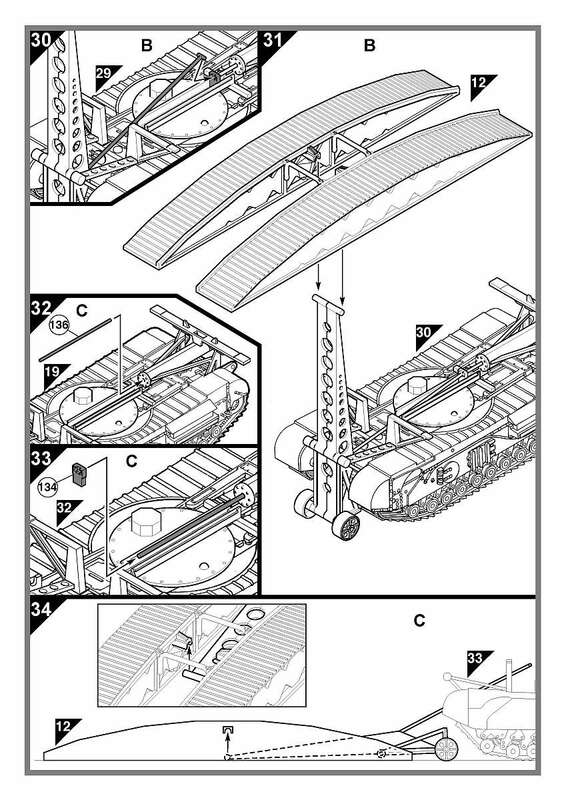 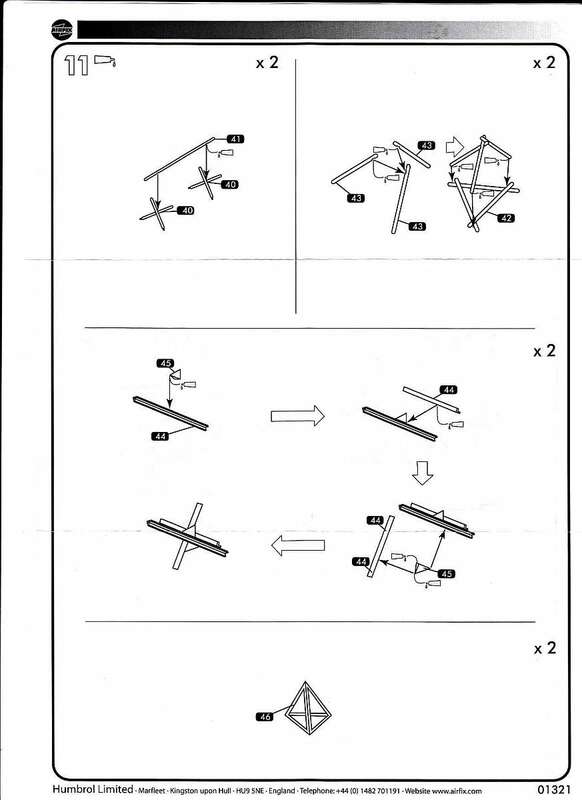 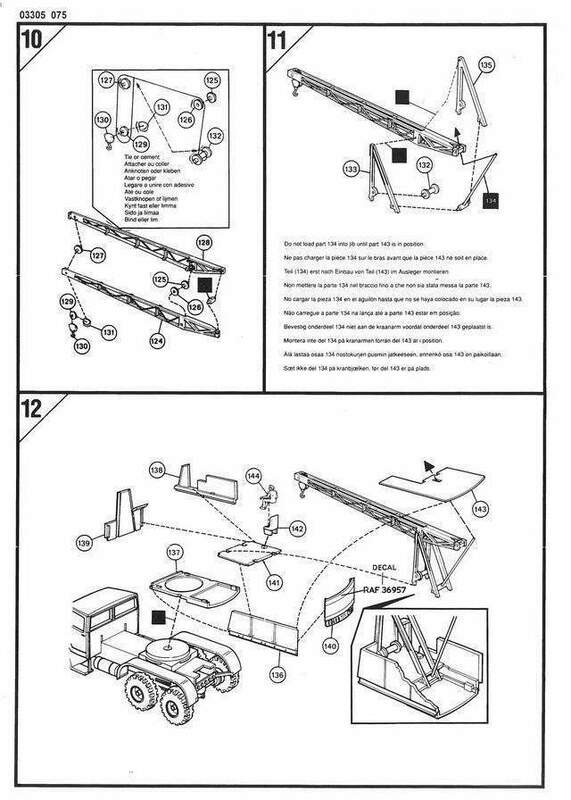 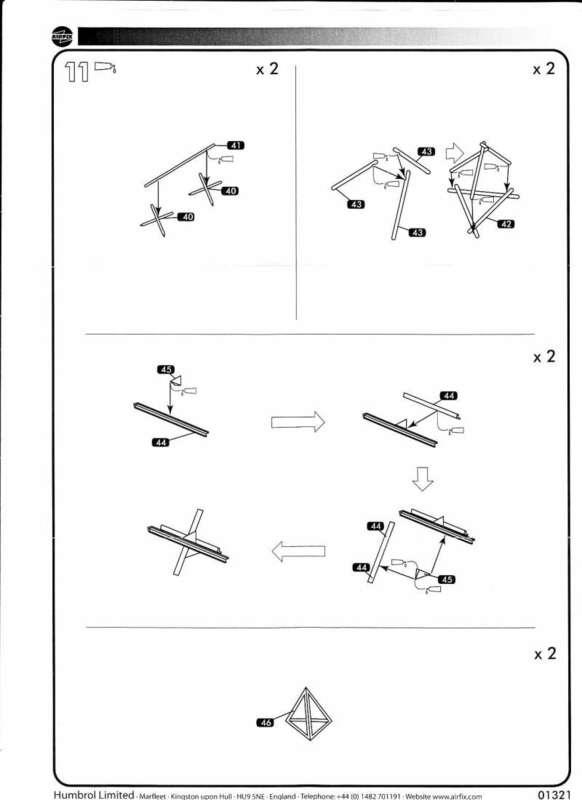 Kit 50122 - helicopter support. 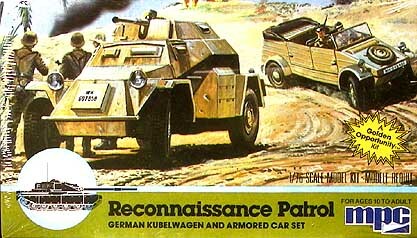 Kit 50123 - patrol and spport Group. 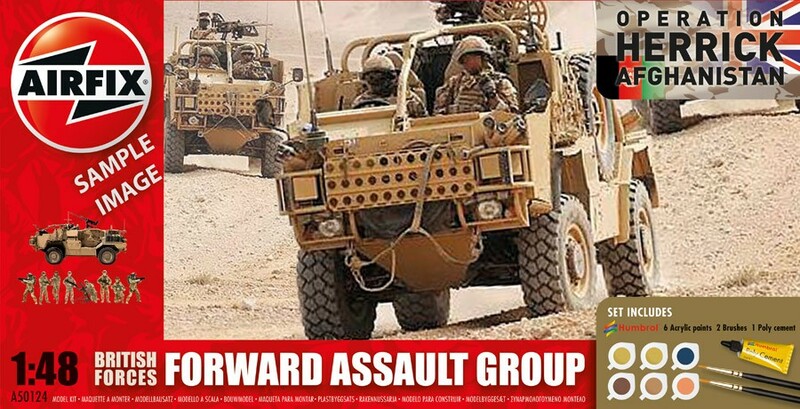 Kit 50124 - forward assault group. 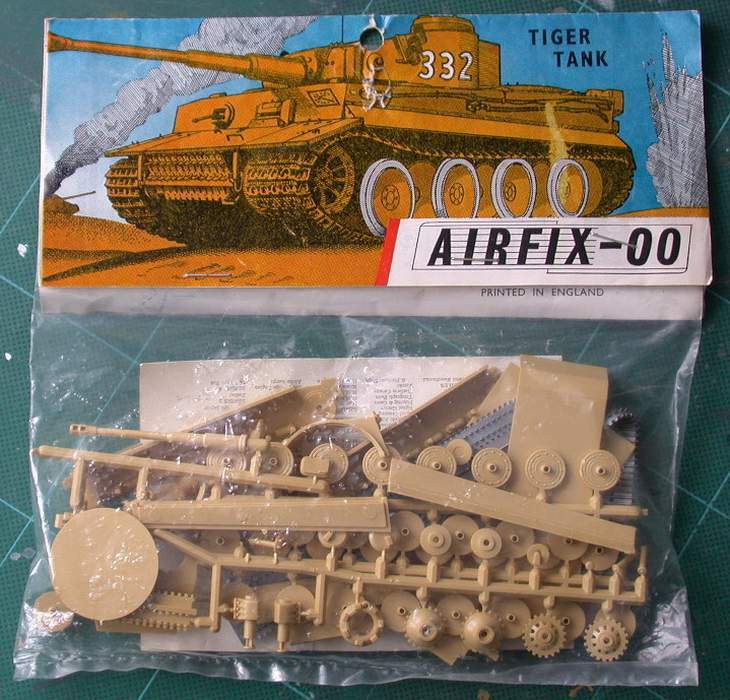 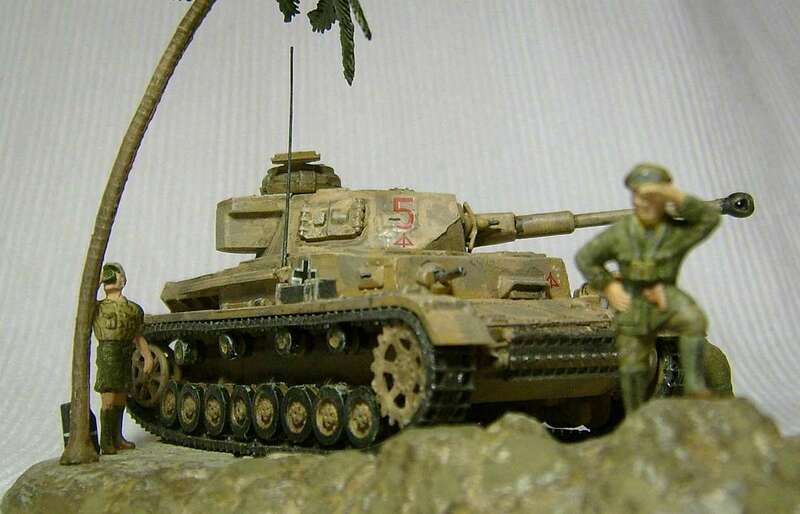 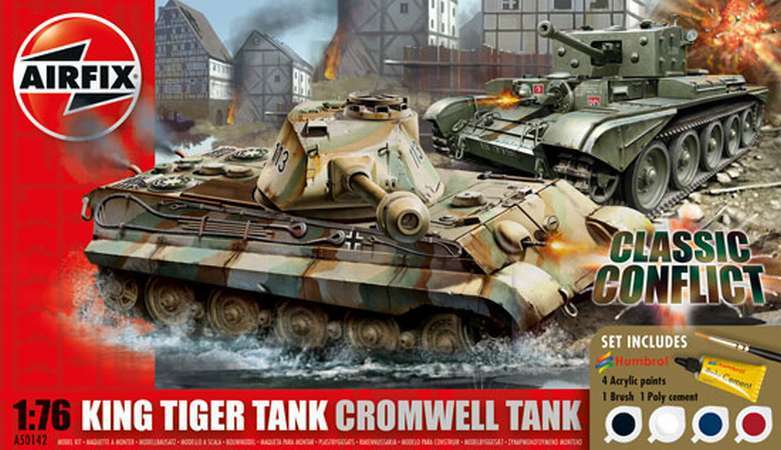 Kit 50142 - King Tiger with Cromwell. 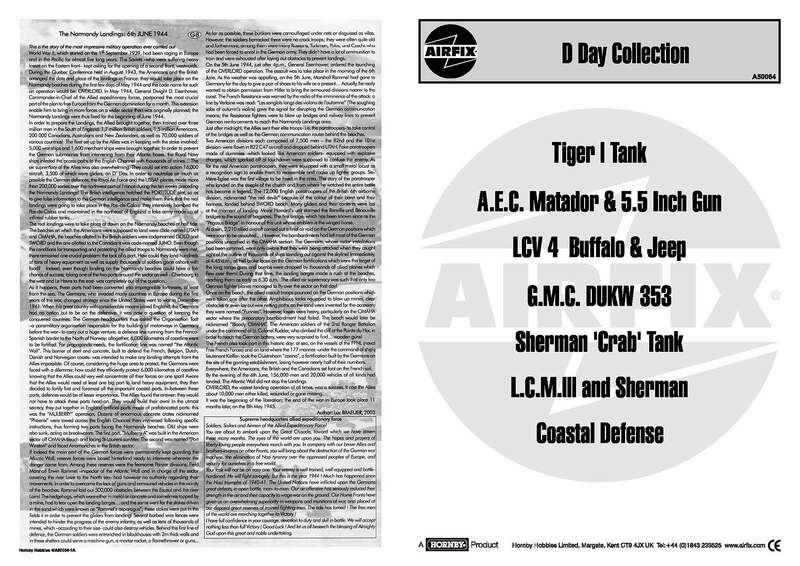 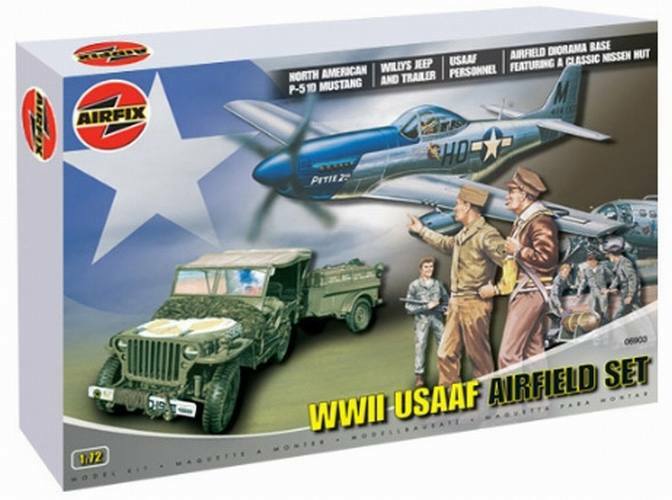 Kit 50157 - D-Day air assault gift set. 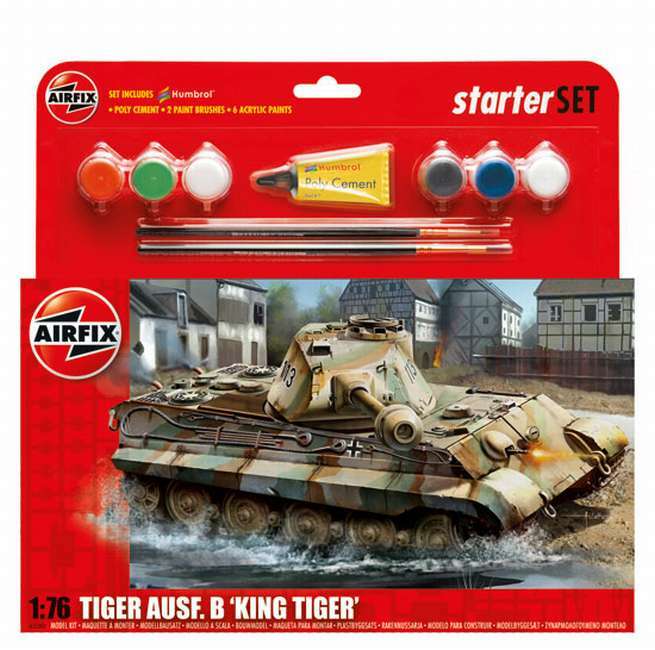 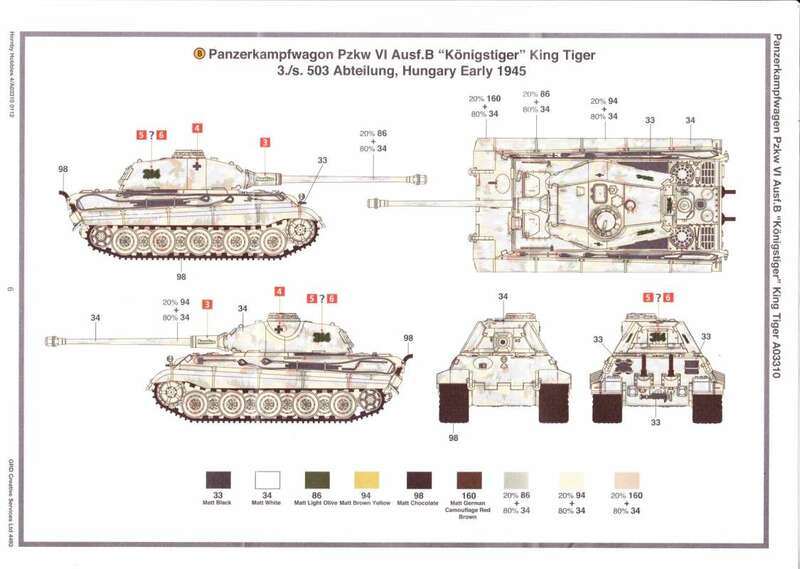 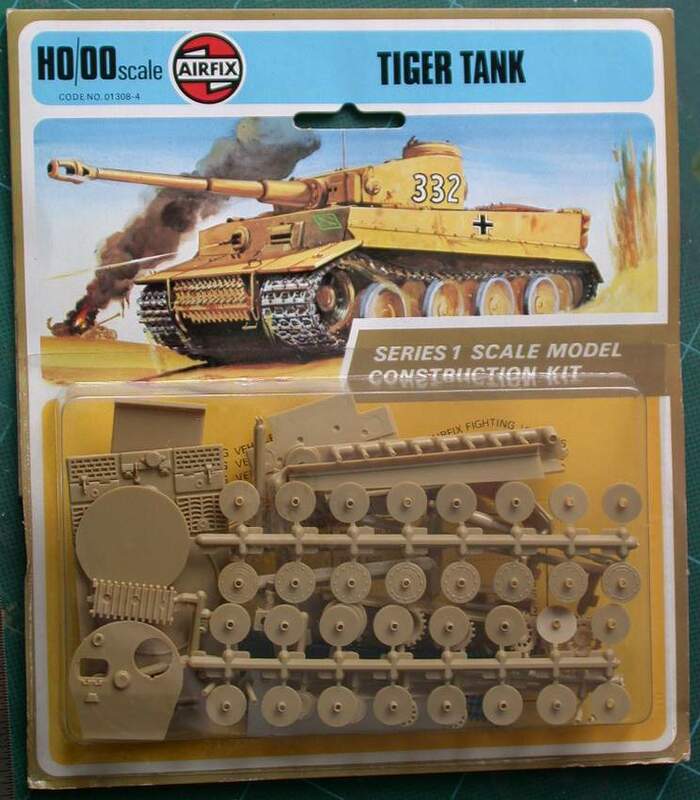 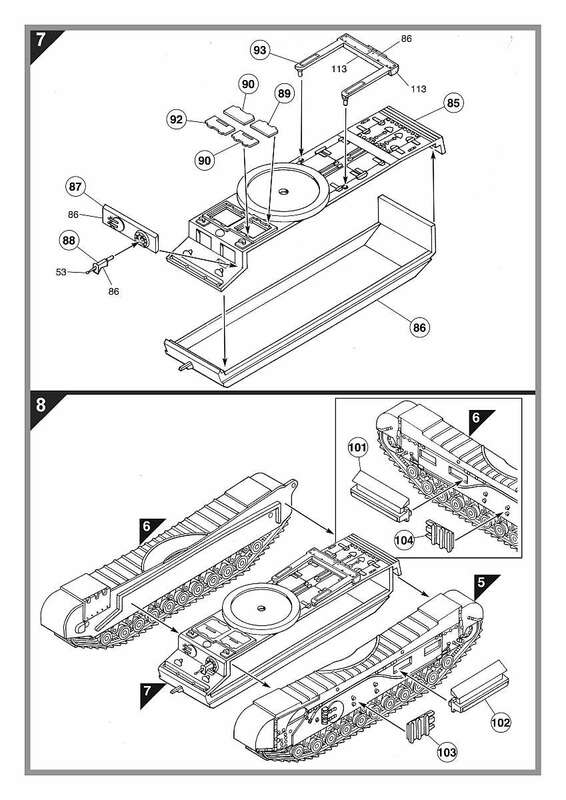 Kit 55303 - King Tiger. 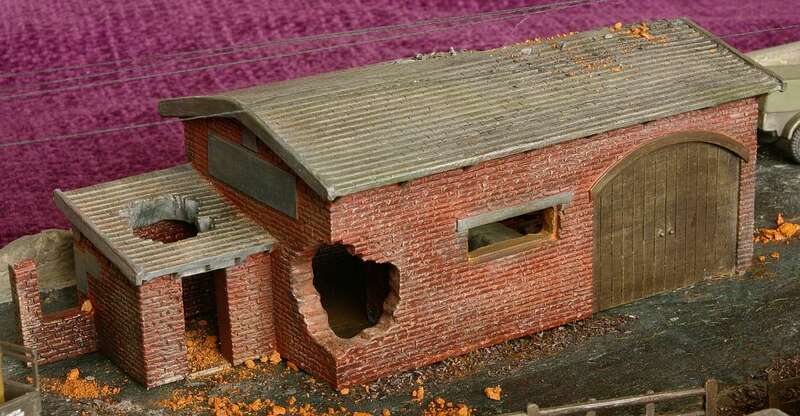 Kit 75001 - Europian demolished workshop. 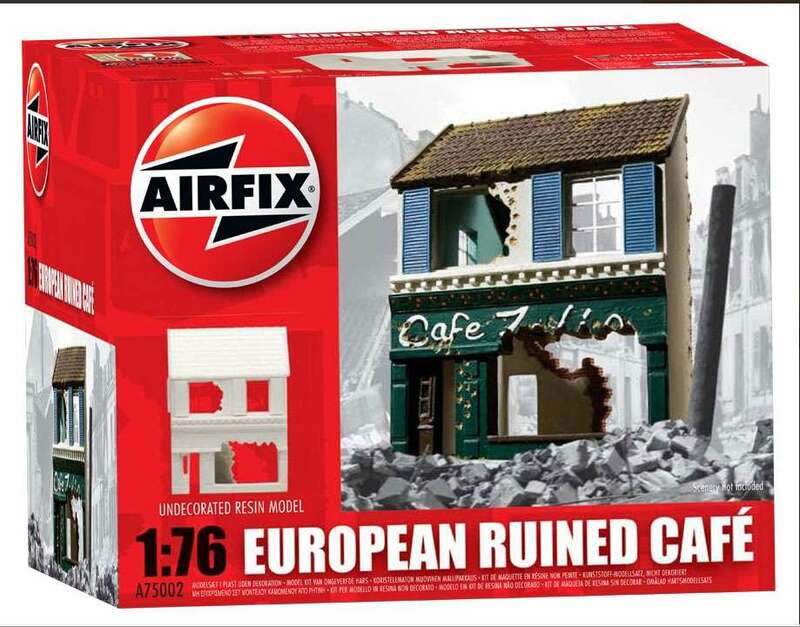 Kit 75002 - Europian demolished cafe. 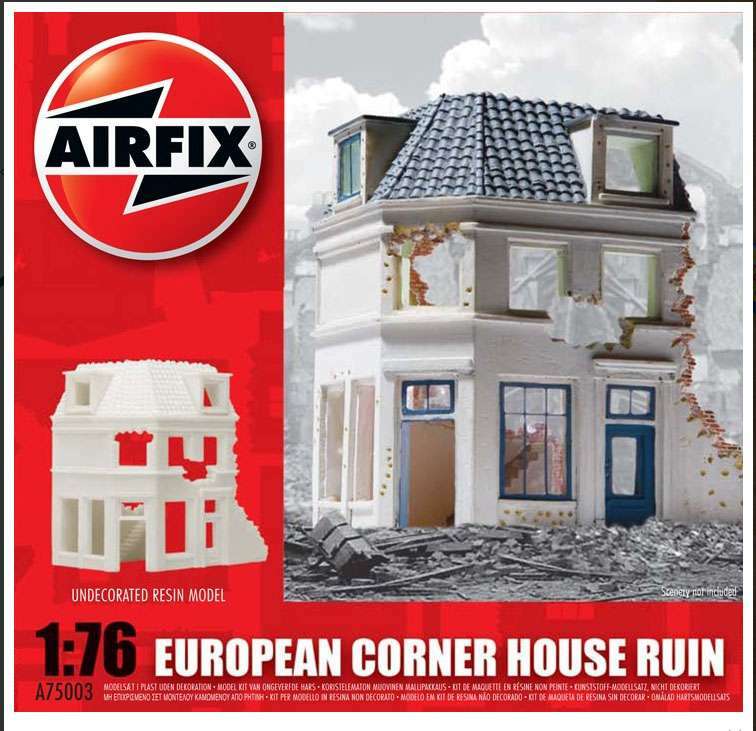 Kit 75003 - Europian demolished corner house. 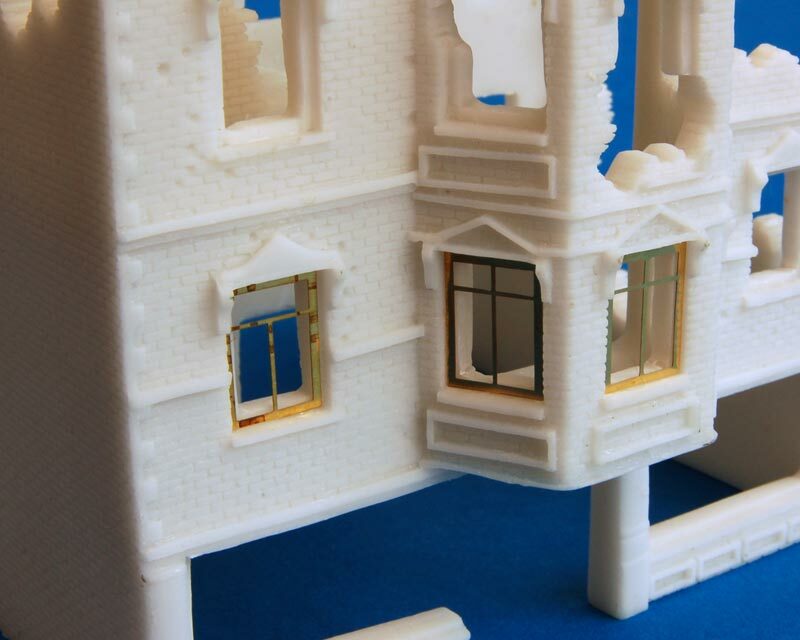 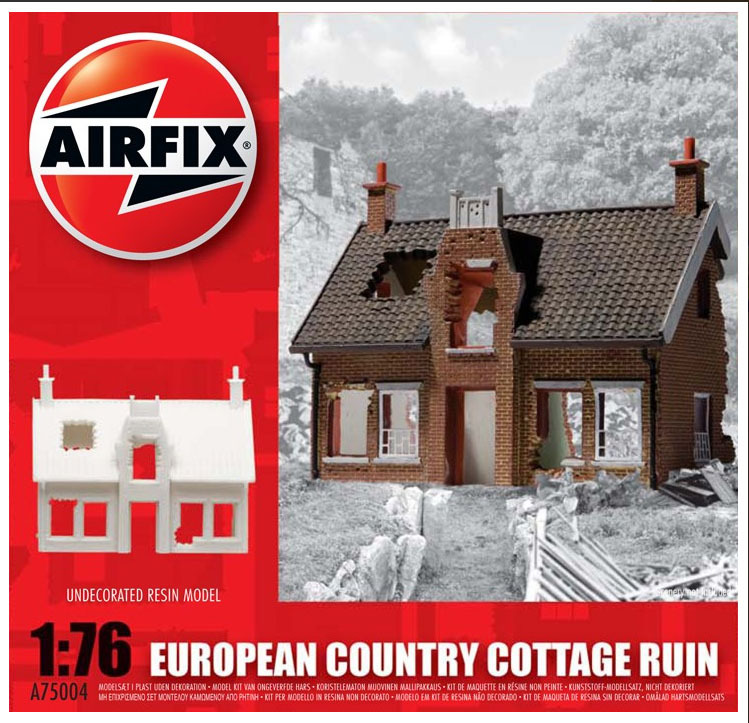 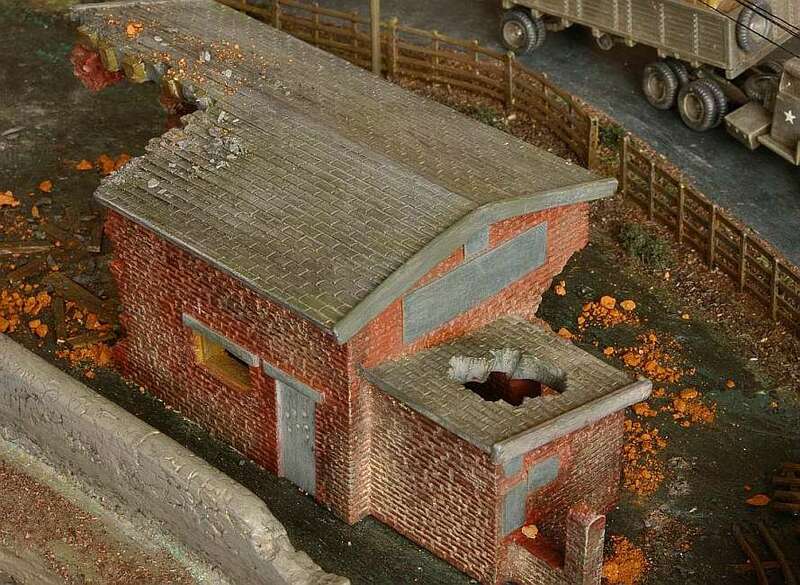 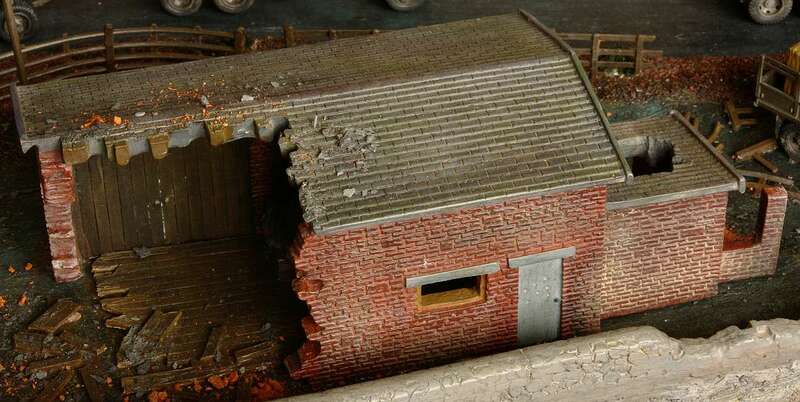 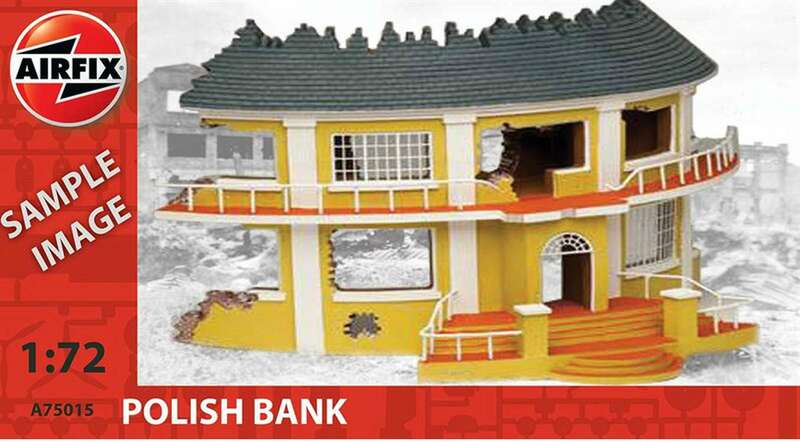 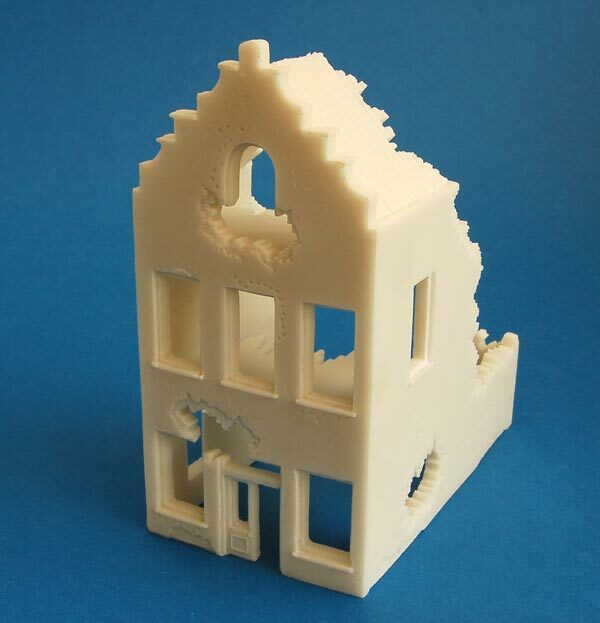 Kit 75004 - Europian demolished country cottage. 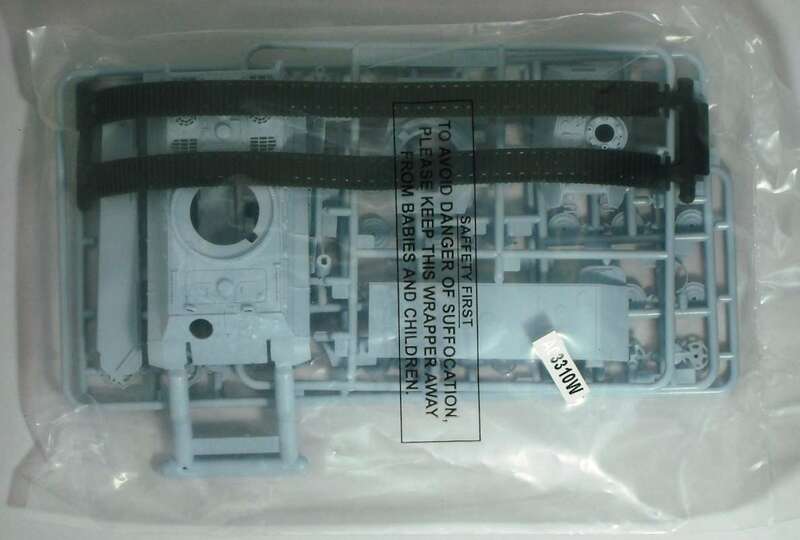 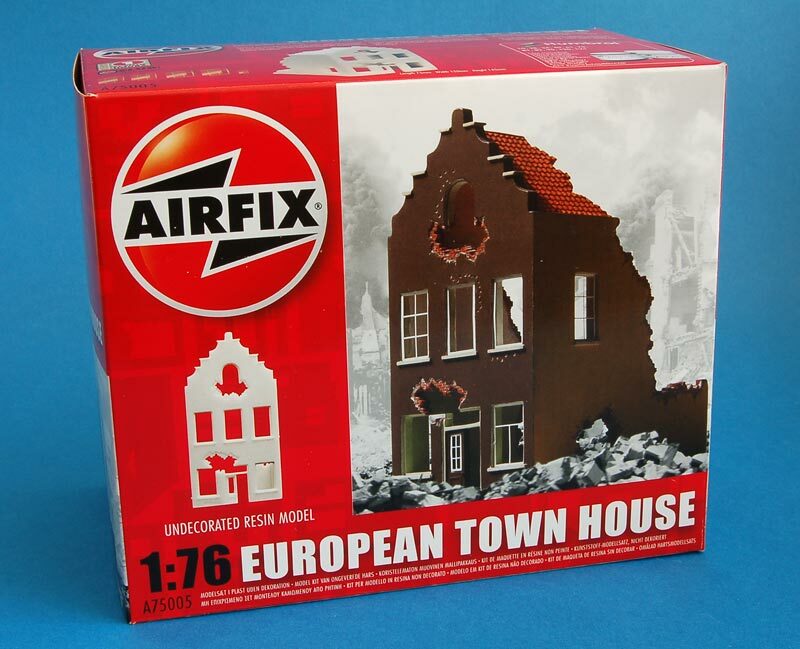 Kit 75005 - Europian townhouse. 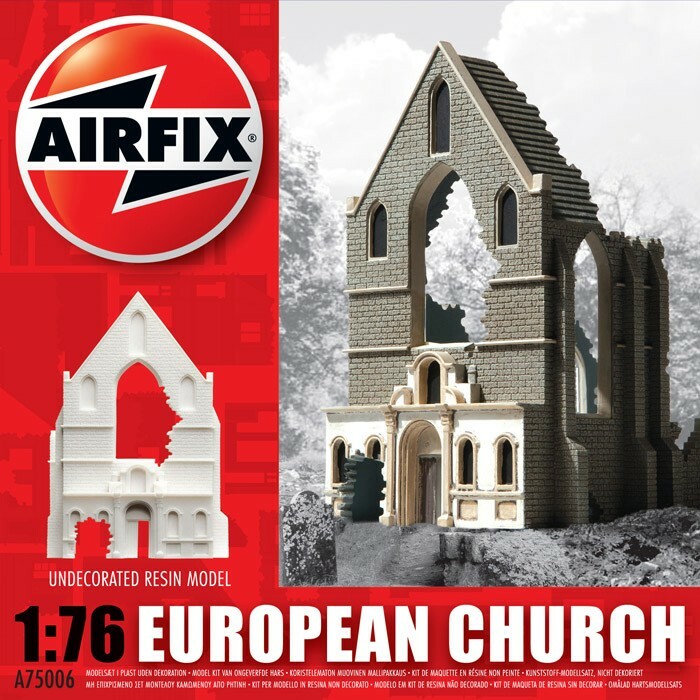 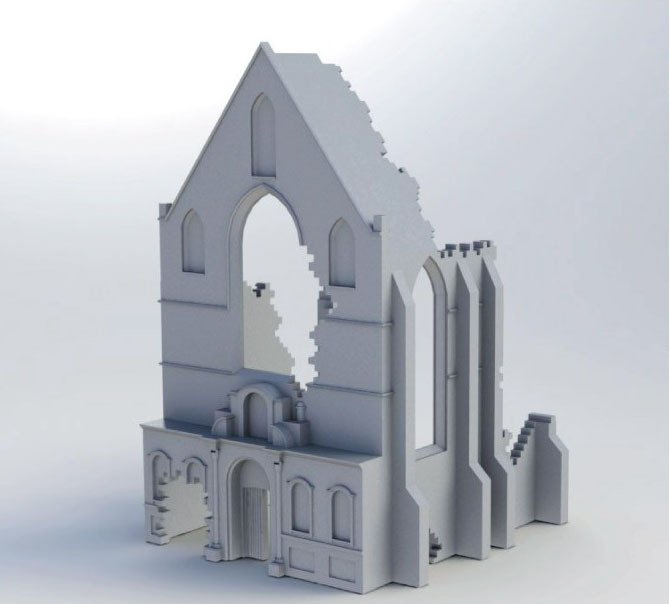 Kit 75006 - Europian church. 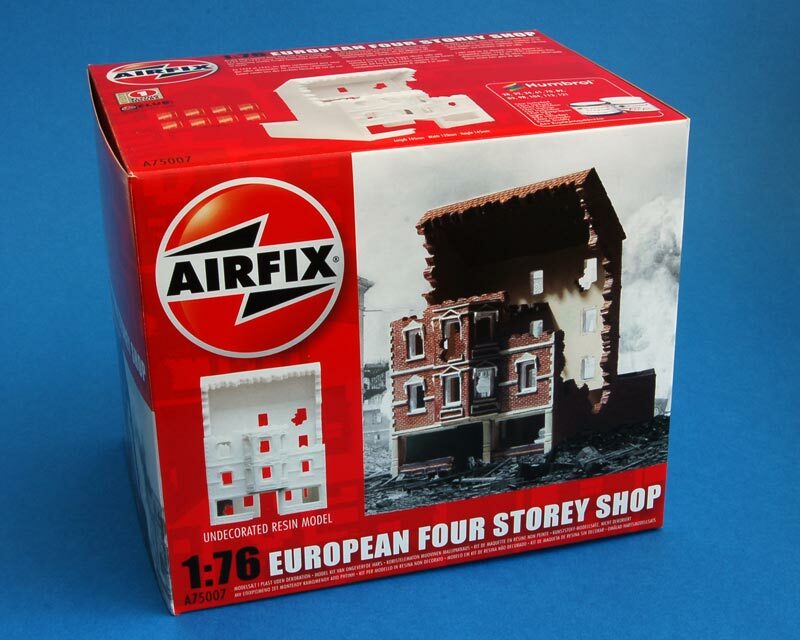 Kit 75007 - Europian four story shop. 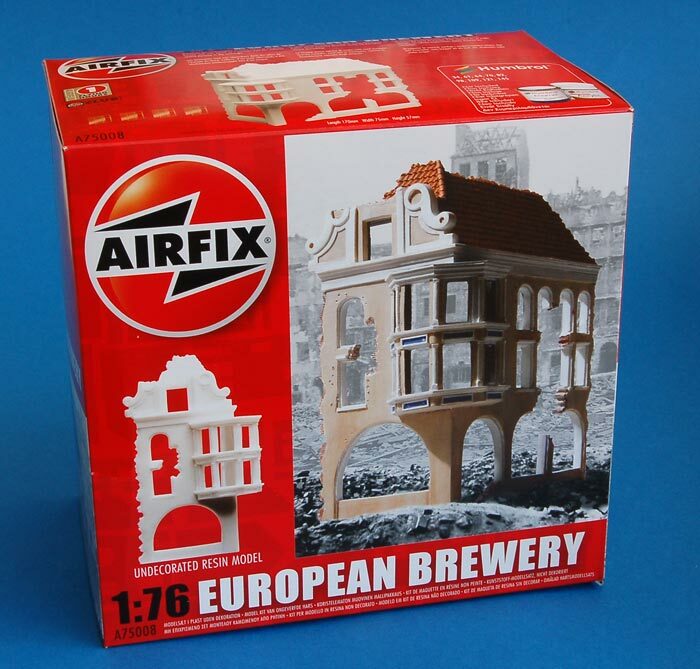 Kit 75008 - Europian brewery. 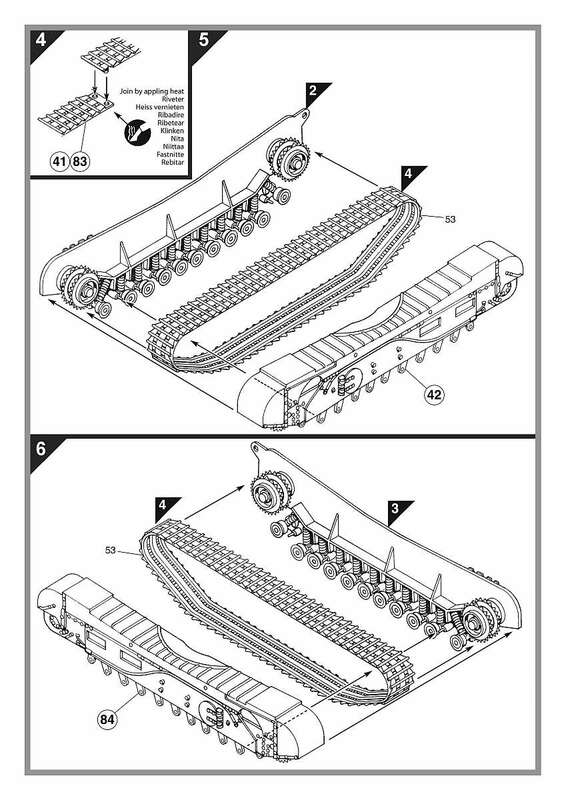 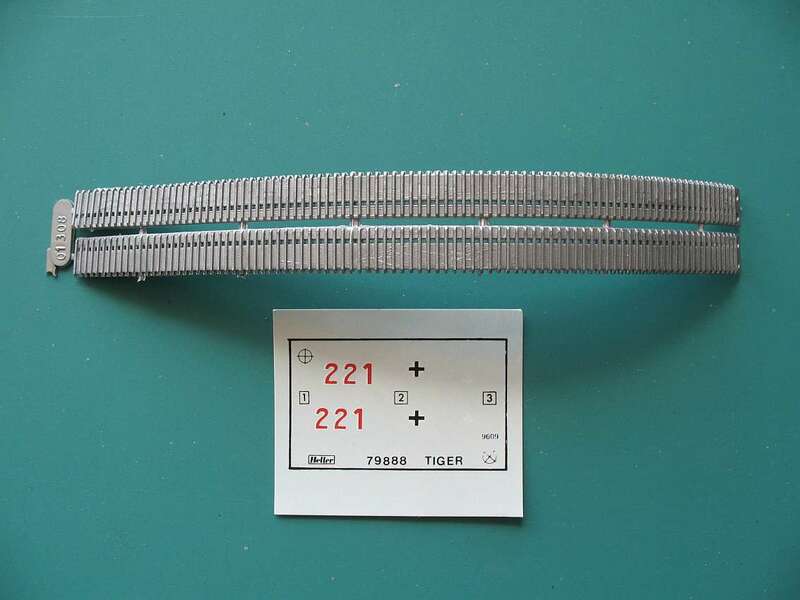 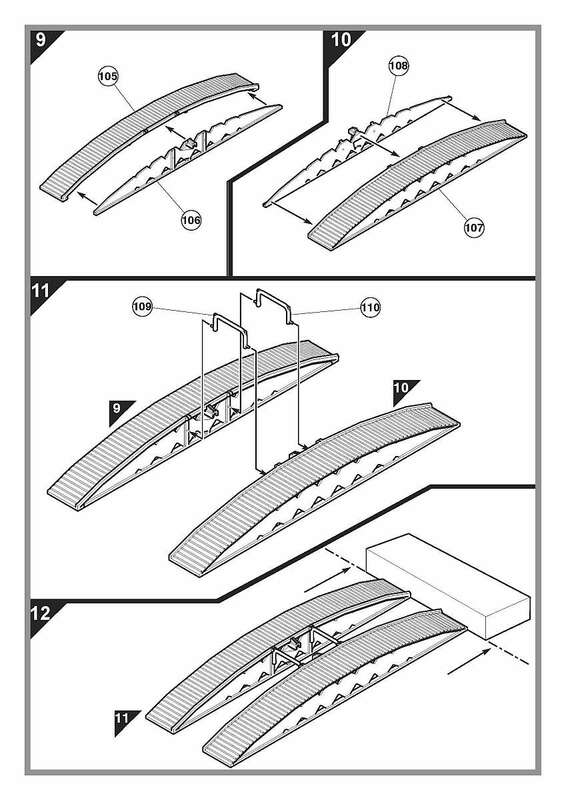 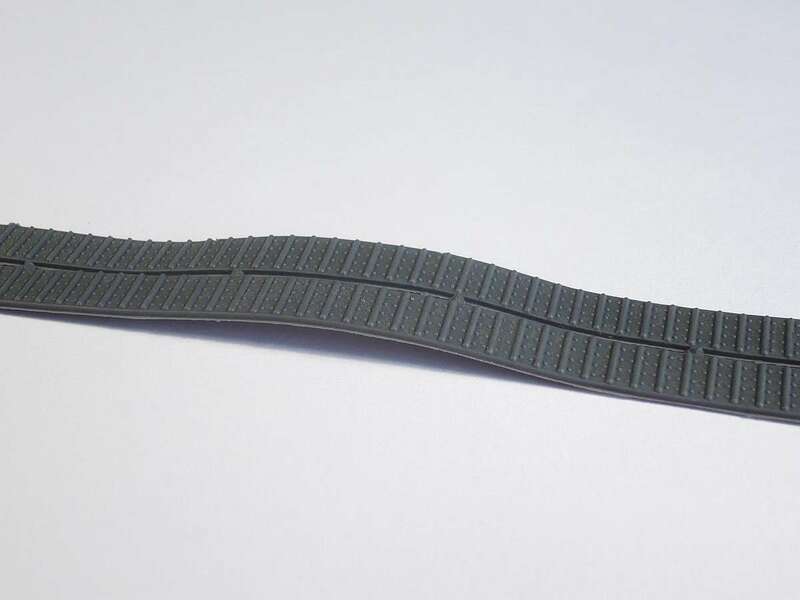 Kit 75011 - narrow road bridge full span. 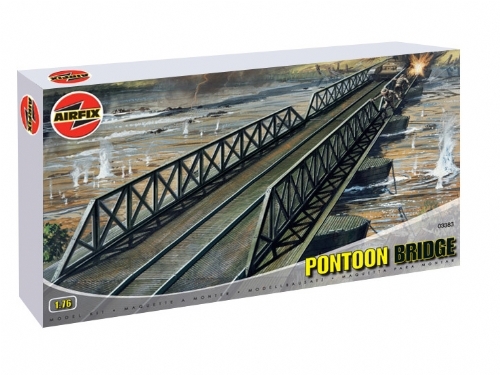 Kit 75012 - nrrow road bridge broken span. 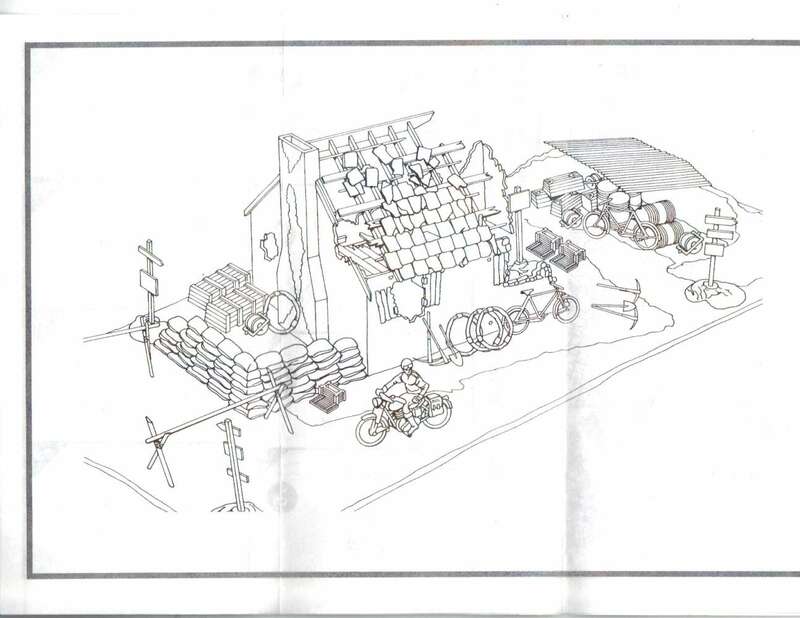 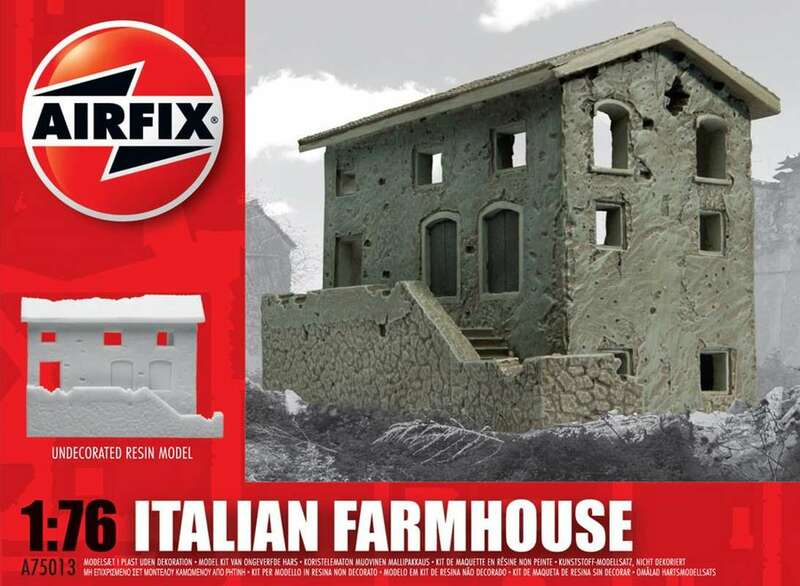 Kit 75013 - Italian farmhouse. 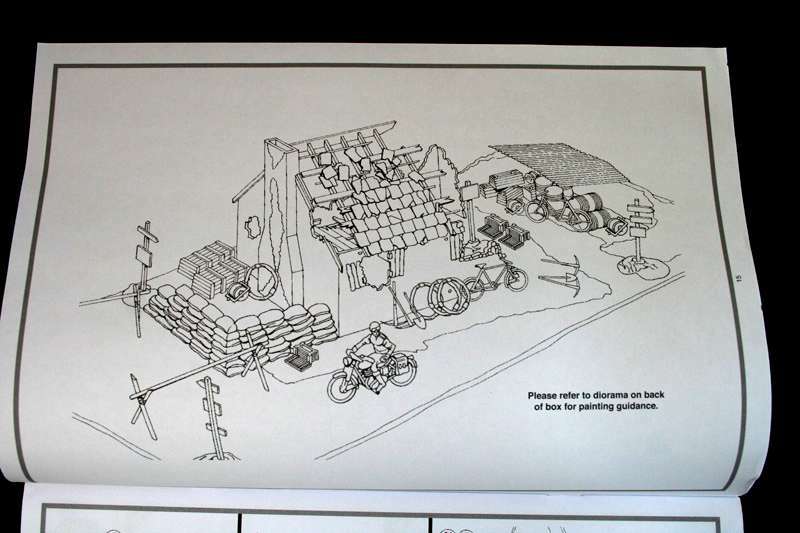 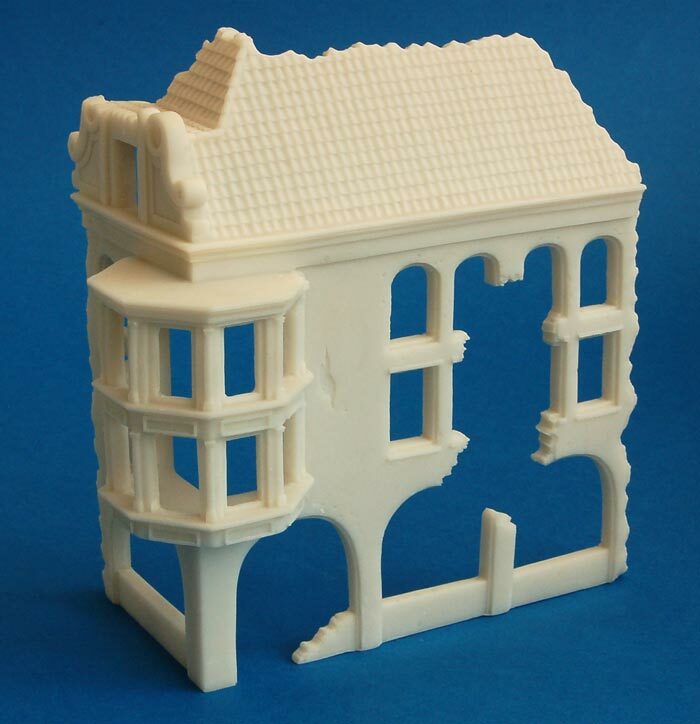 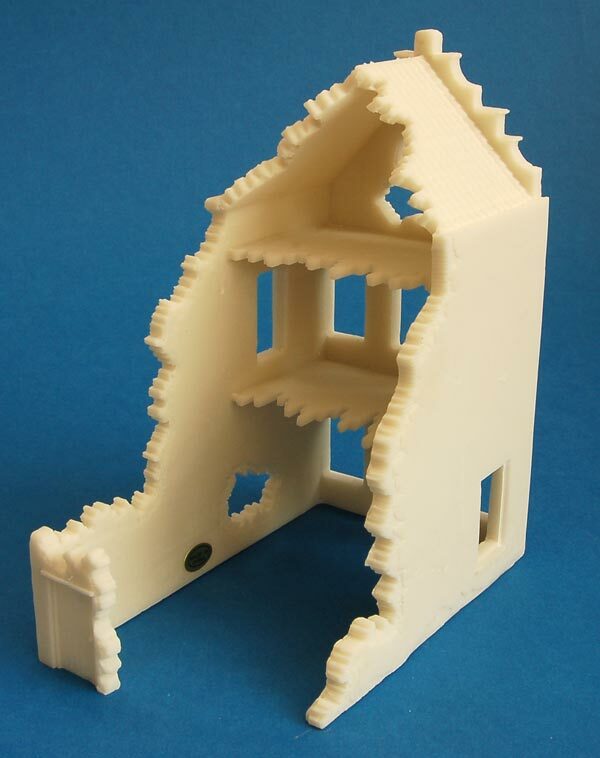 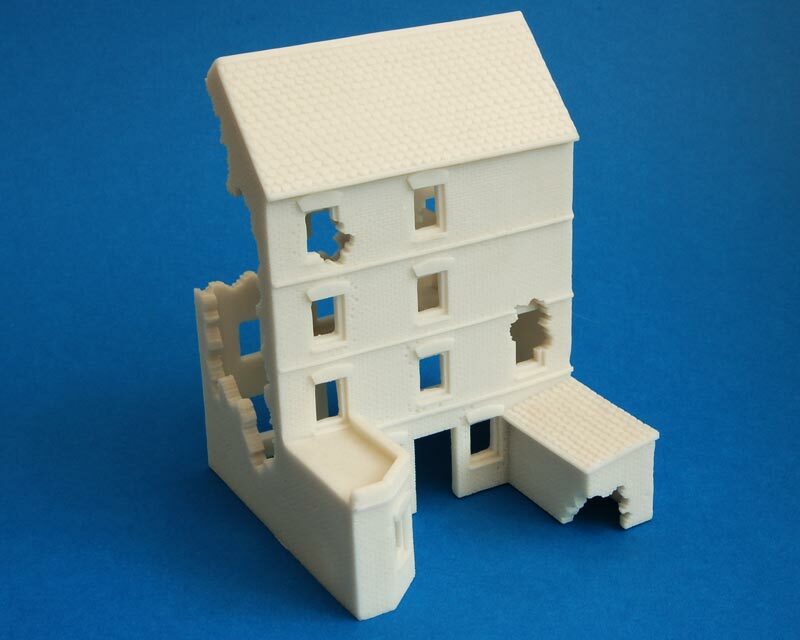 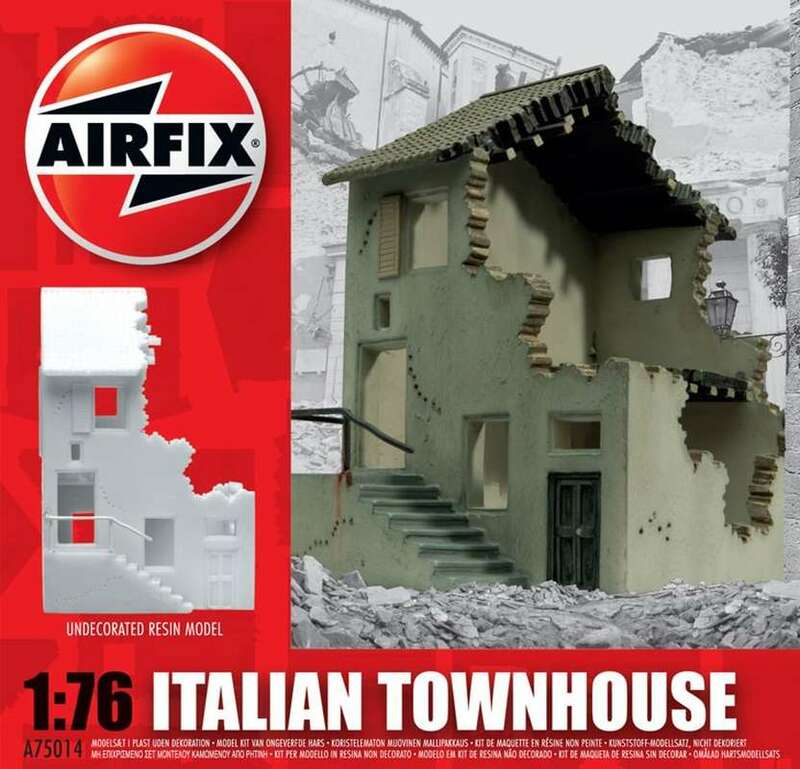 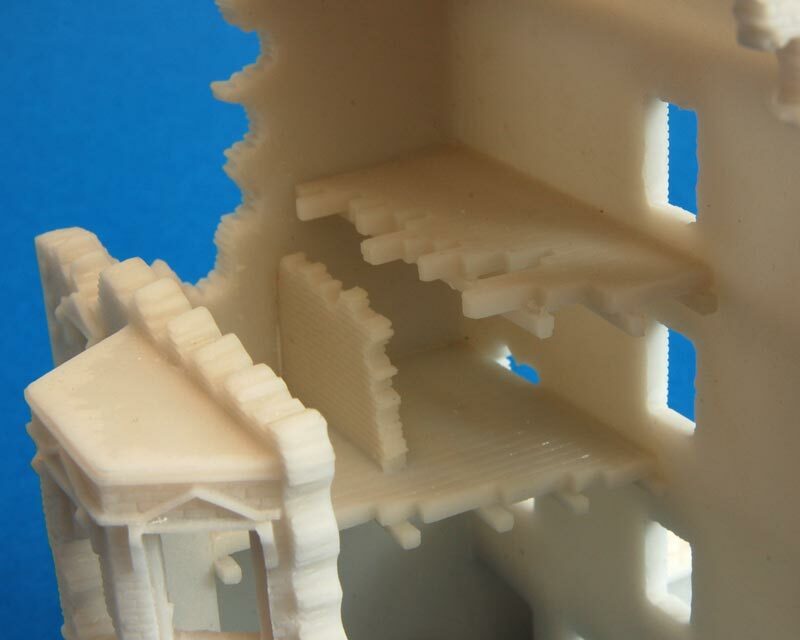 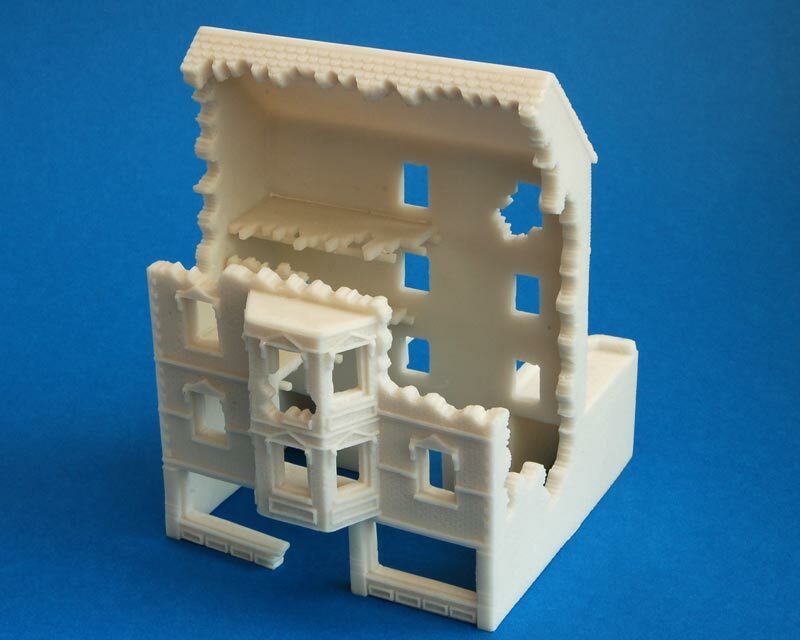 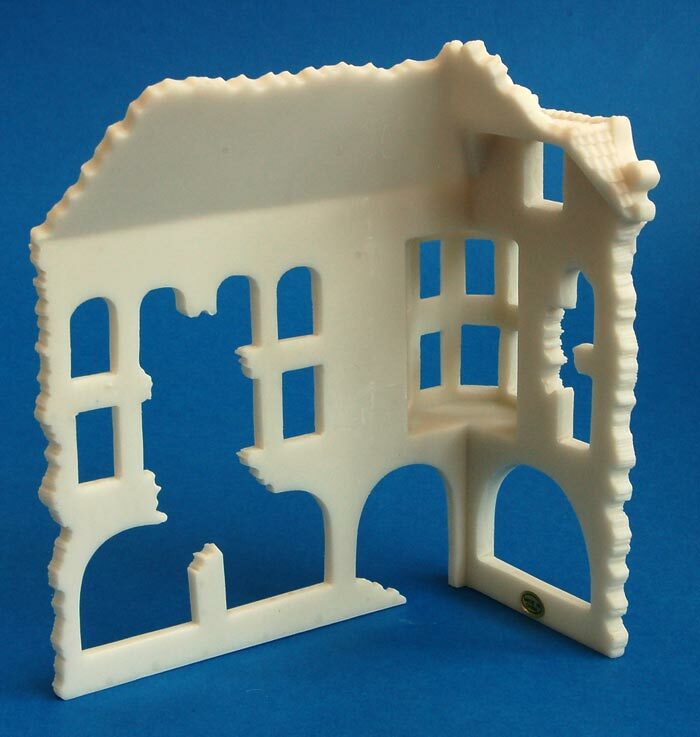 Kit 75014 - Italian townhouse. 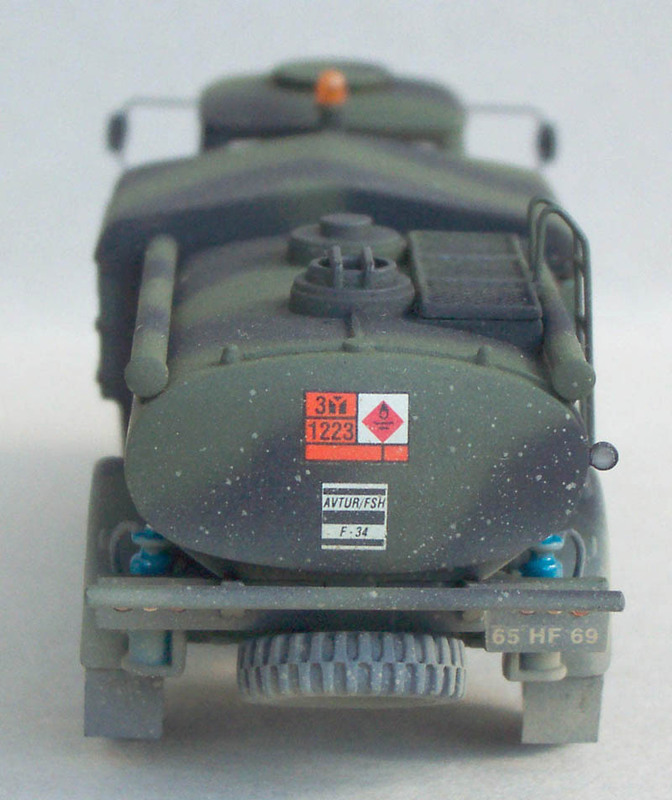 Kit 75015 - Polish bank. 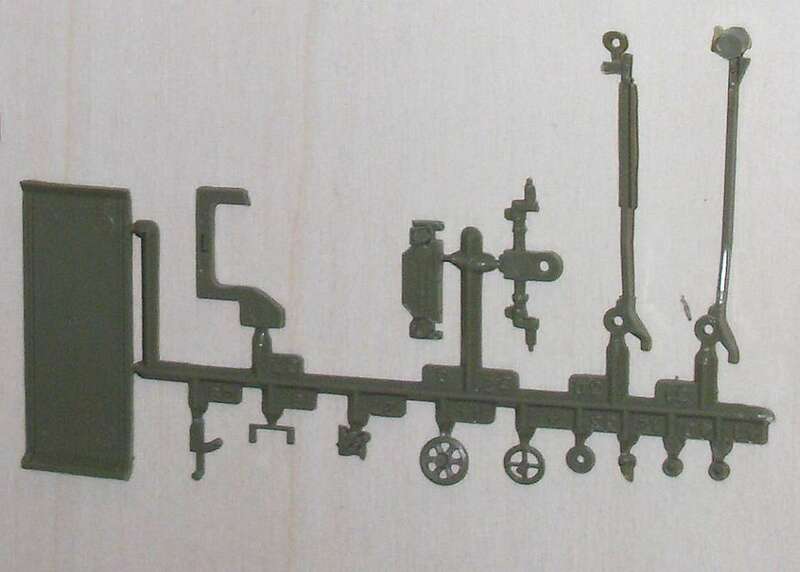 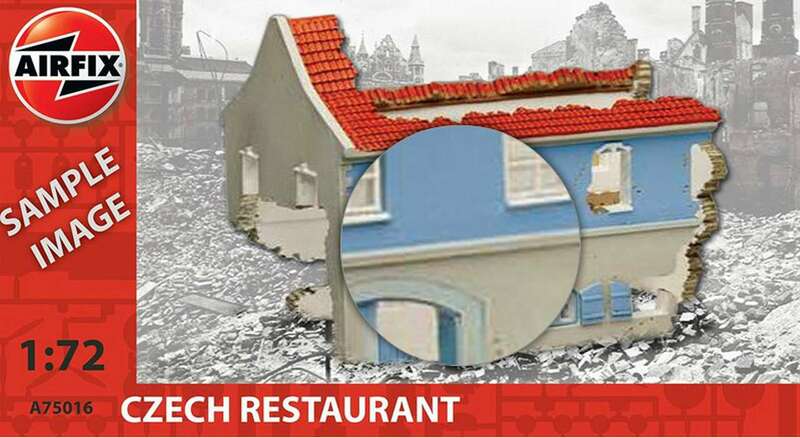 Kit 75016 - Czech restaurant. 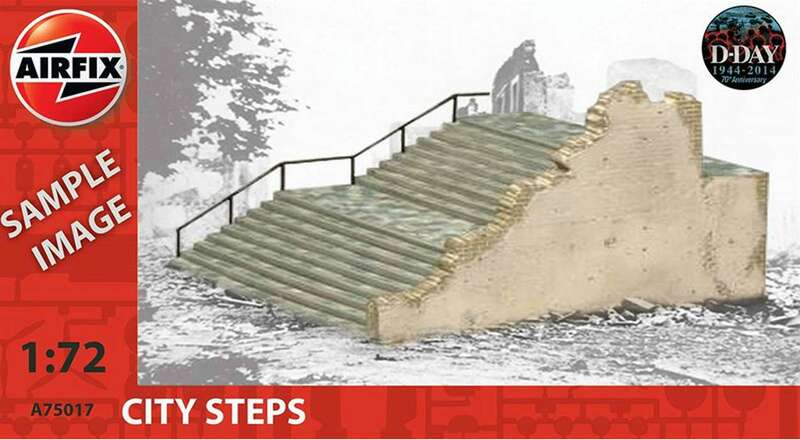 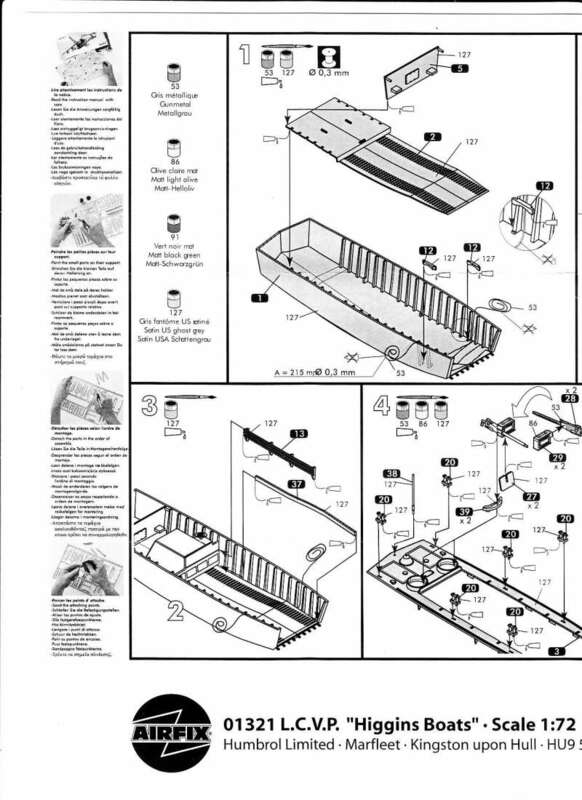 Kit 75017 - city steps. 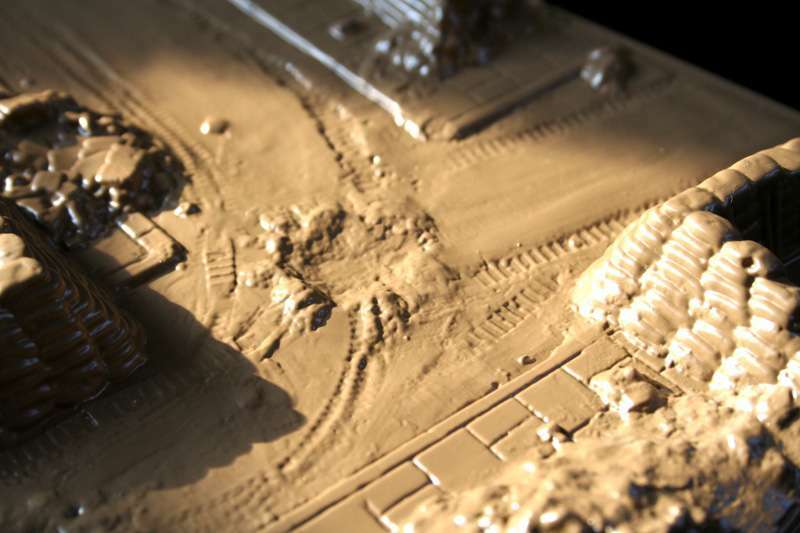 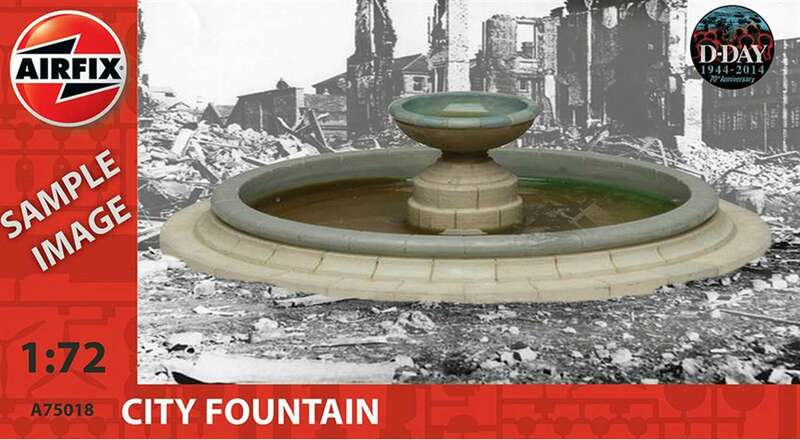 Kit 75018 - city fountain. 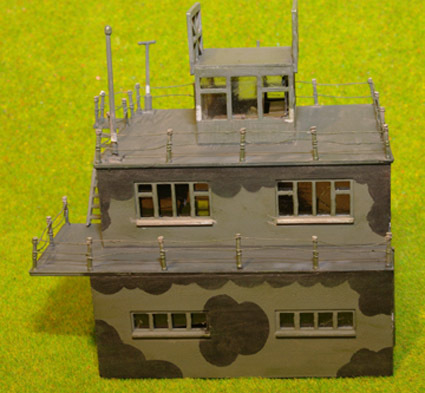 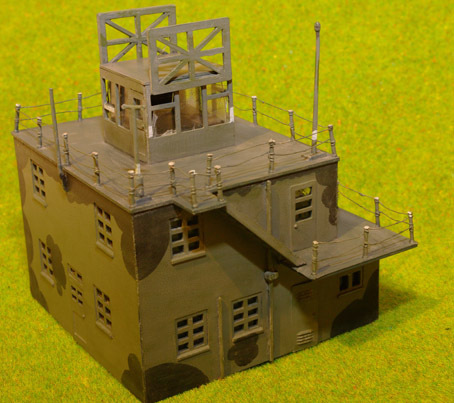 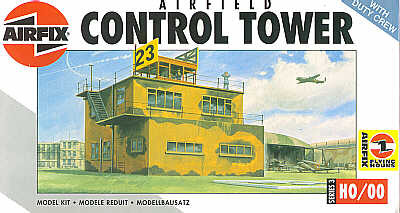 Kit 3380 RAF control tower. 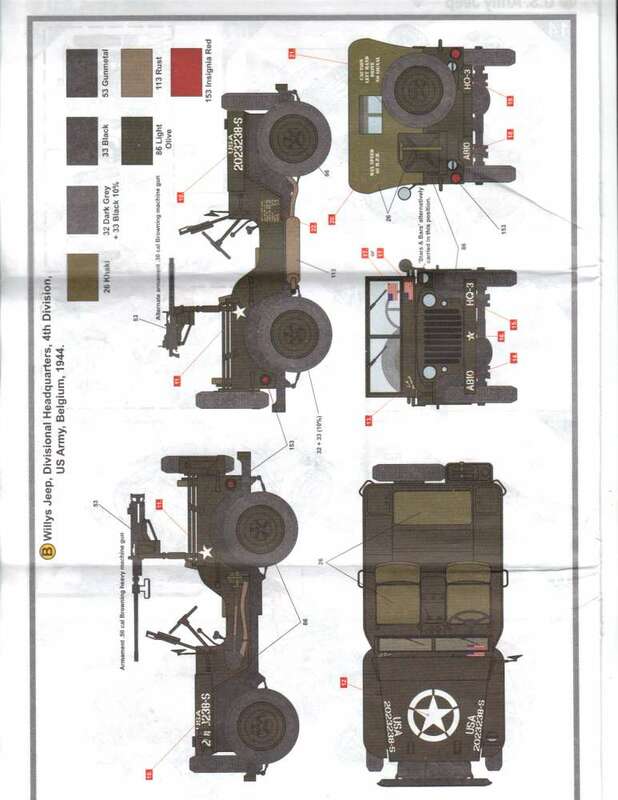 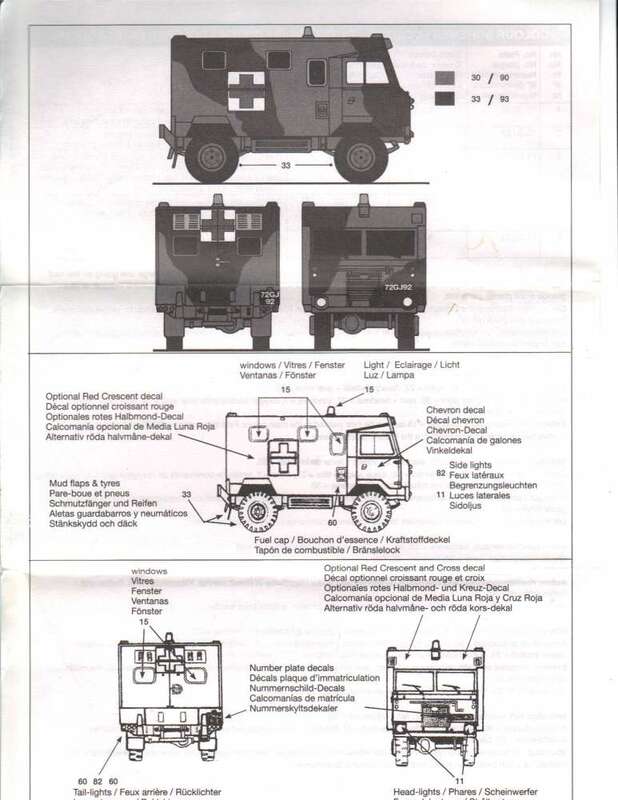 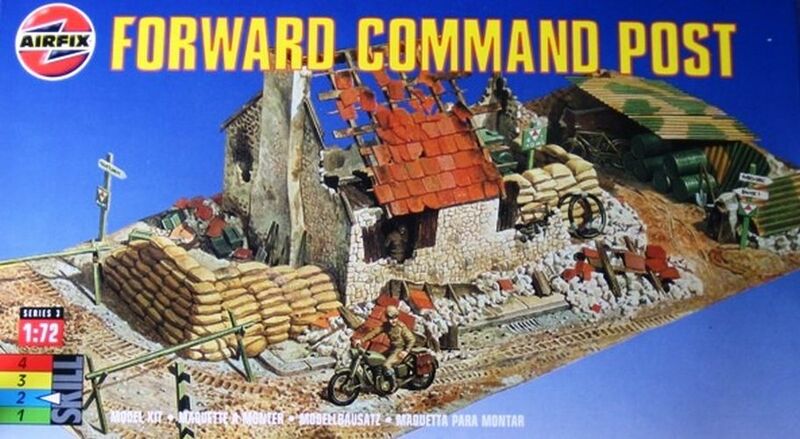 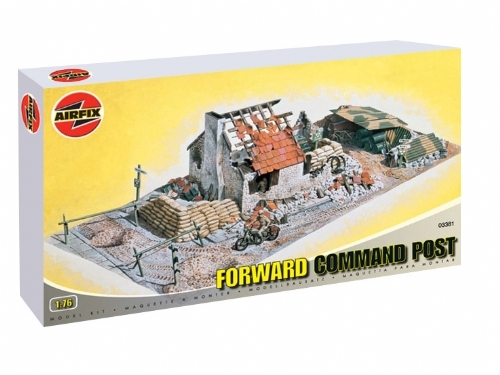 Kit 3381 - Forward command post. 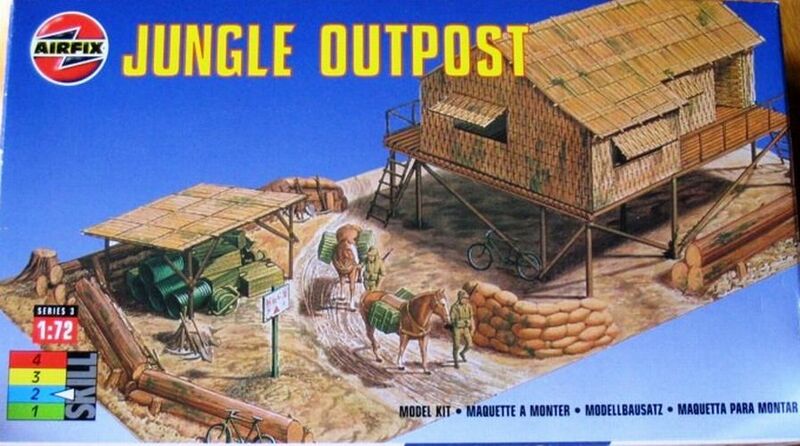 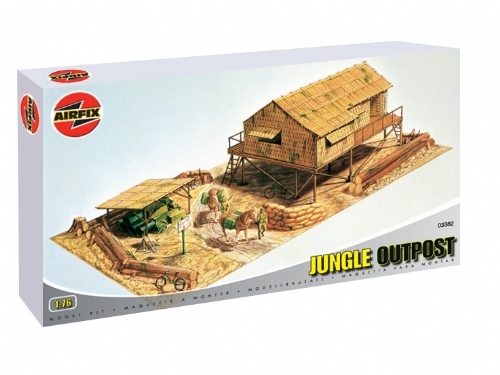 Kit 3382 - jungle outpost - old & new layout. 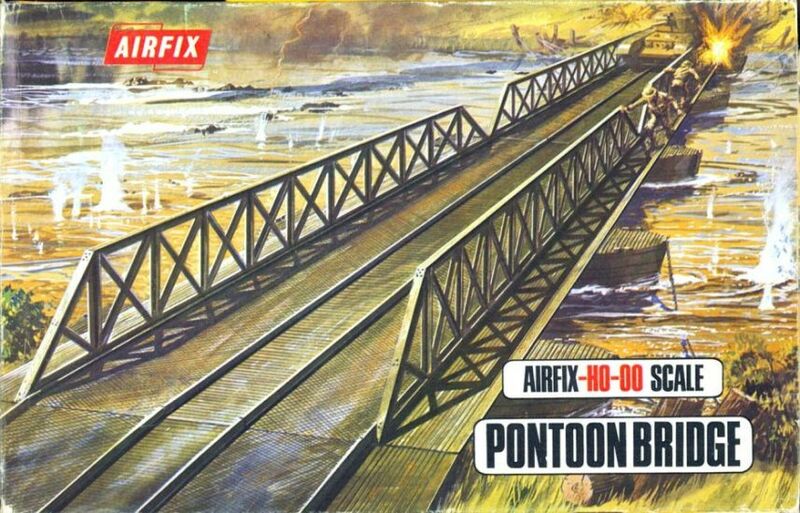 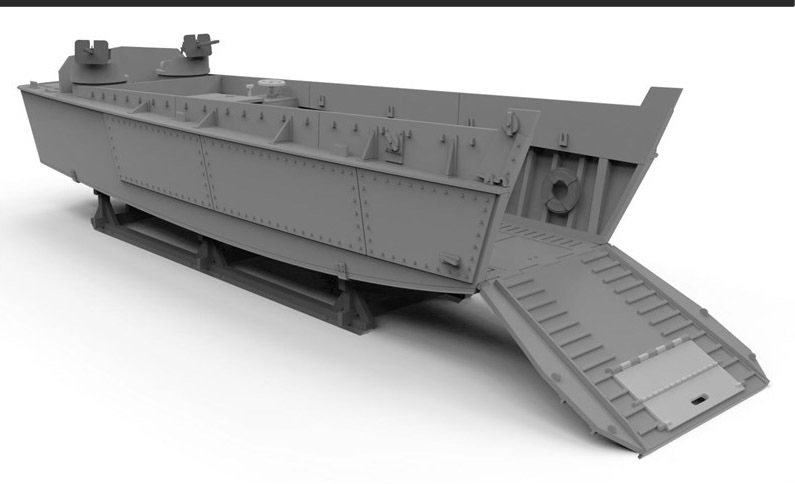 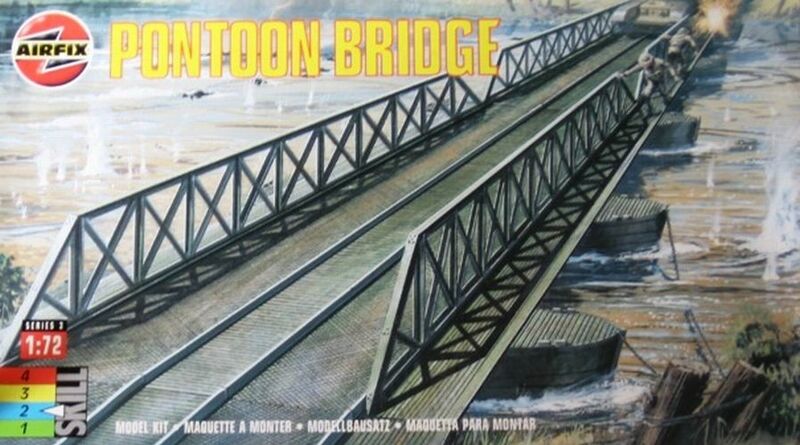 Kit 3383 pontoon bridge - old & new lay-out. 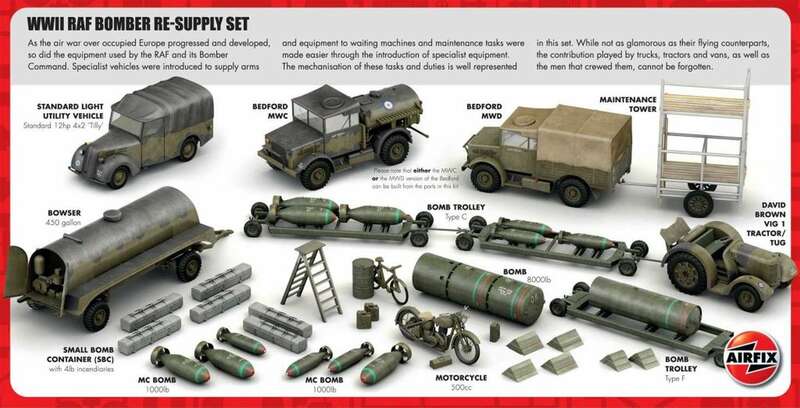 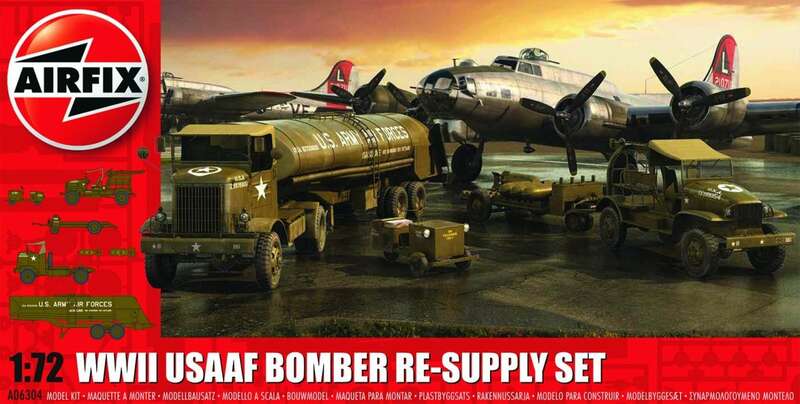 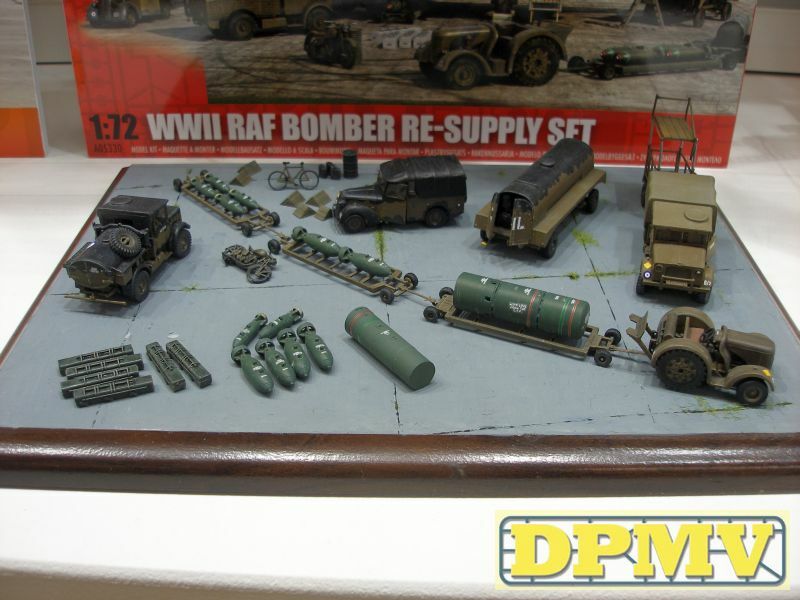 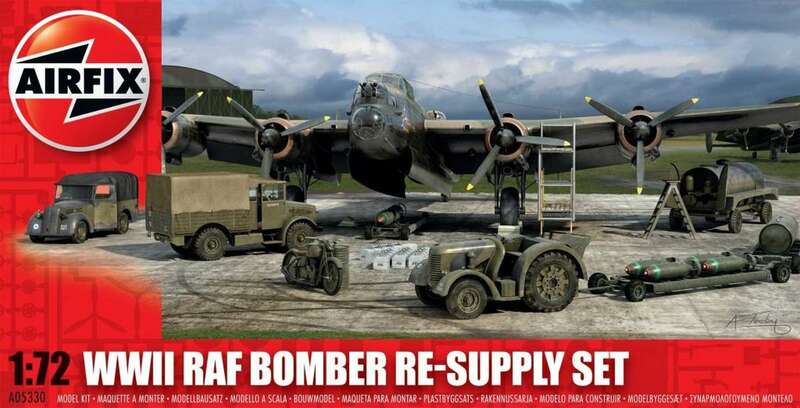 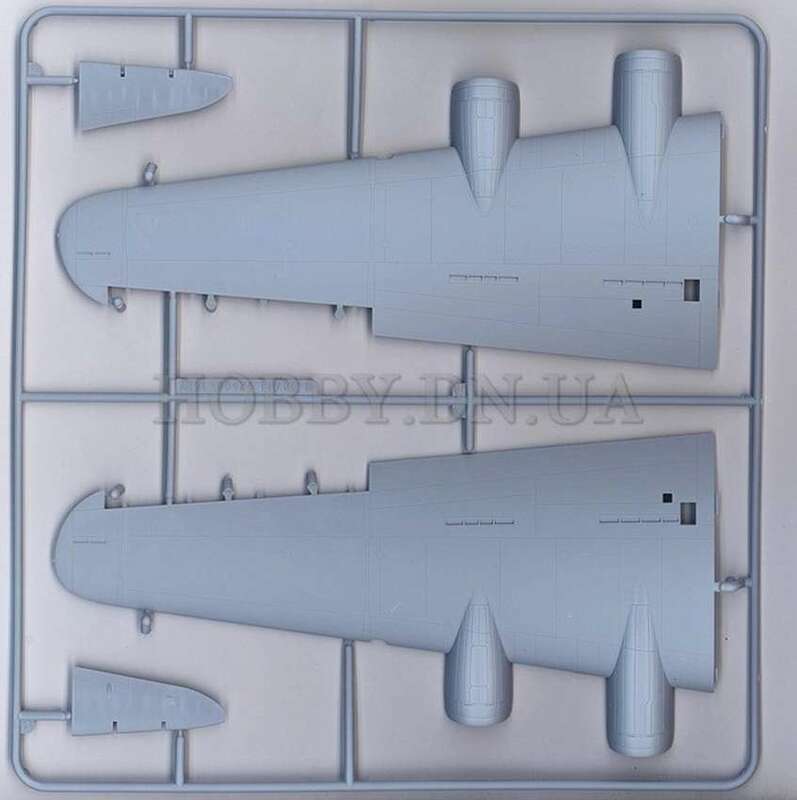 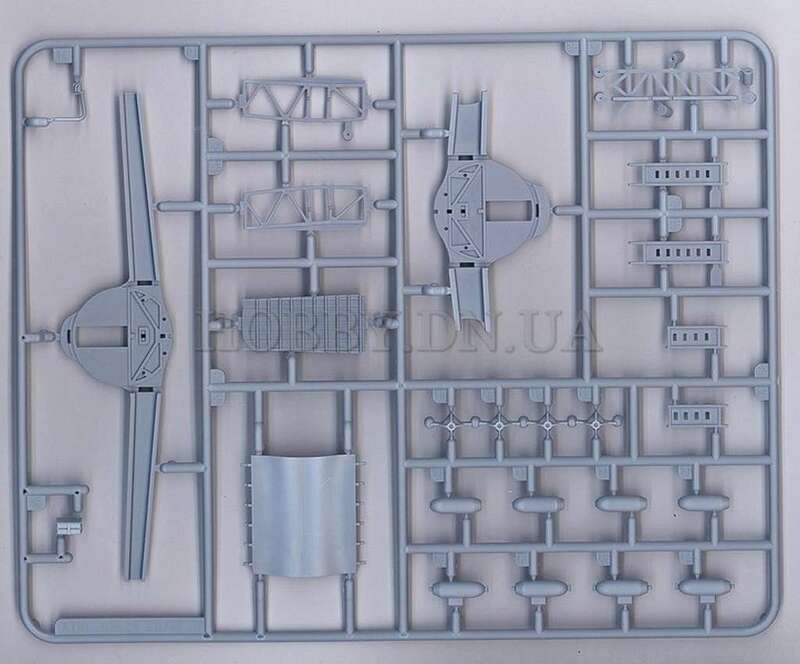 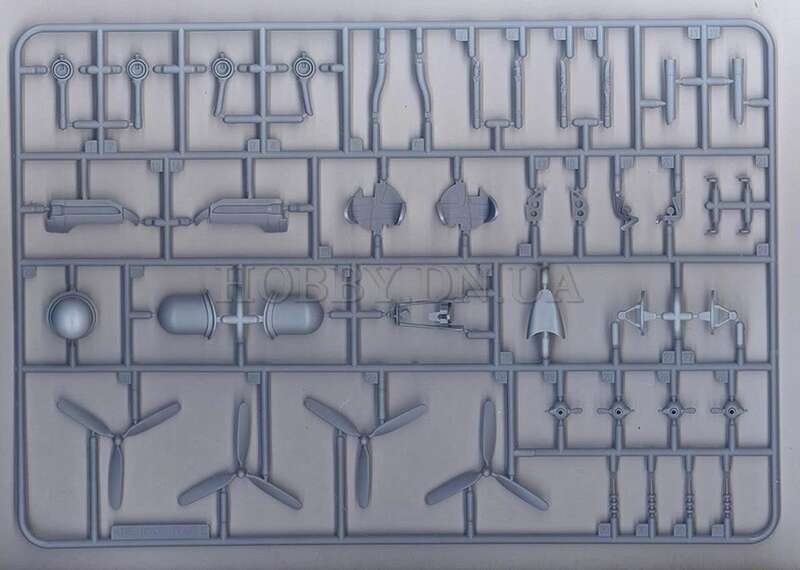 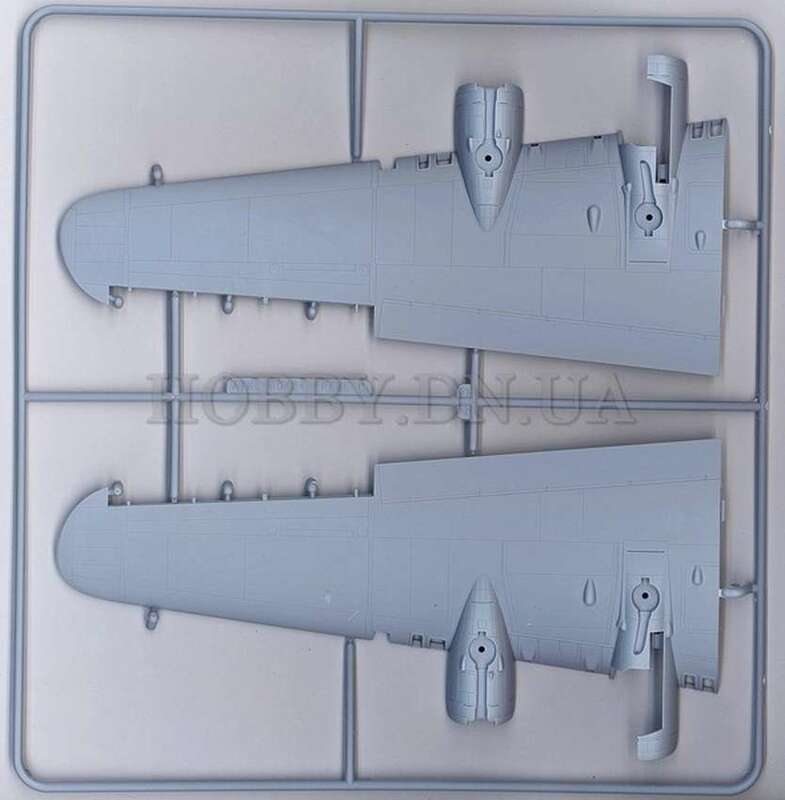 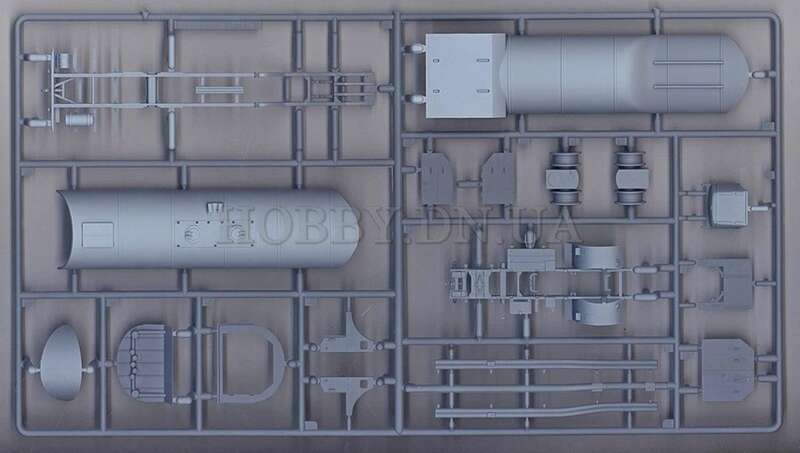 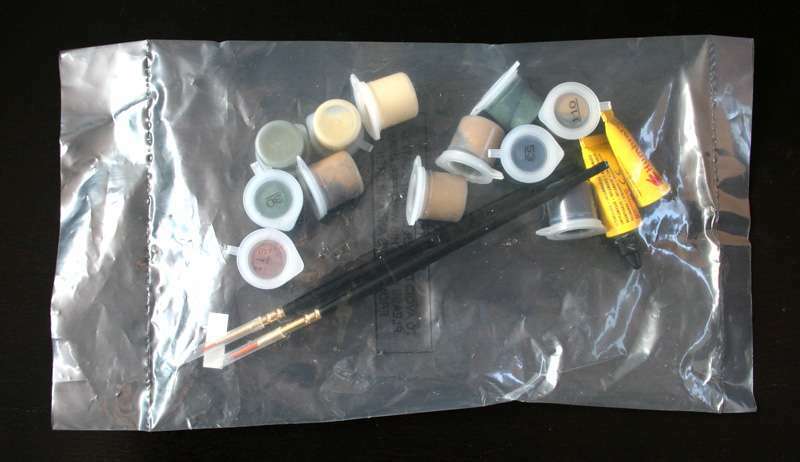 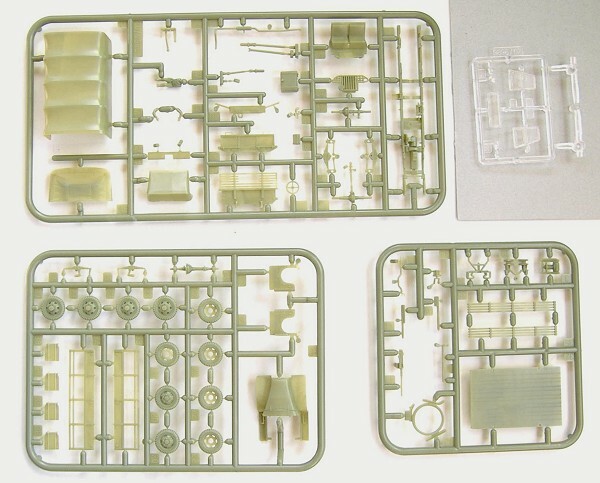 Kit 5330 - WW2 bomber re-supply set. 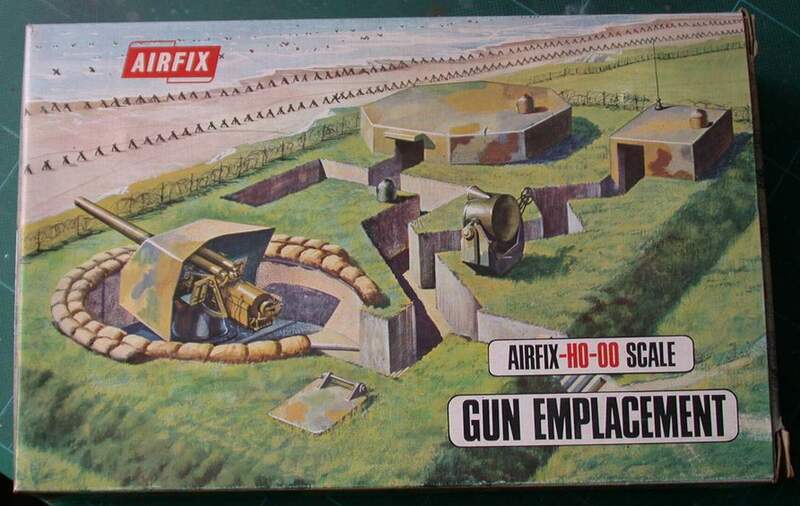 Kit 6704 - gun emplacement. 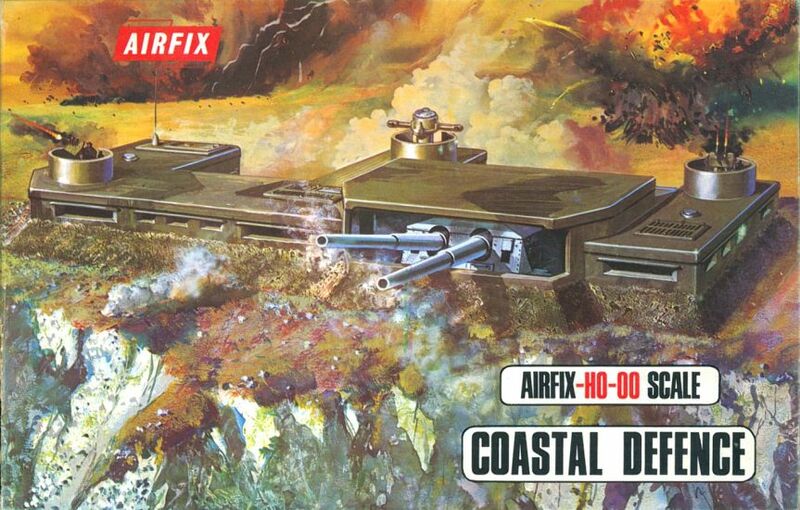 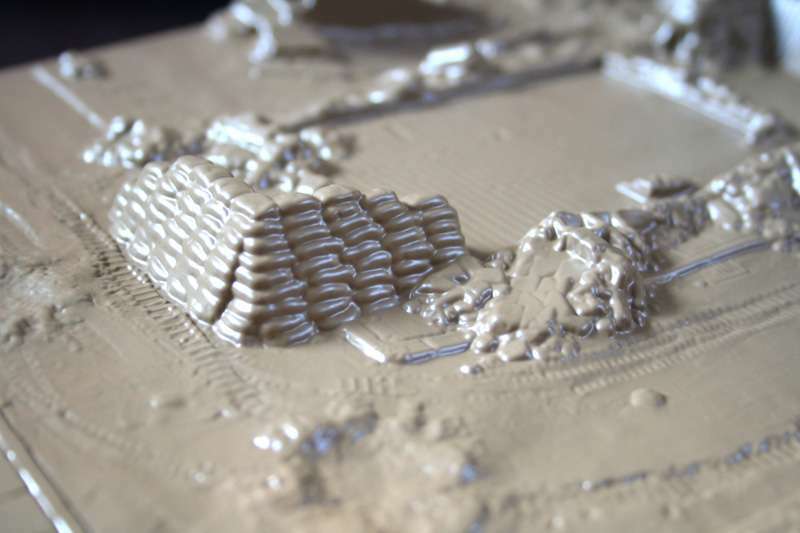 Kit 6706 - coastal defence fort - old & new lay-out. 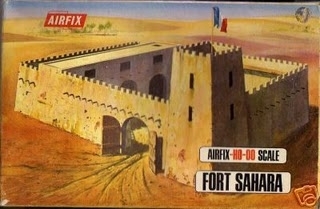 Kit 670x - Fort Saharina. 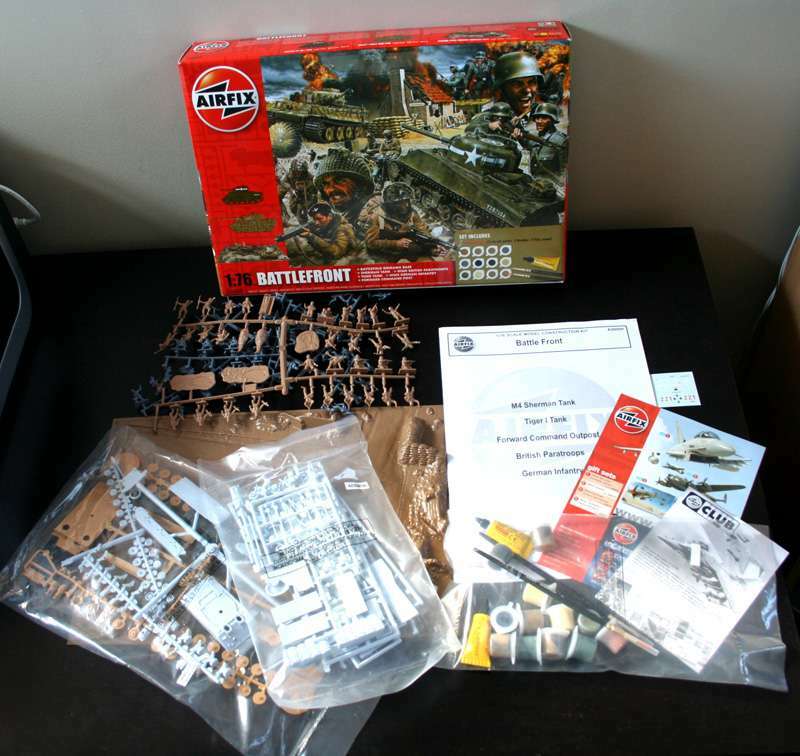 Kit 50009 - battle front. 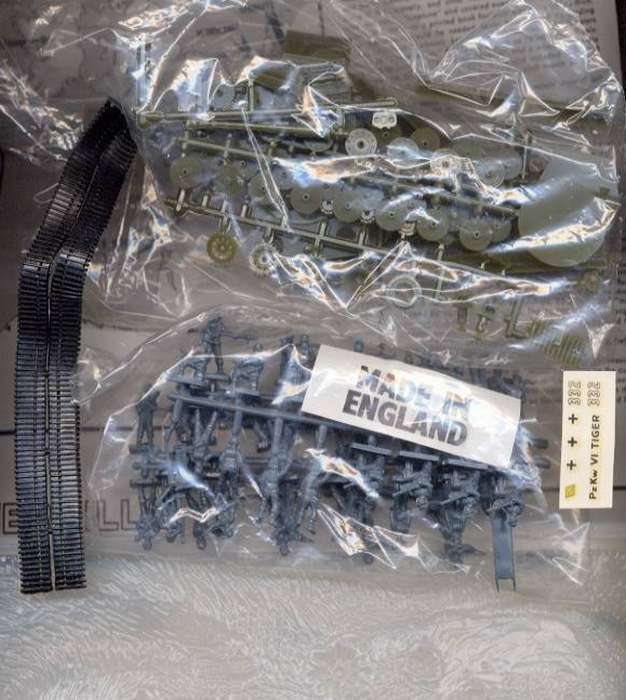 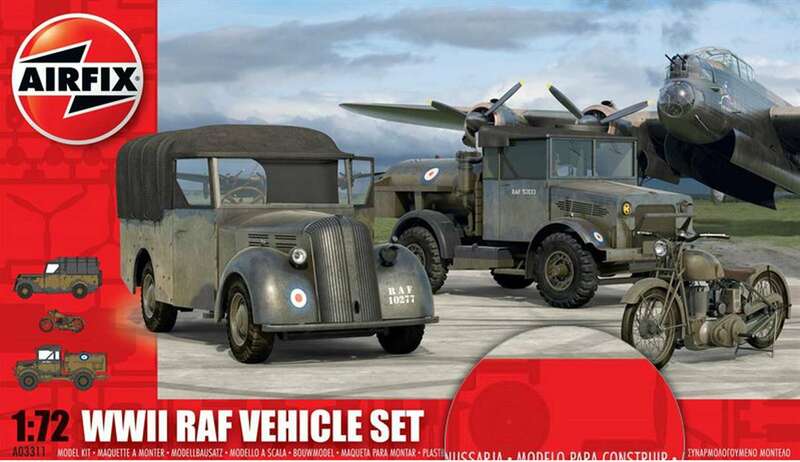 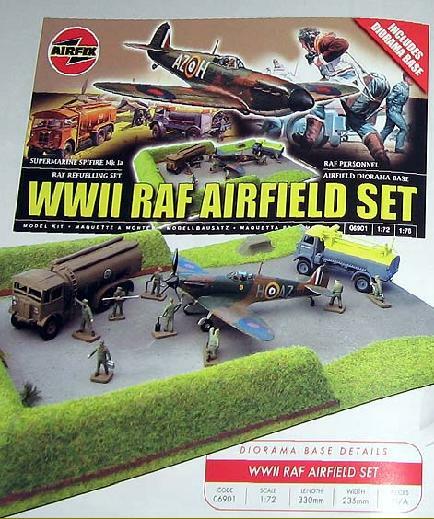 Kit 50015 - RAF battle of Britian set. 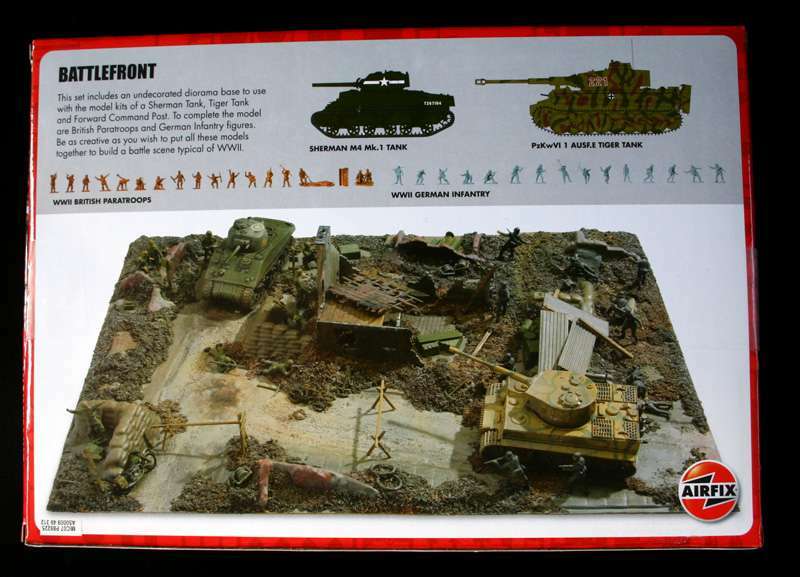 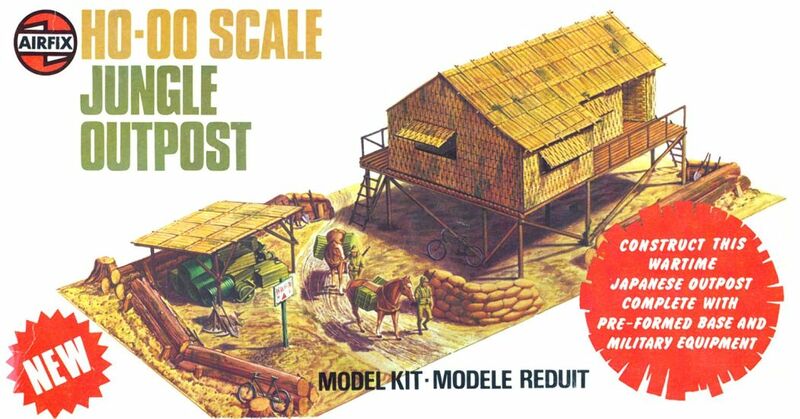 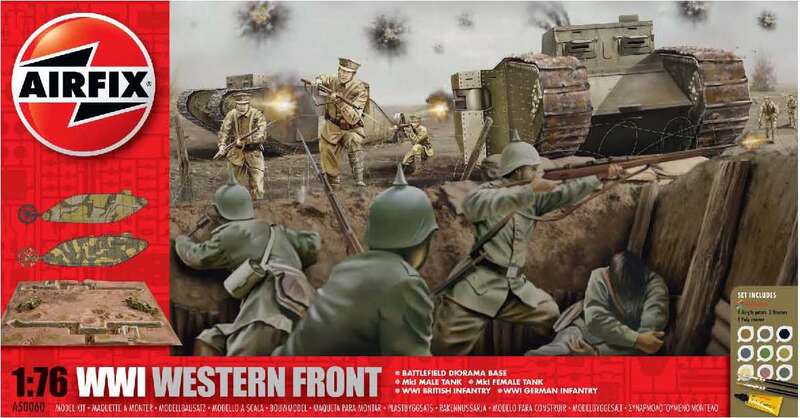 Kit 50060 - WW-I western front diorama. 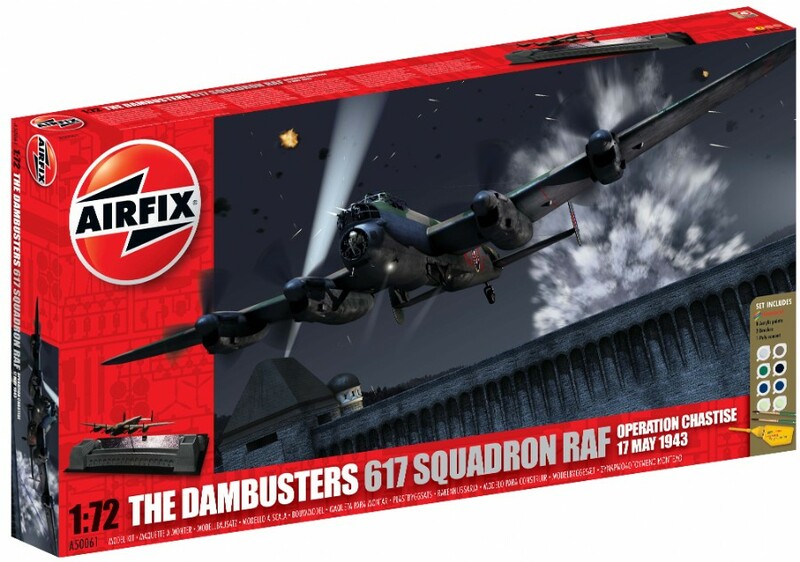 Kit 50061 - The Dambusters - 617 Squadron RAF. 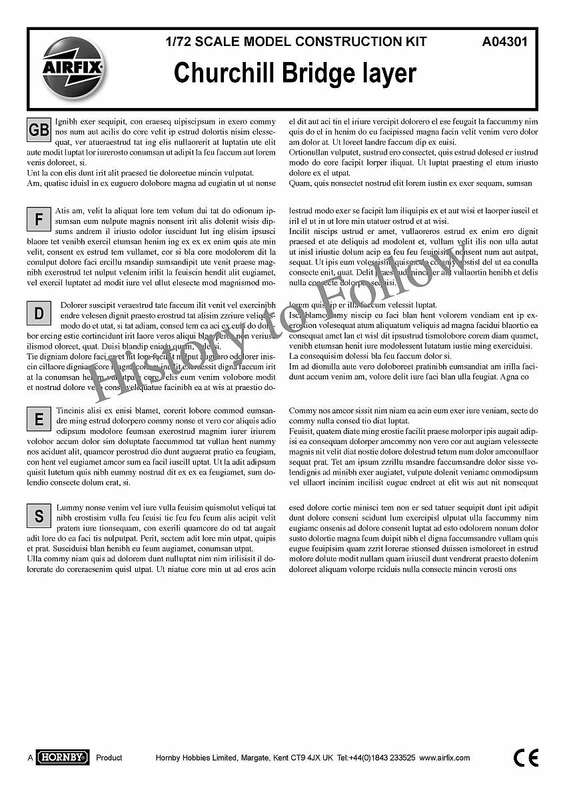 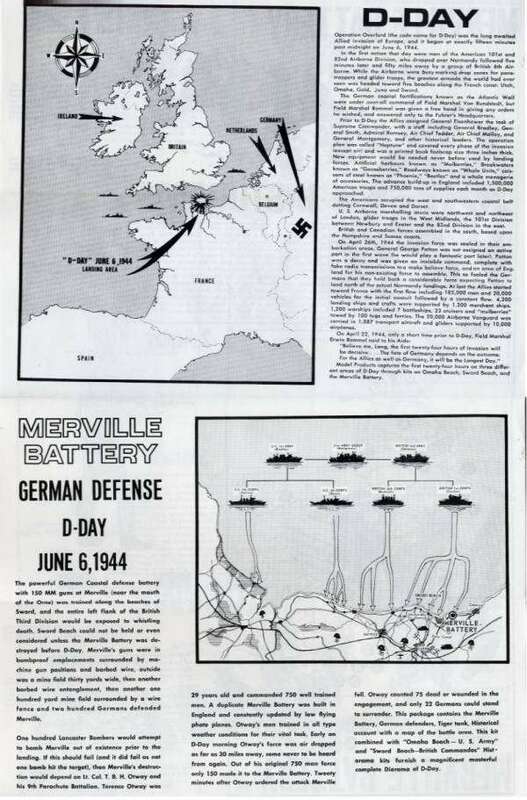 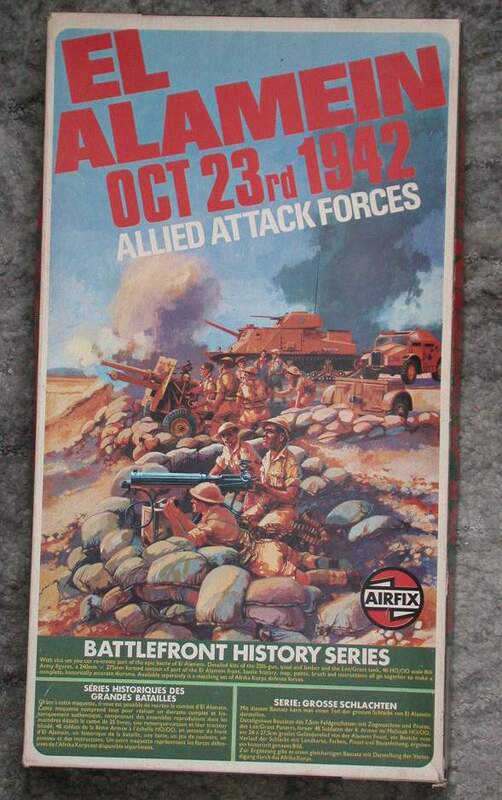 Battle front history series. 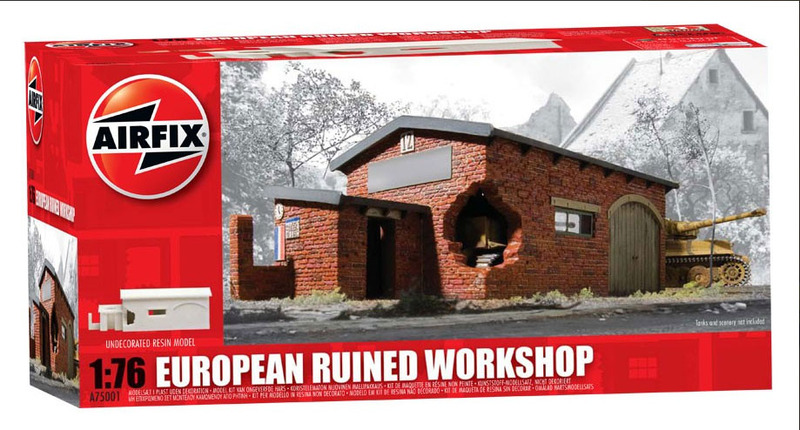 - Out of production. 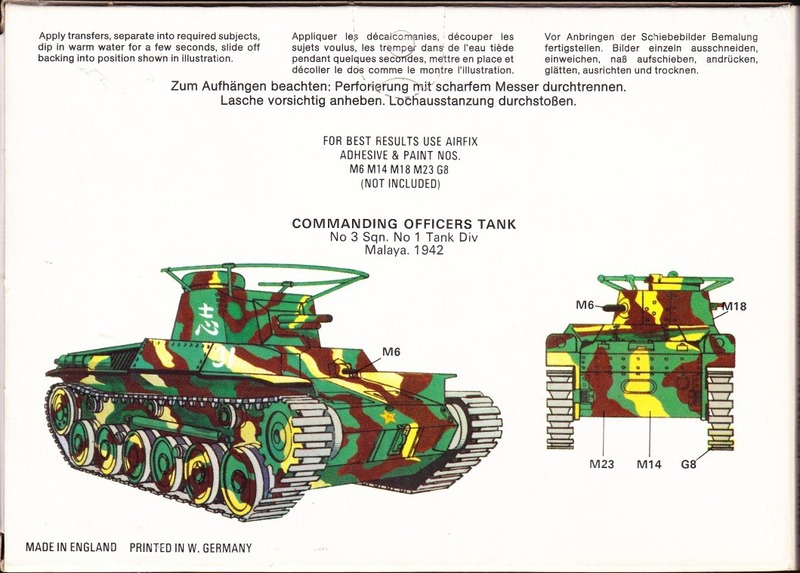 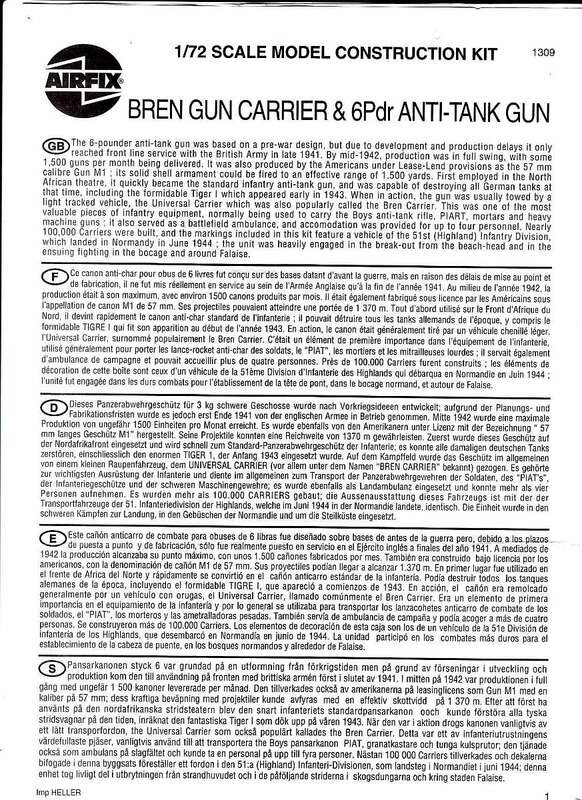 Kit D1 (09654-9) or (40651-0) - 'D-Day' Allied atack forces. 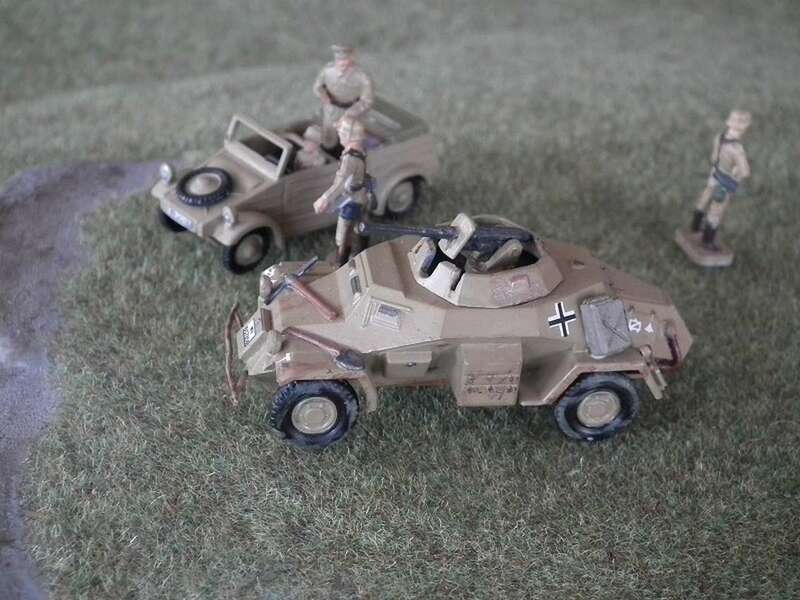 Kit D2 (09652-2) or (40652-3) - 'D-Day' German defence forces. 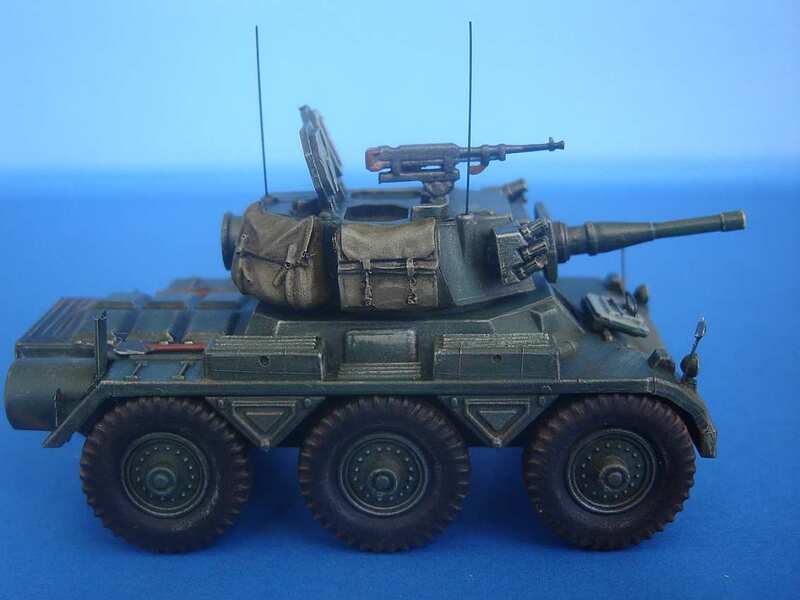 Kit G1 (09657-7) or (40657-8) - 'Guadalcanal' US Marine assault forces. 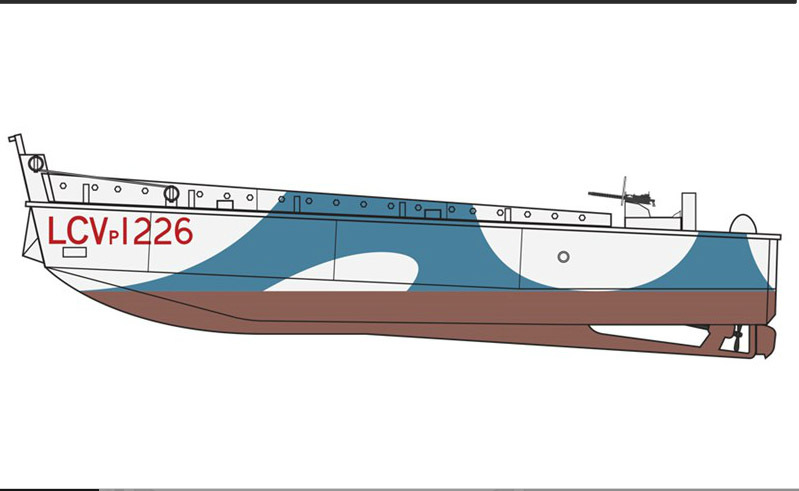 Kit G2 (09658-0) or (40658-1) - 'Guadalcanal' Japanese defence forces. 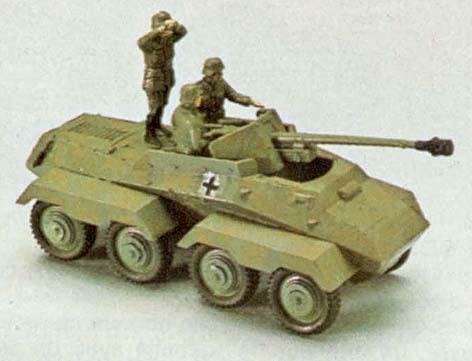 Kit E2 (09654-8) or (40654-5) - 'El-Alamein' German defence forces. 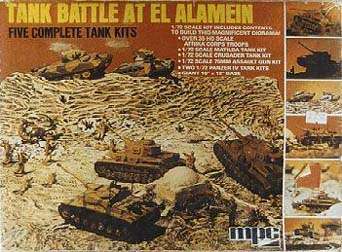 Kit E1 (09653-5) or (40653-6) - 'El-Alamein' Allied atack forces. 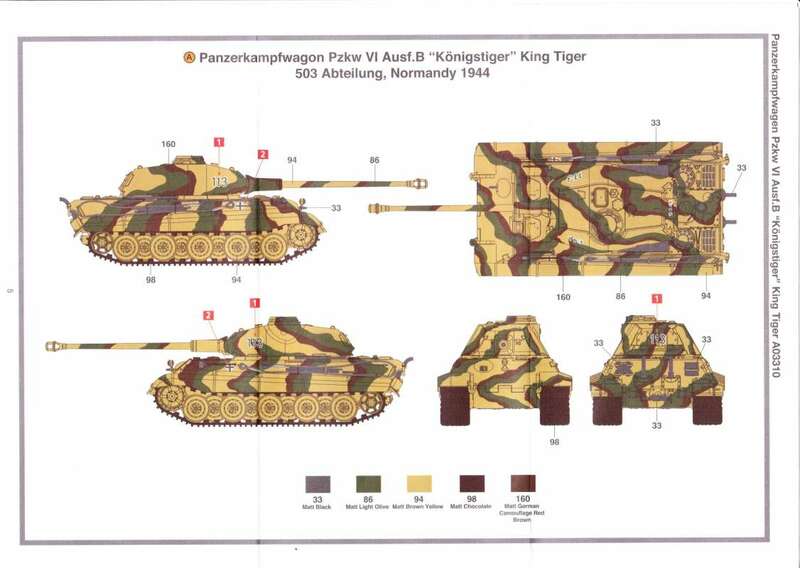 Kit S1 (09655-1) or (40655-2) - 'Stalingrad' German attack forces. 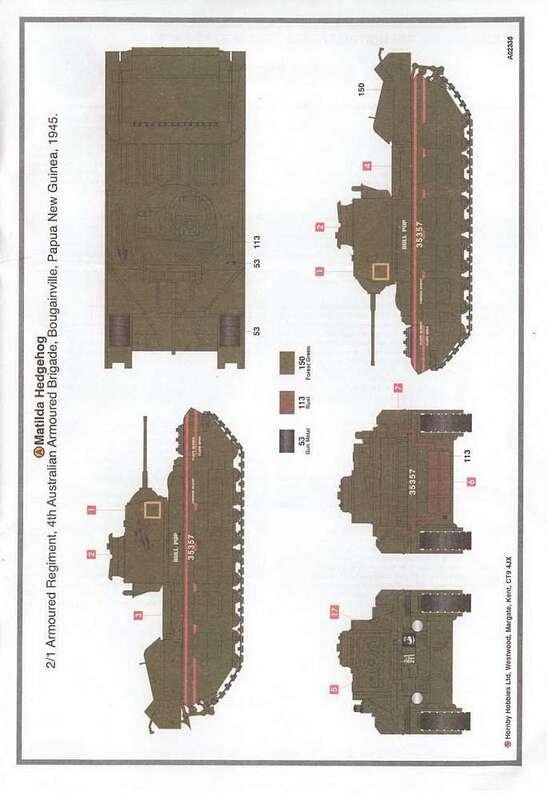 Kit S1 (09656-4) or (40656-5) - 'Stalingrad' Russian defence forces. 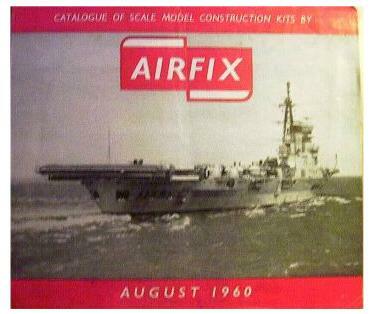 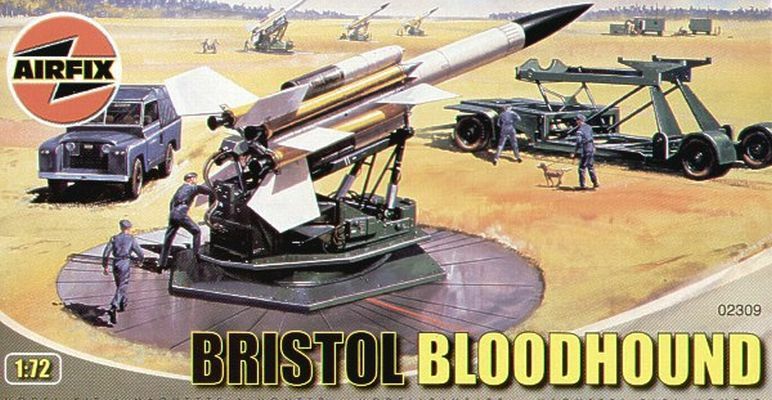 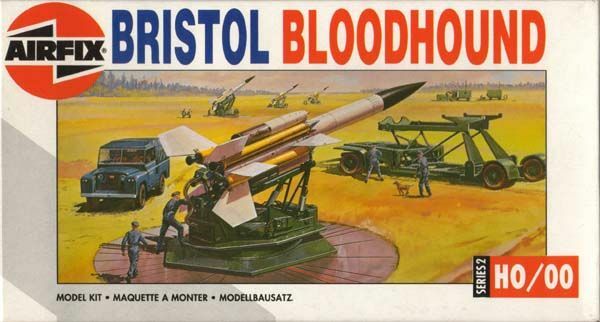 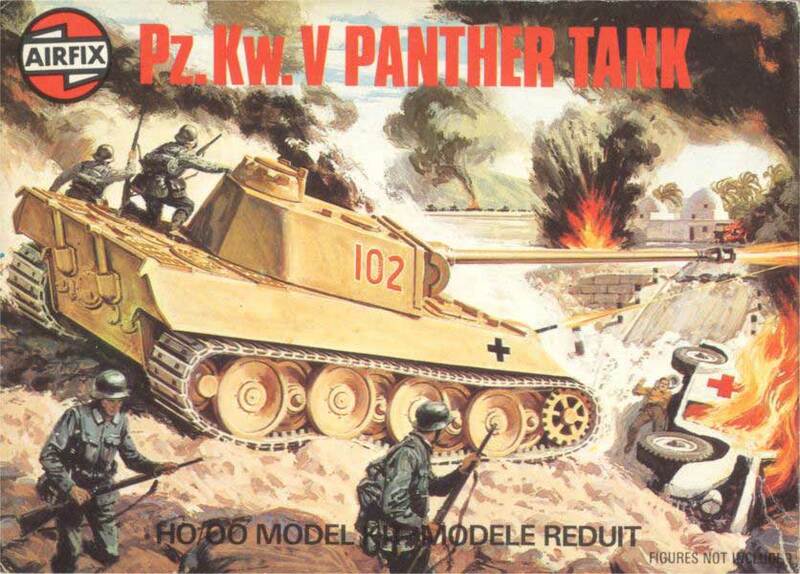 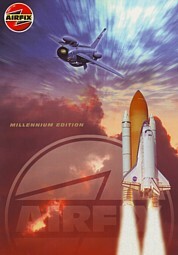 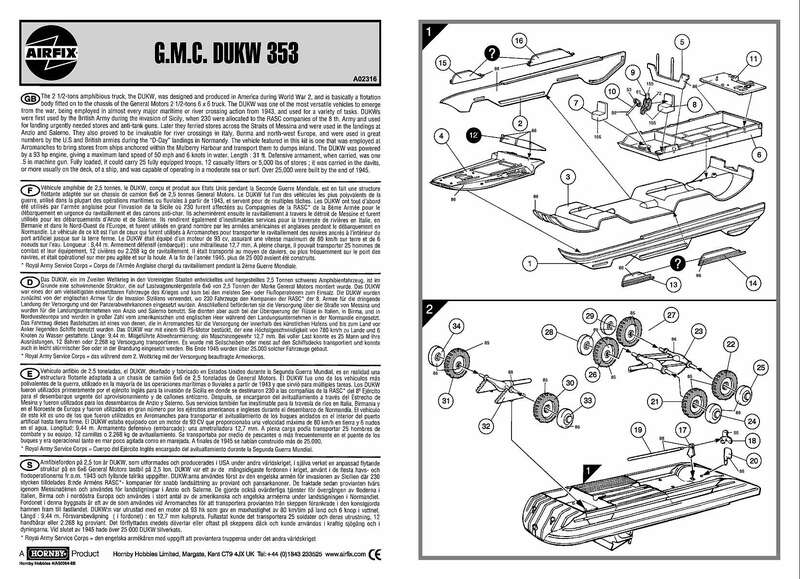 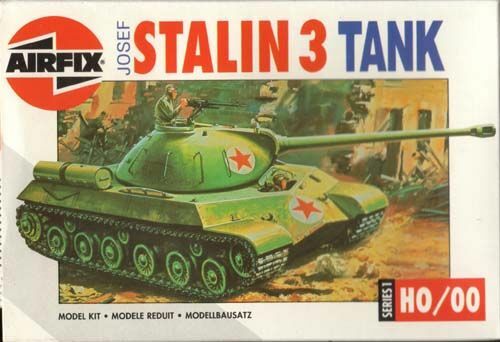 Note August 2011: These 3 kits are no longer available from the Airfix label, but only from the Heller label. 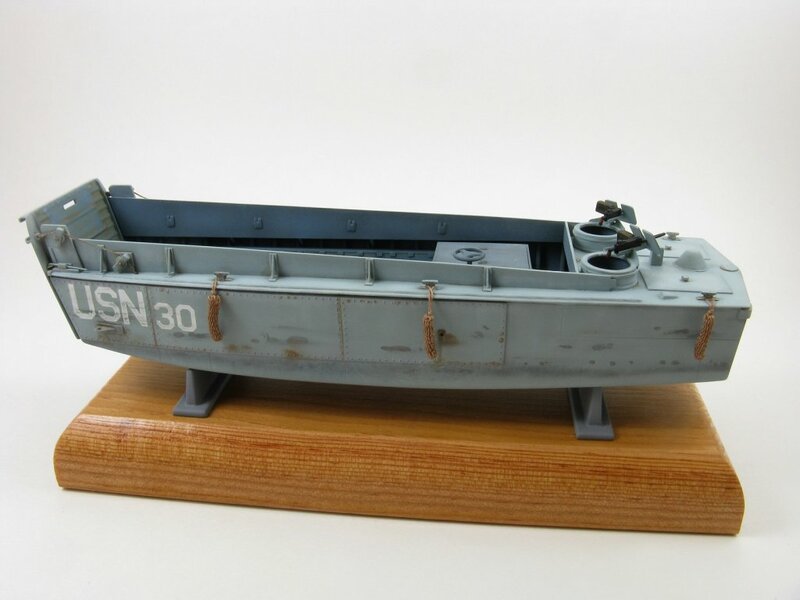 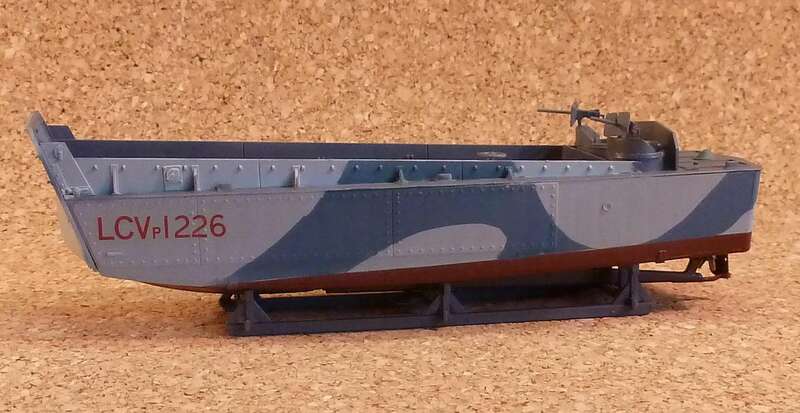 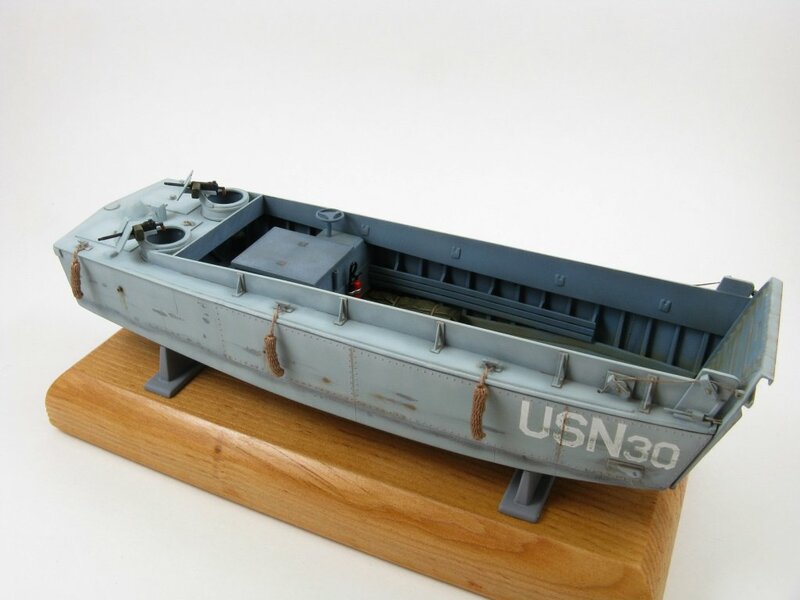 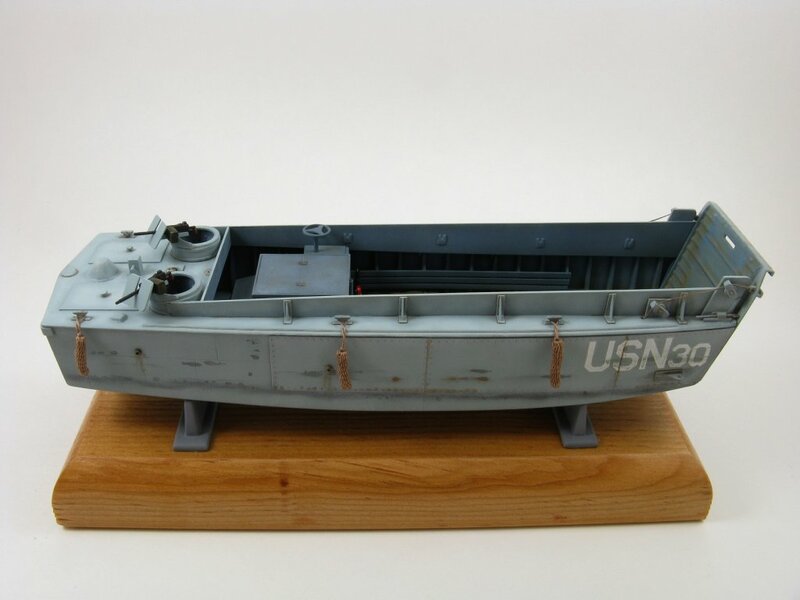 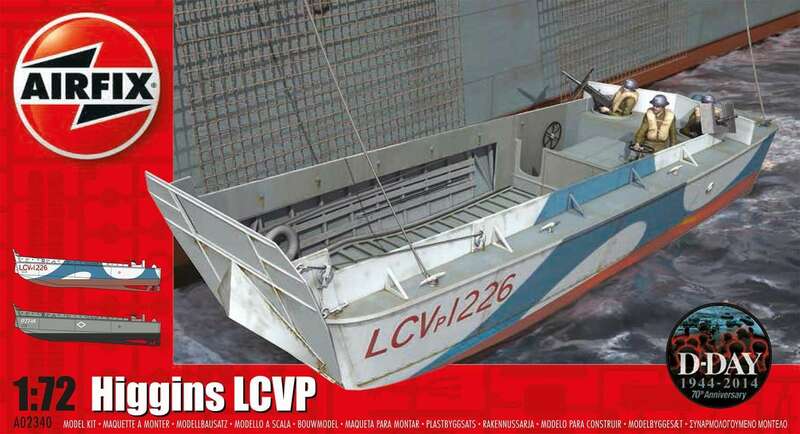 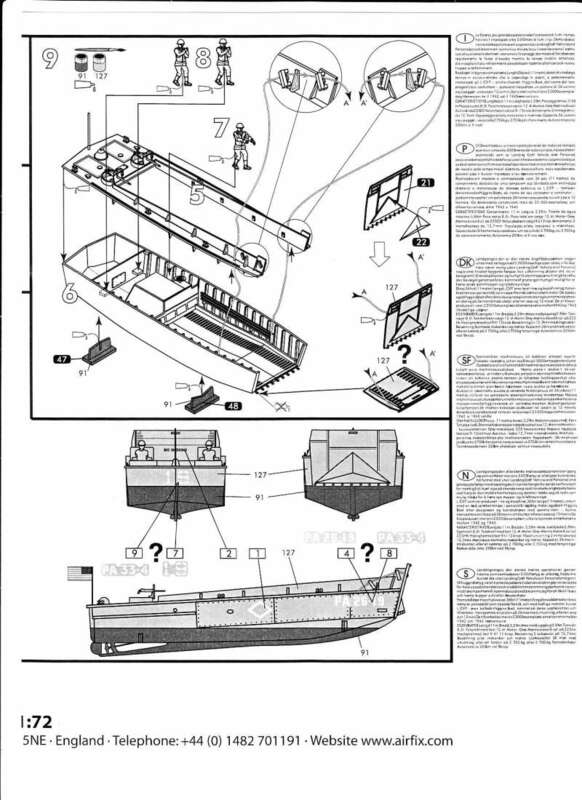 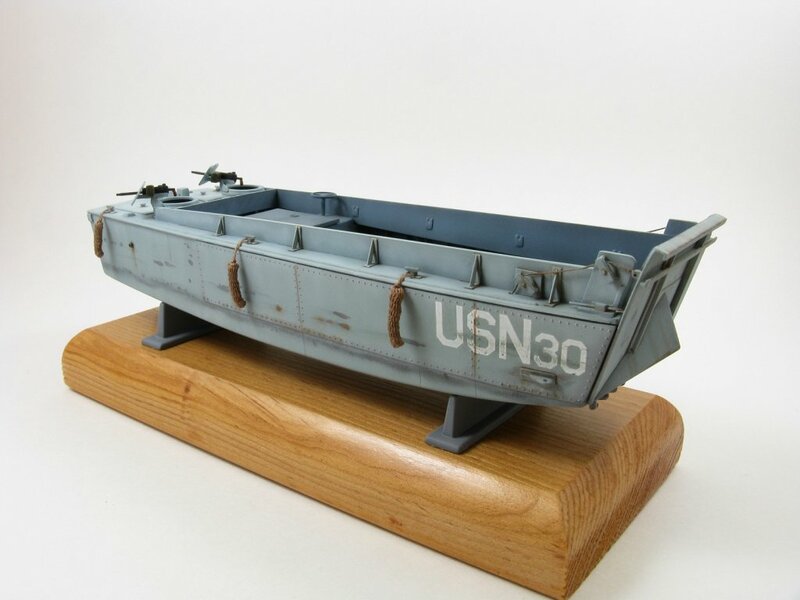 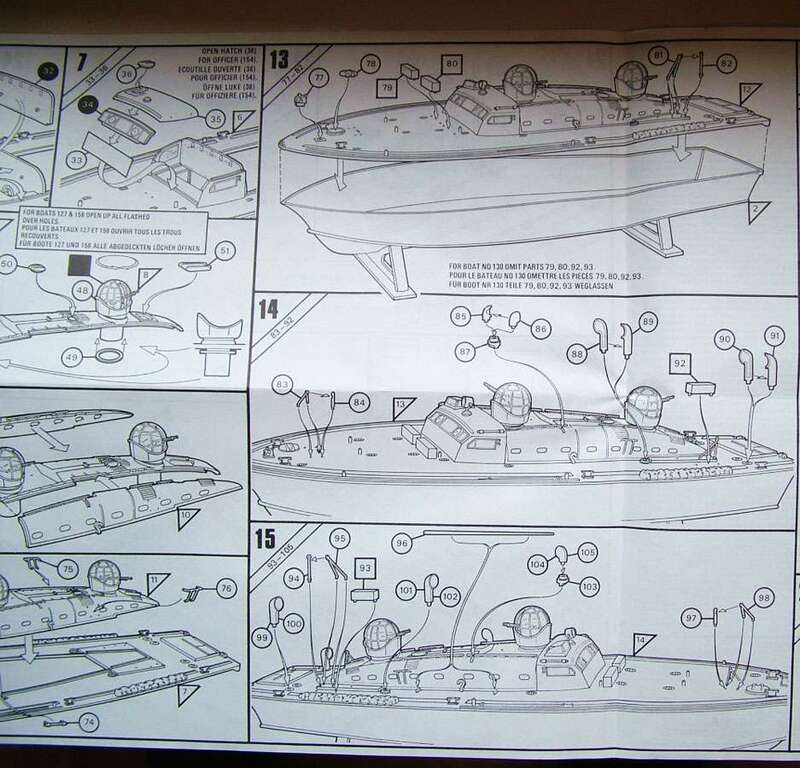 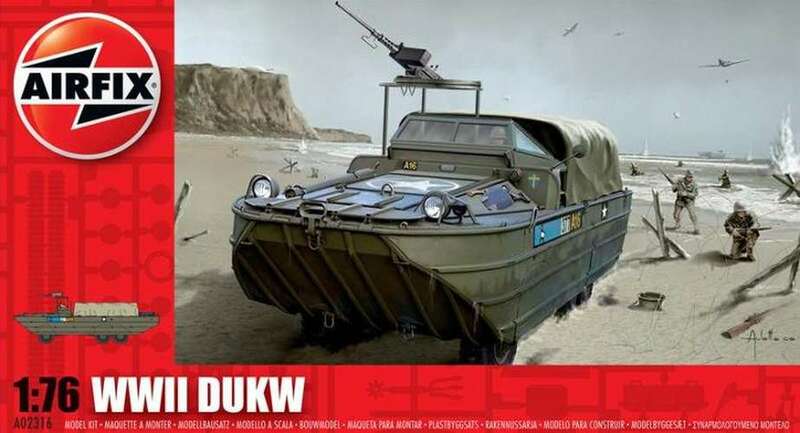 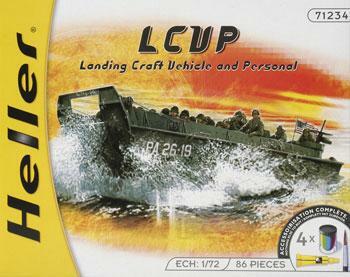 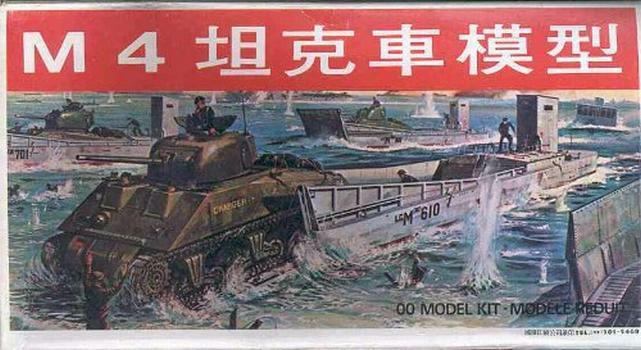 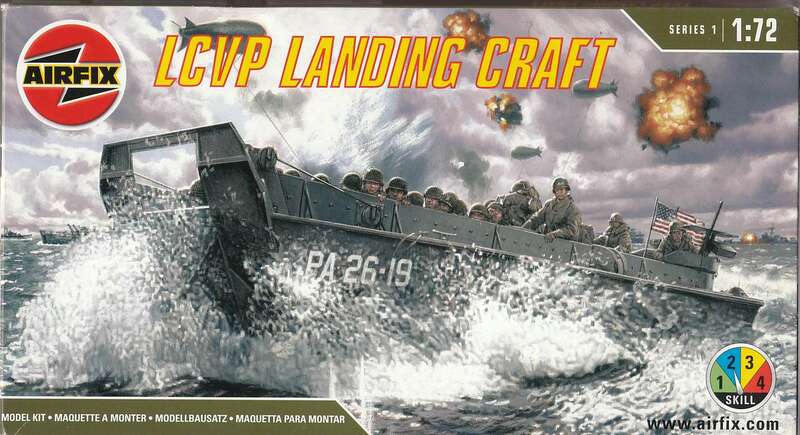 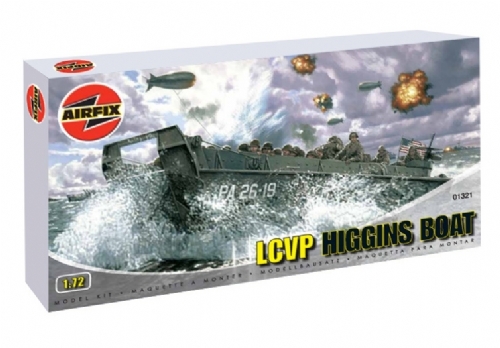 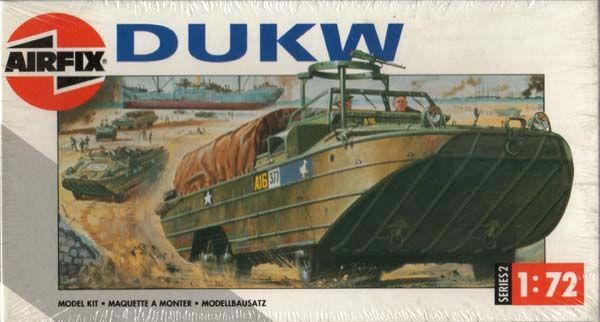 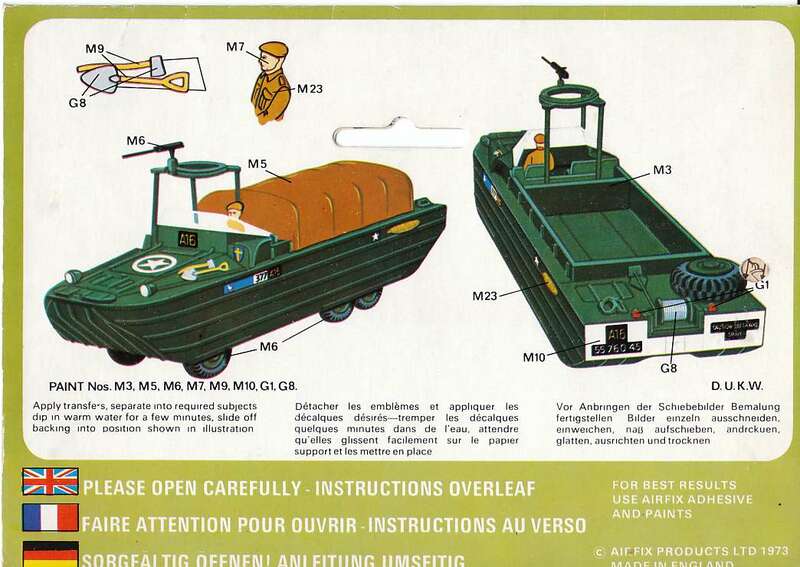 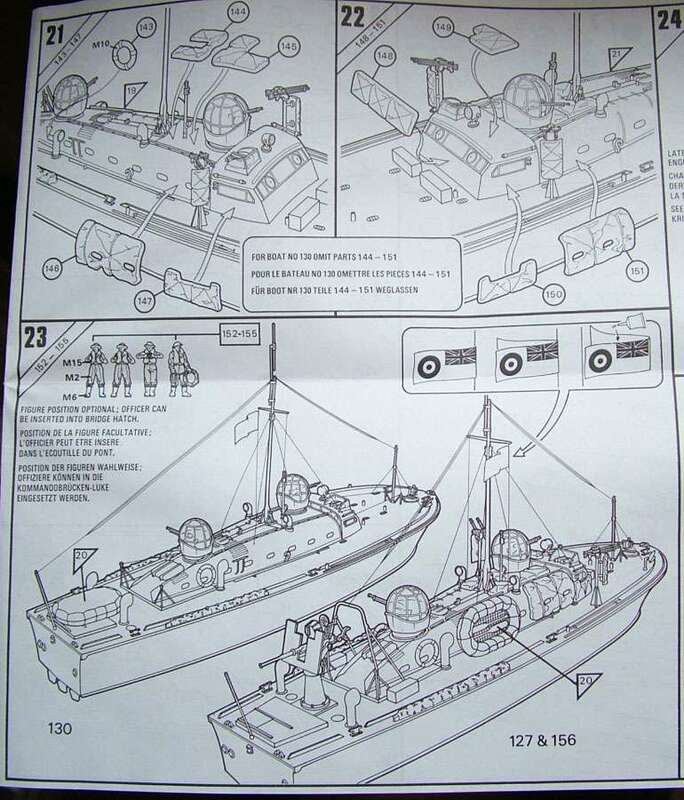 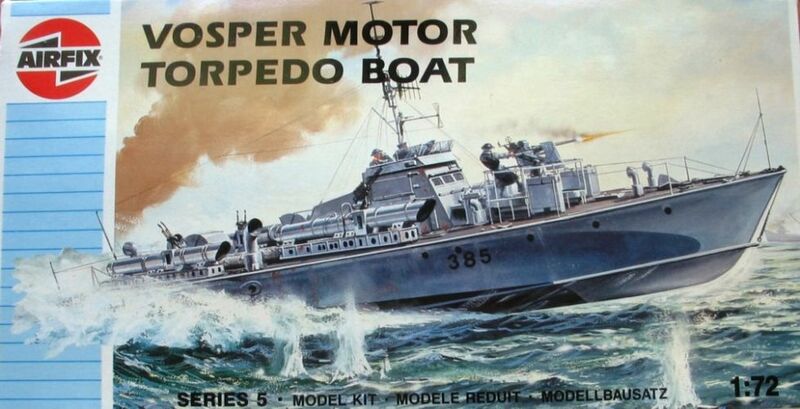 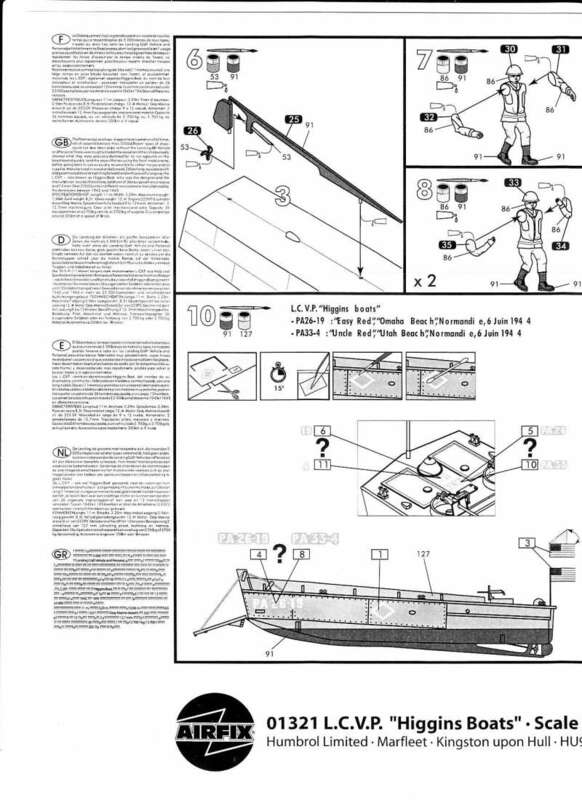 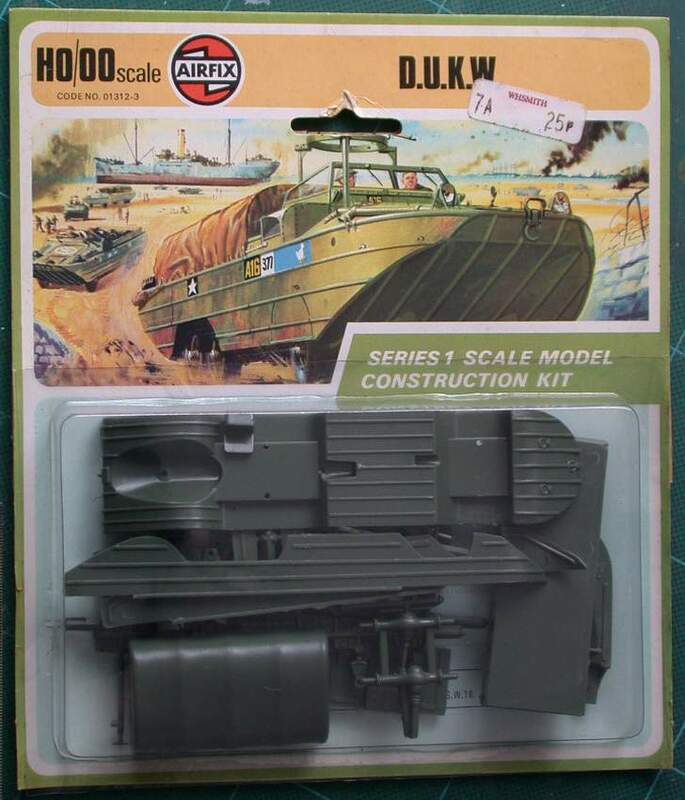 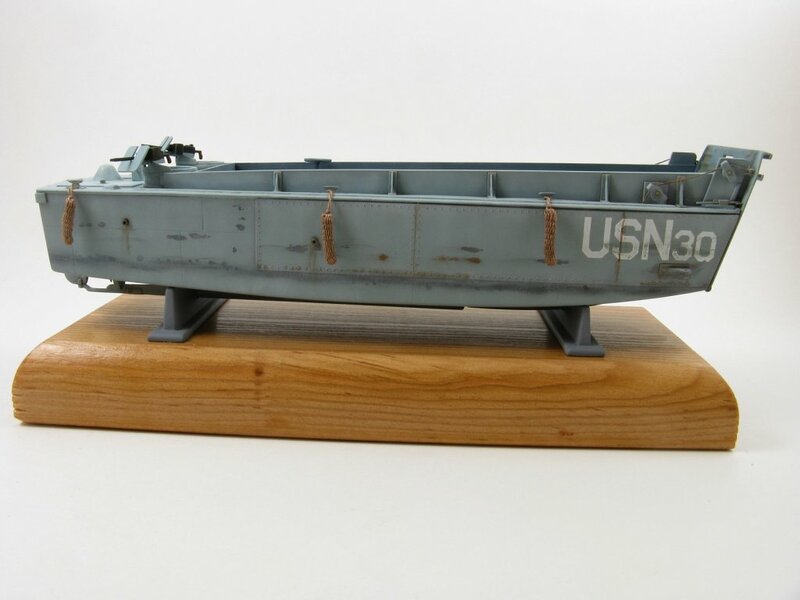 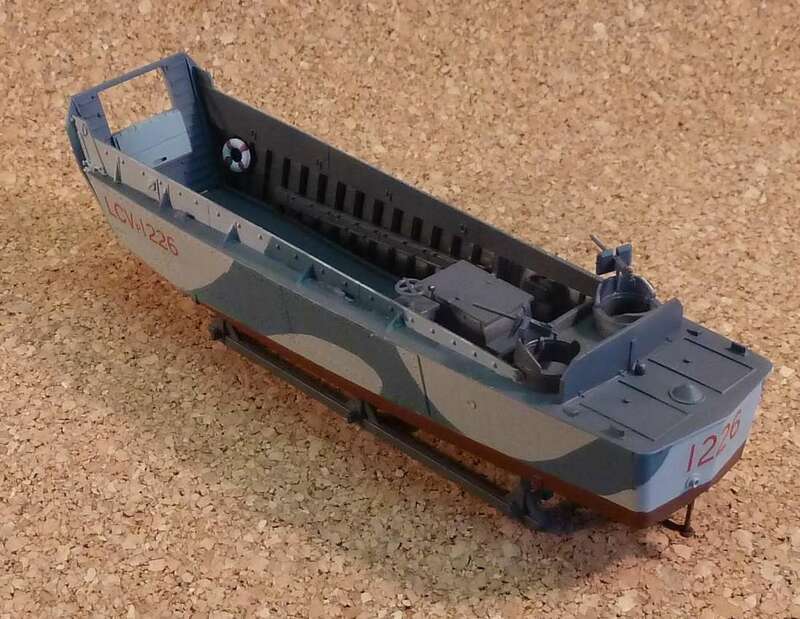 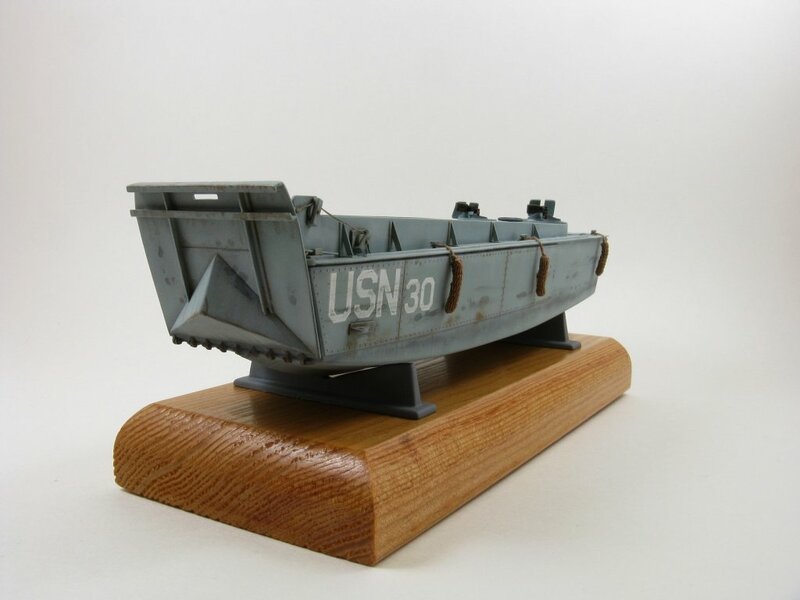 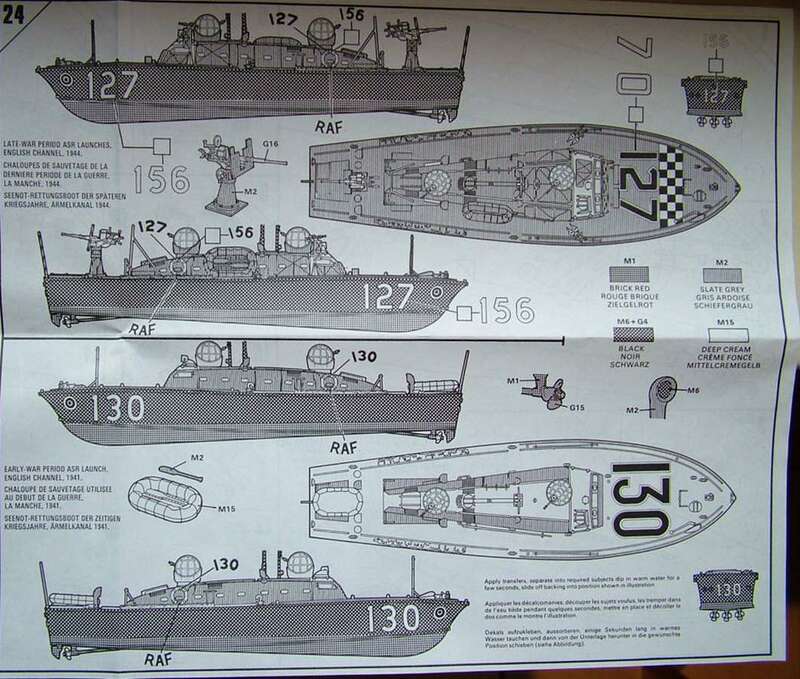 Kit Airfix 01321 / Heller 49995 - LCVP Landing craft. 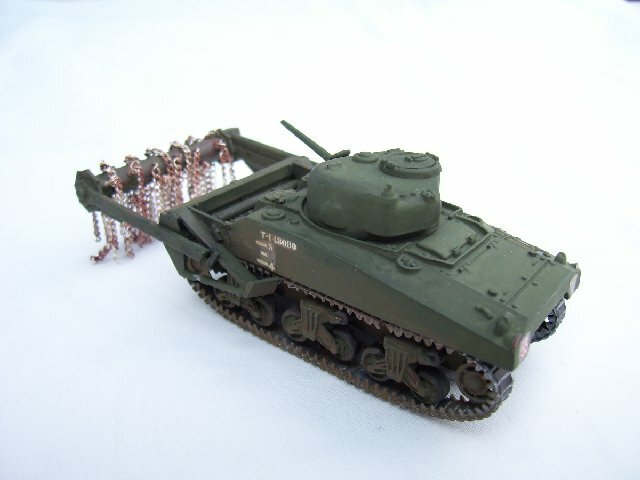 Model built by Al Magnus. 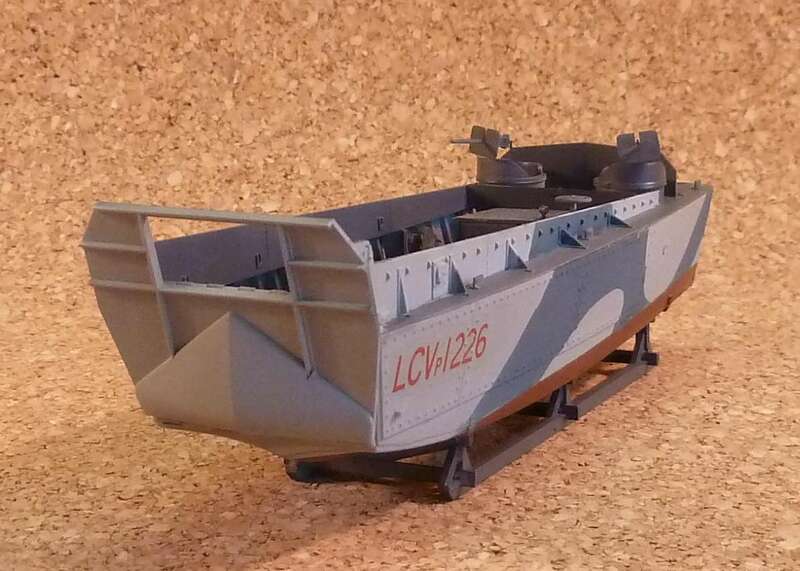 My Heller LCVP is finally finished. 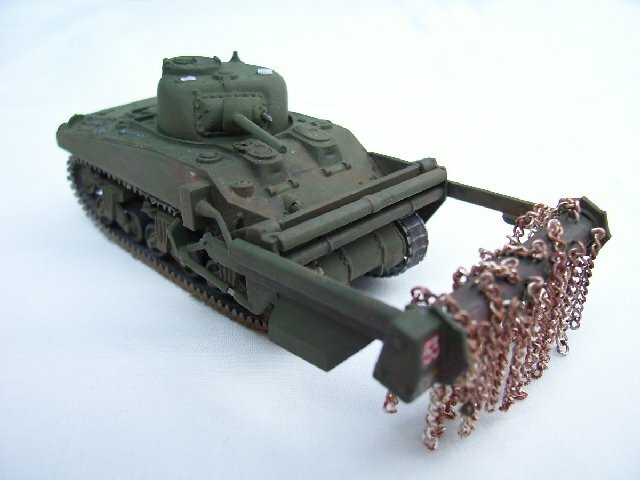 This was one of my most intensive projects taking close to three months to complete. 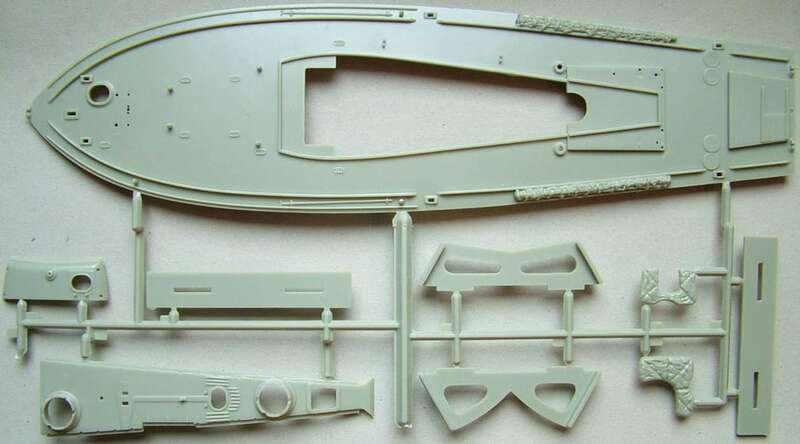 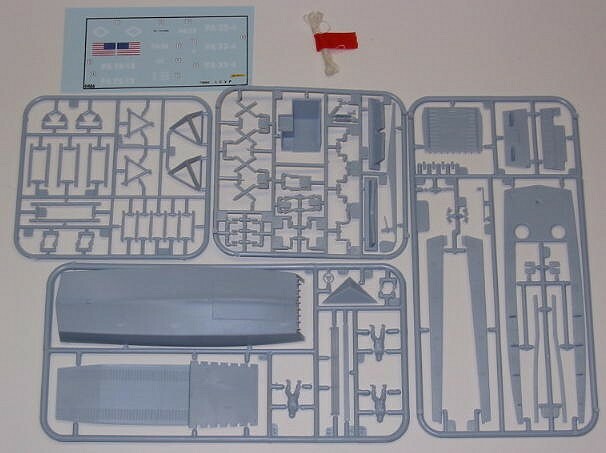 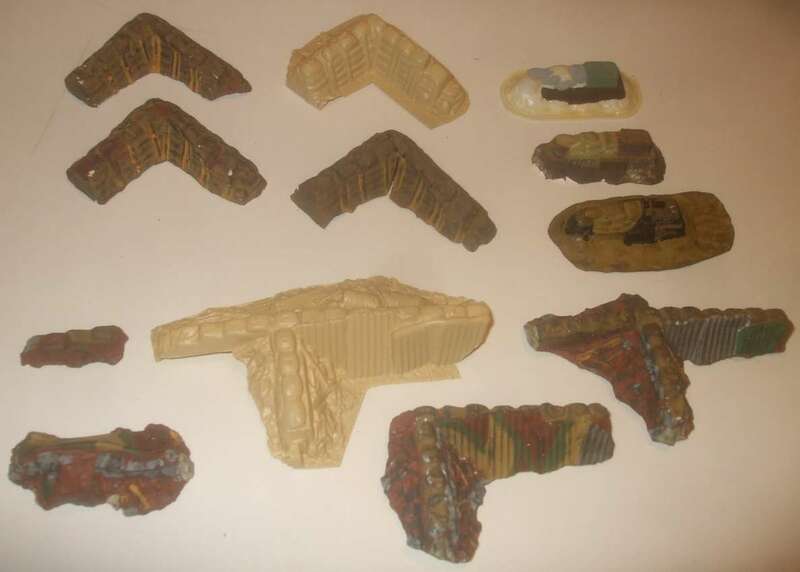 There is not a lot left of the original kit save the hull, decks and ramp and a couple of smaller items. 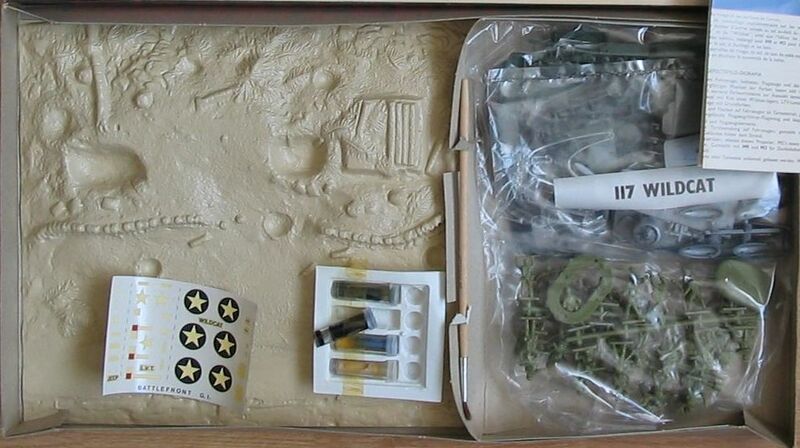 Almost everything else from the original kit has been replaced because it was basically garbage and I had to add a lot of missing details. 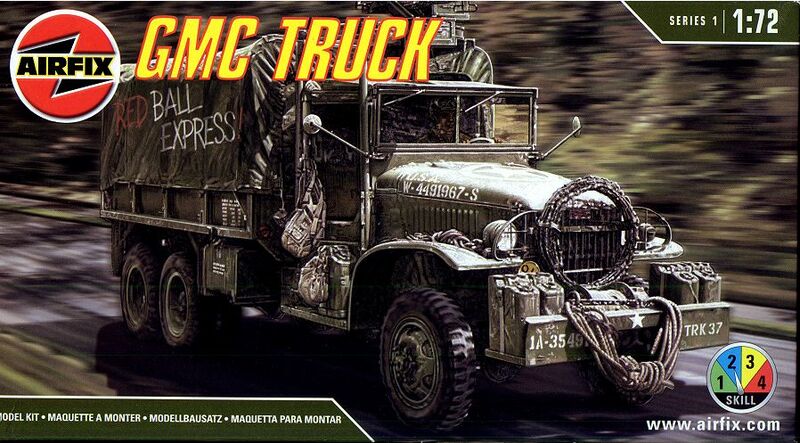 Al Magnus. 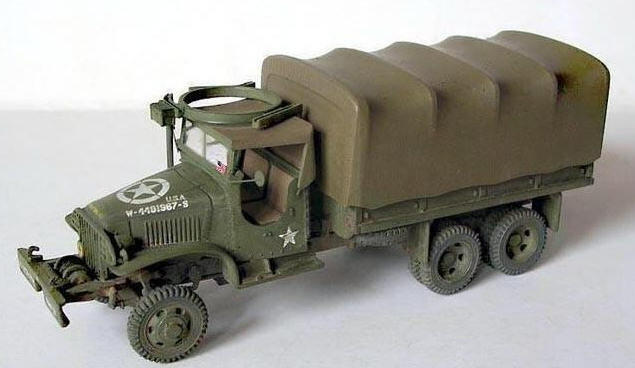 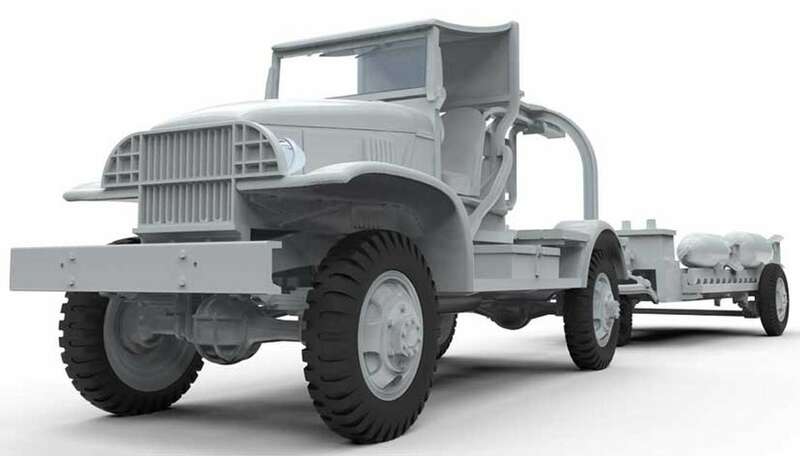 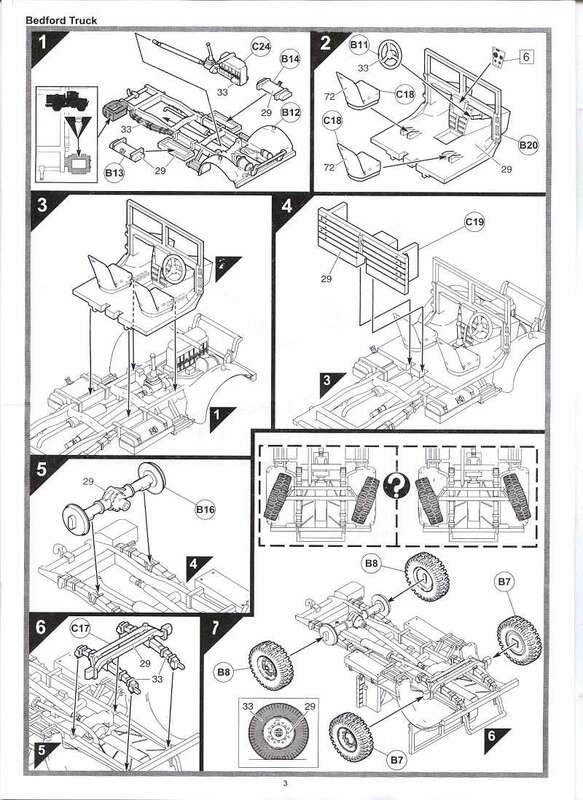 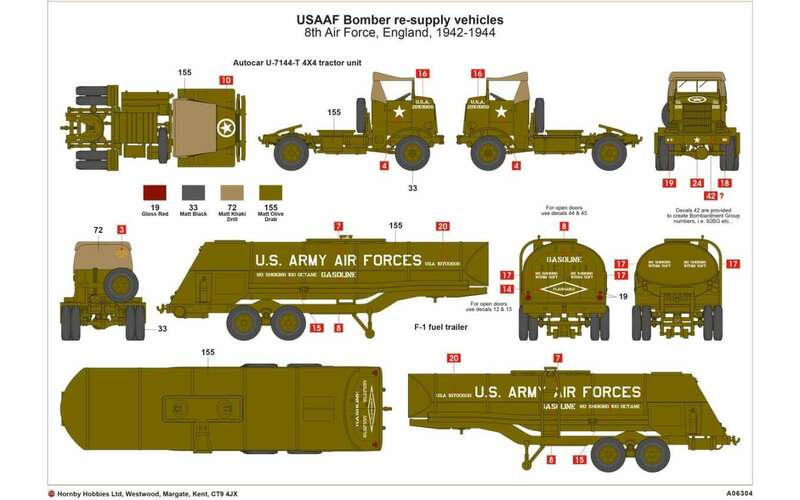 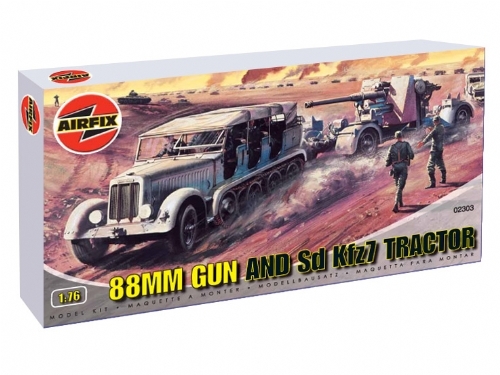 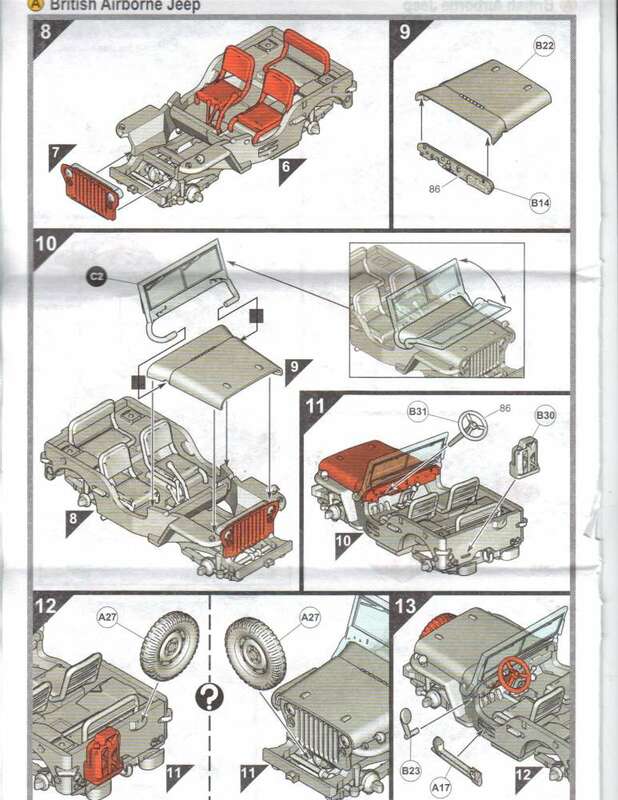 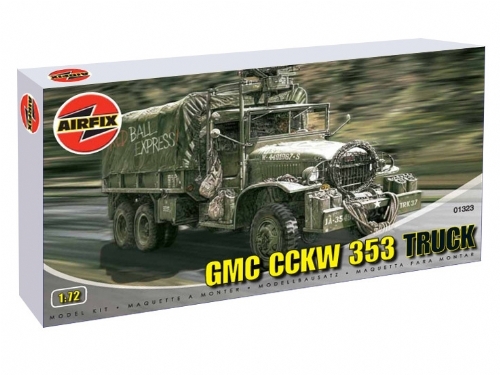 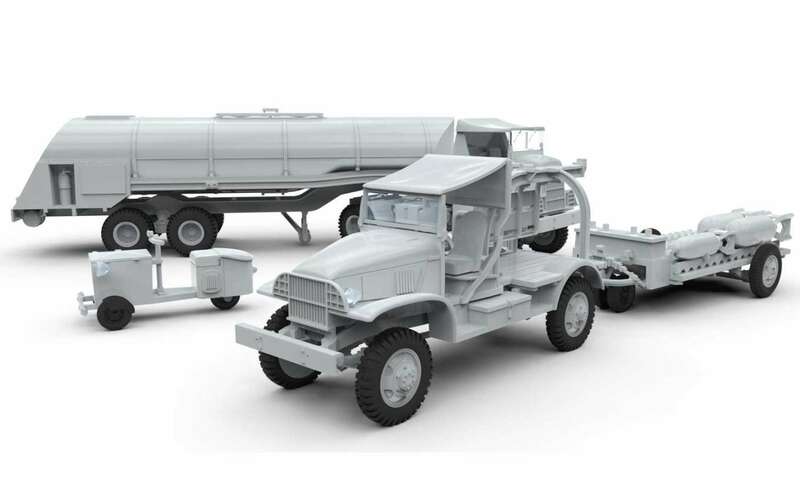 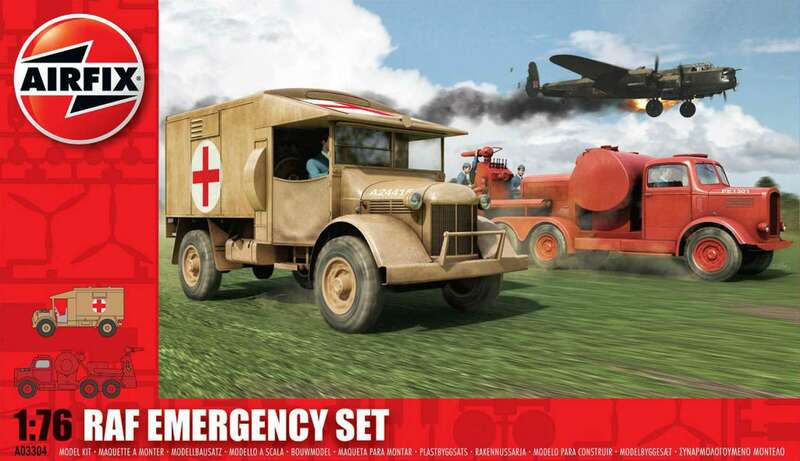 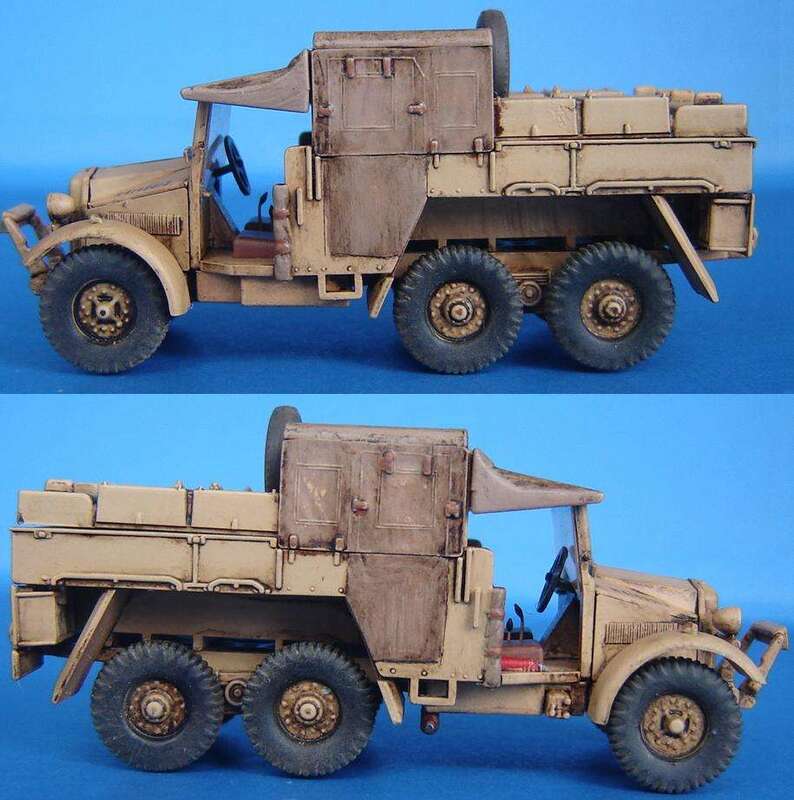 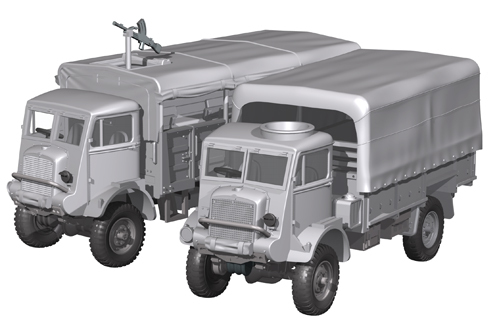 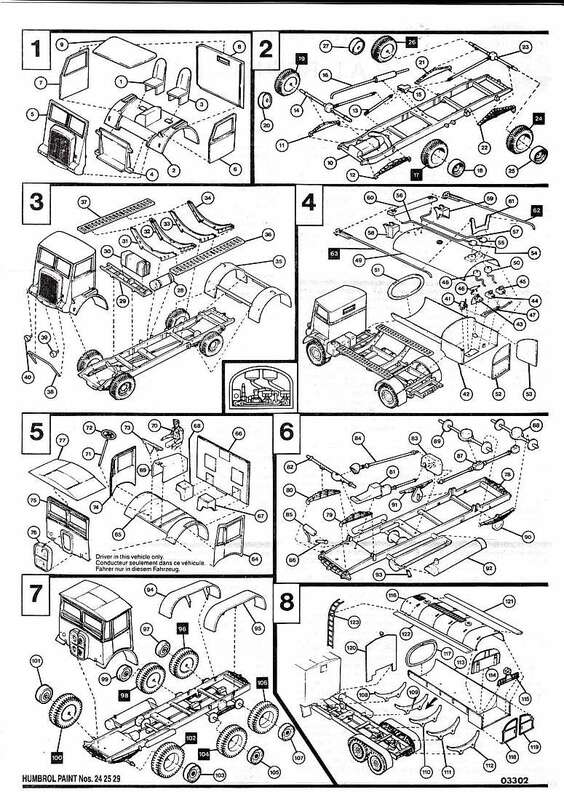 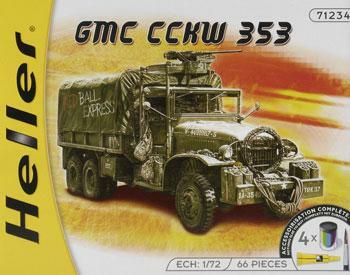 Kit Airfix 01323 / Heller 49996 - GMC truck. 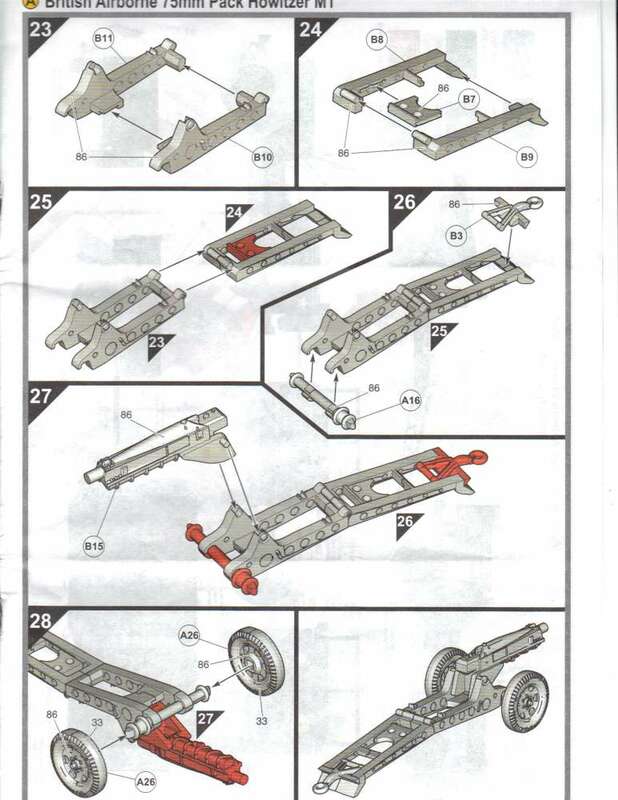 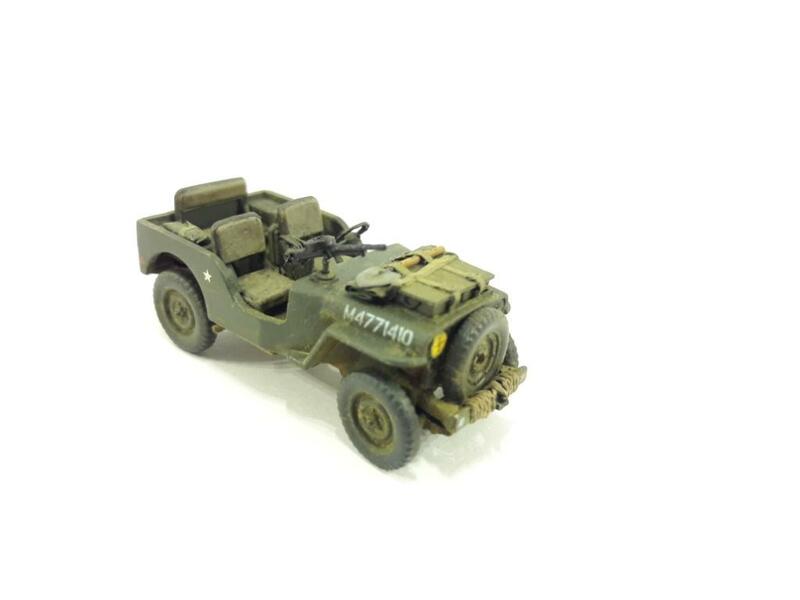 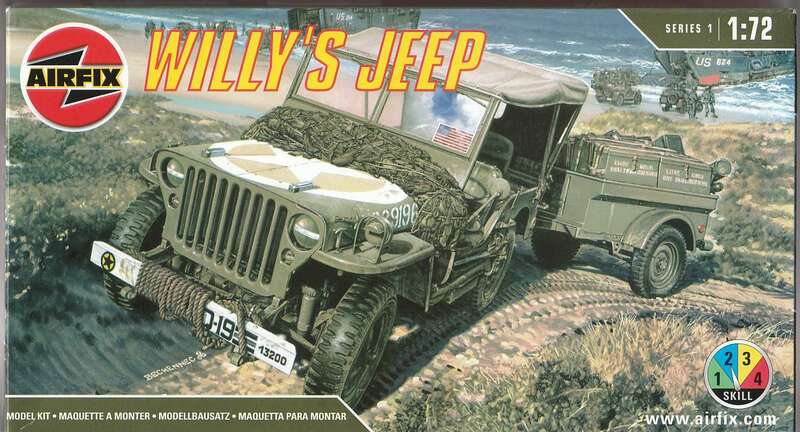 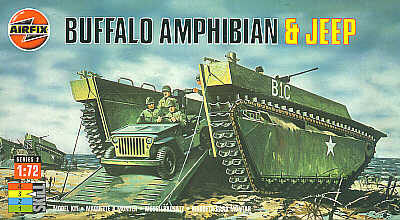 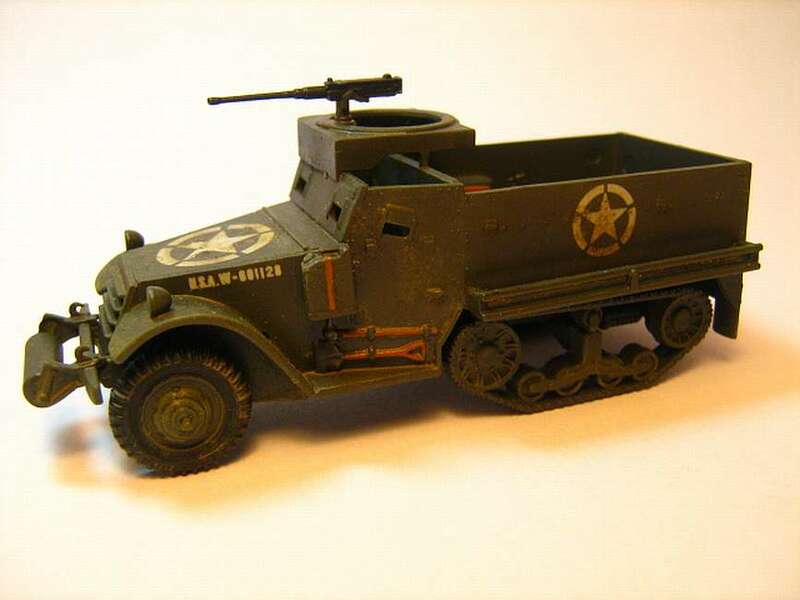 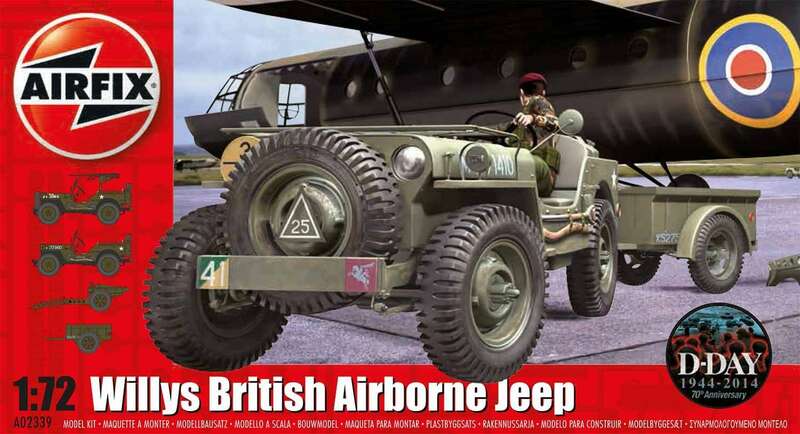 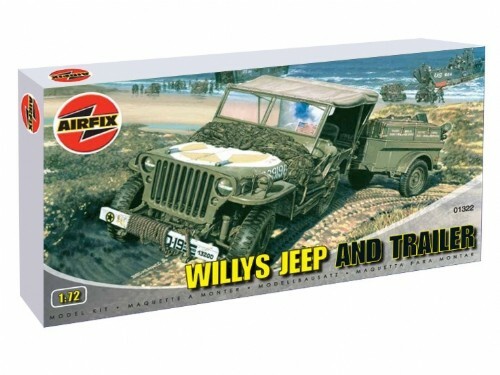 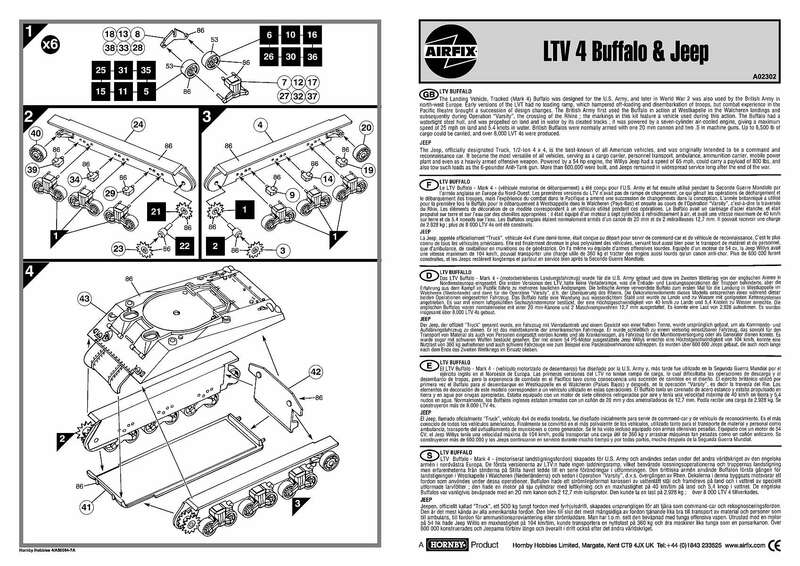 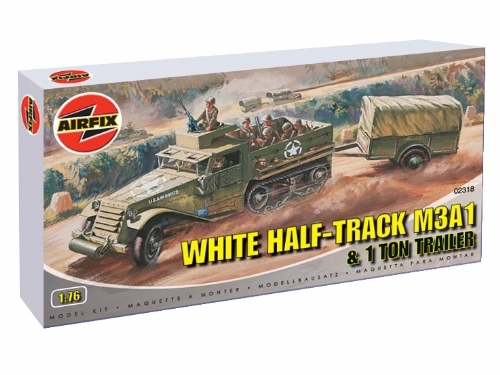 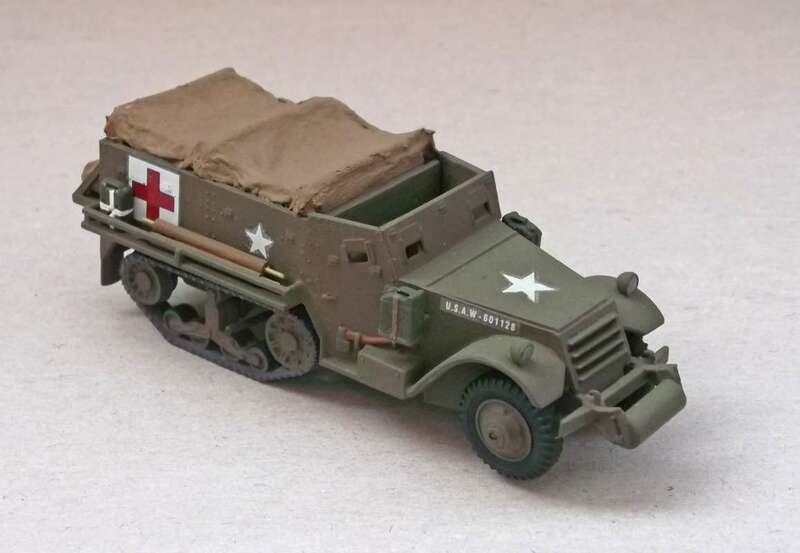 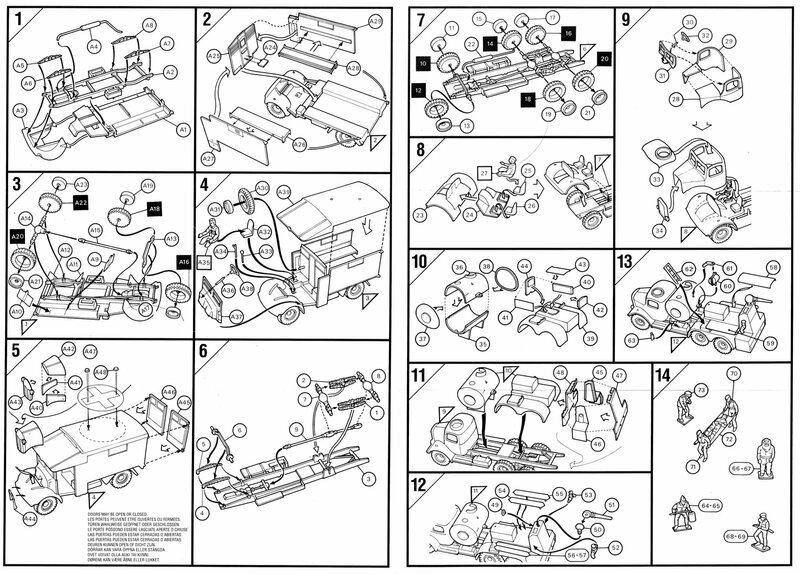 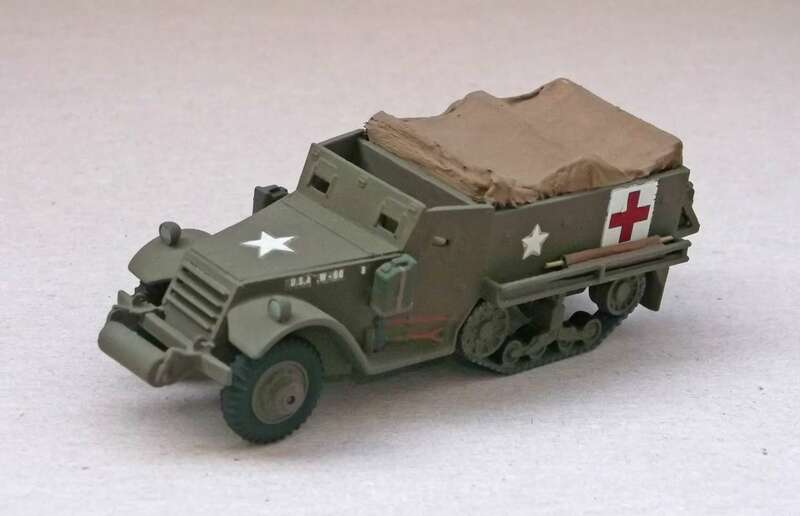 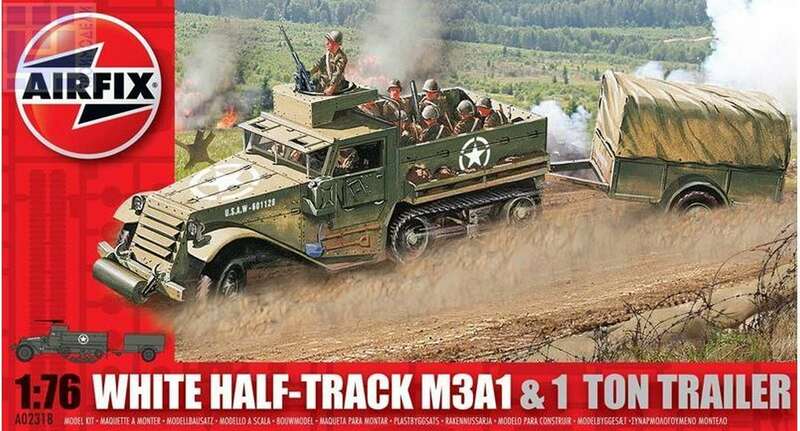 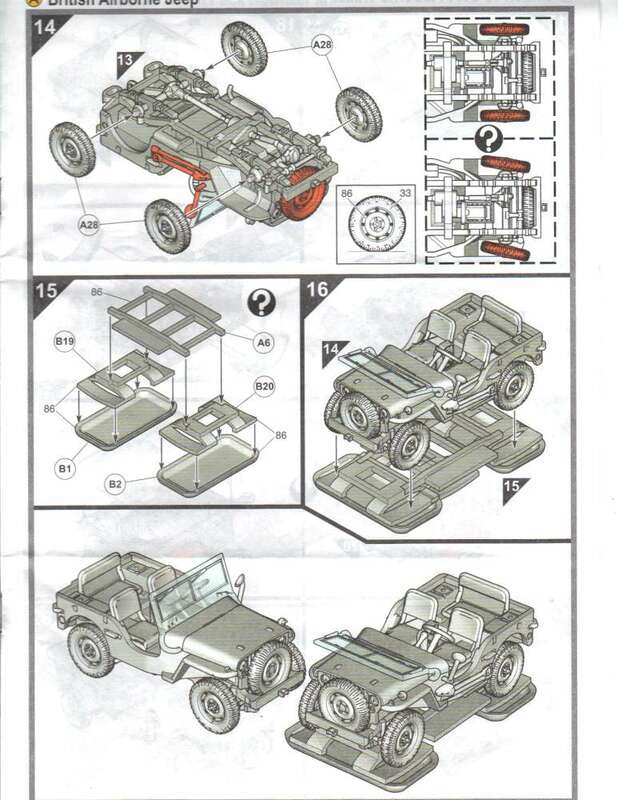 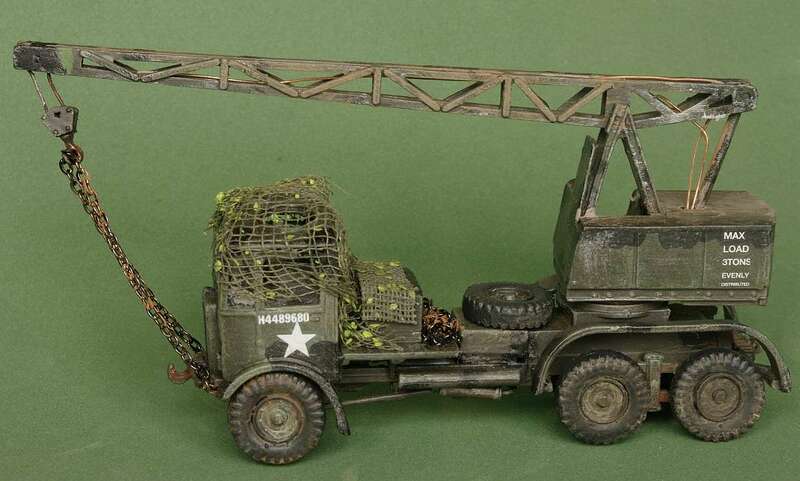 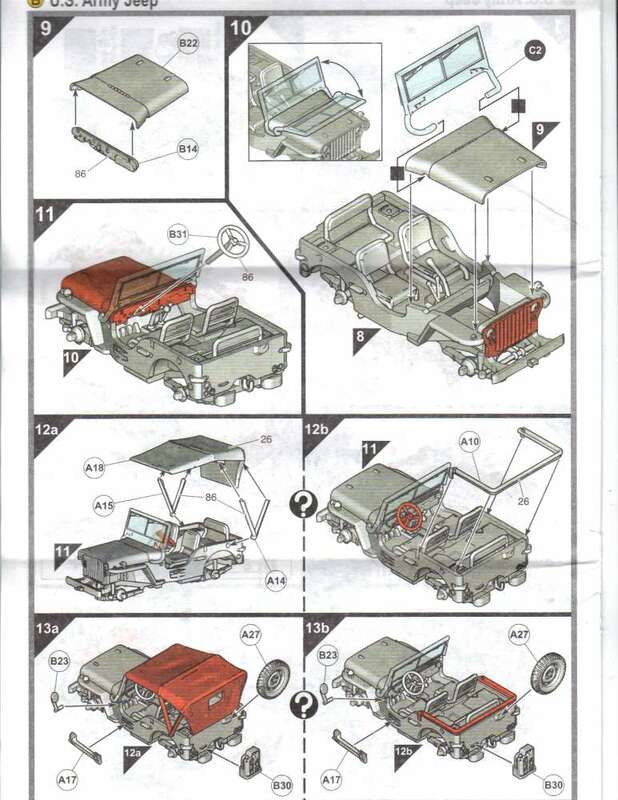 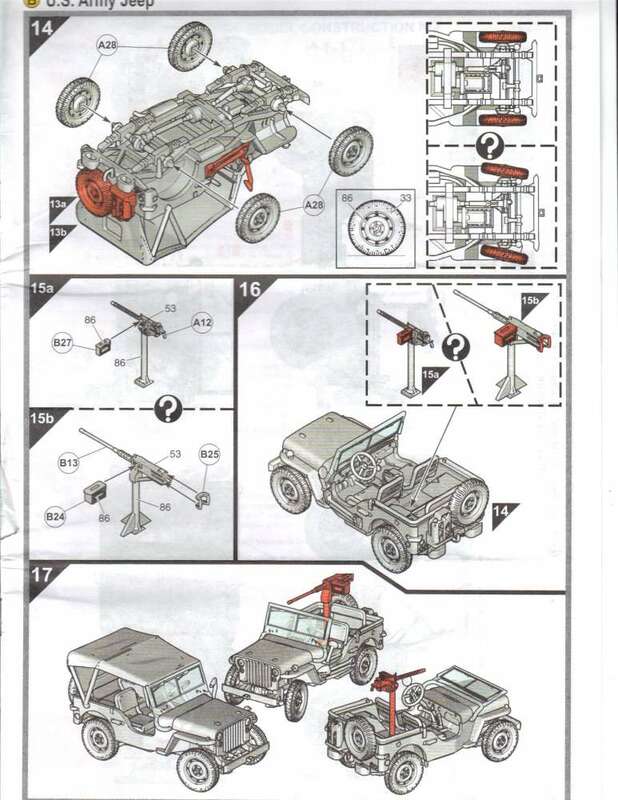 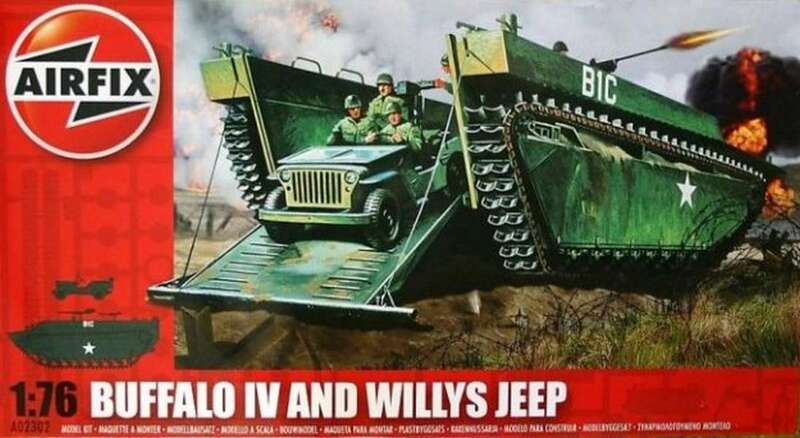 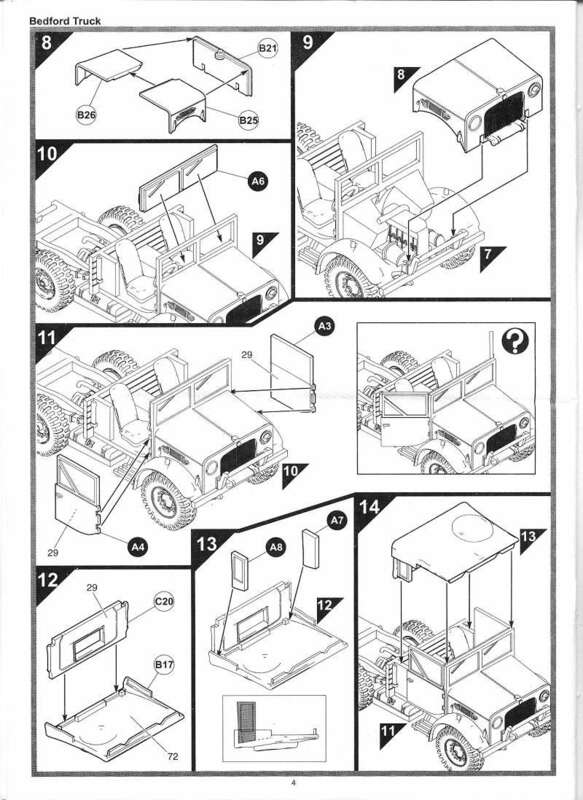 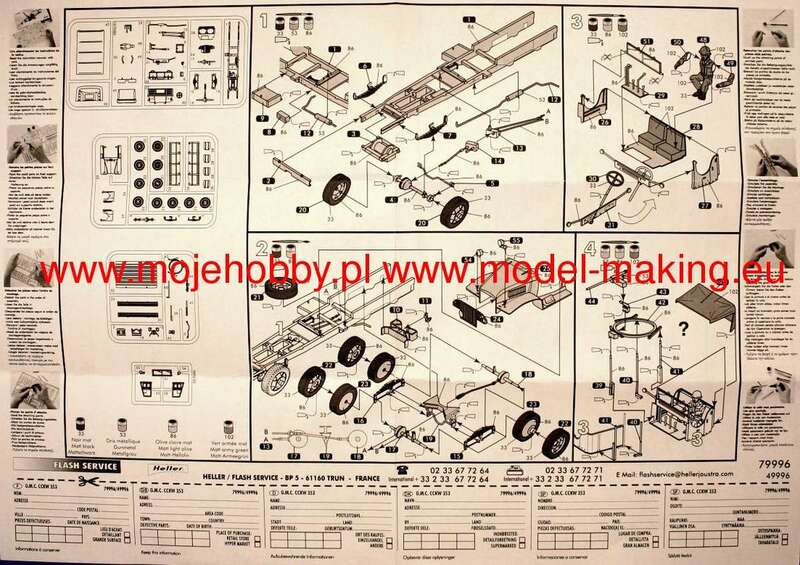 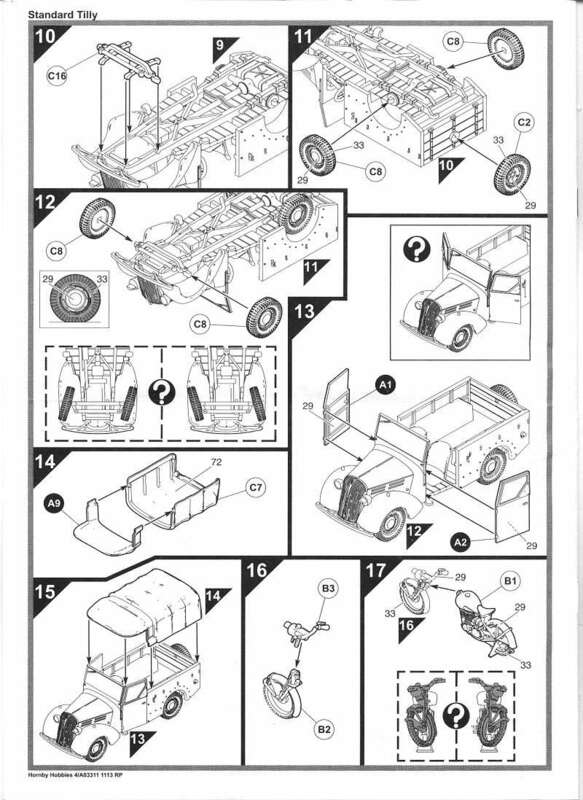 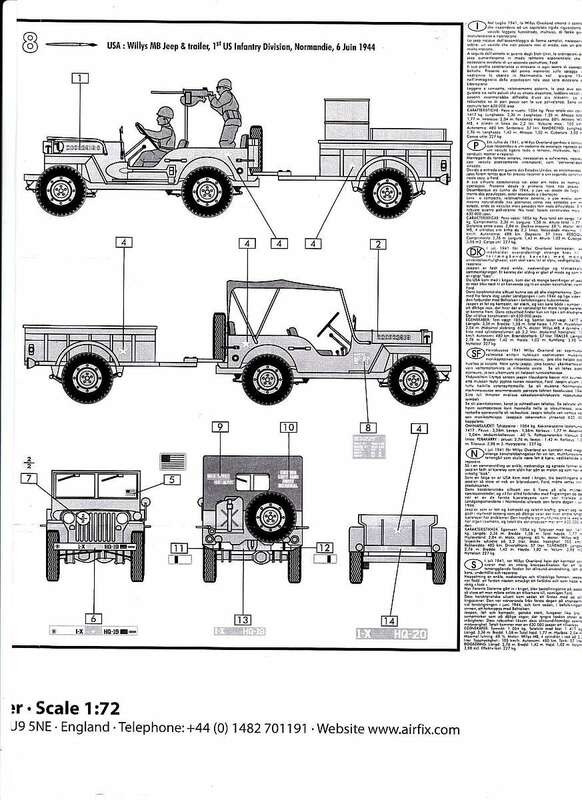 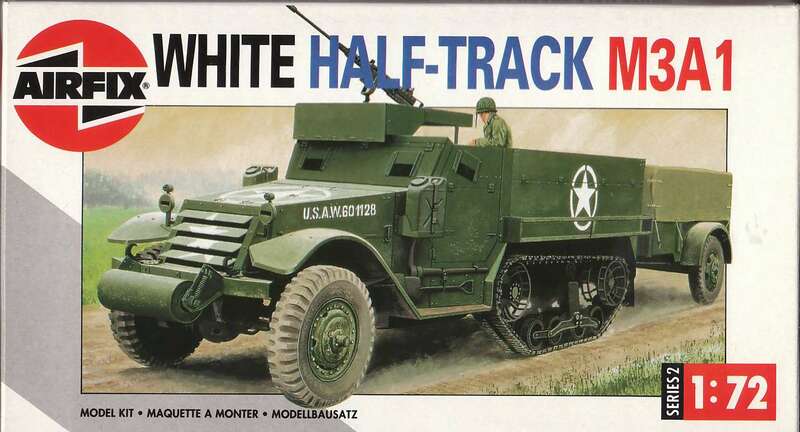 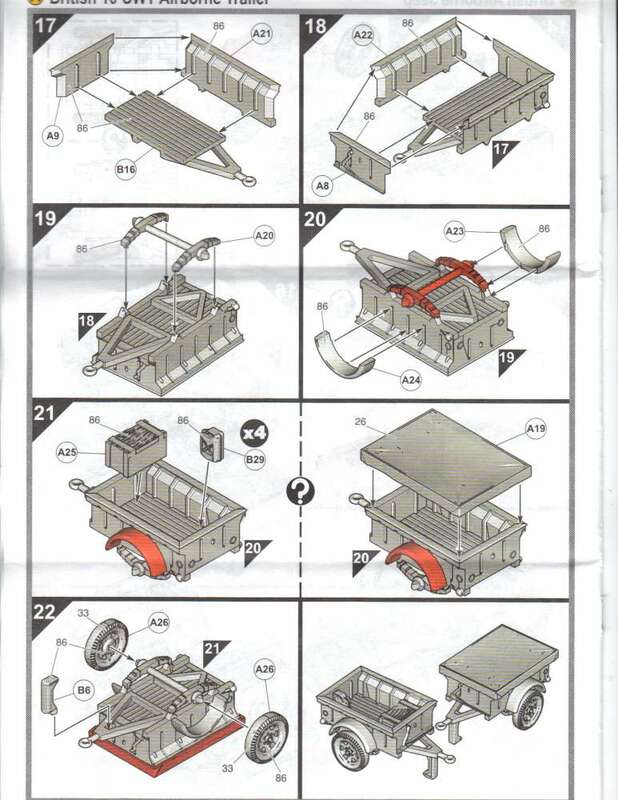 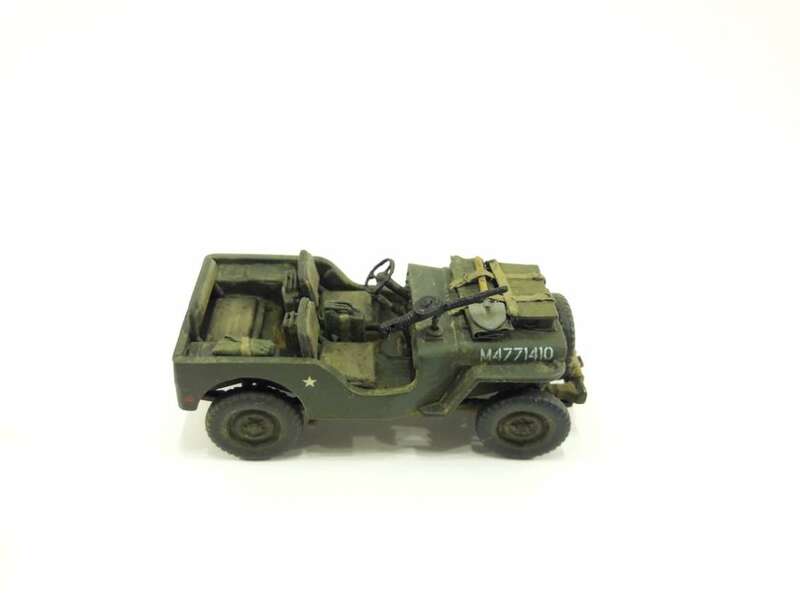 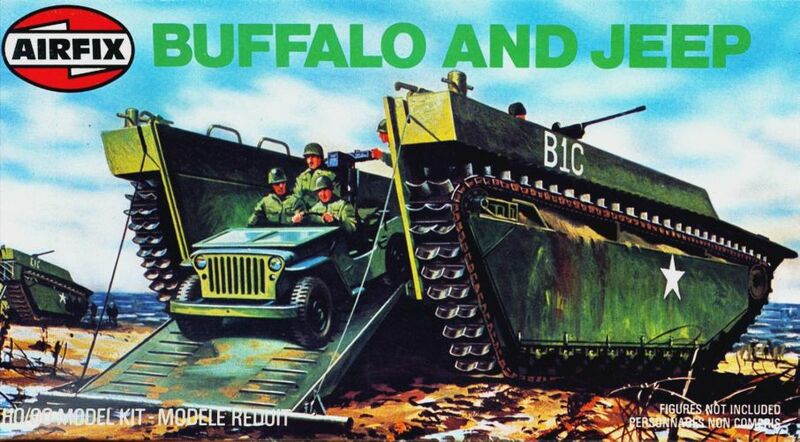 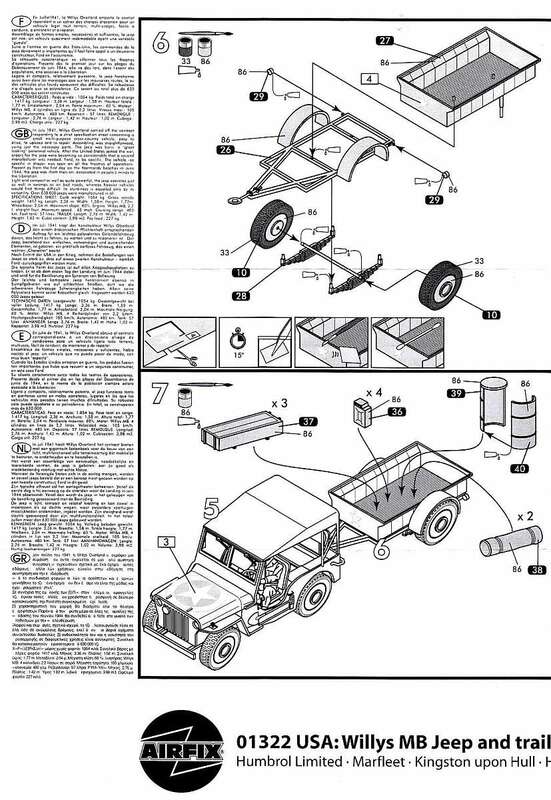 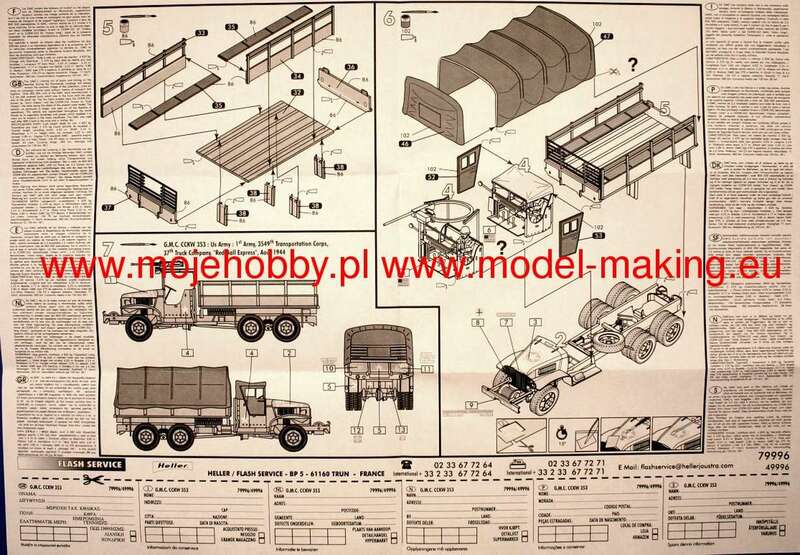 Kit Airfix 01322 / Heller 49997 - Willy Jeep with trailer. 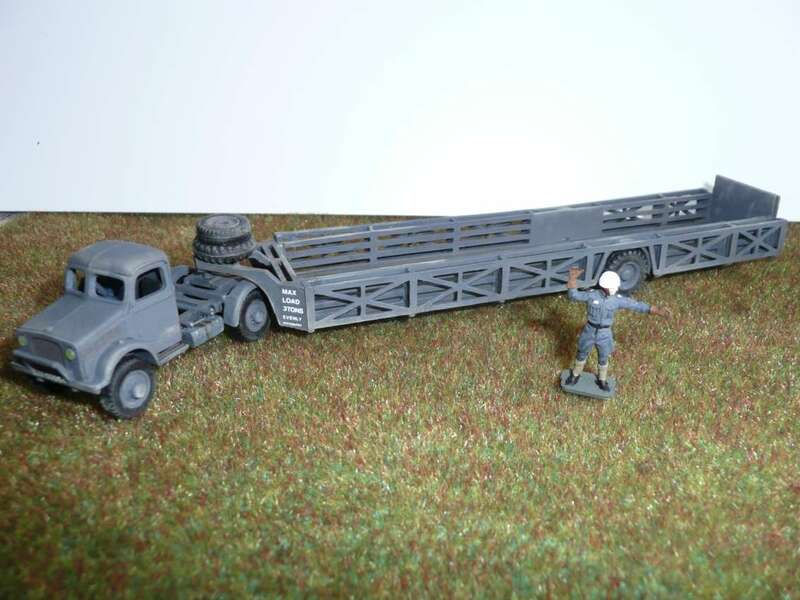 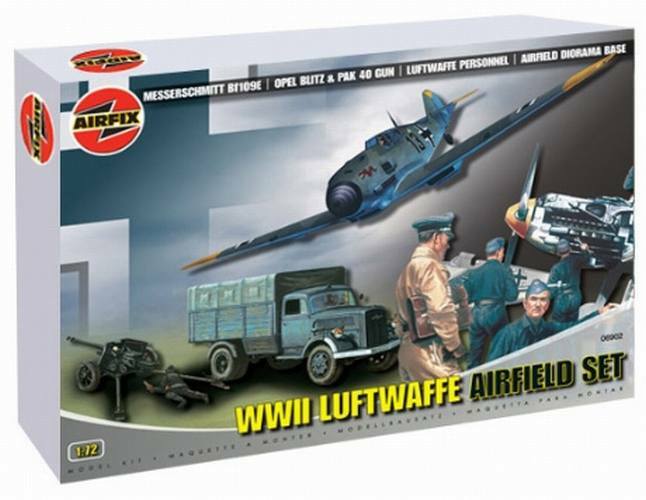 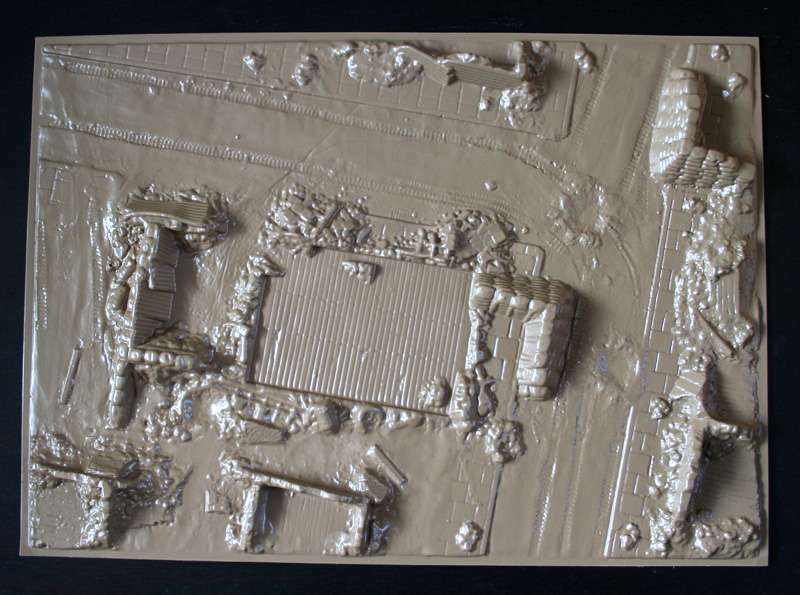 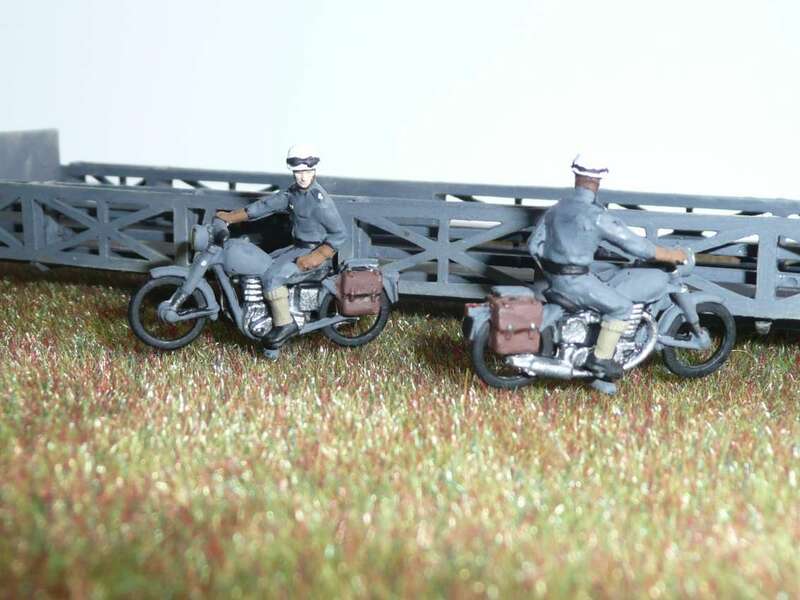 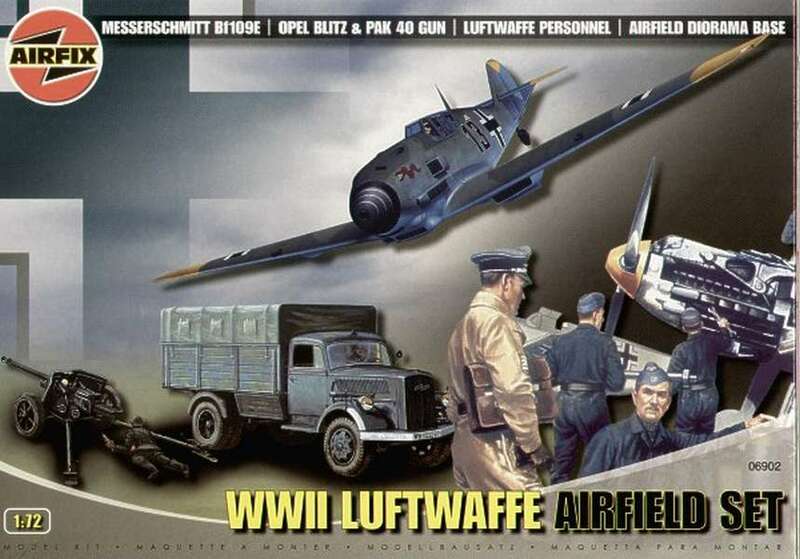 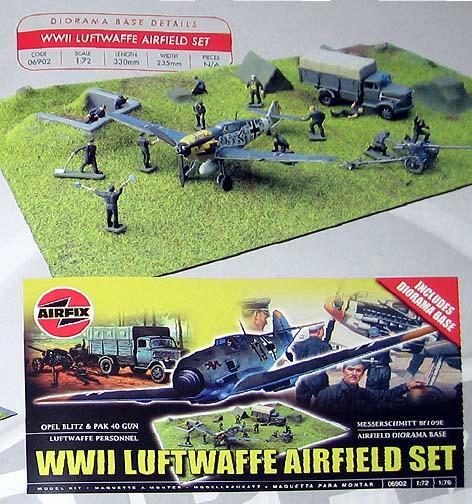 Kit 06902 - WWII Luftwaffe airfield Set - Opel Blitz & PAK, Me-109E, personnel, base. 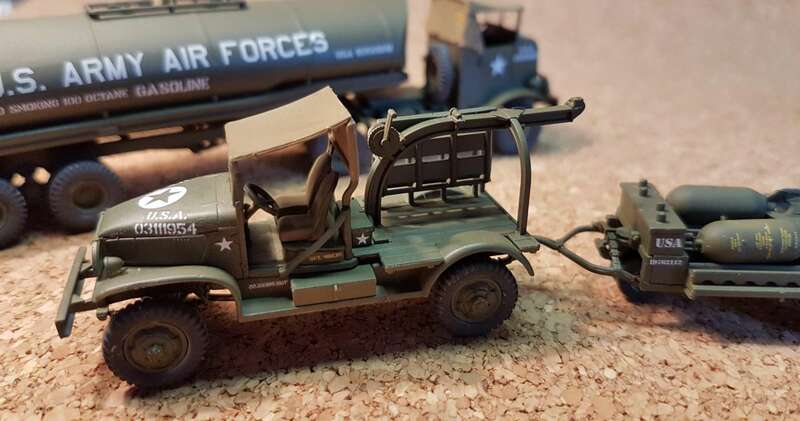 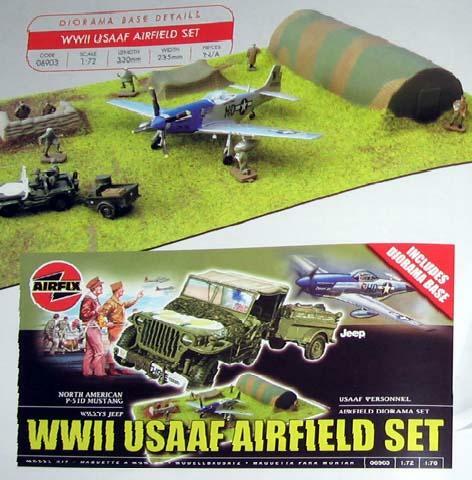 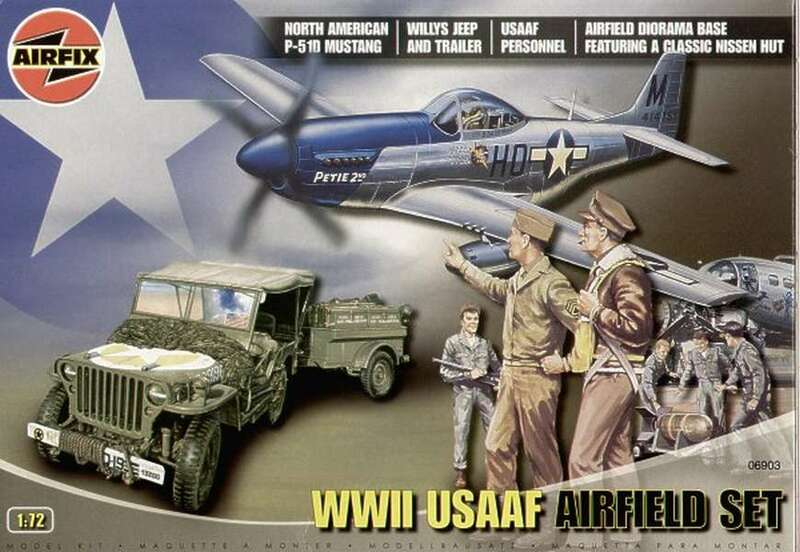 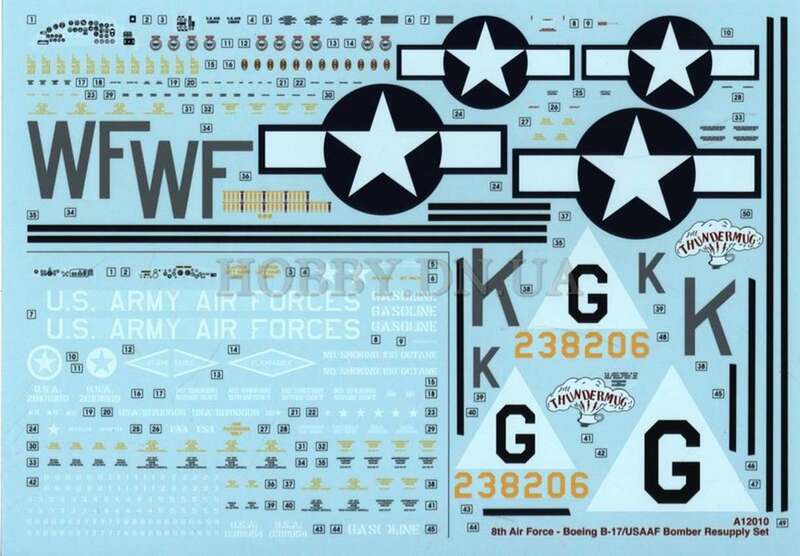 Kit 06903 - WWII USAAF airfield Set - Willys Jeep, P-51D, personnel, base. 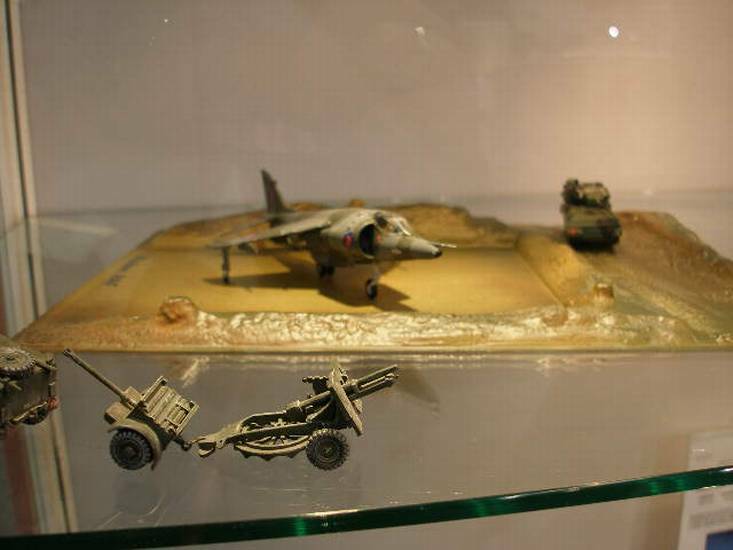 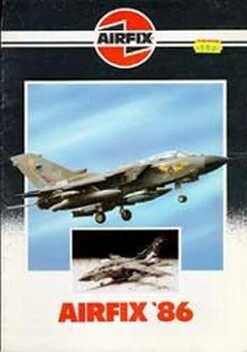 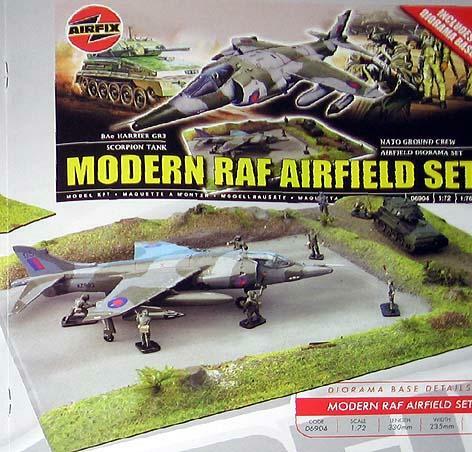 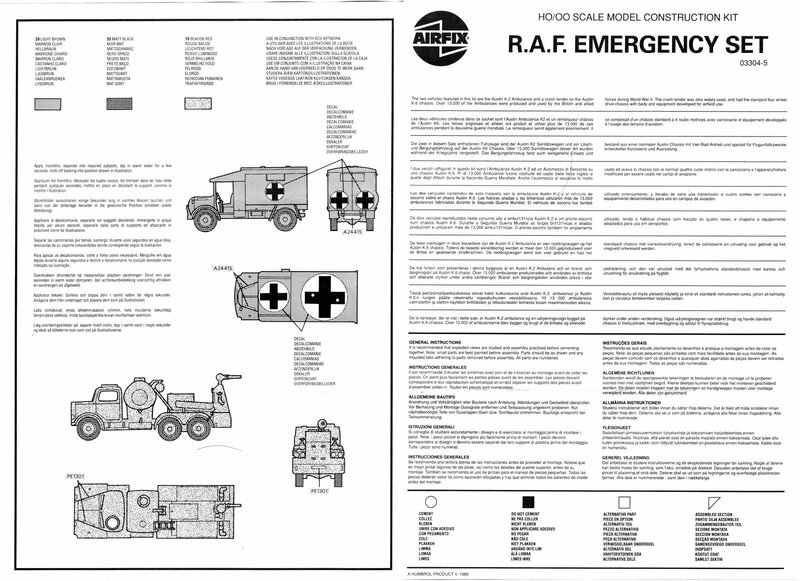 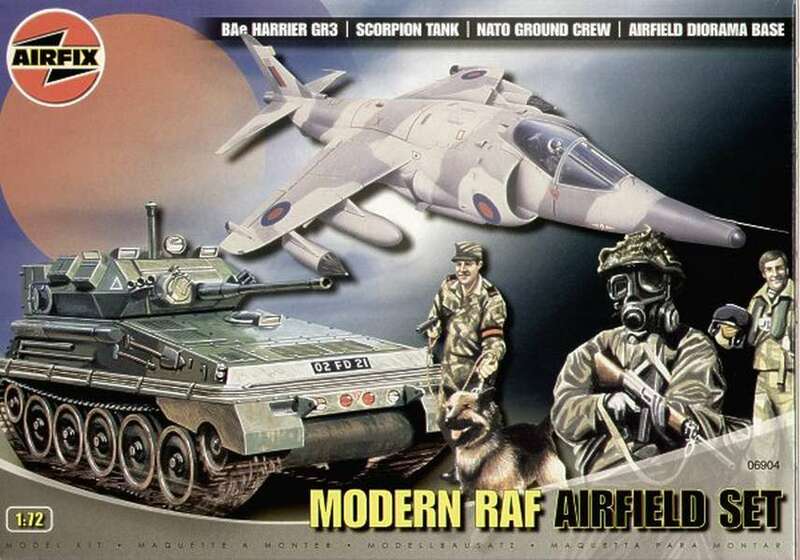 Kit 06904 - Modern RAF airfield Set - Scorpion, Harrier GR3, personnel, base. 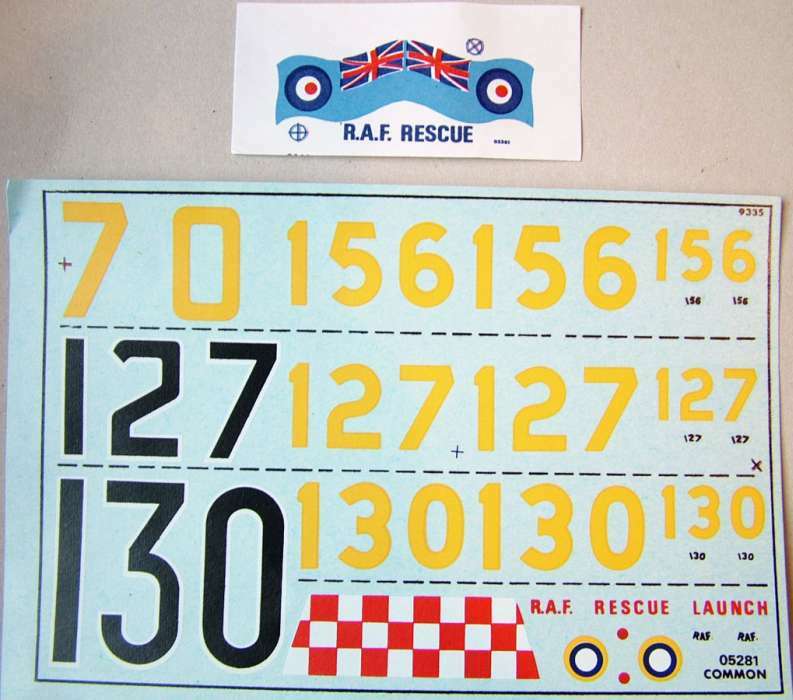 Kit 5281 RAF Rescue launch. 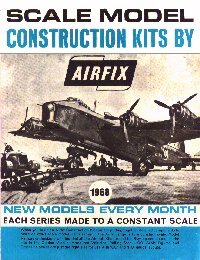 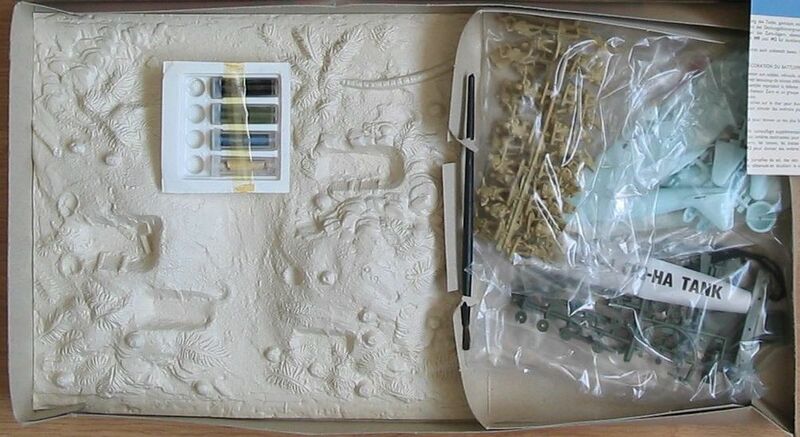 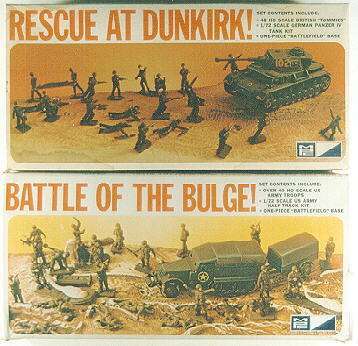 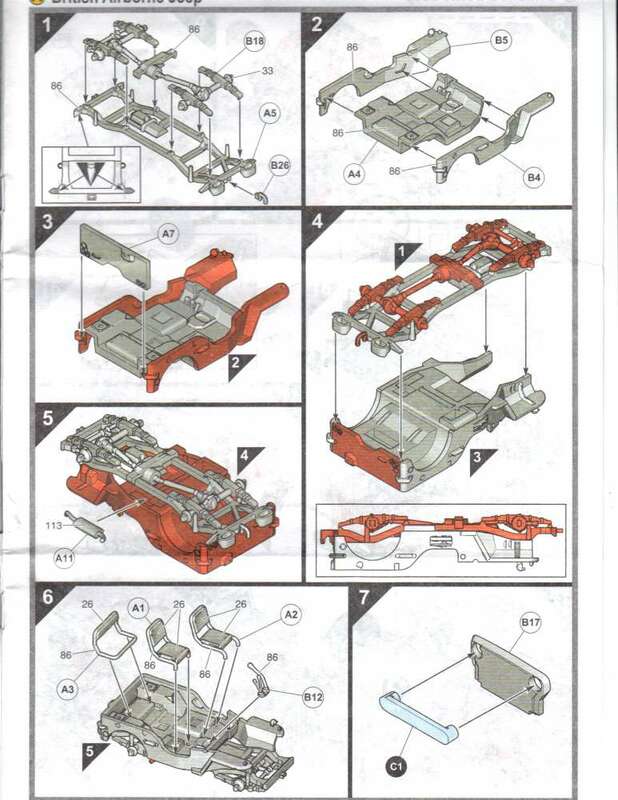 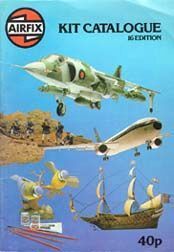 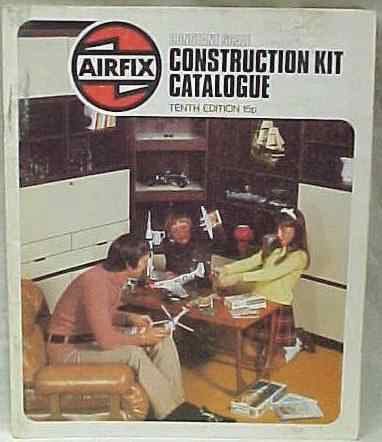 For a long time Airfix released many soft-skin kits in the 'Snap-together' catagory. 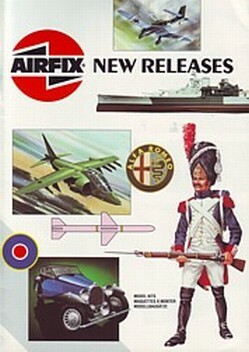 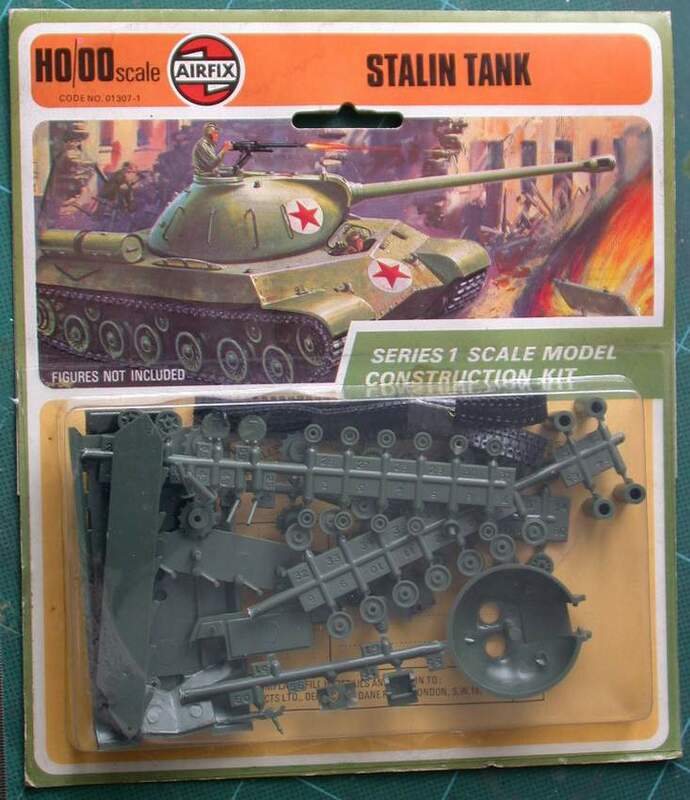 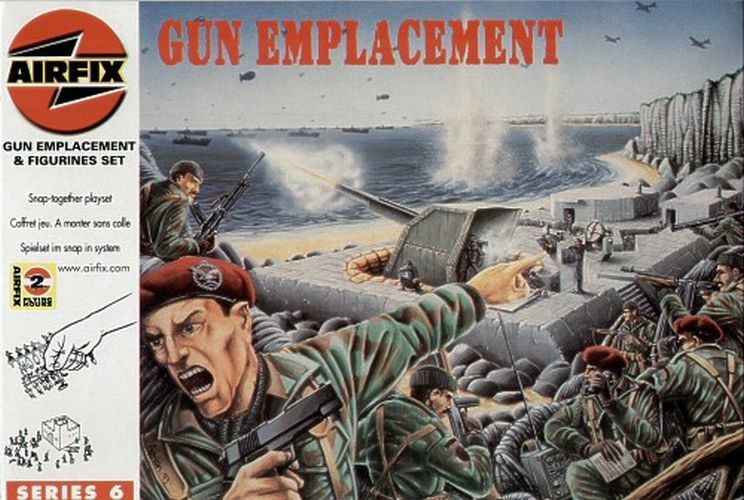 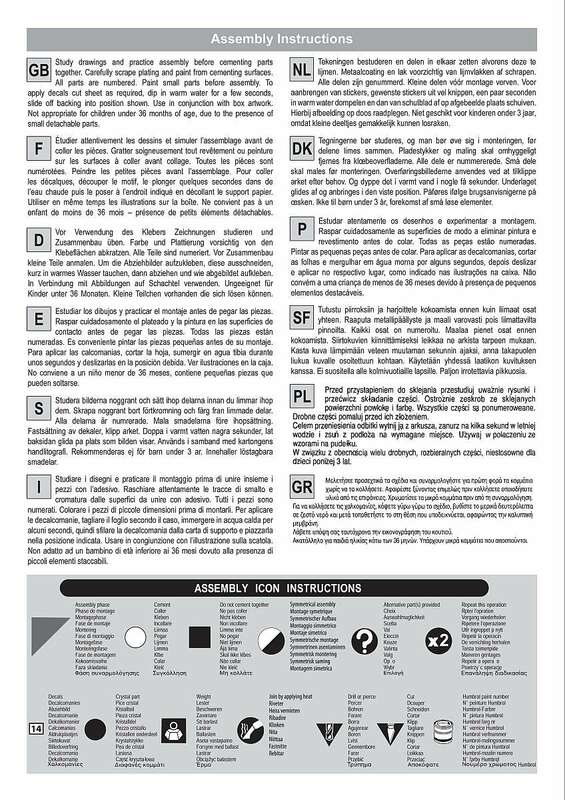 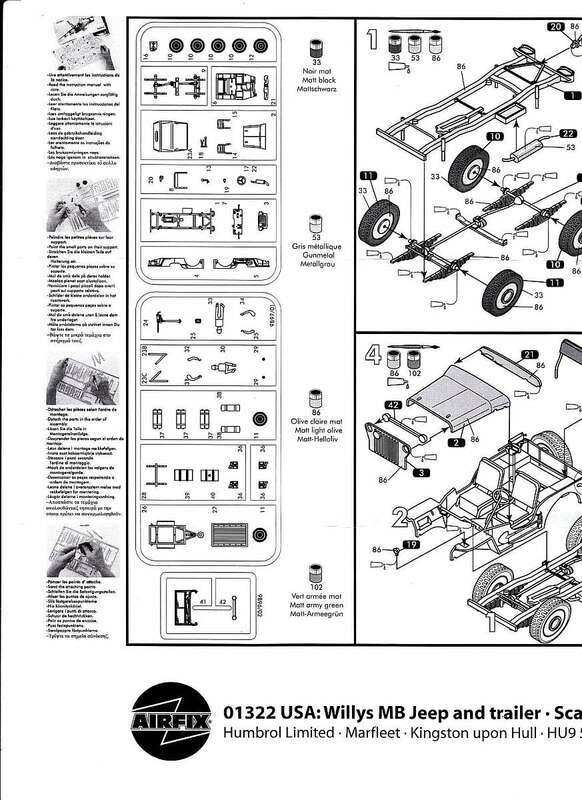 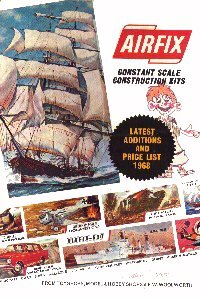 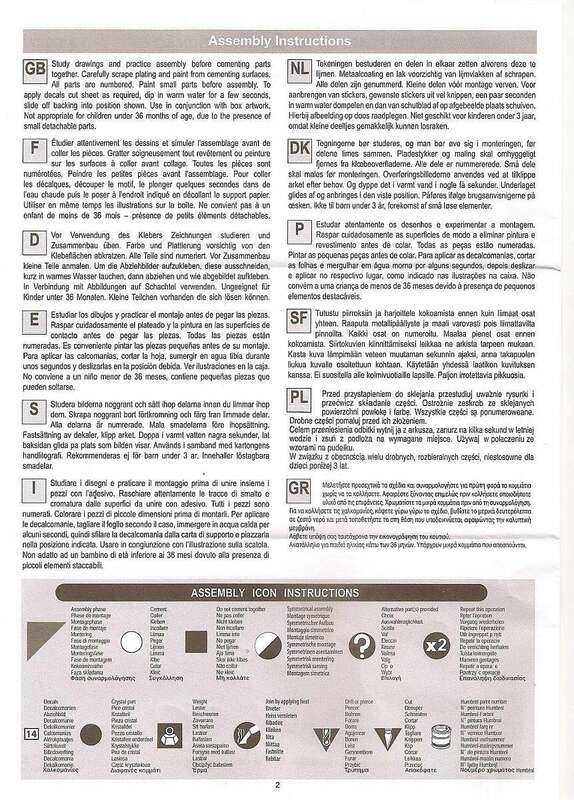 Airfix kits released under other labels. 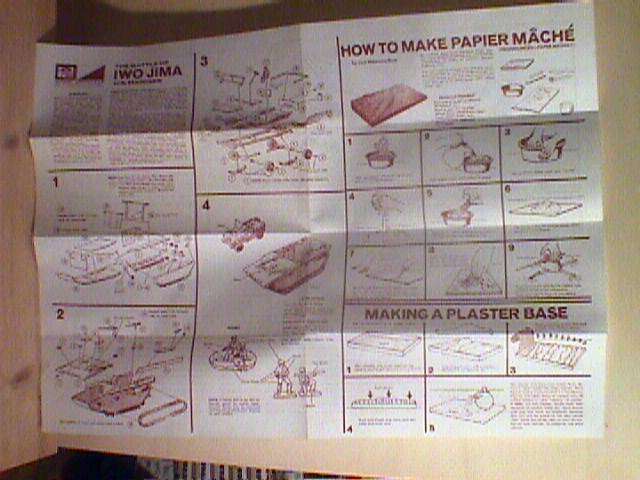 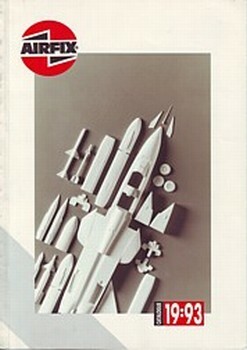 Hobby - Made in Japan by Tsukada - released in 1988. 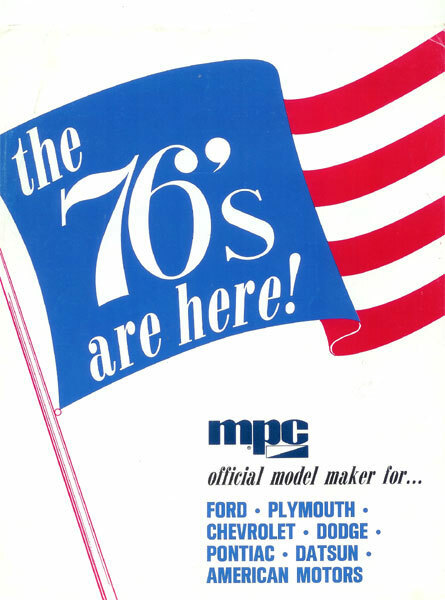 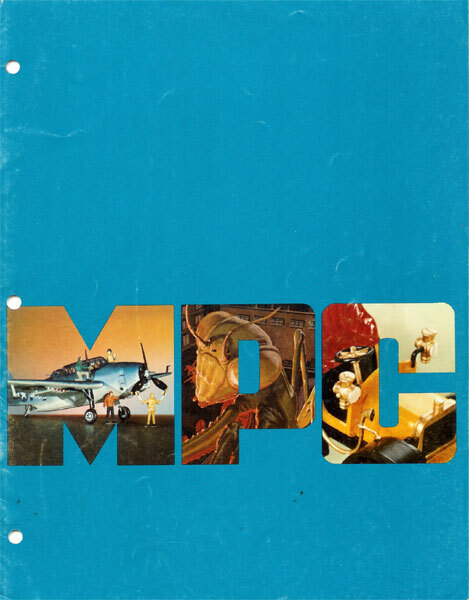 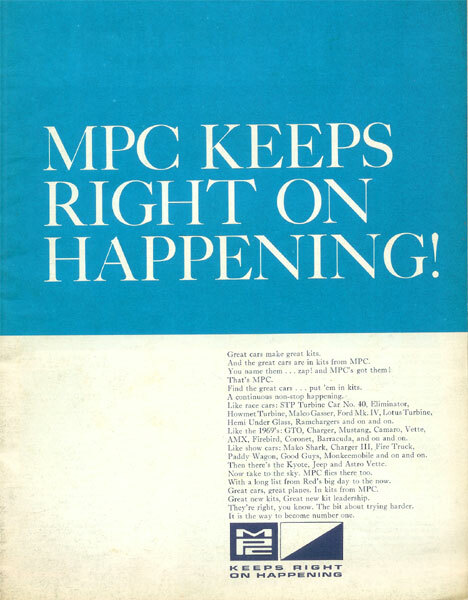 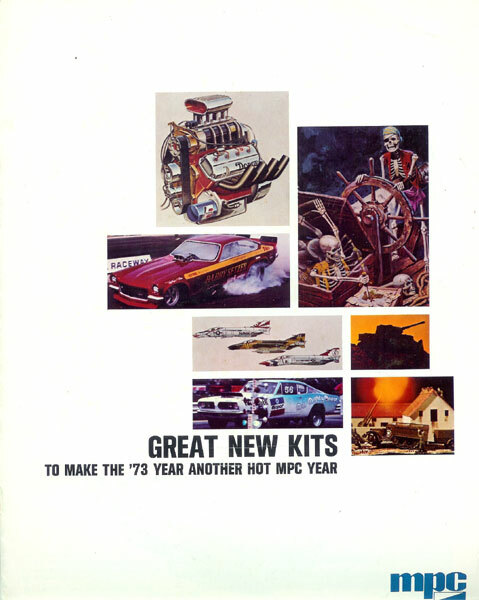 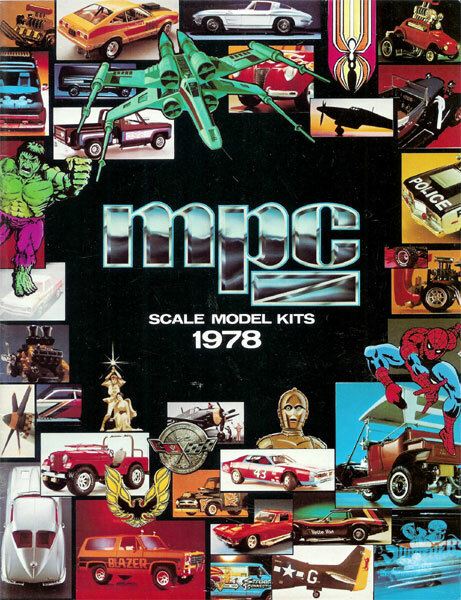 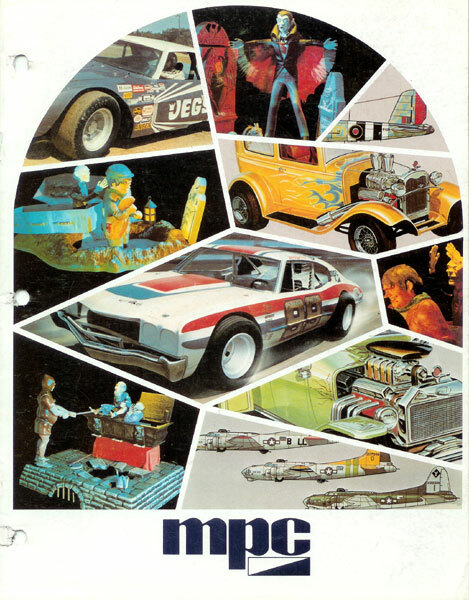 MPC - Made in the USA - interval of release 1981-1985. 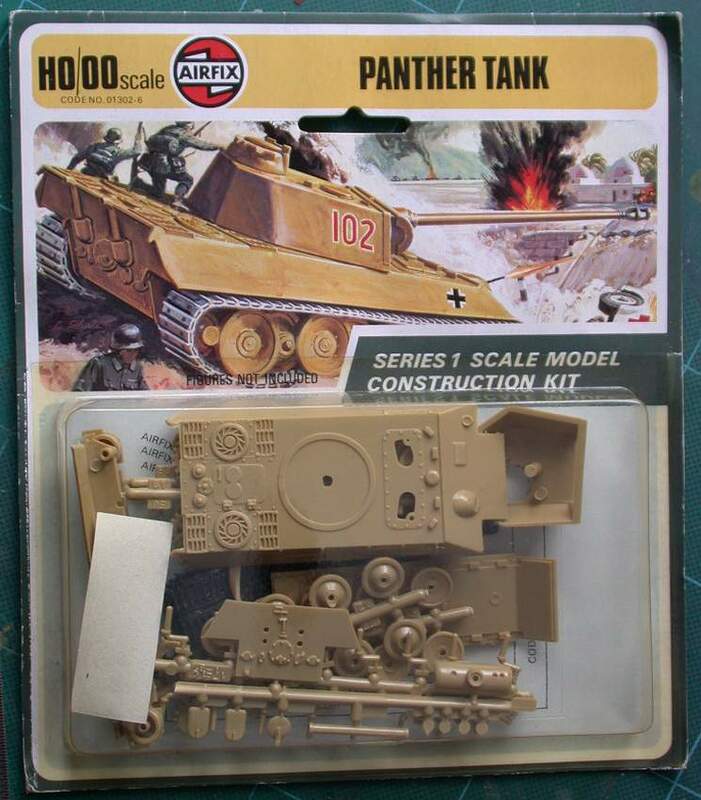 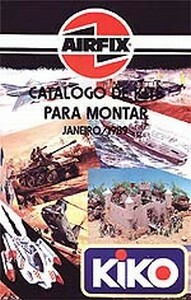 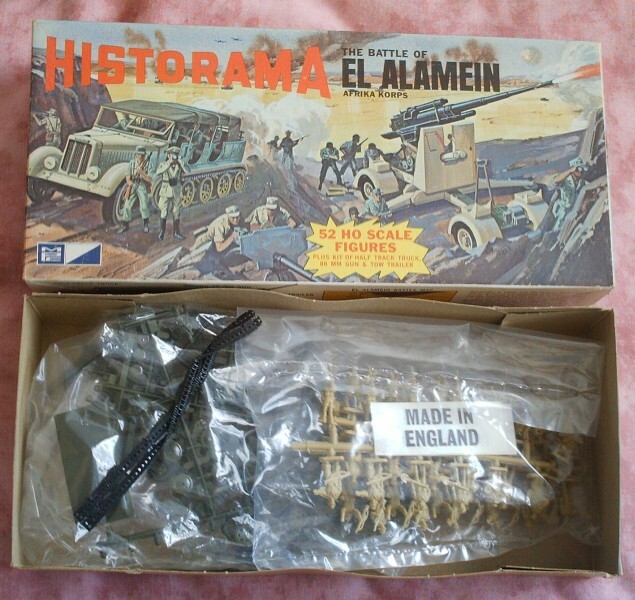 Kit 2-8001 - Historama - tank battle of El Alamein. 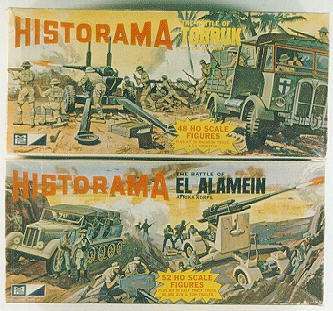 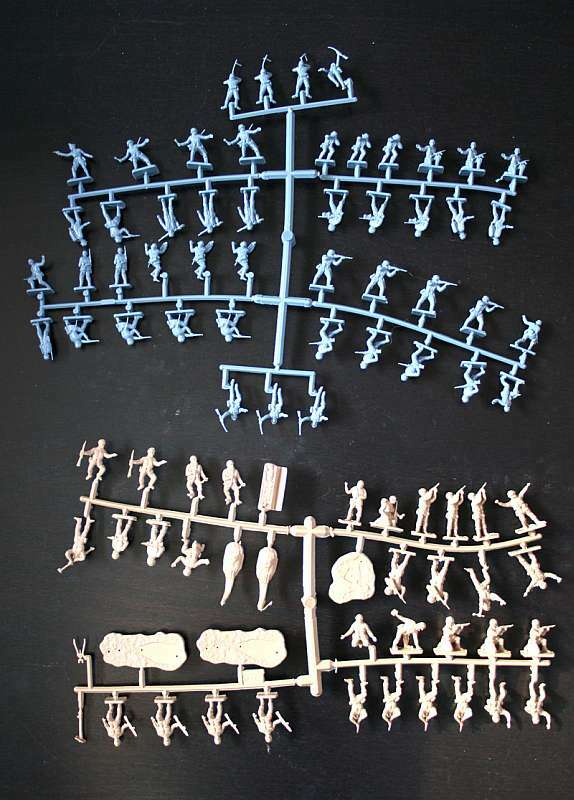 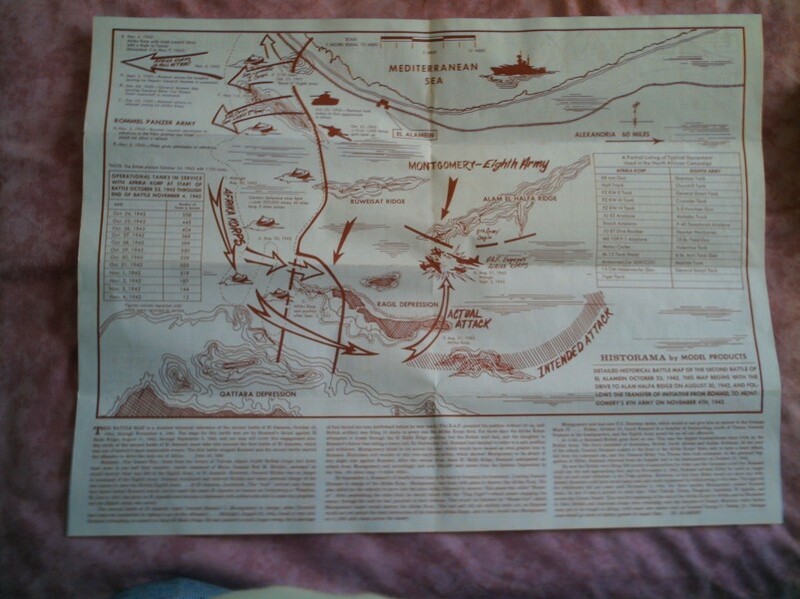 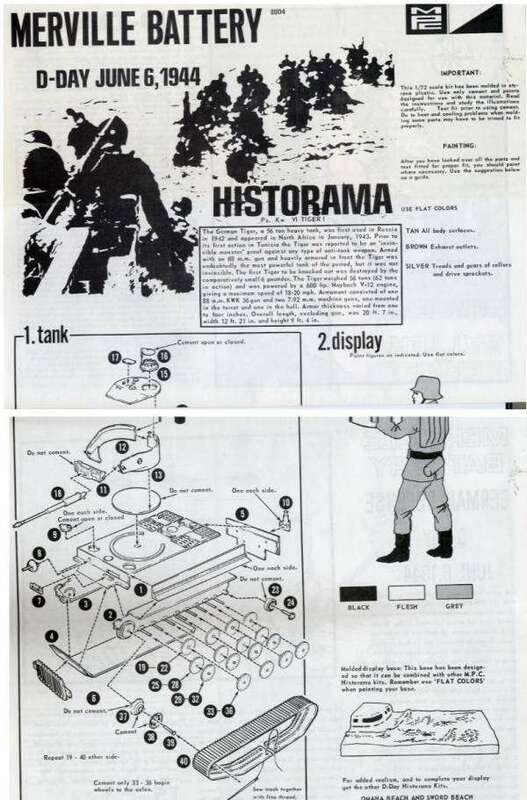 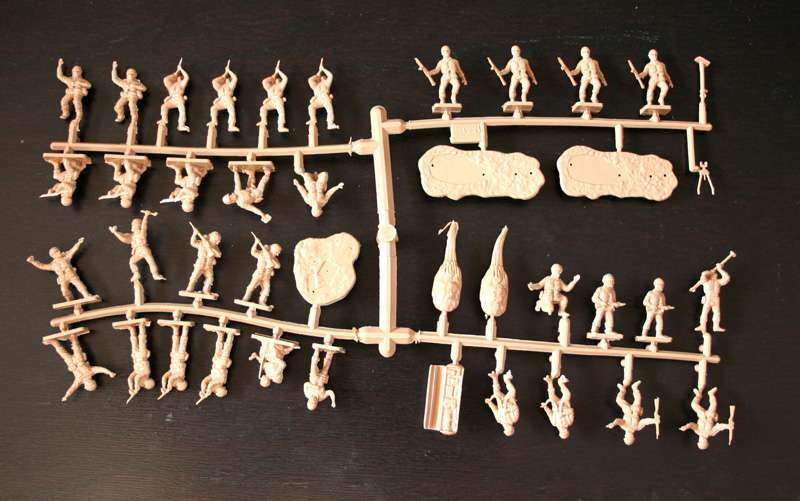 Kit 2-8002 - Historama - The battle of Tobruk. 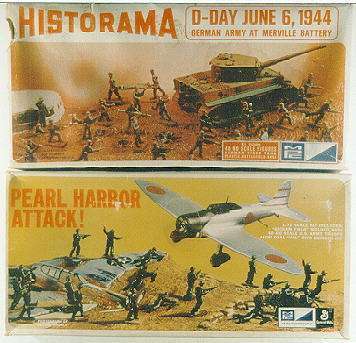 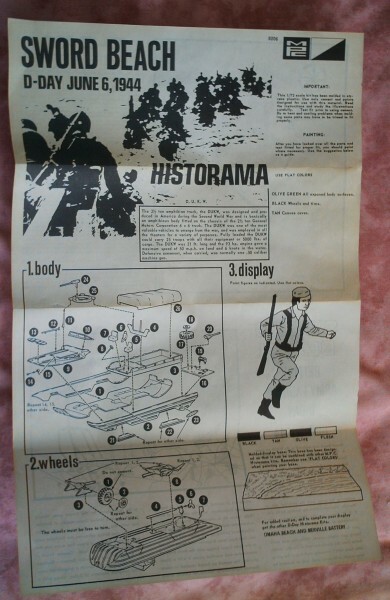 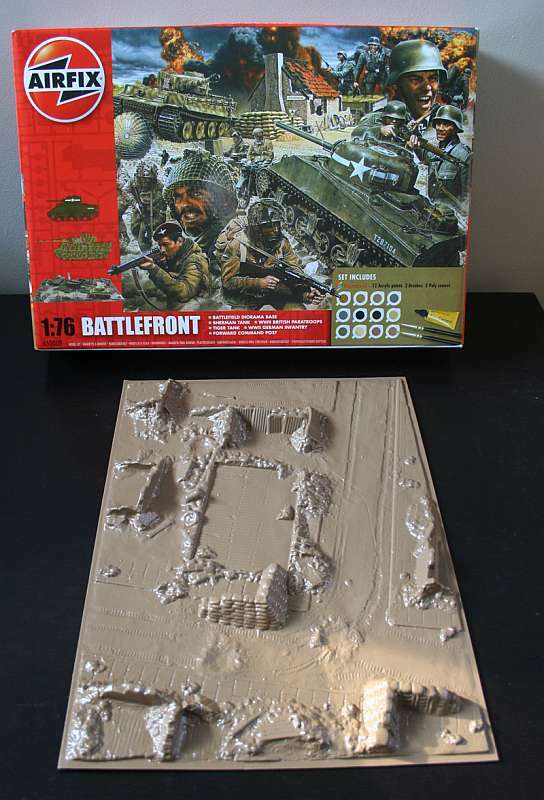 Kit 2-8003 - Historama - The battle of Iwo Jima. 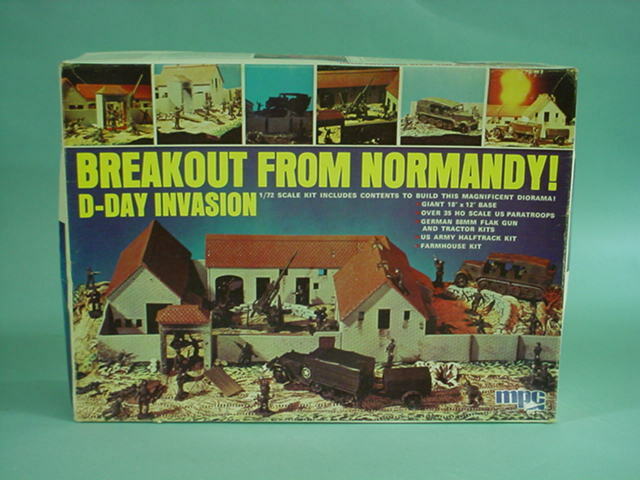 Kit 2-8004 - Historama - D-Day - Merville June 06 - German army Merville battery. 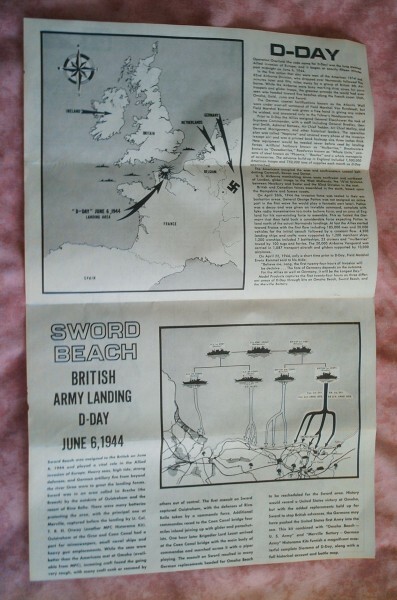 Kit 2-8006 - Historama - D-Day - Merville June 06 - British commando's Sword beach. 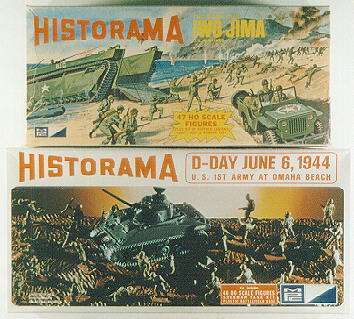 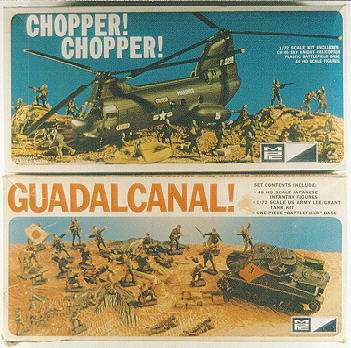 MPC Diorama's - Super Historama. 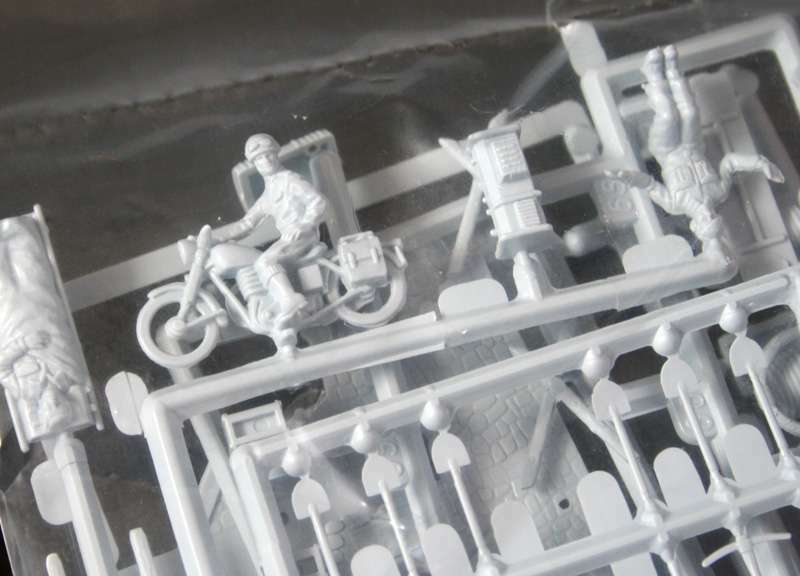 Bellona and Battle-HO-Rama diorama accessoires - Out of production. 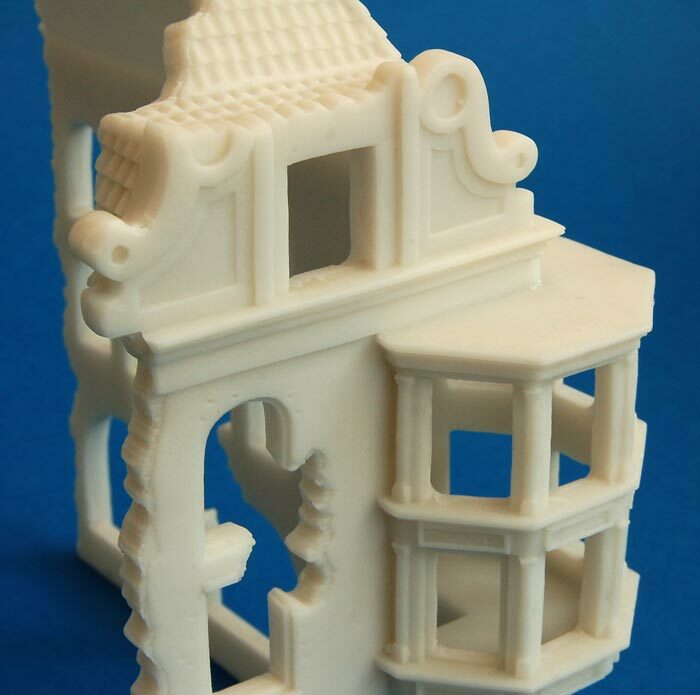 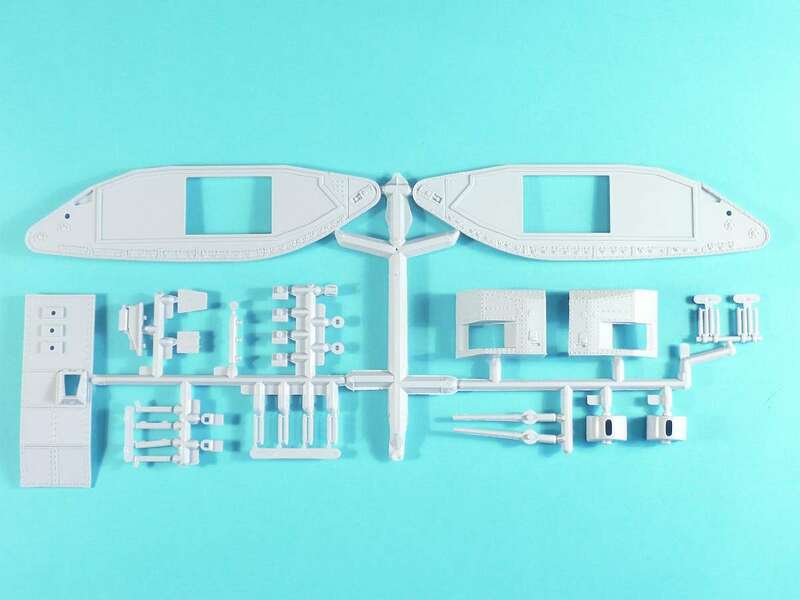 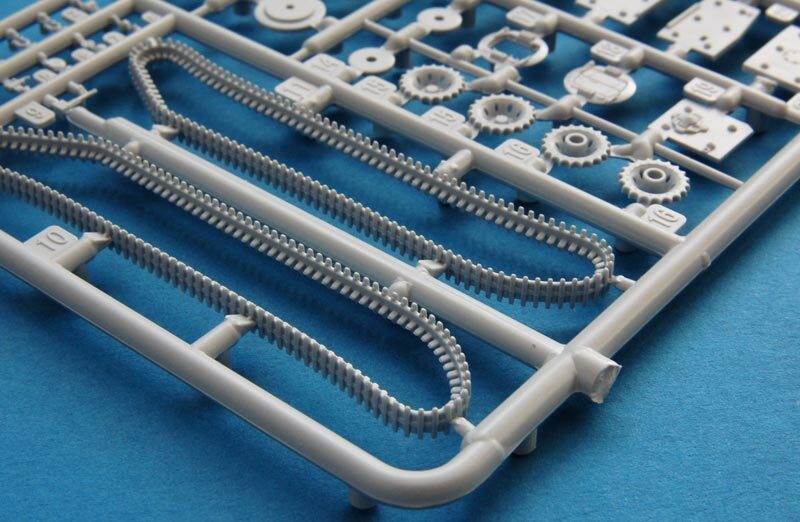 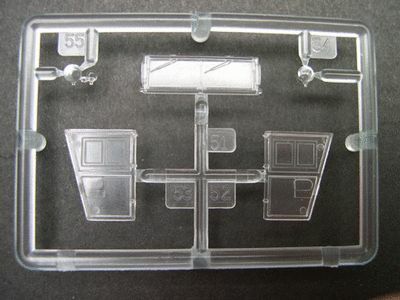 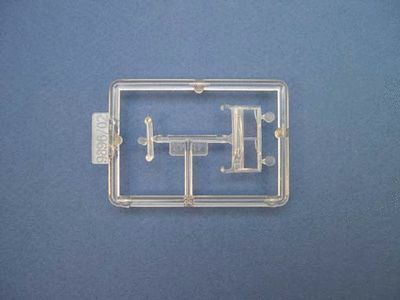 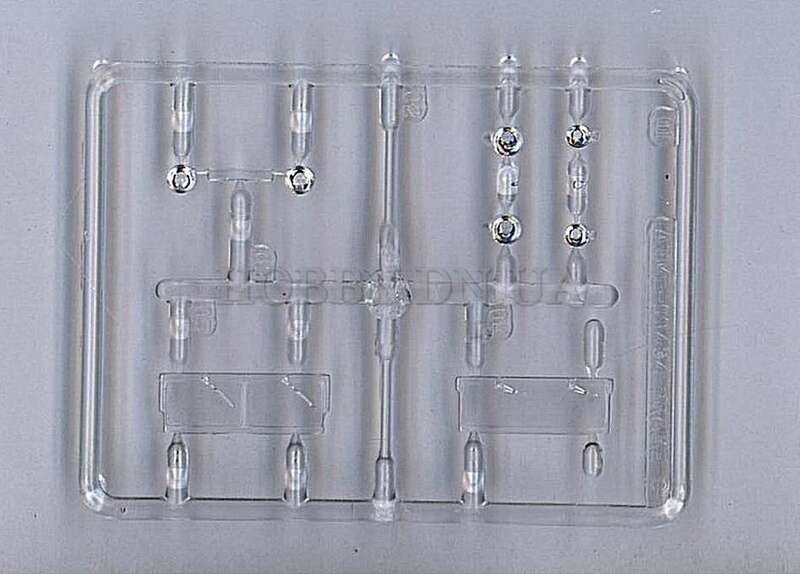 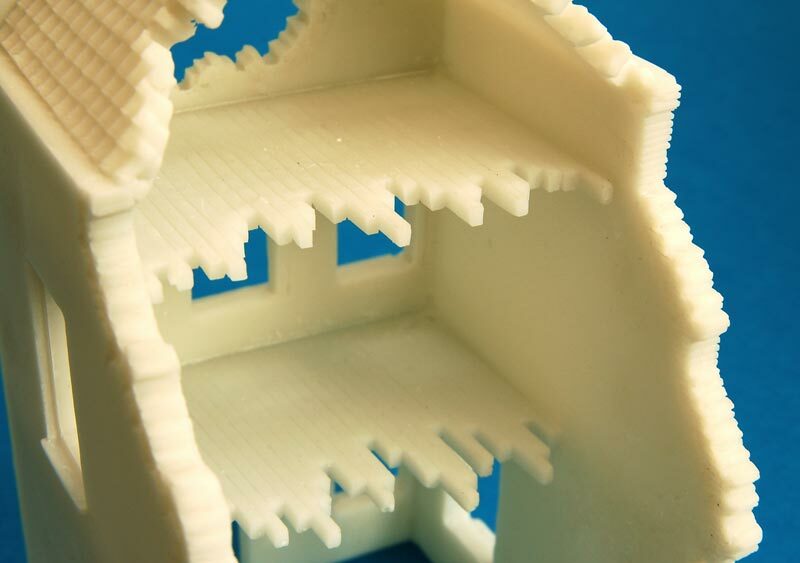 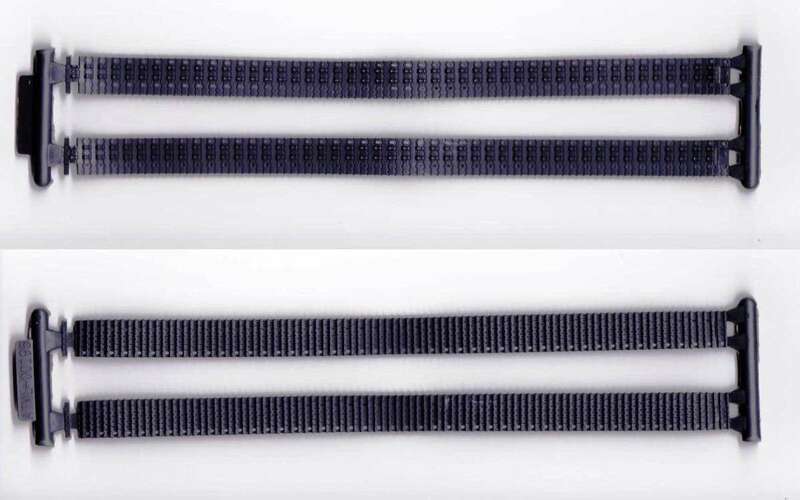 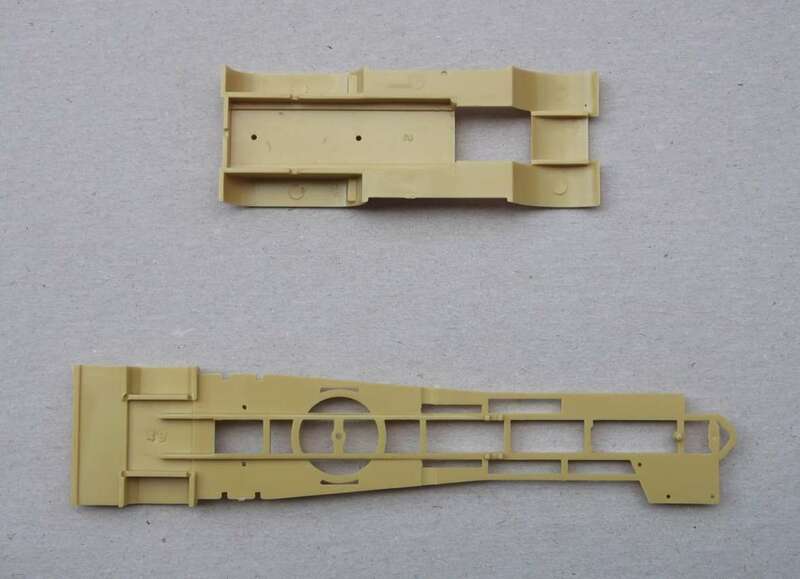 Bellona sets from Micro Mould Plastics (Unifax group), have appeared in various header-cards over the years and were sold as Bellona, Micro Mold, and Almark. 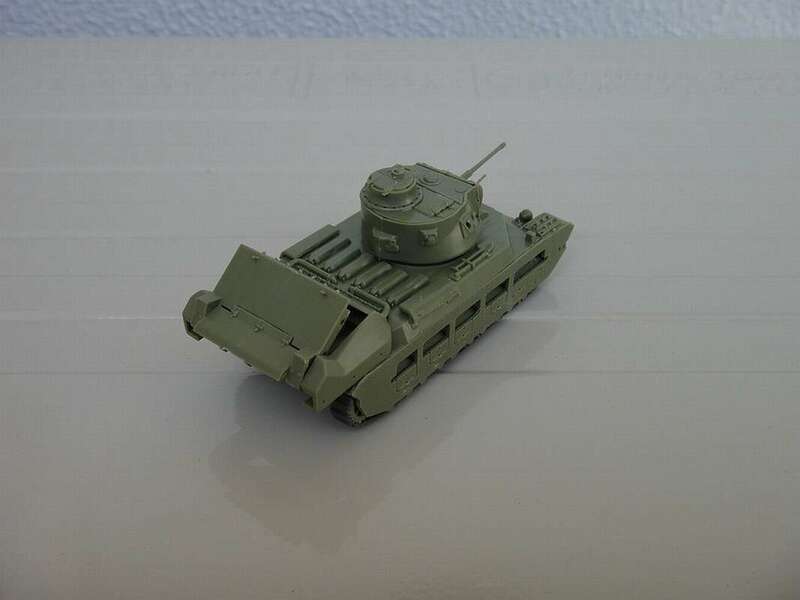 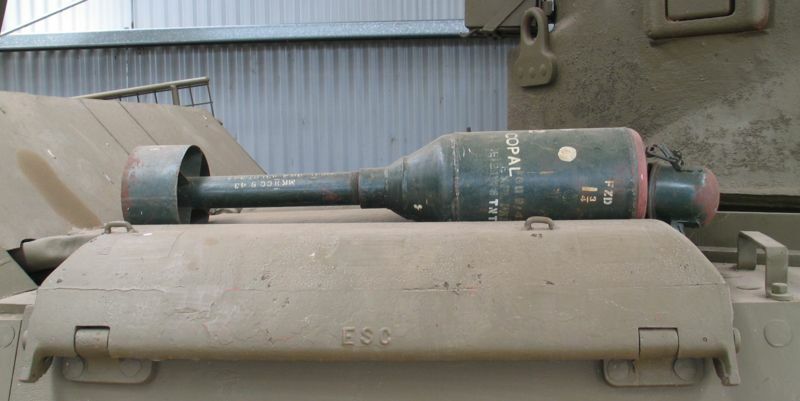 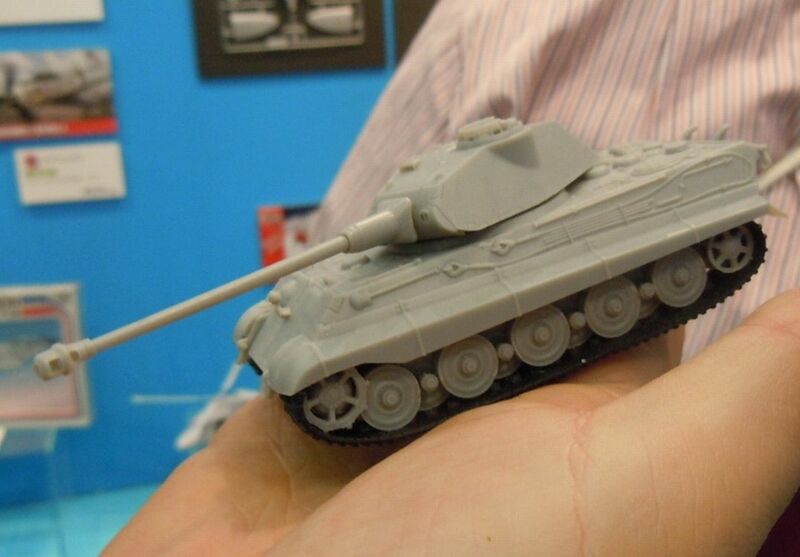 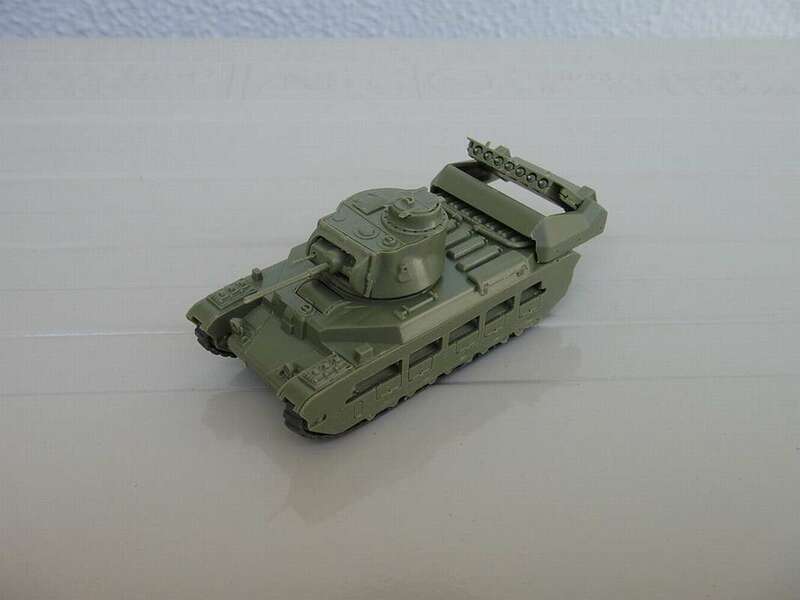 They also supplied some to Roco Minitanks. 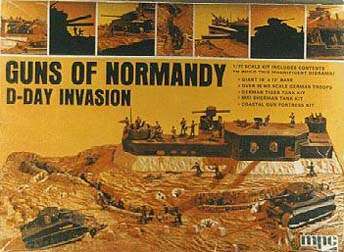 They actually came in a wide variety of colors, from pure white and grey to dark olive covering most shades of sand and fawn on the way! 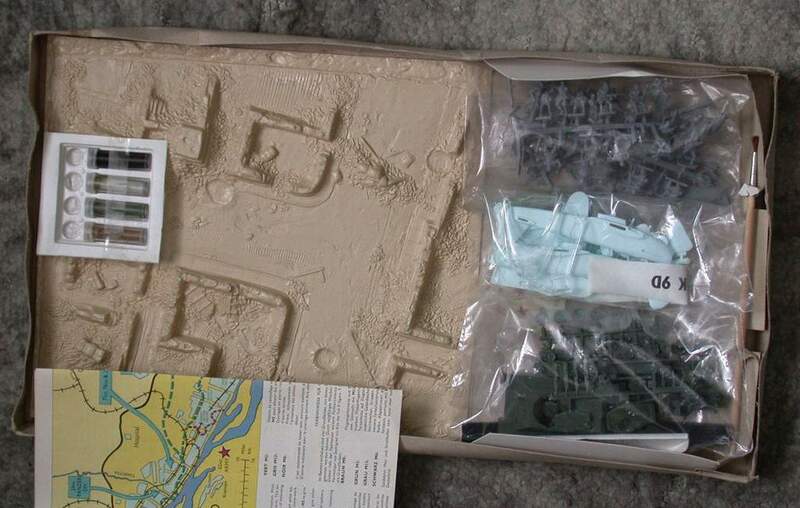 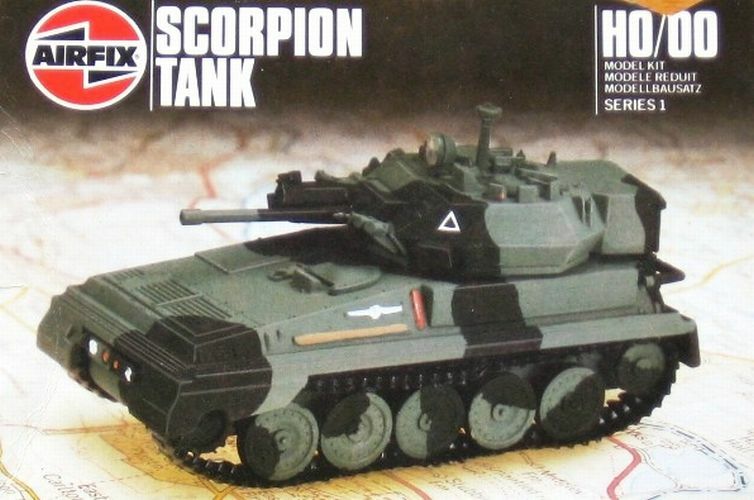 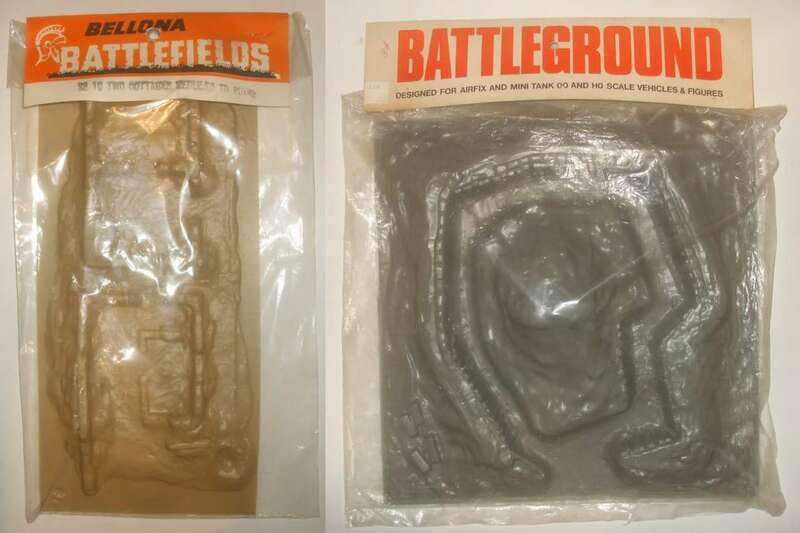 Battleground sets were made in Stockport in the UK, by Power Play/Mainstream Products, but seem to have been mostly sold in the US, probably in order not to get into a major war with Bellona. 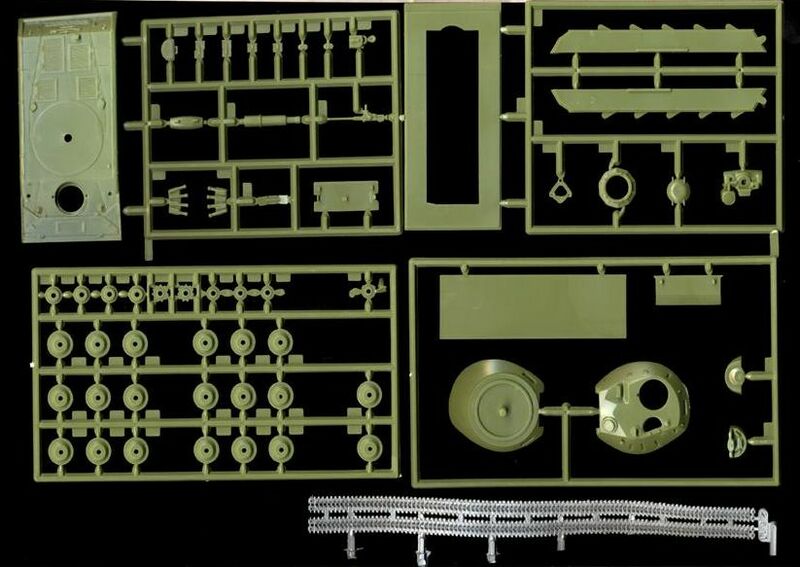 Some sets are similar to Bellona's, others, however, are quite unique. 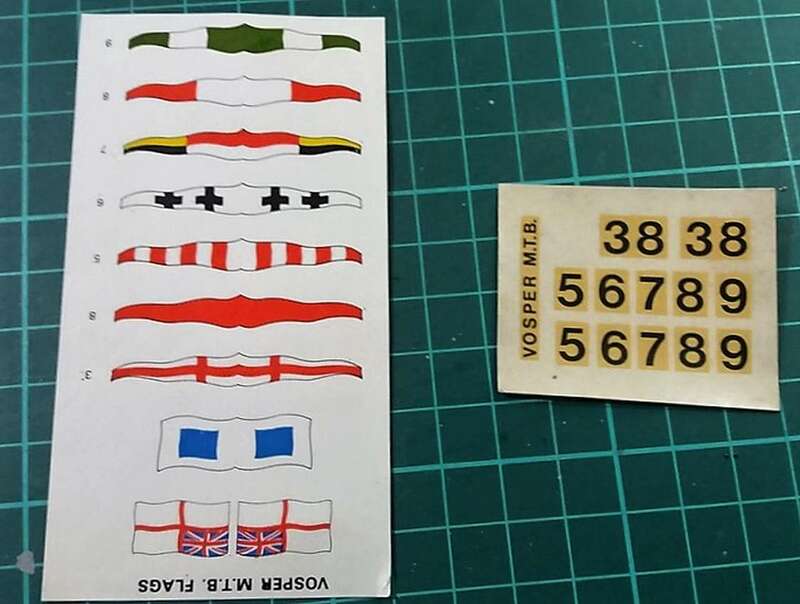 There seem to have been at least 18 of which I have identified 13. 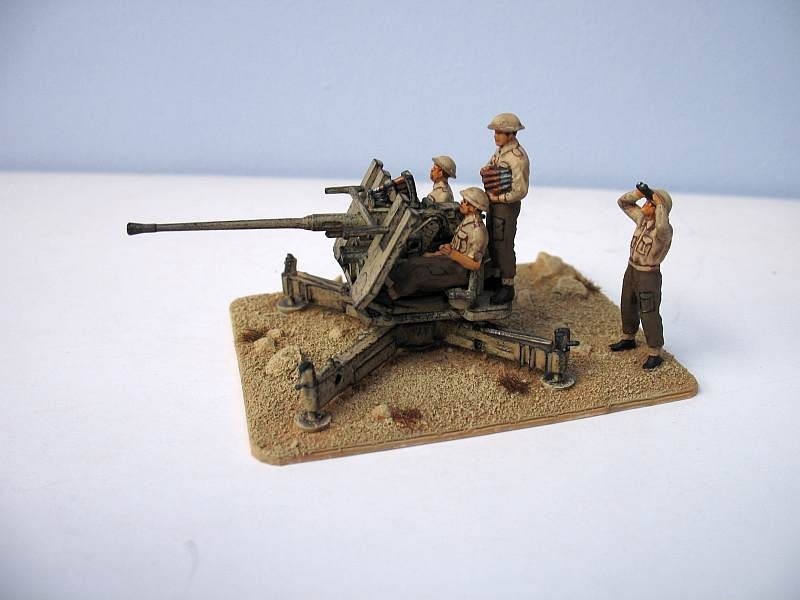 M6-49 25-Pounder field gun with Quad limber and gun crew. 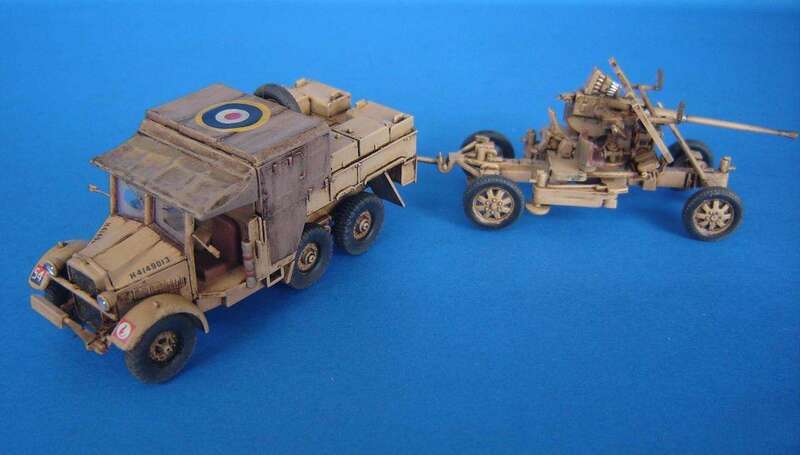 M7-49 Bristol Bloodhound and Land Rover. 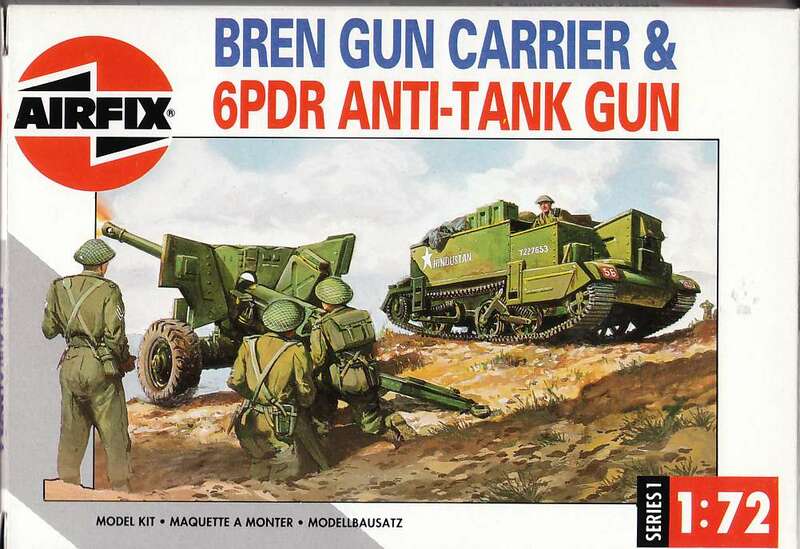 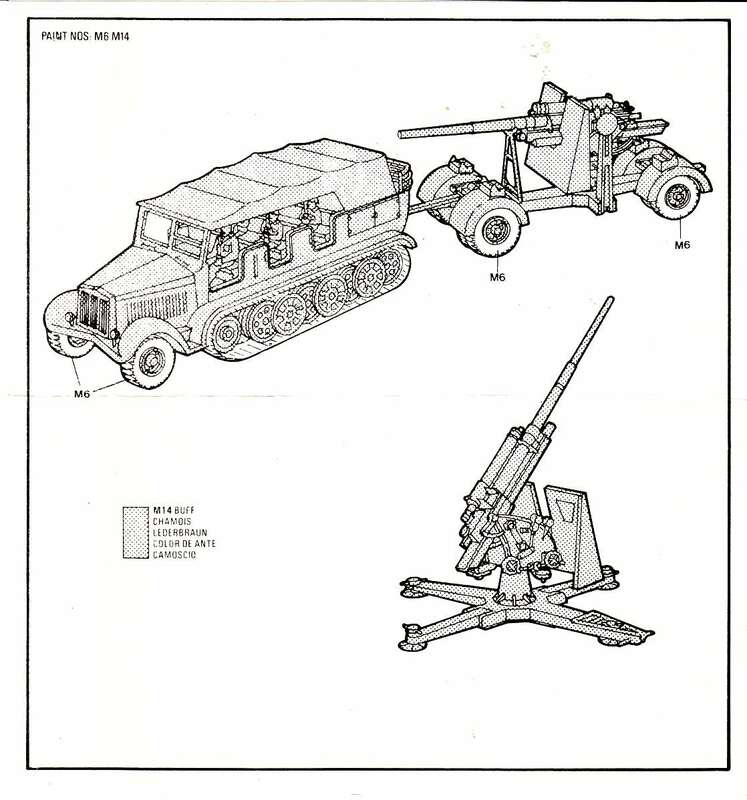 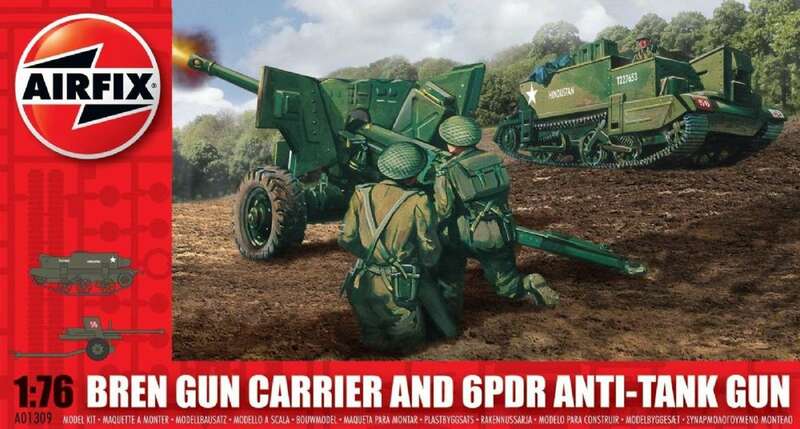 M9-49 Brengun aarrier with 6-Pounder AT gun. 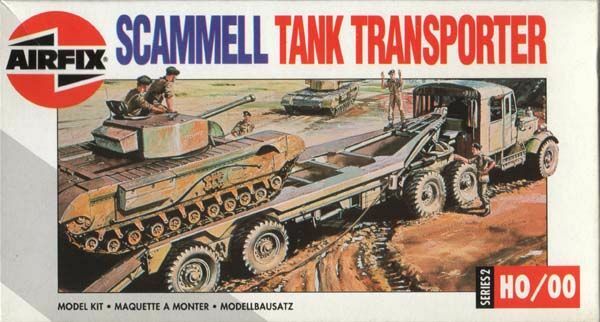 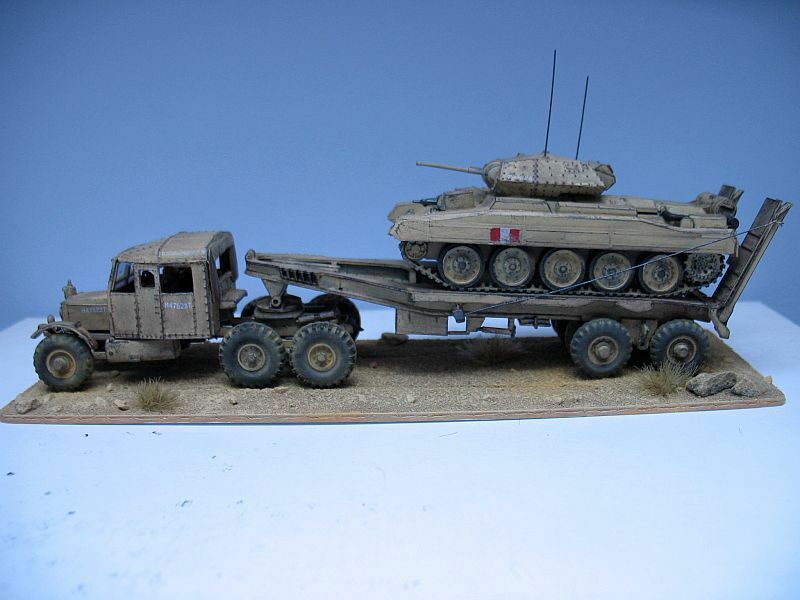 M1-79 Scammell 30-ton tank transporter. 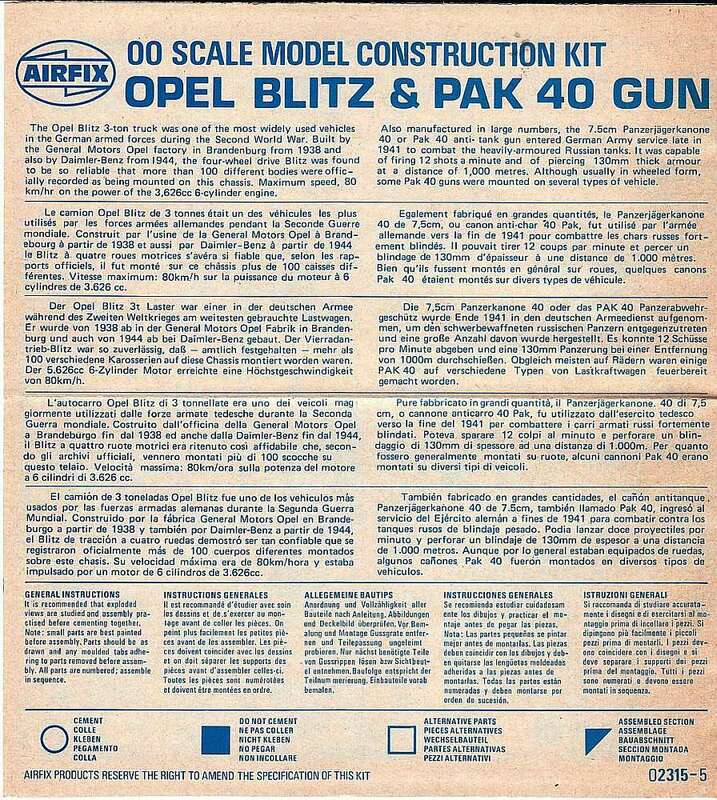 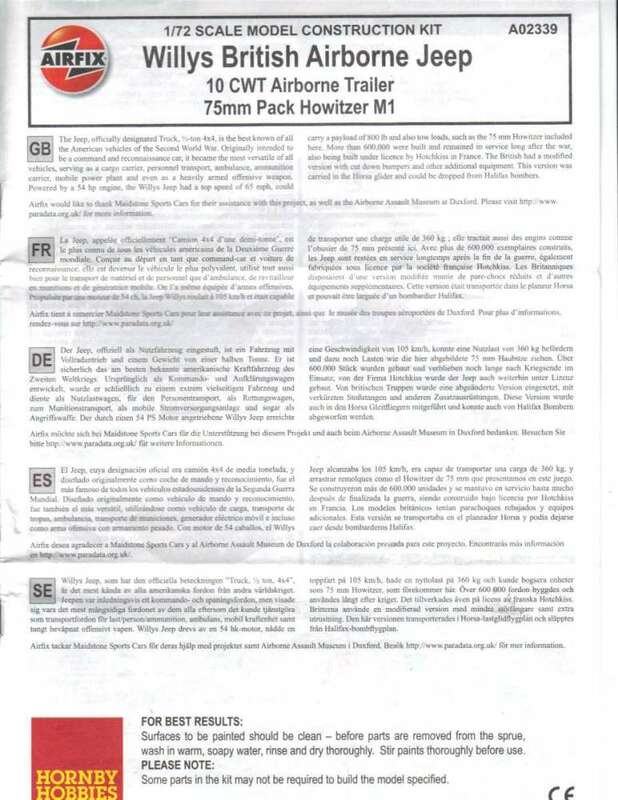 Mr. A. Kikoler (KIKO) took REVELL to Brasil around 1960 and all (hundreds) of Revell kits produced worldwide are also produced in Brasil, even with similar boxtops. 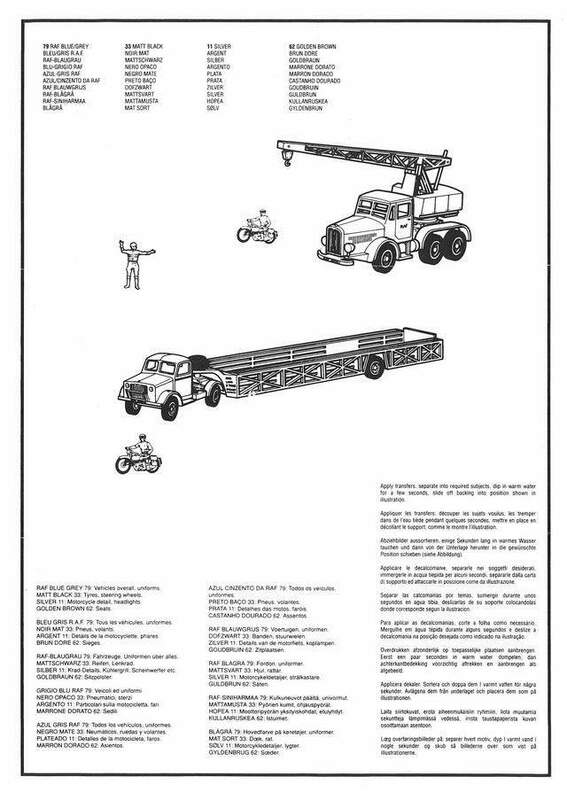 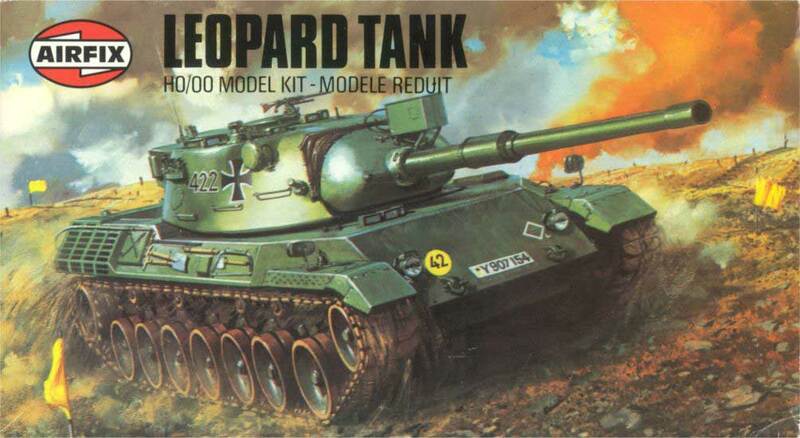 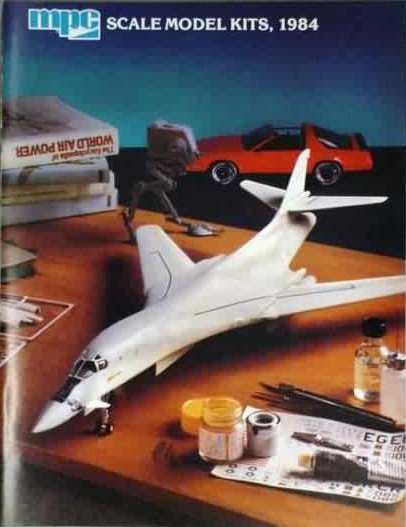 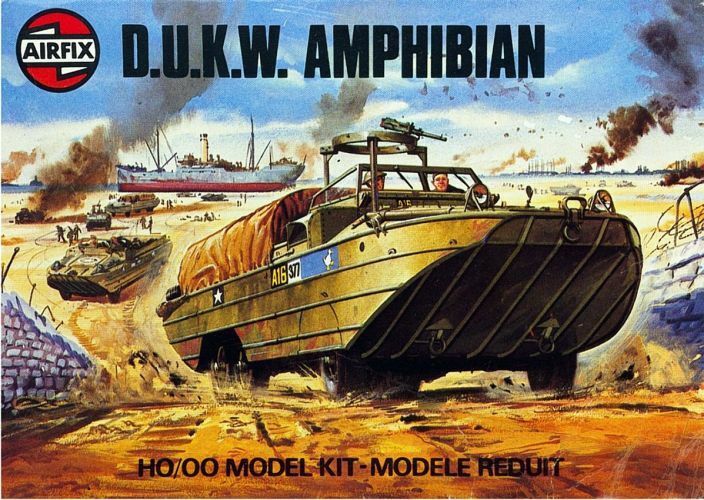 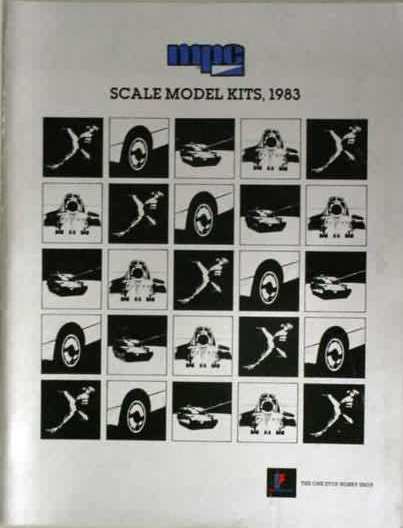 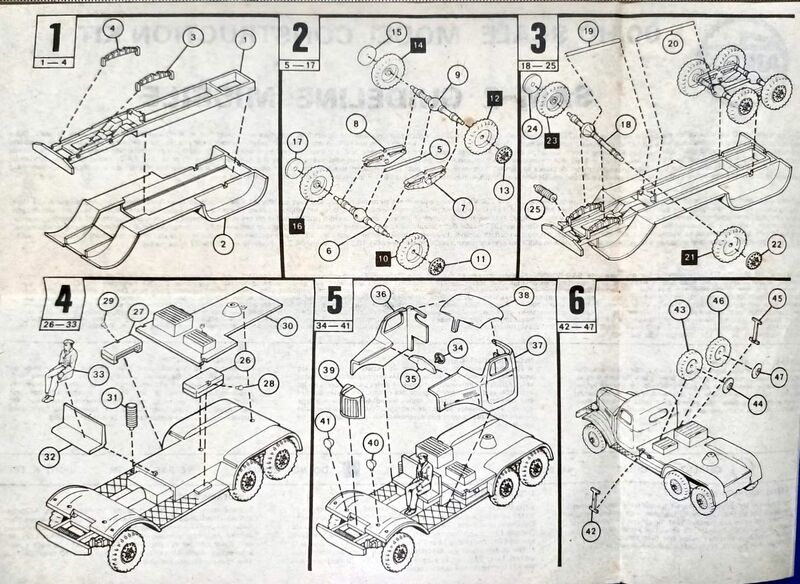 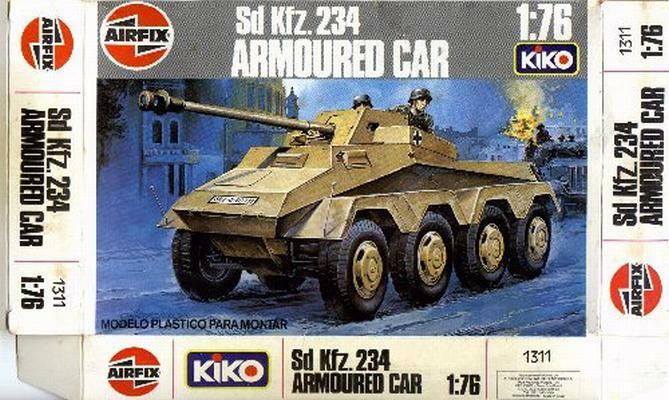 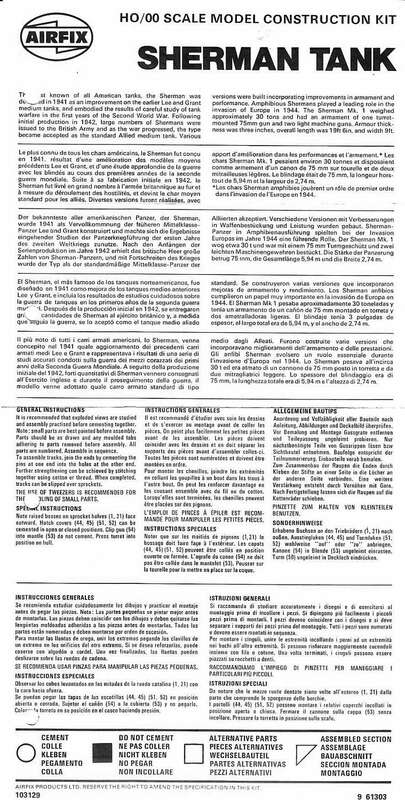 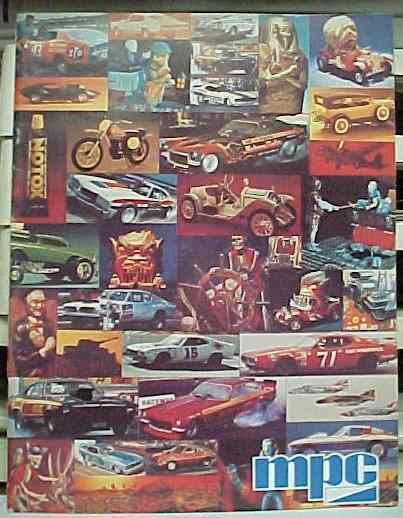 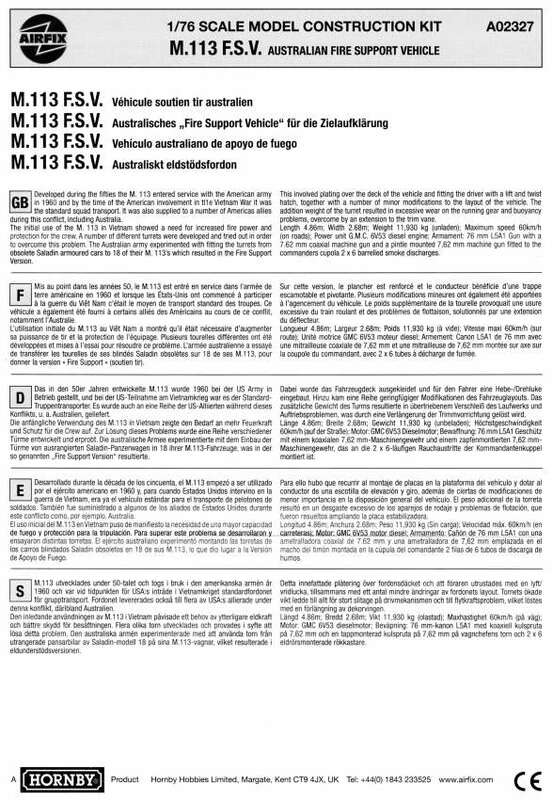 At around 1980 the KIKO brandname was added, thus becoming REVELL KIKO and afterwards also HELLER KIKO, some 20 kits only, and AIRFIX KIKO, only 18 kits. 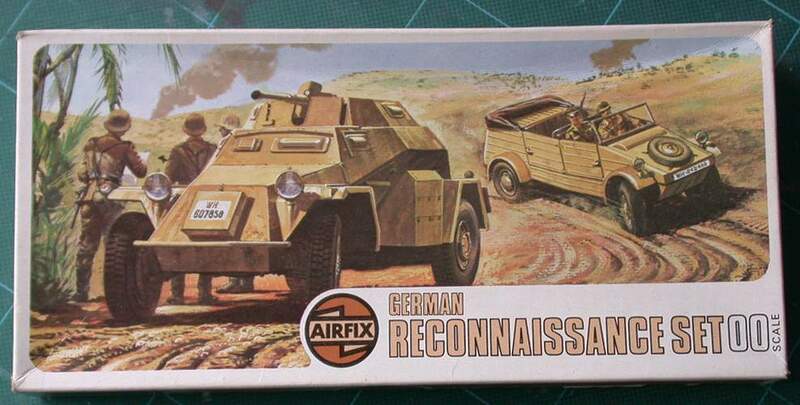 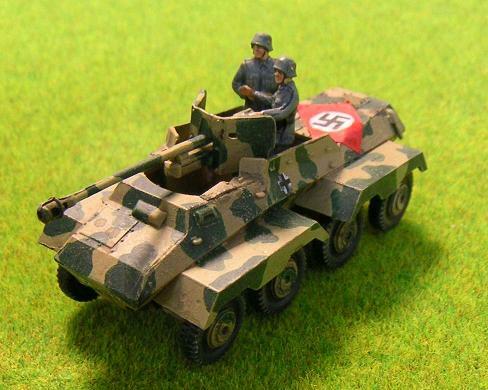 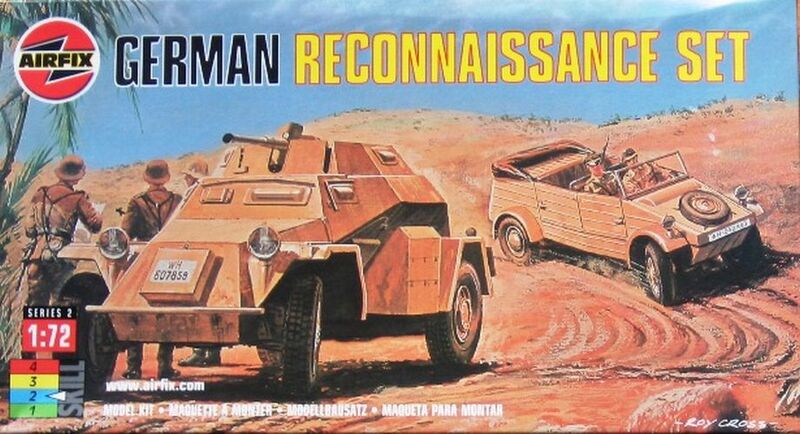 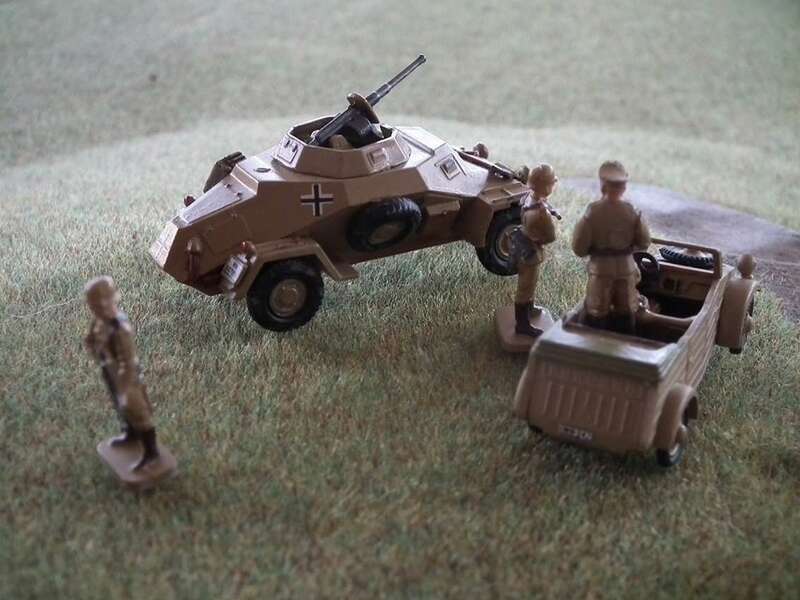 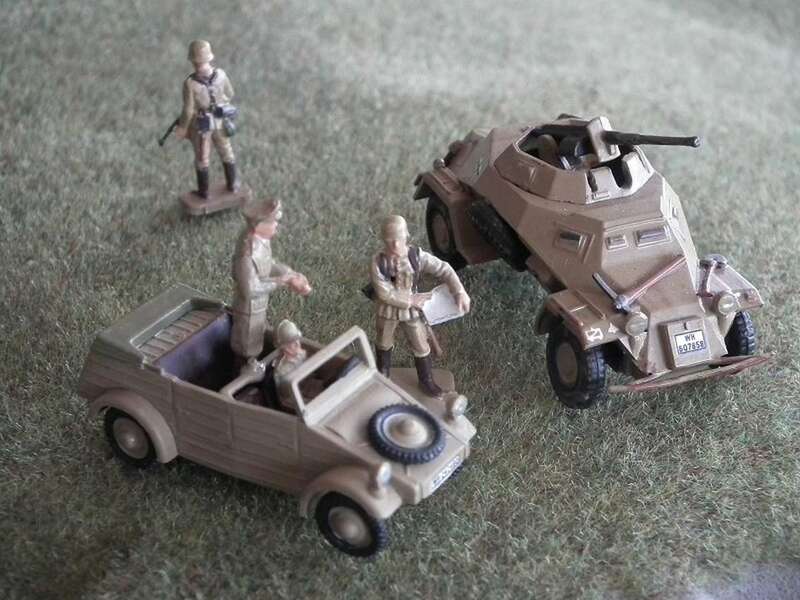 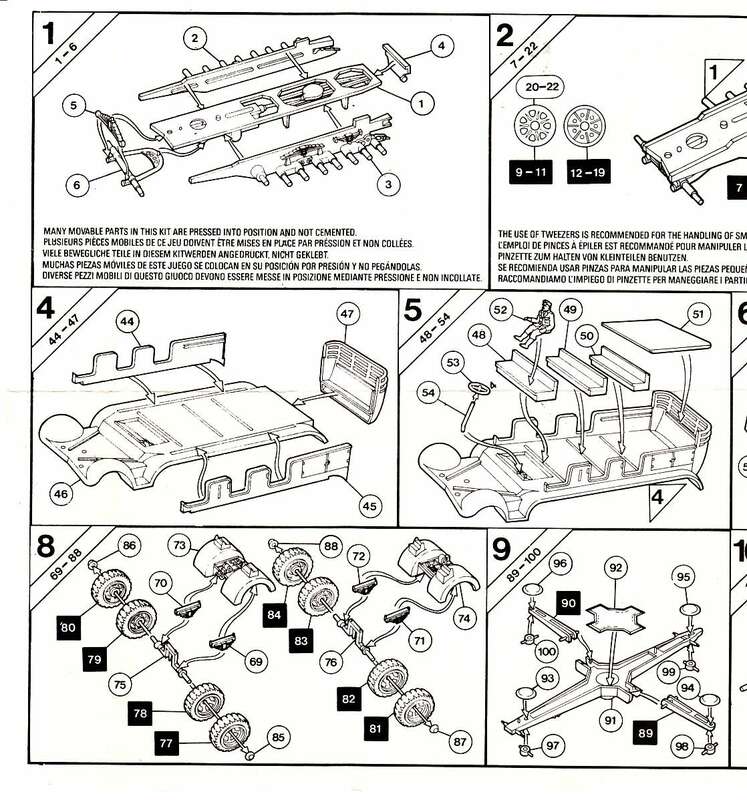 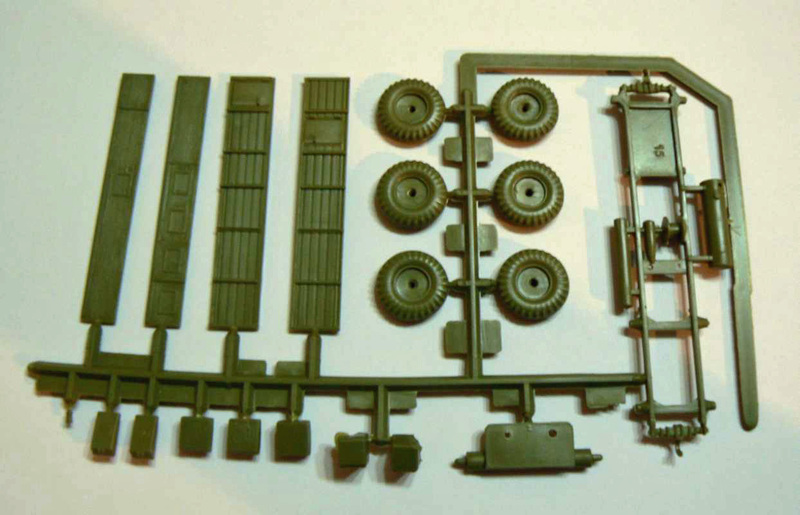 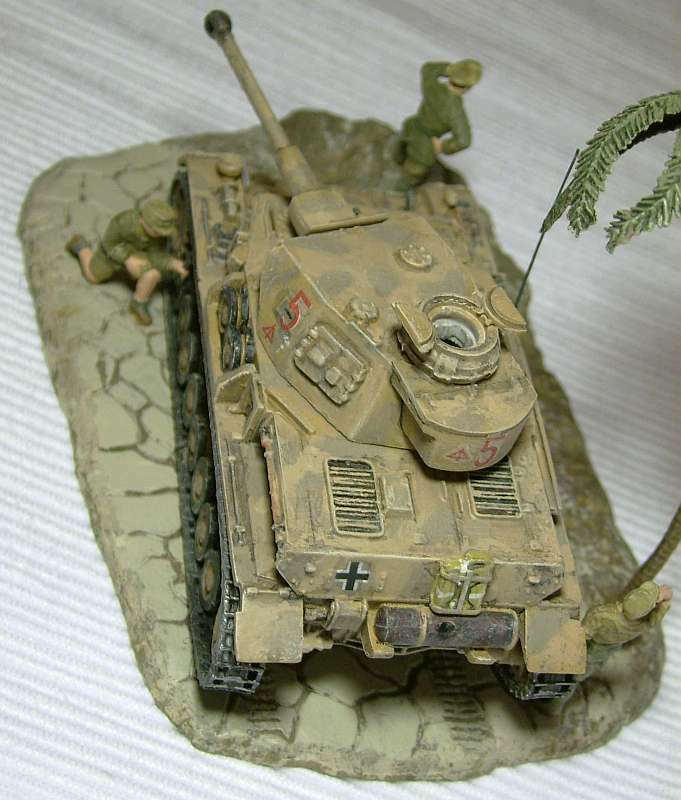 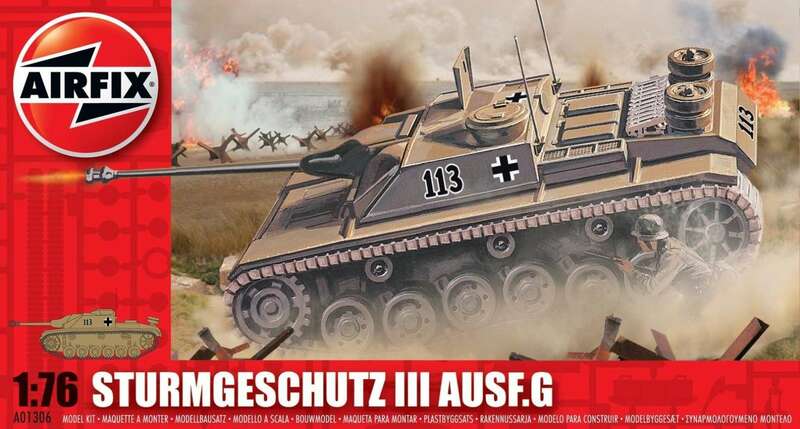 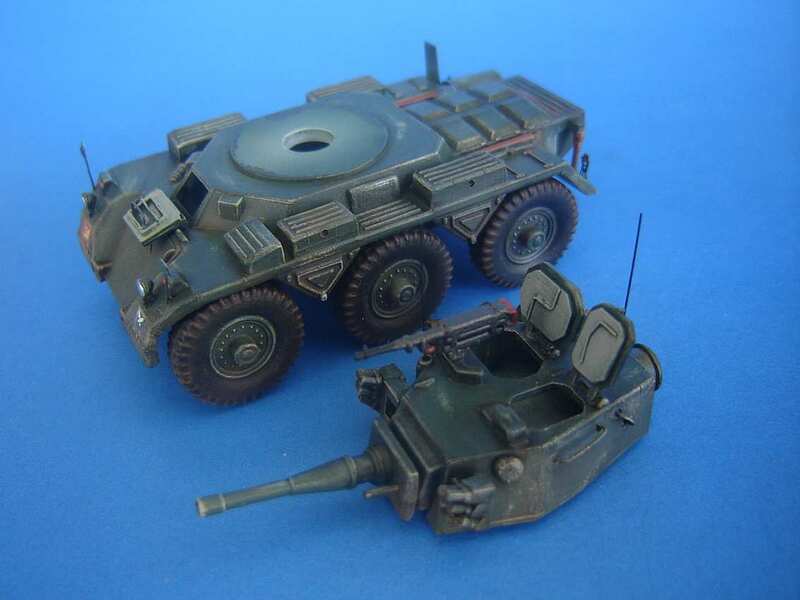 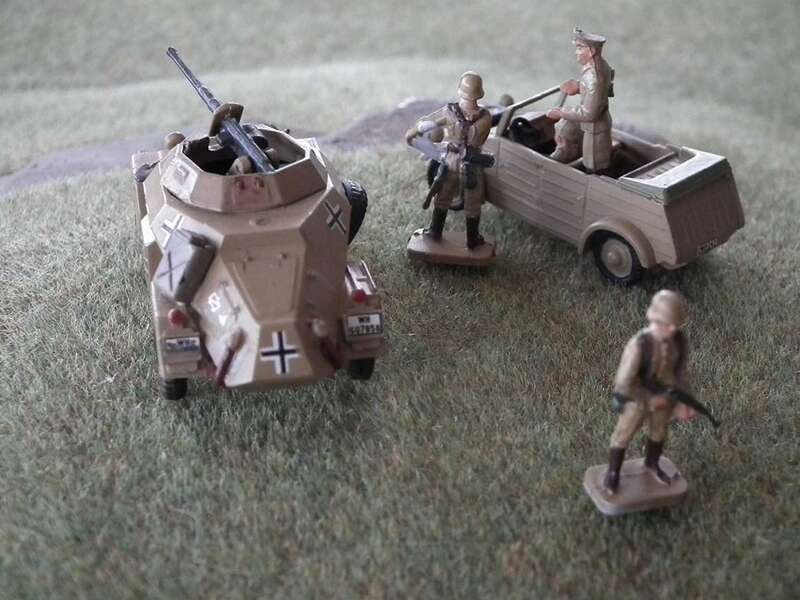 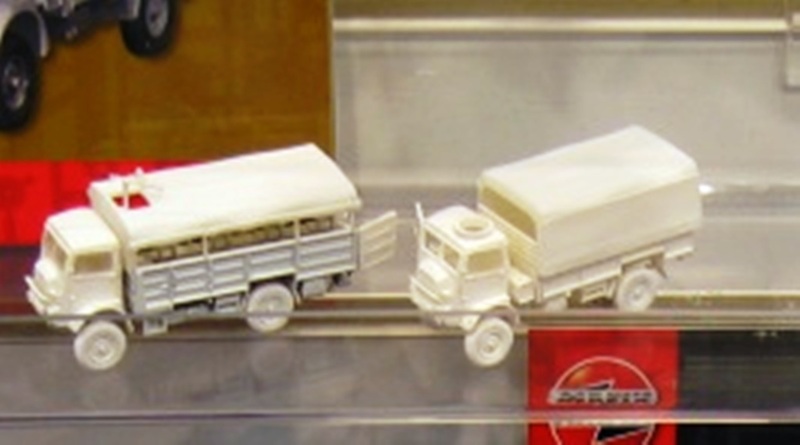 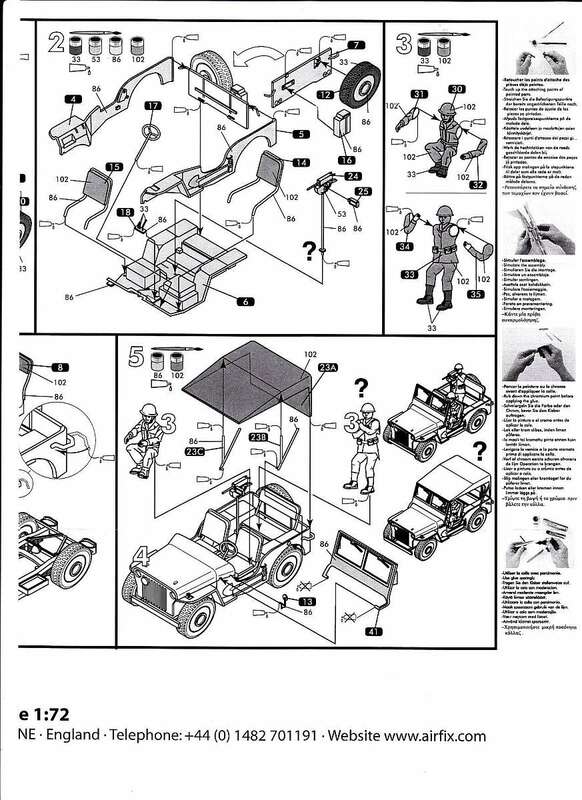 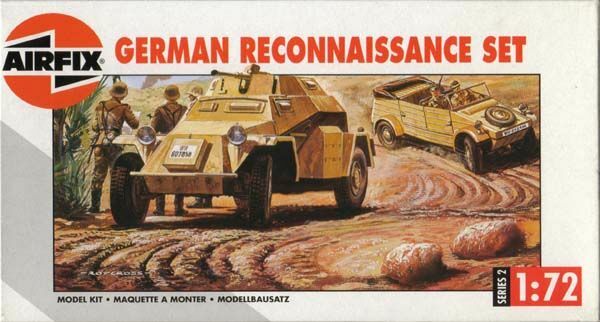 From AIRFIX only the Sdkfz 234 in 1/76 and Rommel's Halftrack (Sdkfz 250/3) in 1/32 were made in Brasil. 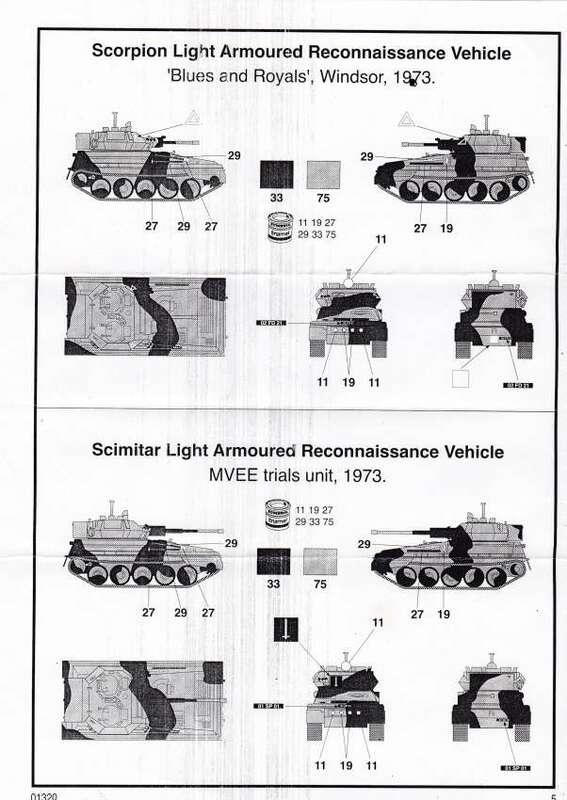 None of HELLER Armor was made in Brasil! 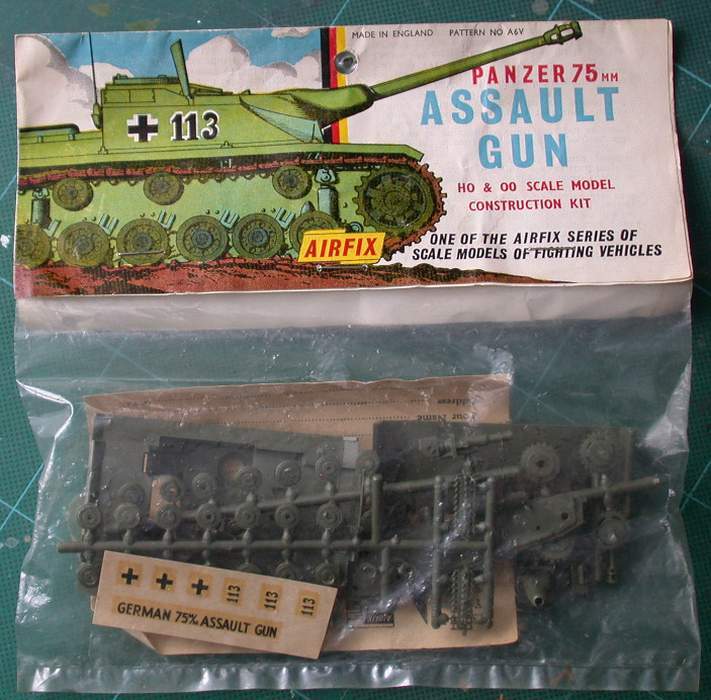 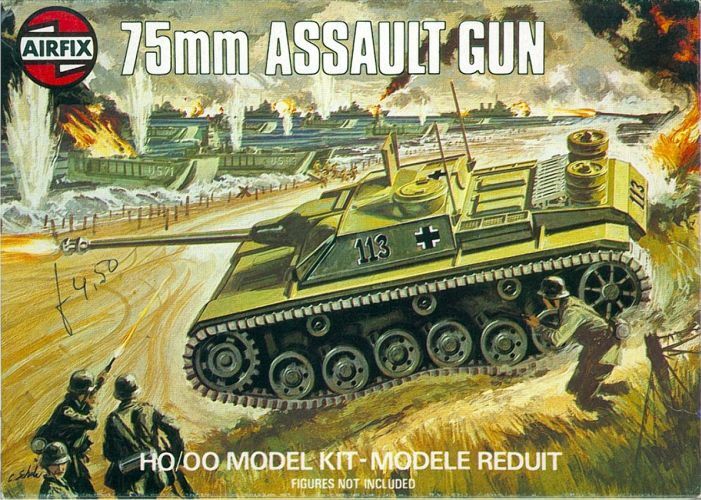 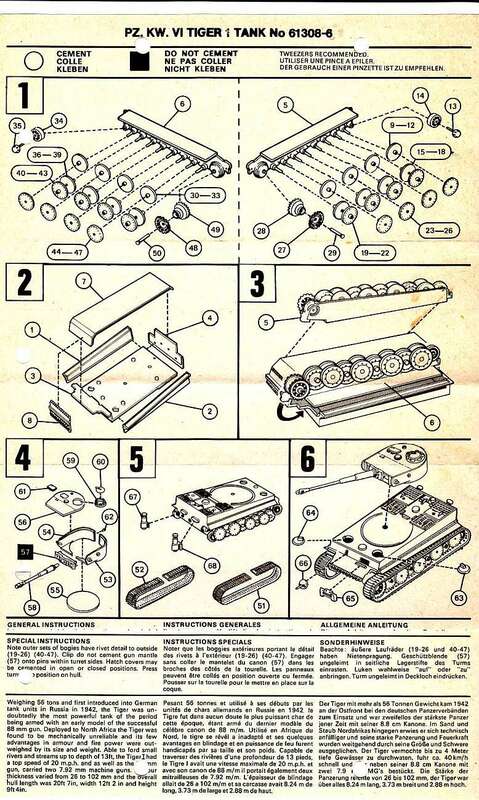 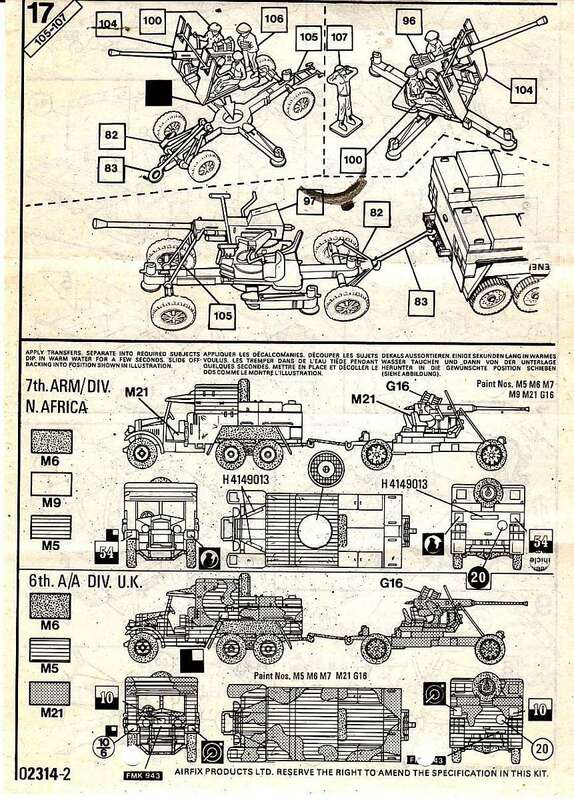 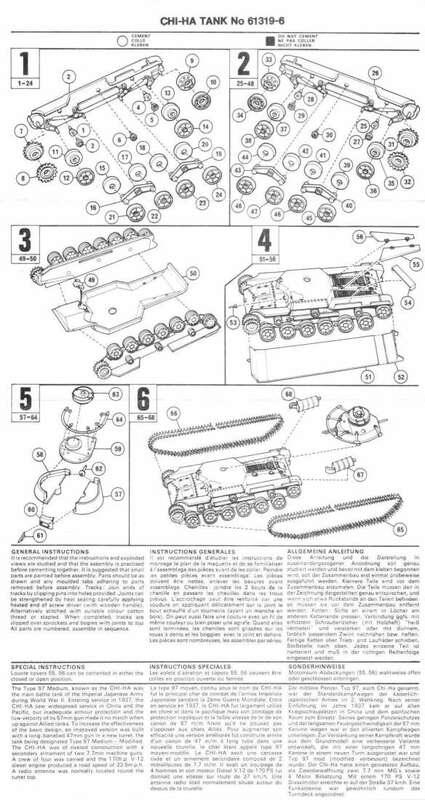 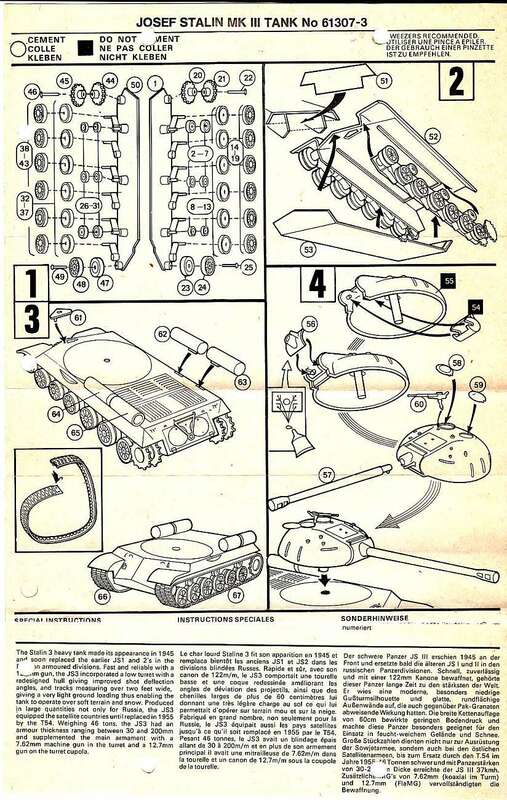 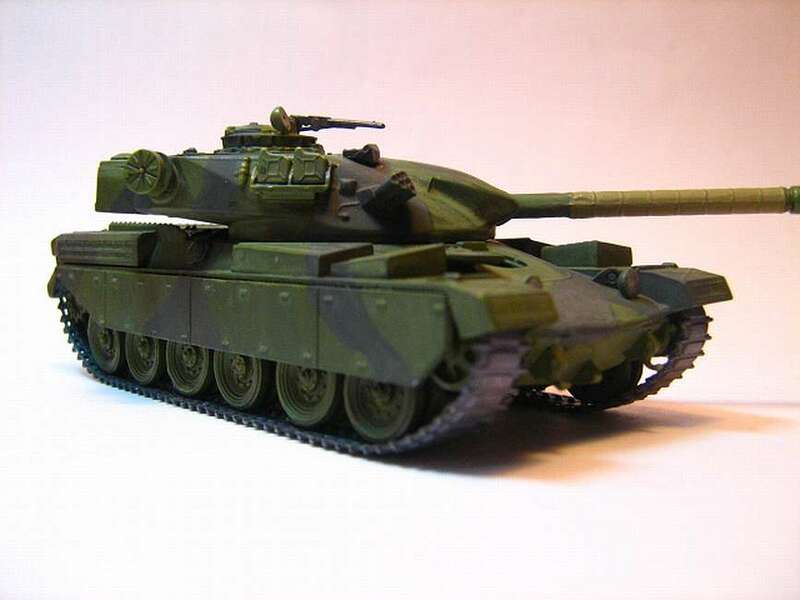 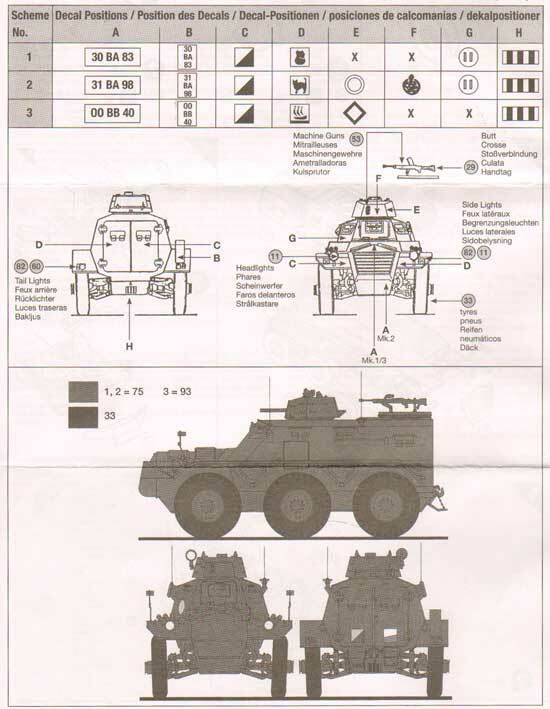 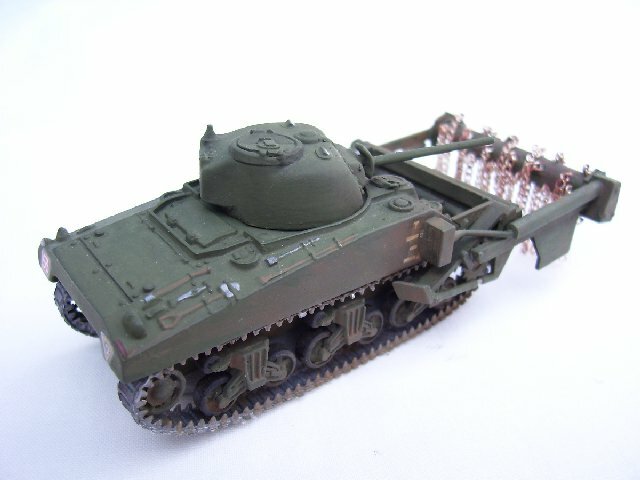 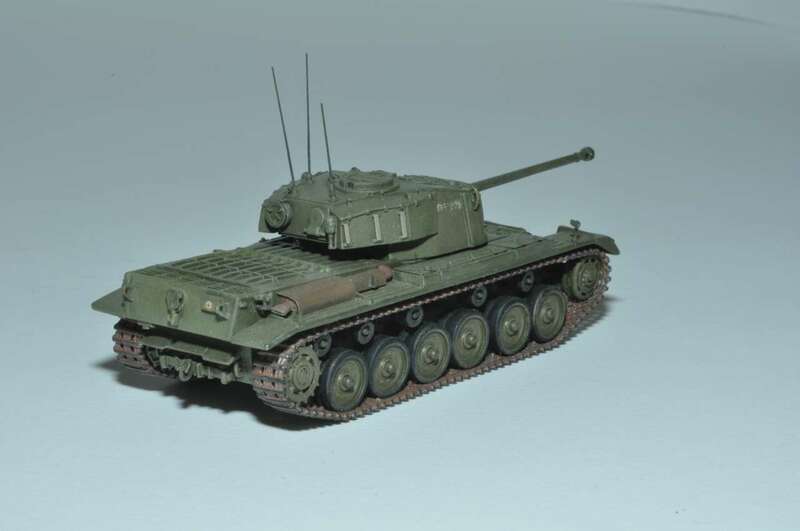 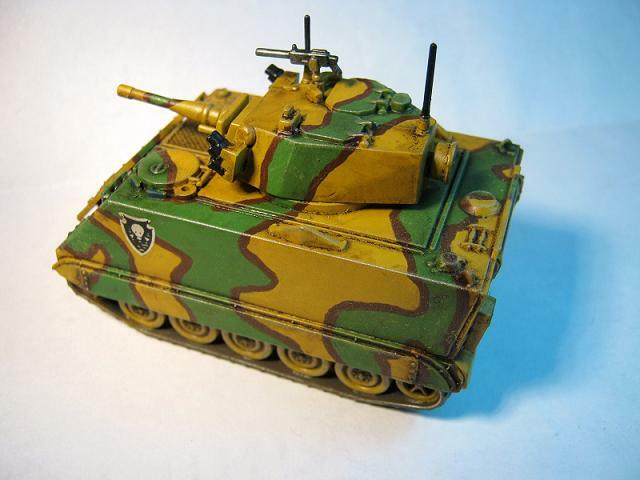 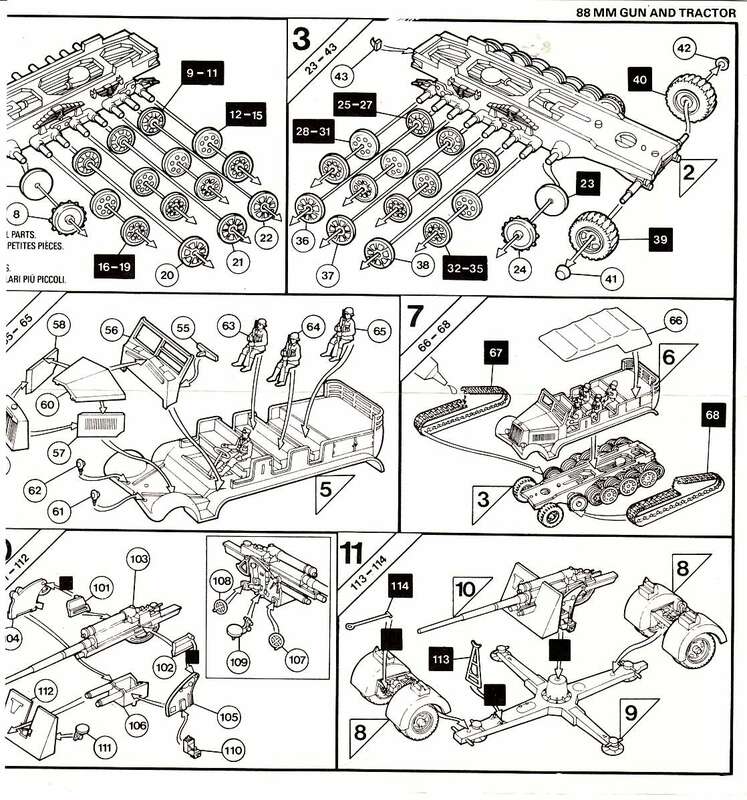 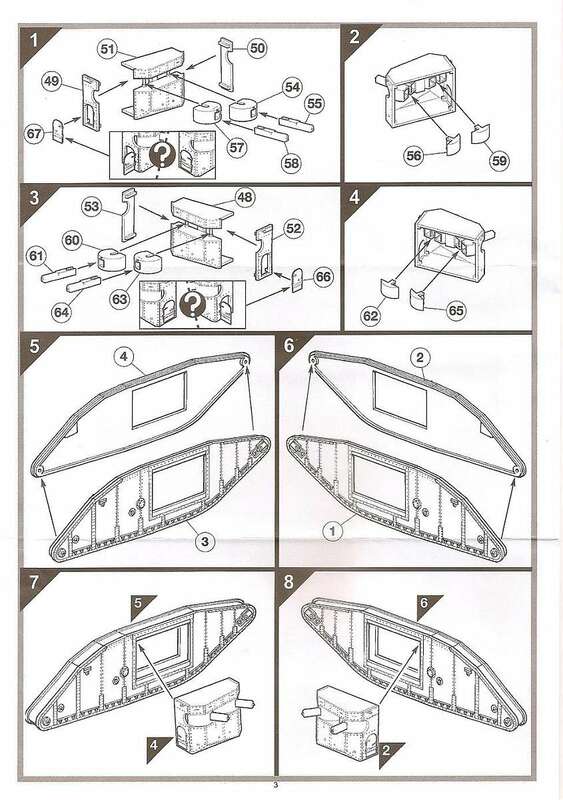 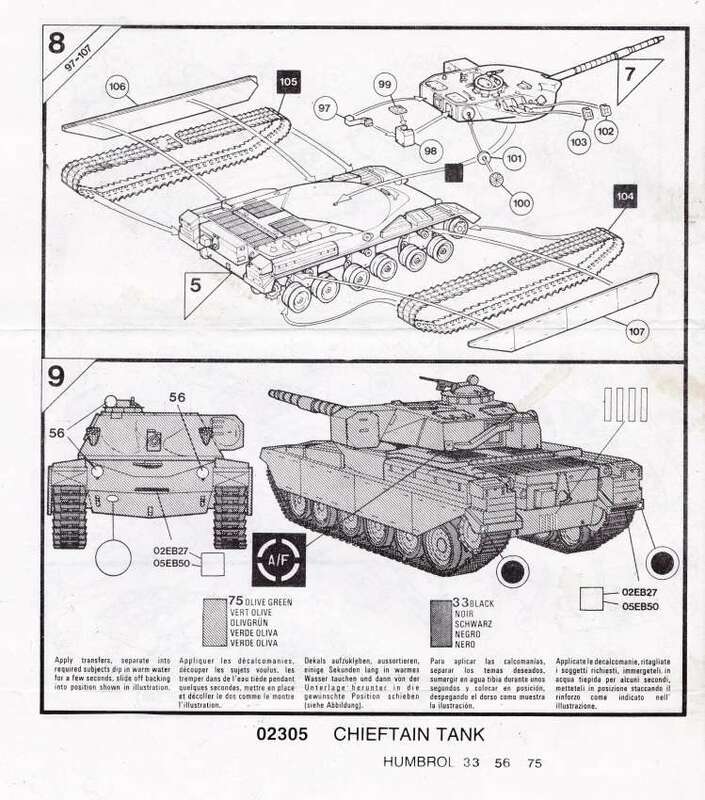 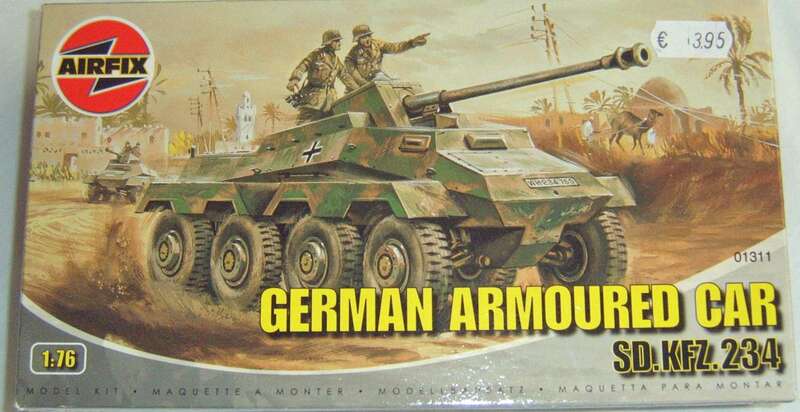 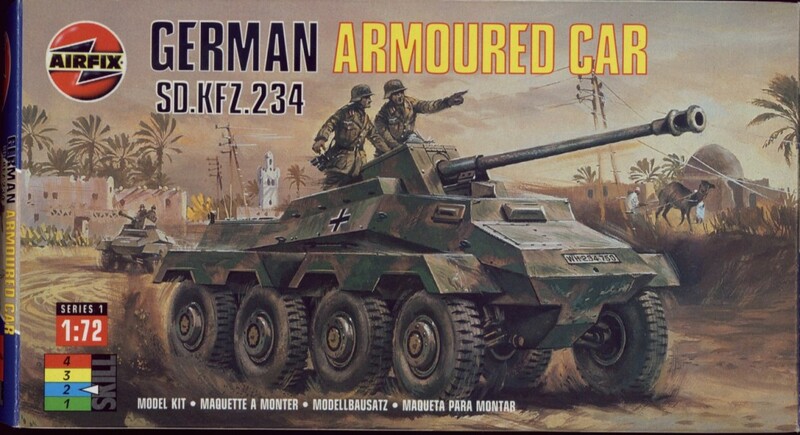 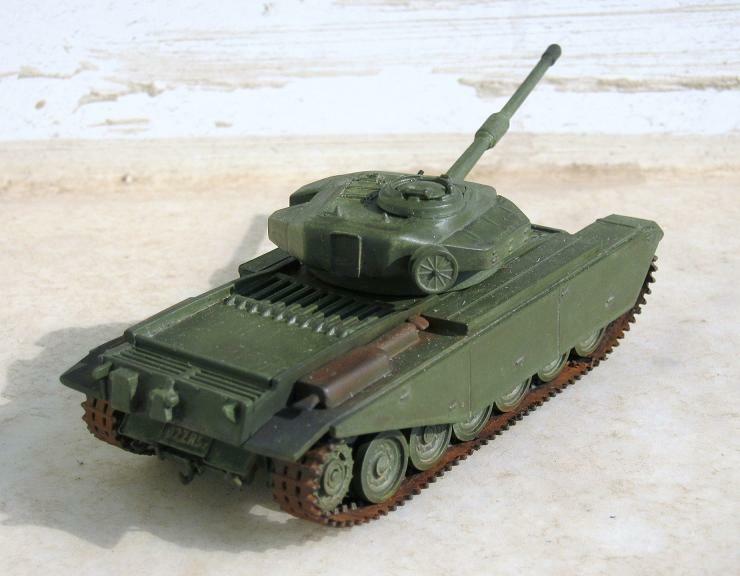 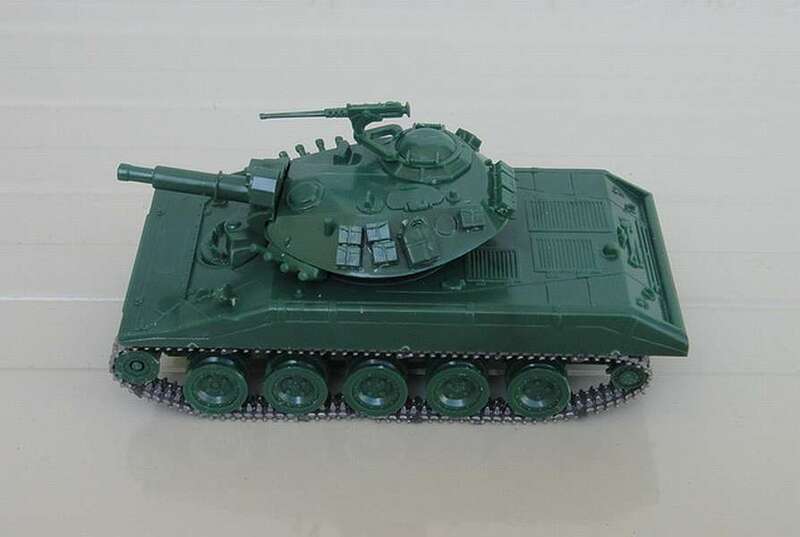 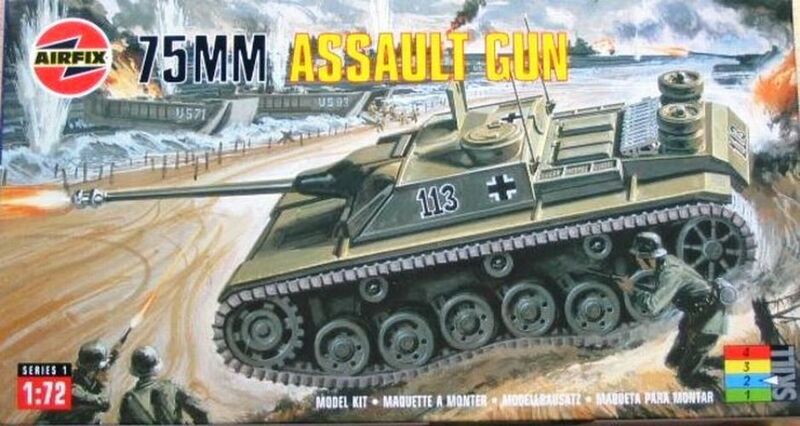 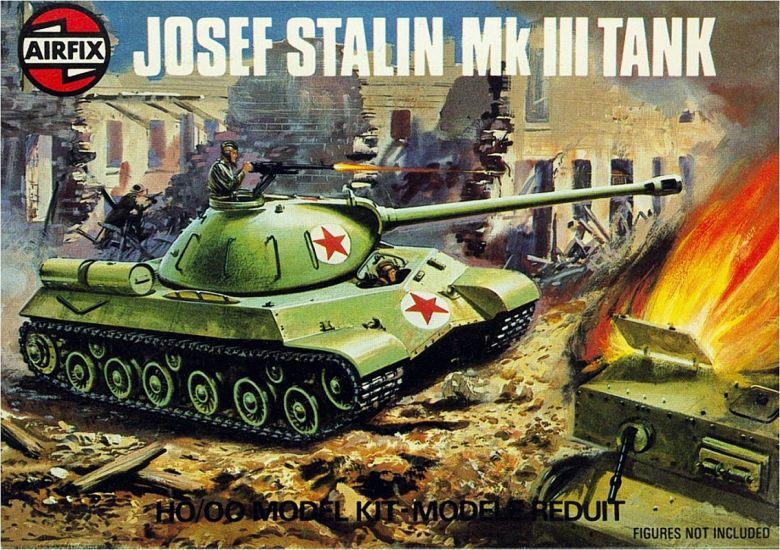 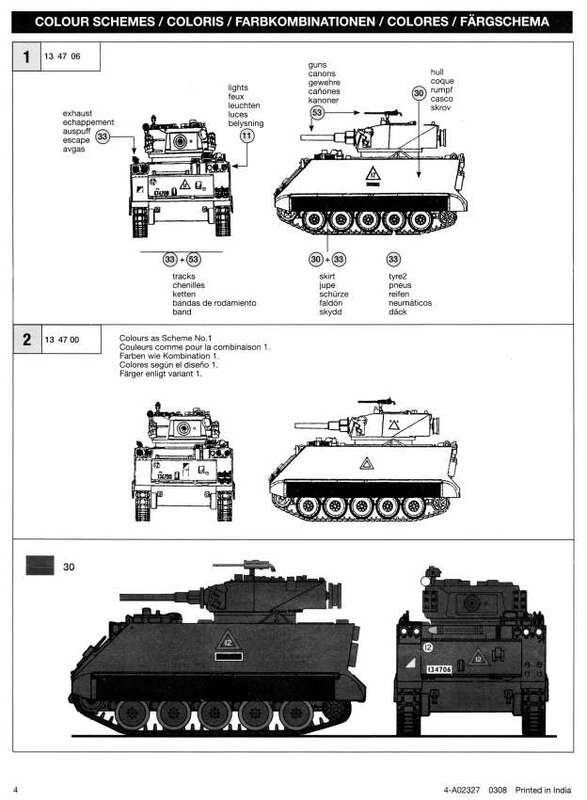 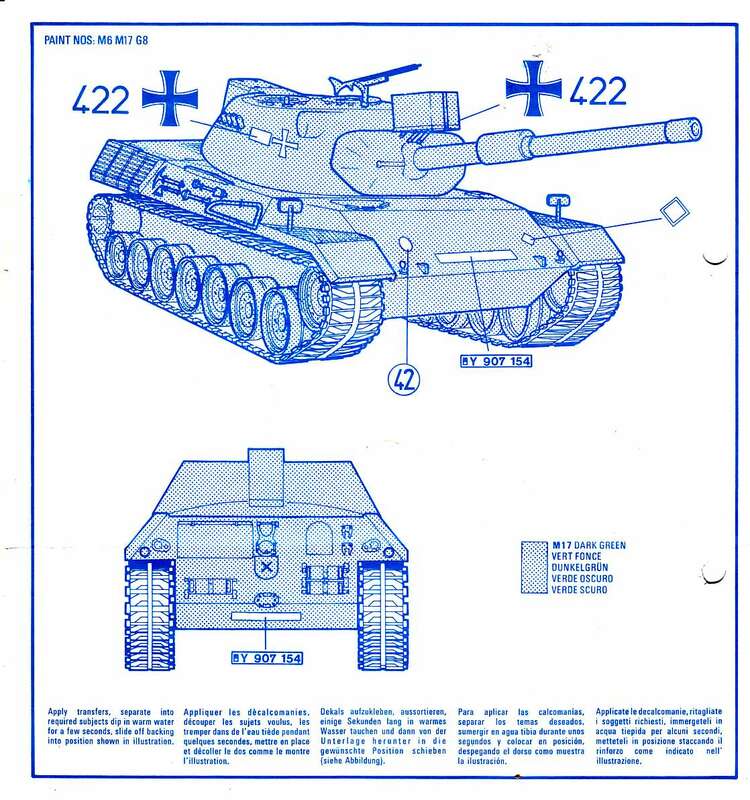 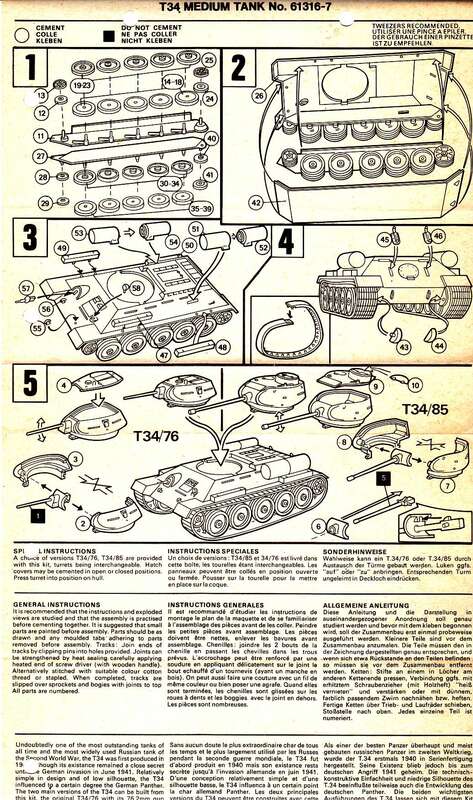 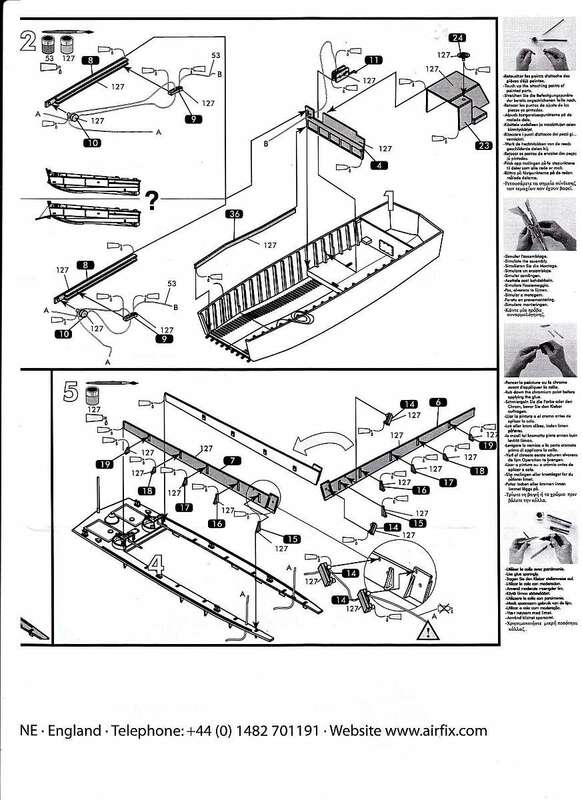 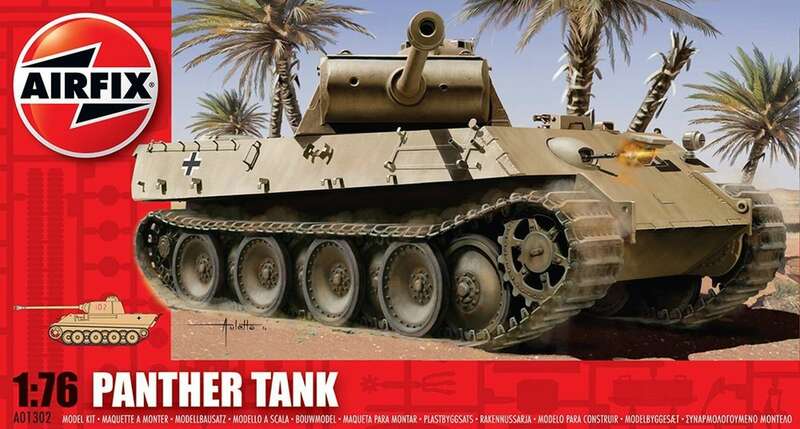 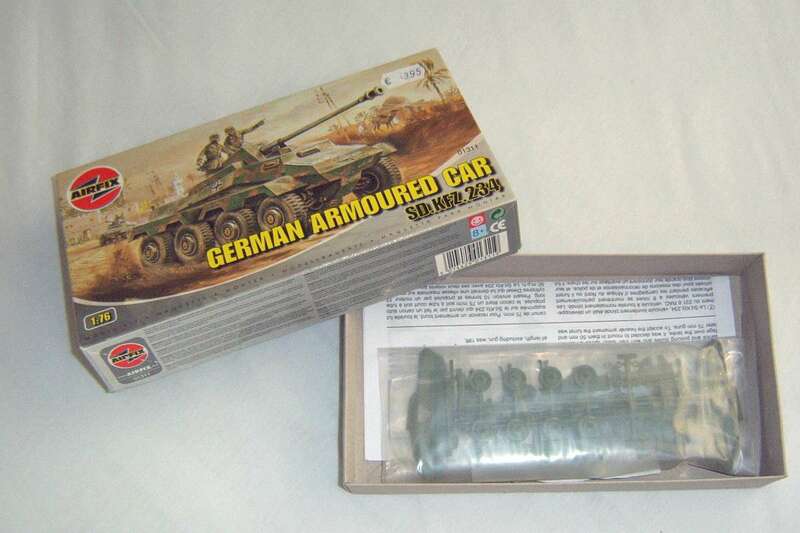 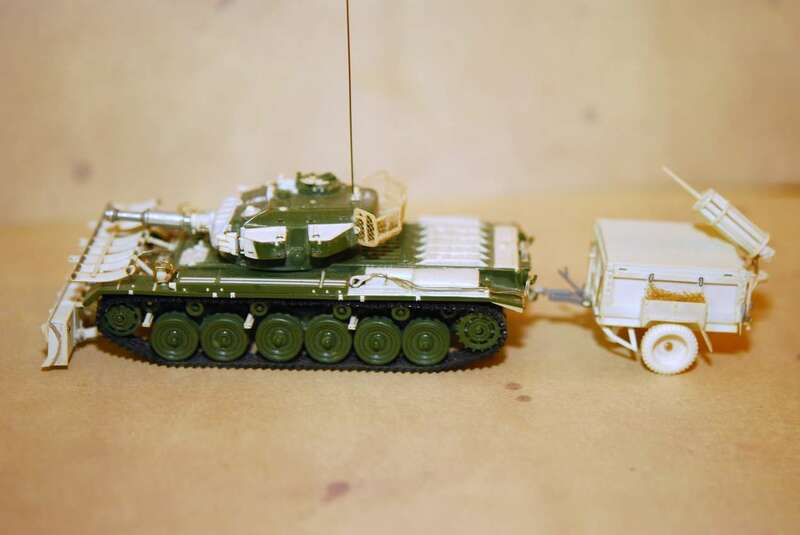 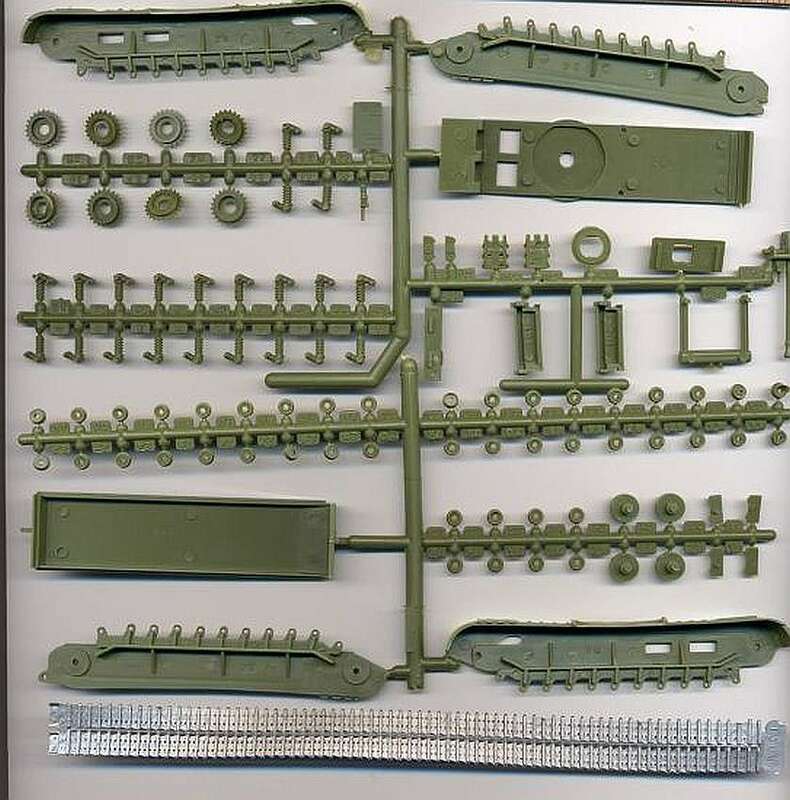 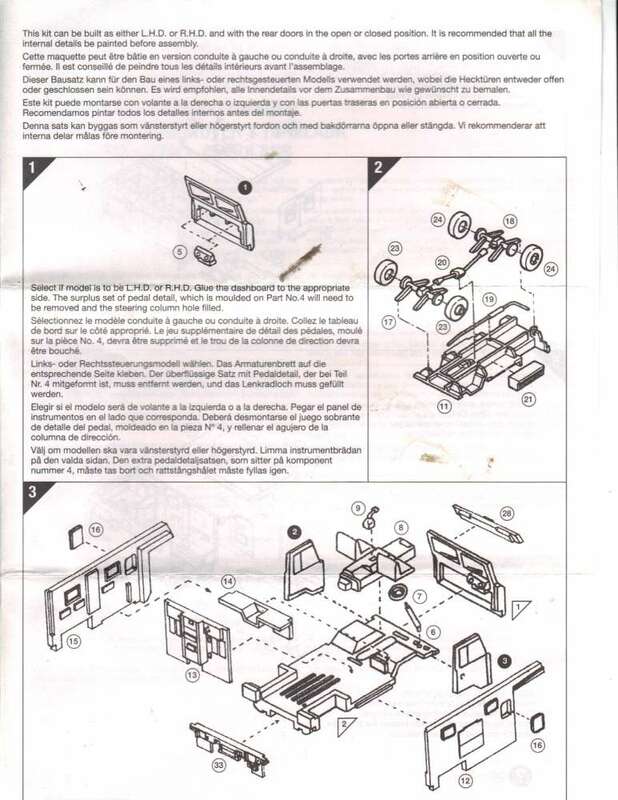 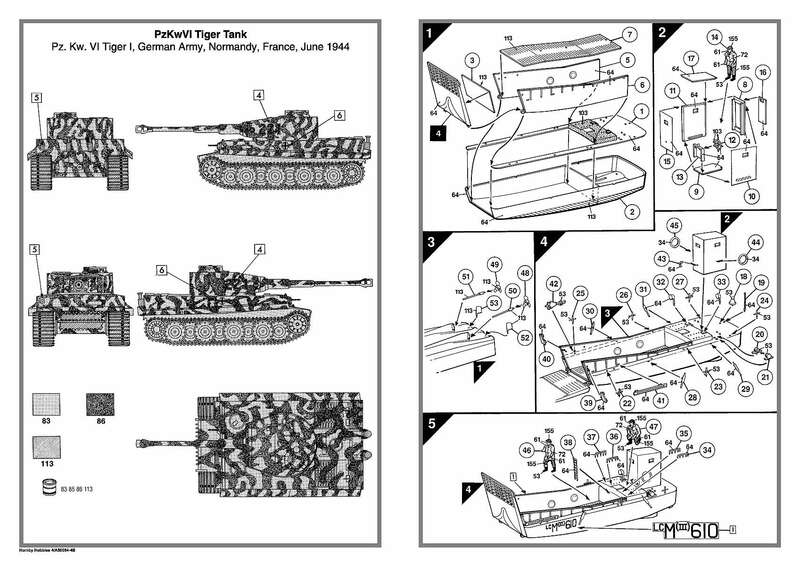 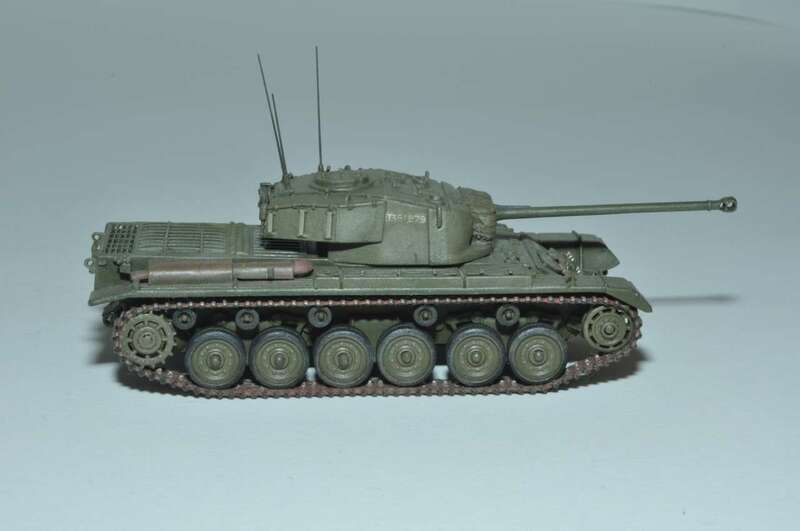 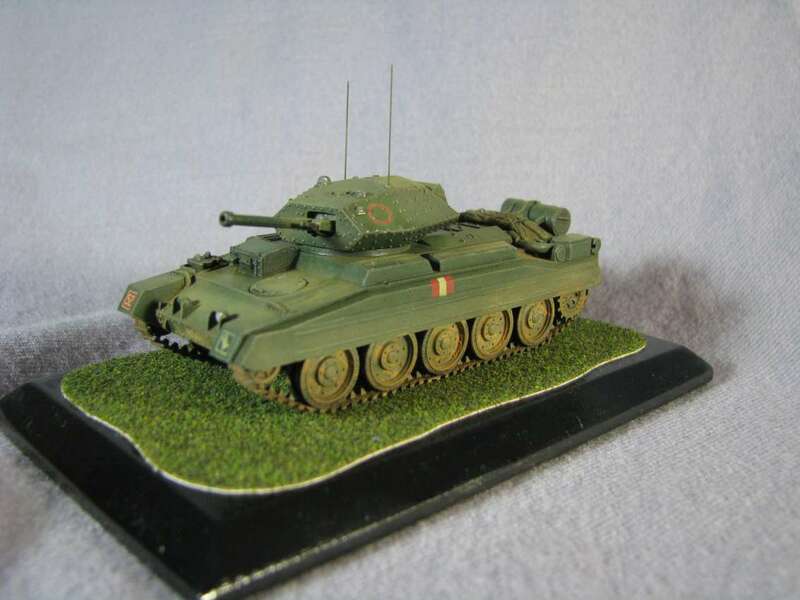 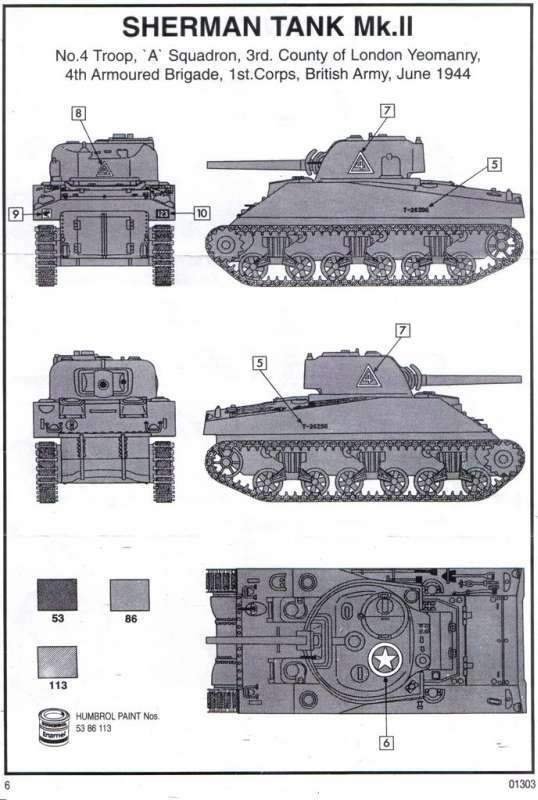 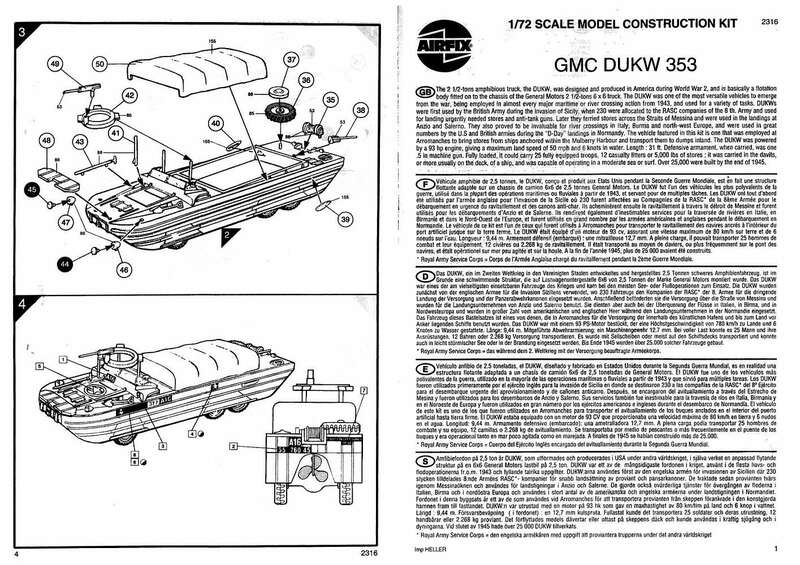 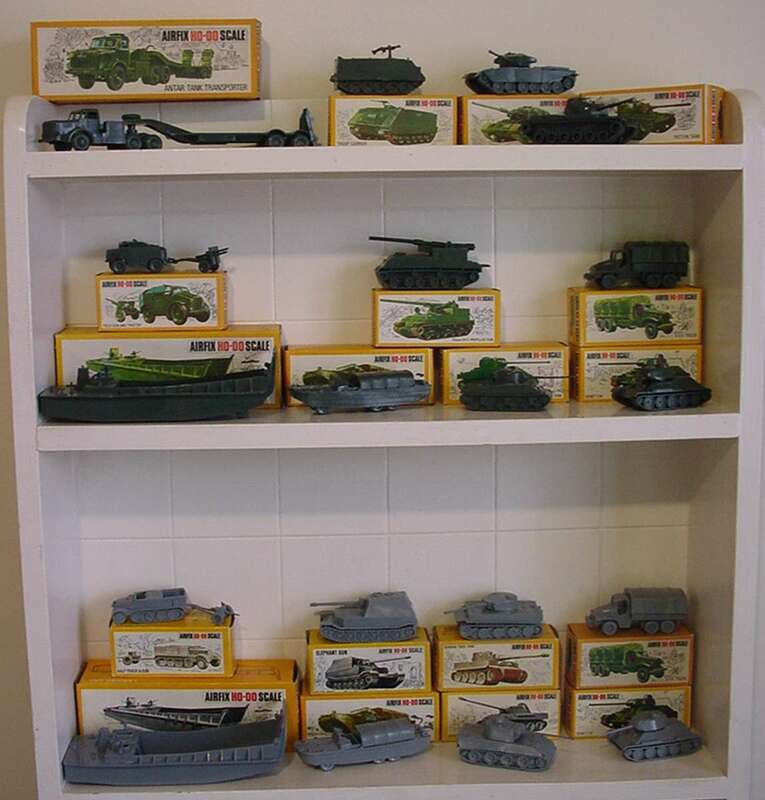 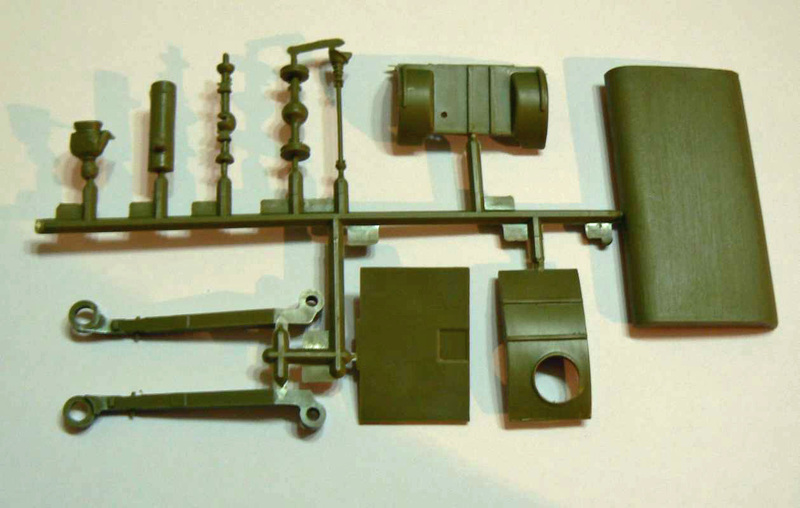 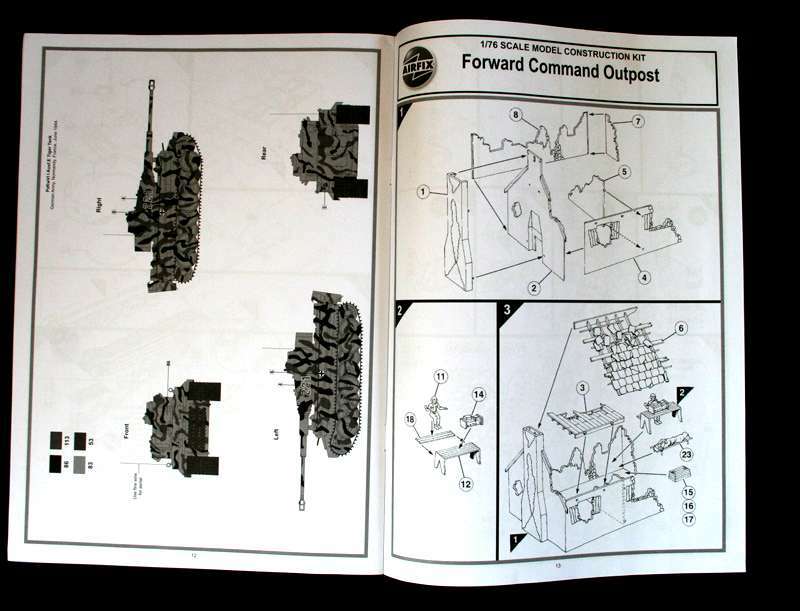 From REVELL no 1/76 armour kits were manufactured in Brasil, however, several of its 1/40 scale models from the 60s were, such as: M-48 bridge layer, T-34/85, 105 mm gun, Sherman tank, Self propeled gun, U.S. 6x6 truck etc. 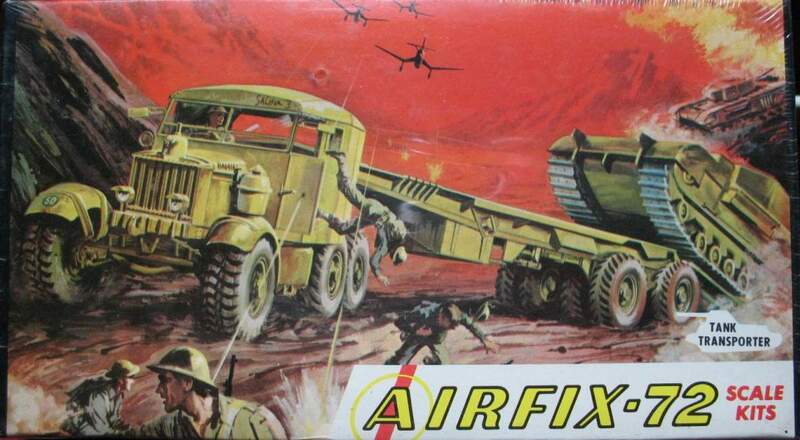 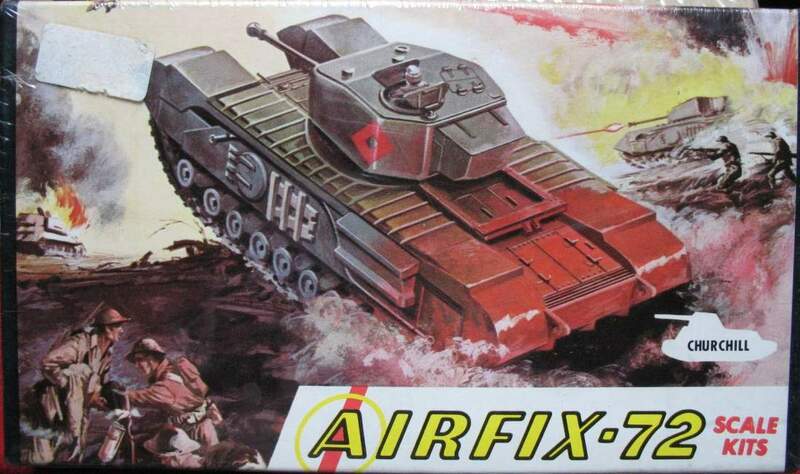 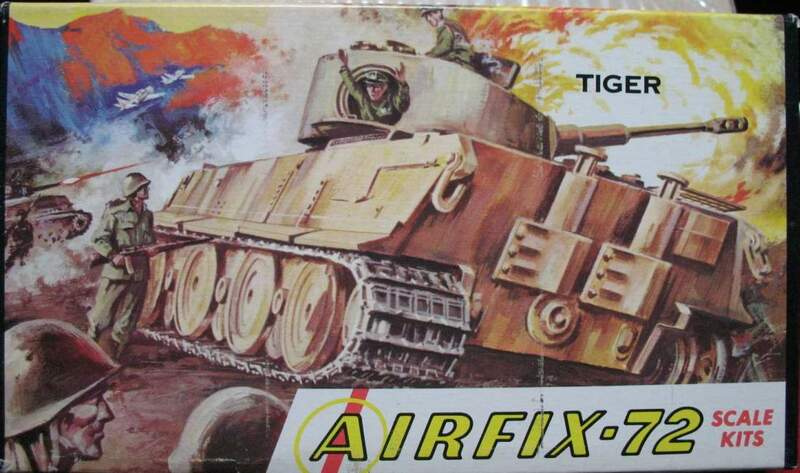 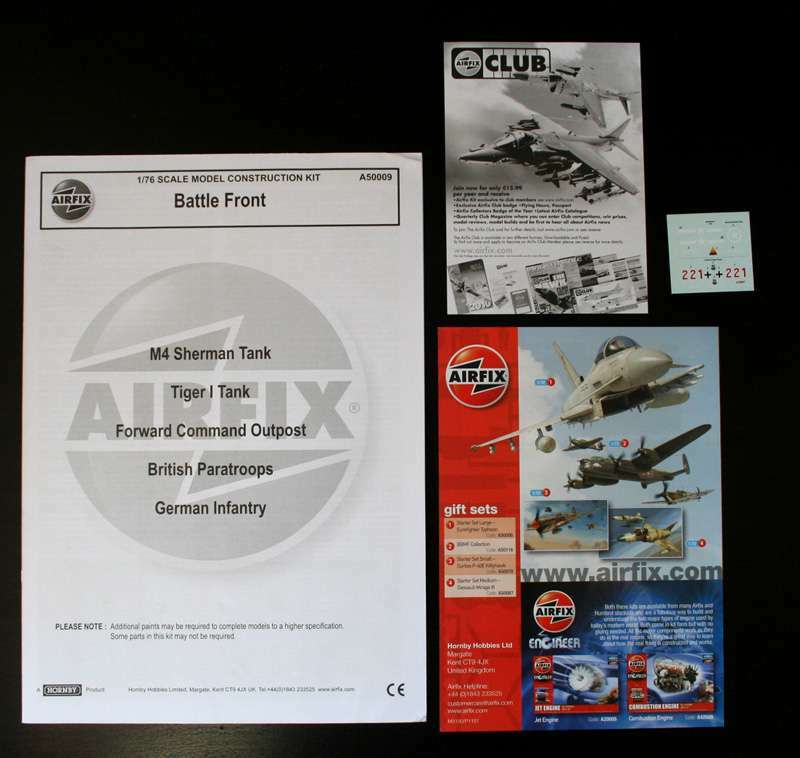 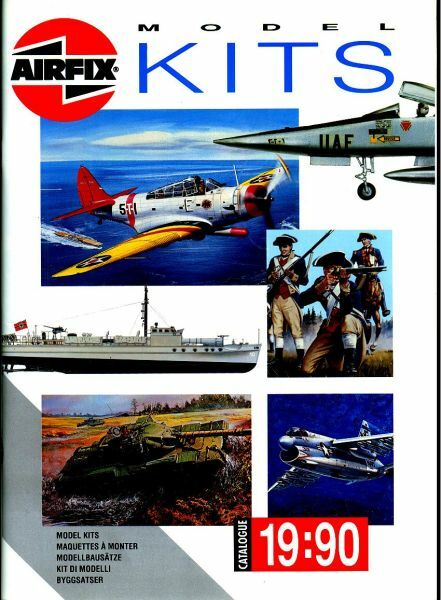 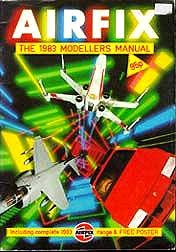 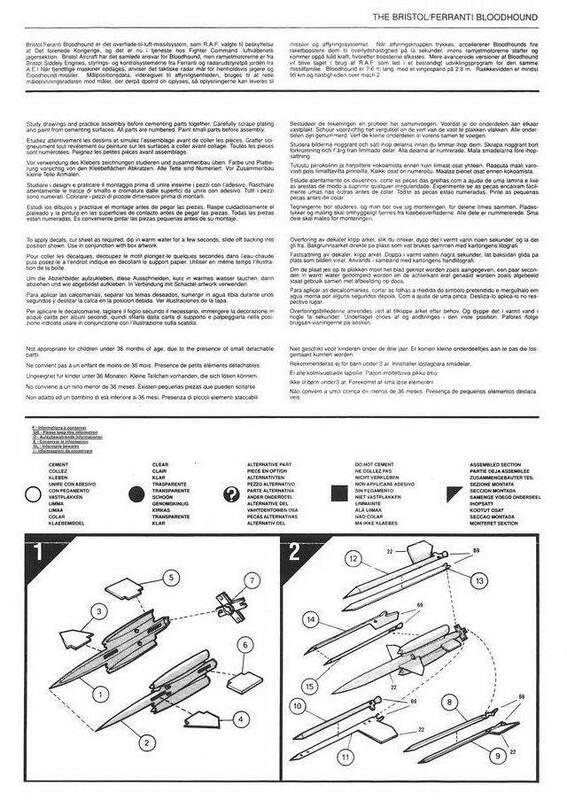 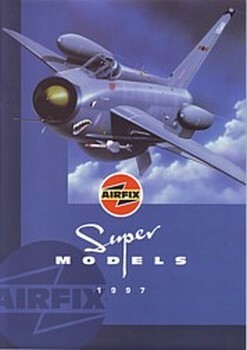 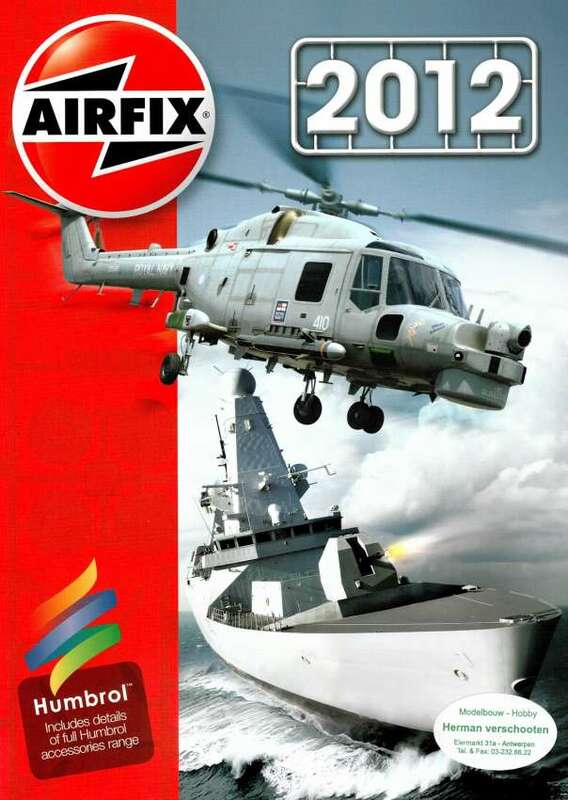 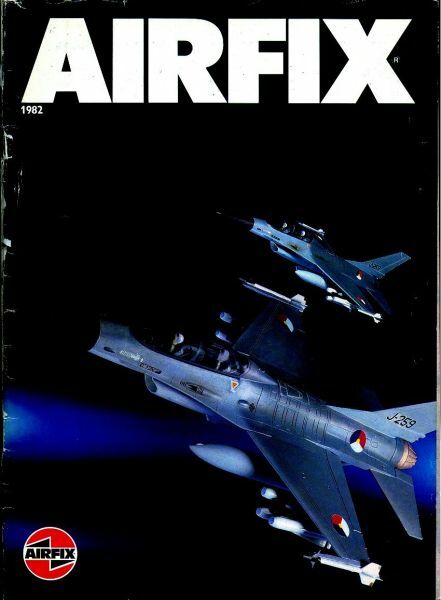 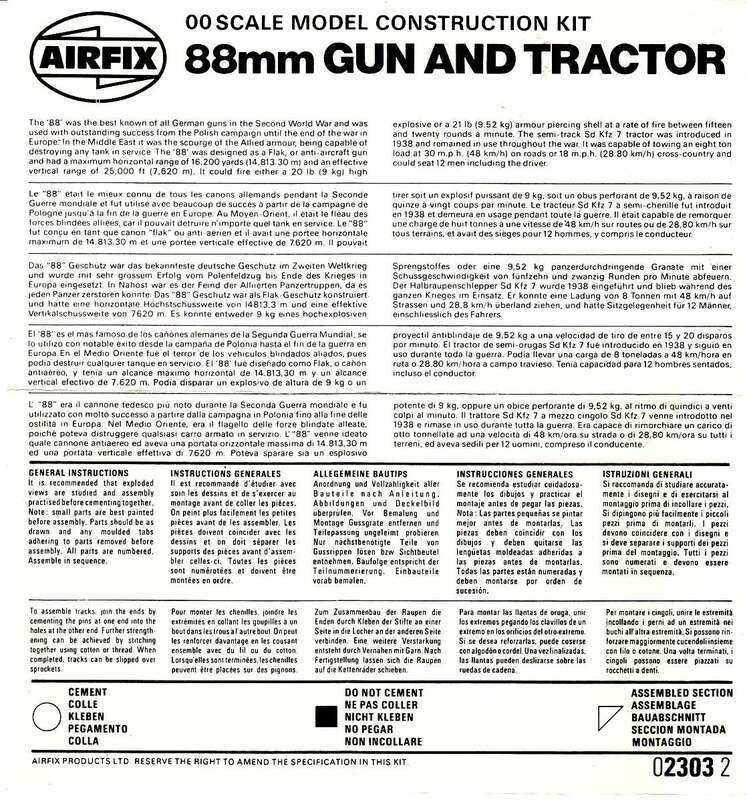 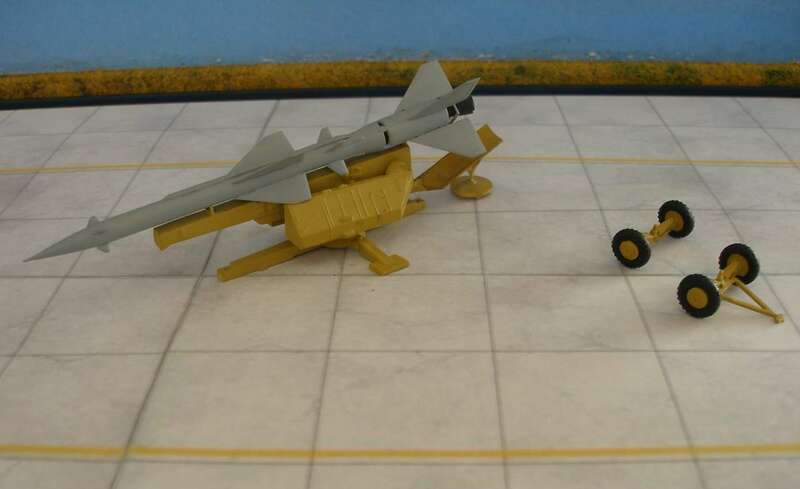 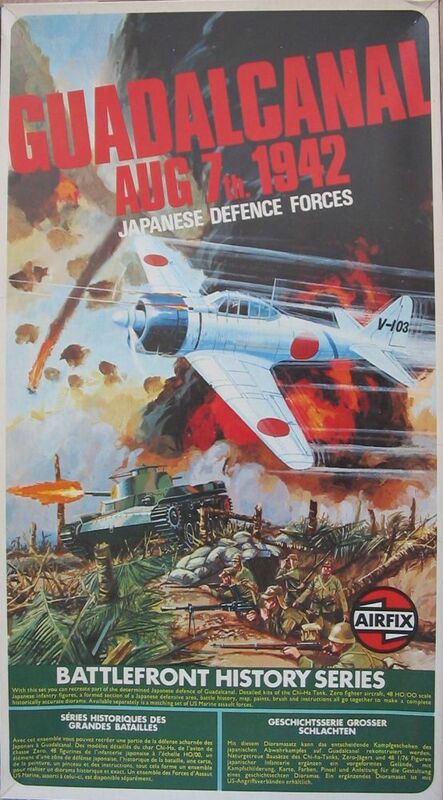 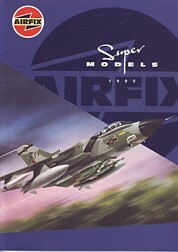 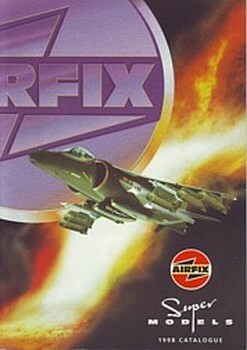 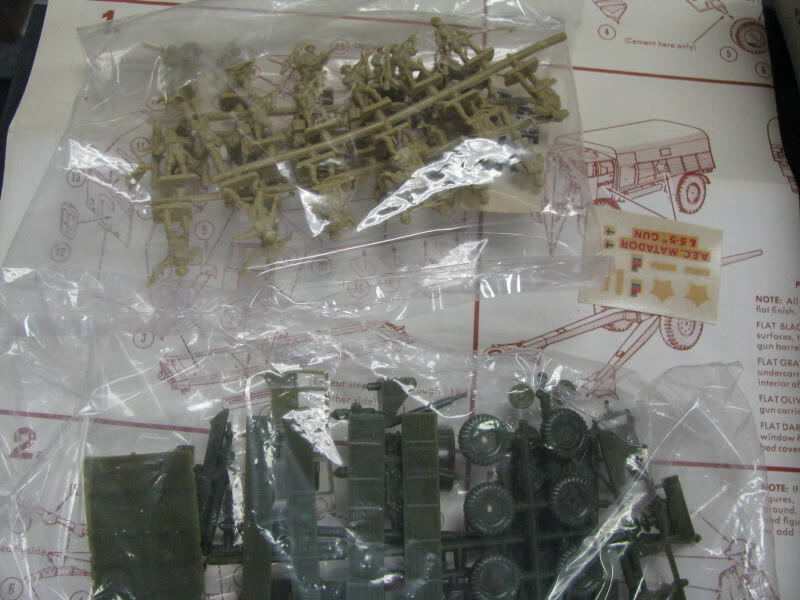 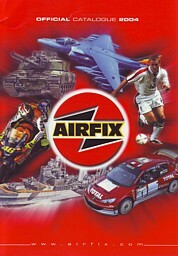 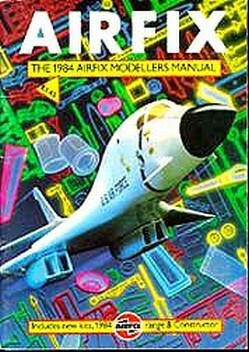 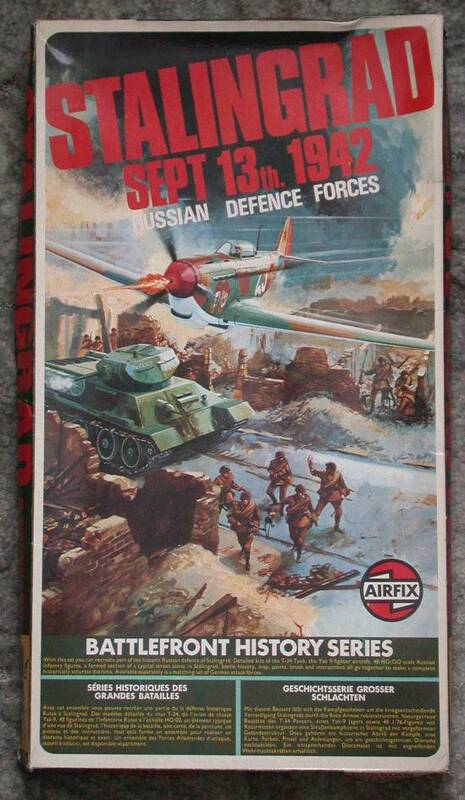 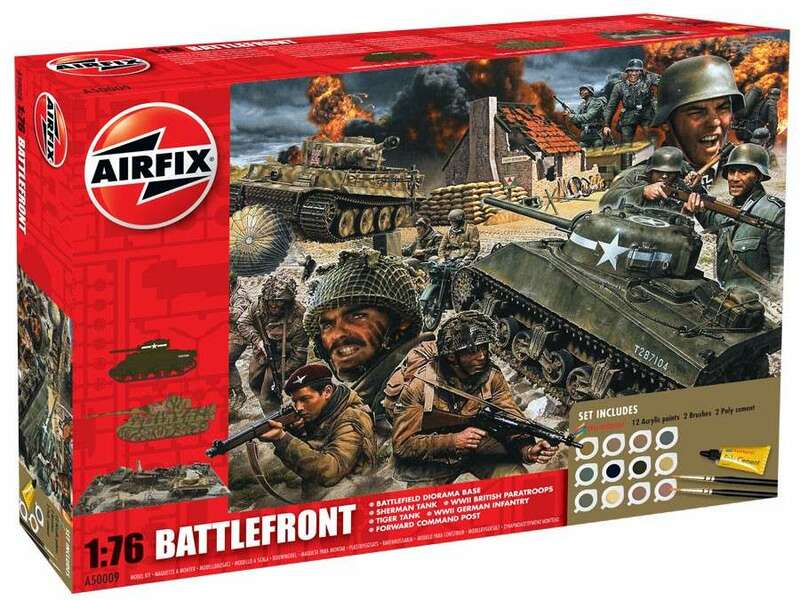 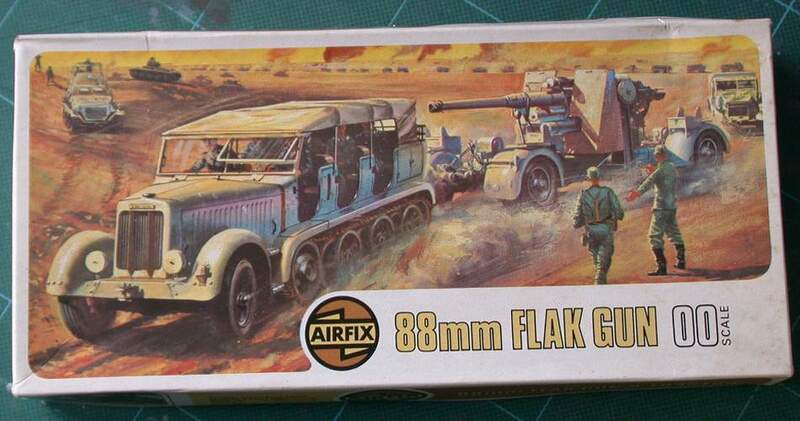 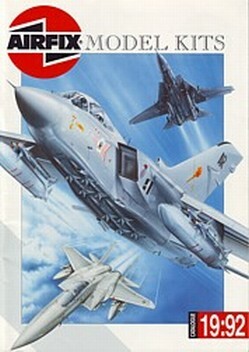 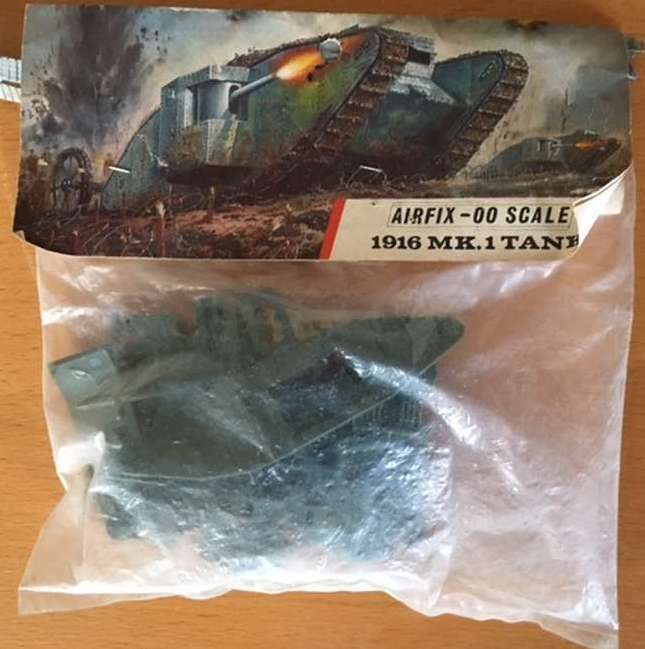 Airfix - released in Taiwan - unknown company. 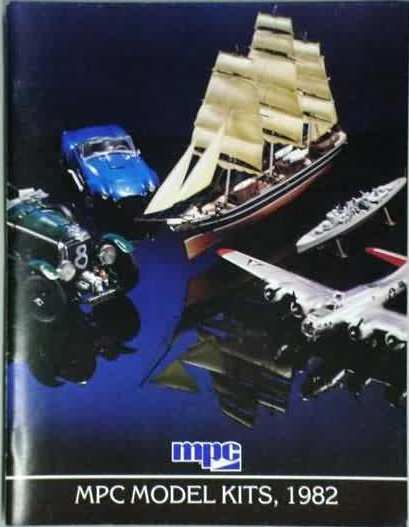 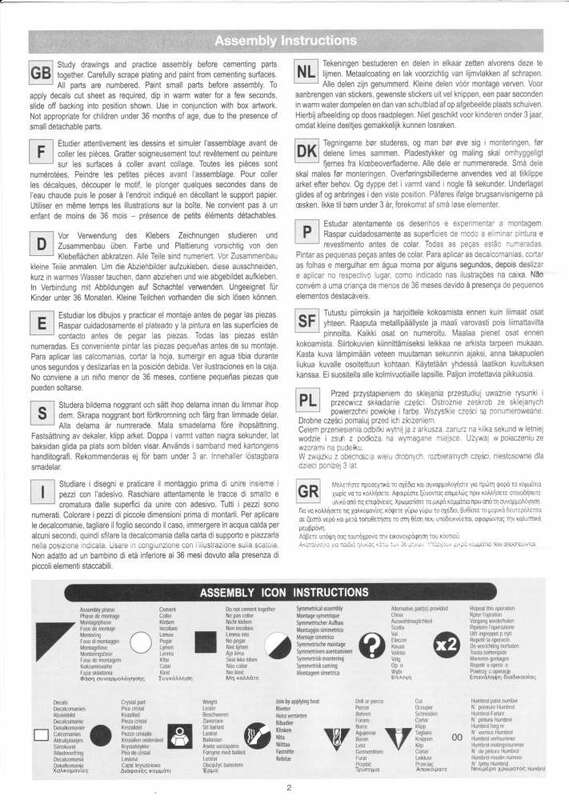 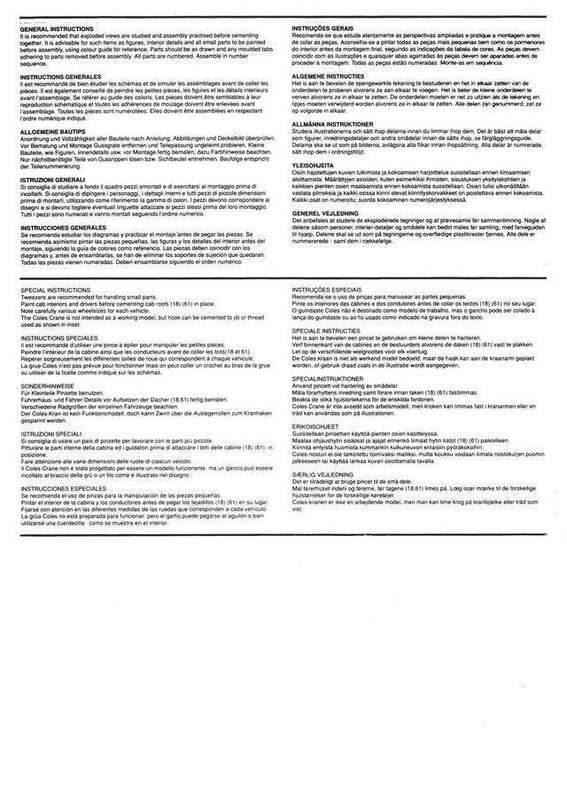 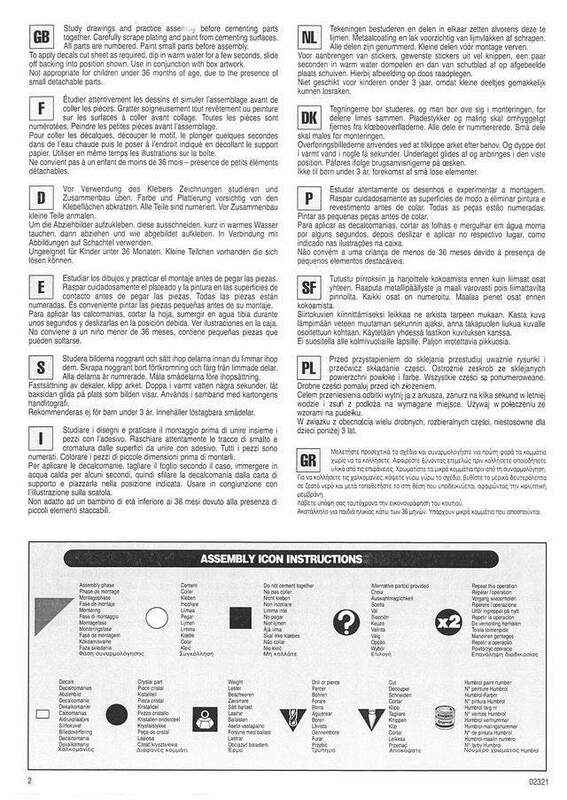 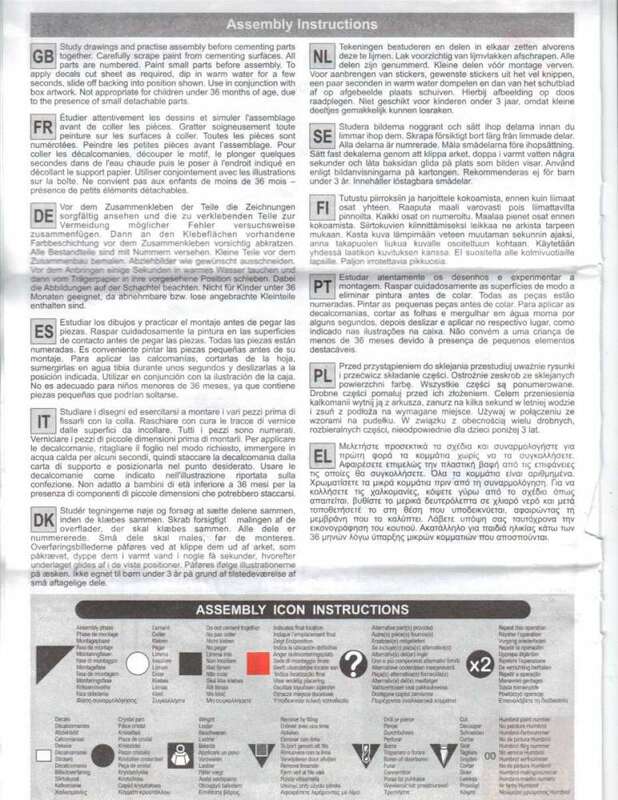 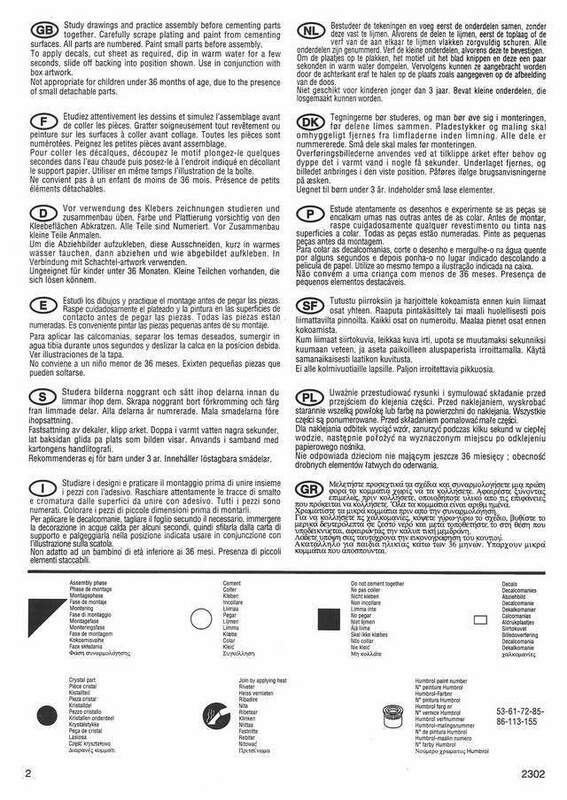 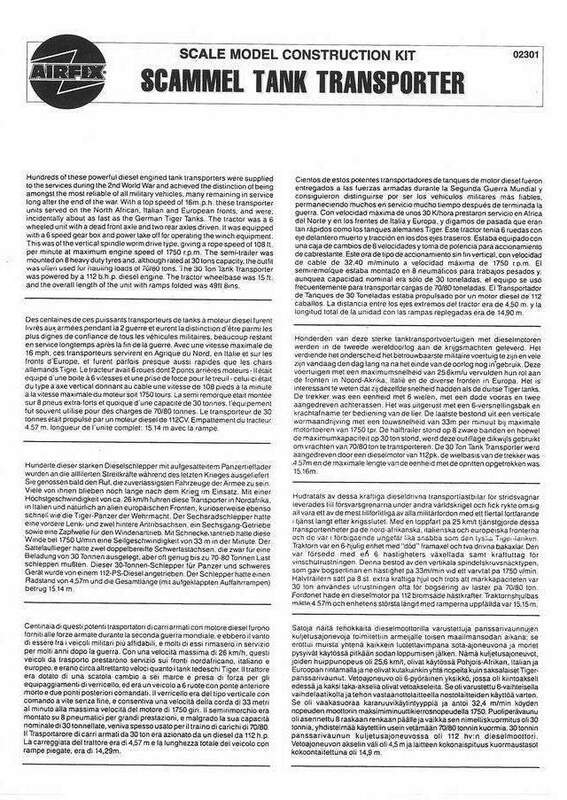 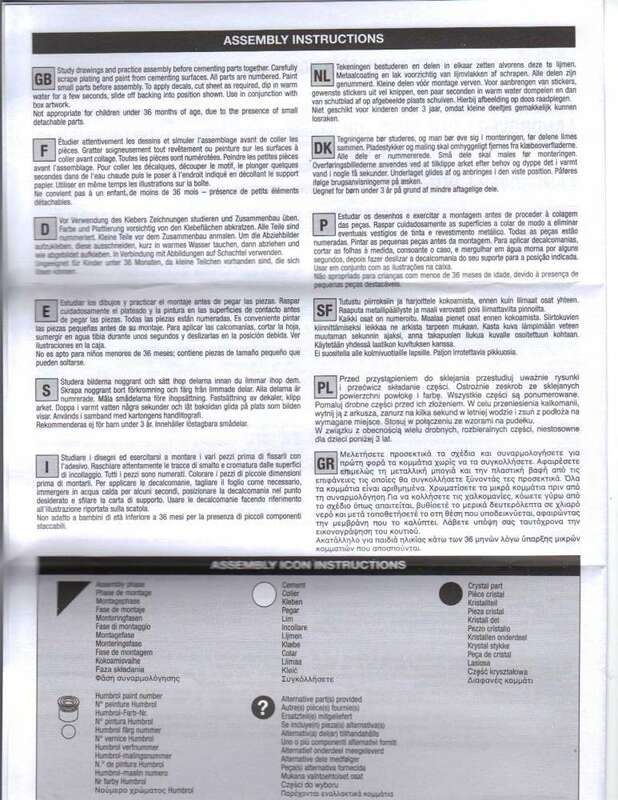 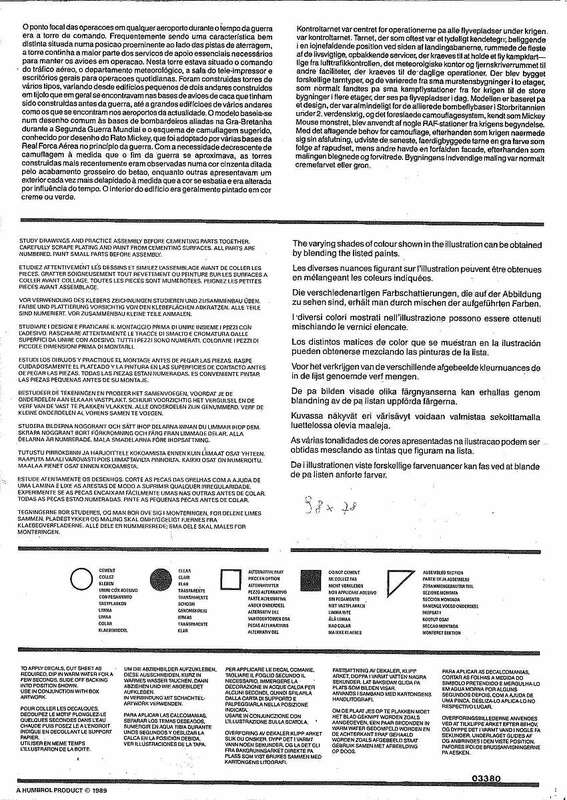 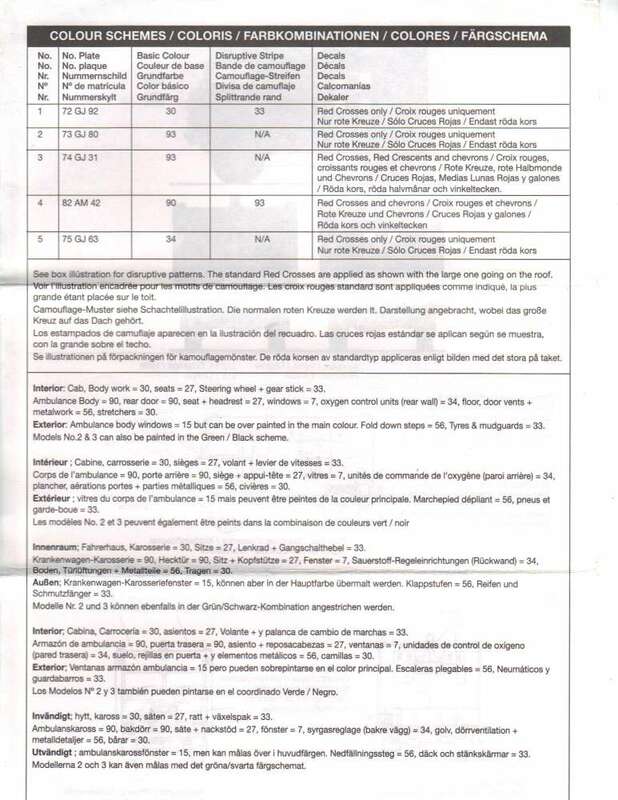 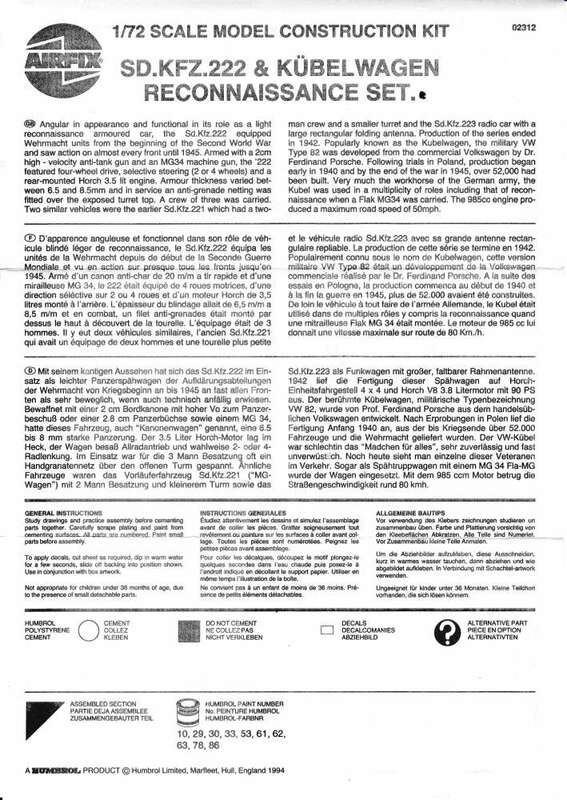 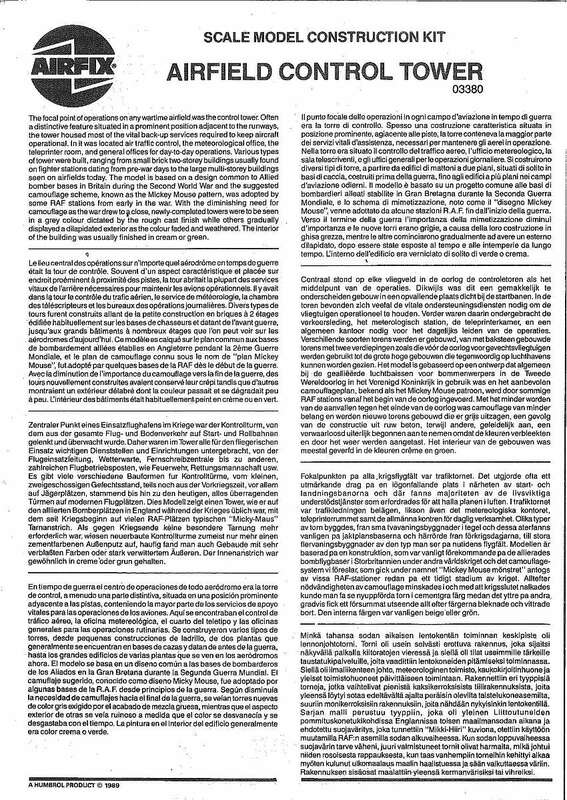 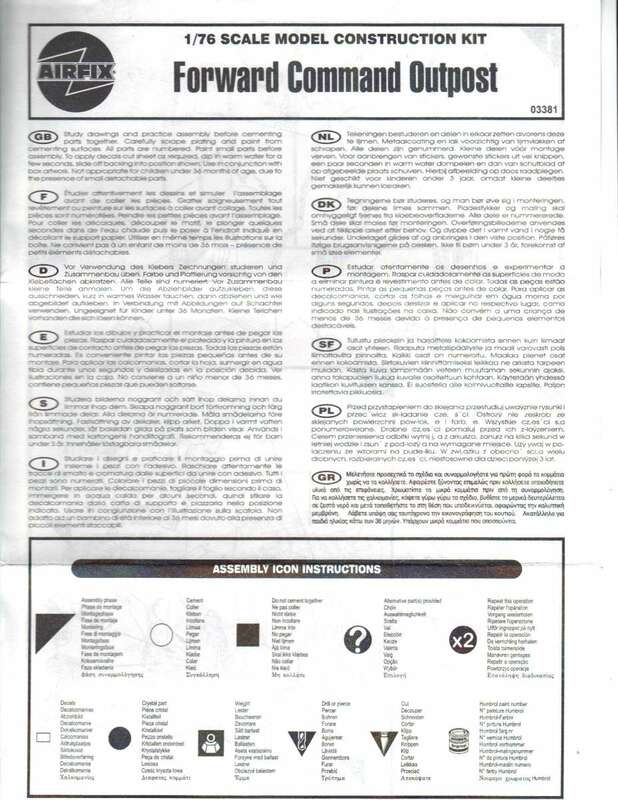 Sam Publications. 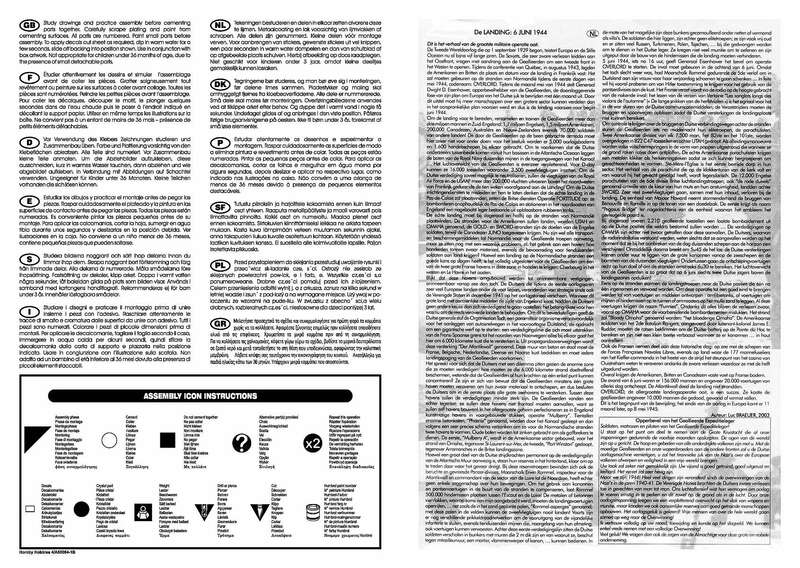 Sam Publications Sam Publications. 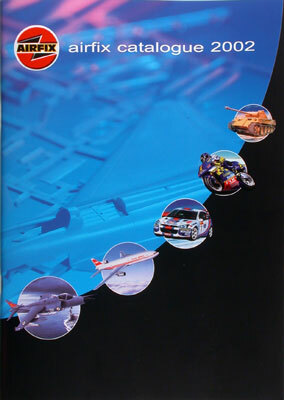 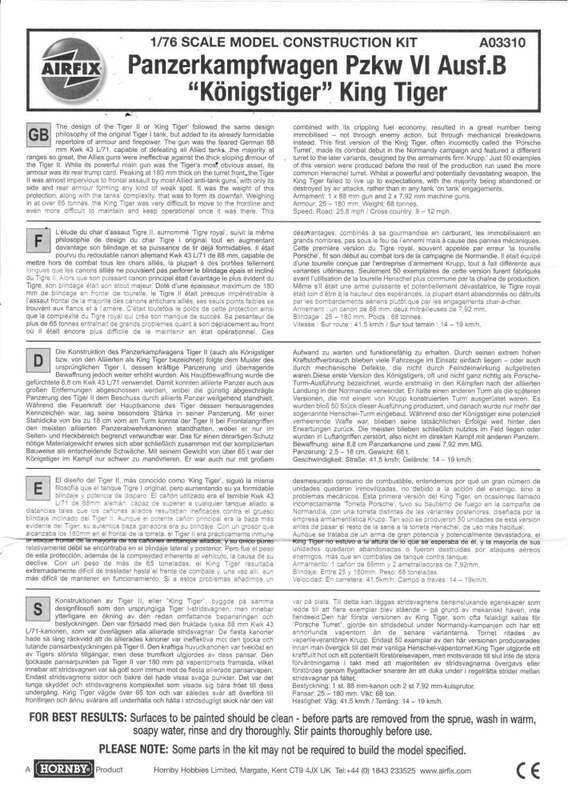 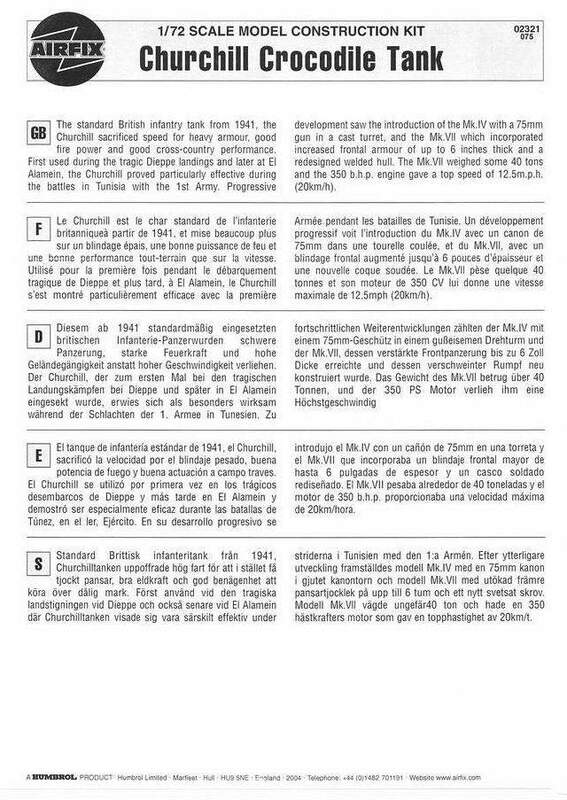 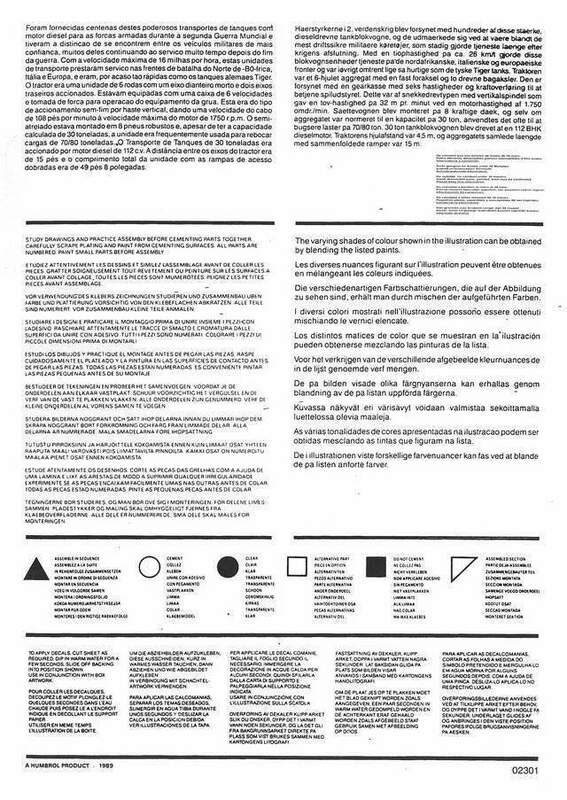 Sam Publications. 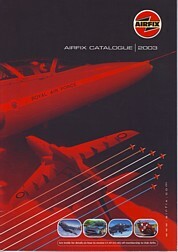 Three more editions will follow soon!